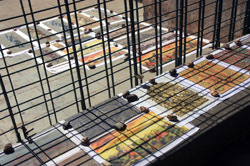 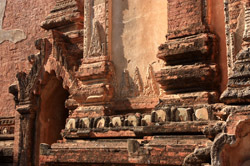 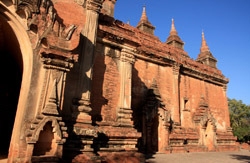 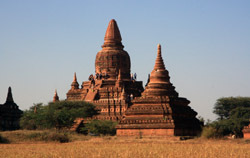 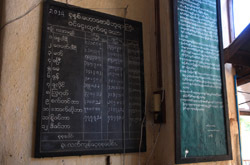 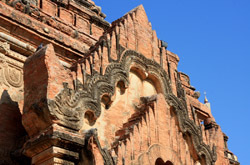 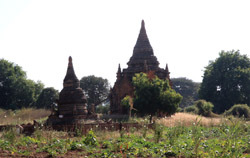 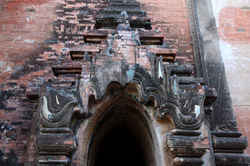 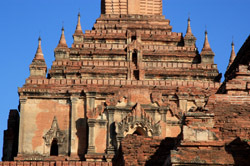 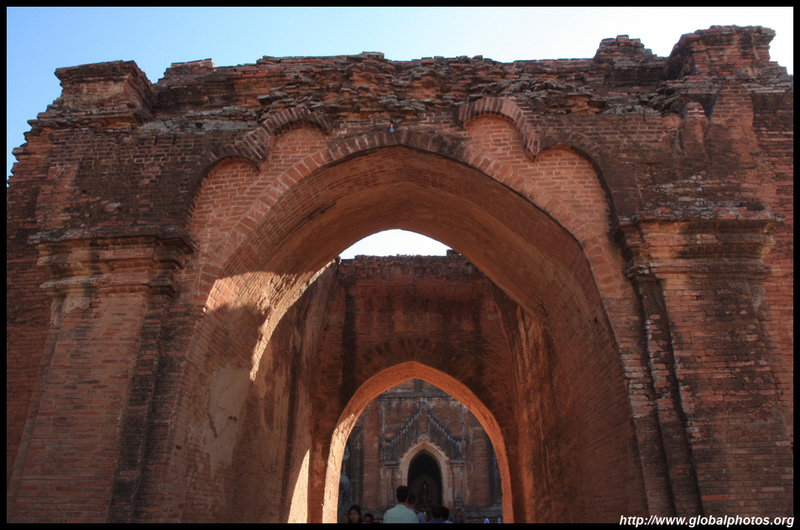 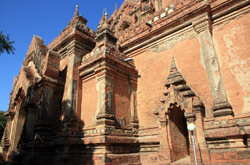 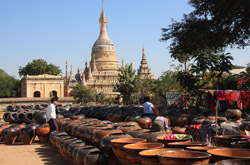 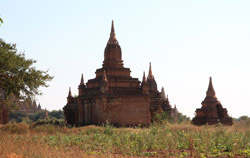 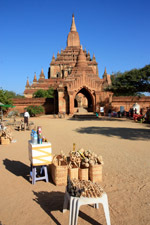 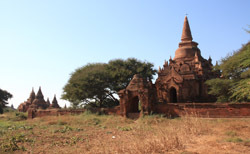 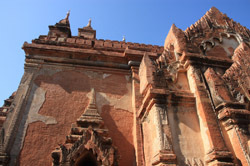 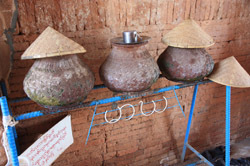 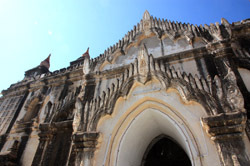 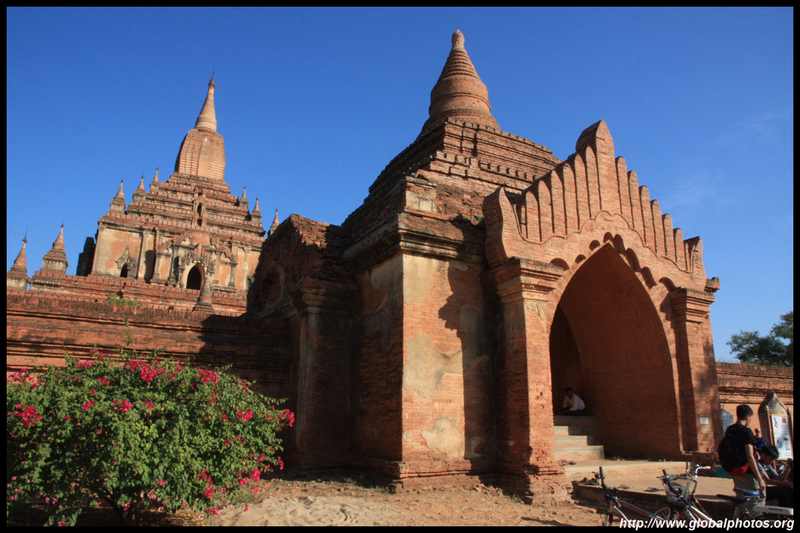 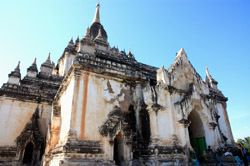 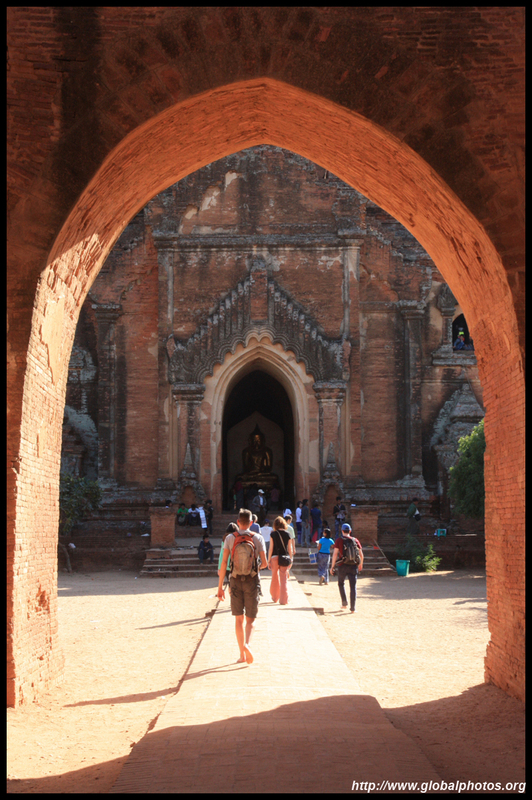 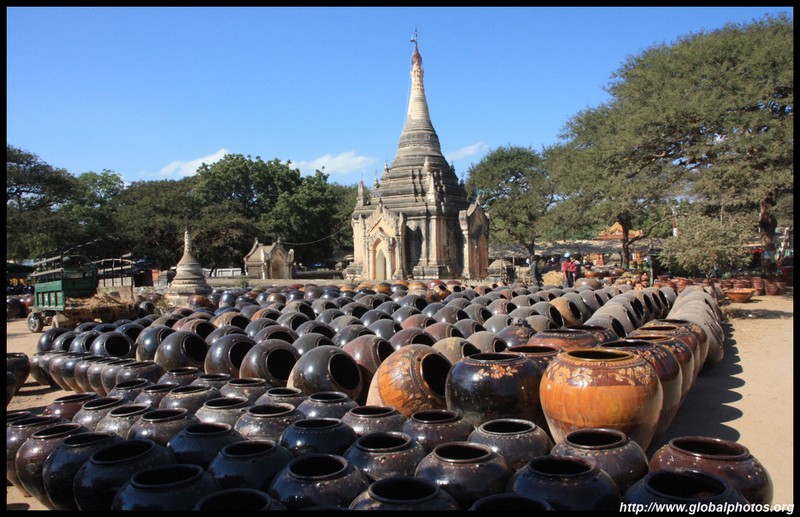 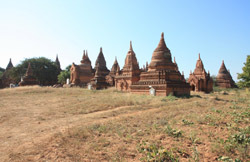 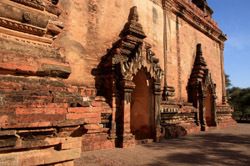 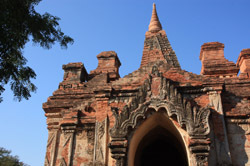 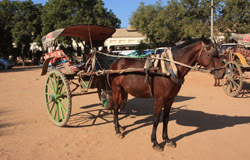 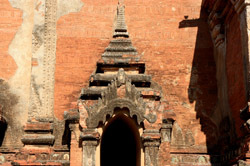 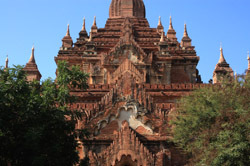 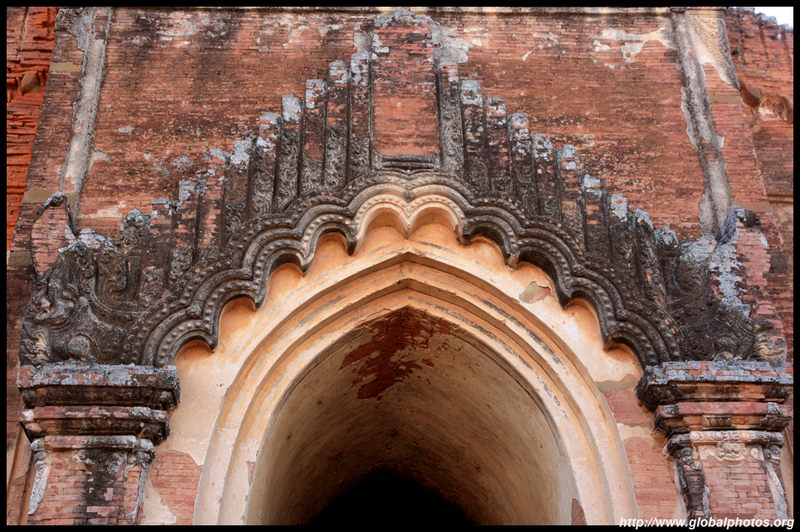 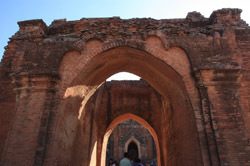 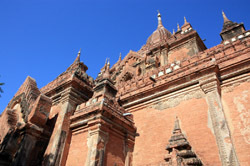 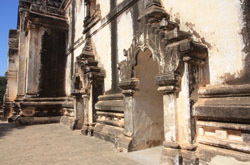 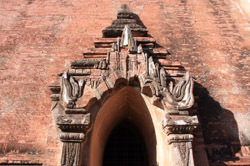 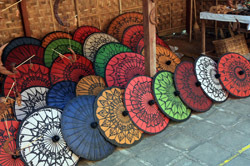 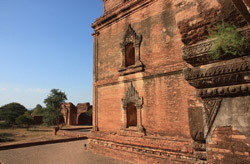 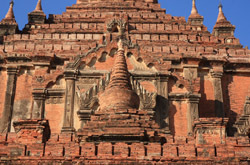 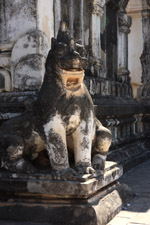 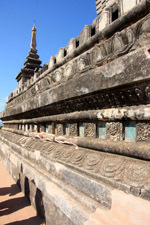 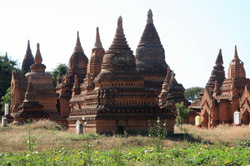 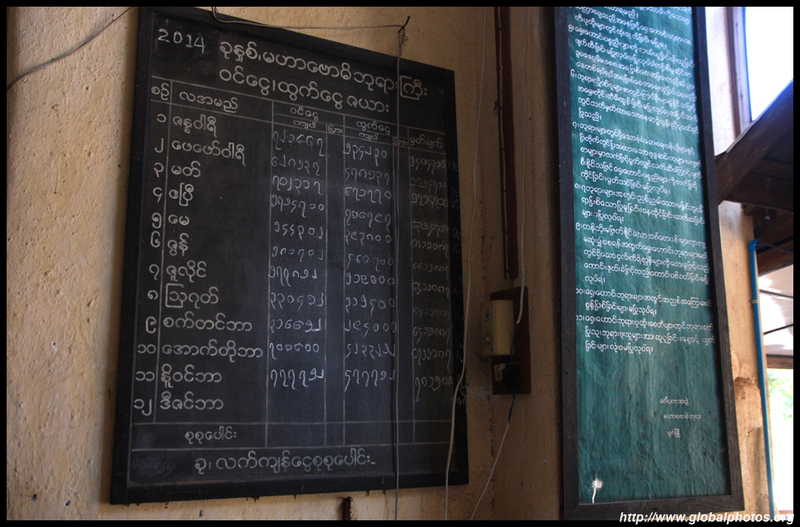 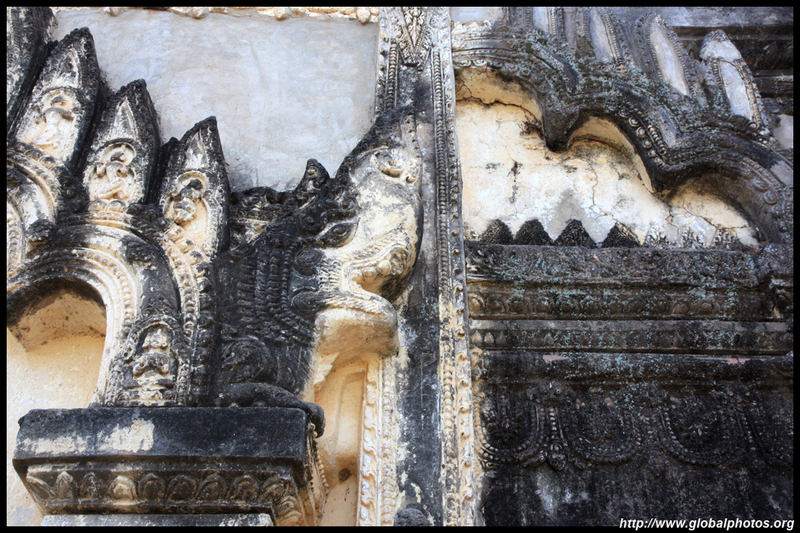 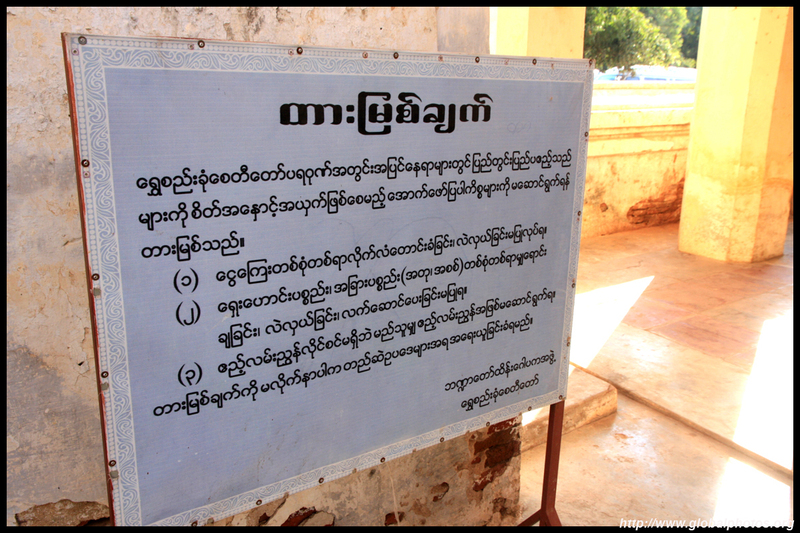 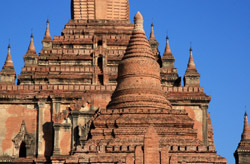 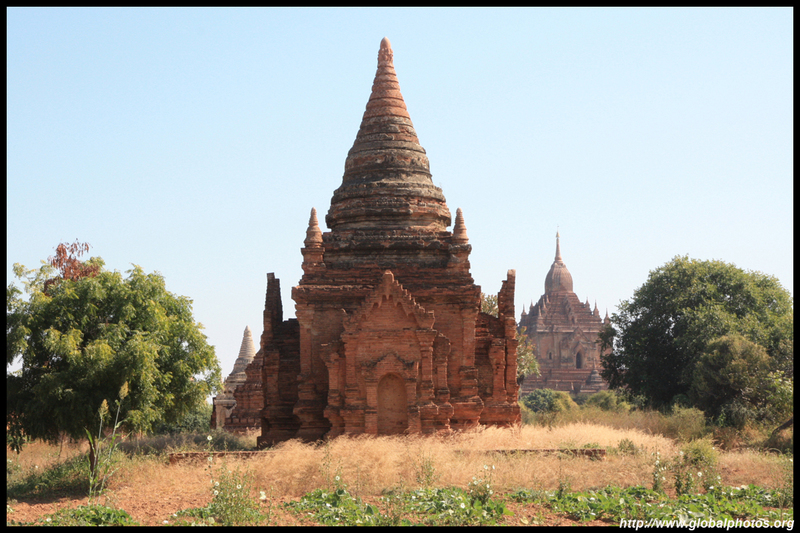 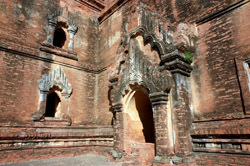 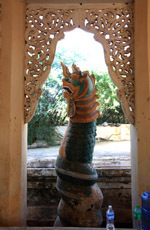 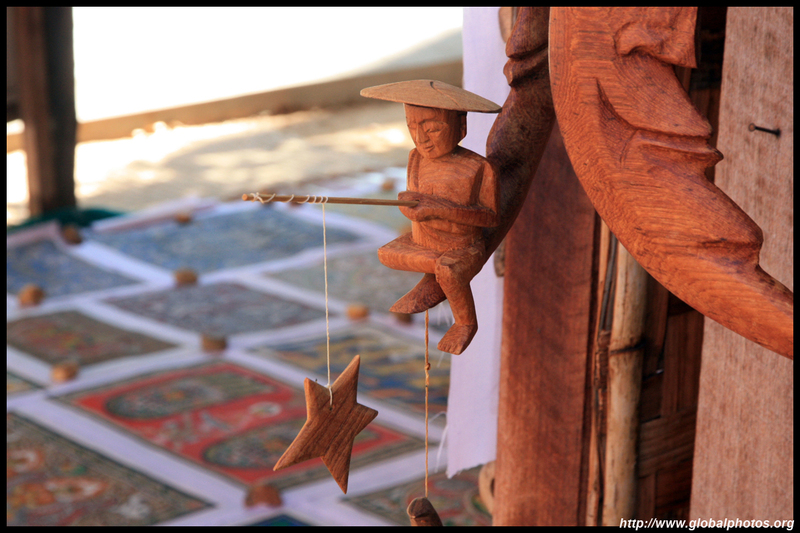 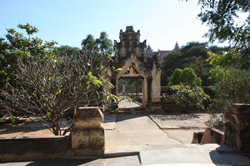 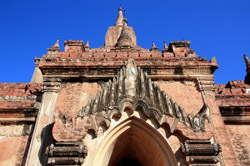 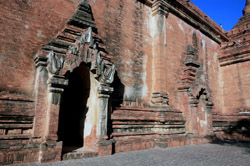 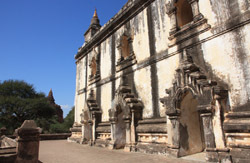 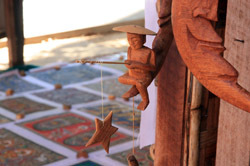 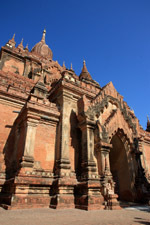 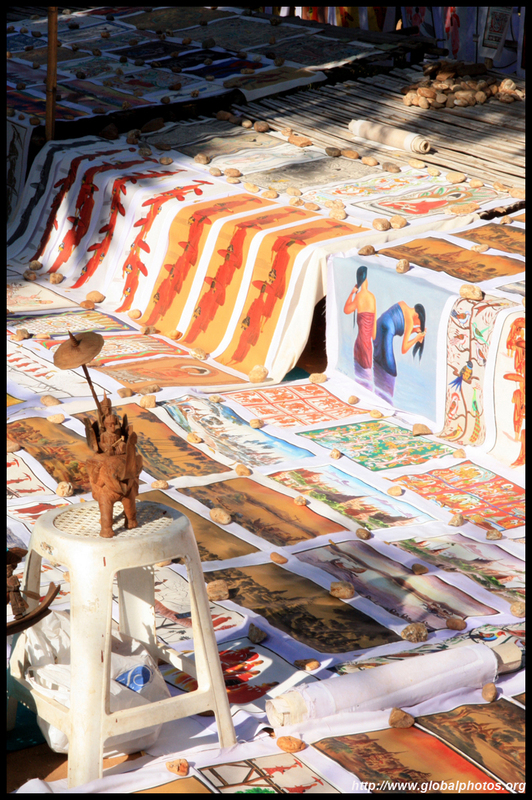 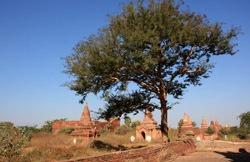 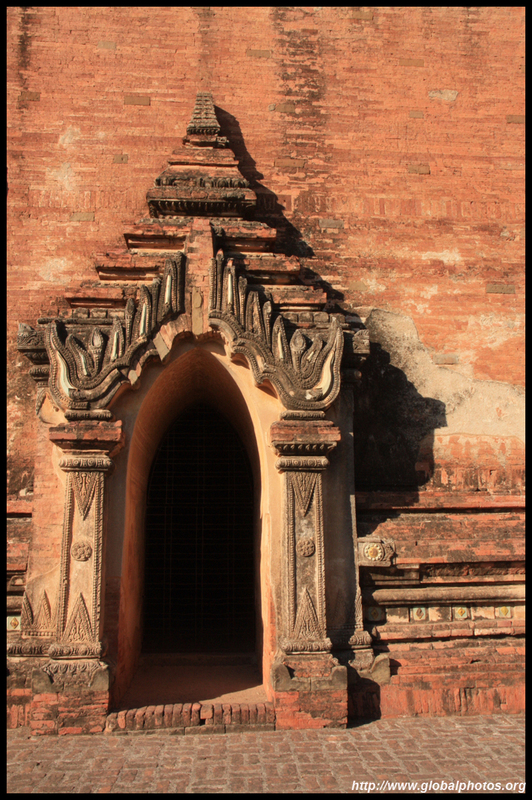 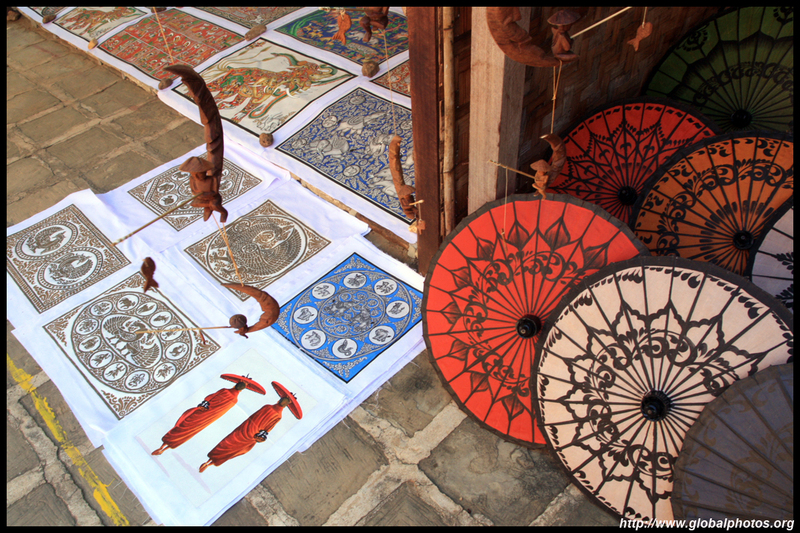 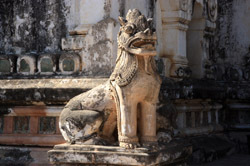 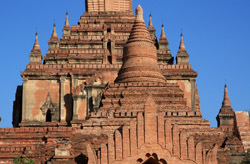 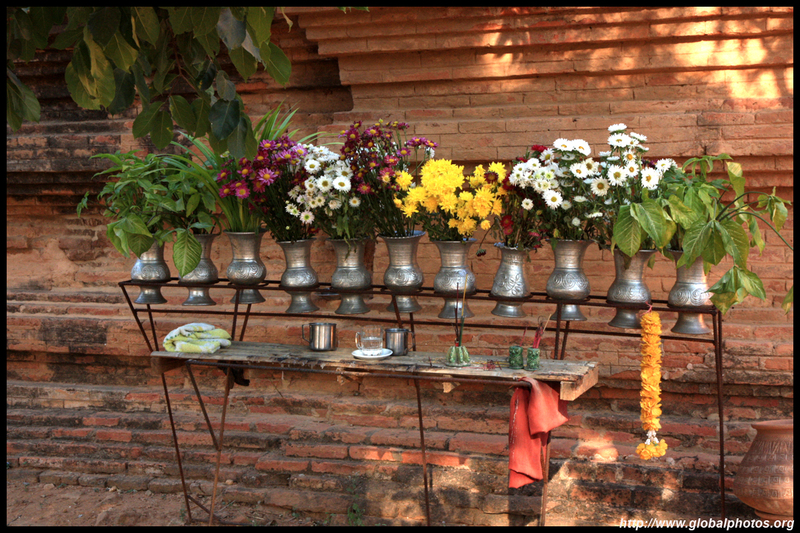 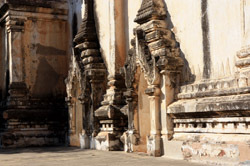 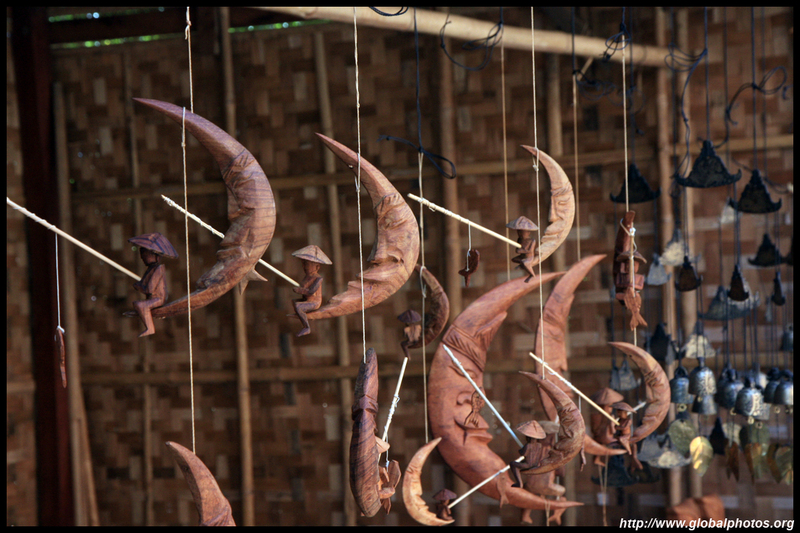 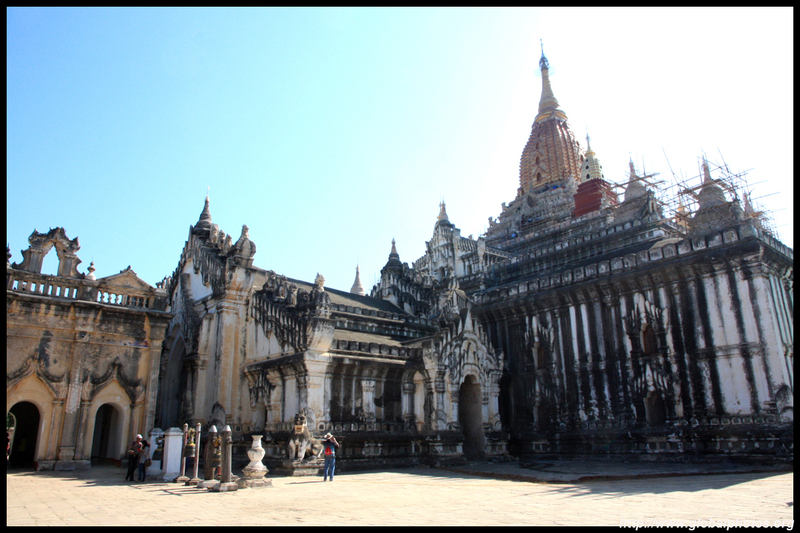 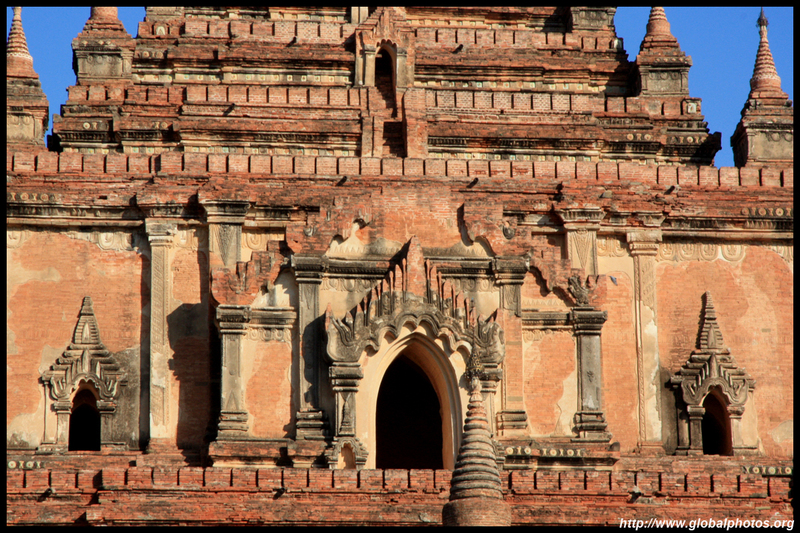 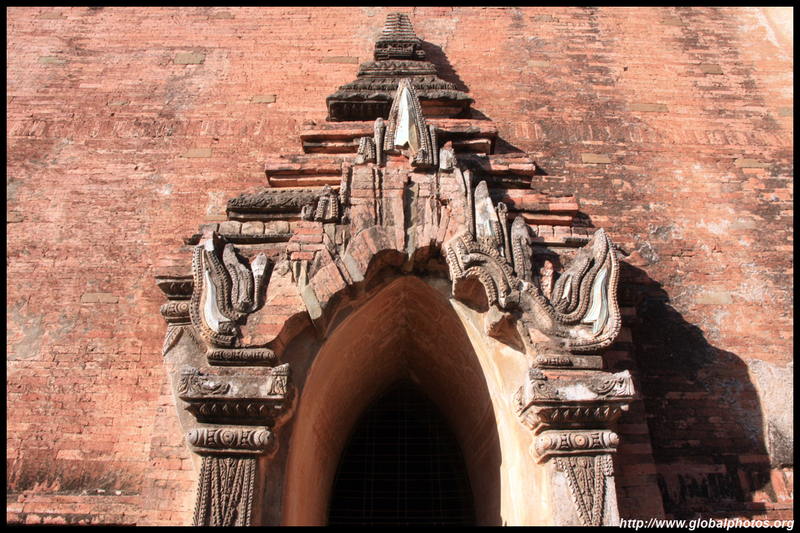 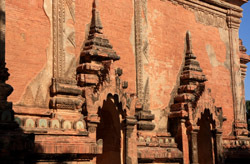 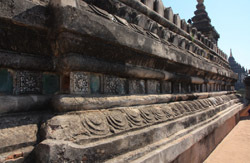 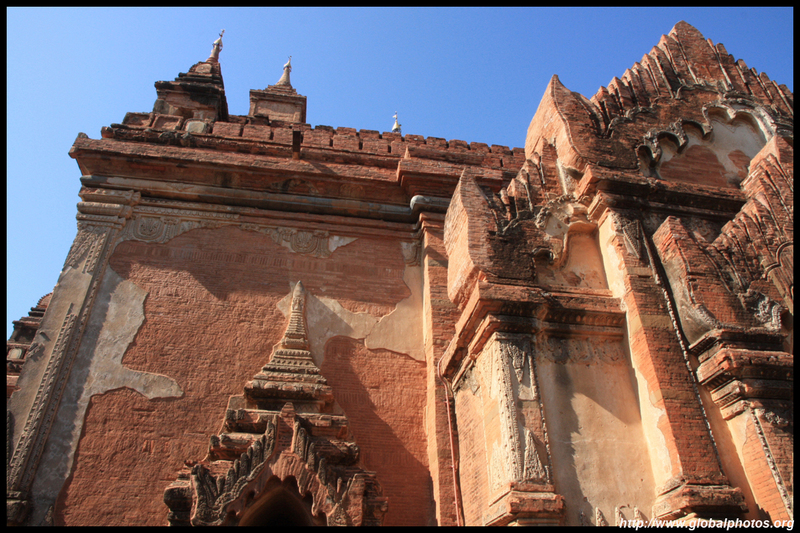 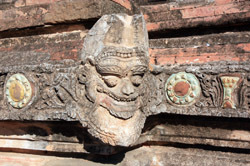 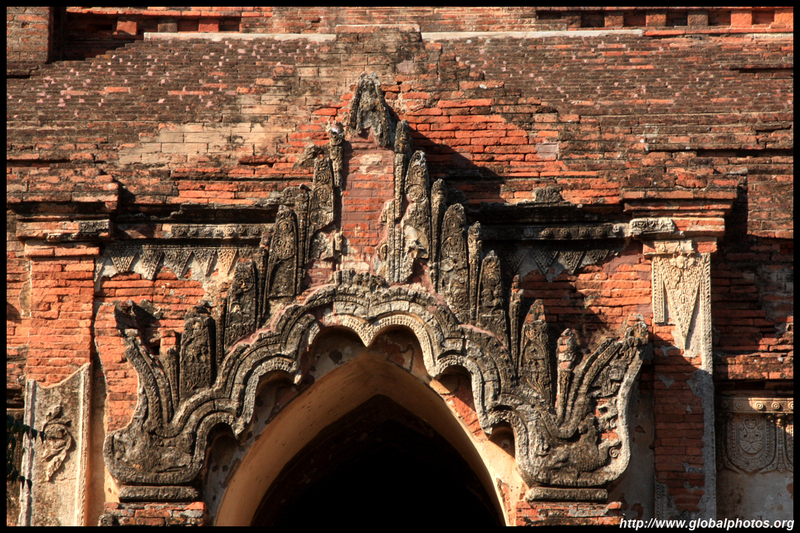 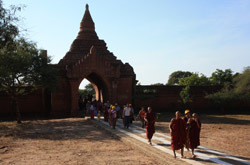 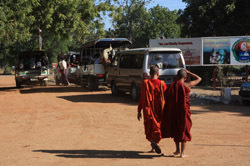 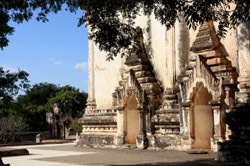 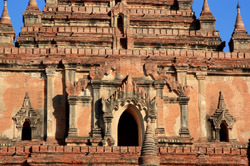 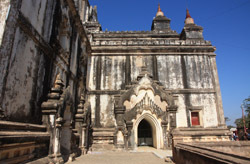 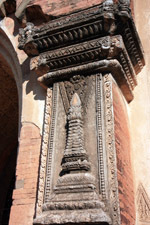 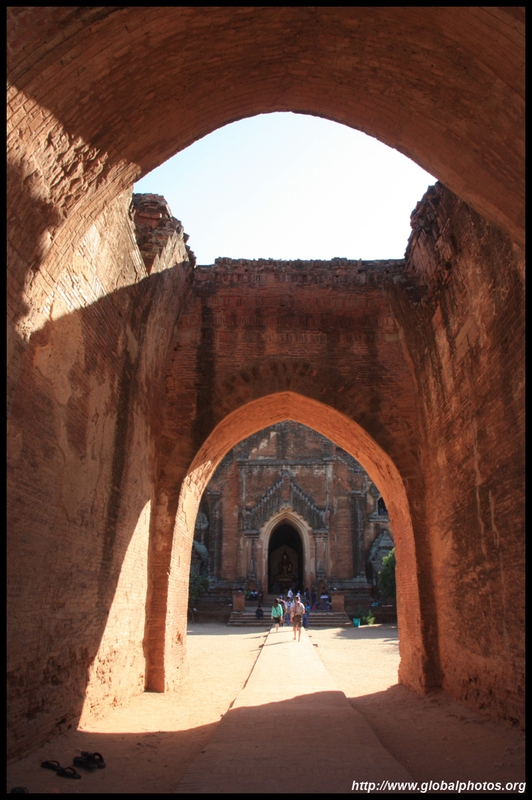 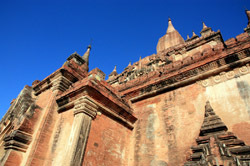 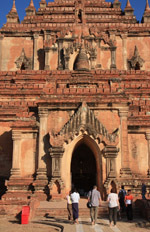 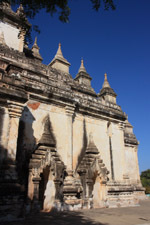 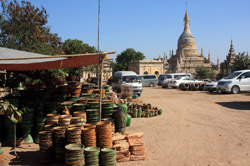 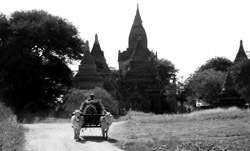 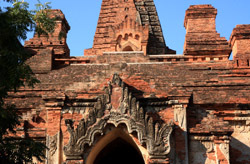 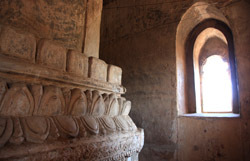 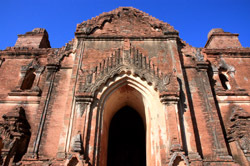 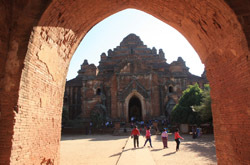 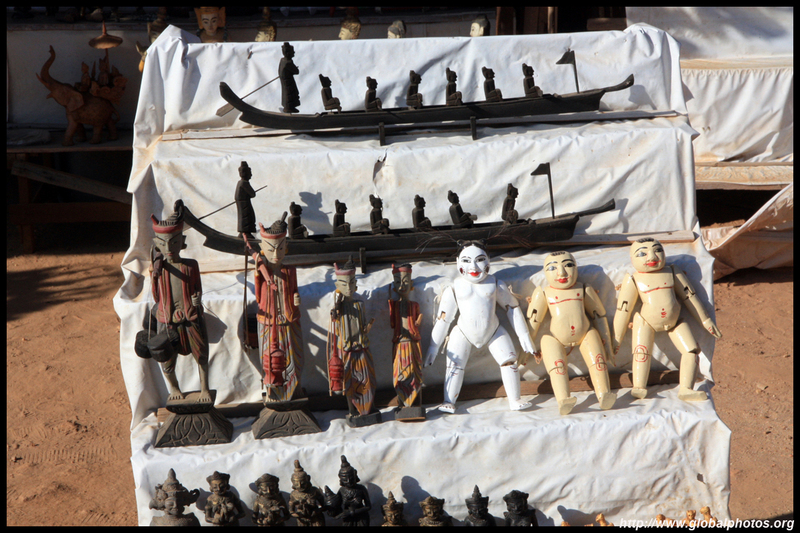 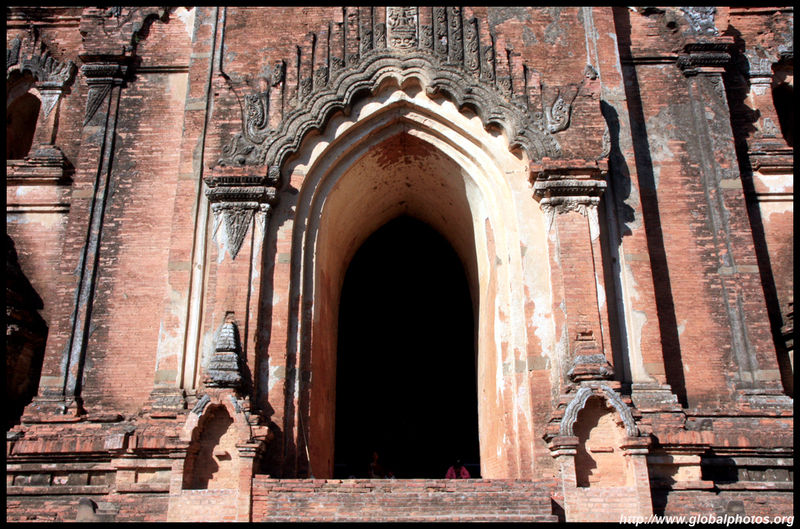 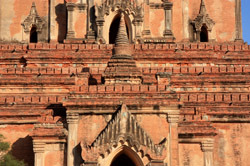 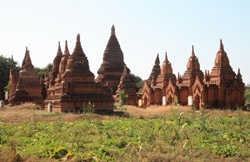 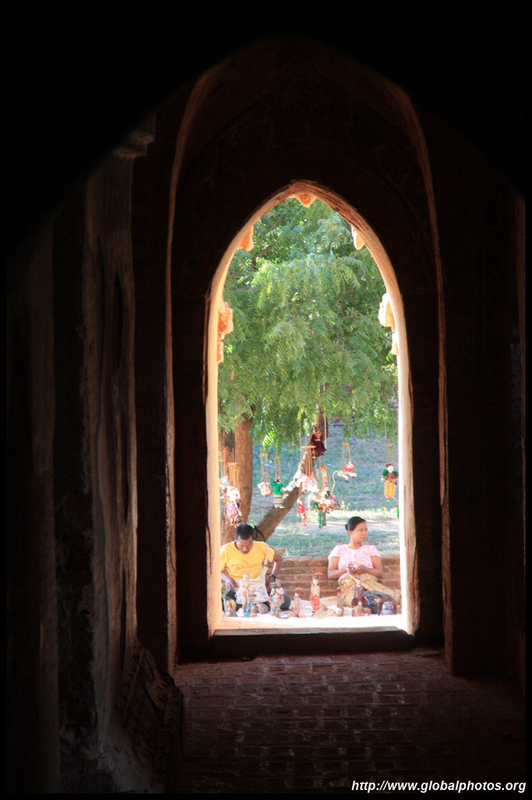 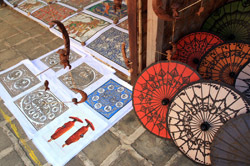 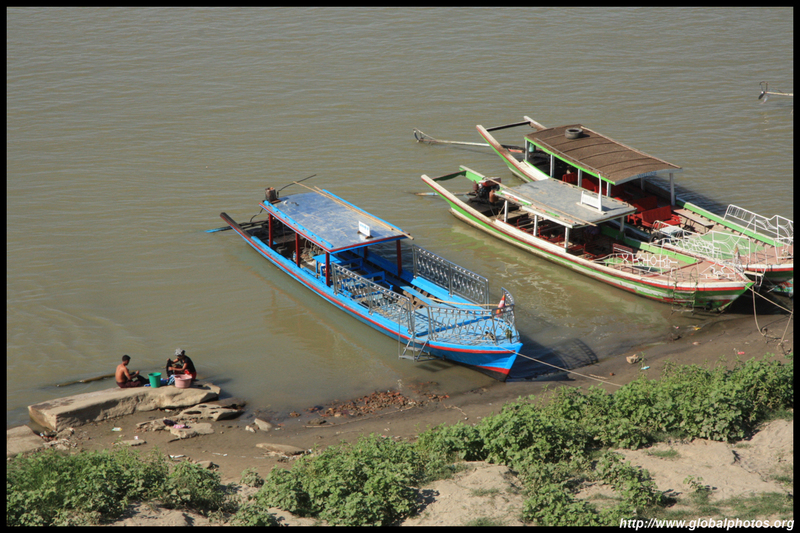 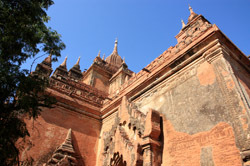 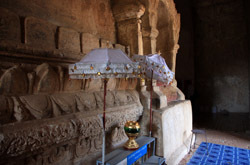 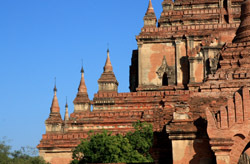 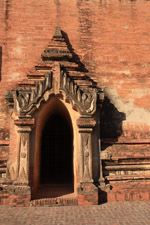 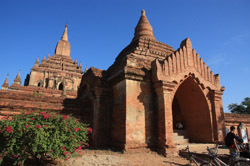 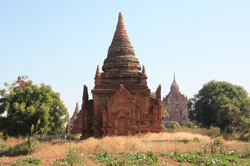 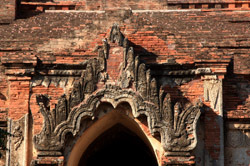 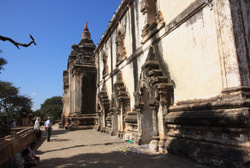 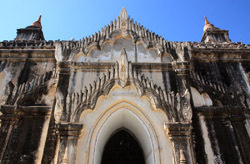 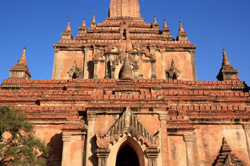 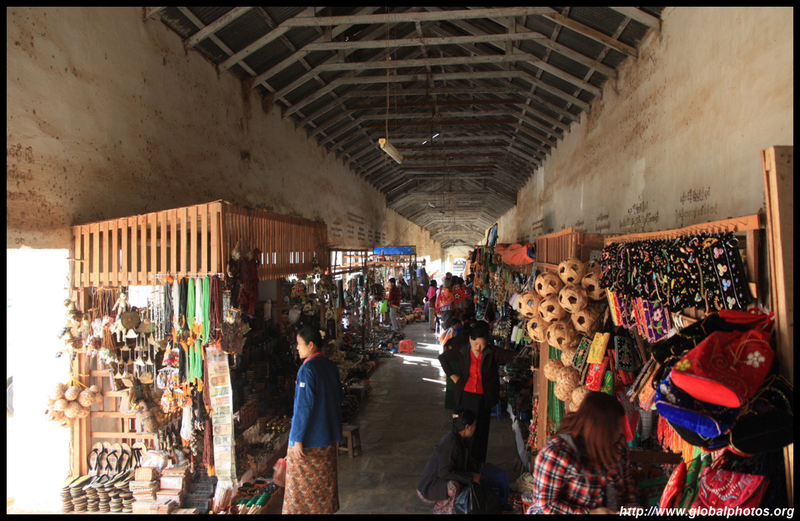 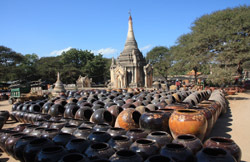 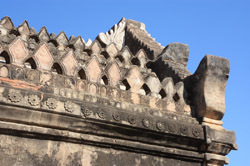 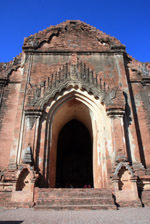 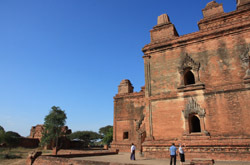 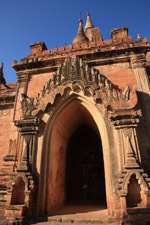 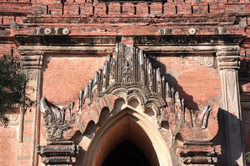 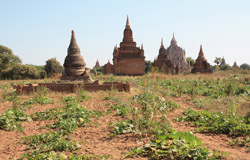 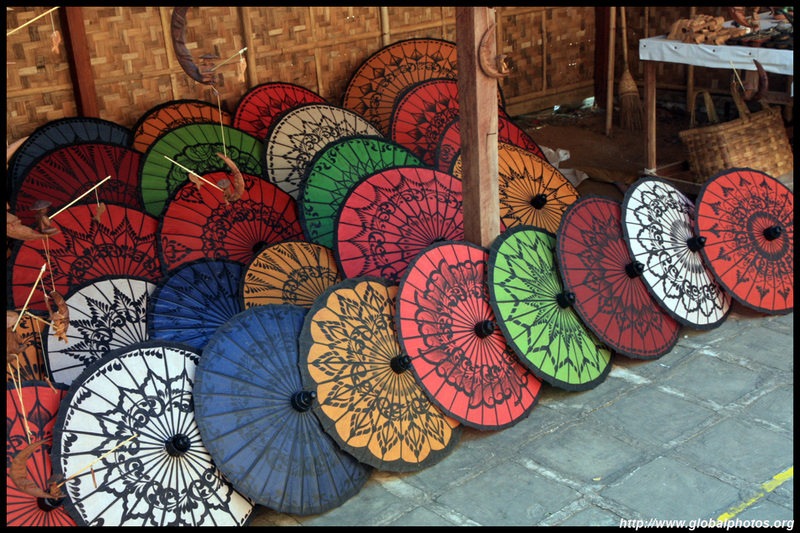 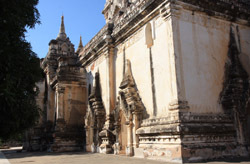 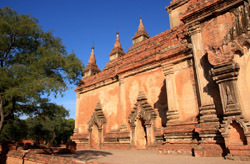 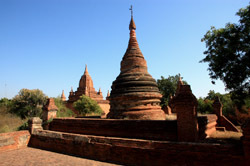 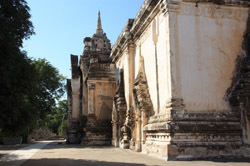 It is possible to visit Bagan as a day trip from Yangon. 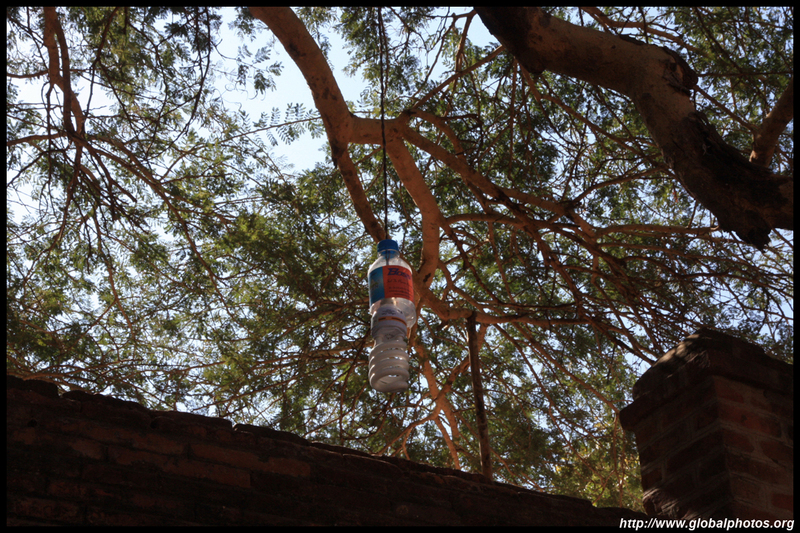 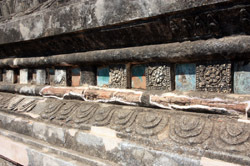 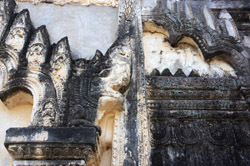 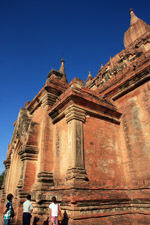 The flight is only about an hour and a half so if you set out early in the morning, you will have ample time to get a taste of the temples that are scattered across 50 square km. 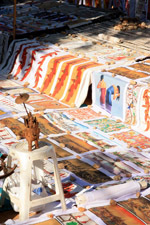 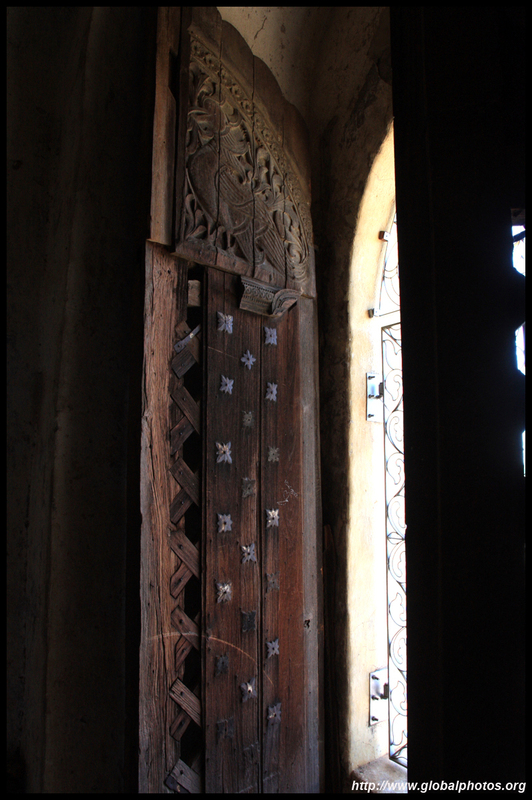 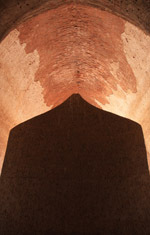 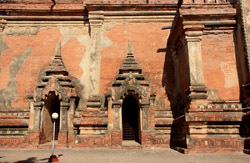 This historic city was believed to have over 2000 religious structures dating from the 11-13th centuries. 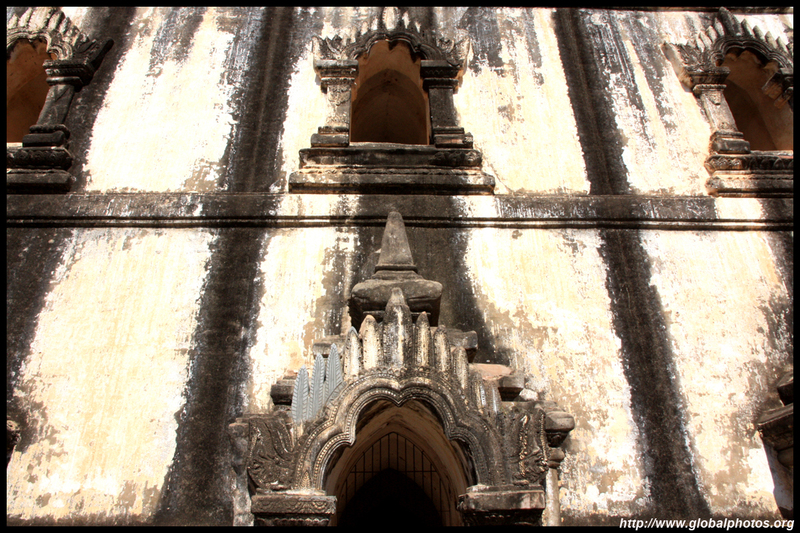 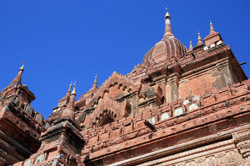 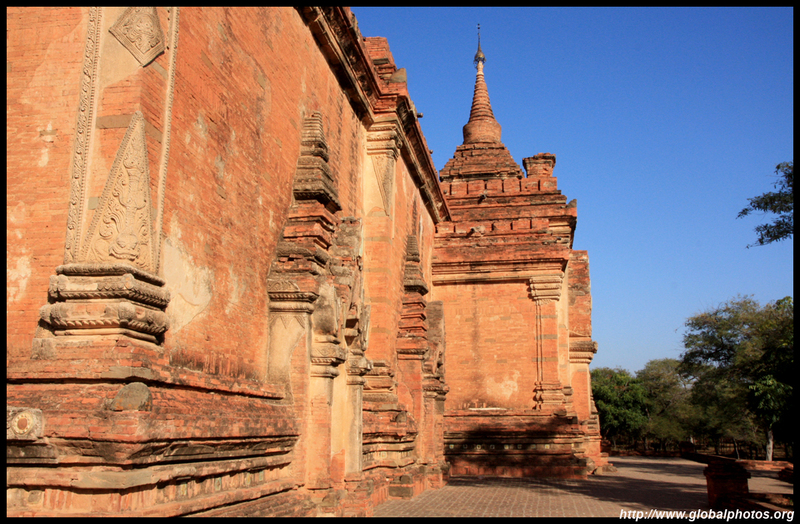 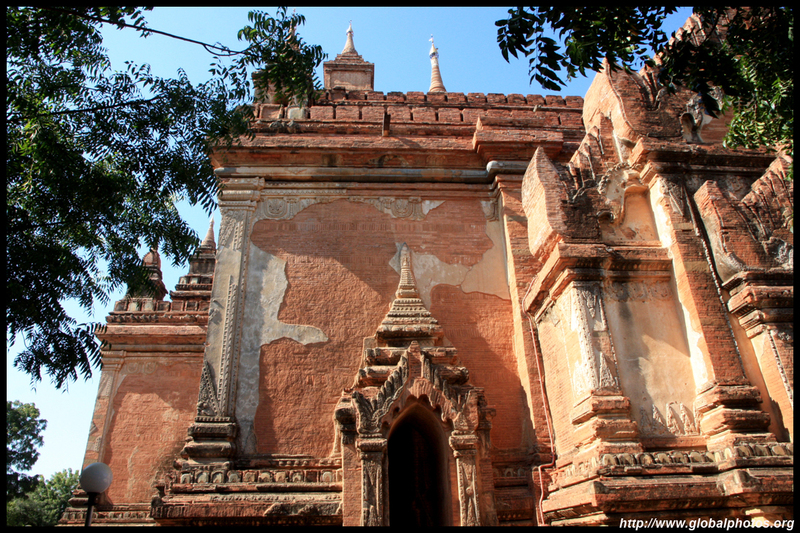 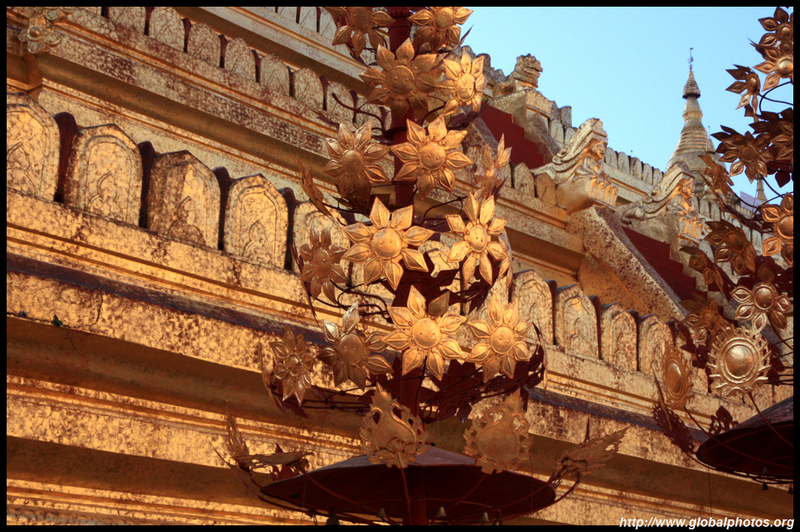 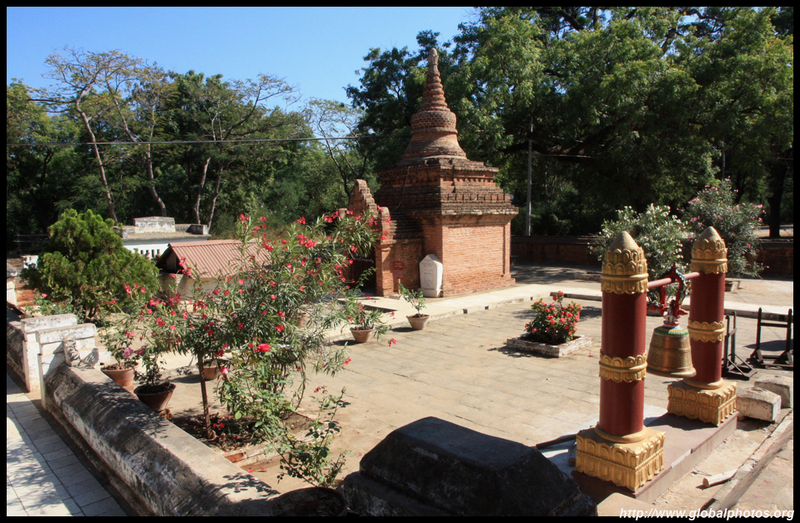 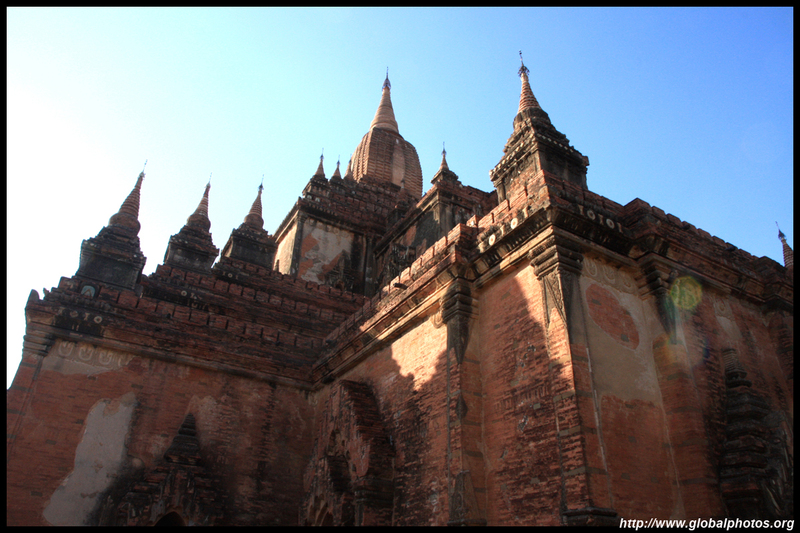 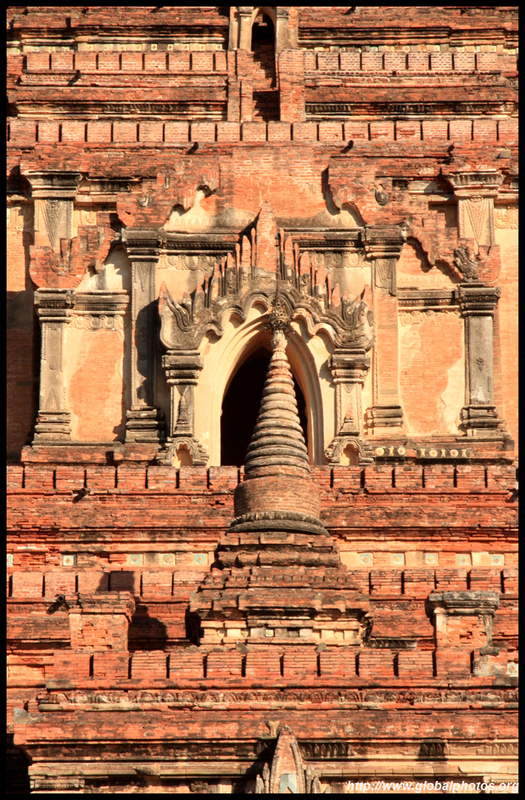 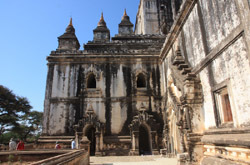 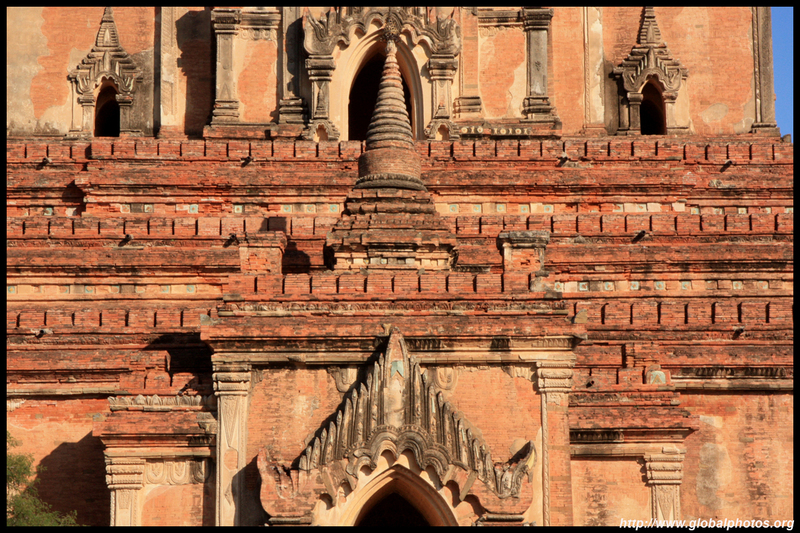 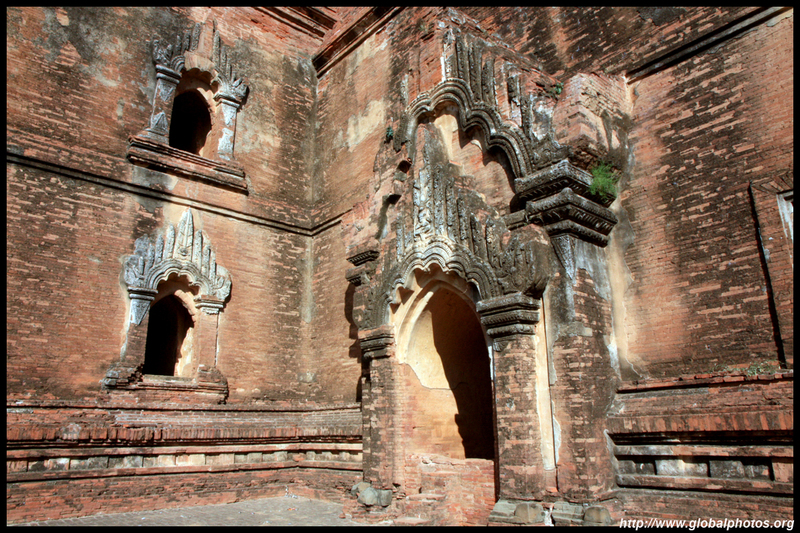 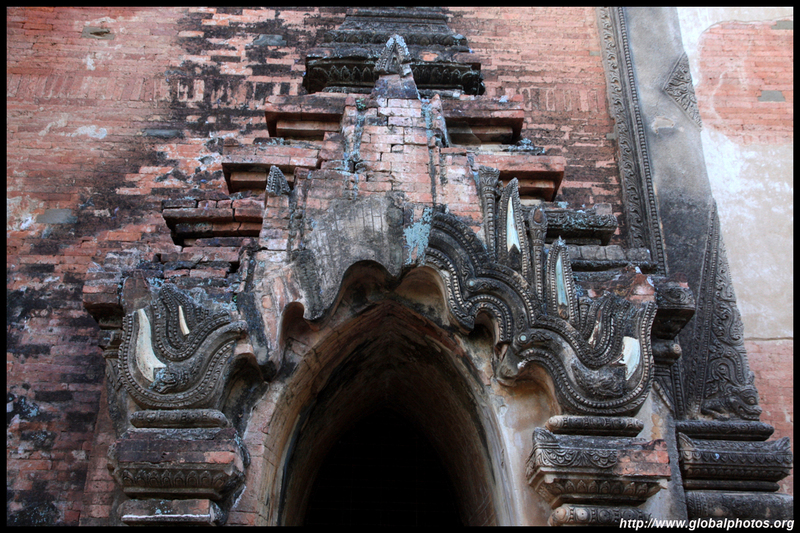 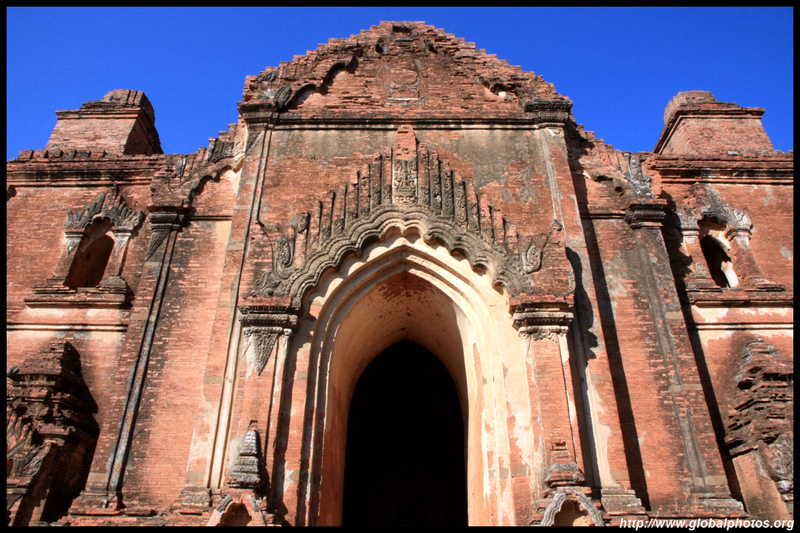 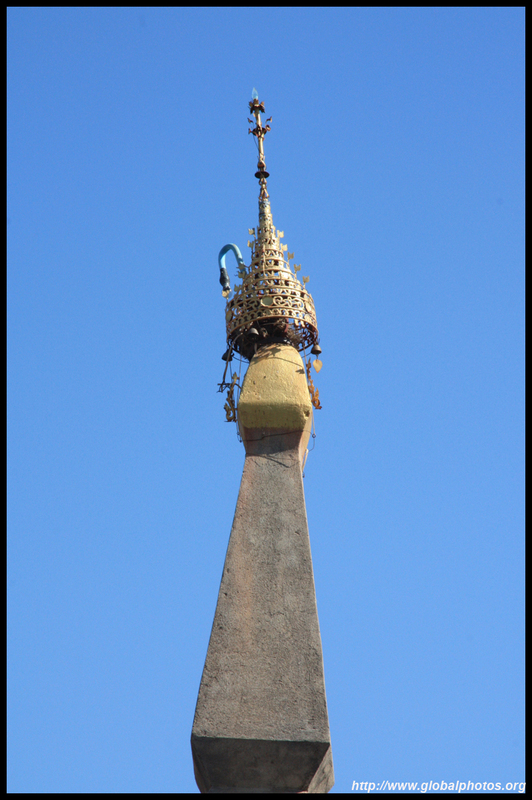 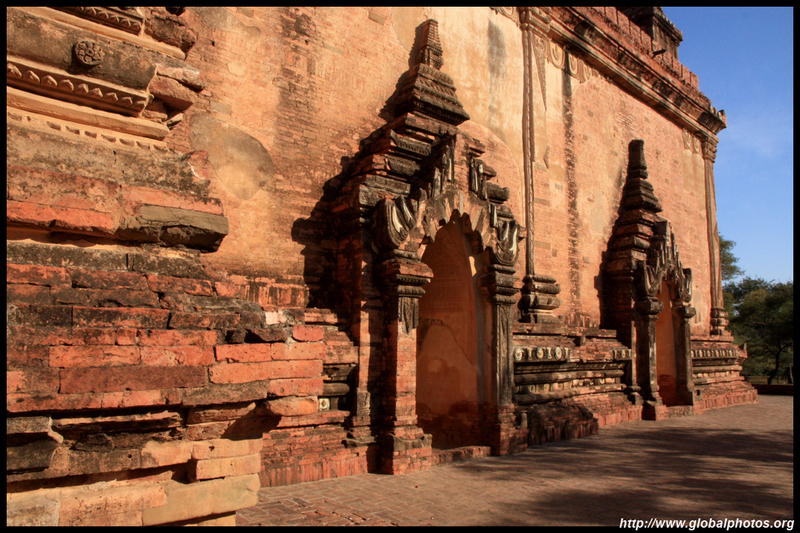 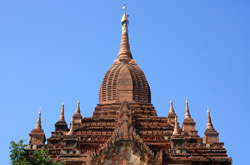 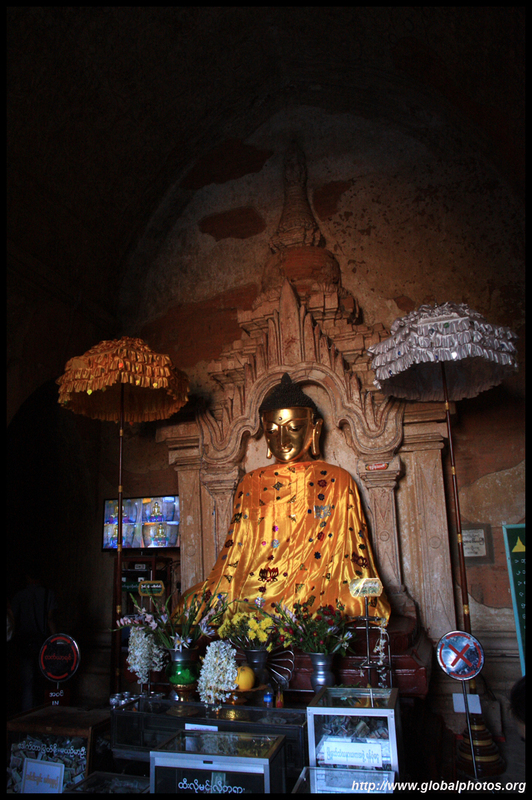 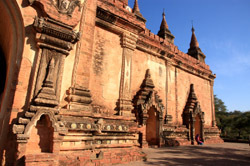 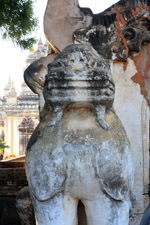 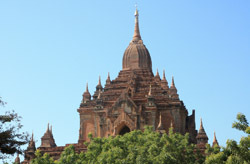 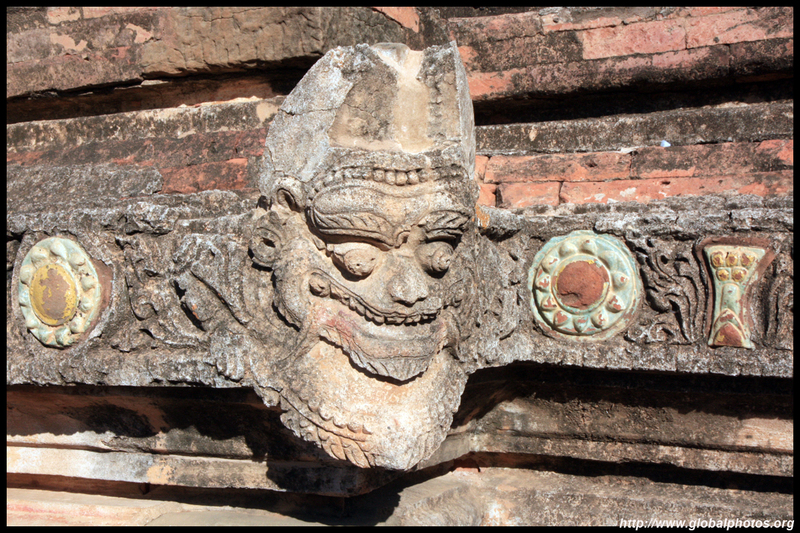 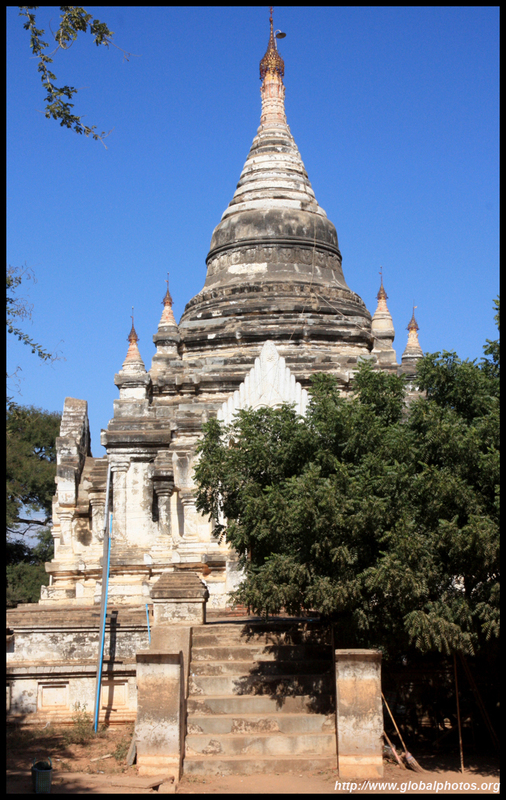 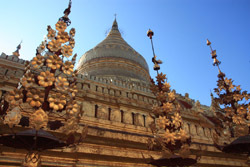 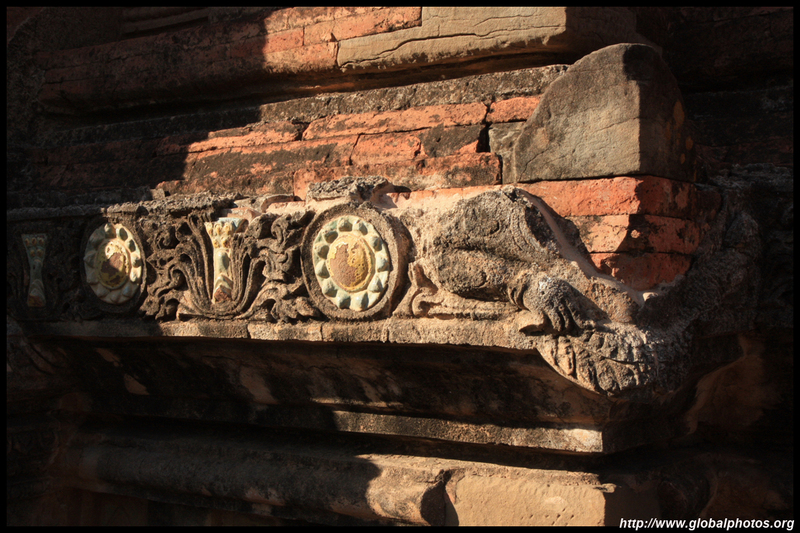 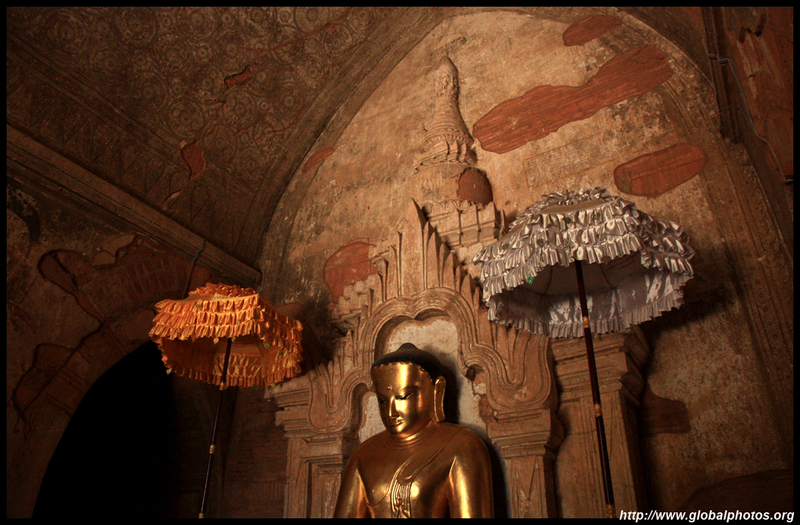 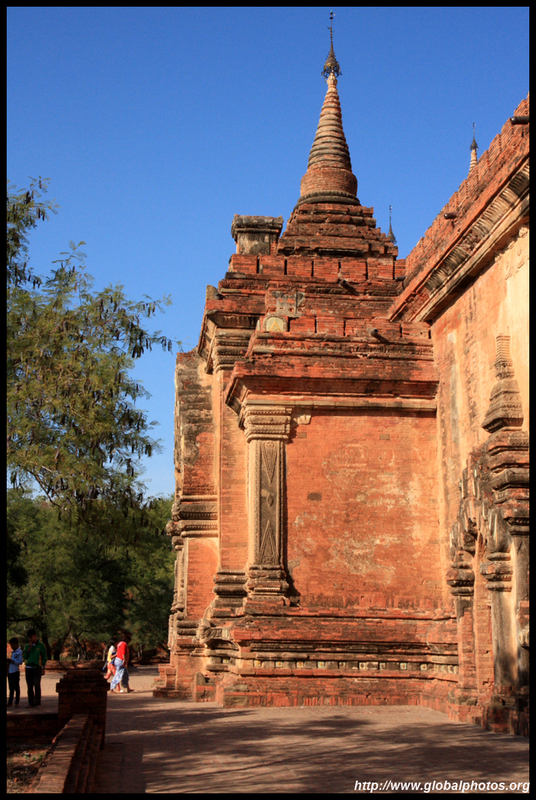 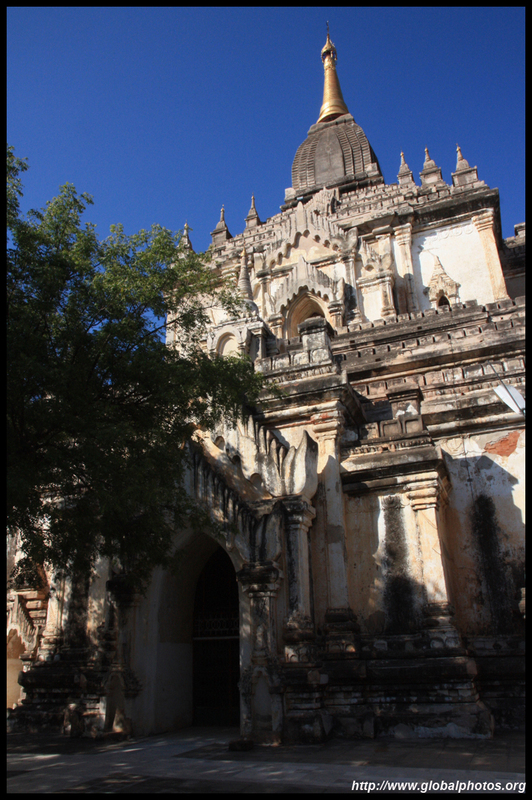 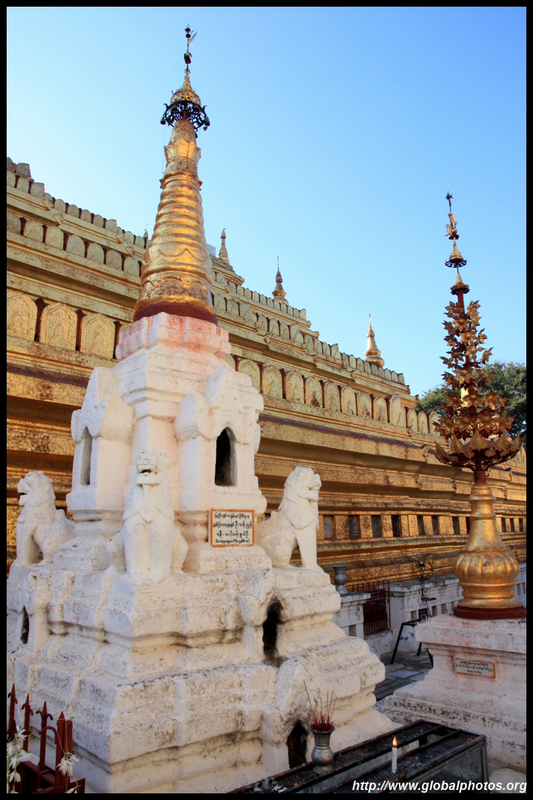 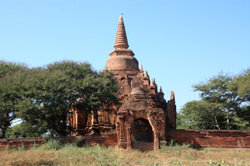 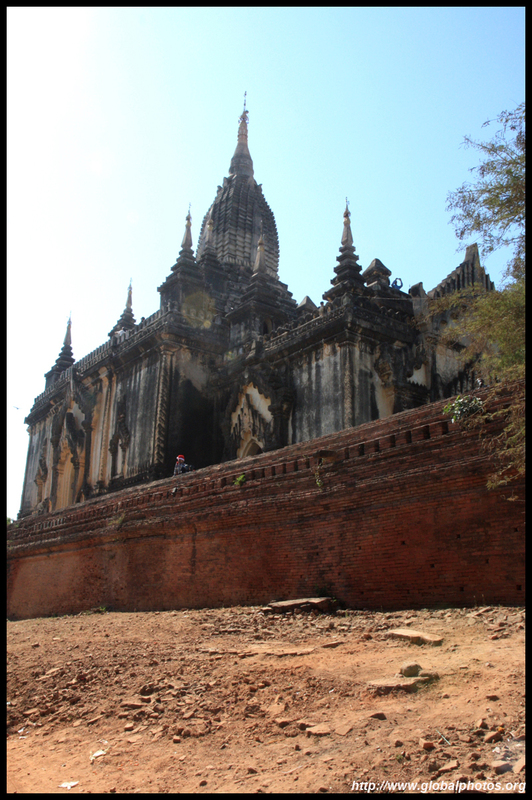 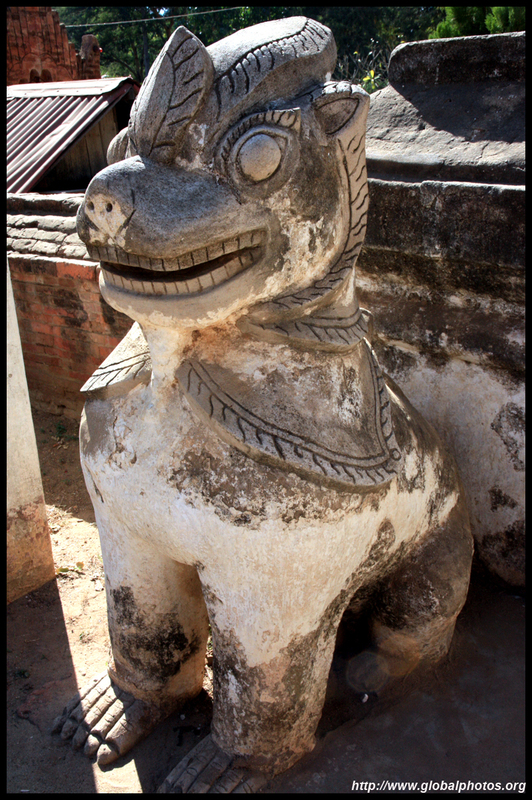 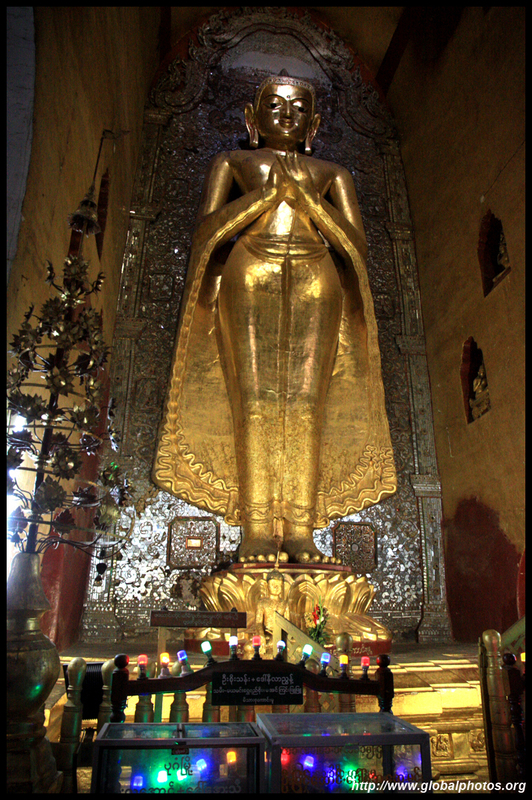 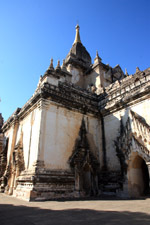 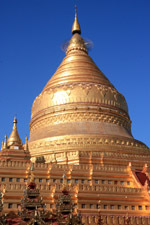 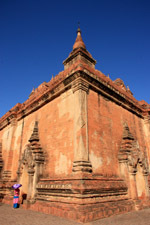 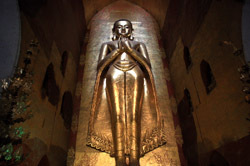 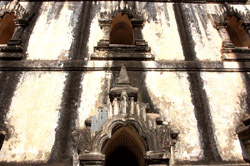 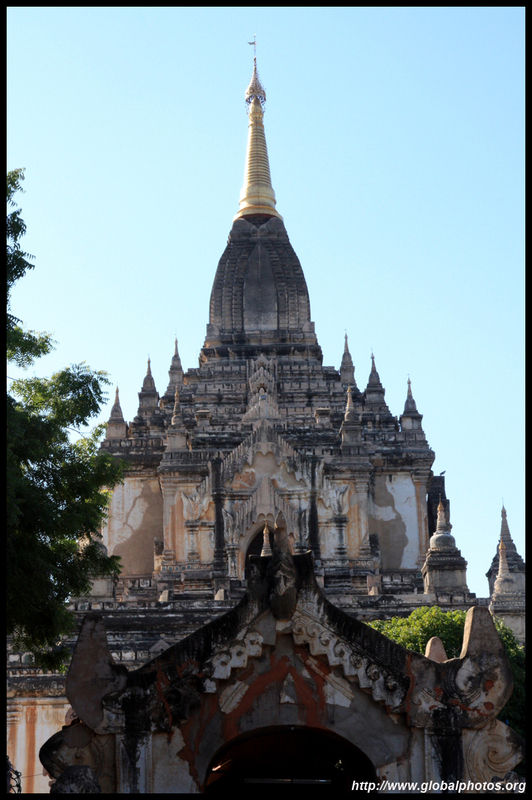 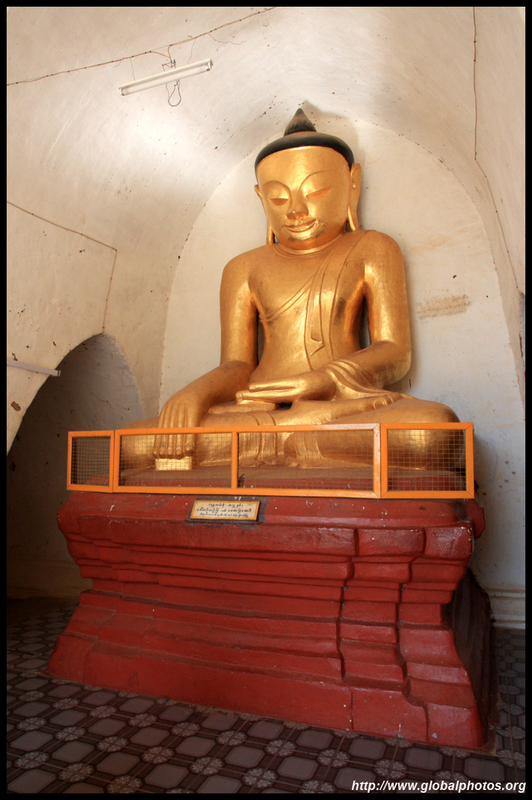 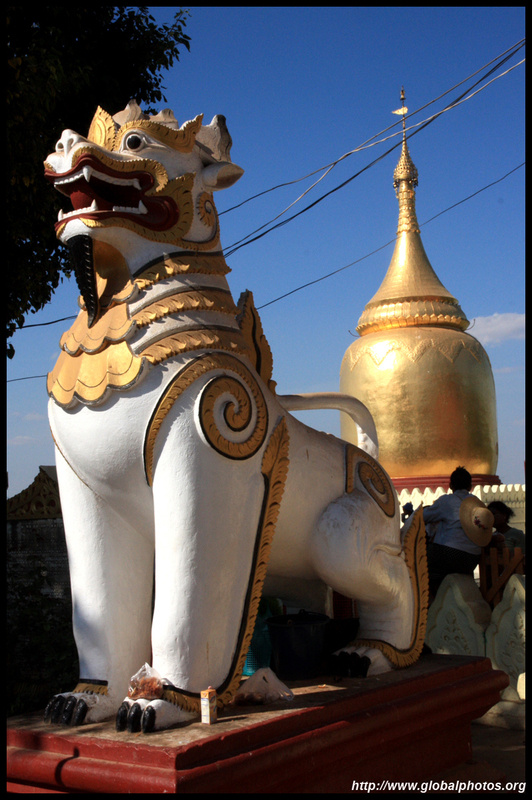 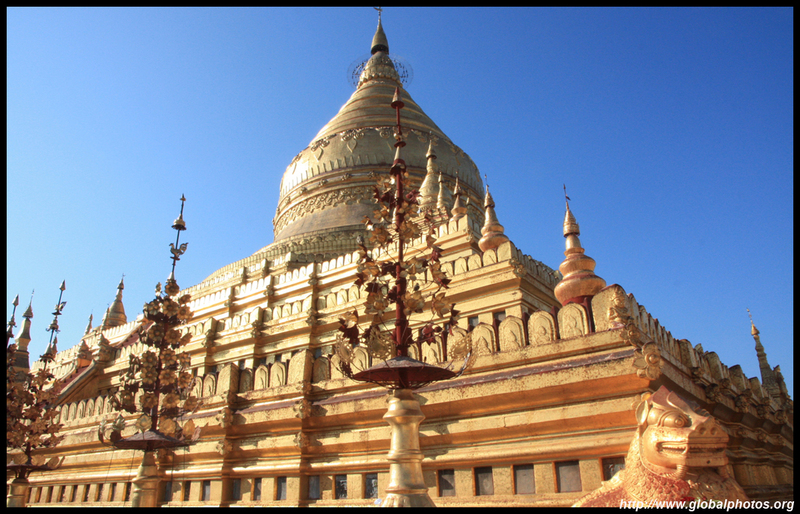 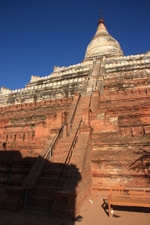 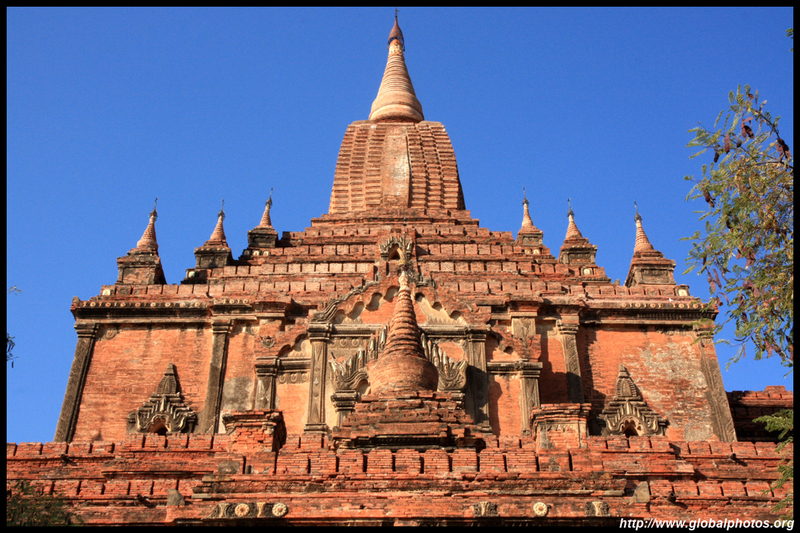 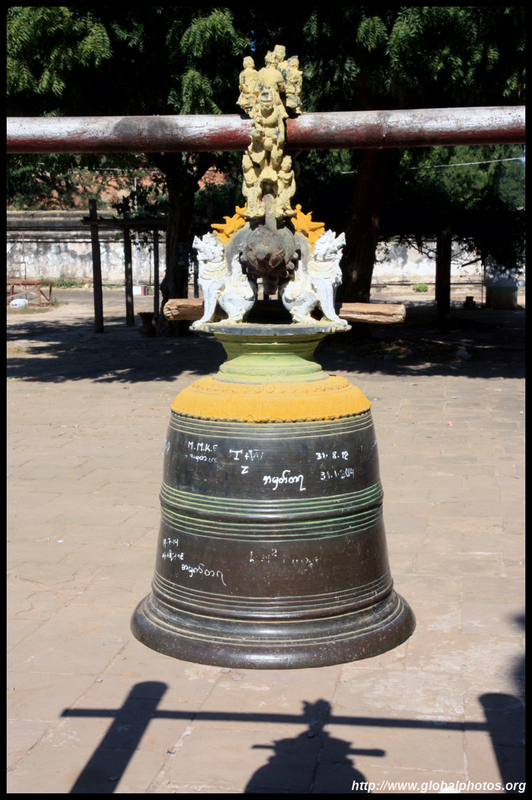 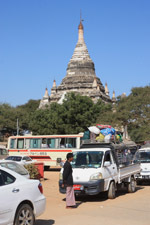 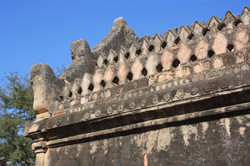 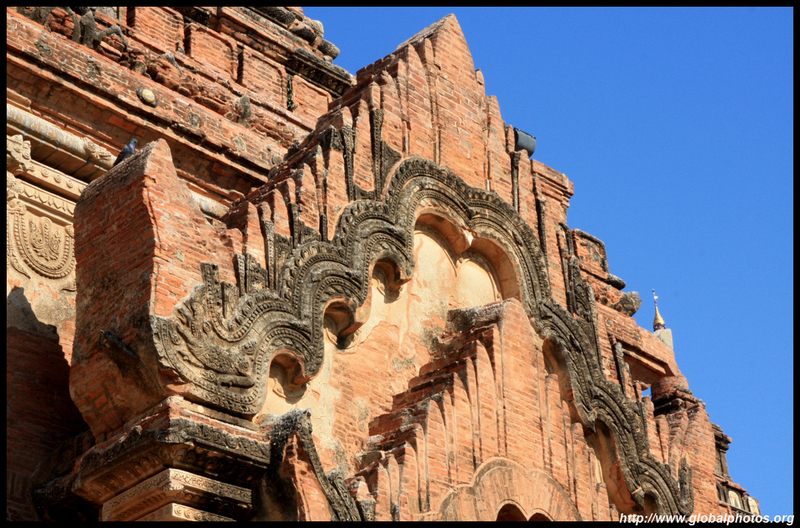 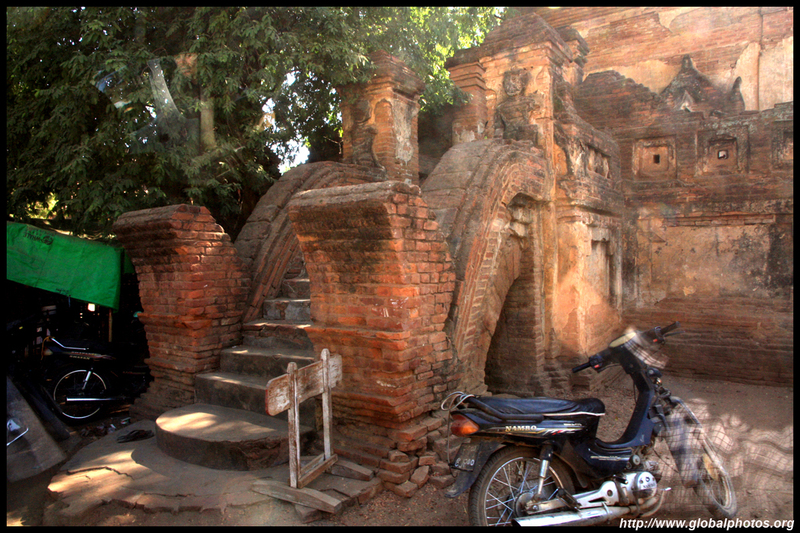 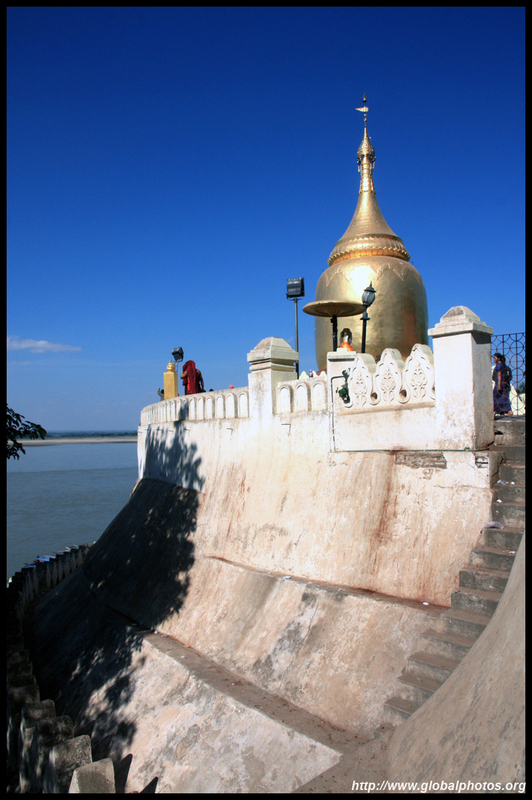 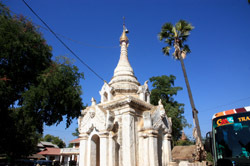 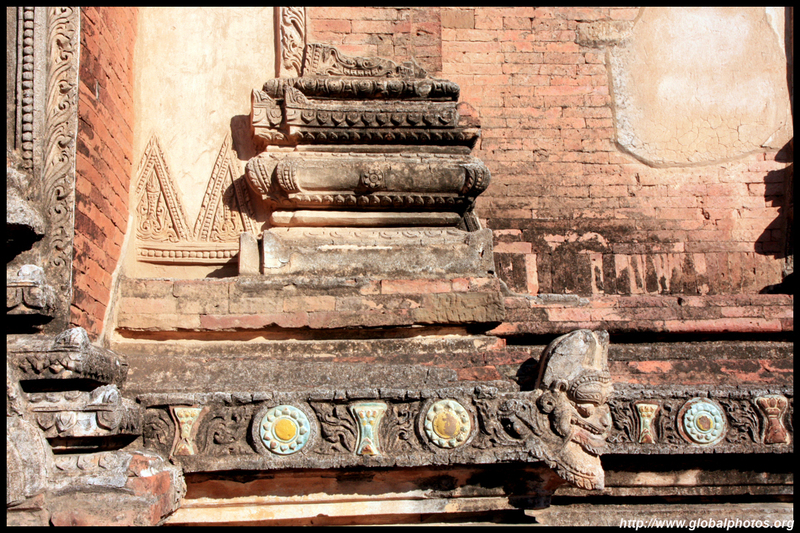 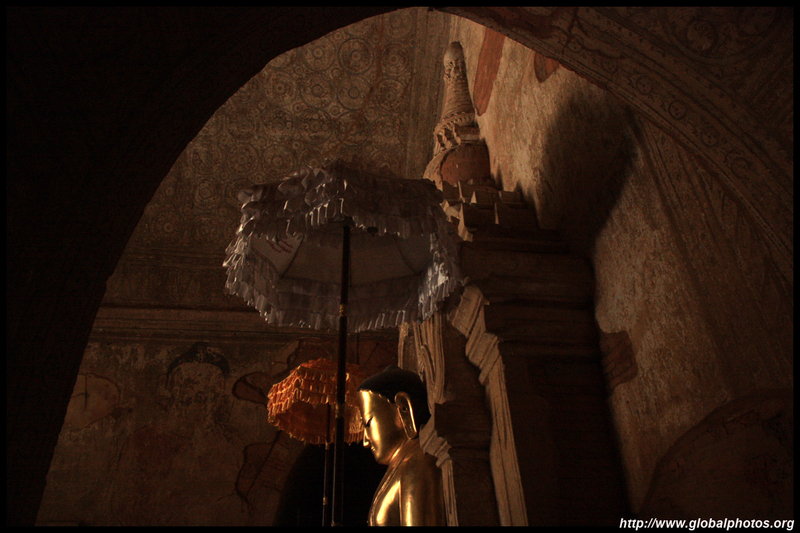 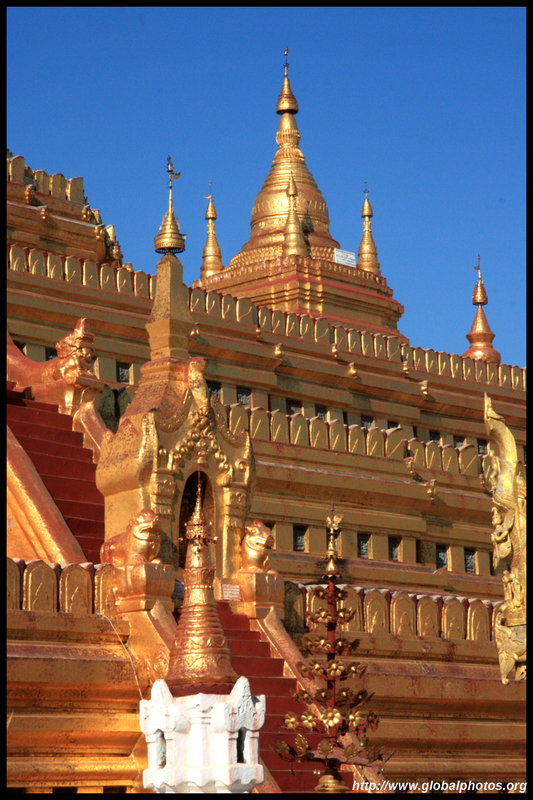 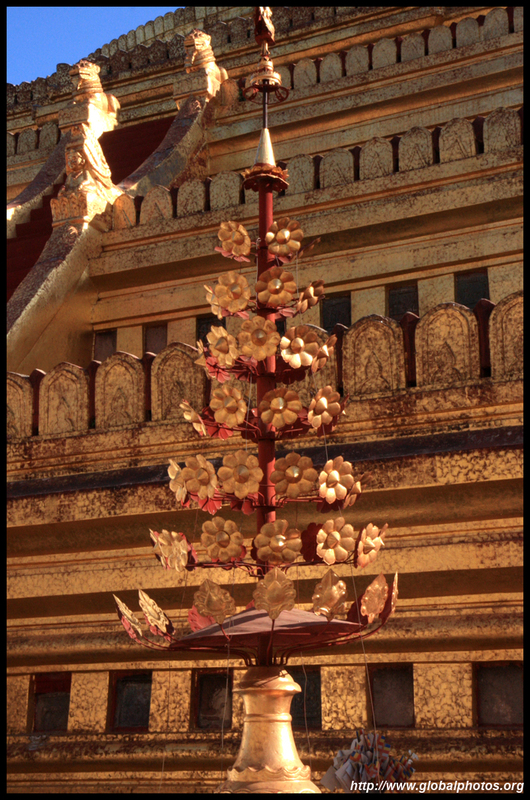 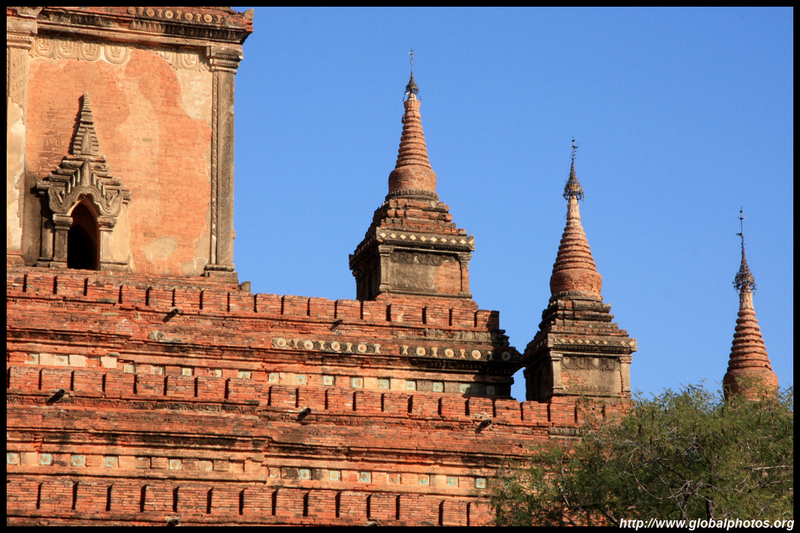 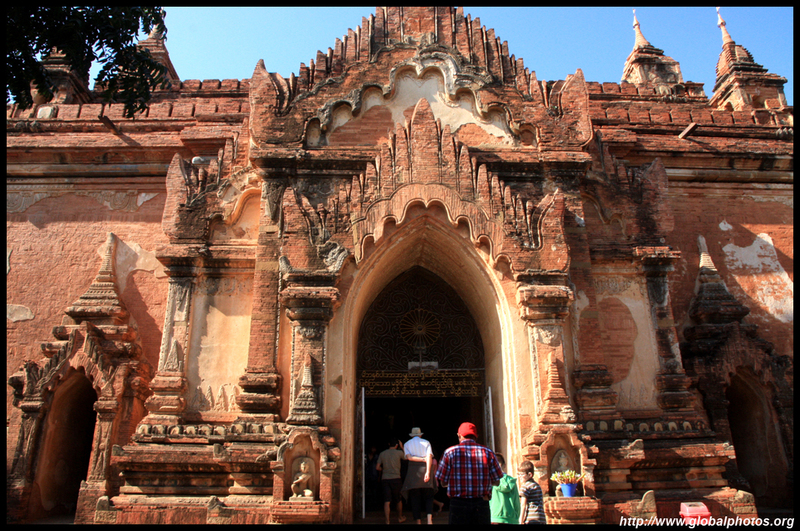 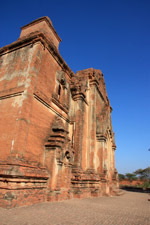 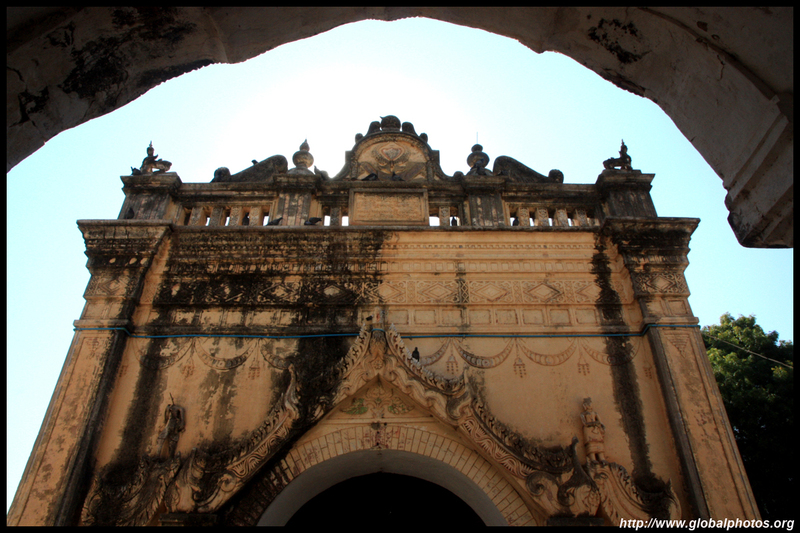 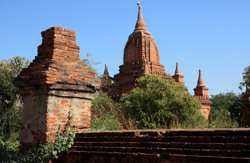 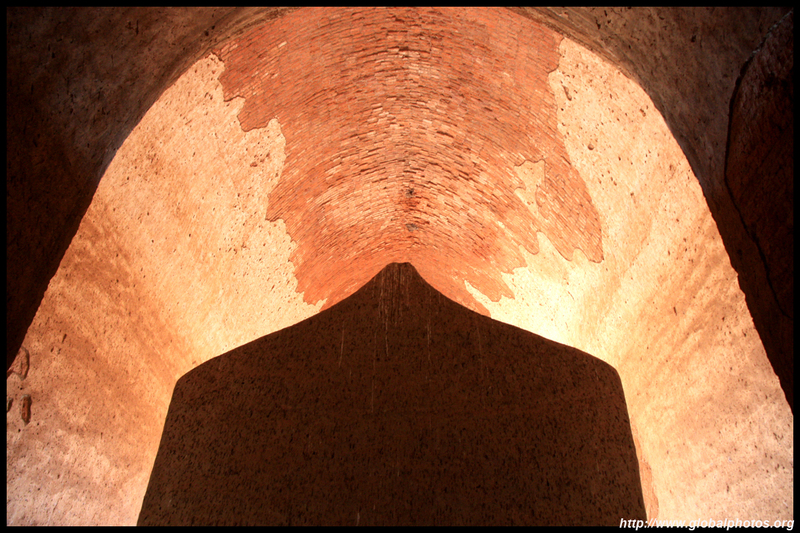 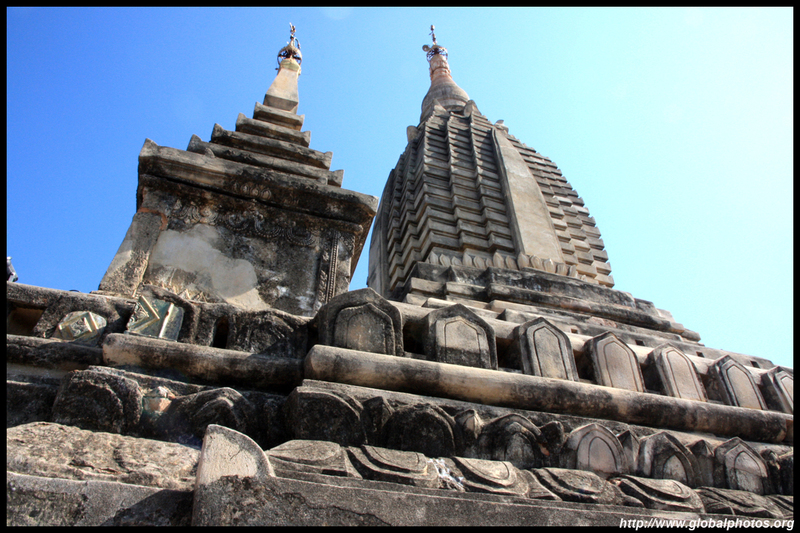 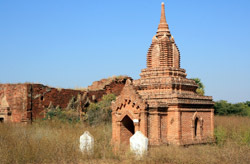 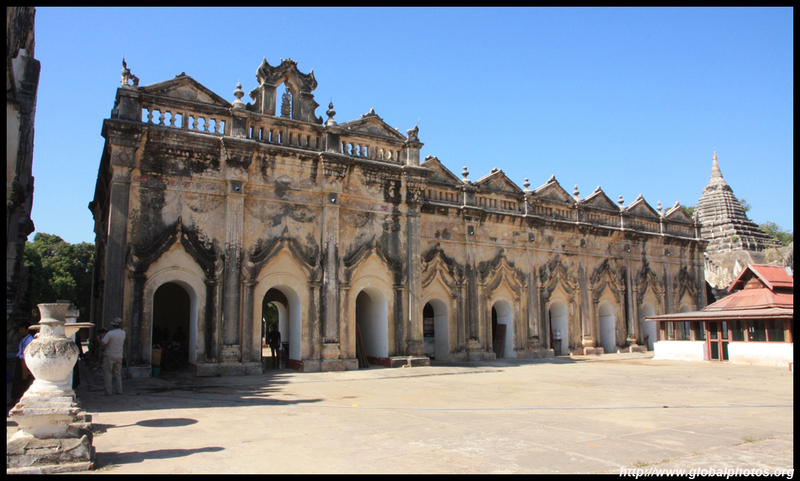 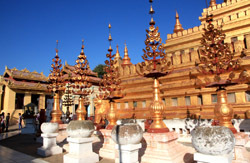 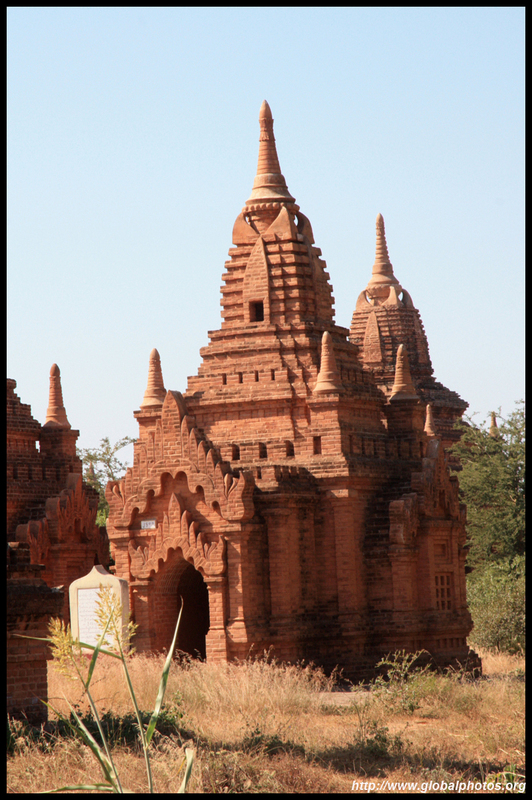 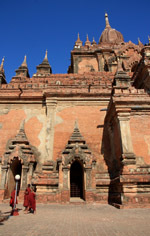 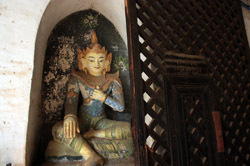 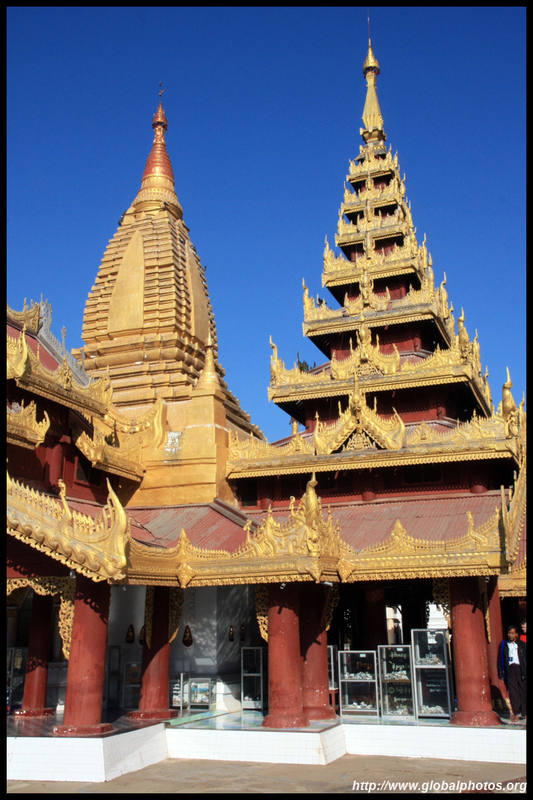 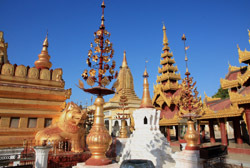 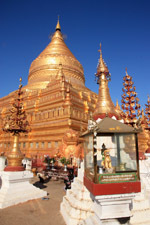 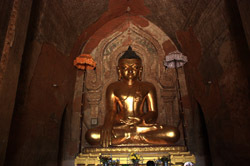 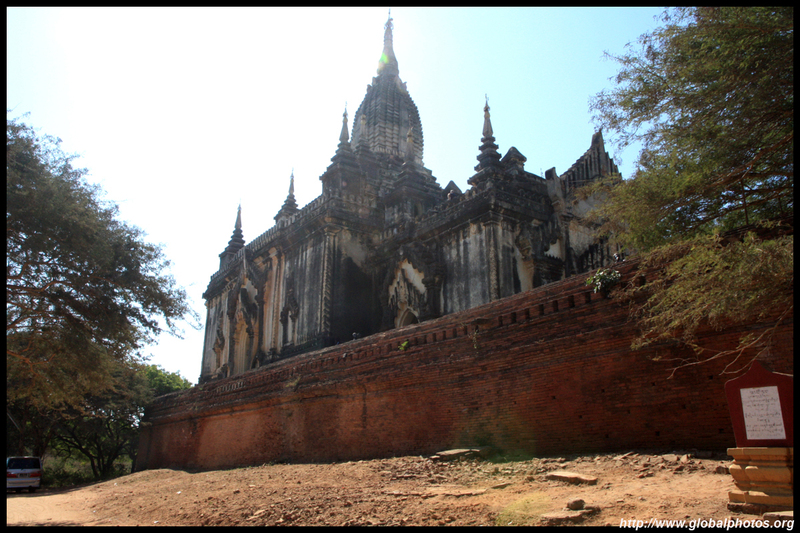 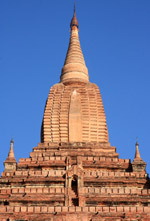 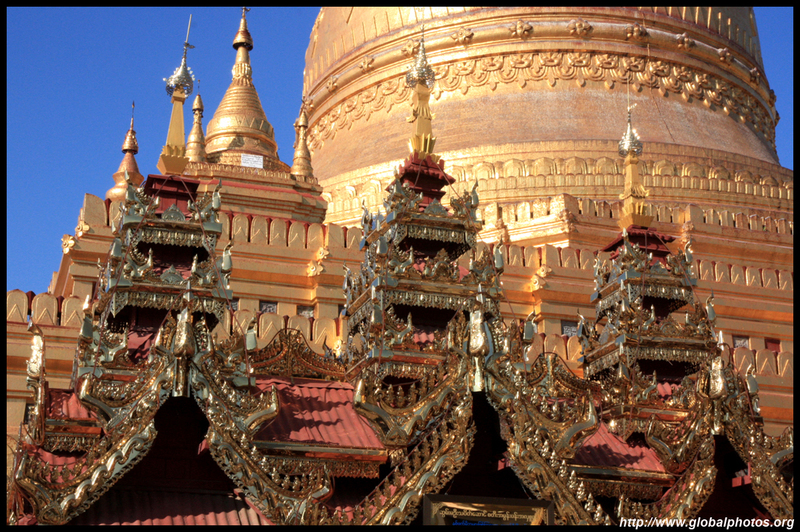 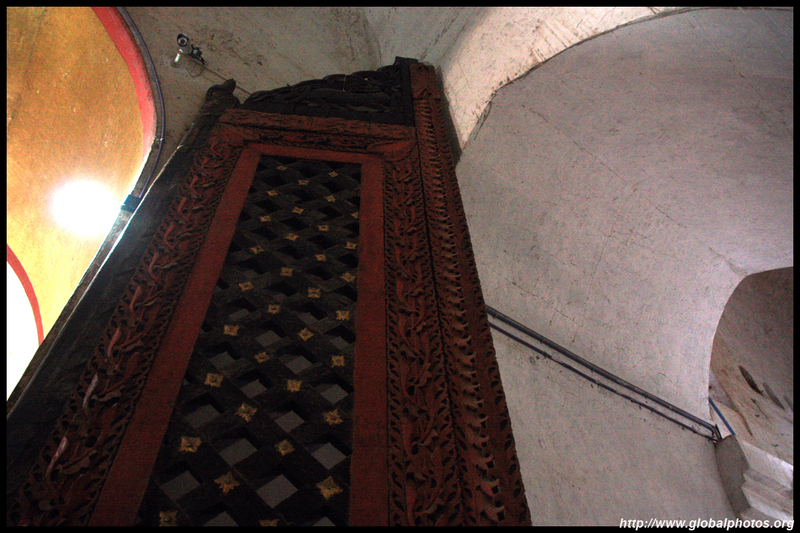 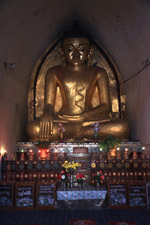 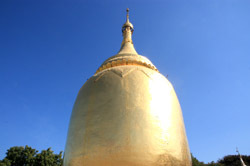 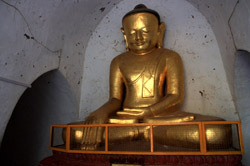 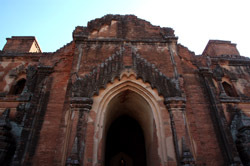 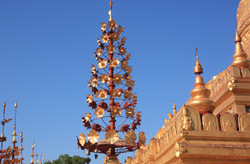 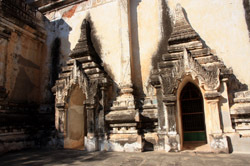 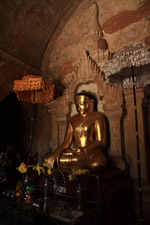 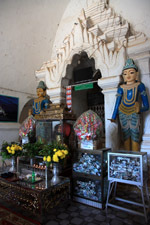 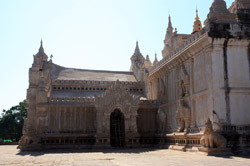 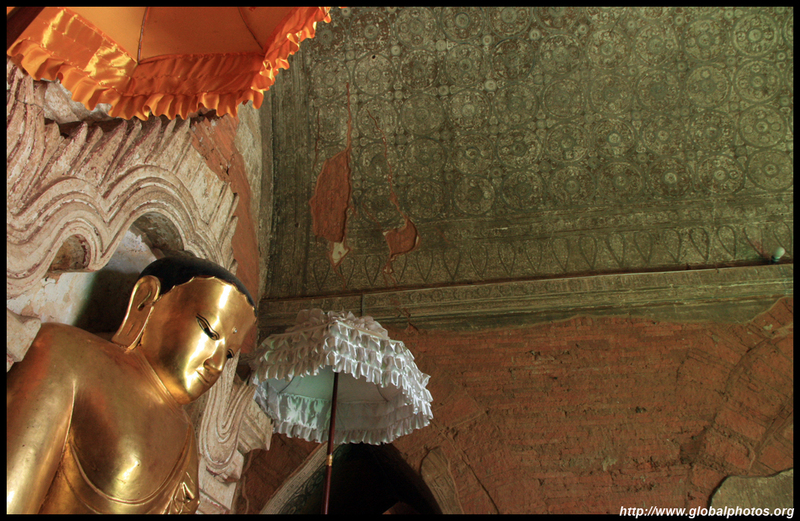 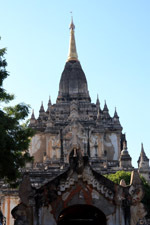 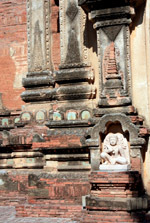 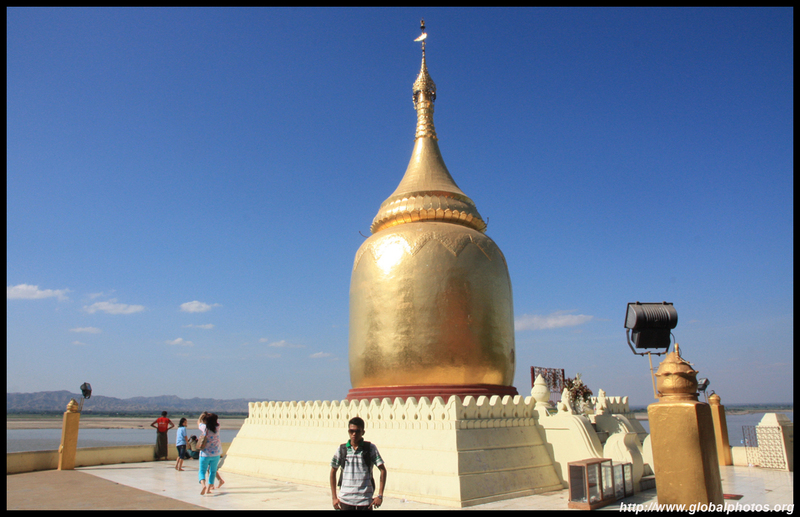 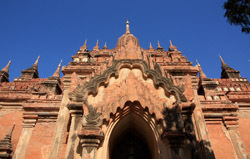 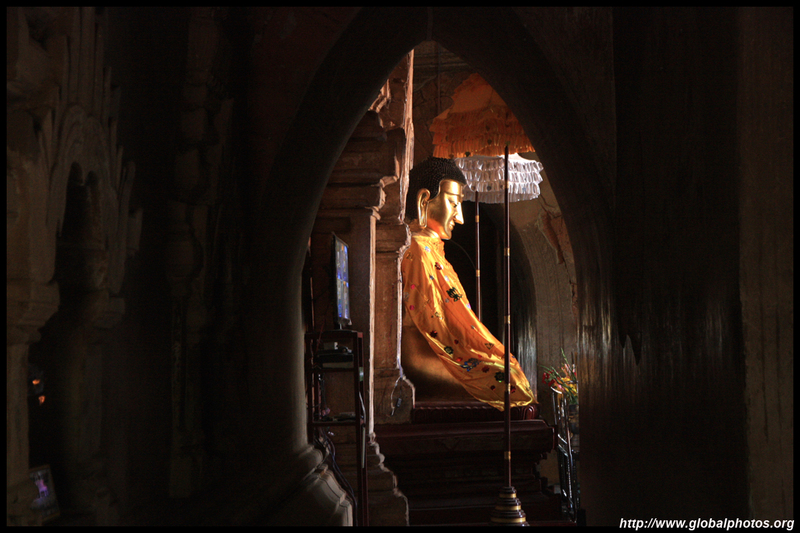 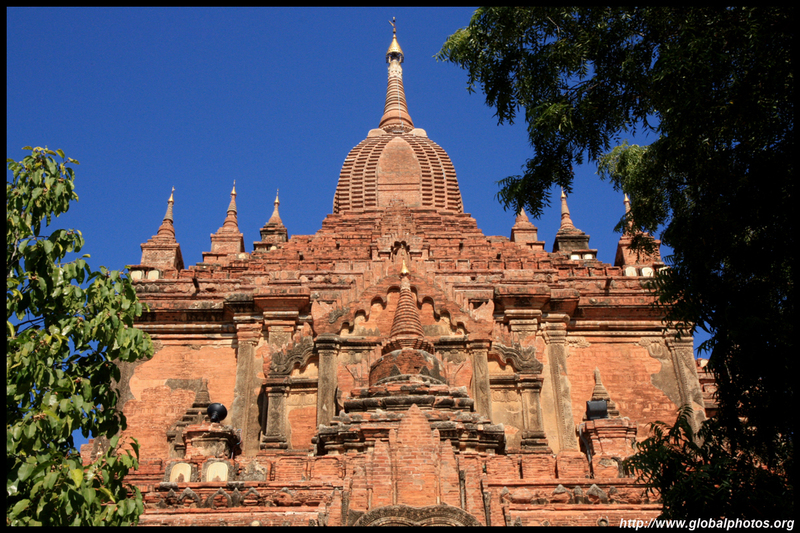 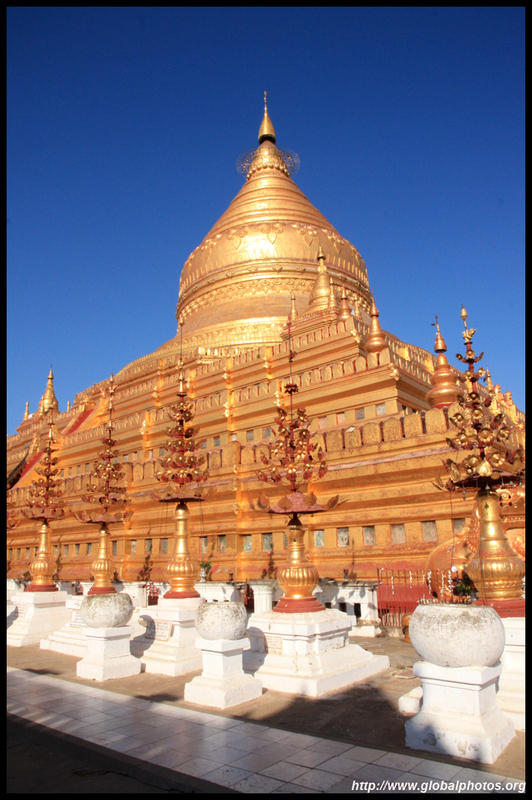 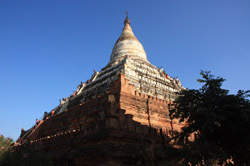 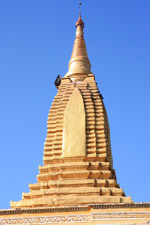 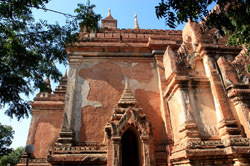 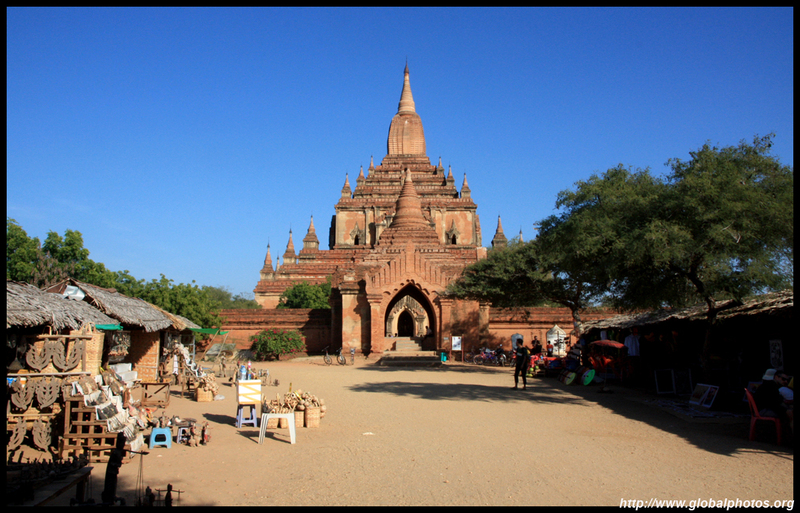 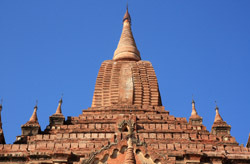 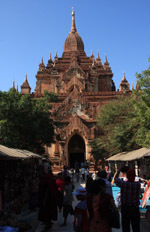 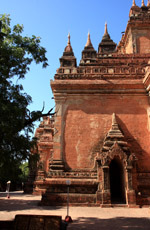 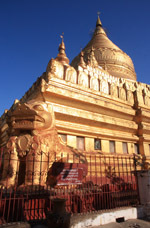 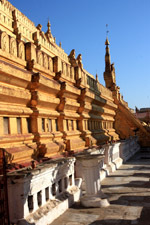 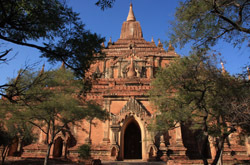 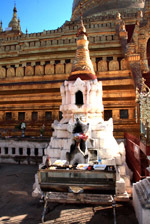 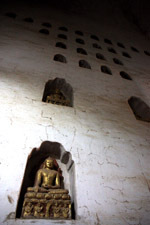 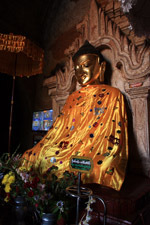 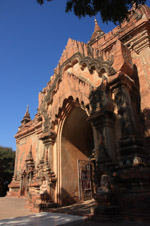 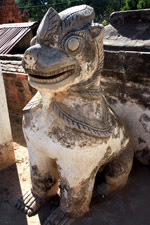 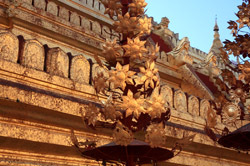 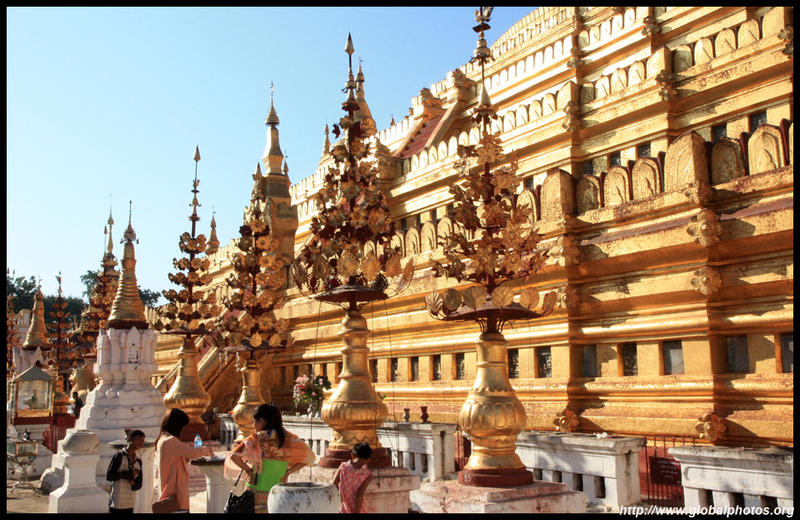 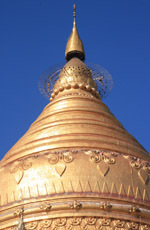 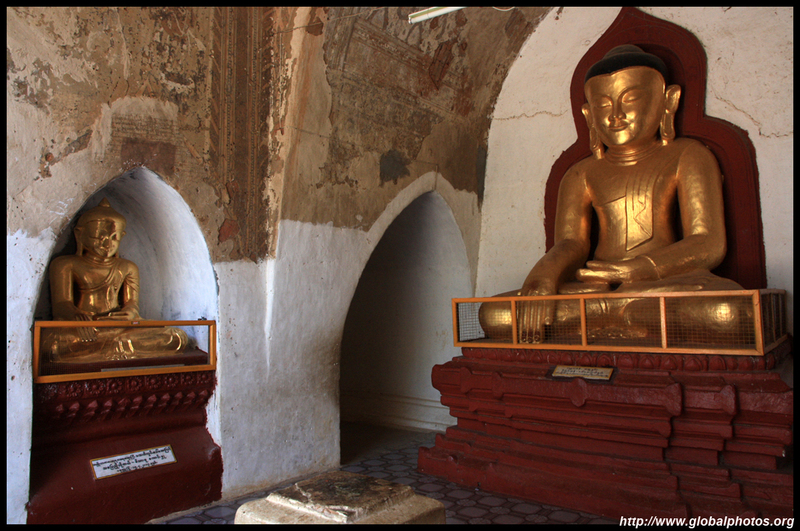 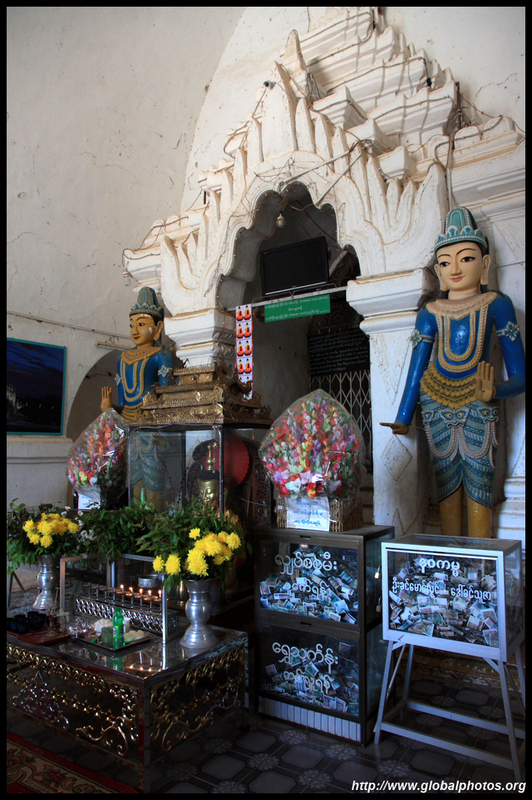 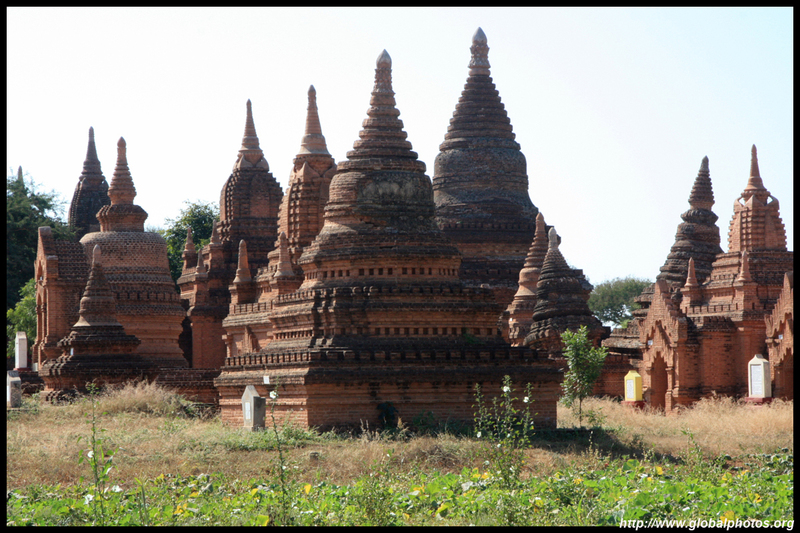 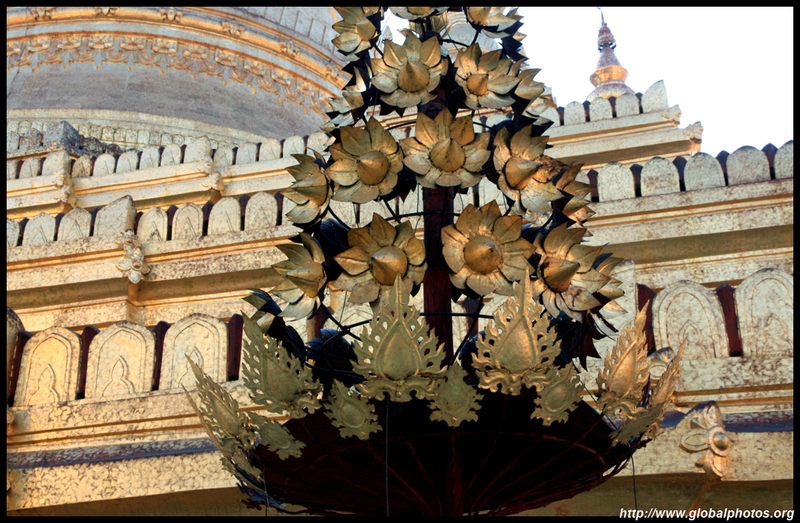 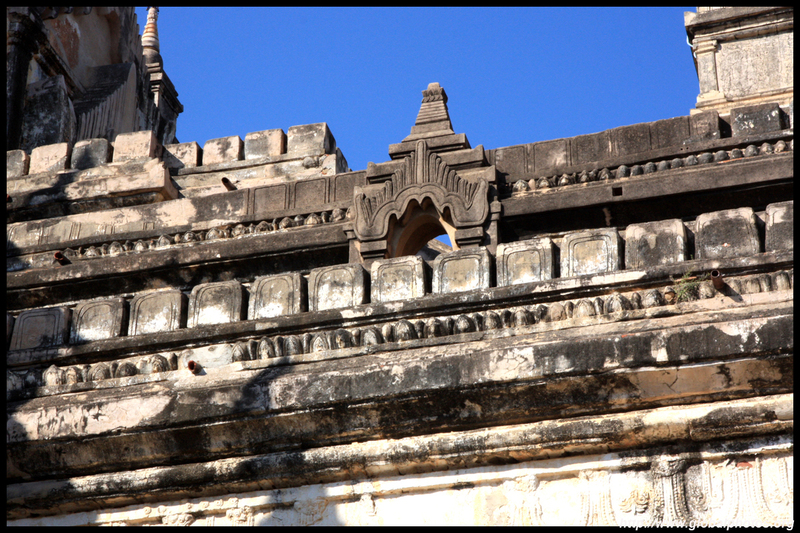 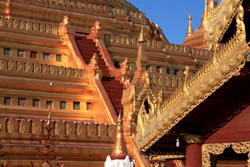 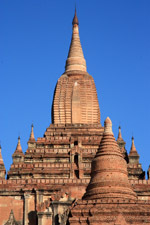 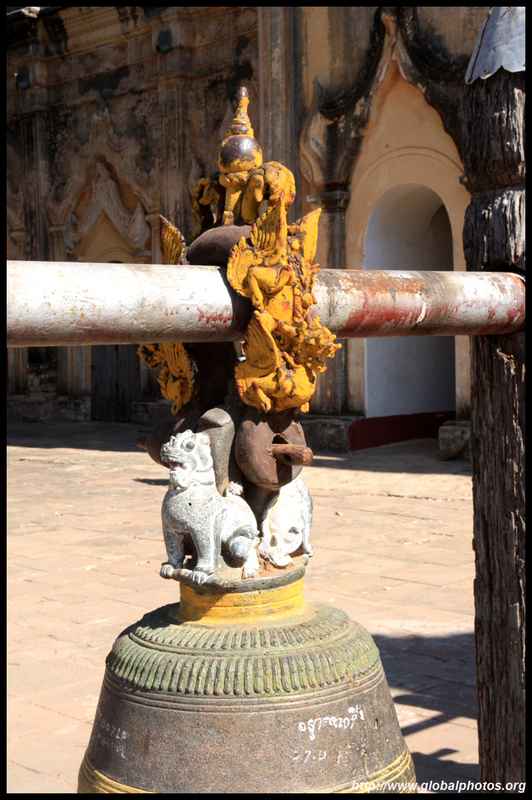 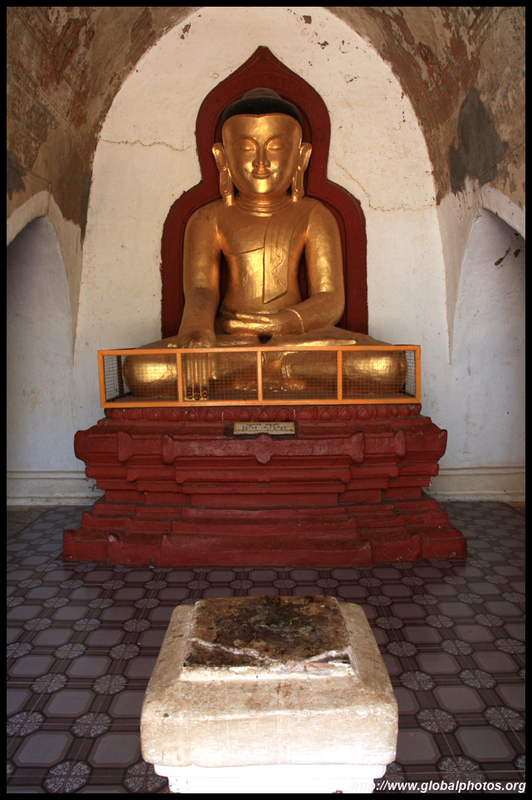 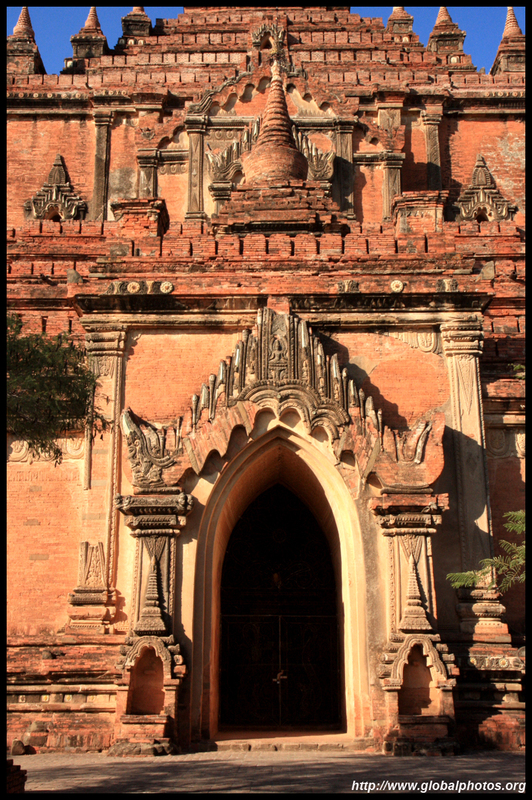 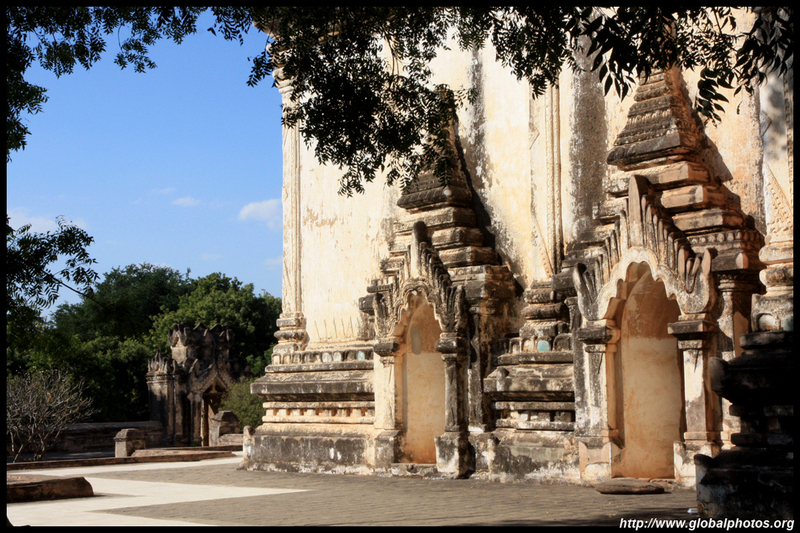 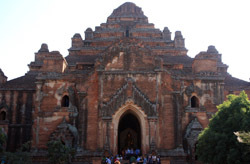 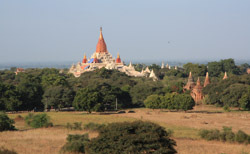 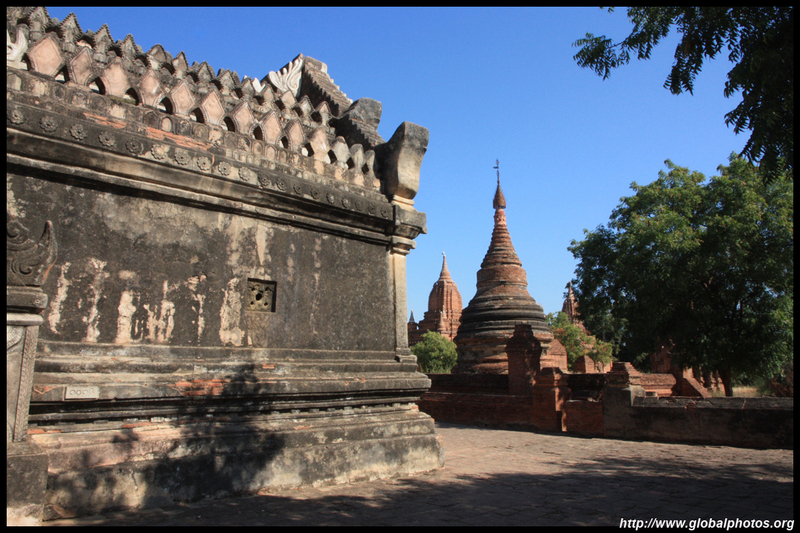 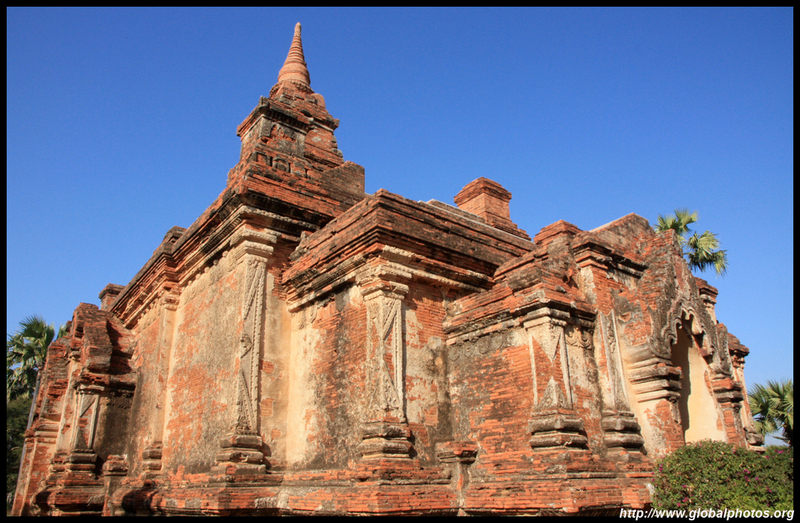 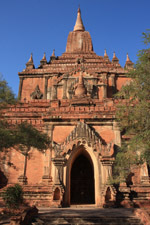 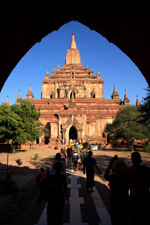 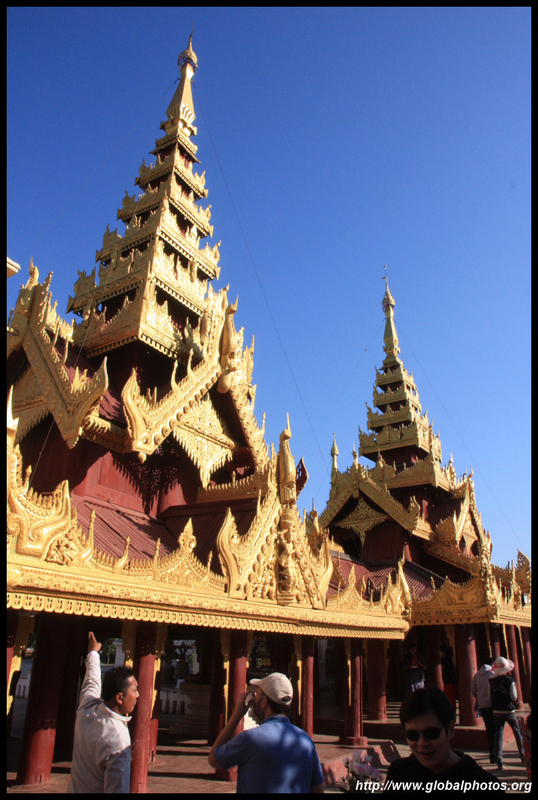 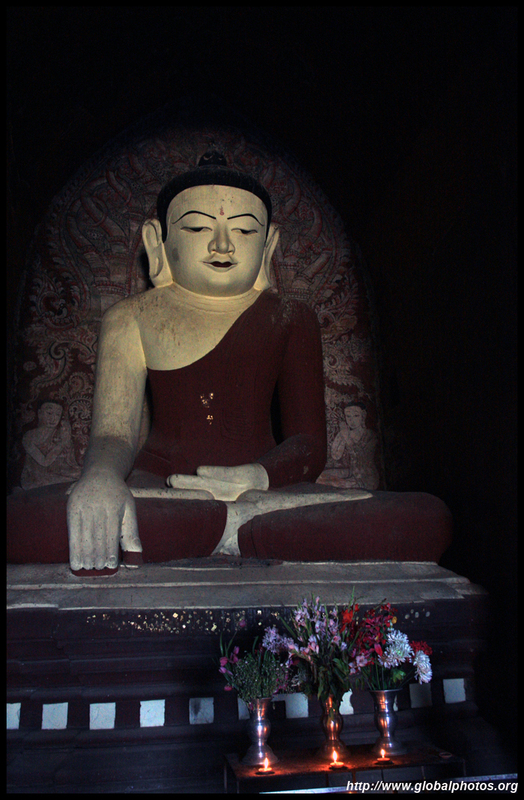 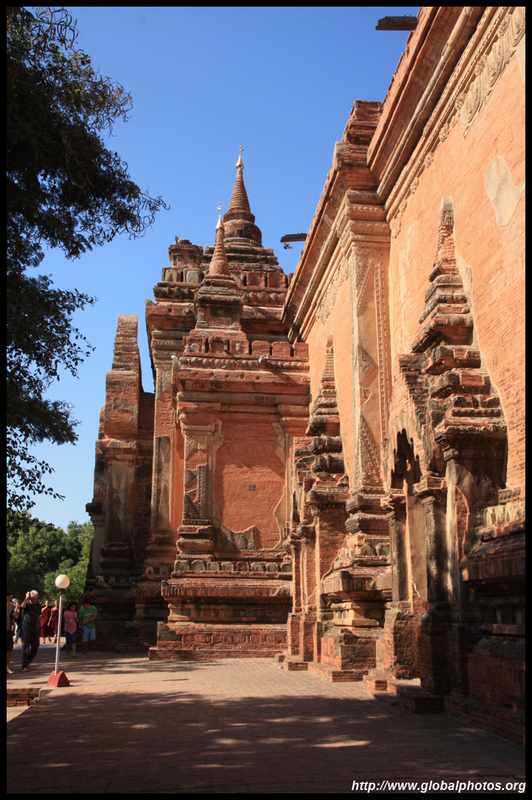 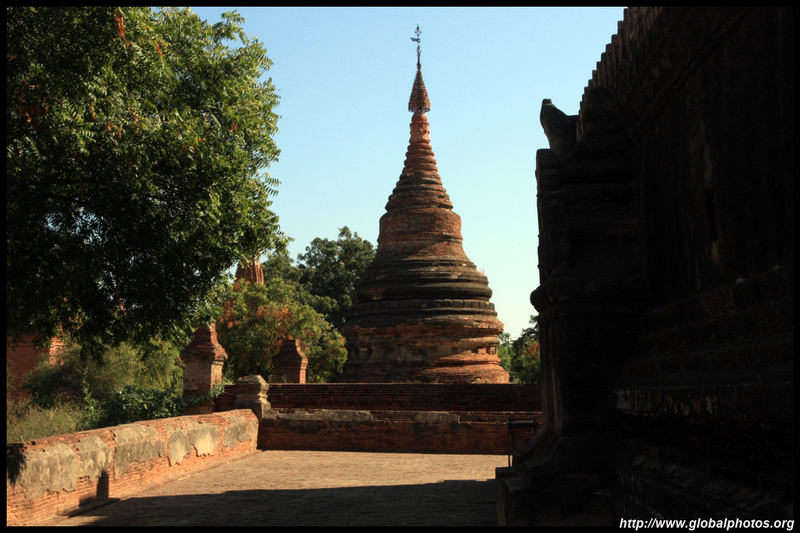 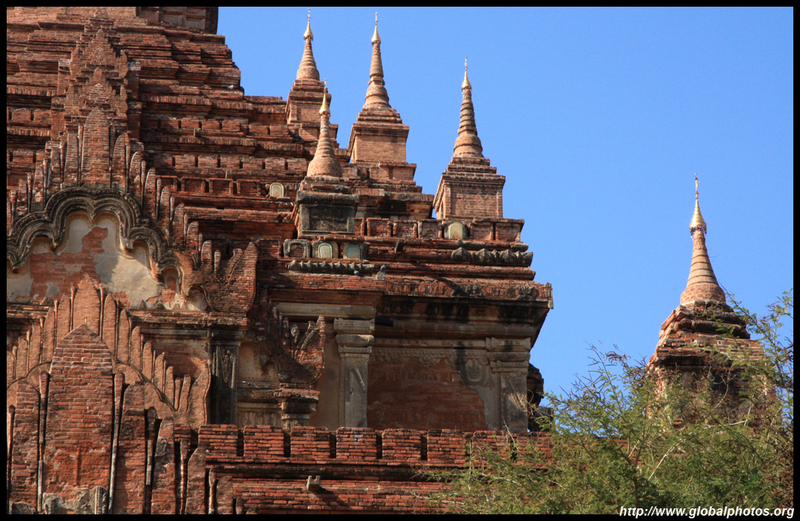 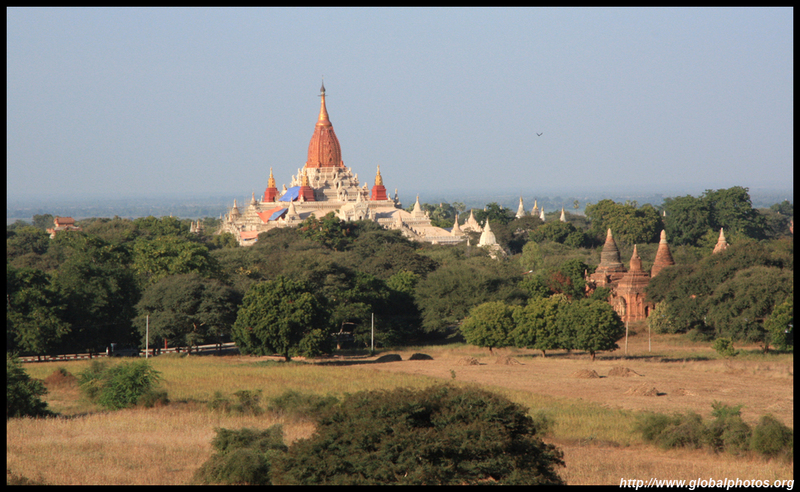 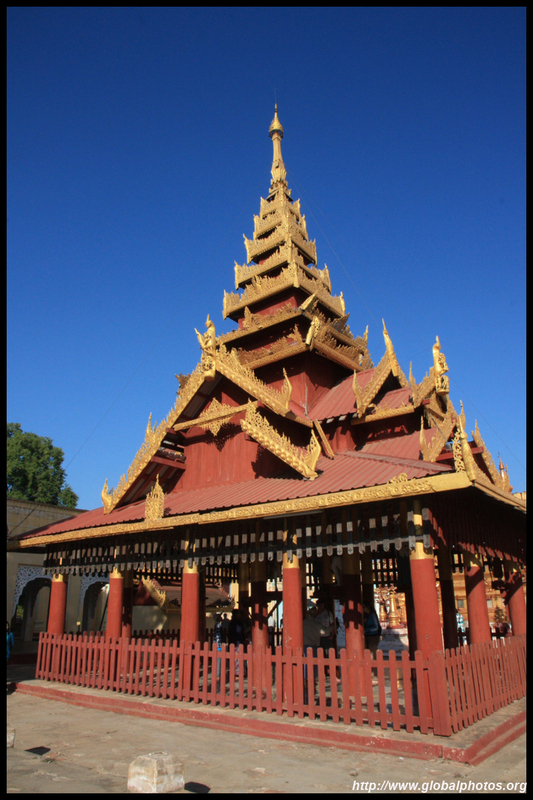 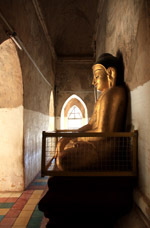 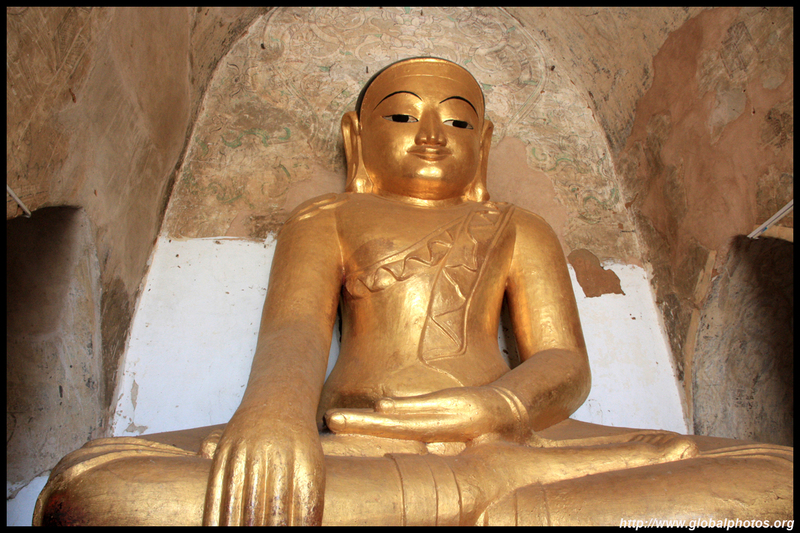 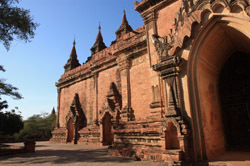 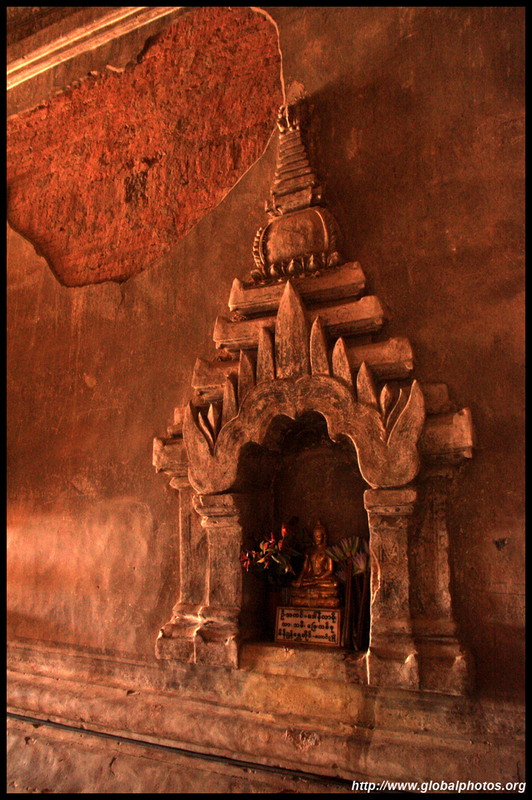 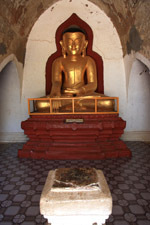 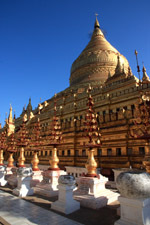 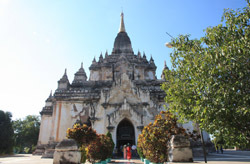 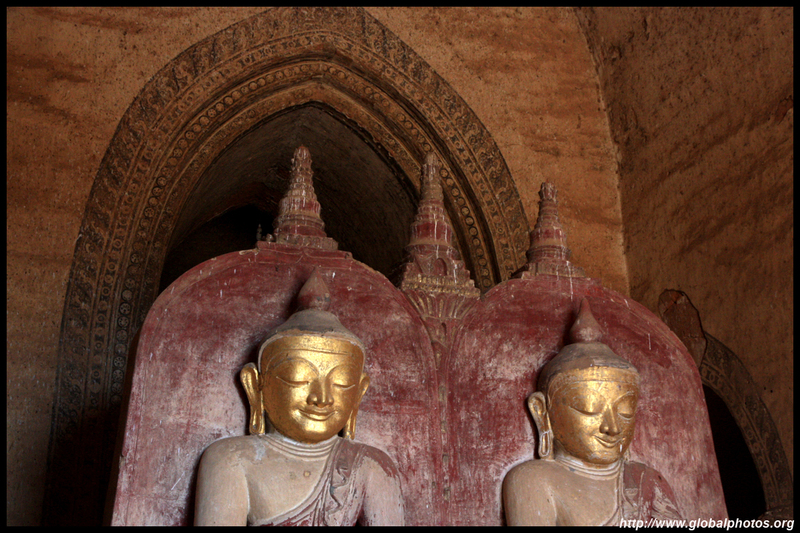 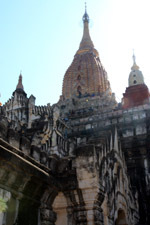 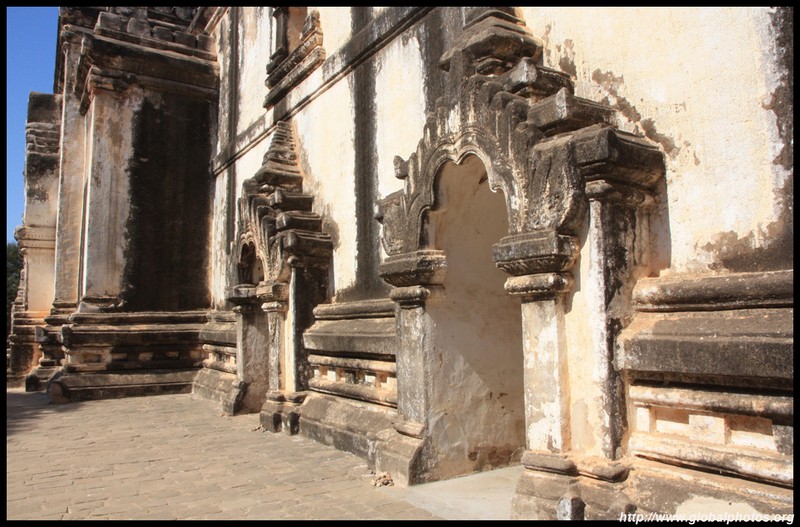 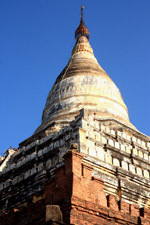 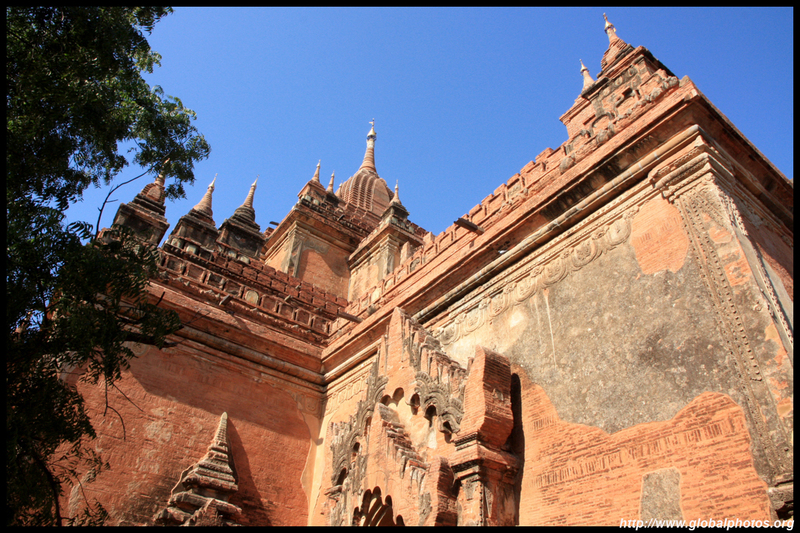 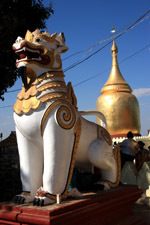 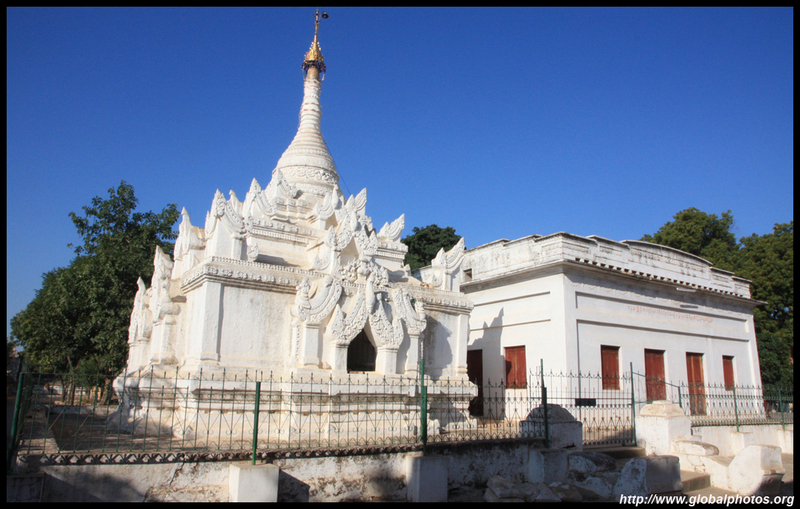 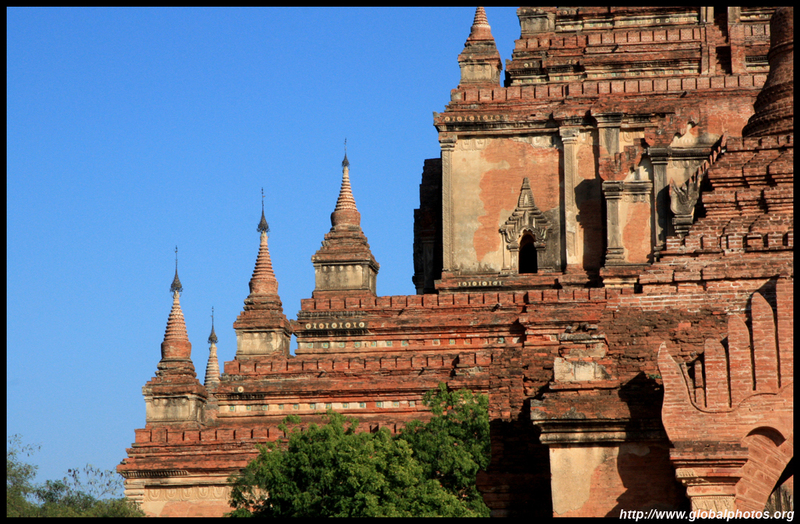 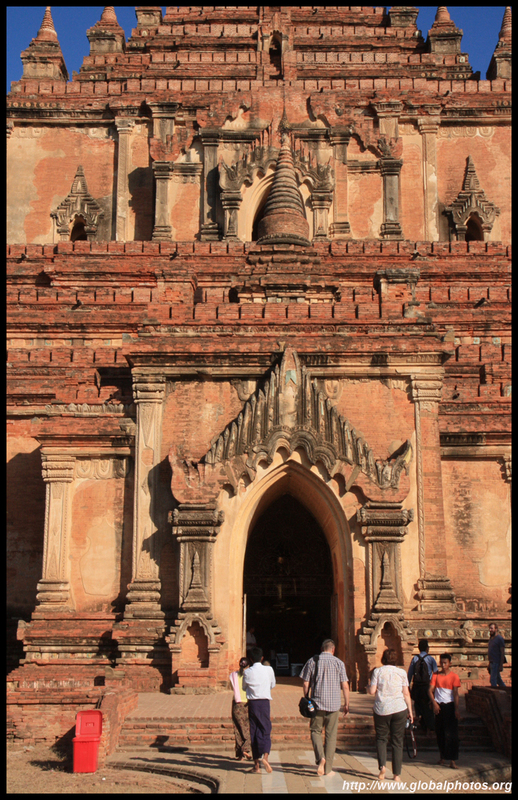 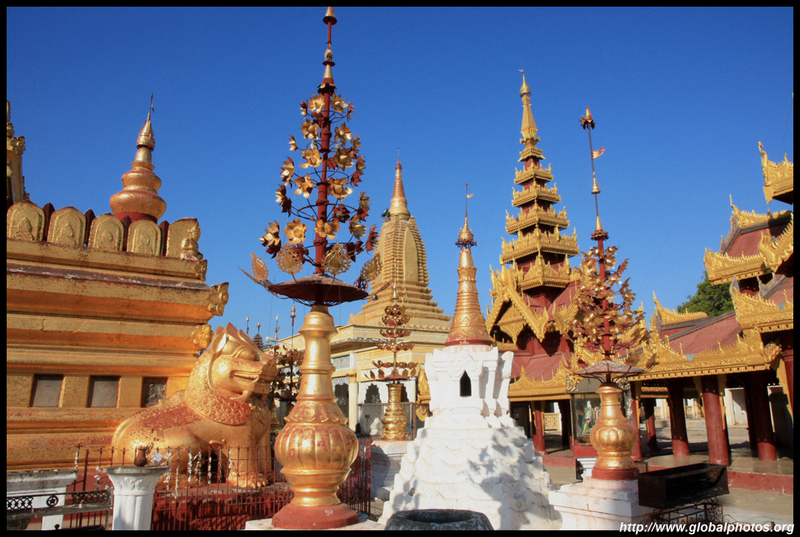 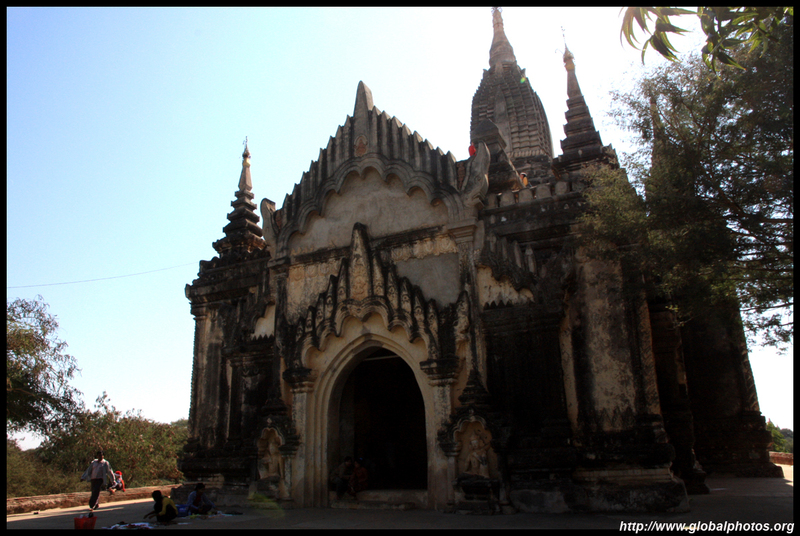 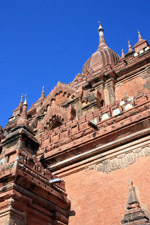 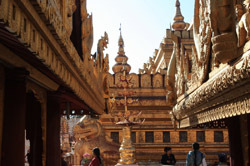 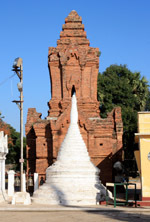 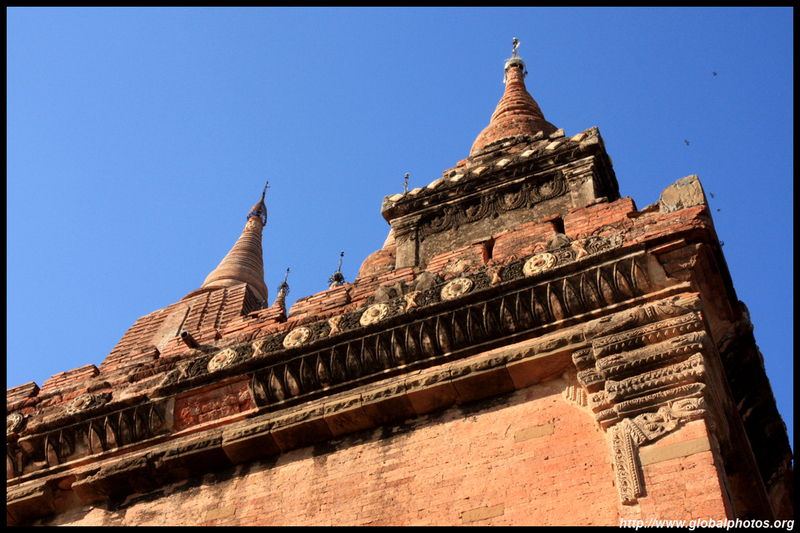 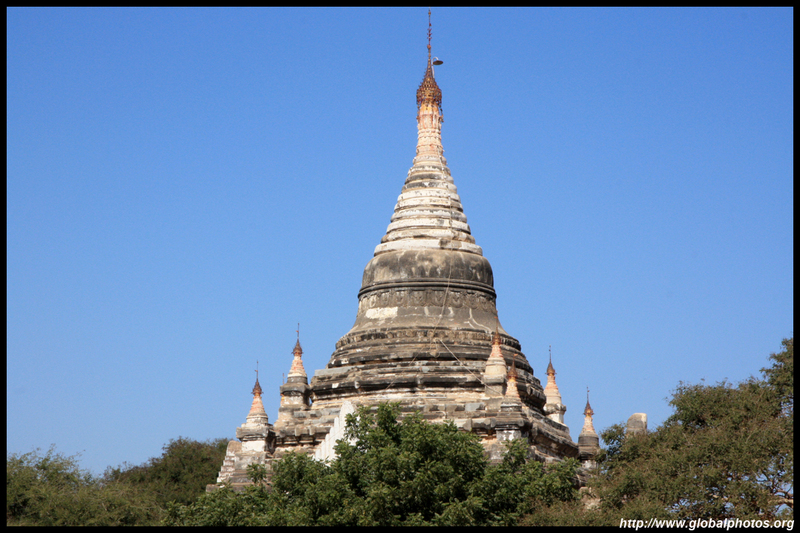 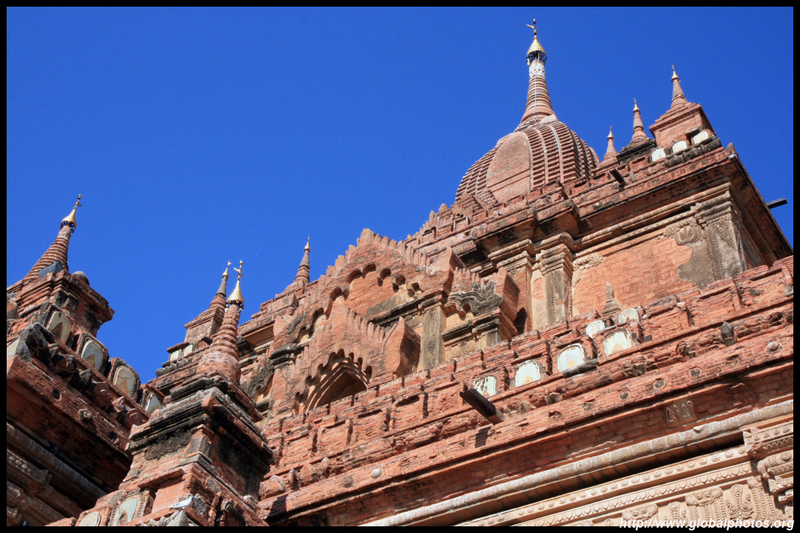 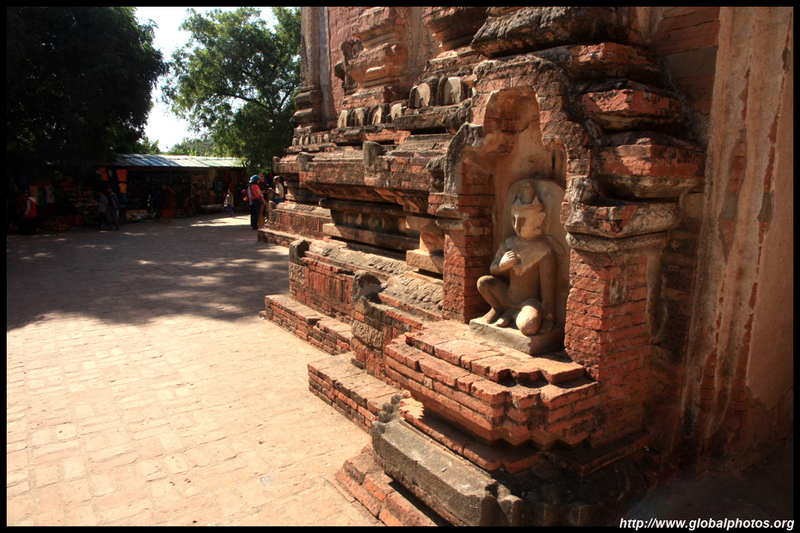 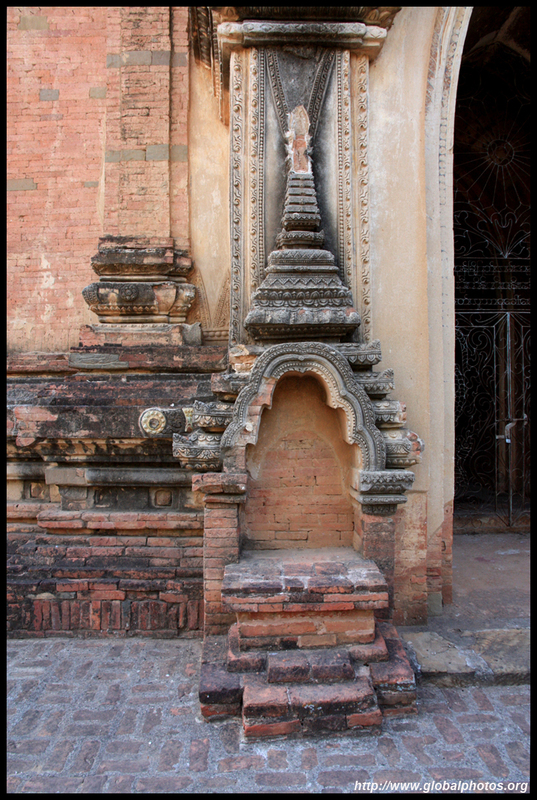 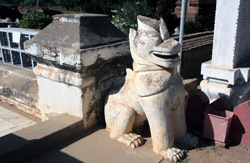 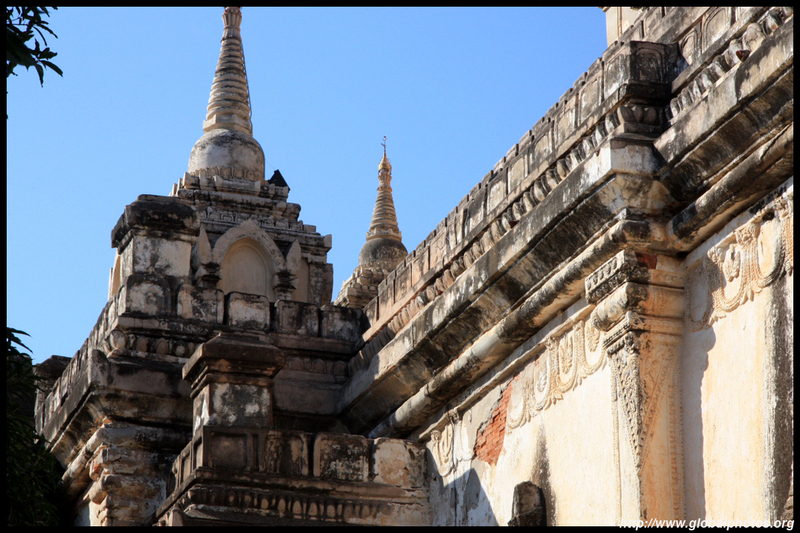 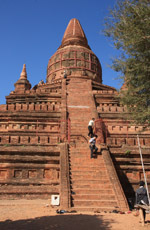 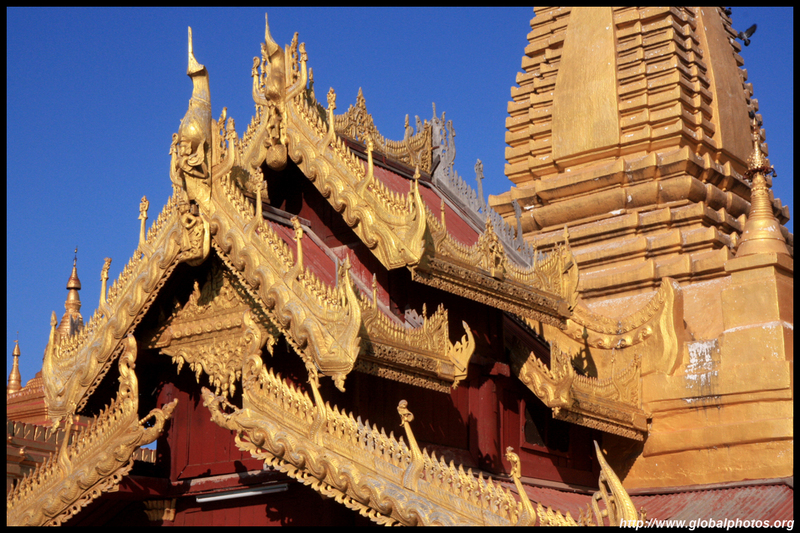 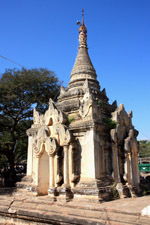 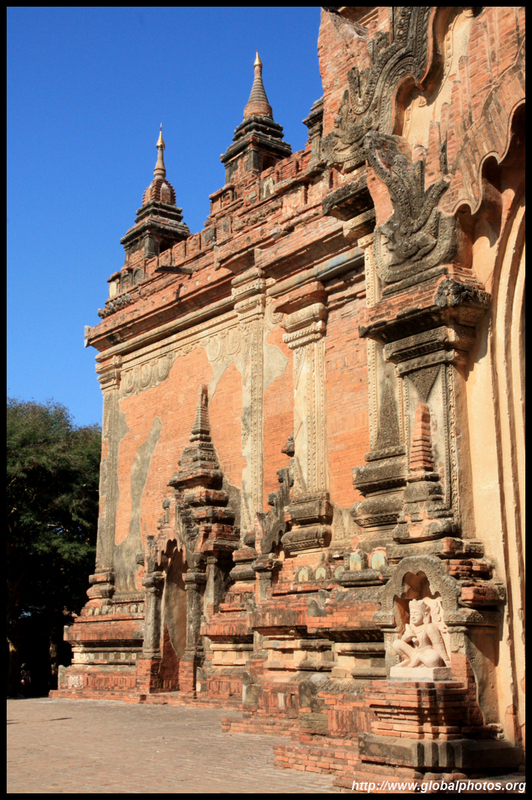 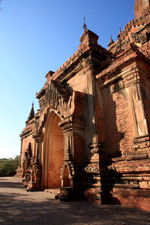 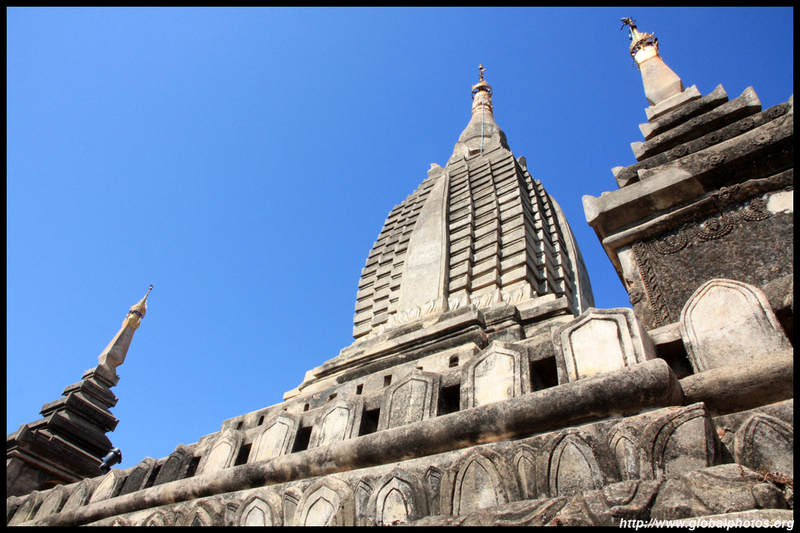 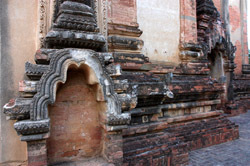 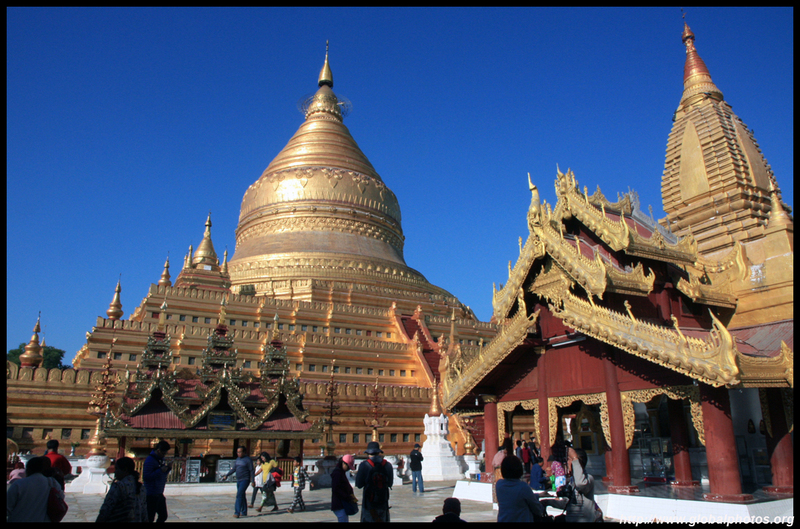 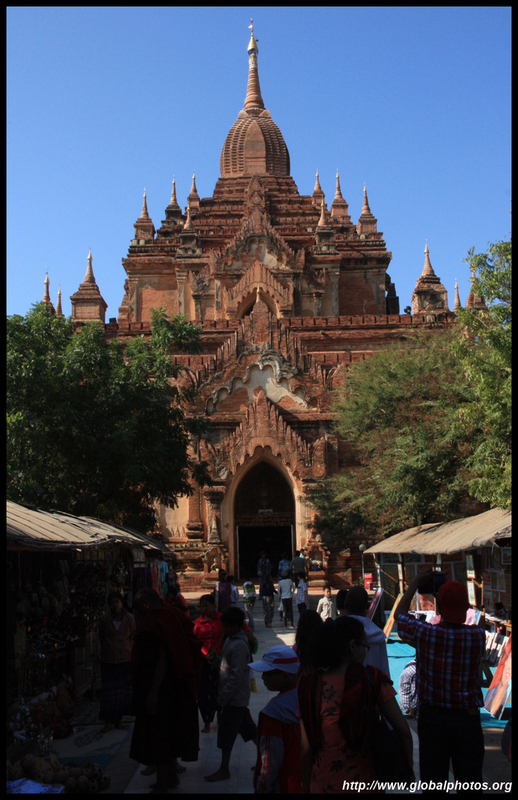 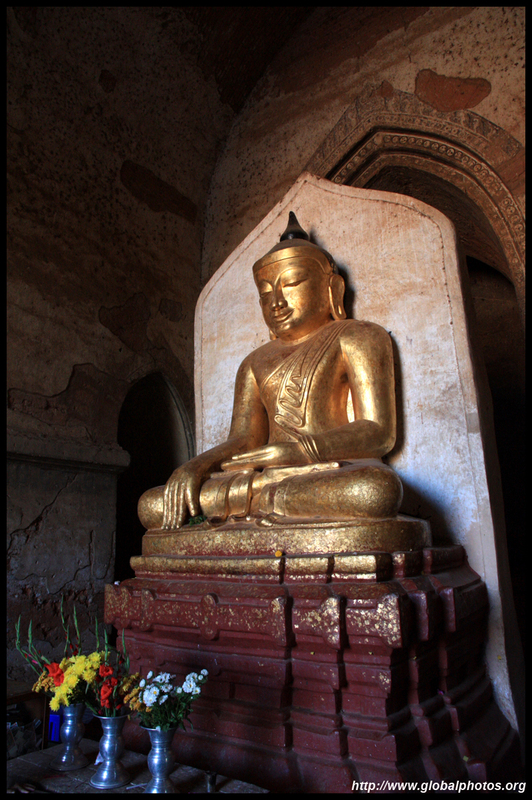 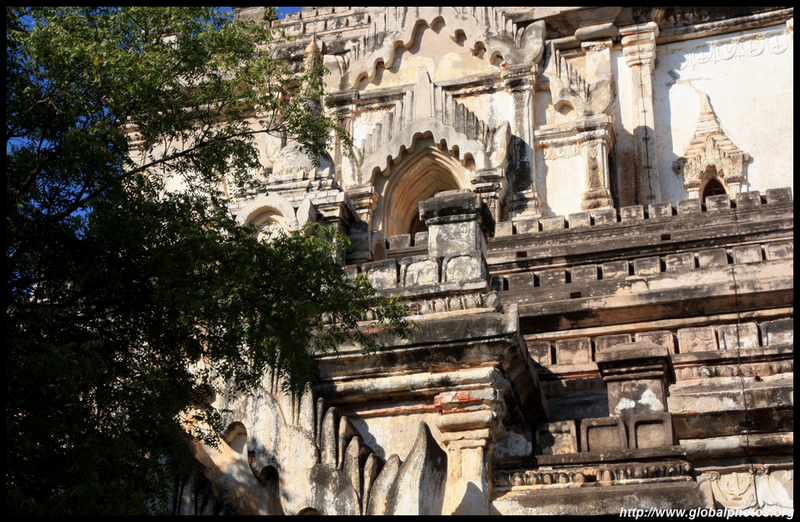 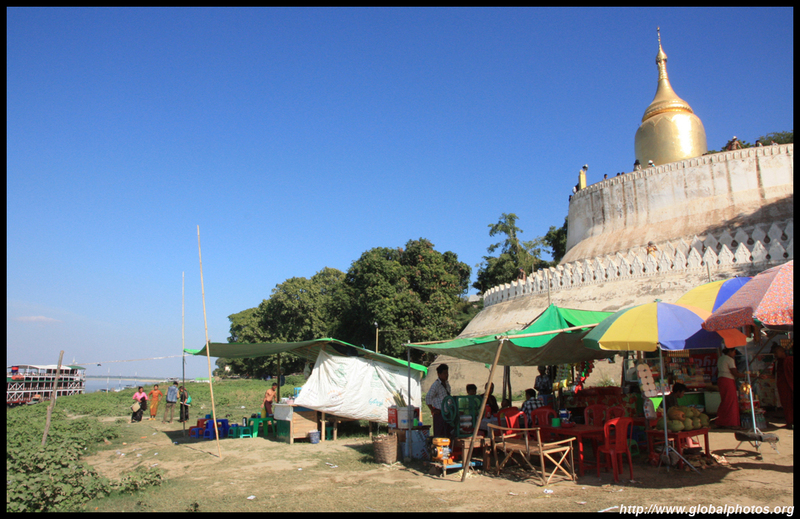 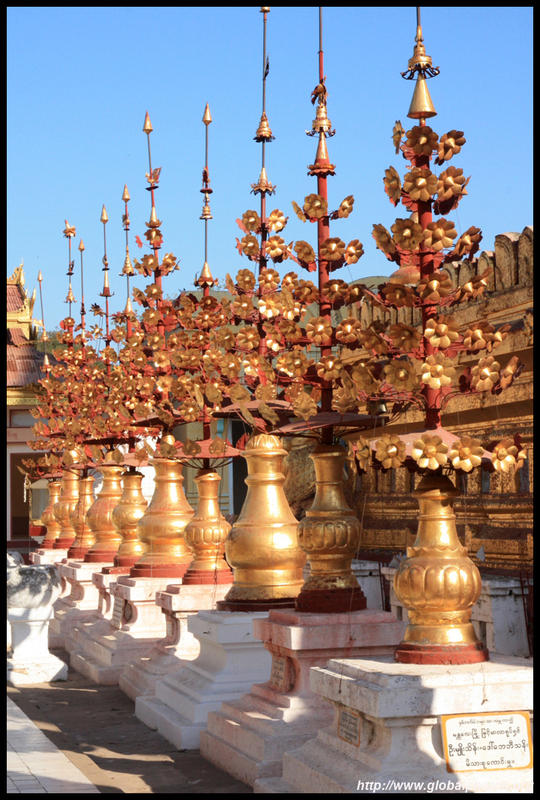 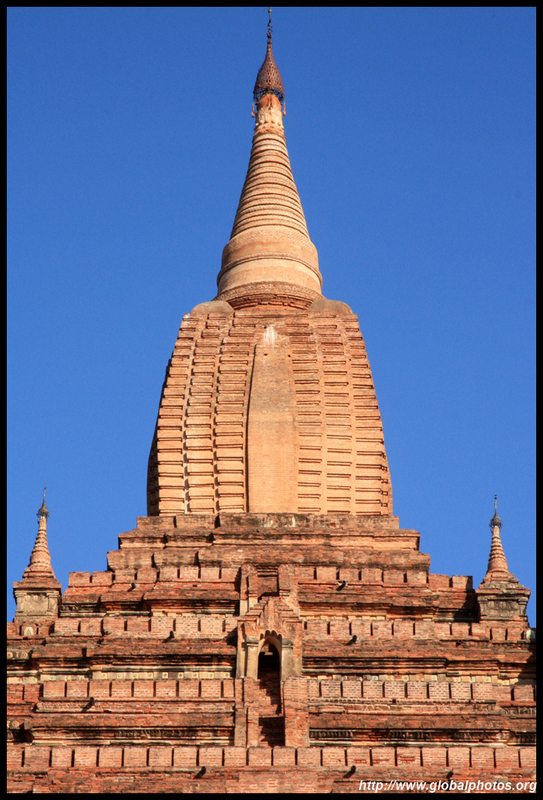 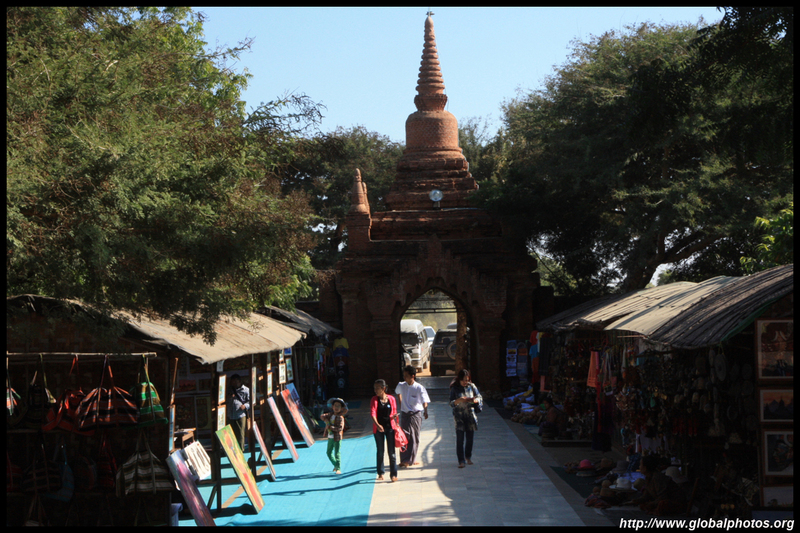 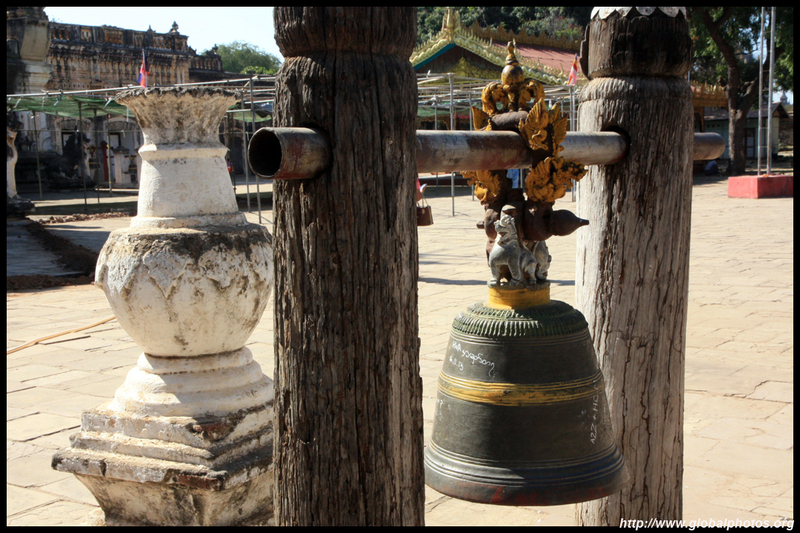 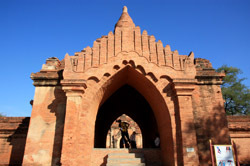 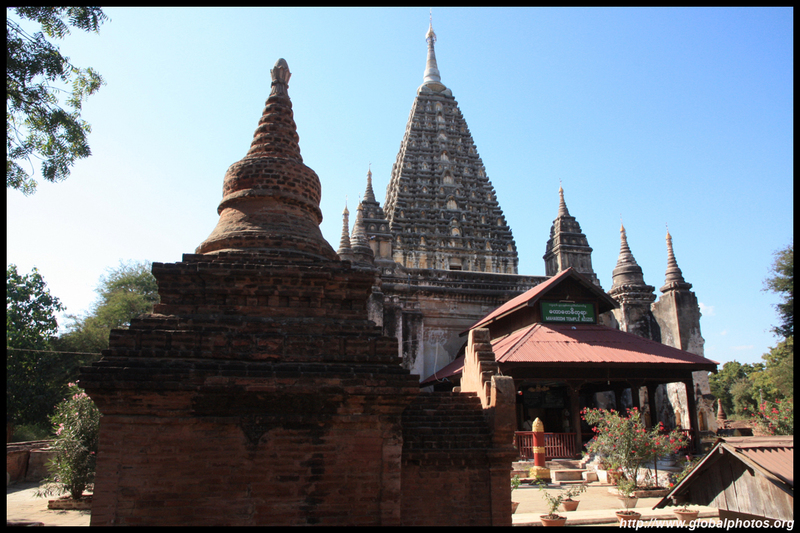 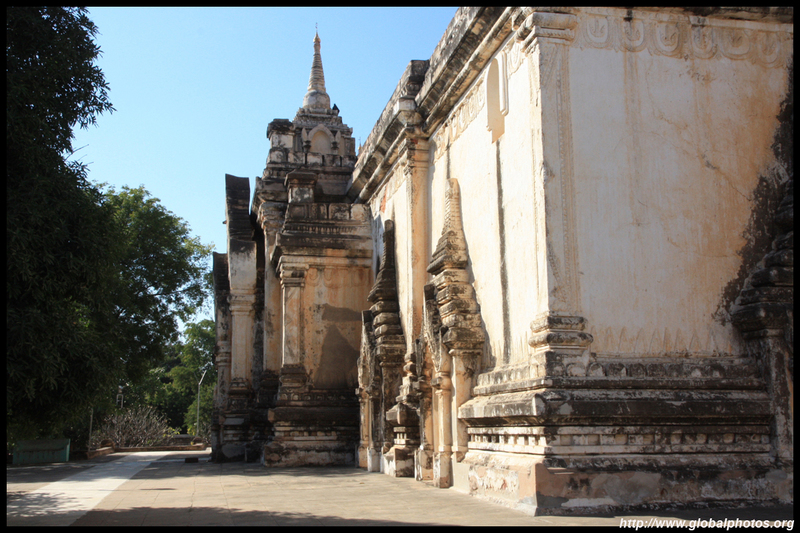 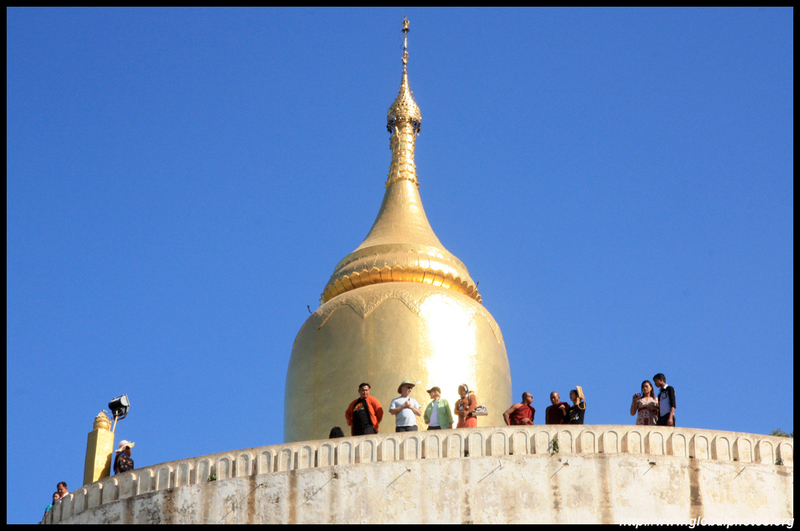 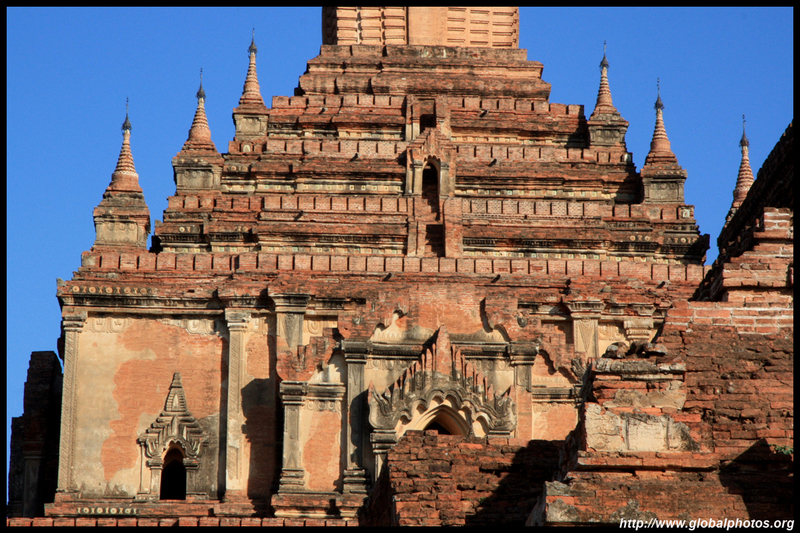 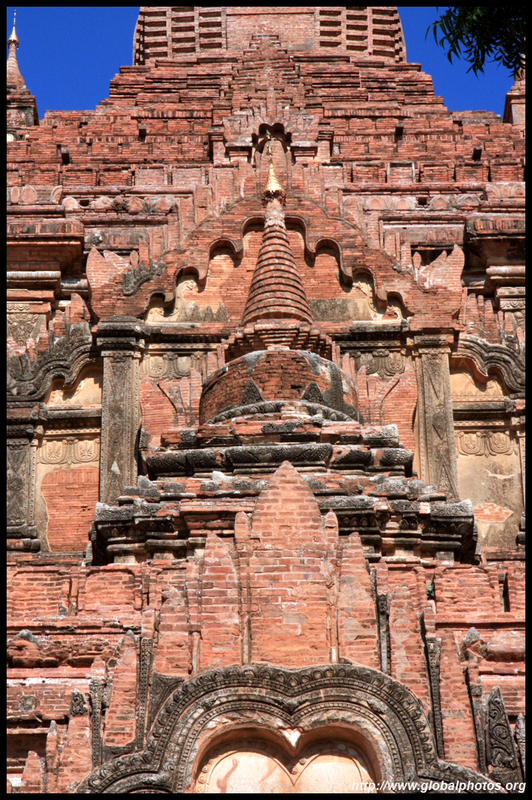 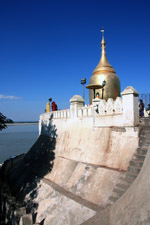 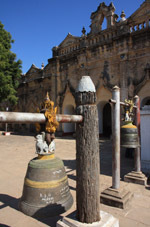 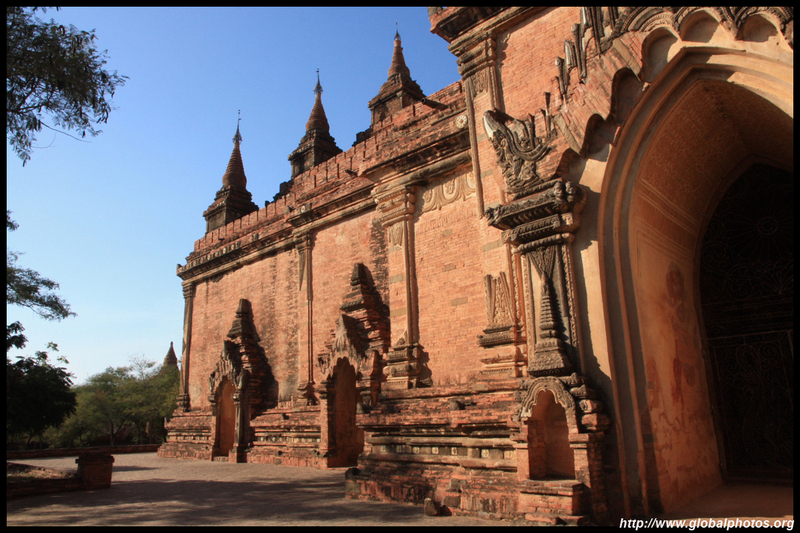 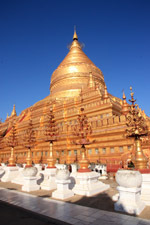 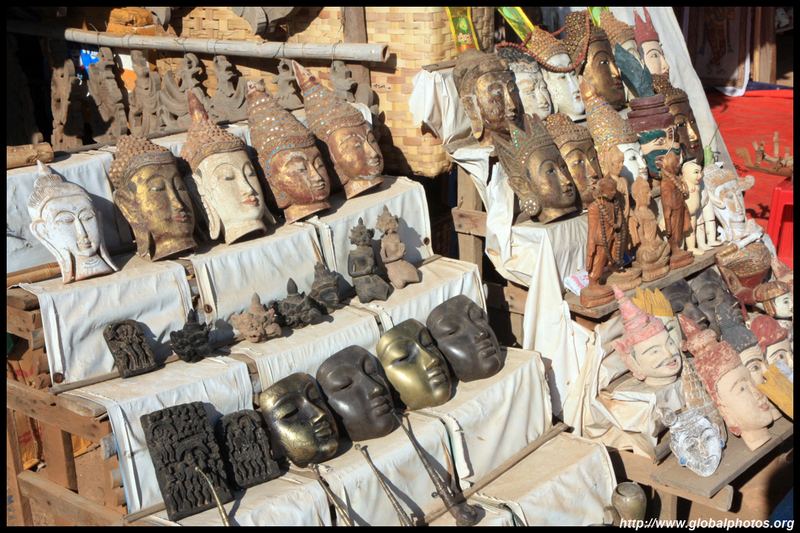 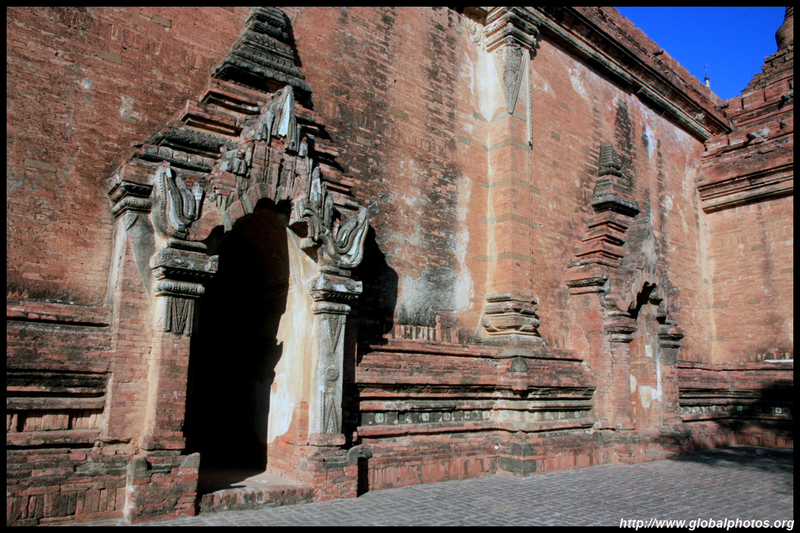 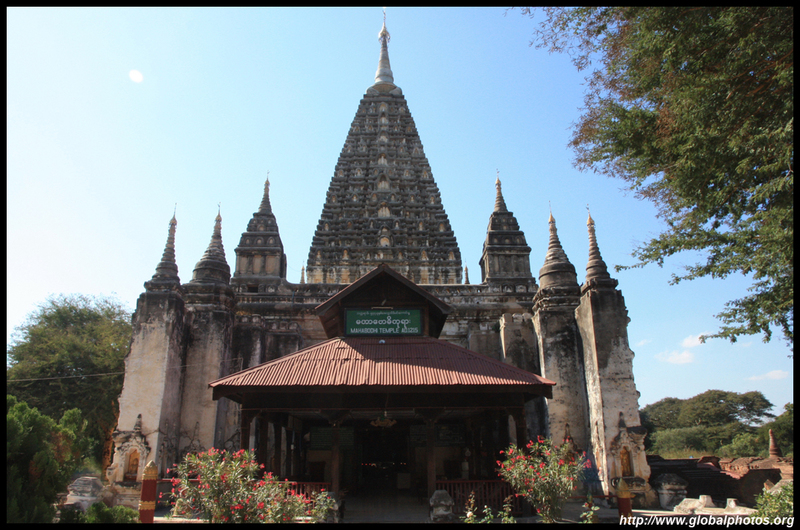 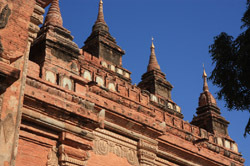 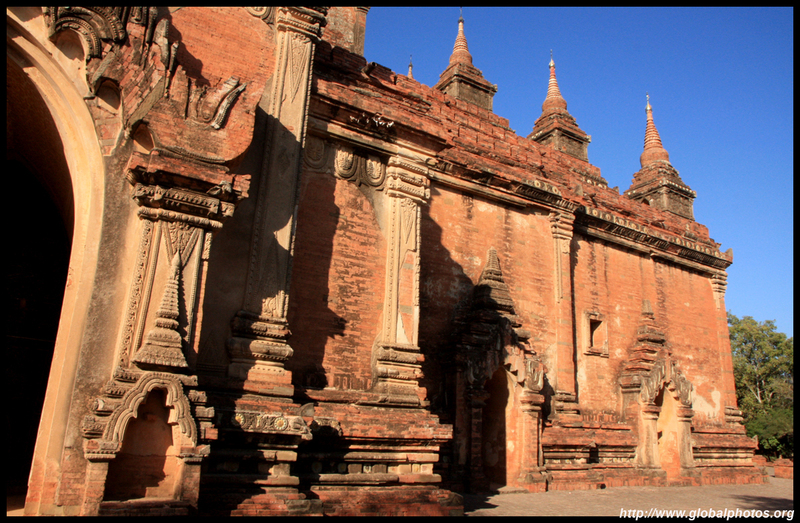 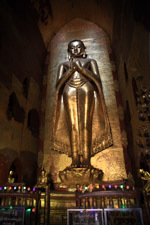 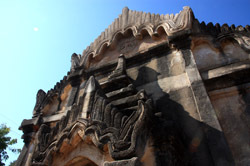 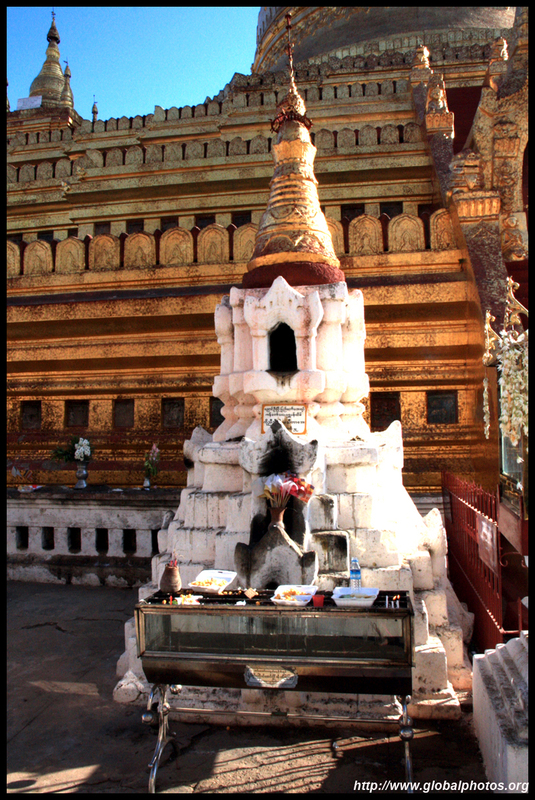 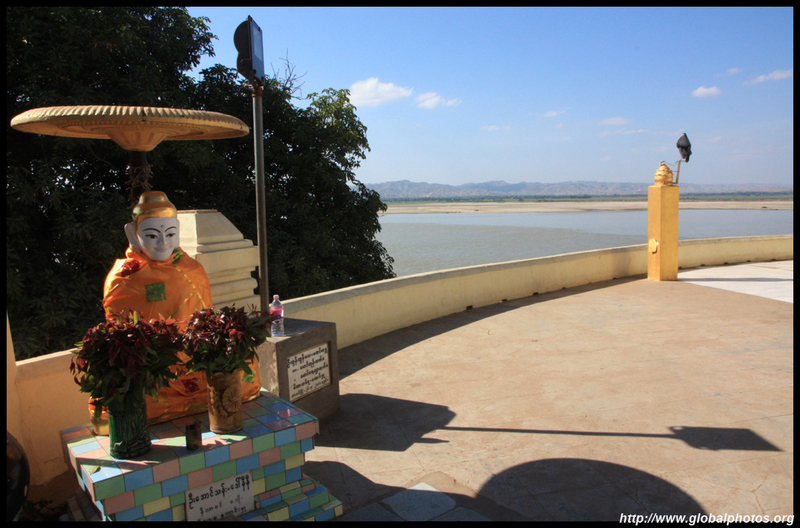 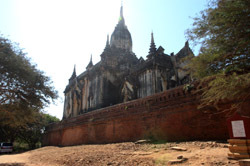 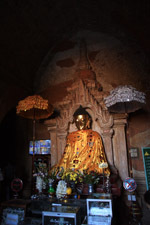 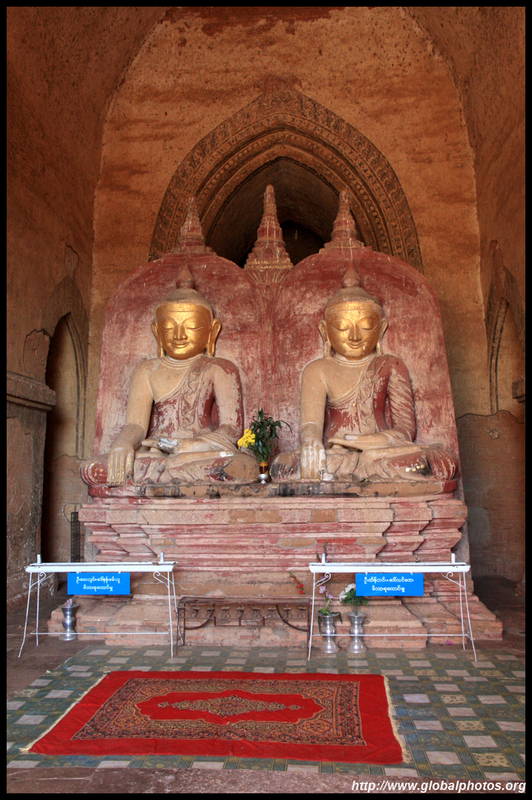 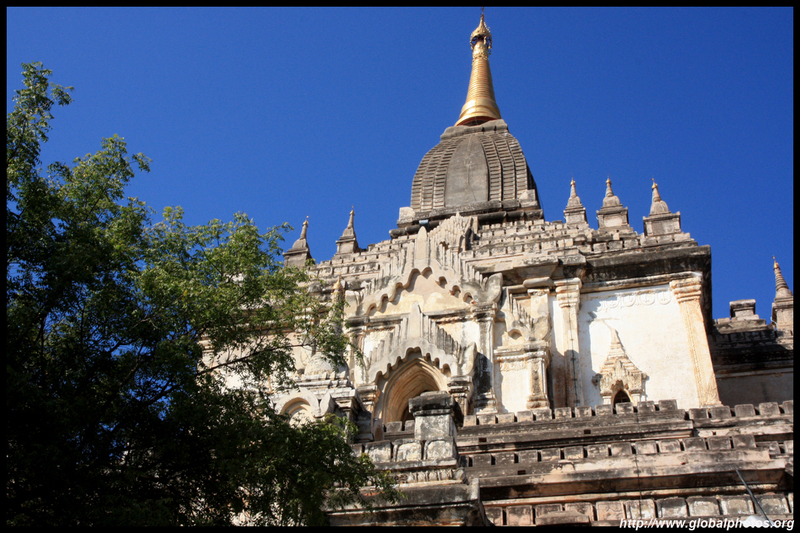 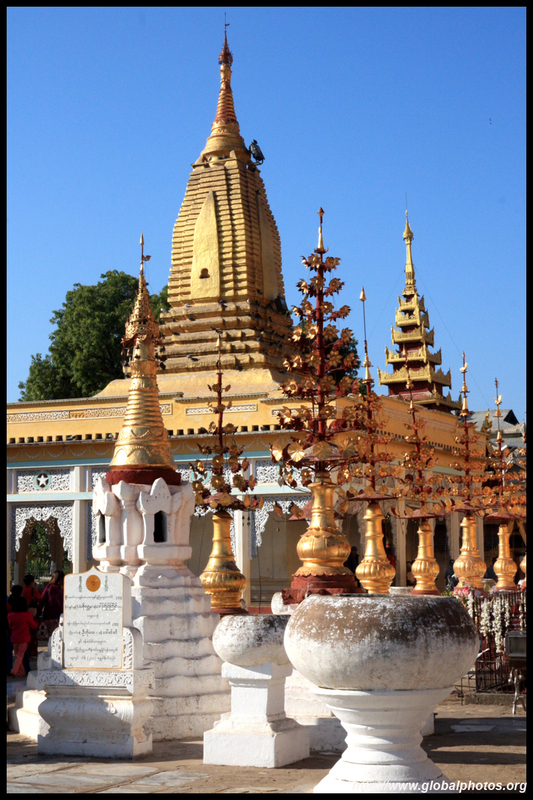 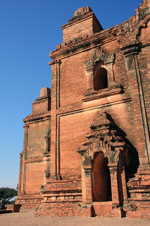 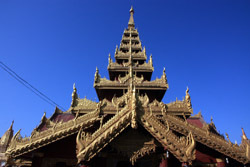 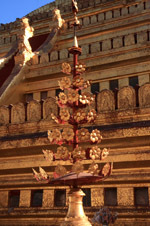 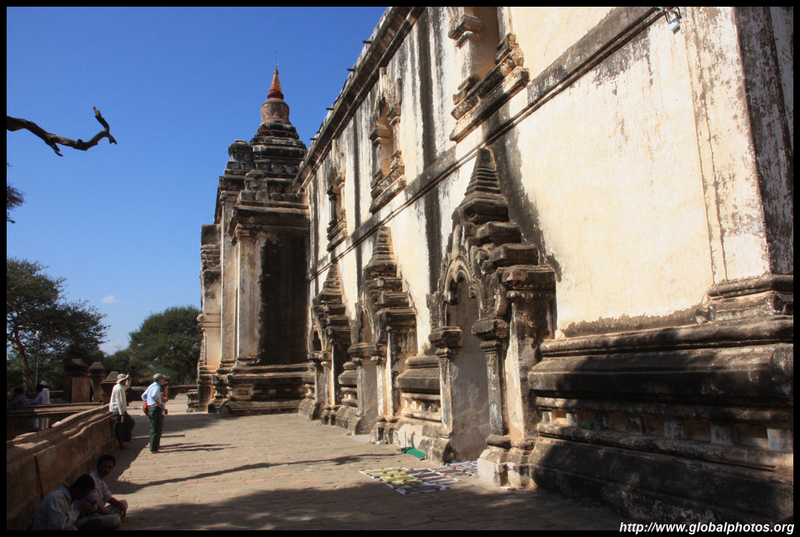 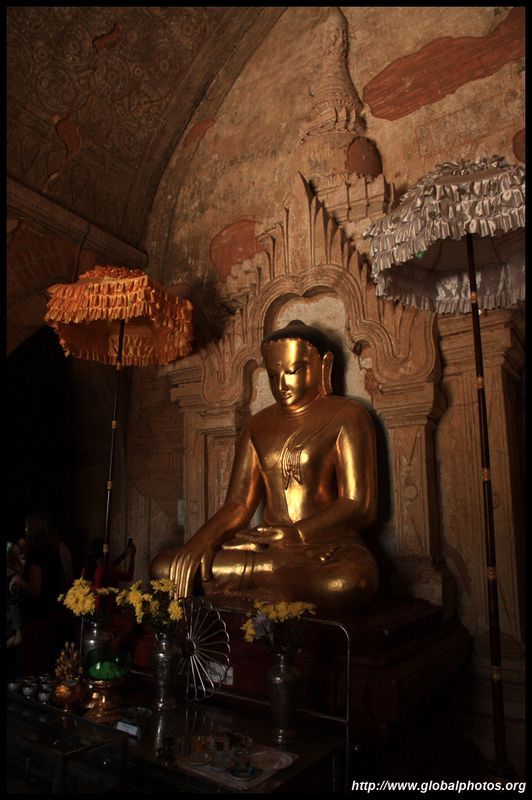 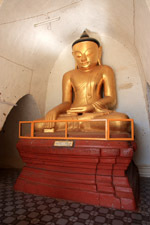 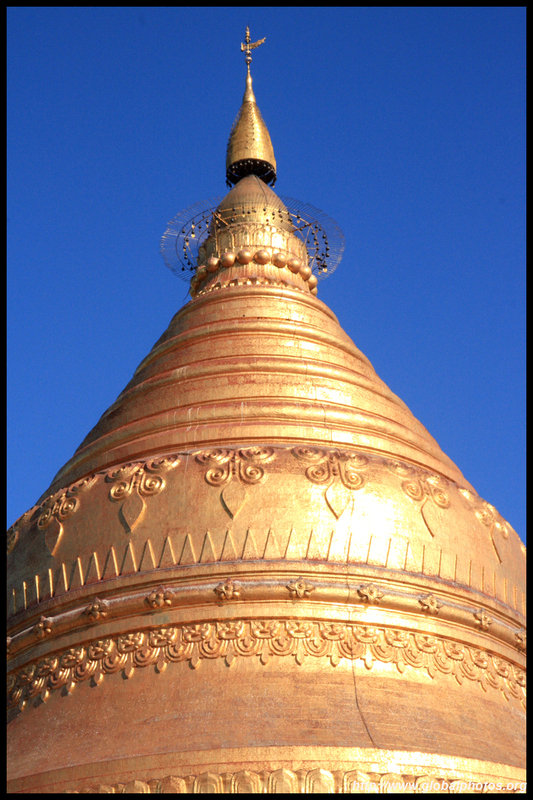 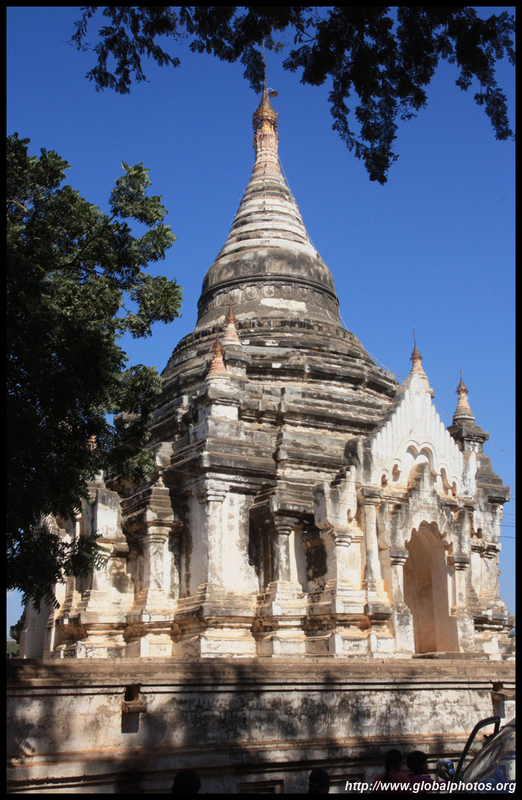 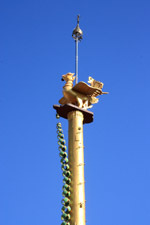 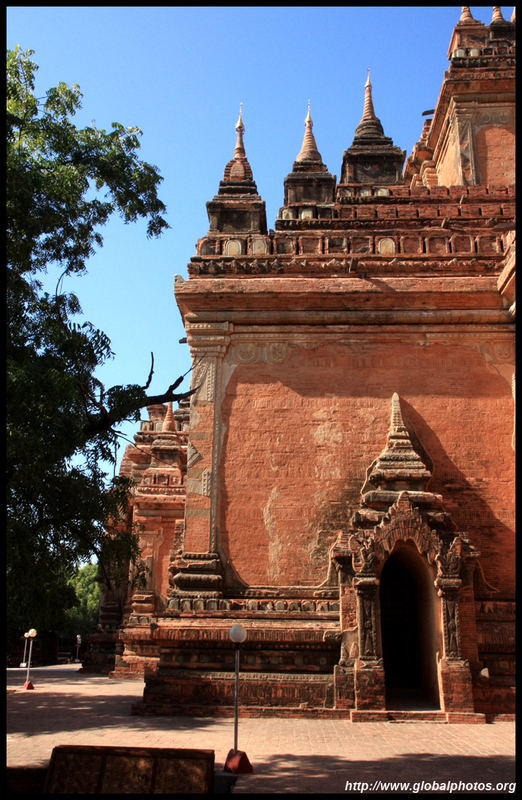 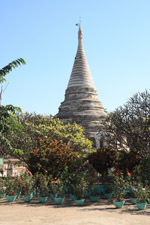 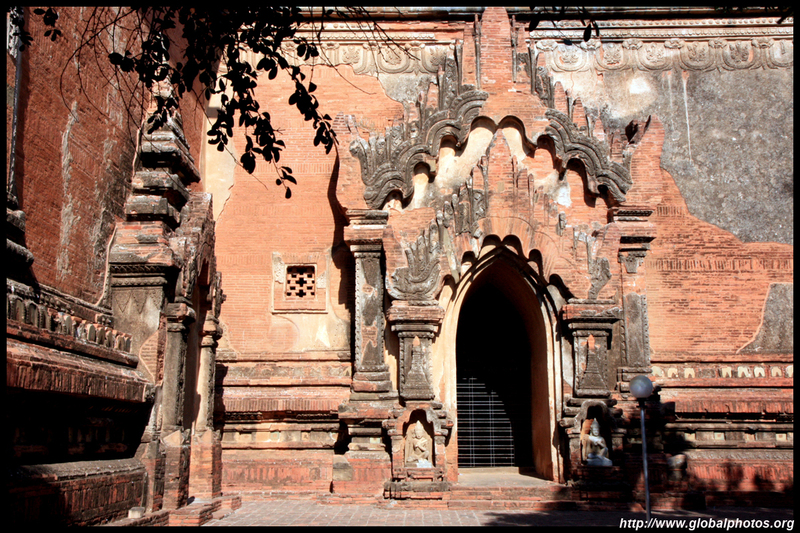 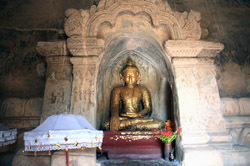 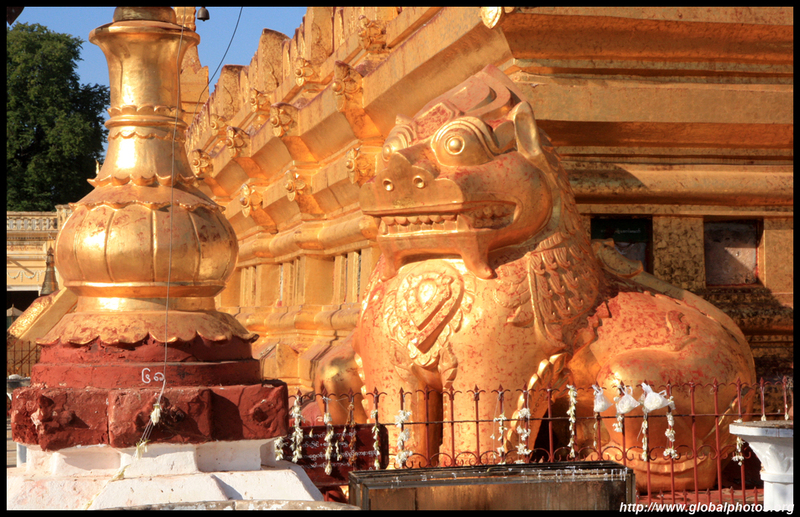 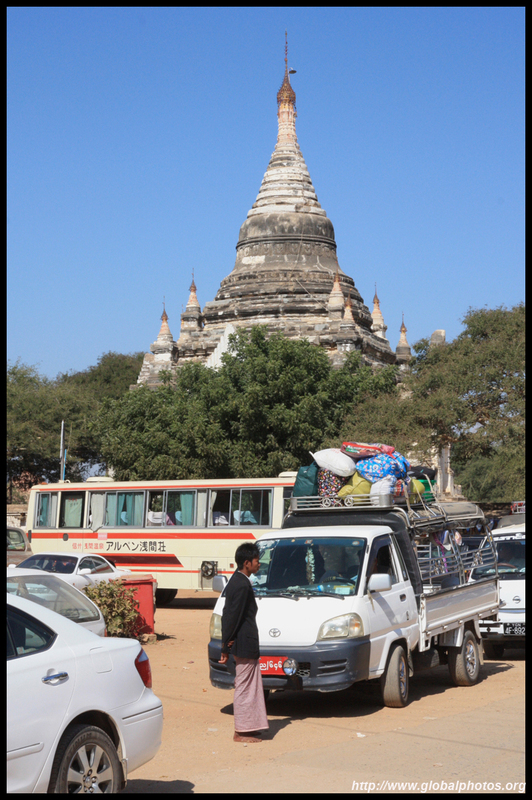 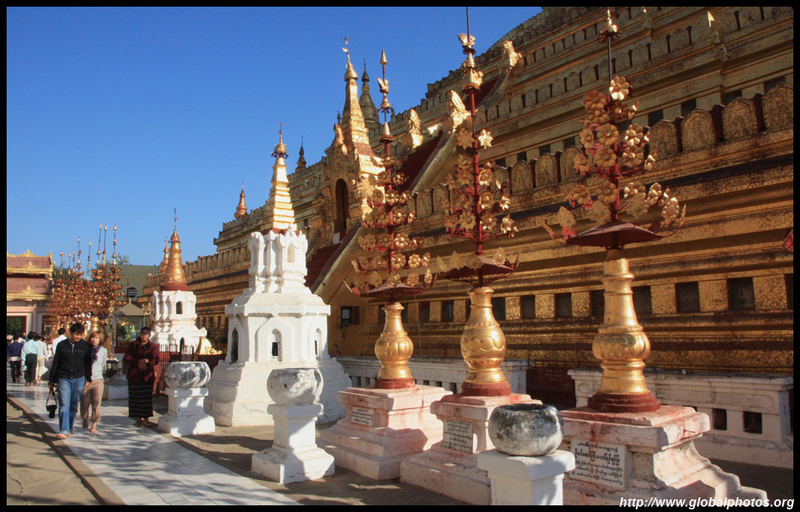 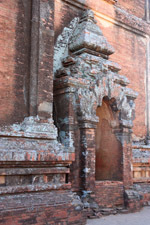 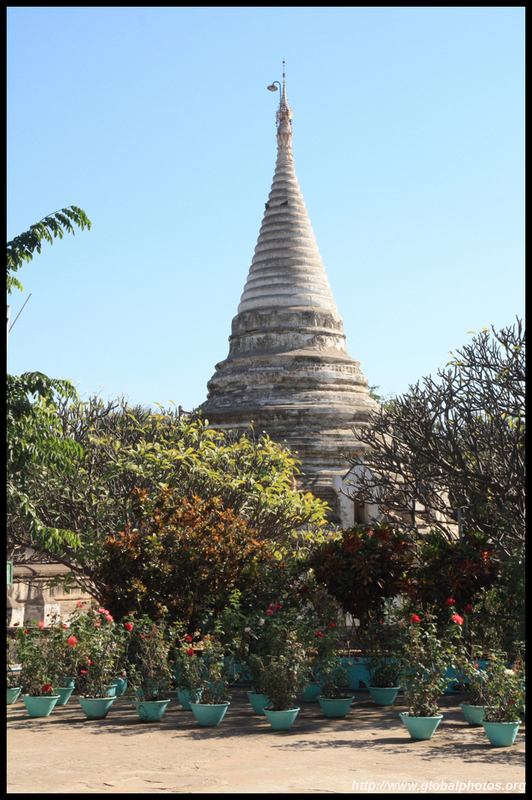 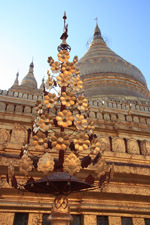 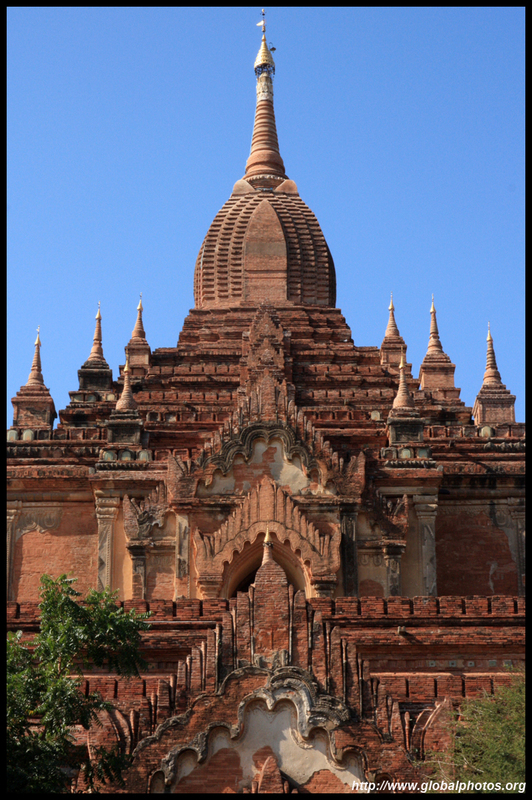 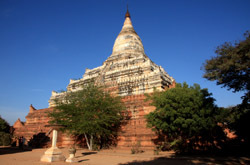 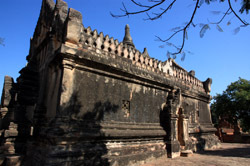 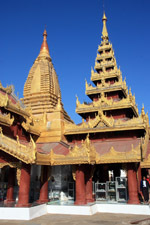 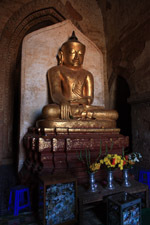 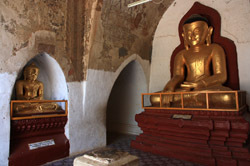 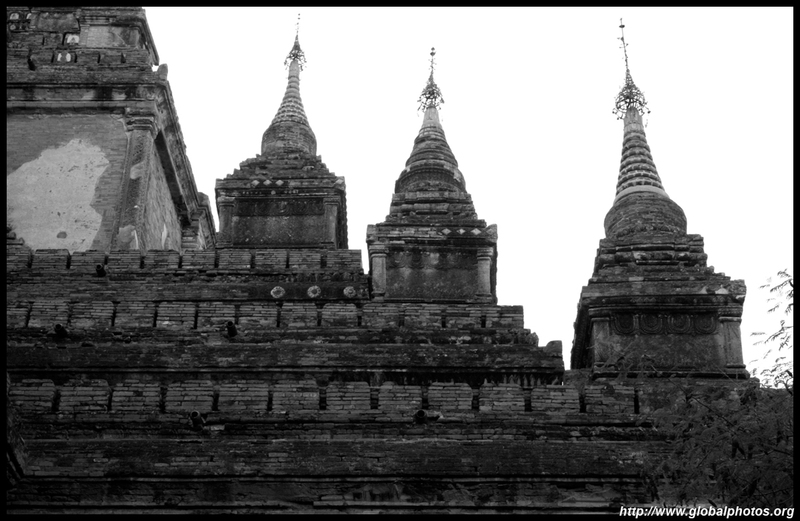 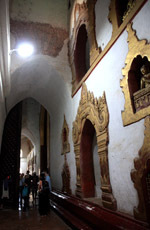 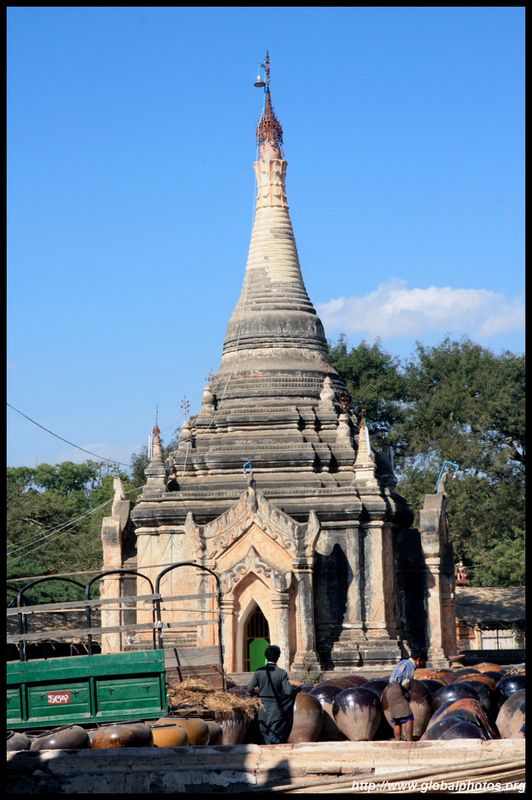 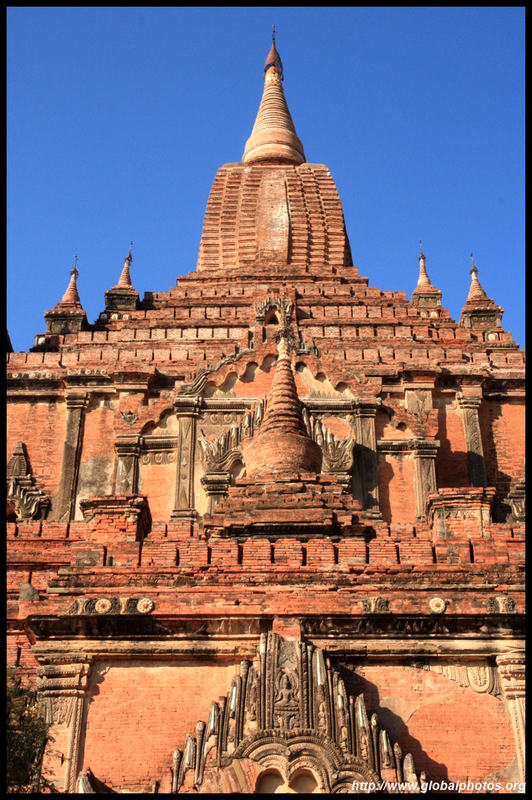 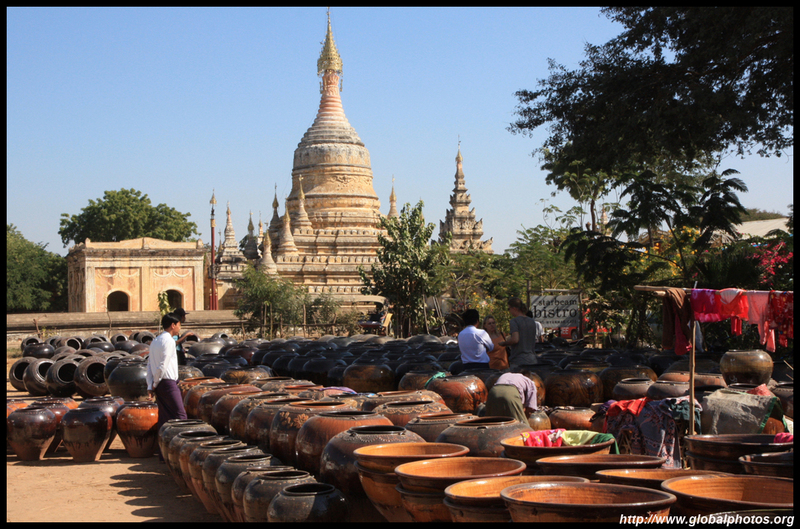 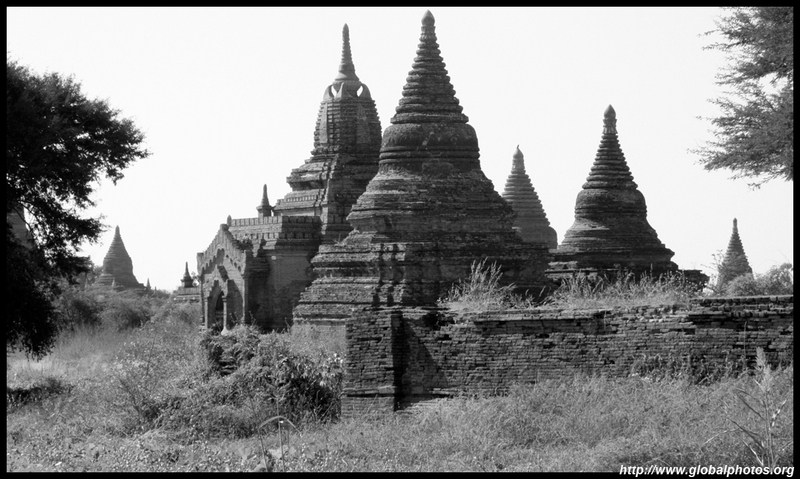 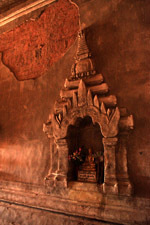 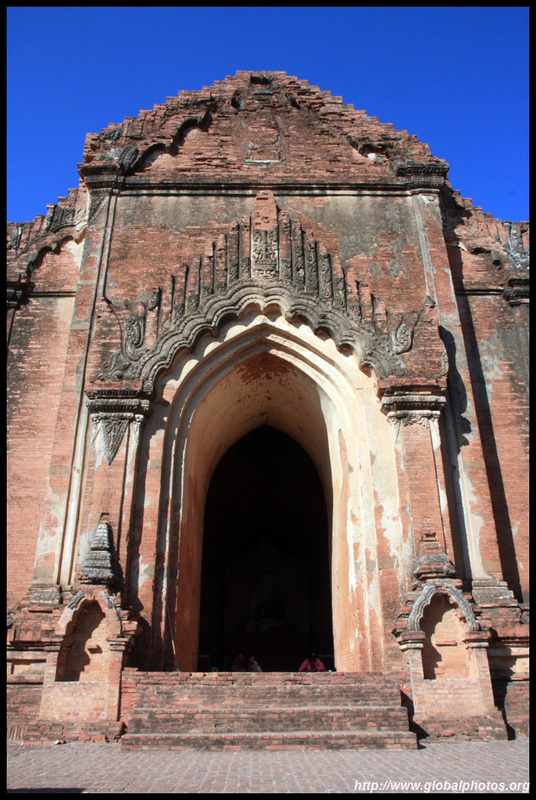 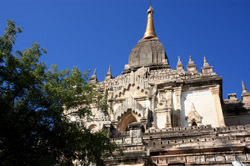 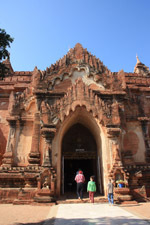 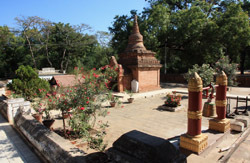 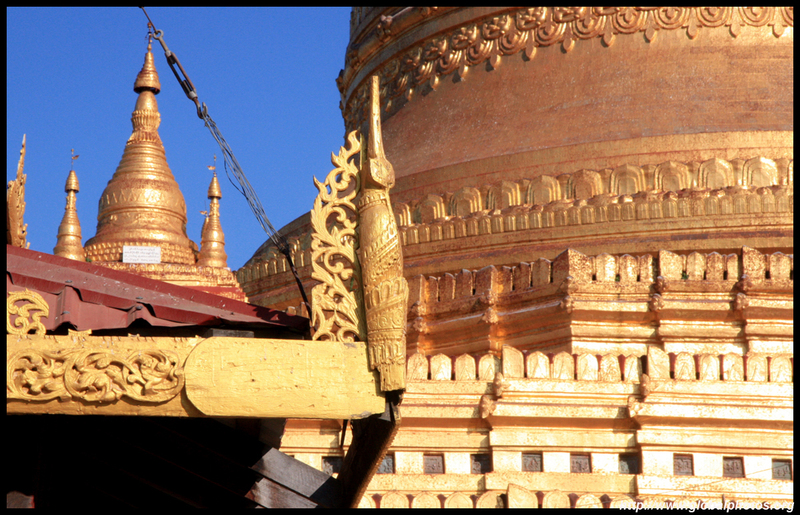 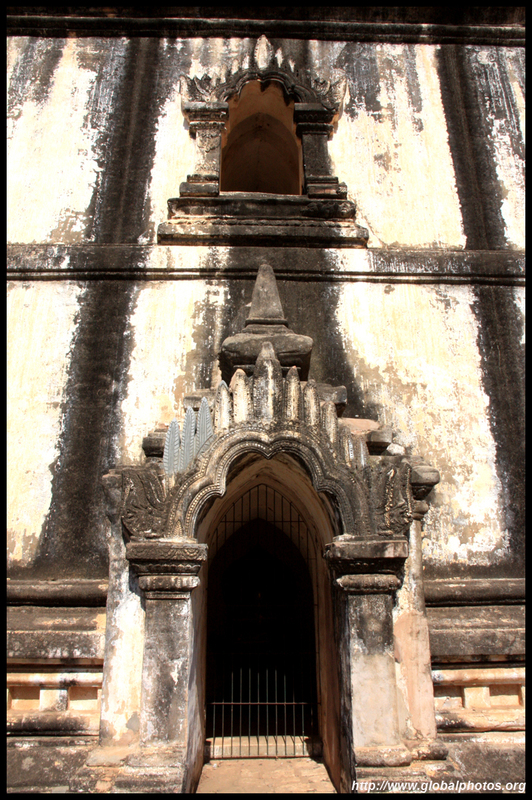 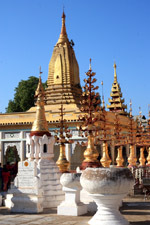 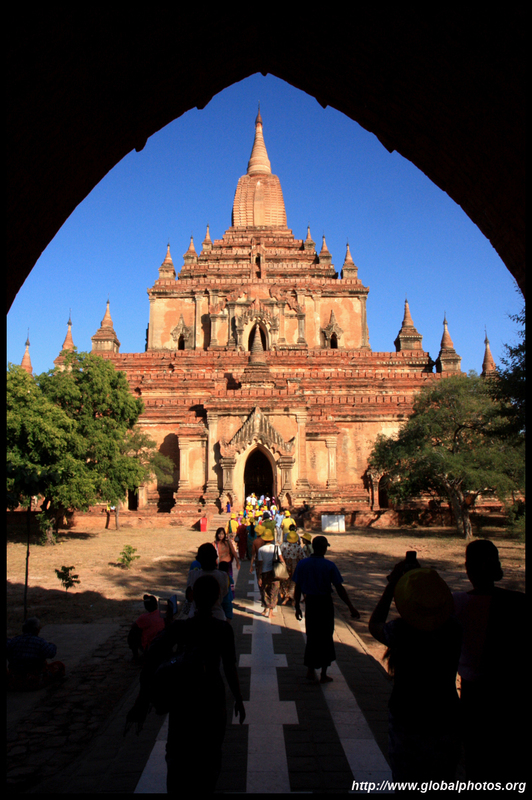 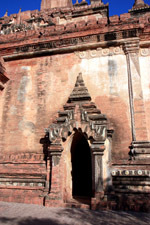 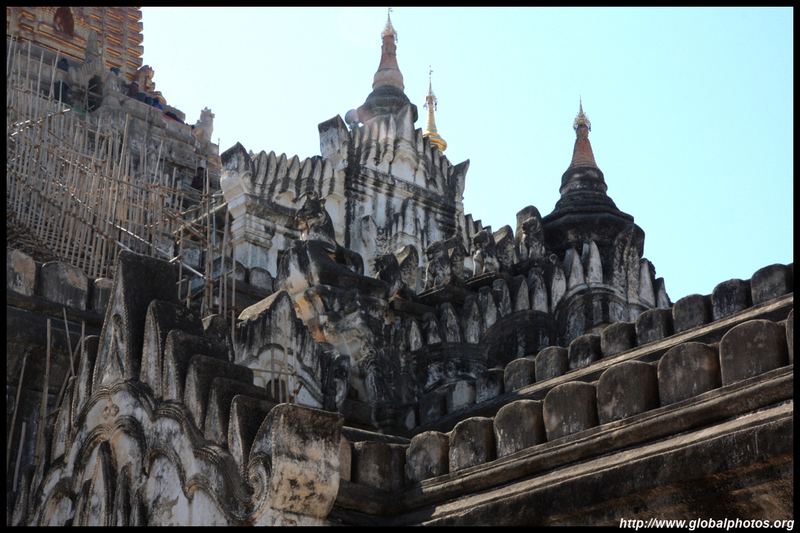 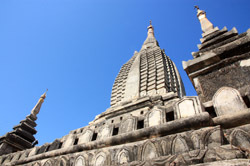 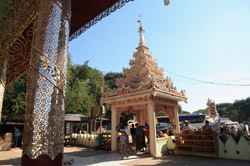 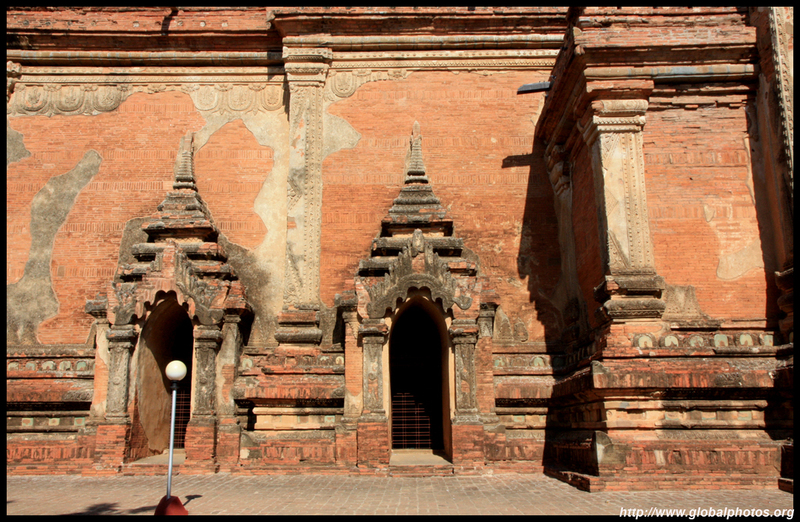 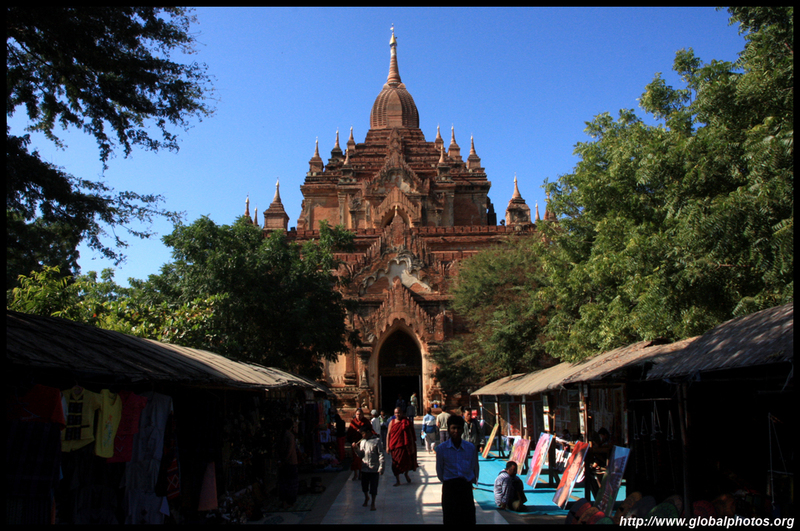 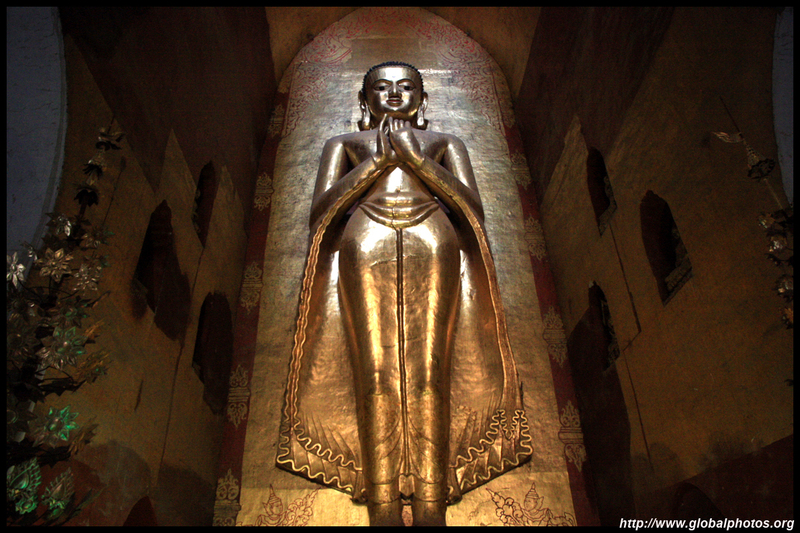 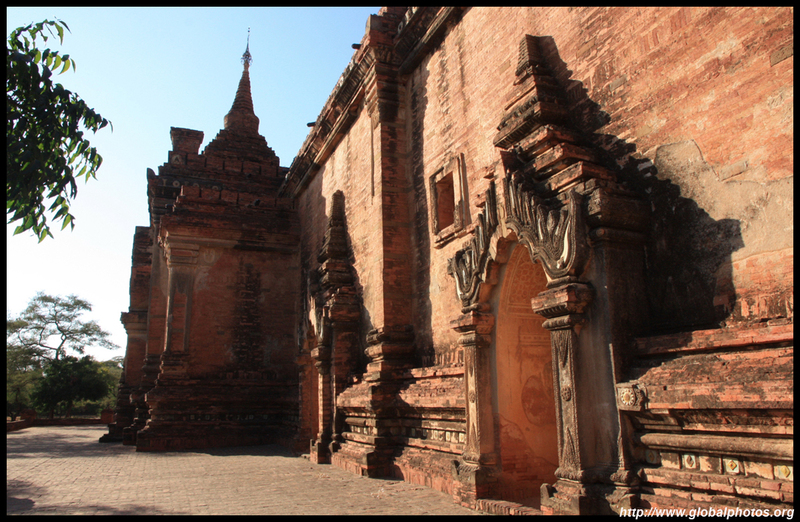 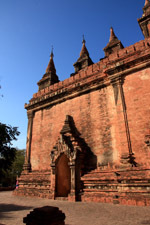 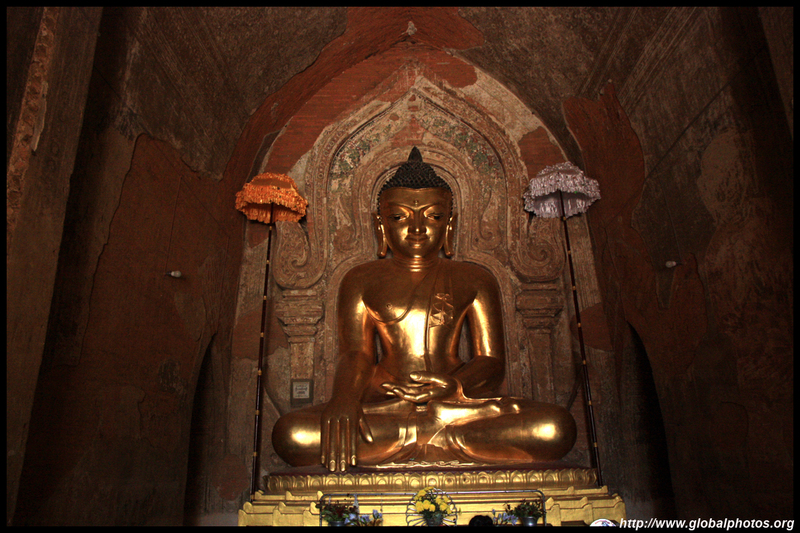 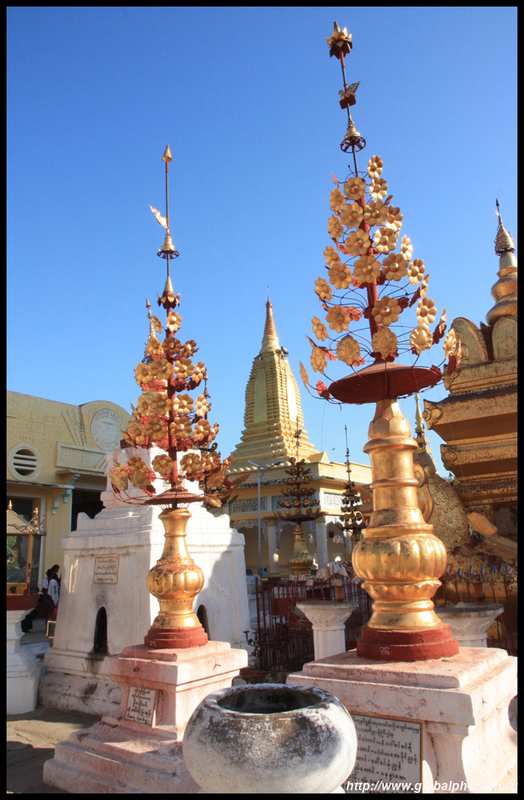 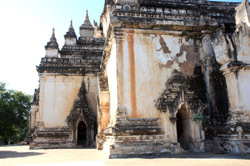 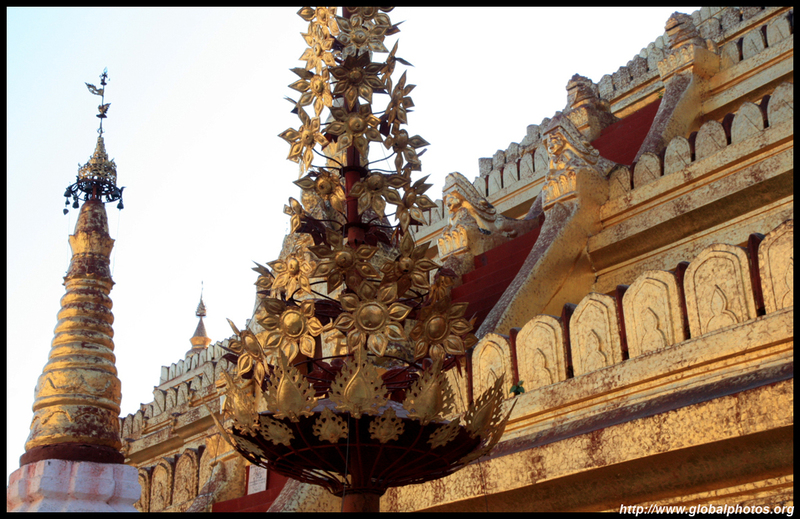 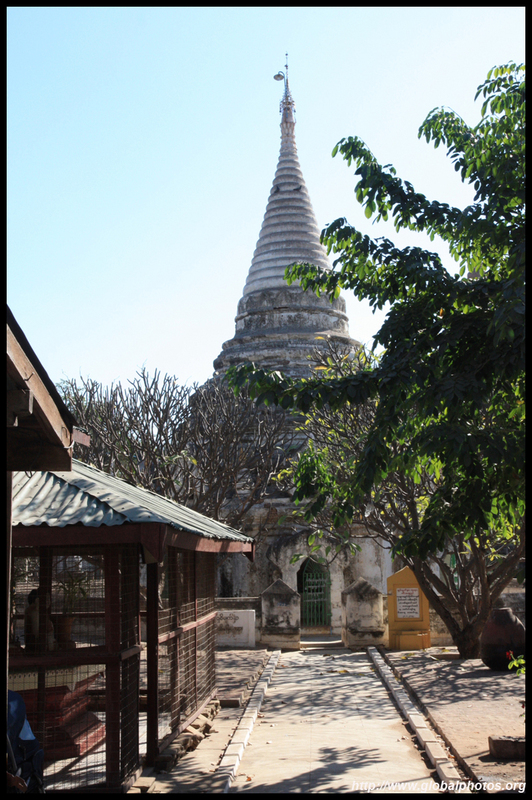 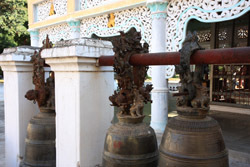 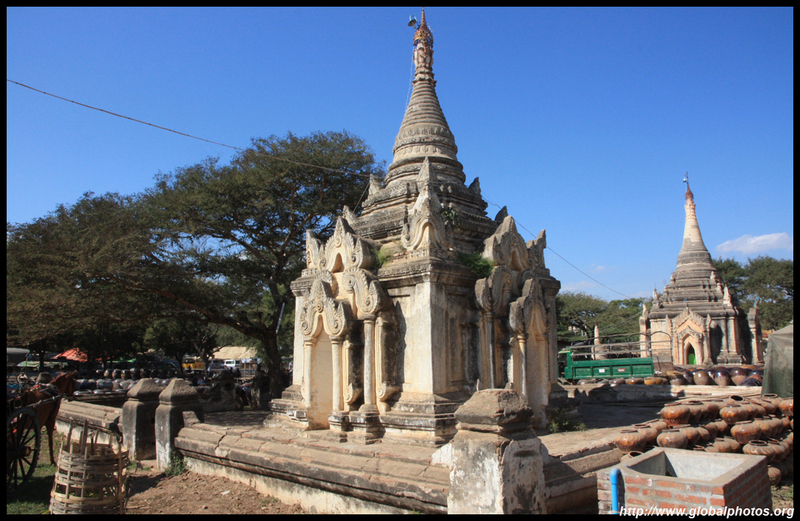 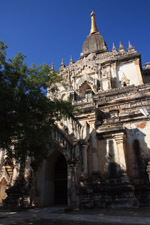 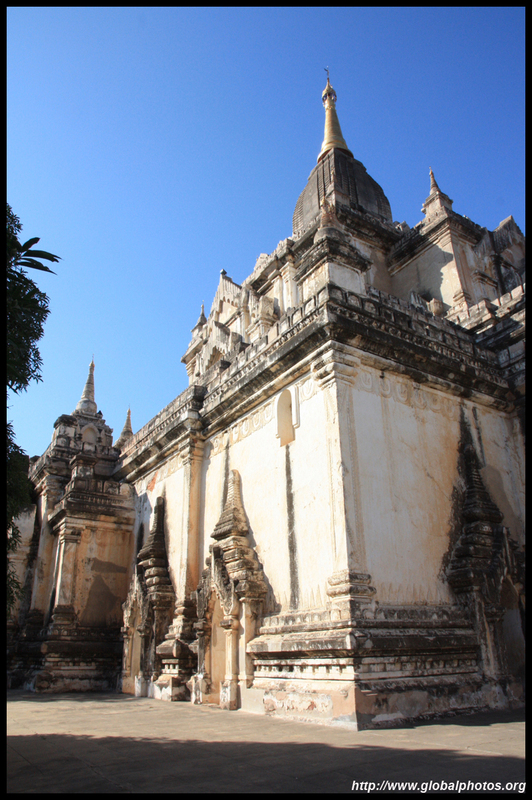 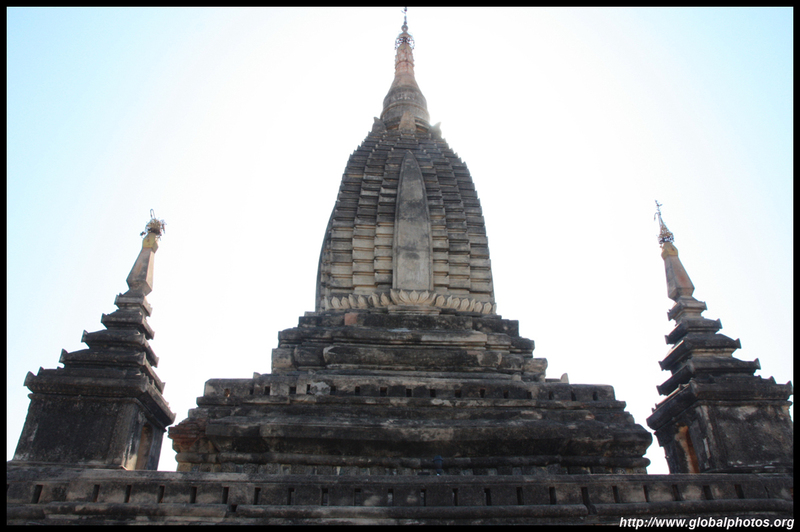 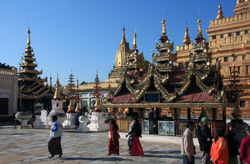 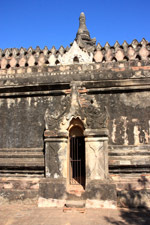 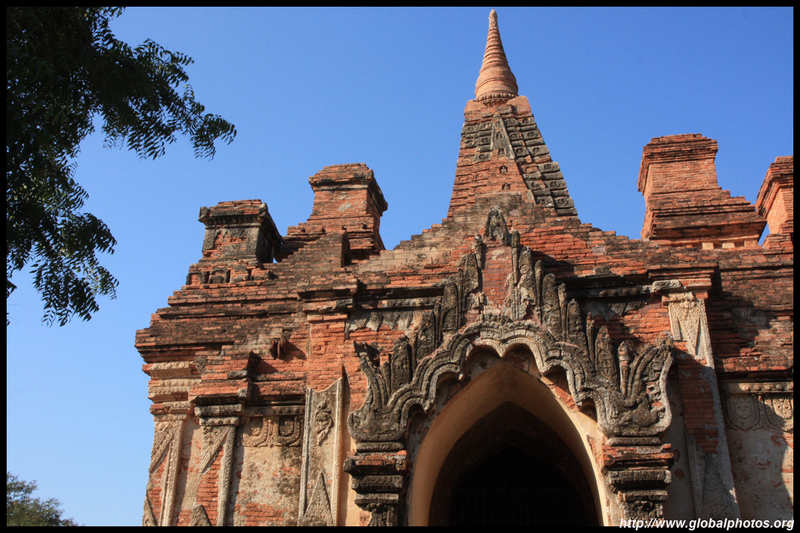 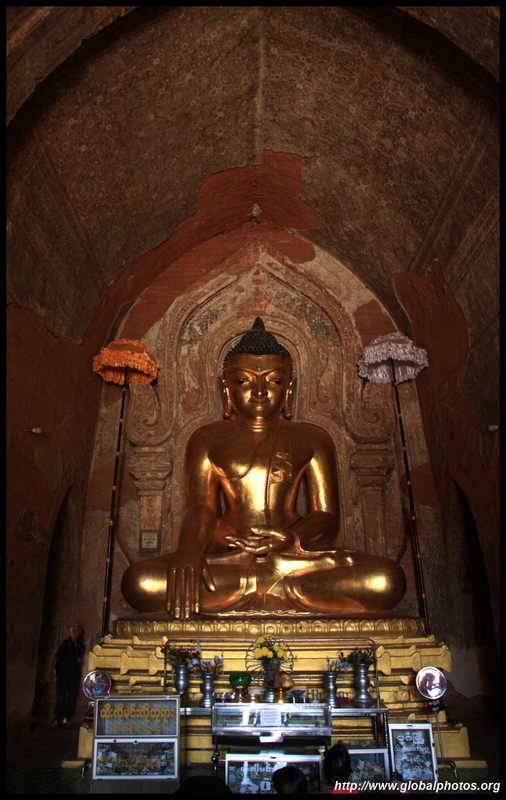 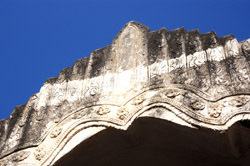 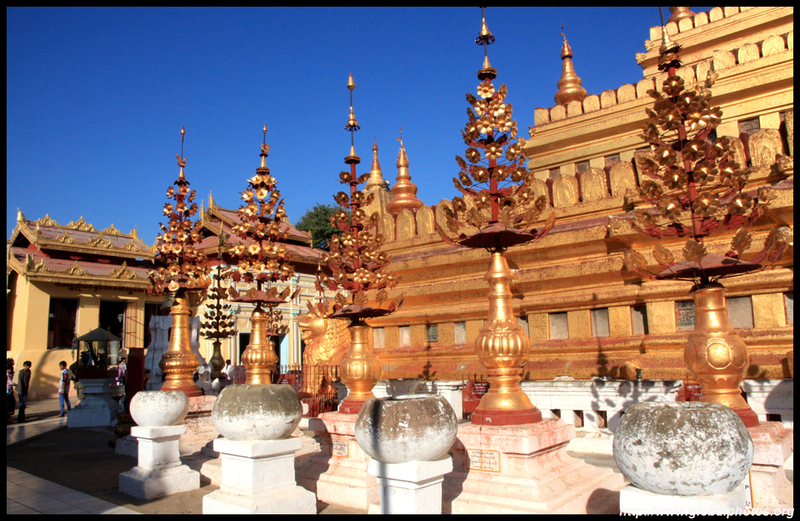 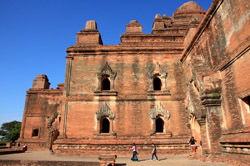 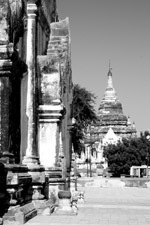 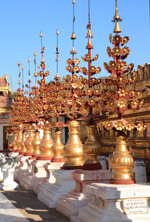 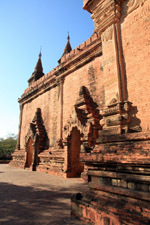 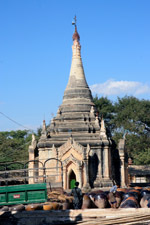 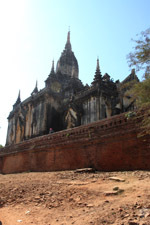 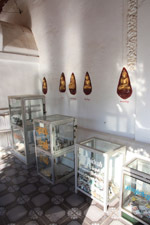 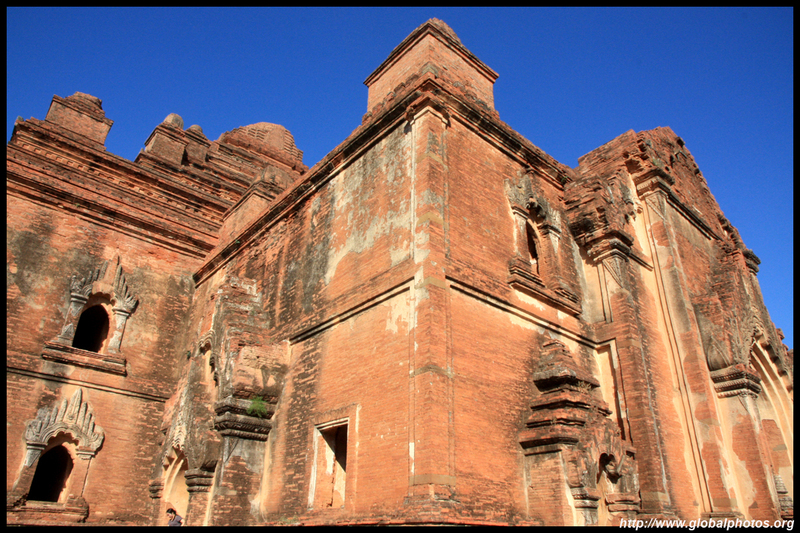 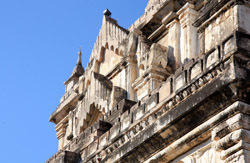 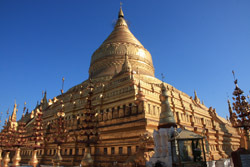 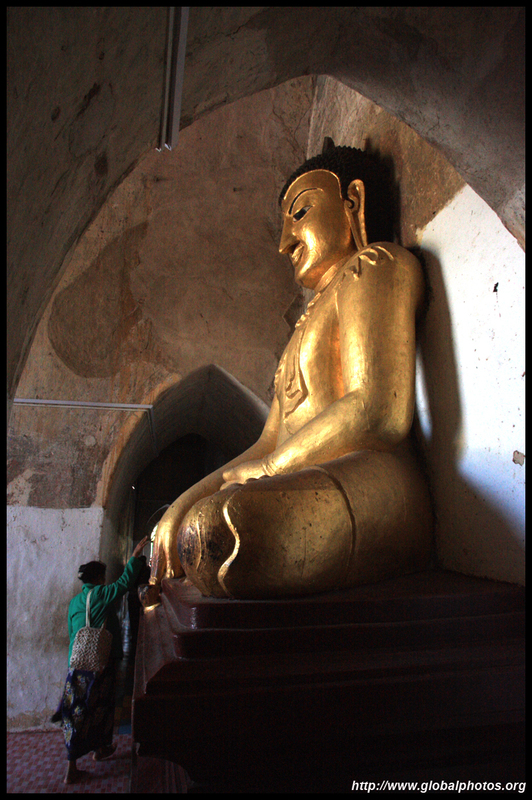 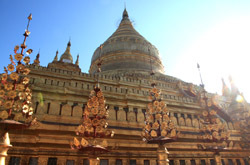 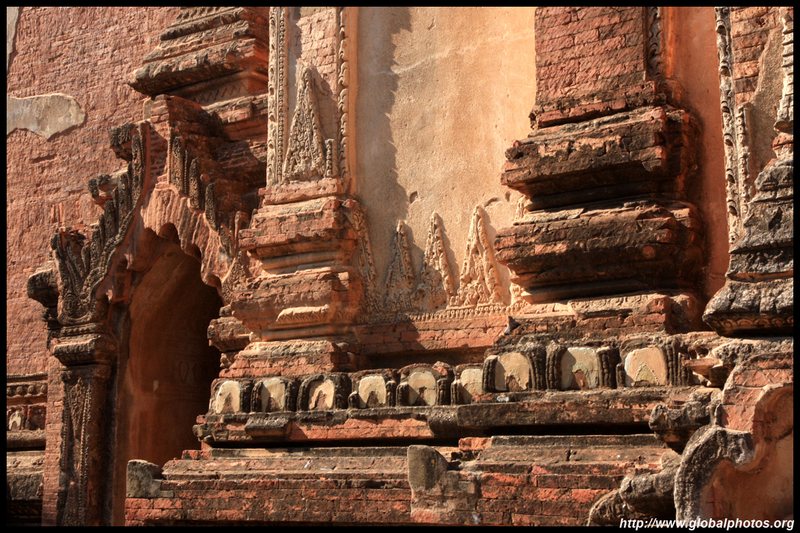 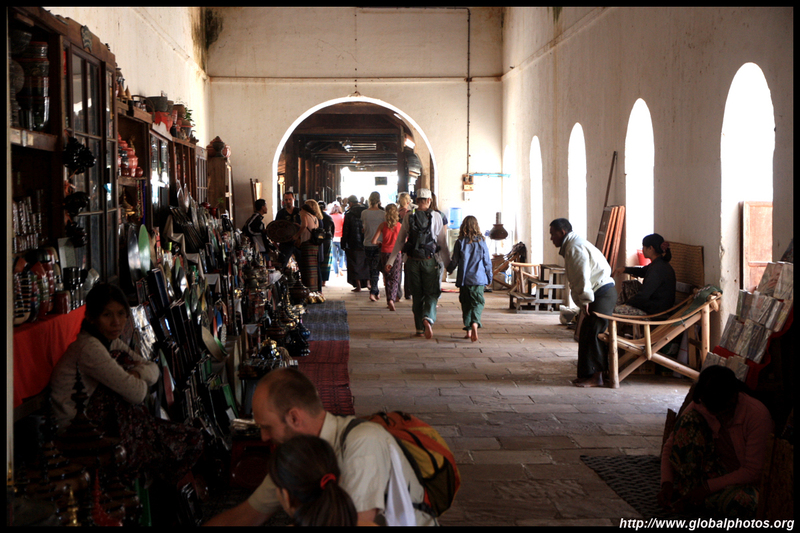 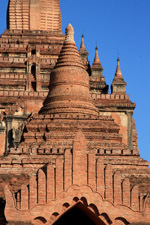 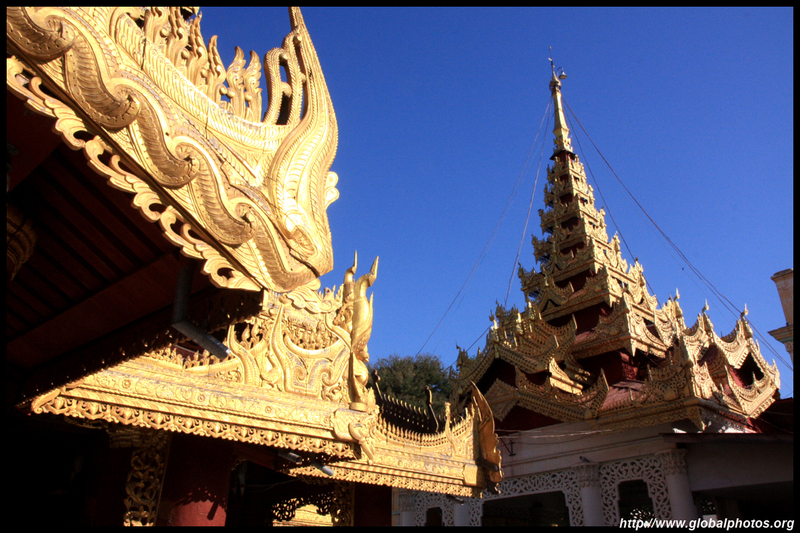 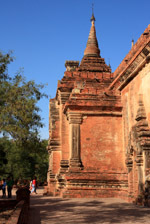 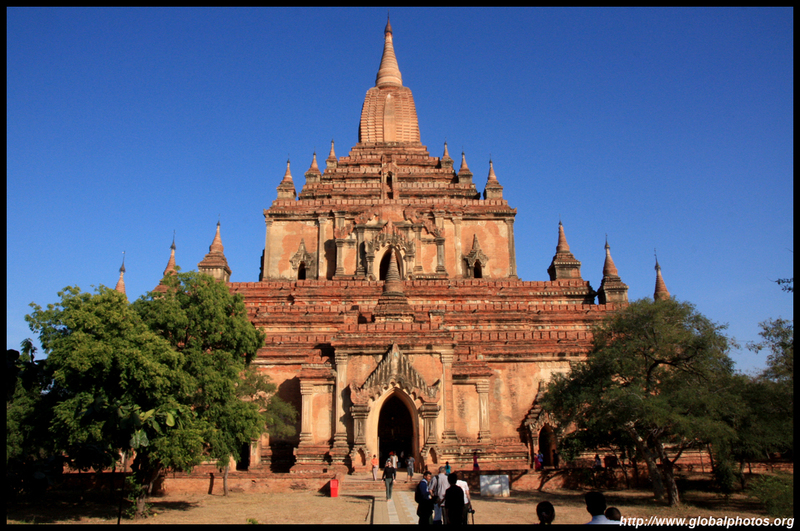 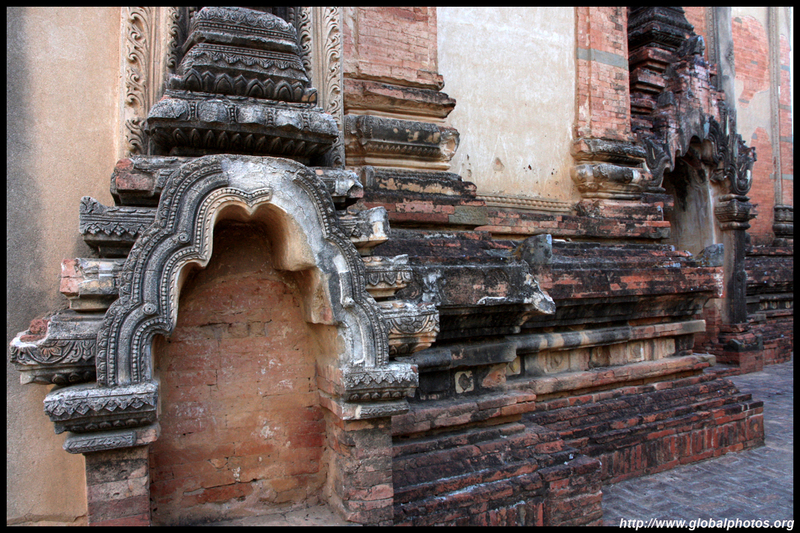 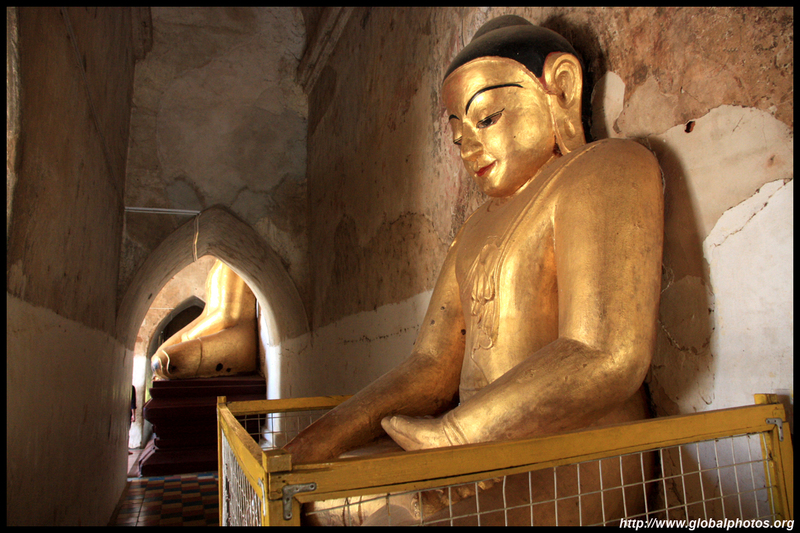 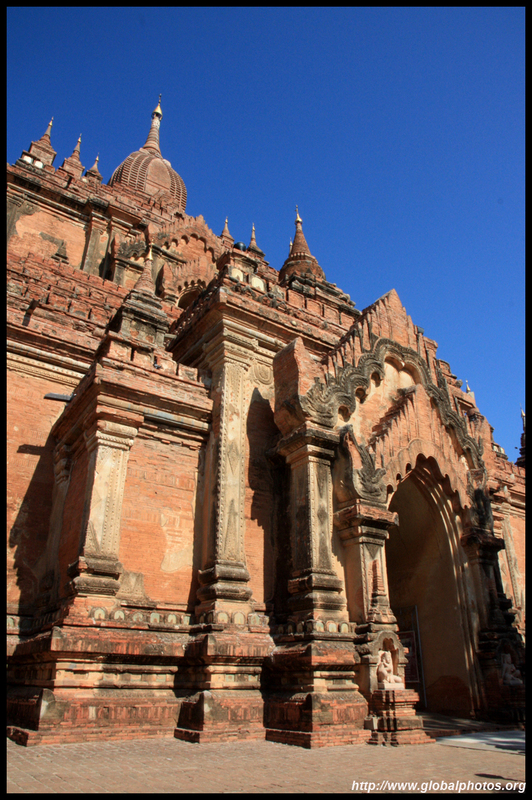 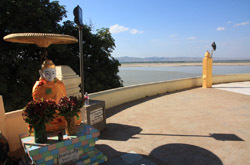 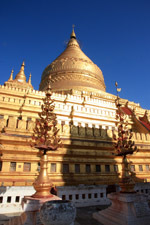 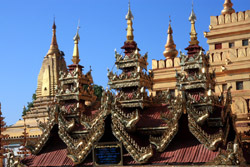 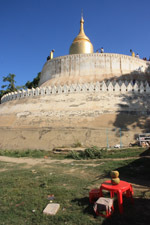 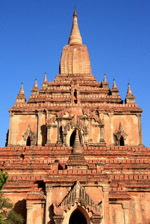 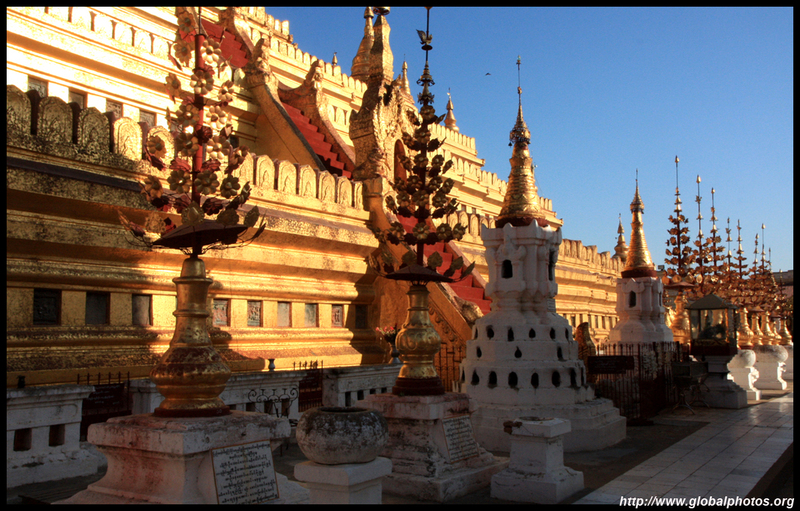 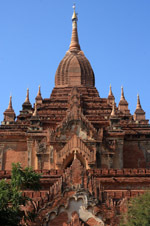 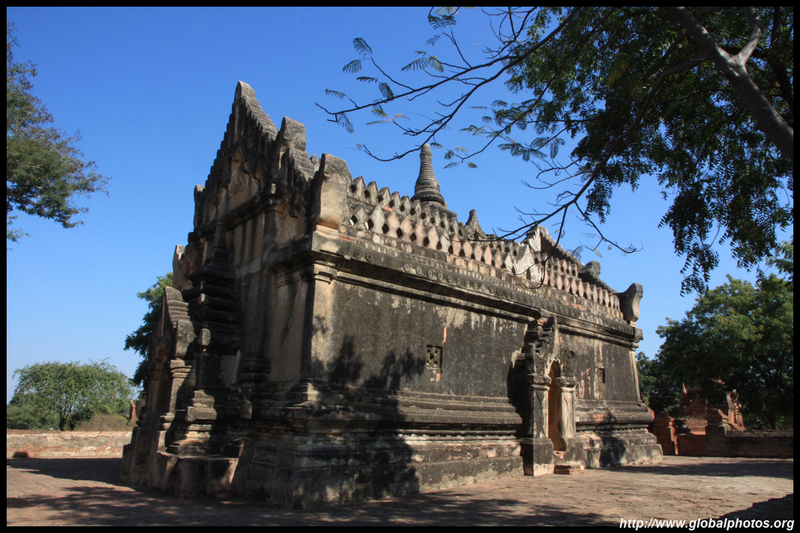 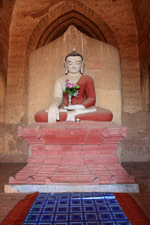 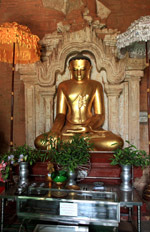 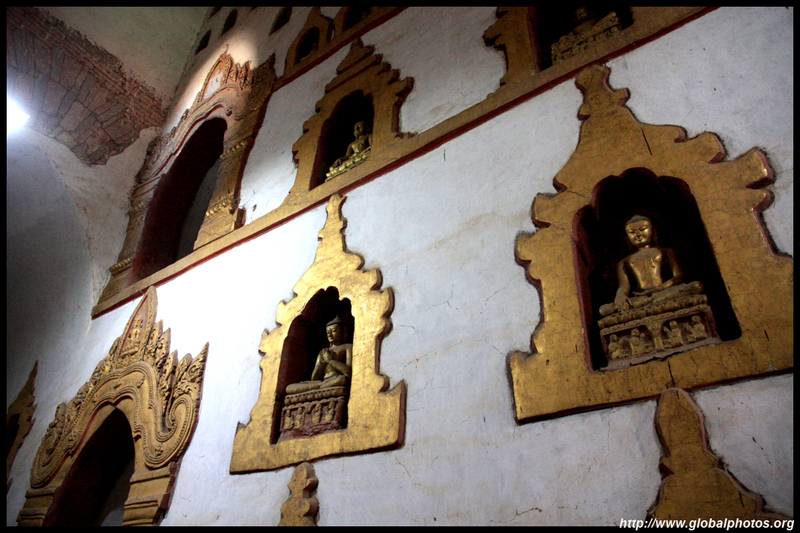 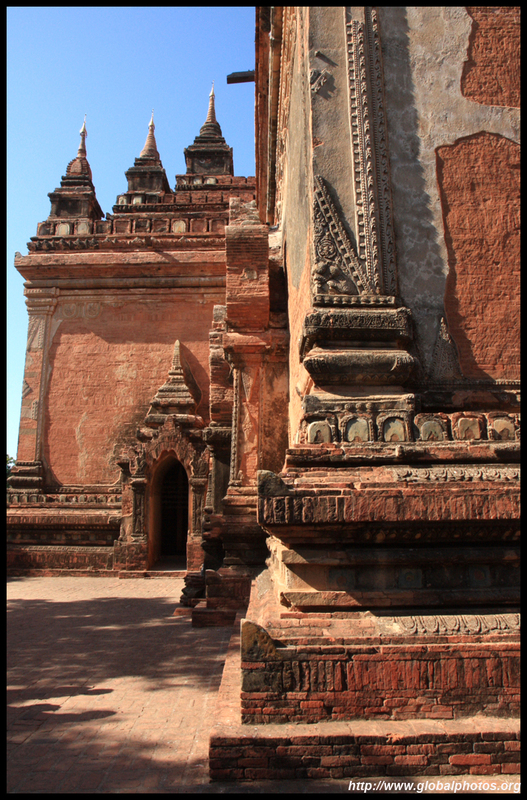 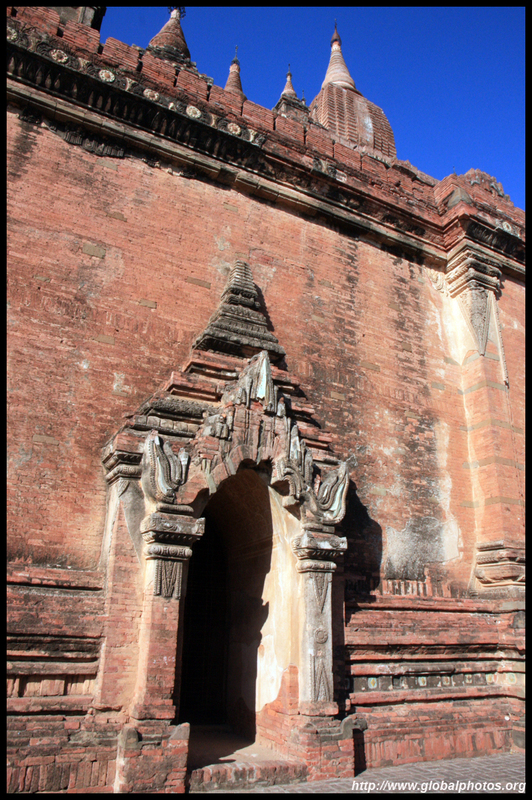 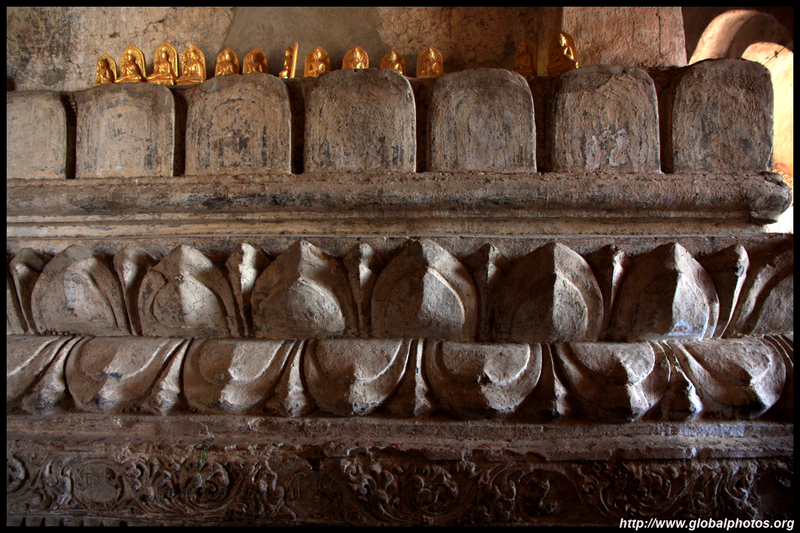 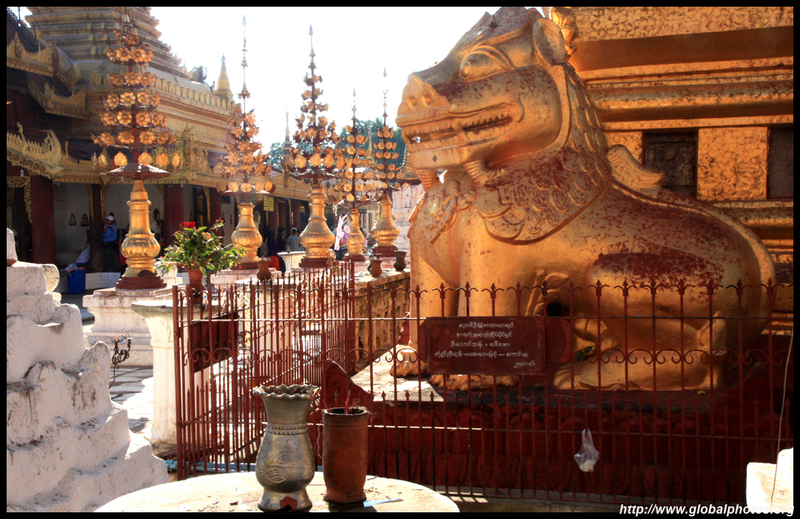 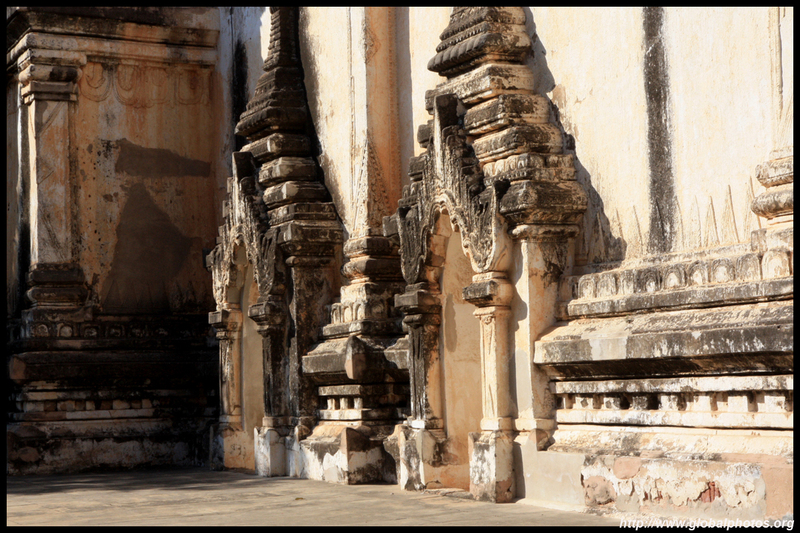 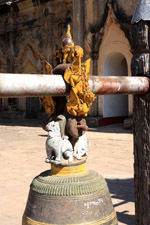 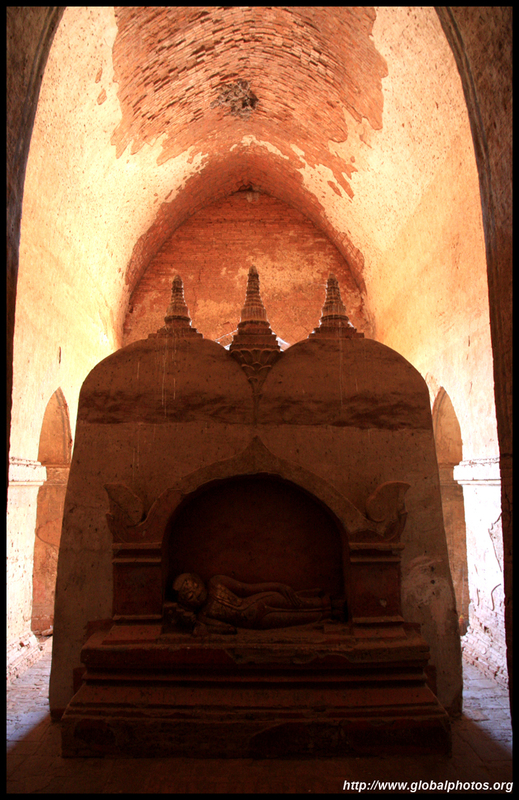 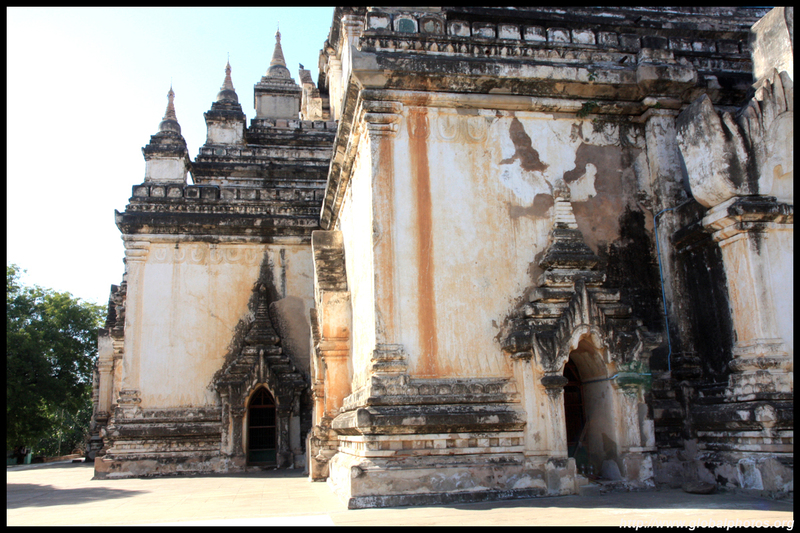 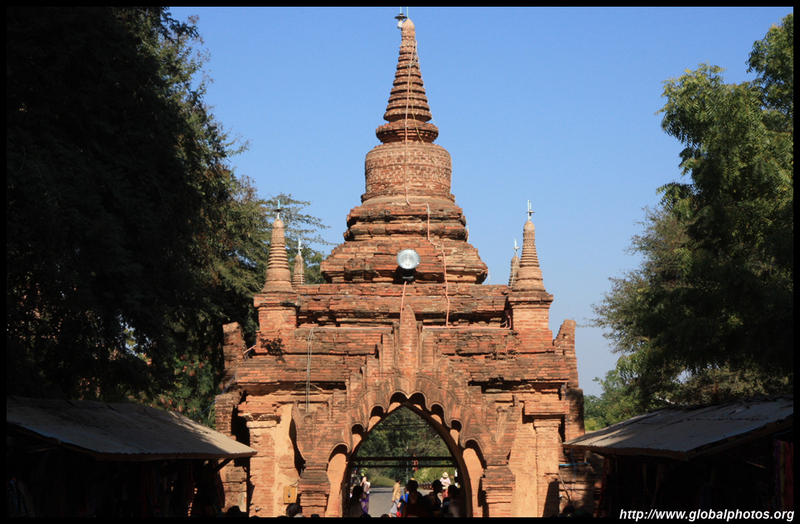 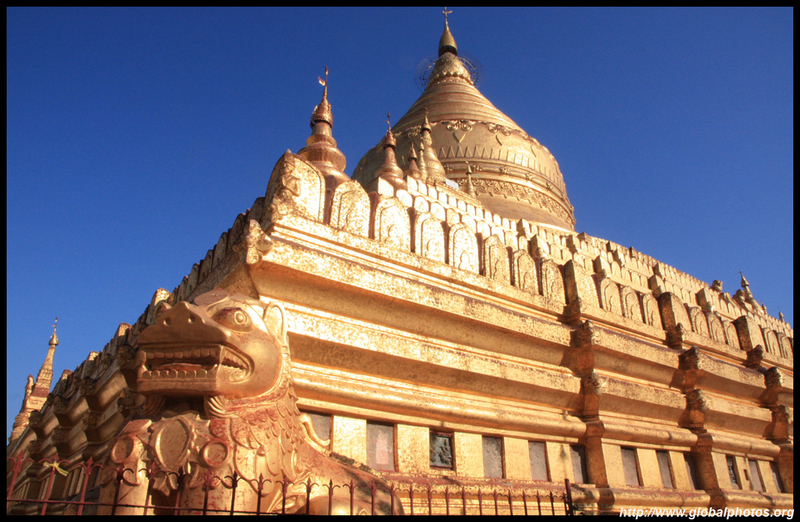 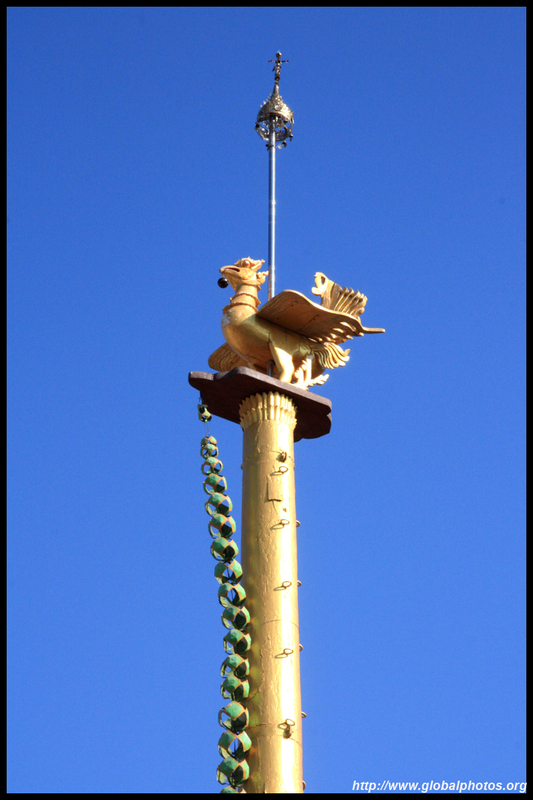 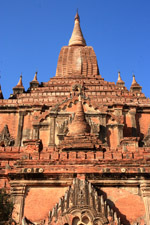 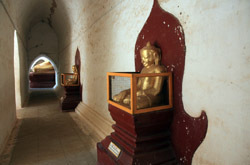 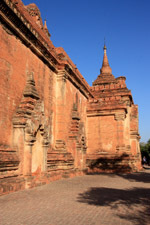 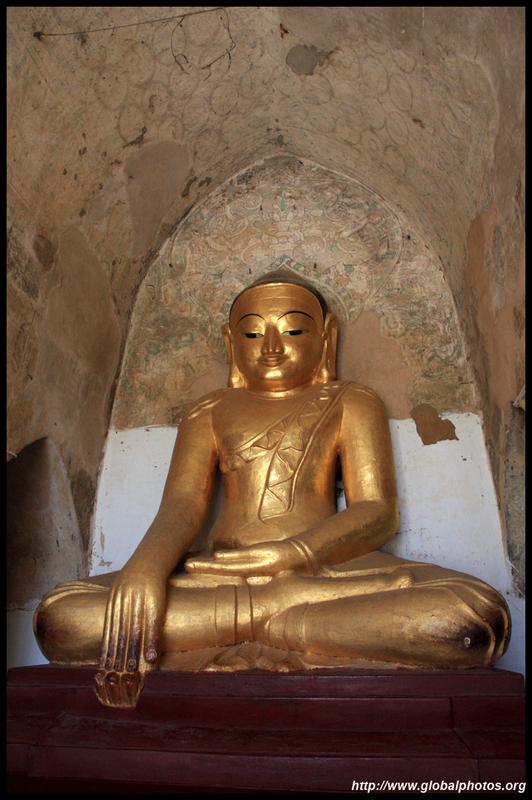 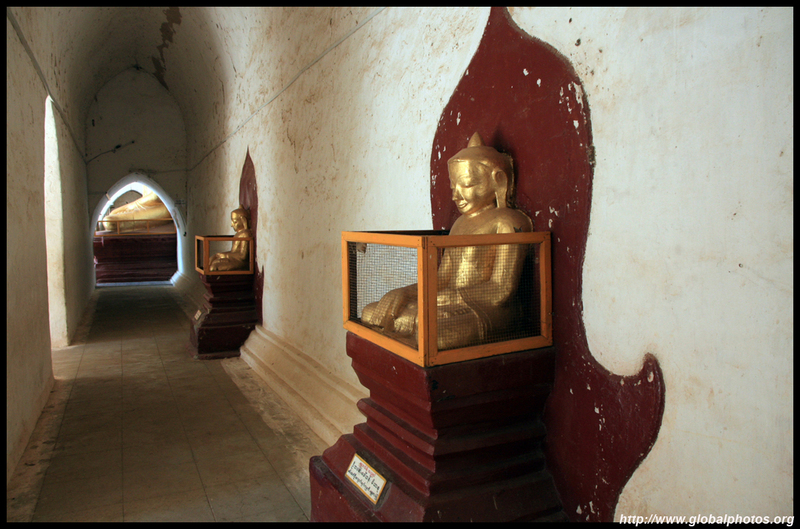 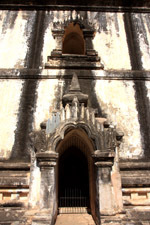 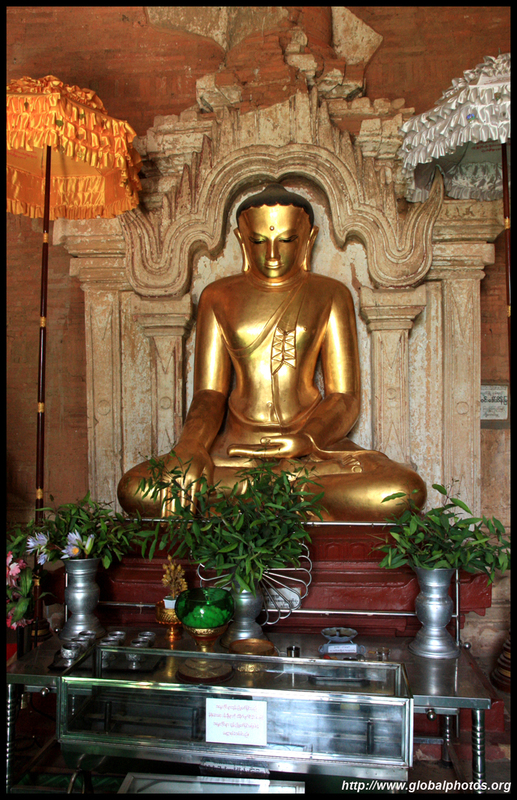 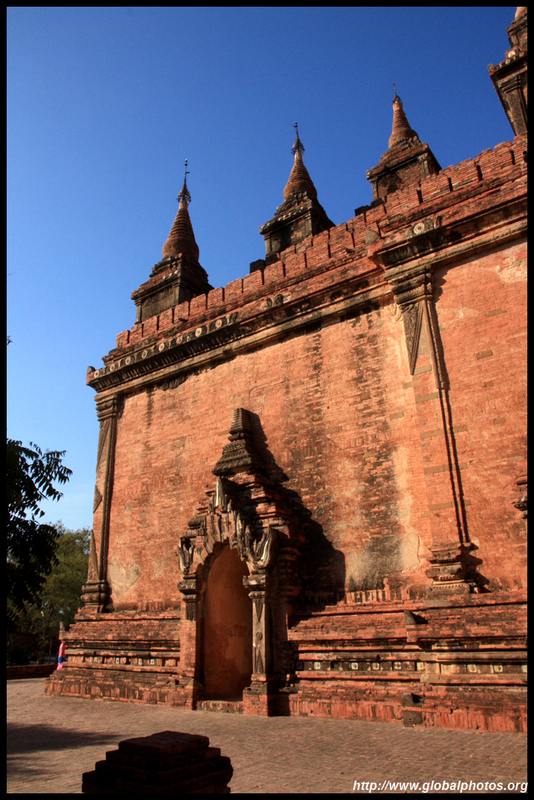 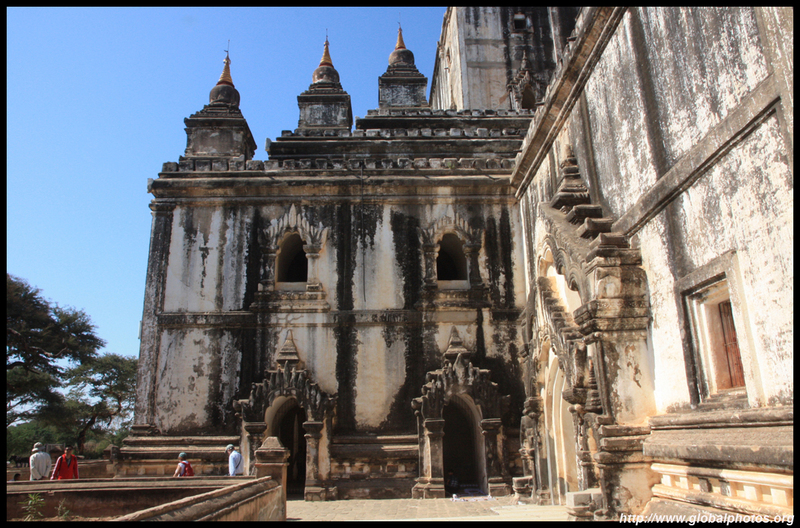 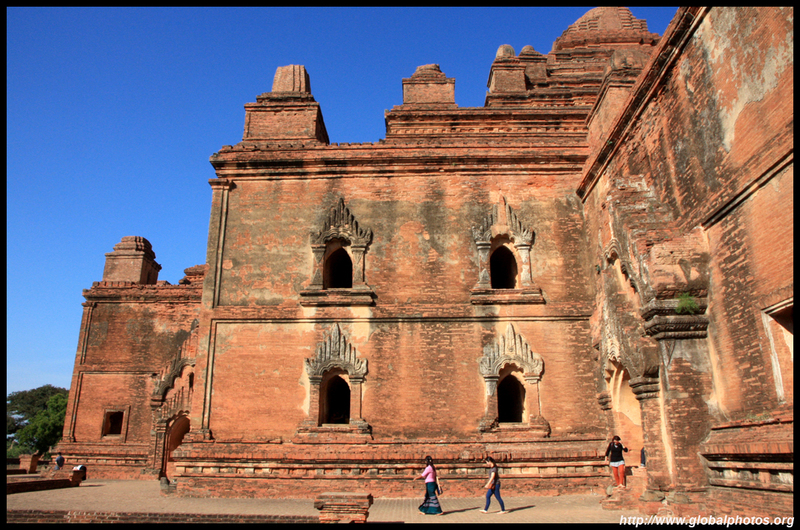 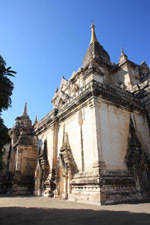 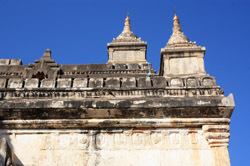 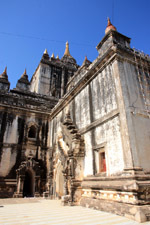 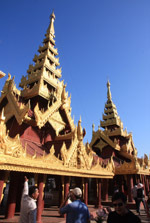 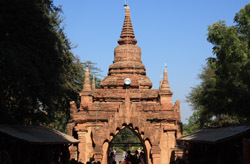 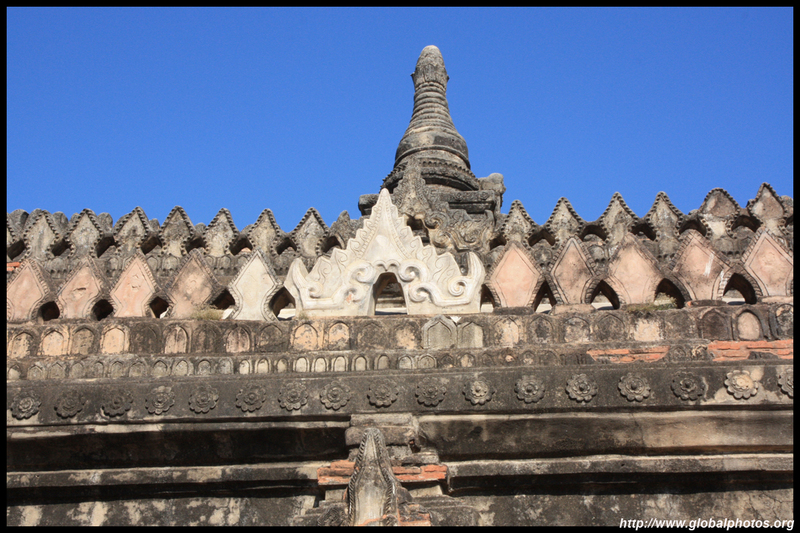 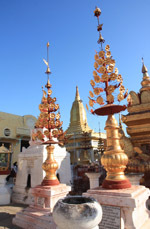 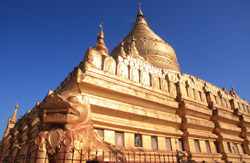 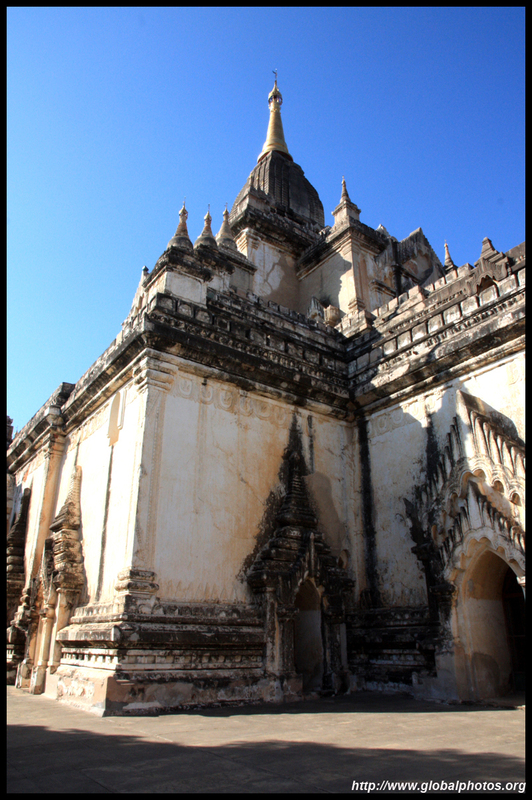 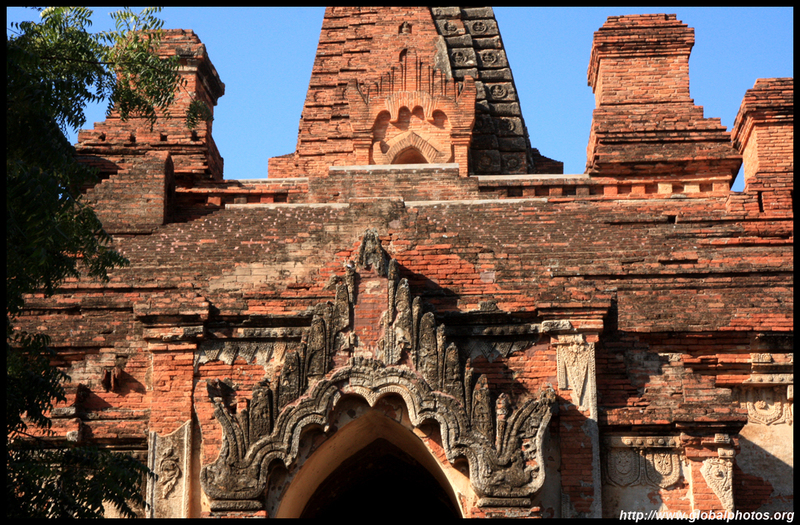 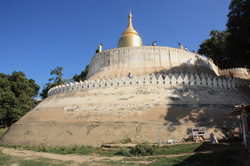 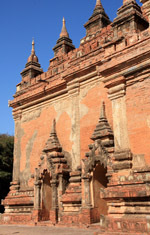 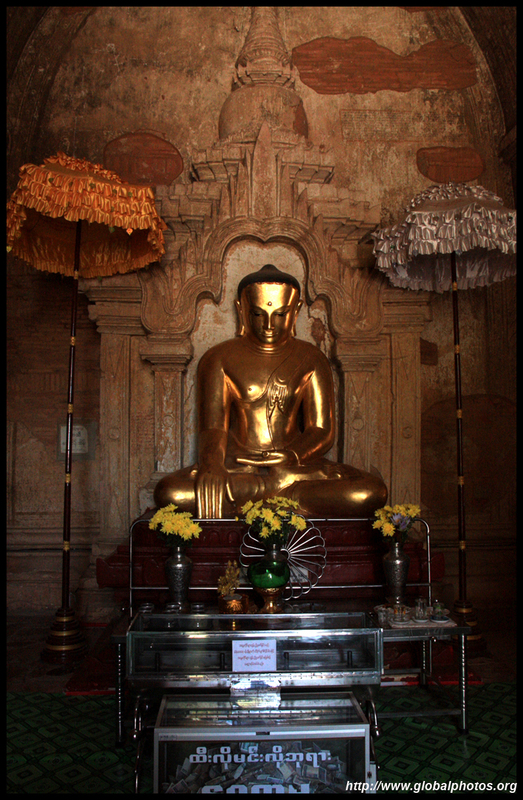 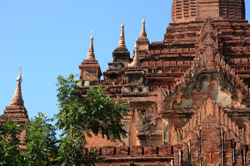 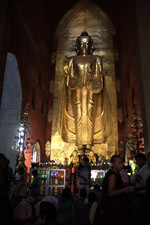 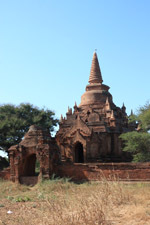 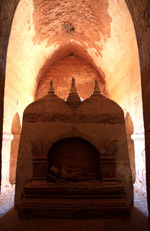 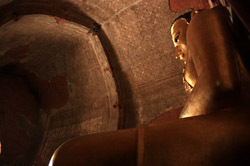 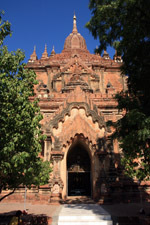 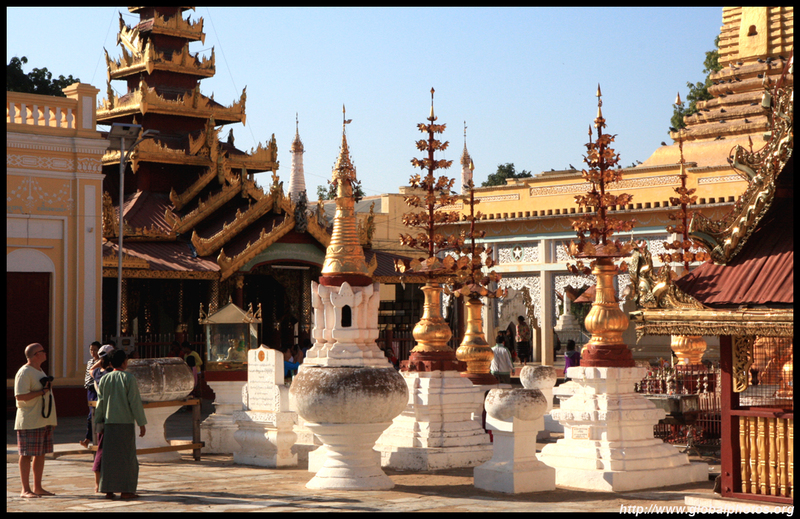 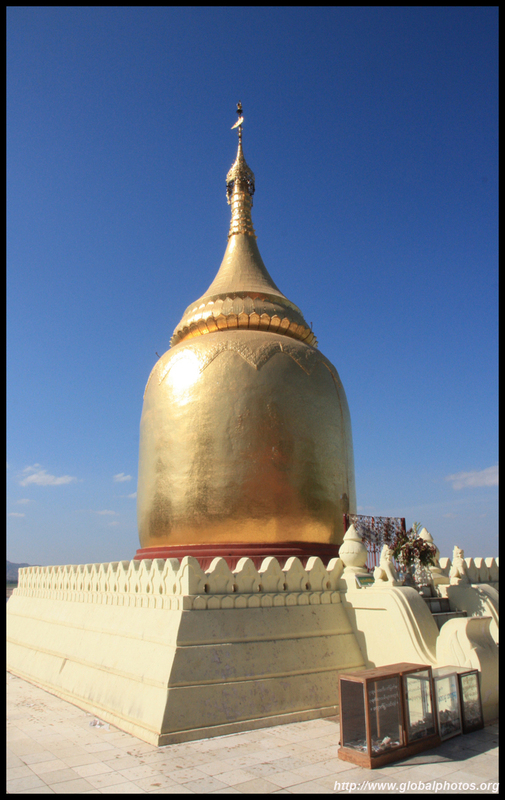 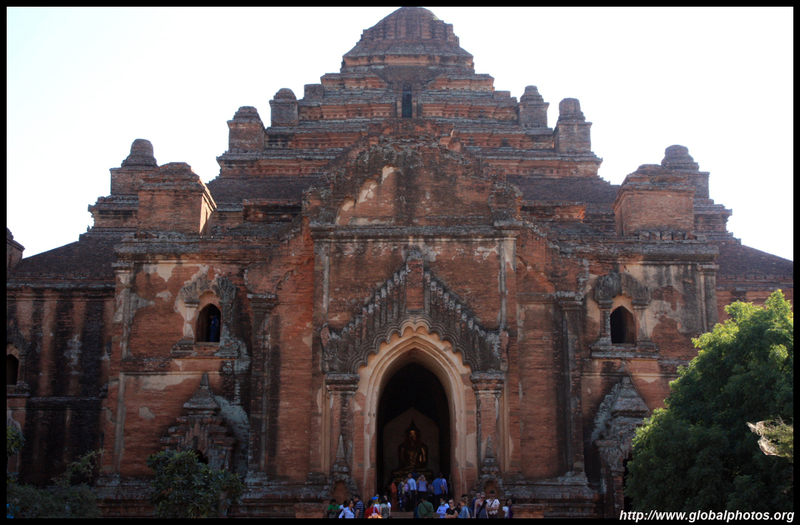 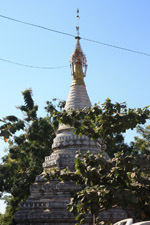 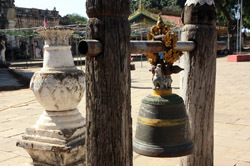 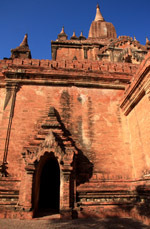 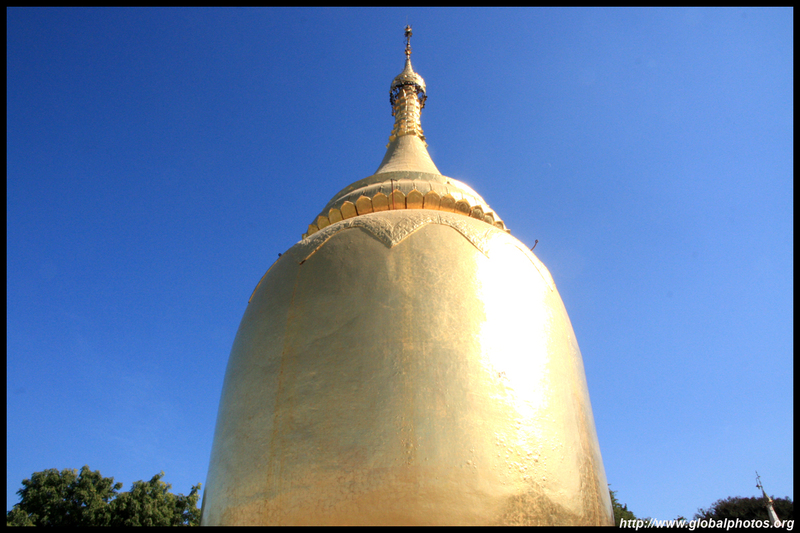 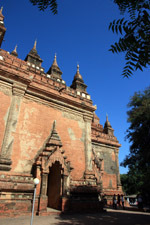 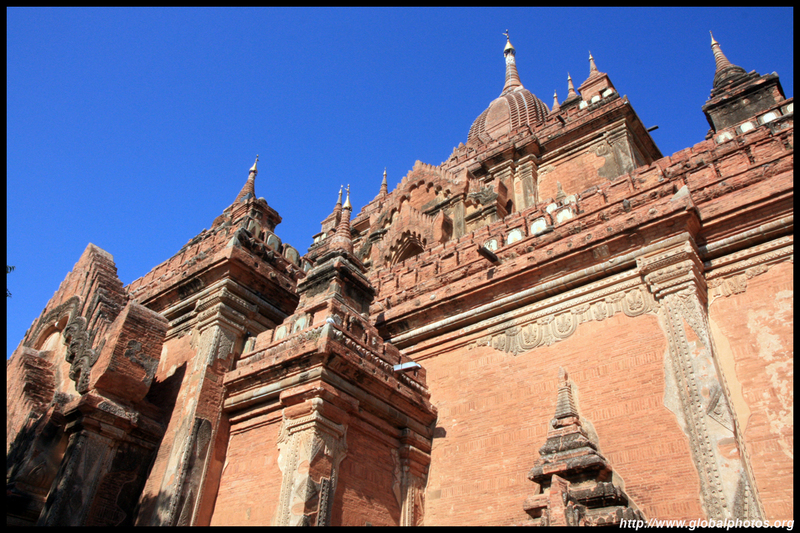 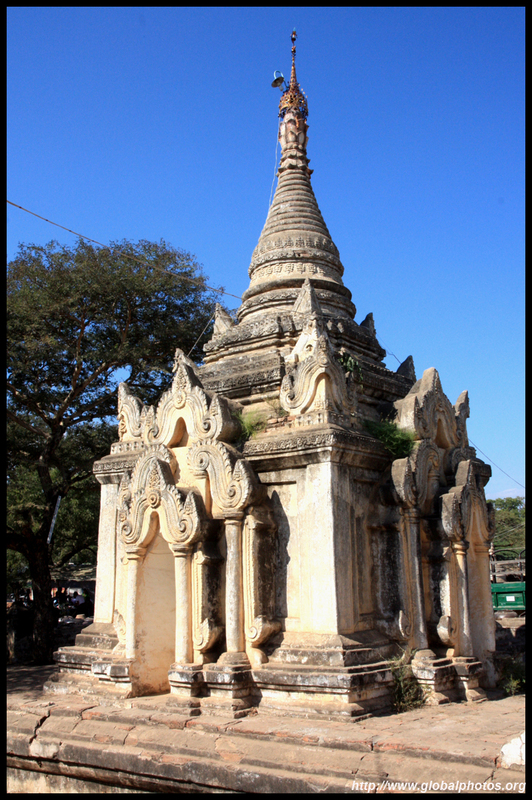 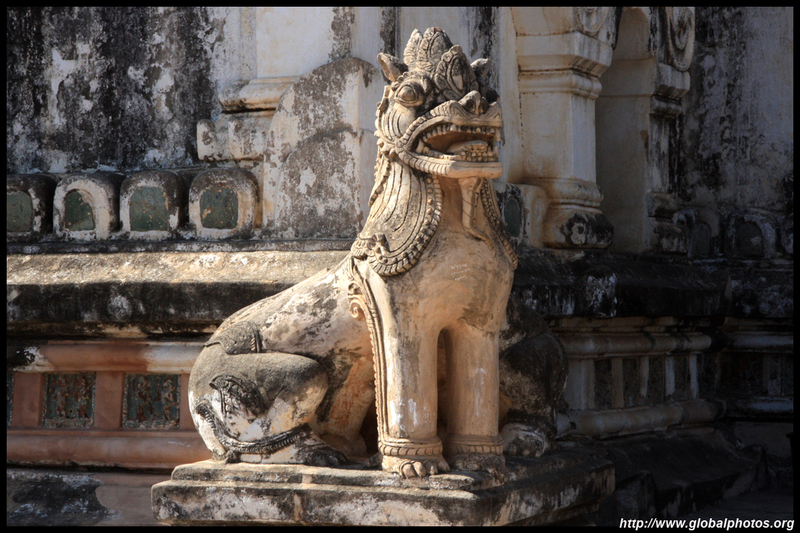 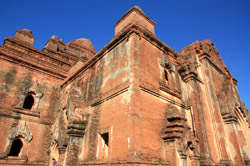 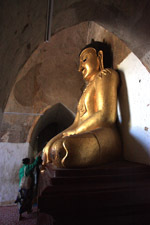 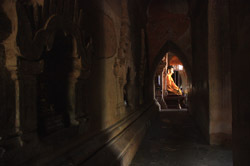 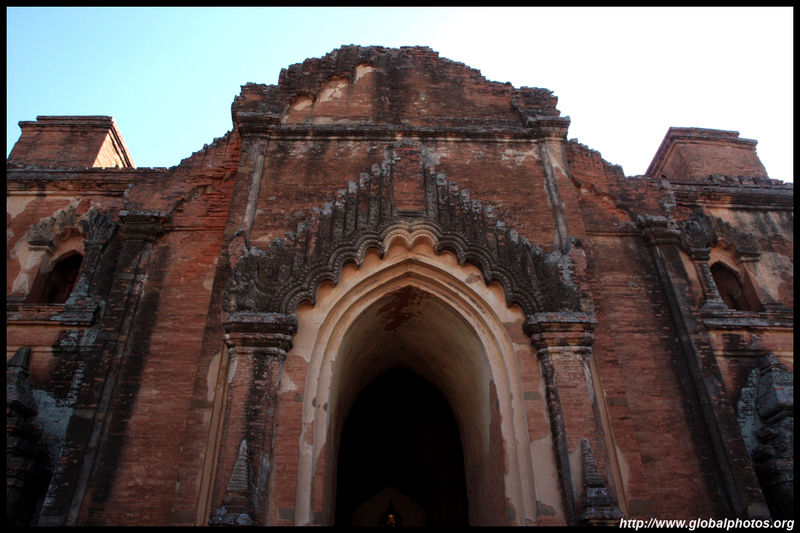 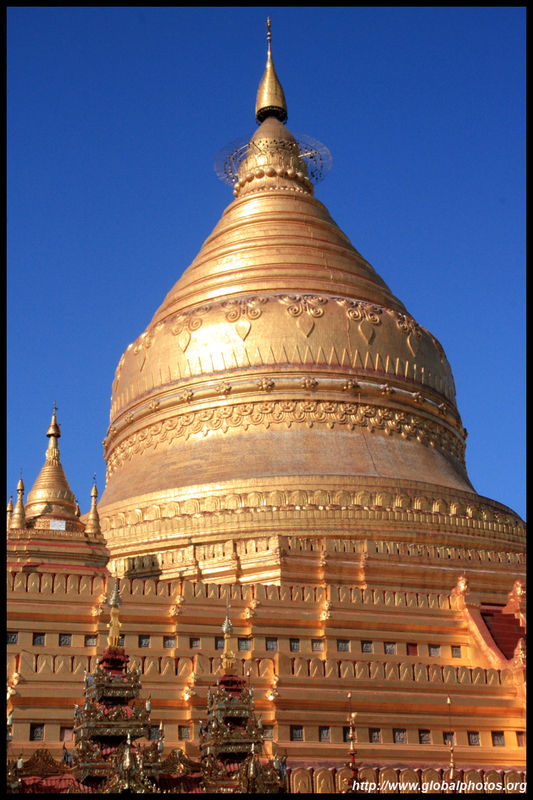 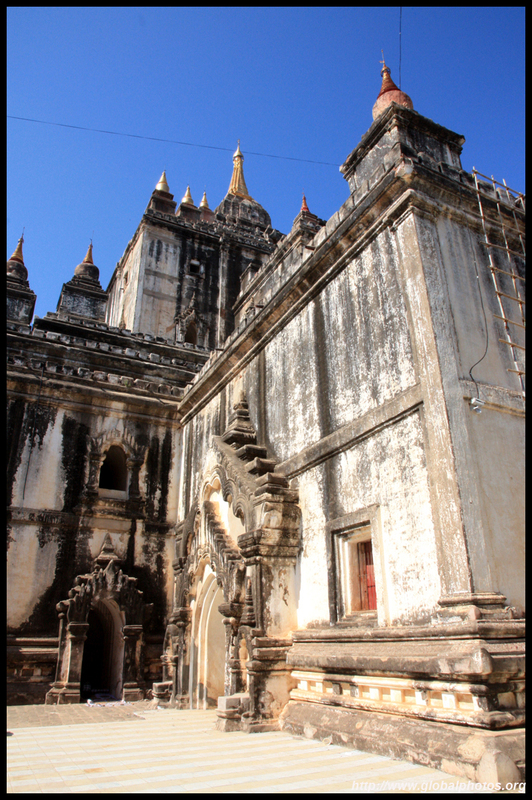 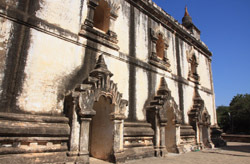 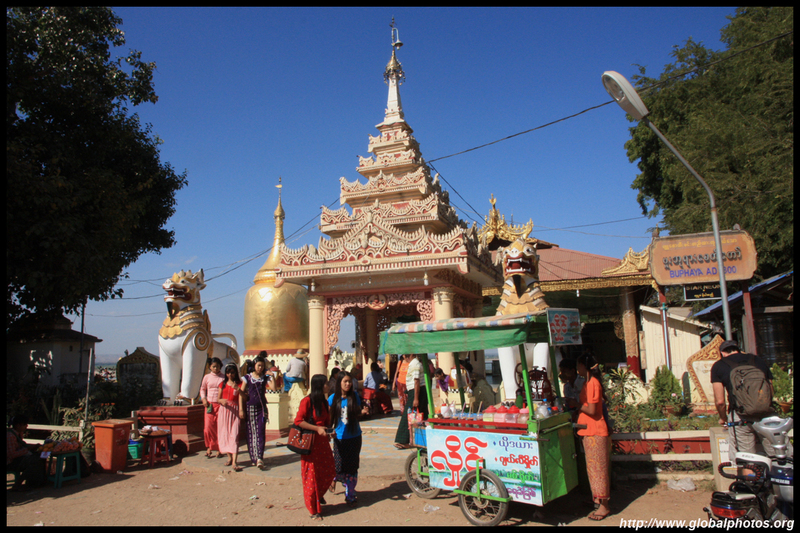 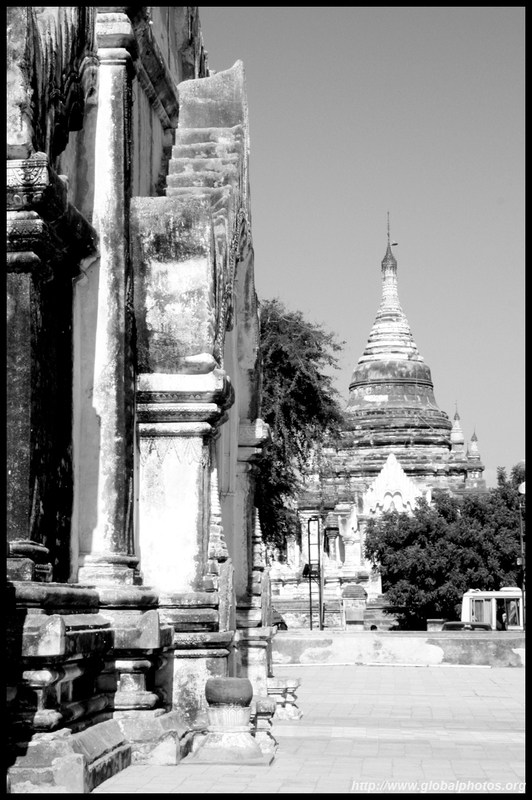 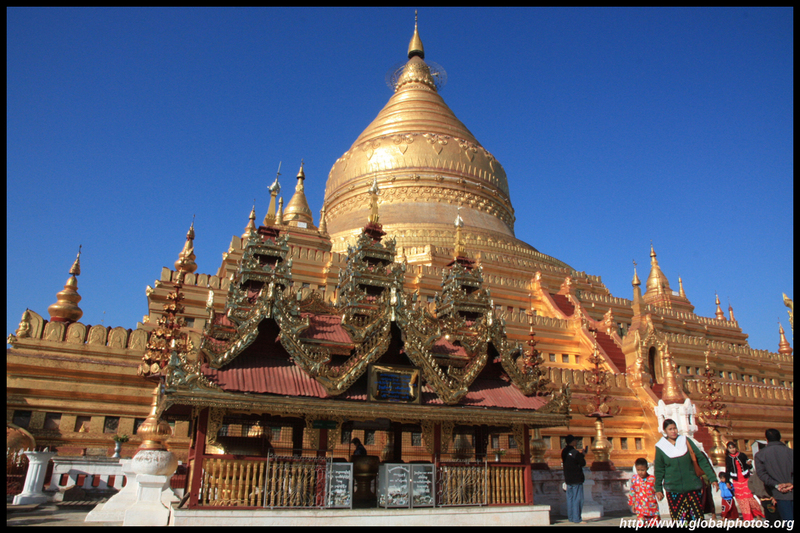 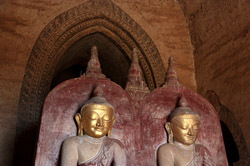 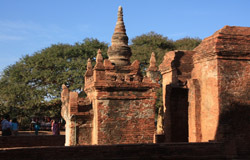 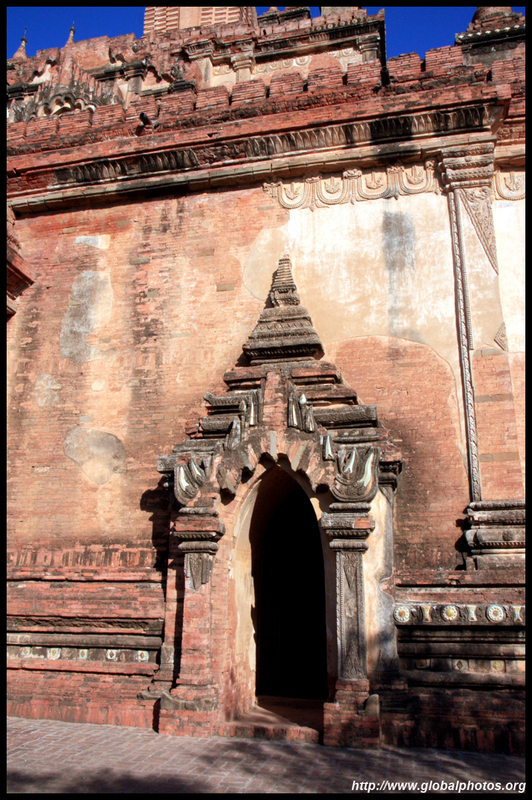 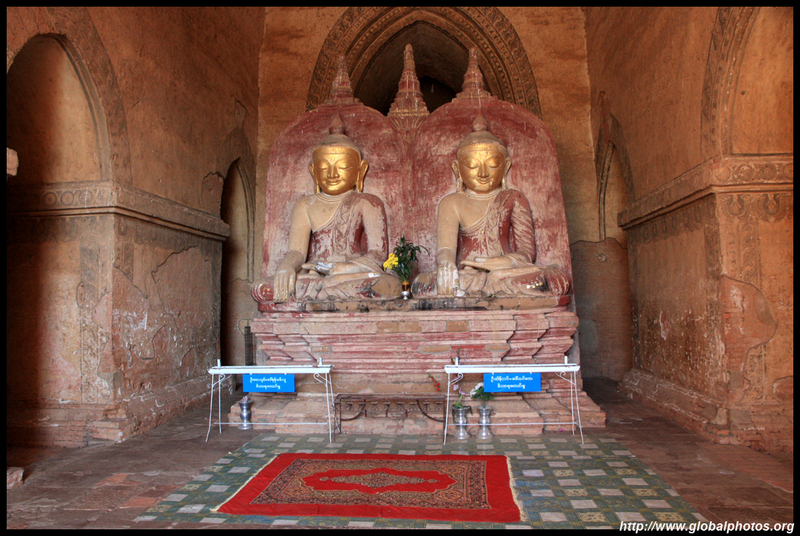 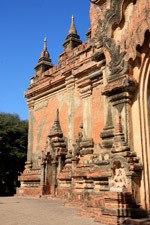 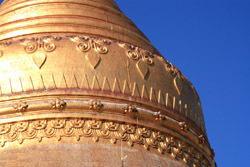 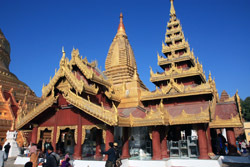 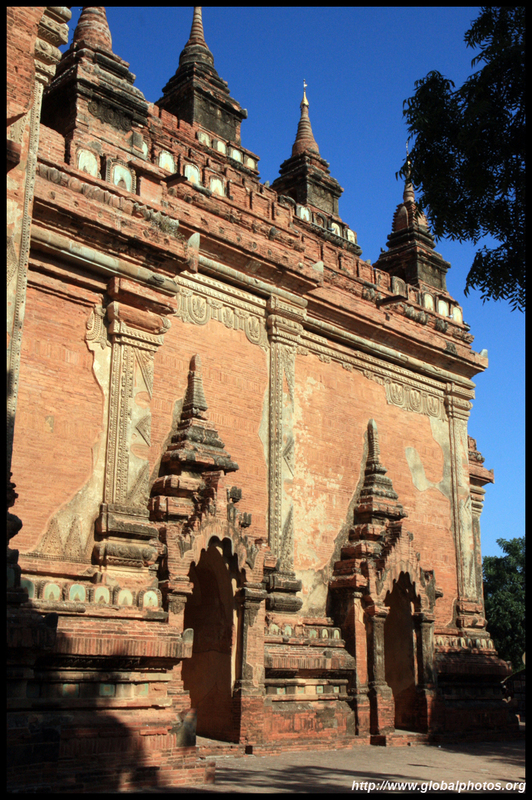 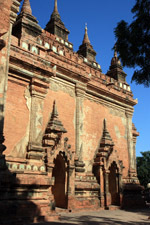 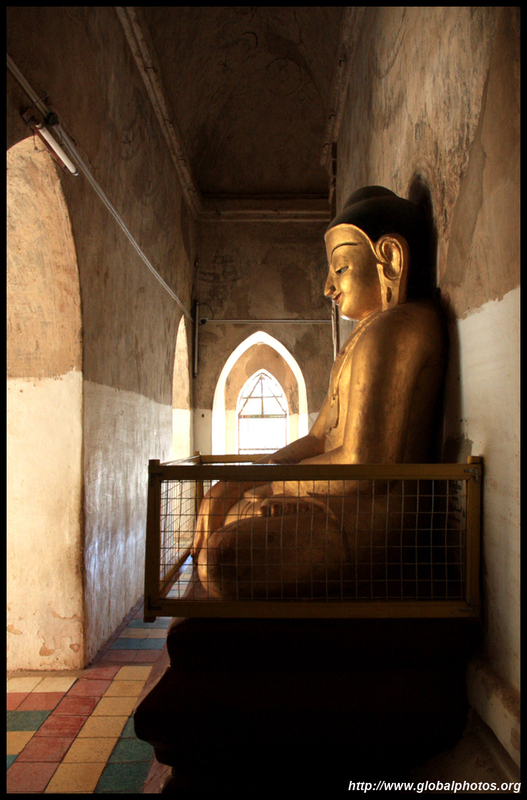 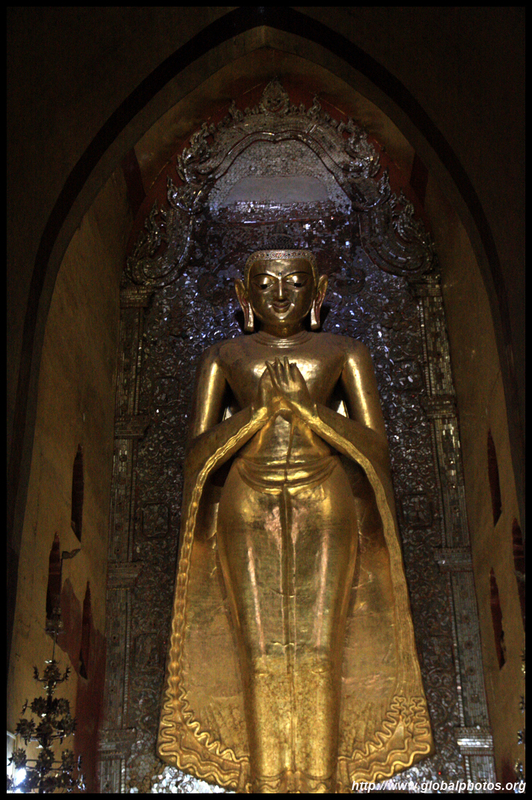 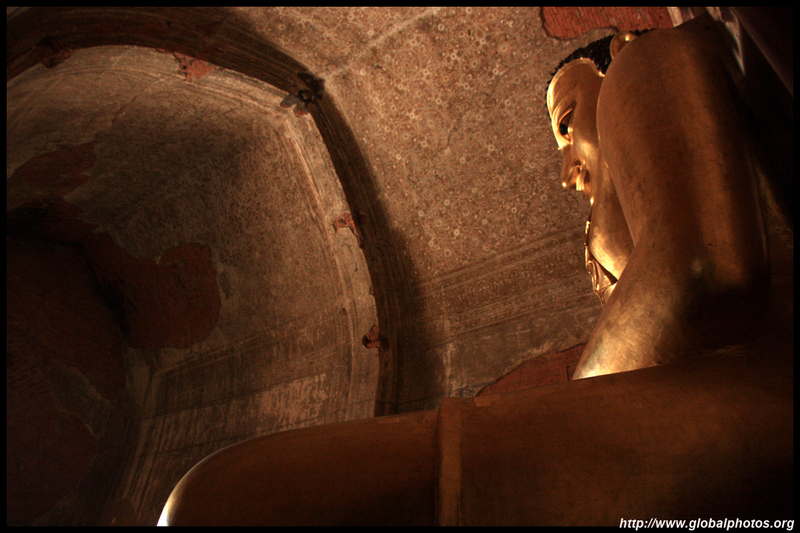 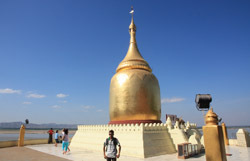 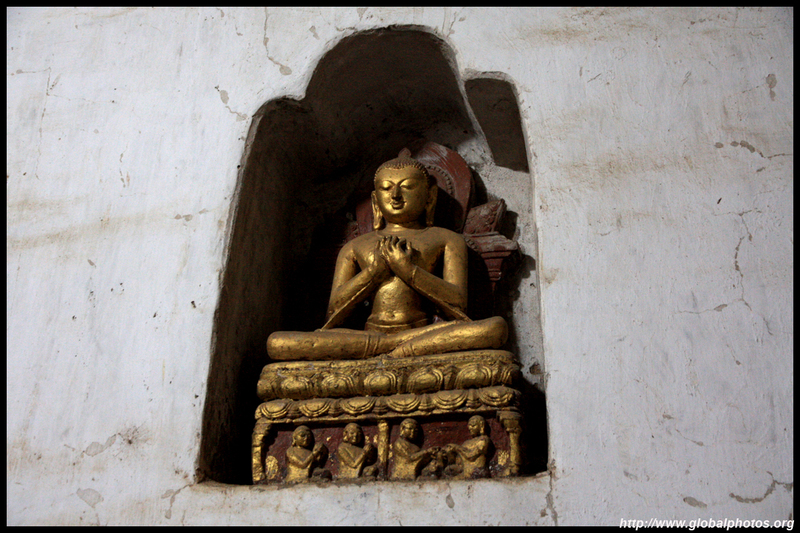 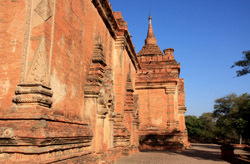 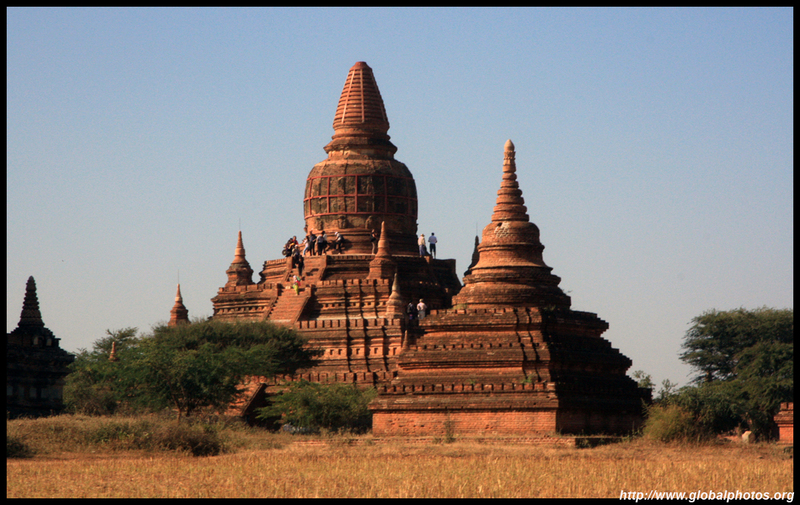 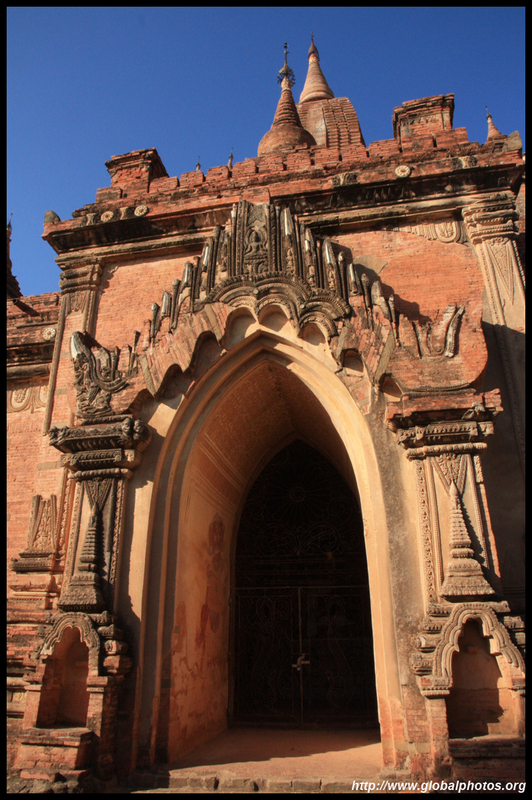 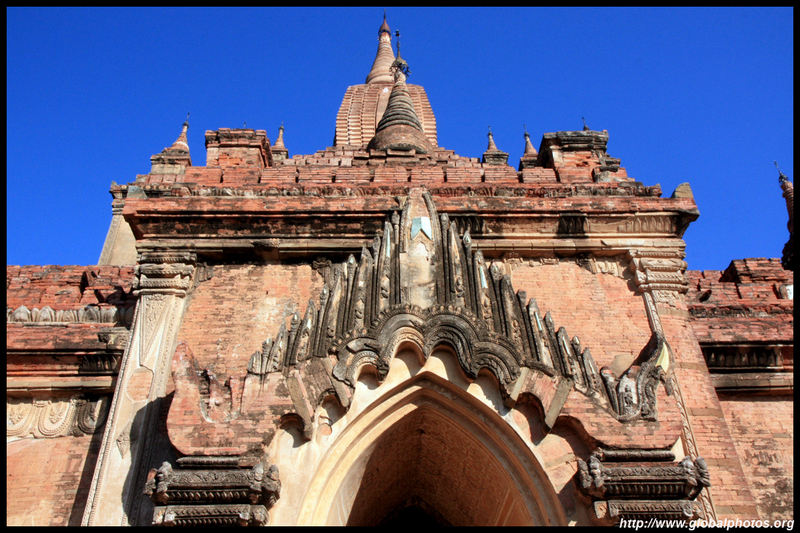 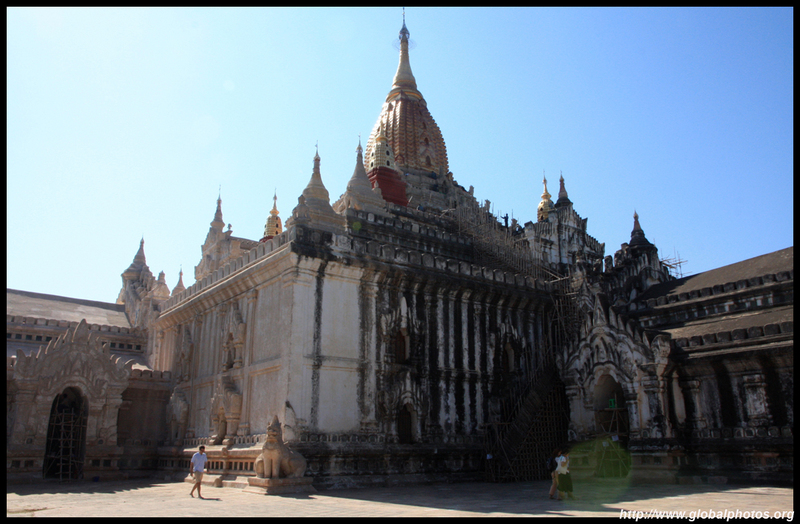 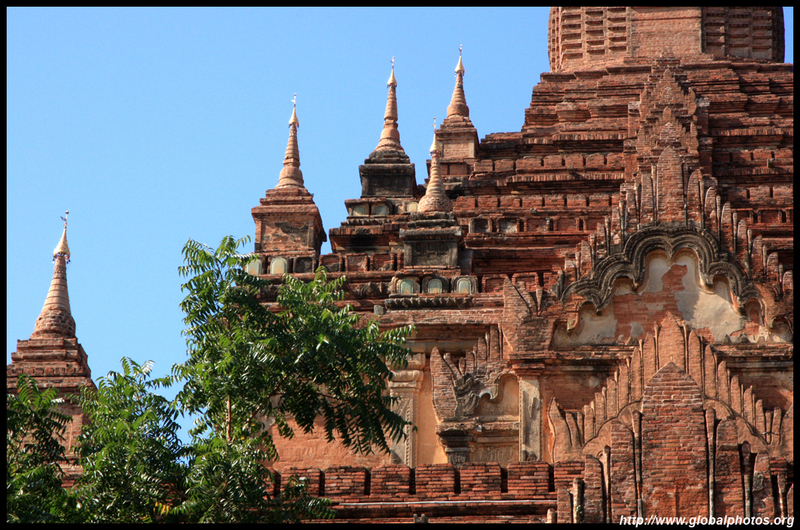 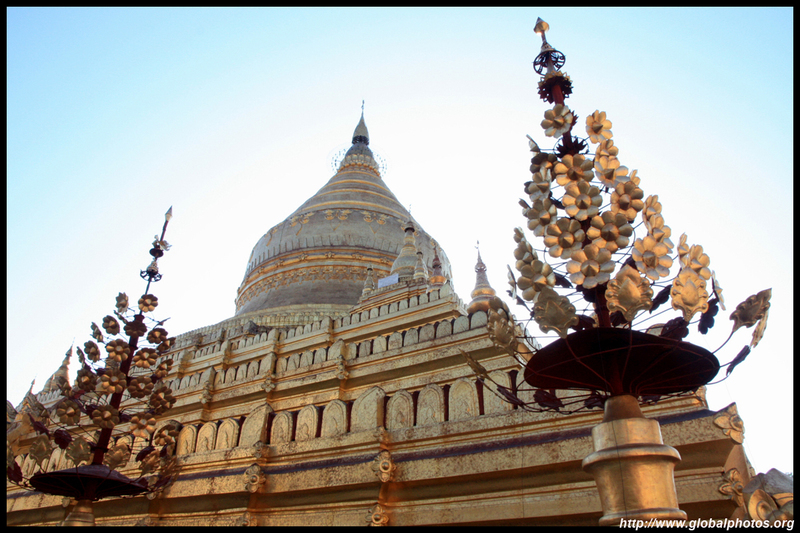 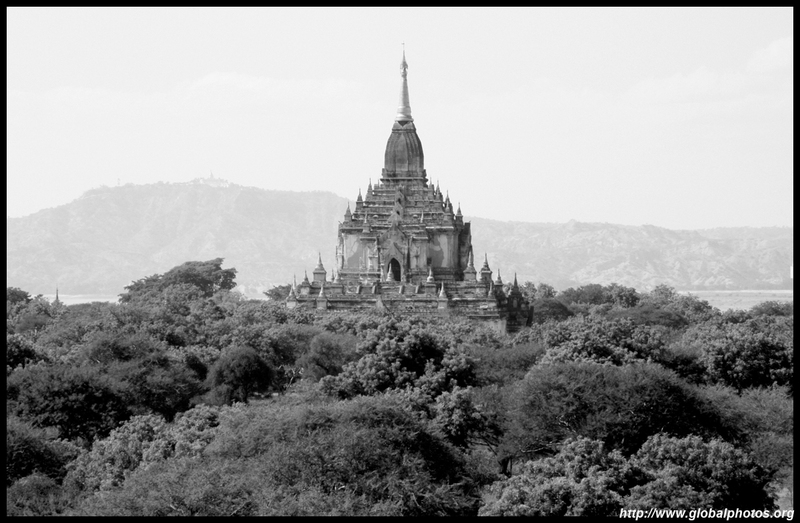 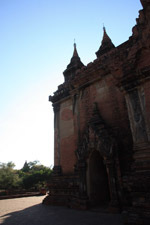 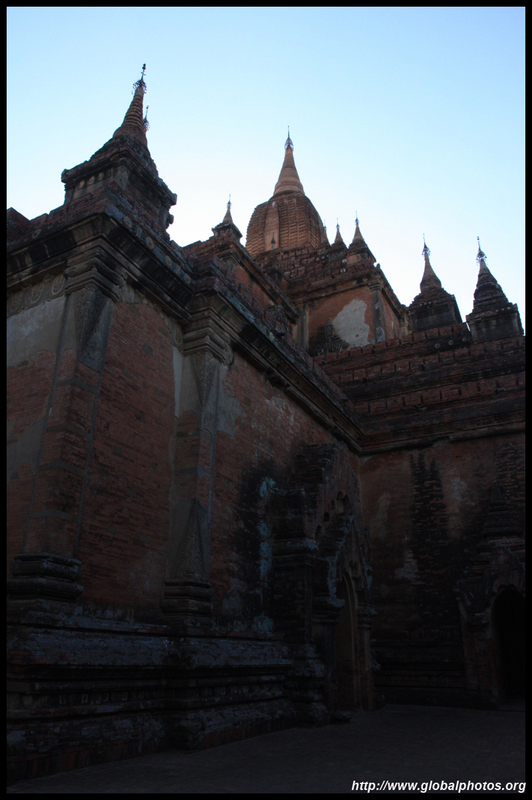 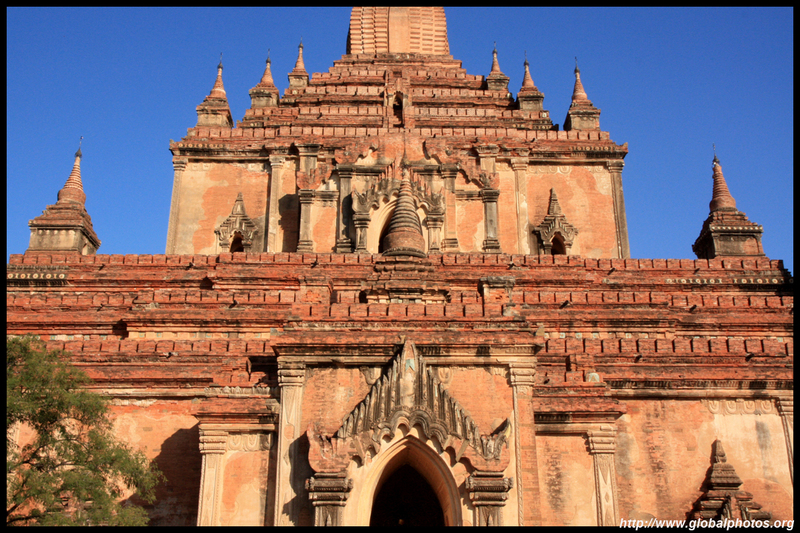 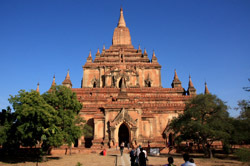 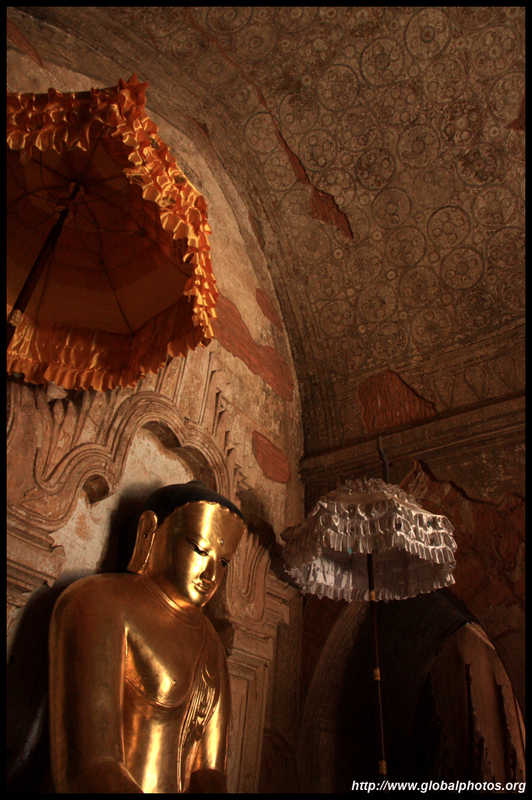 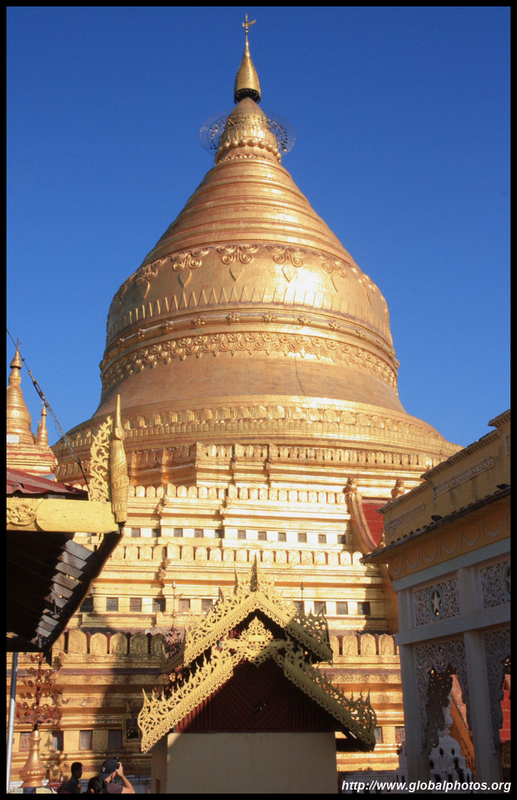 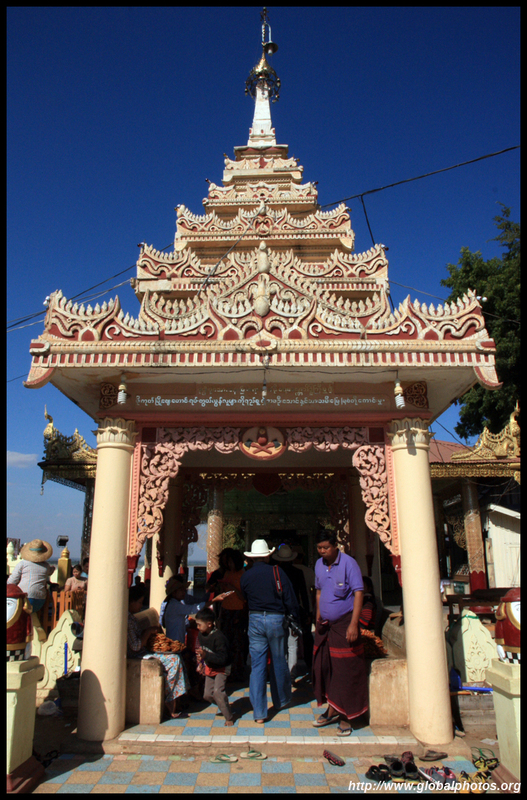 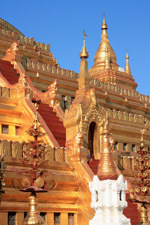 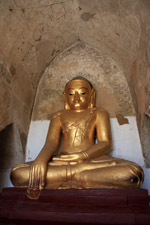 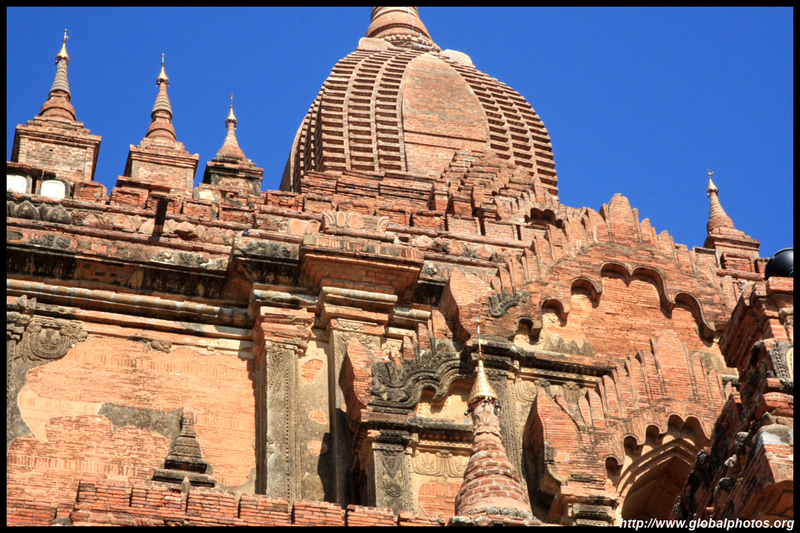 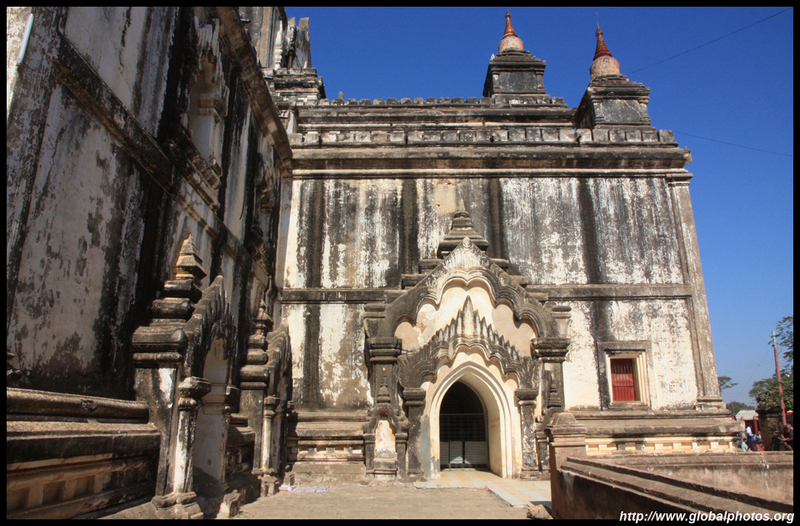 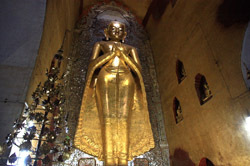 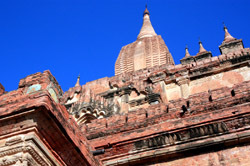 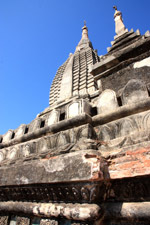 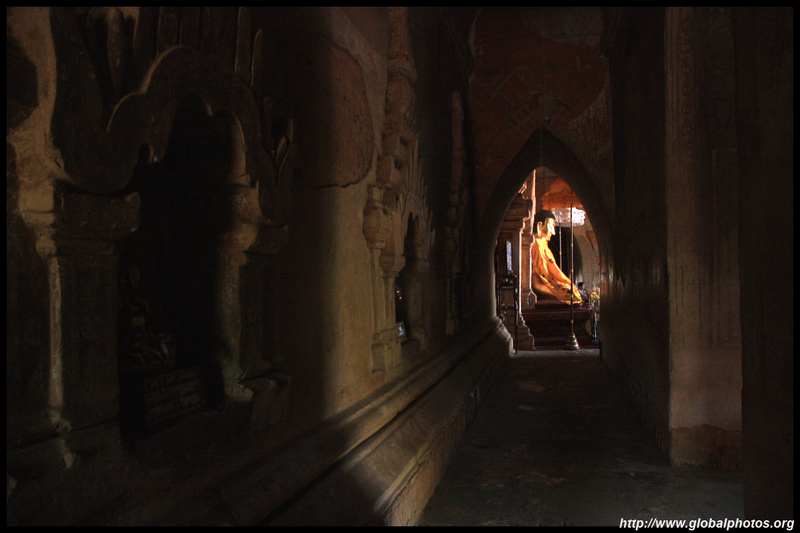 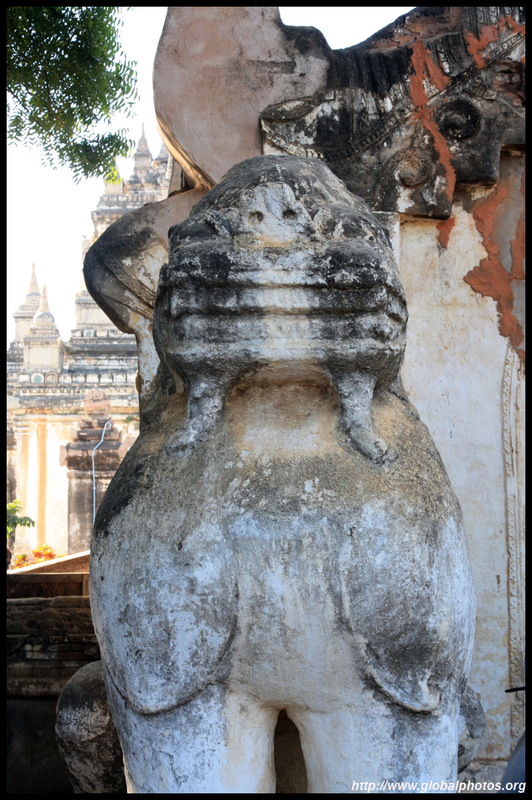 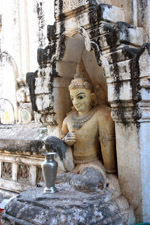 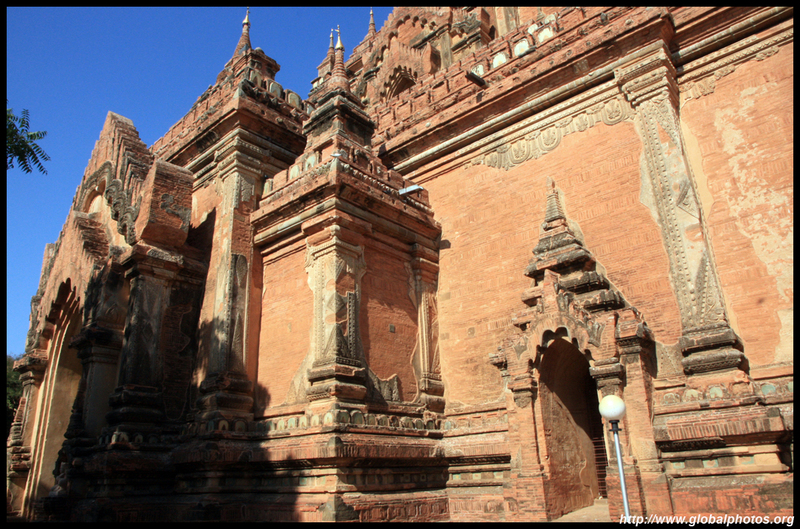 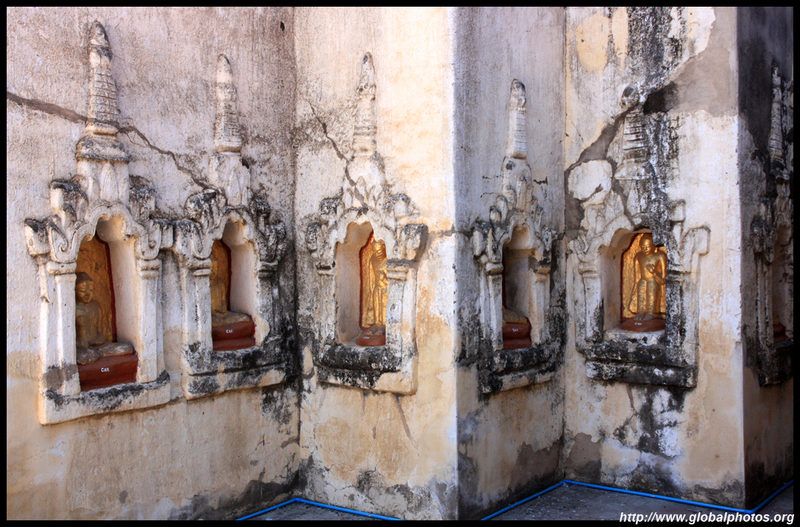 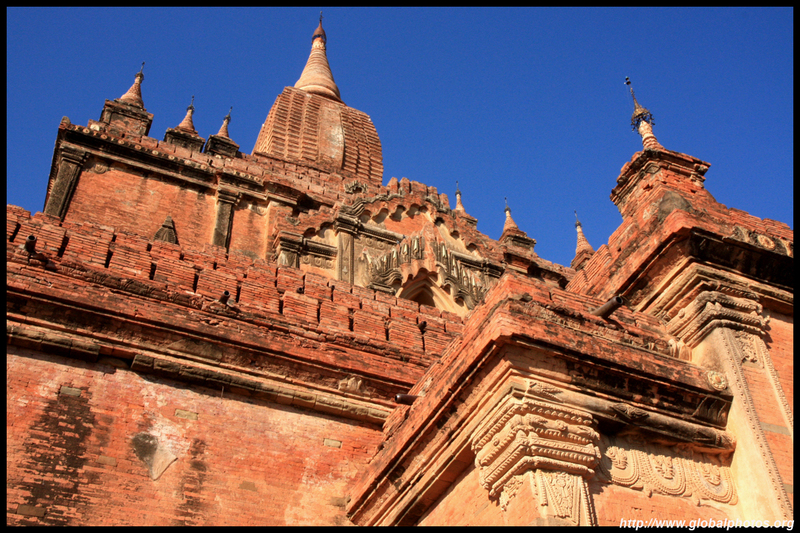 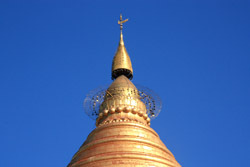 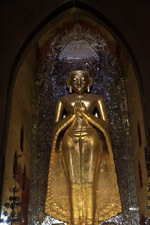 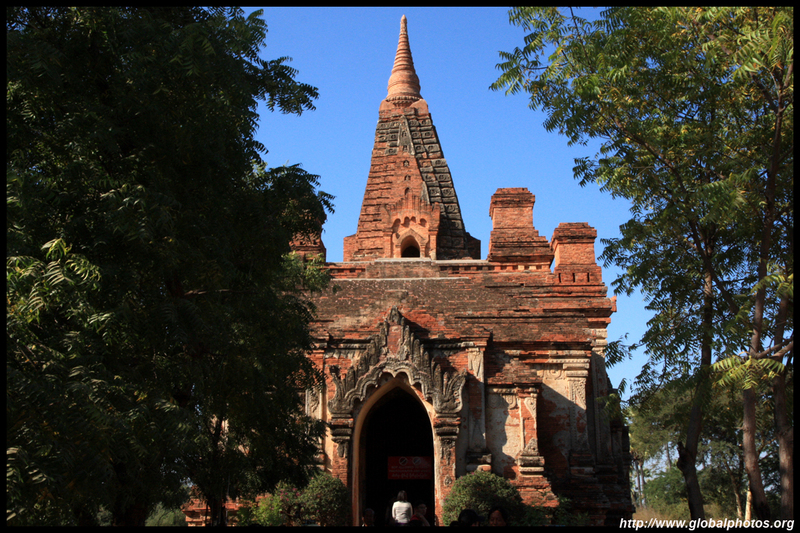 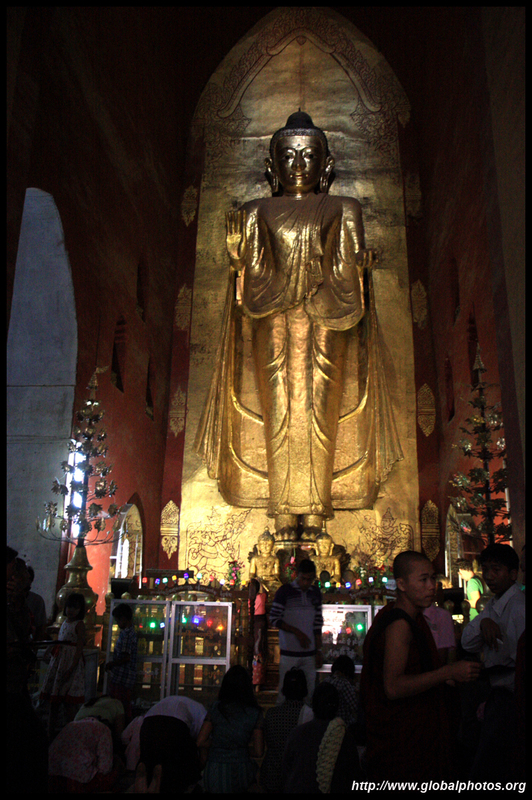 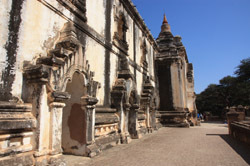 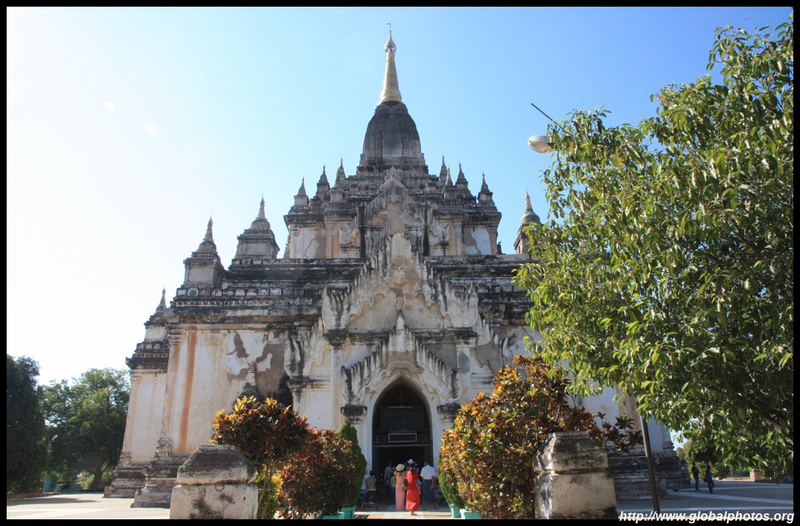 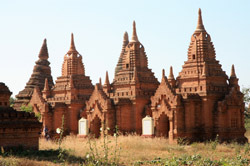 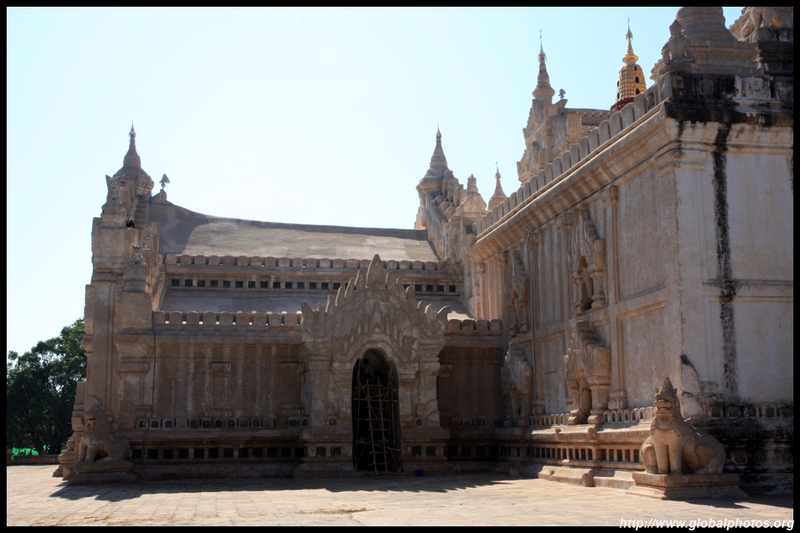 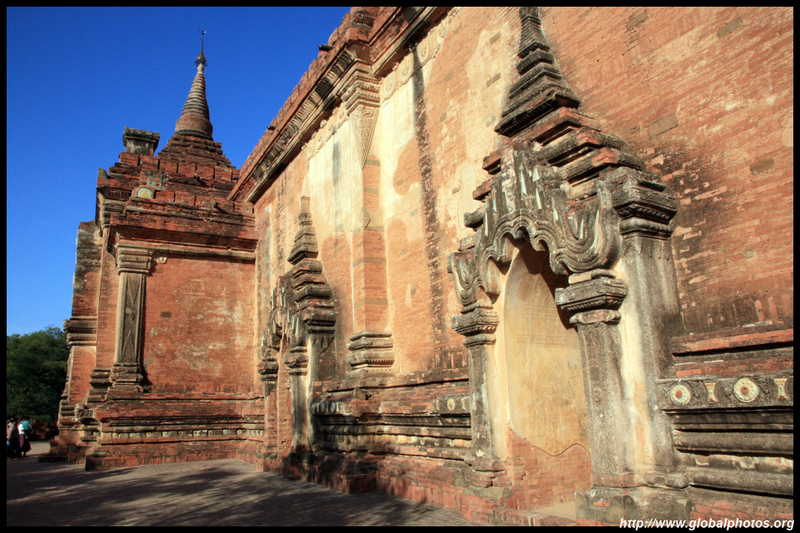 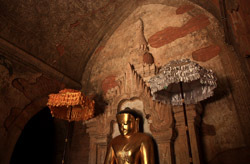 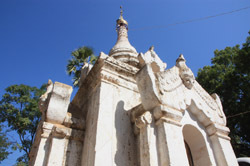 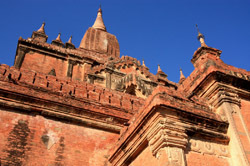 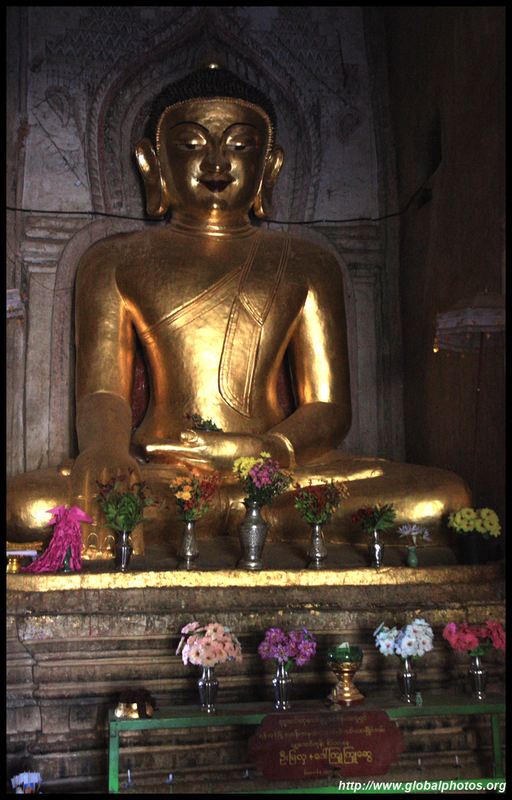 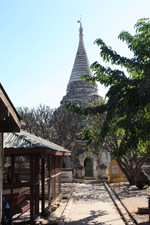 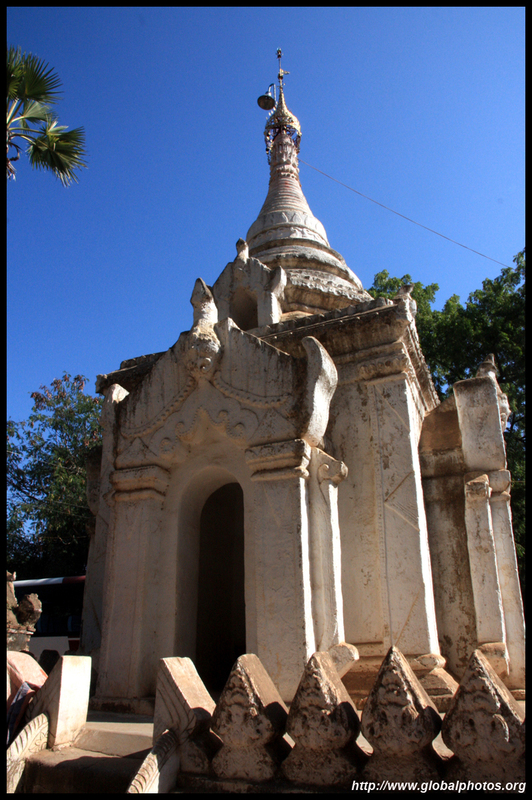 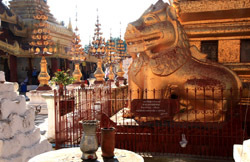 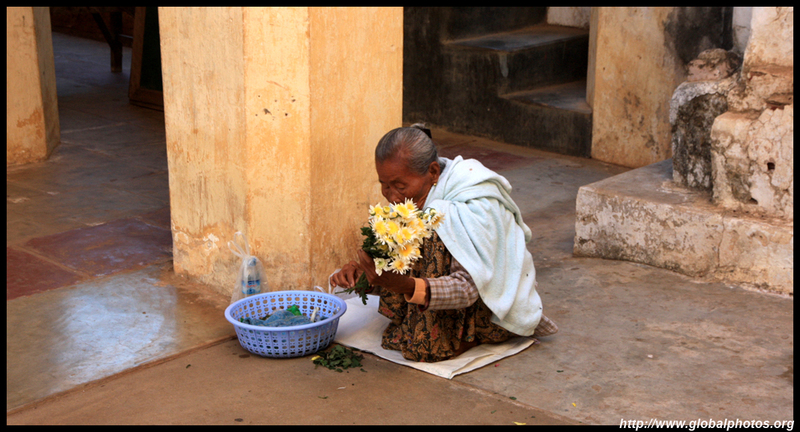 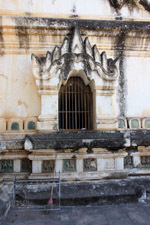 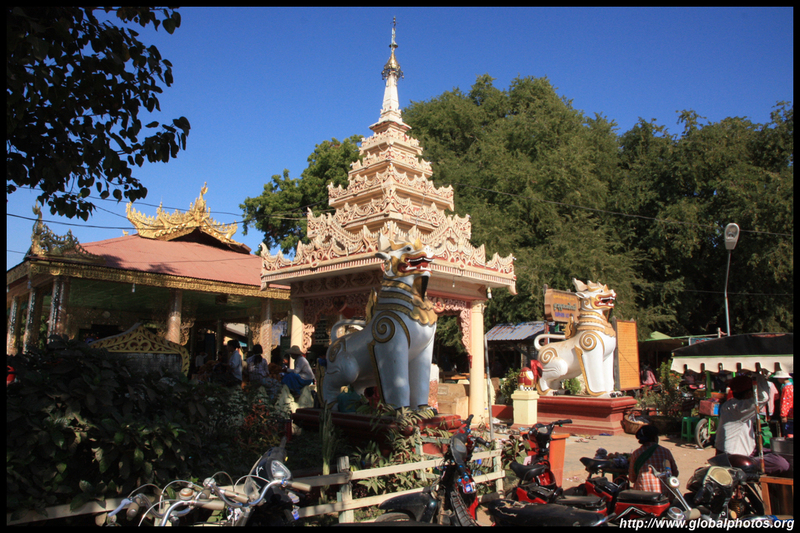 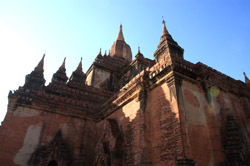 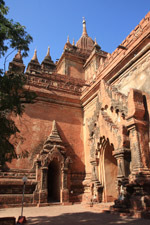 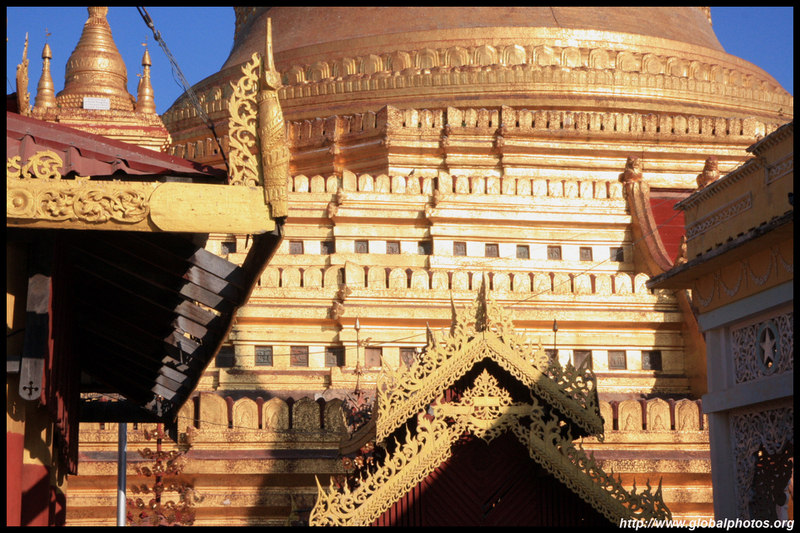 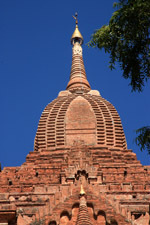 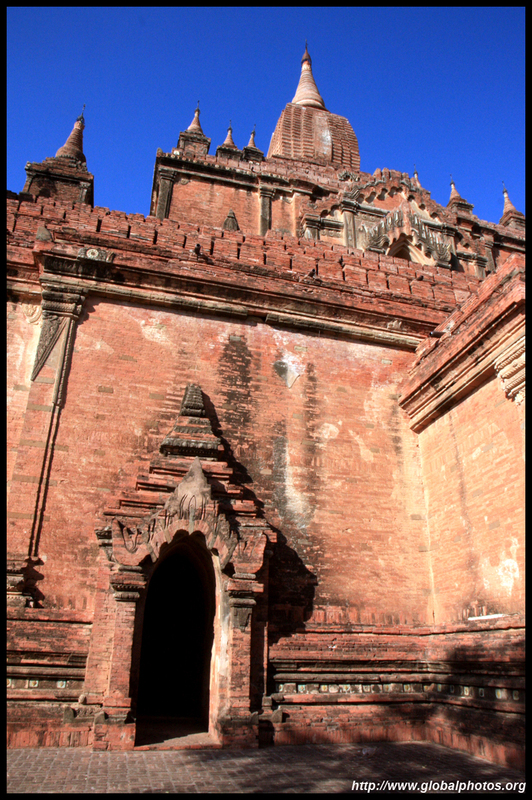 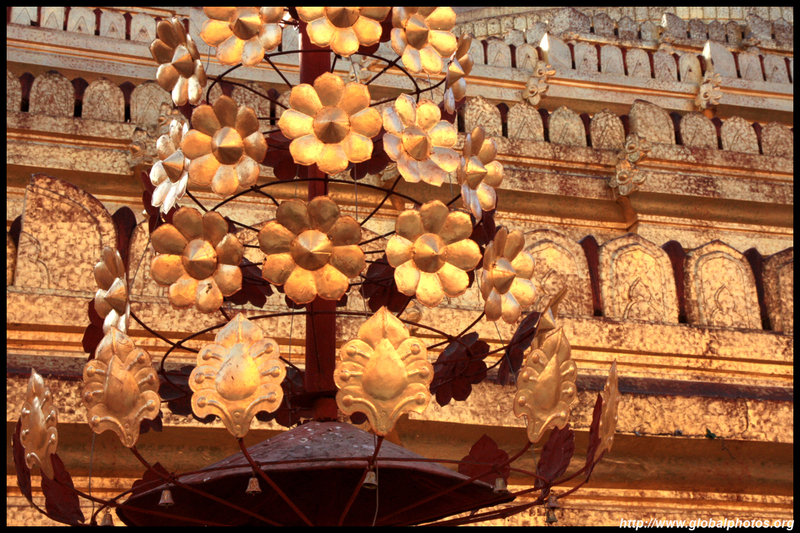 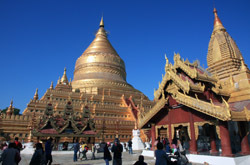 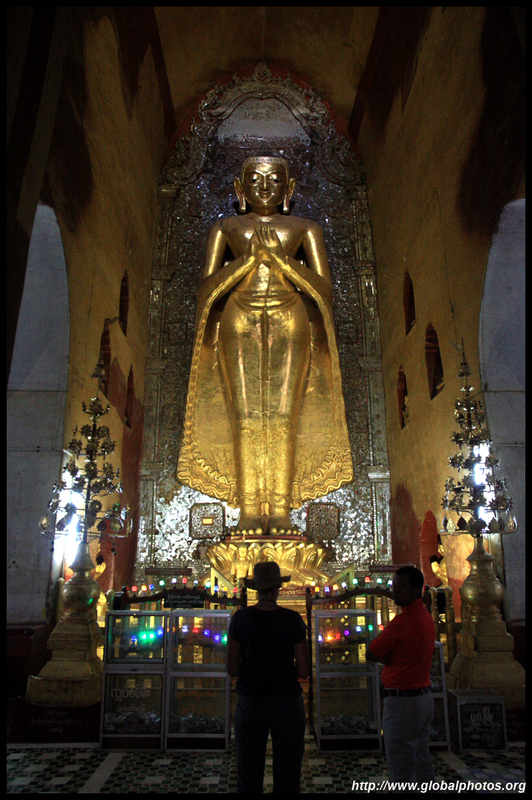 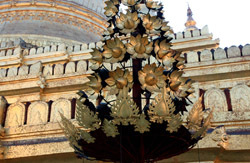 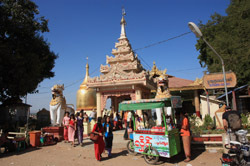 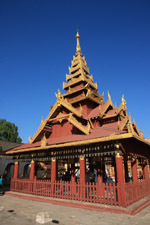 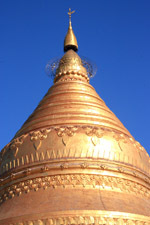 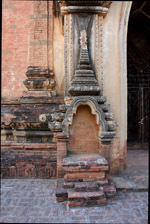 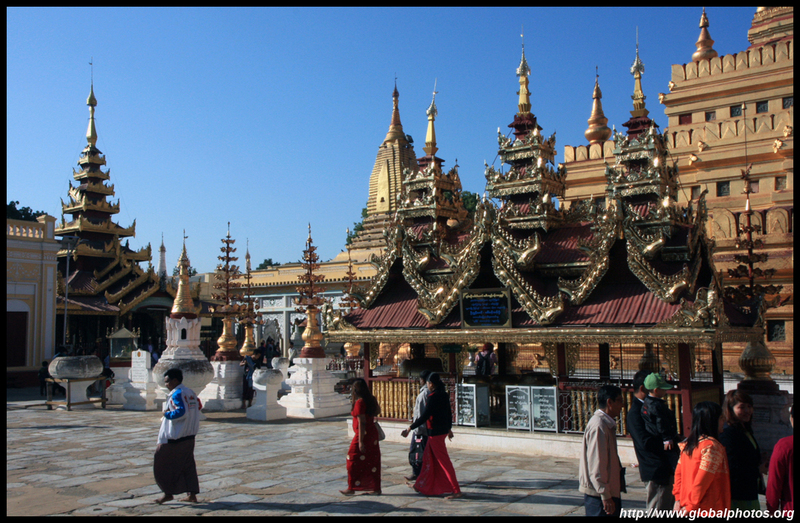 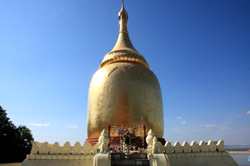 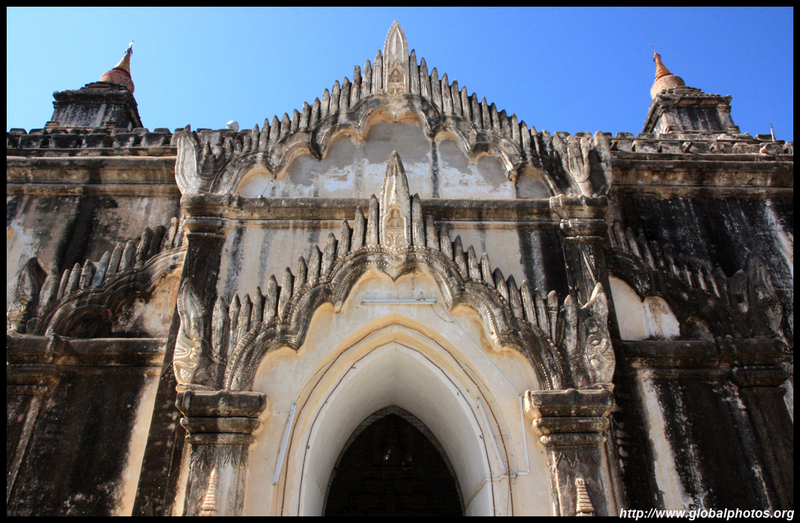 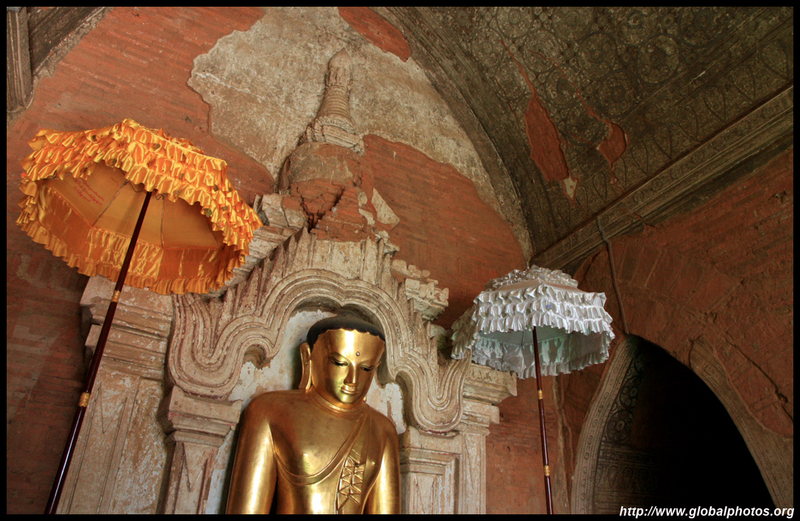 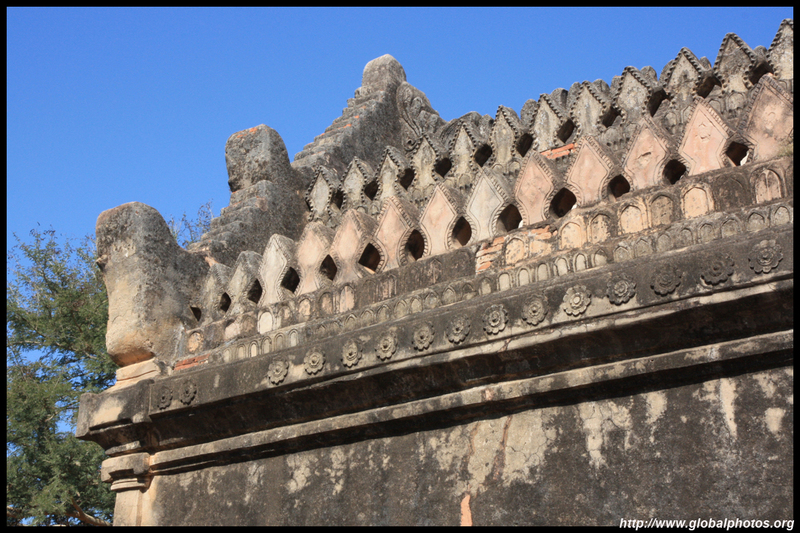 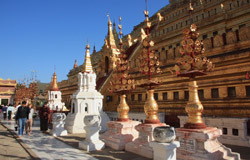 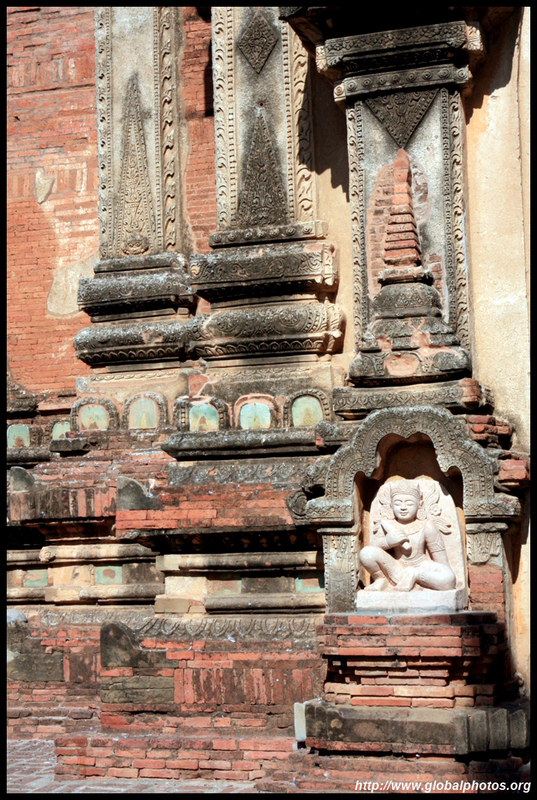 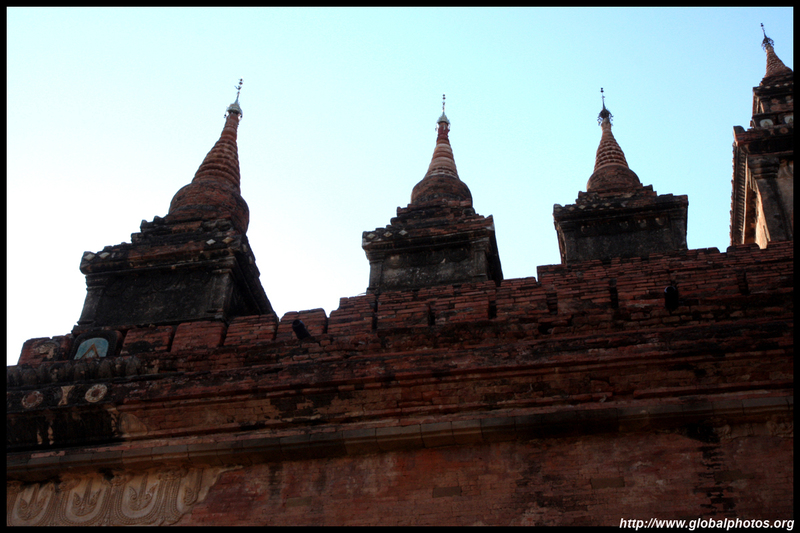 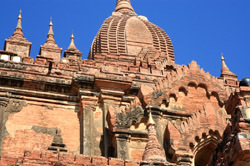 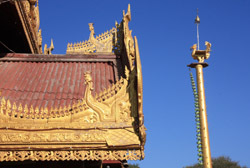 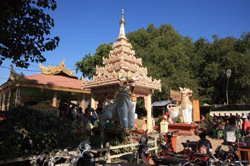 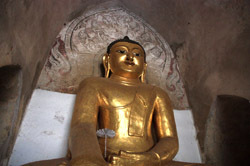 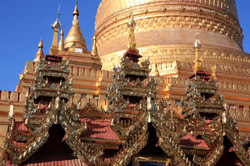 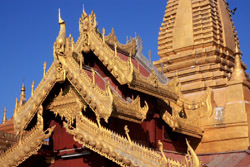 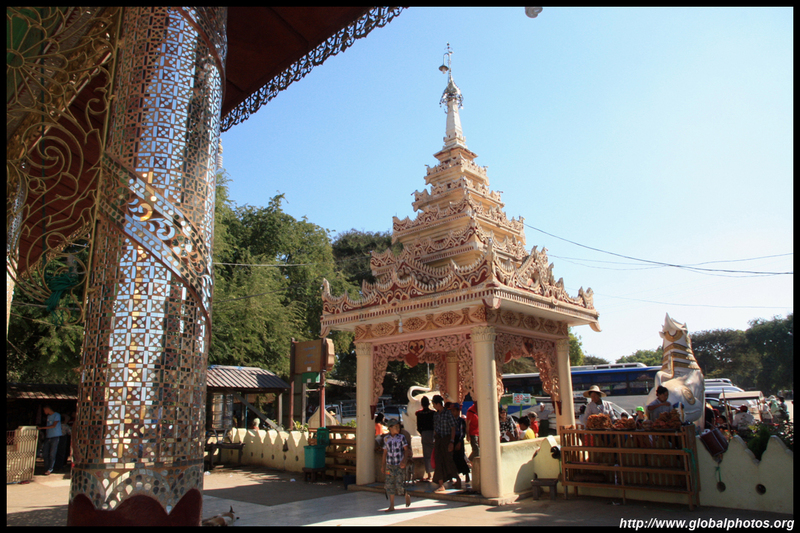 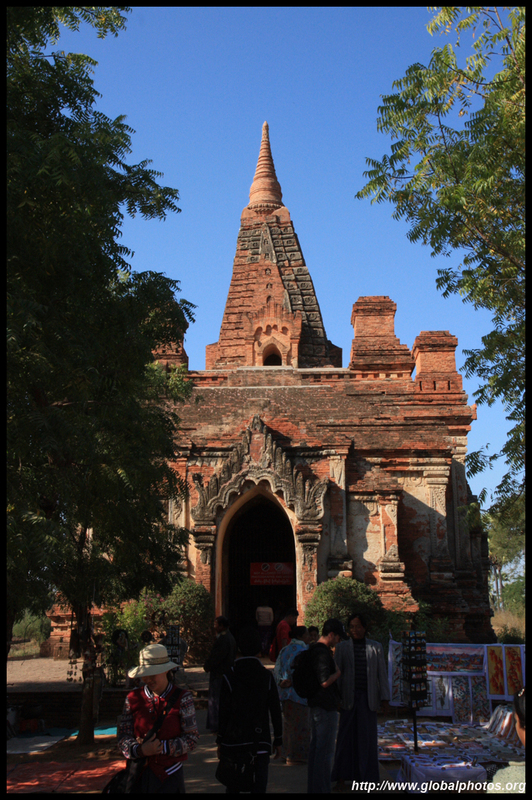 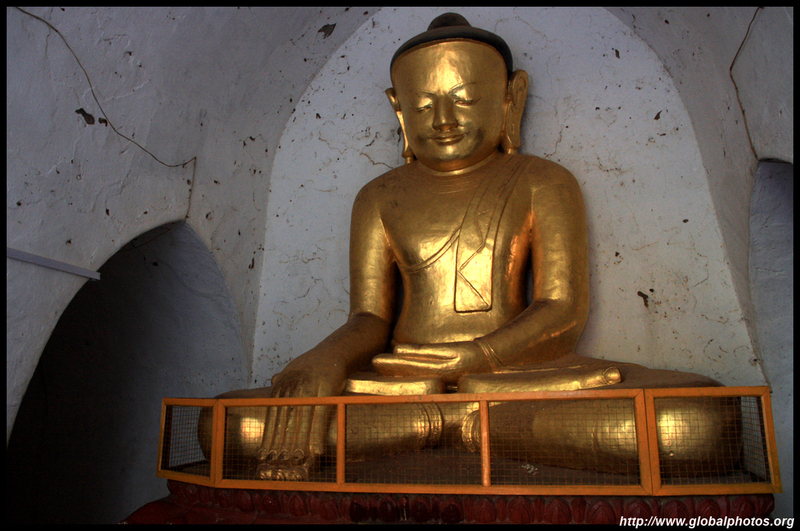 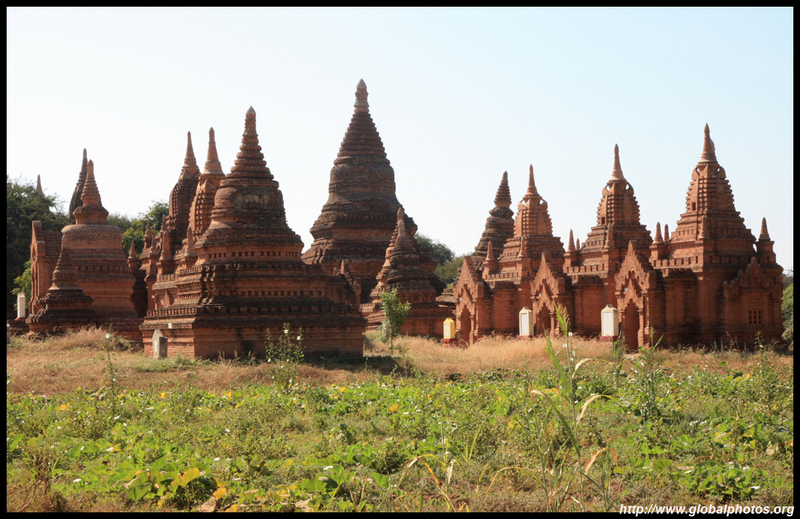 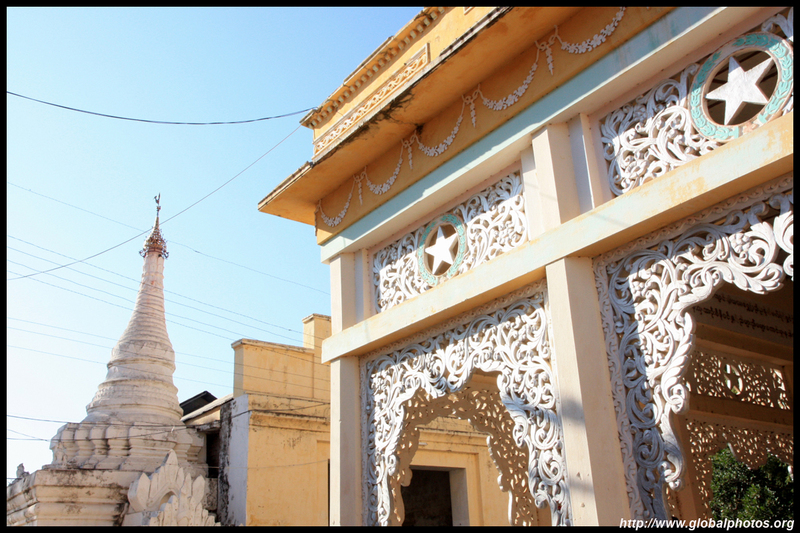 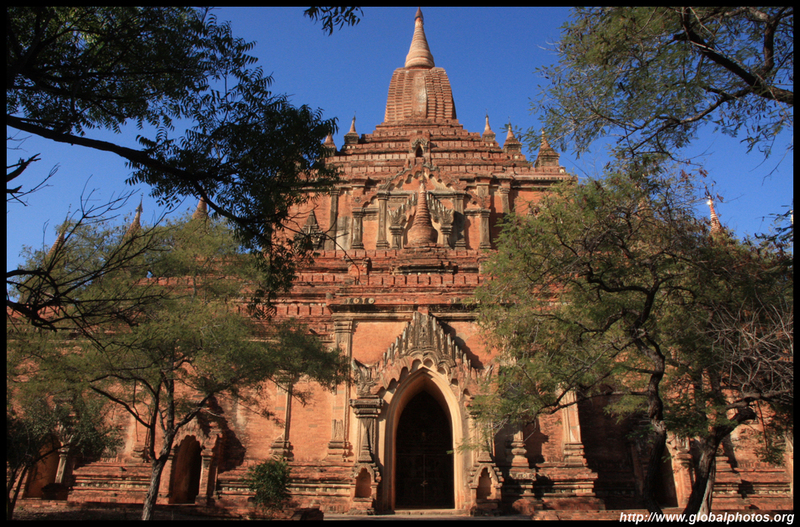 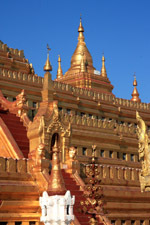 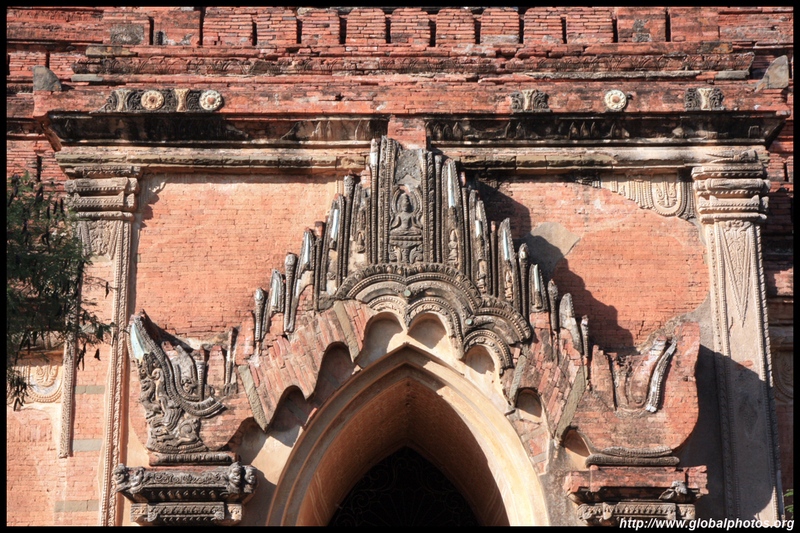 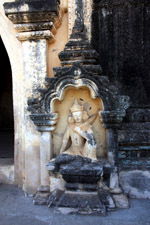 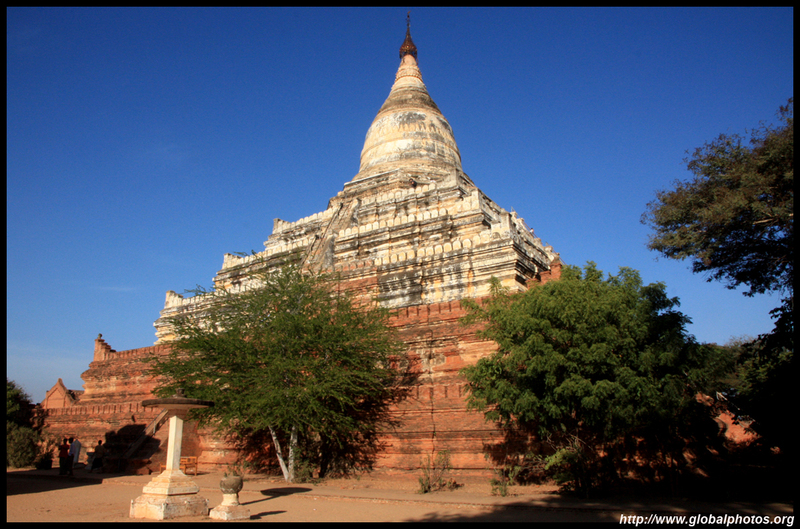 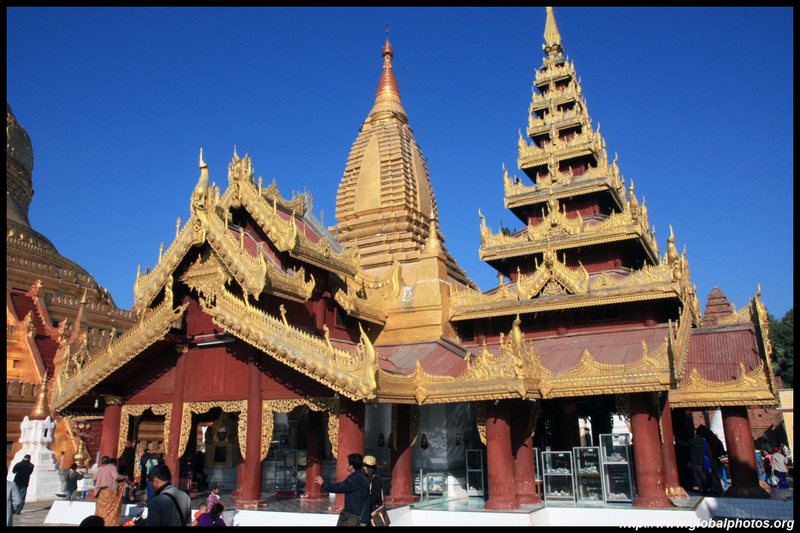 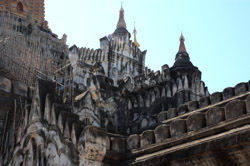 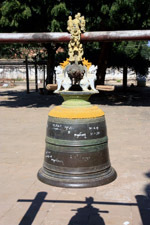 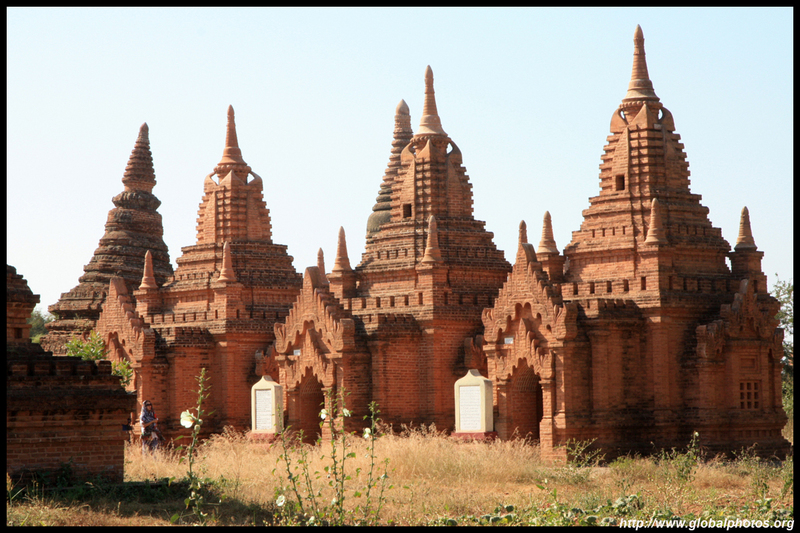 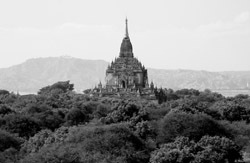 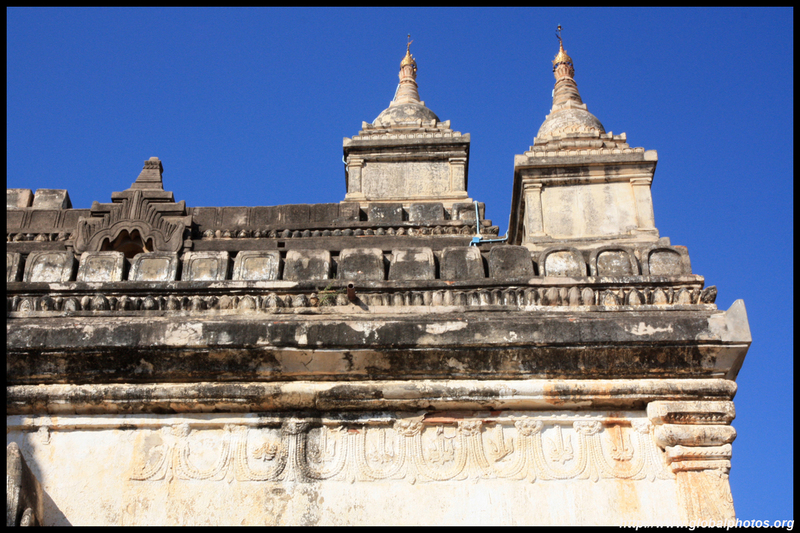 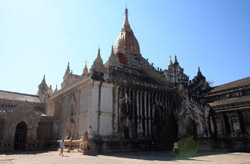 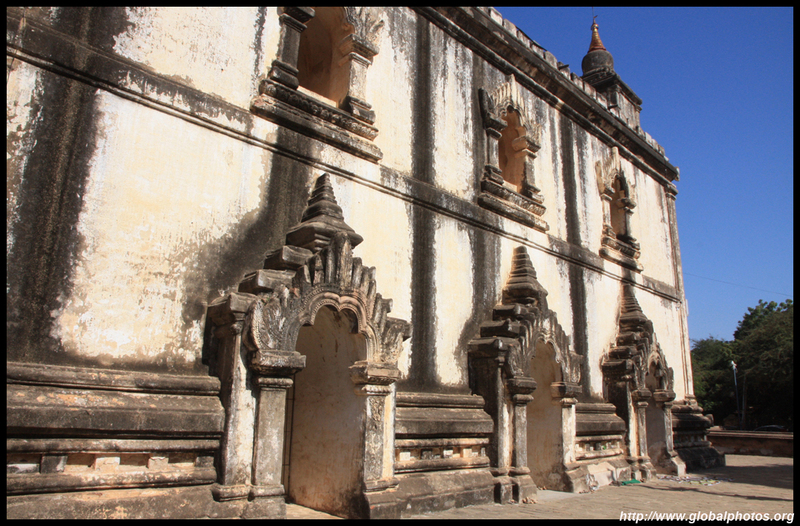 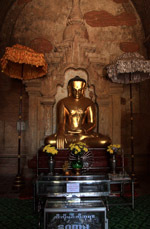 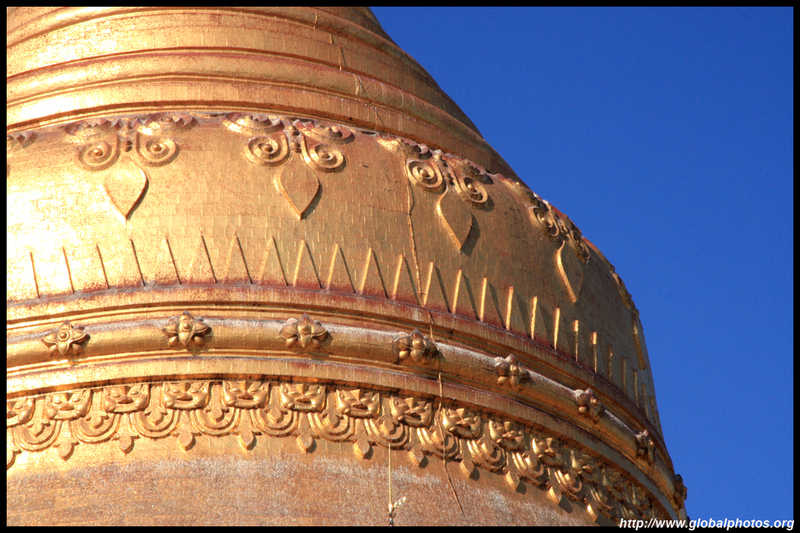 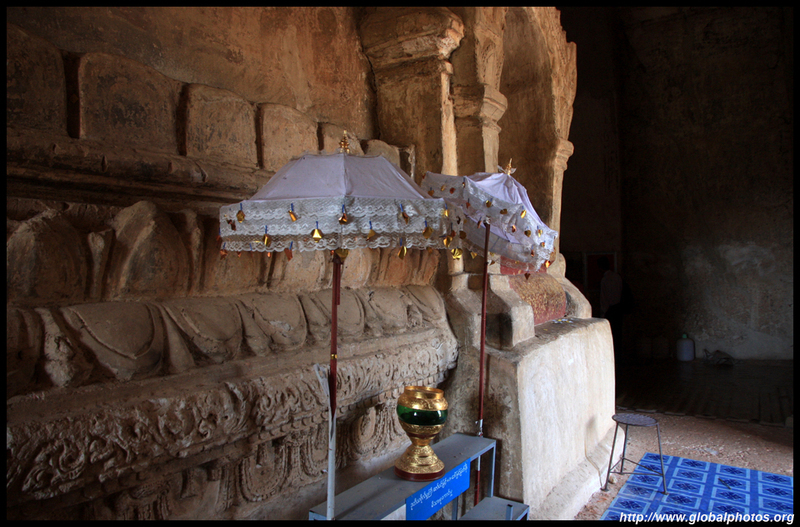 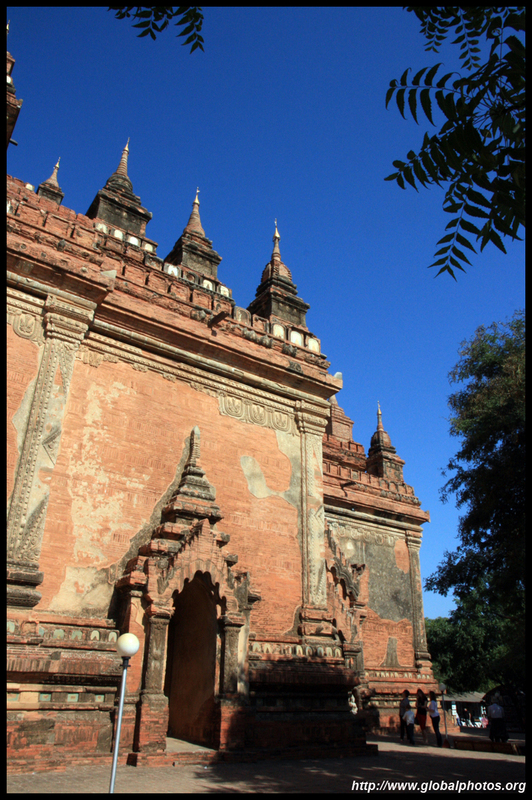 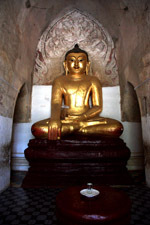 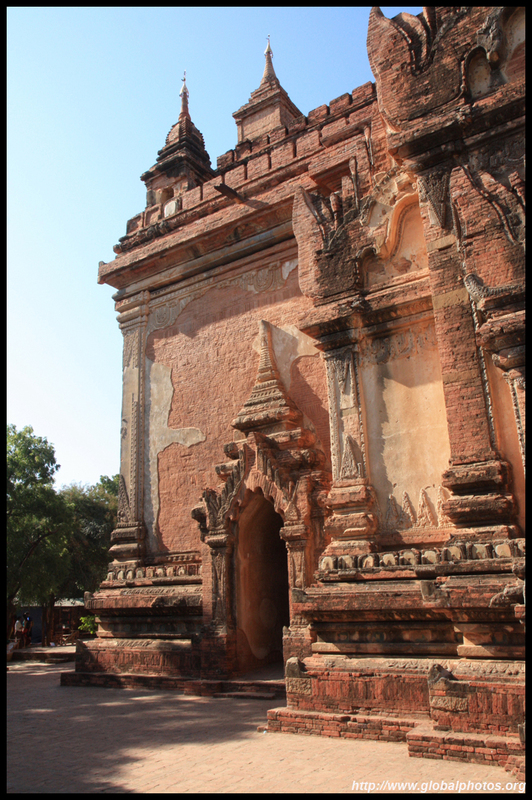 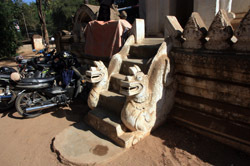 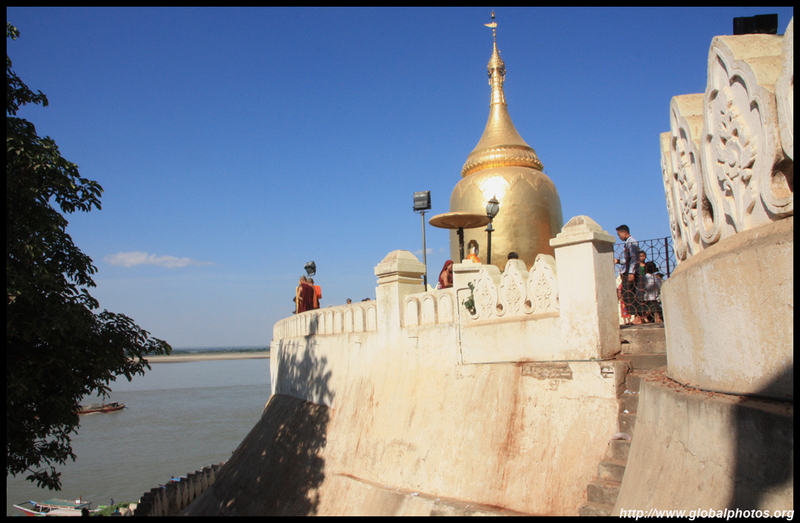 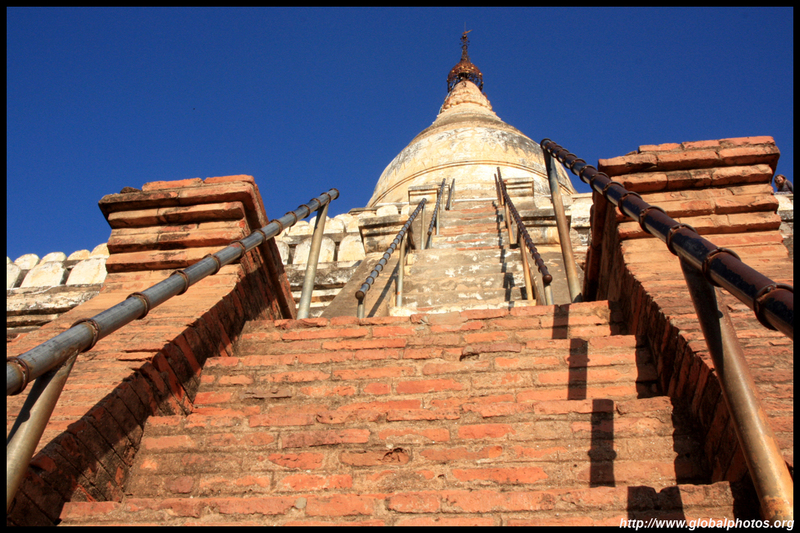 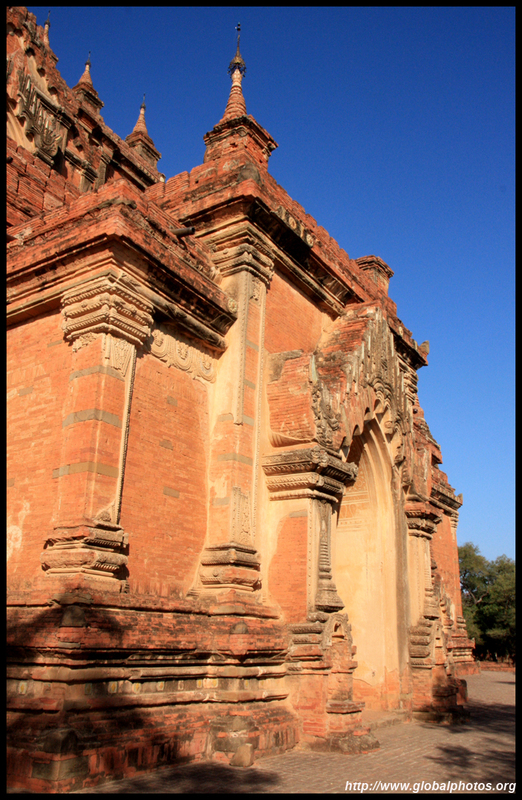 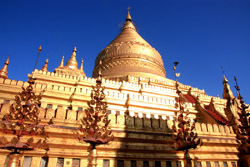 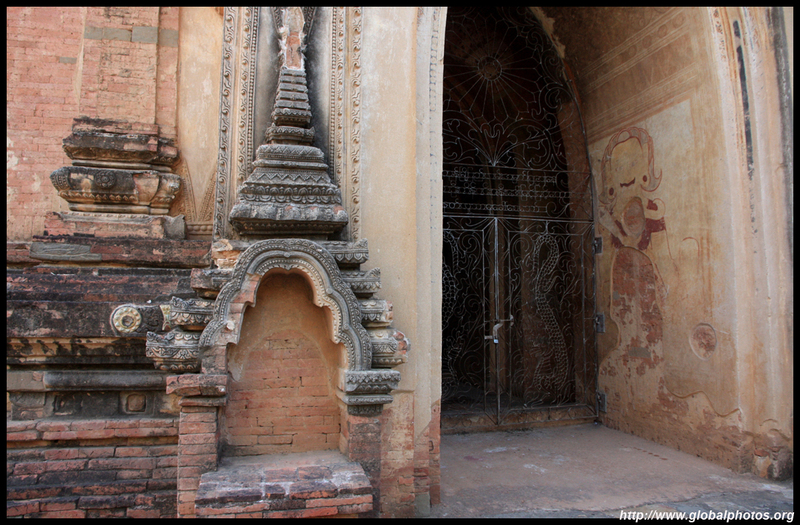 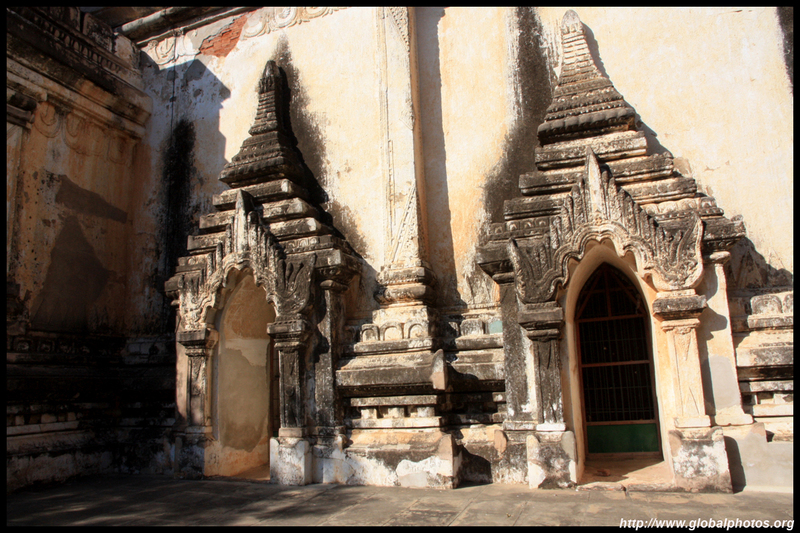 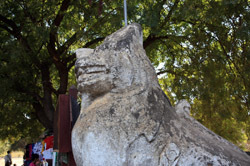 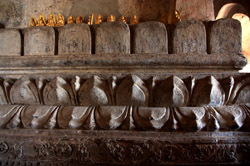 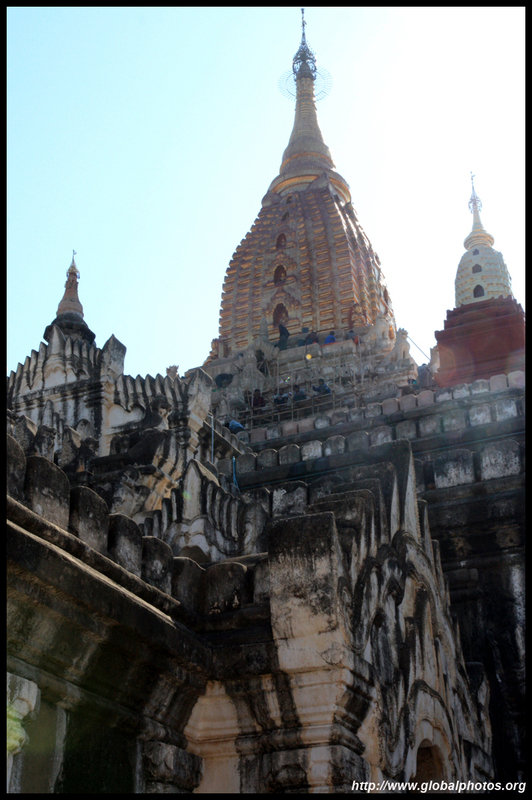 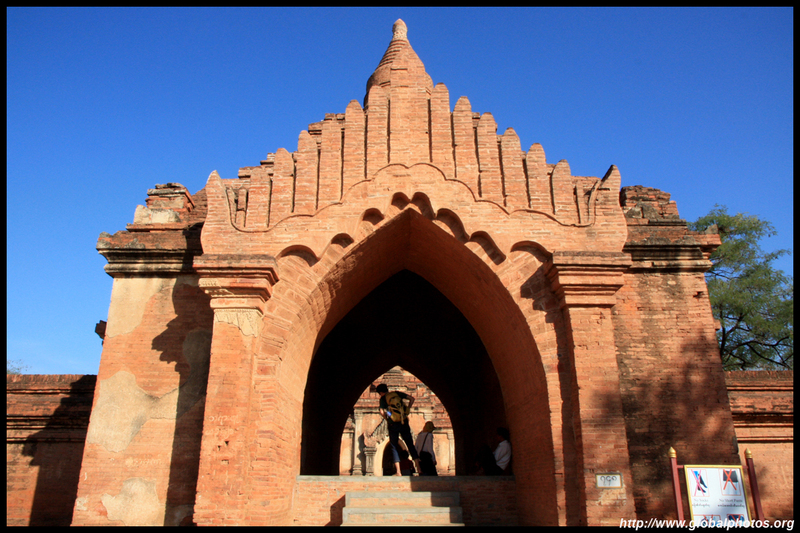 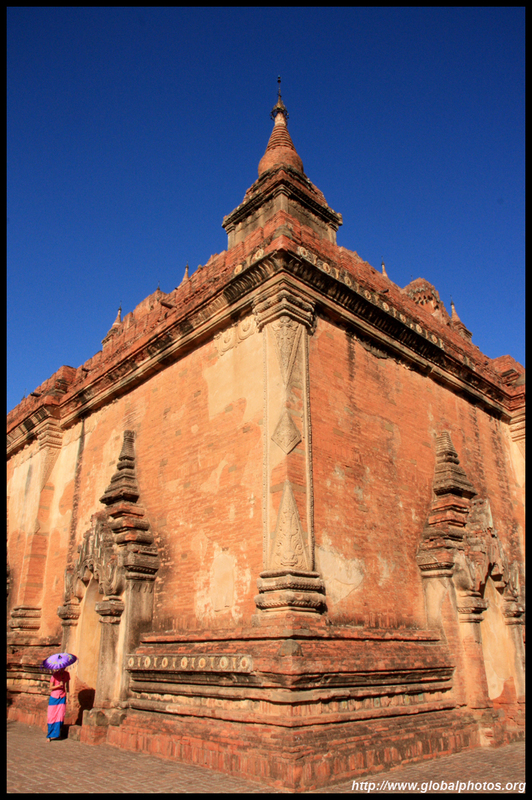 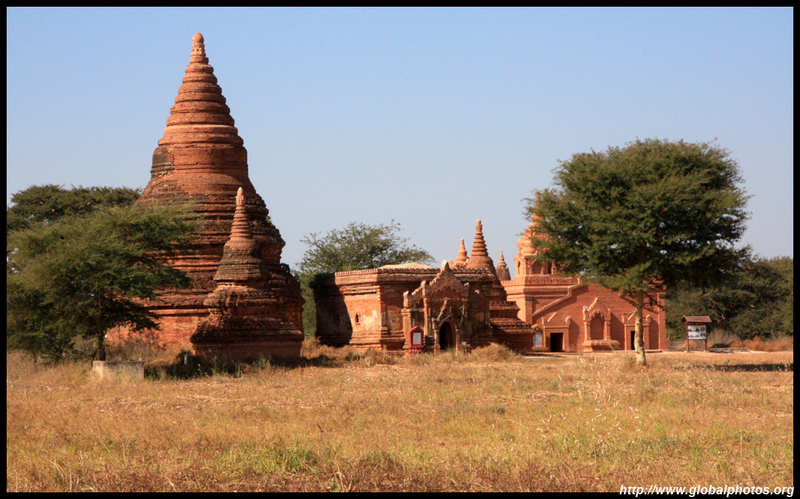 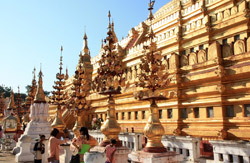 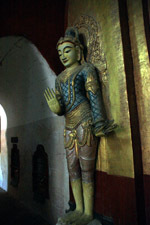 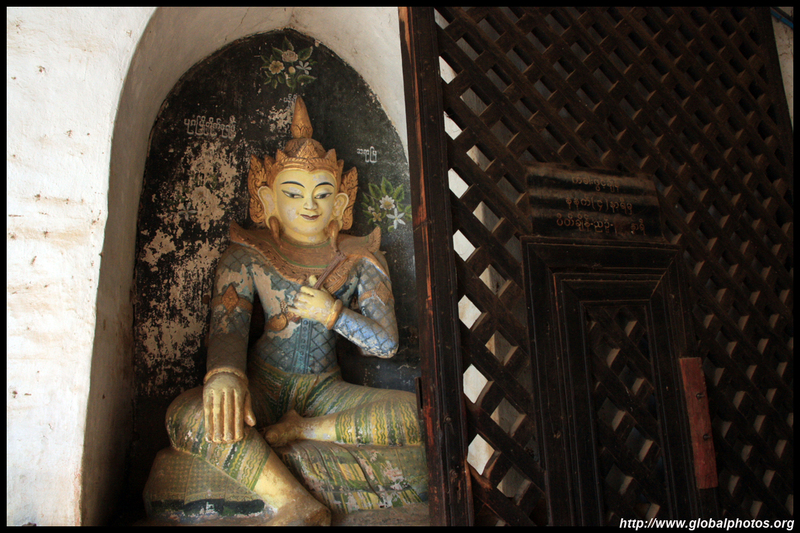 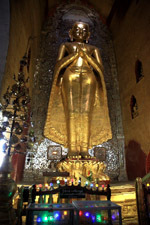 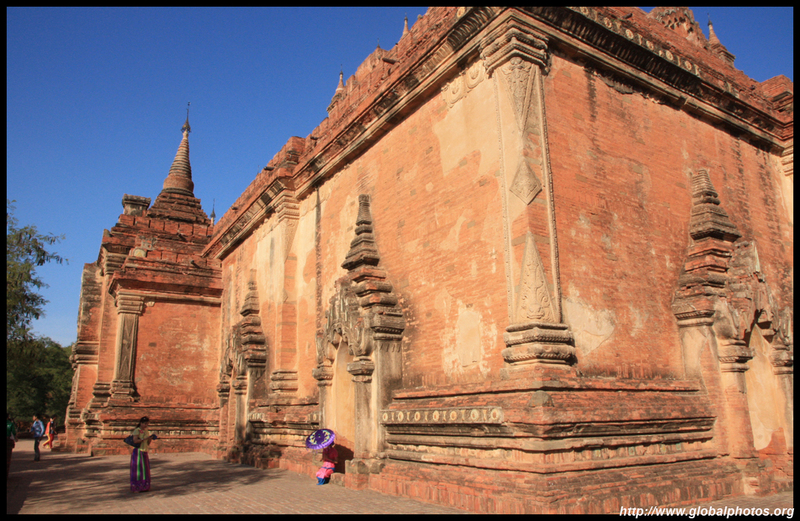 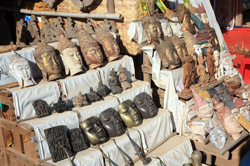 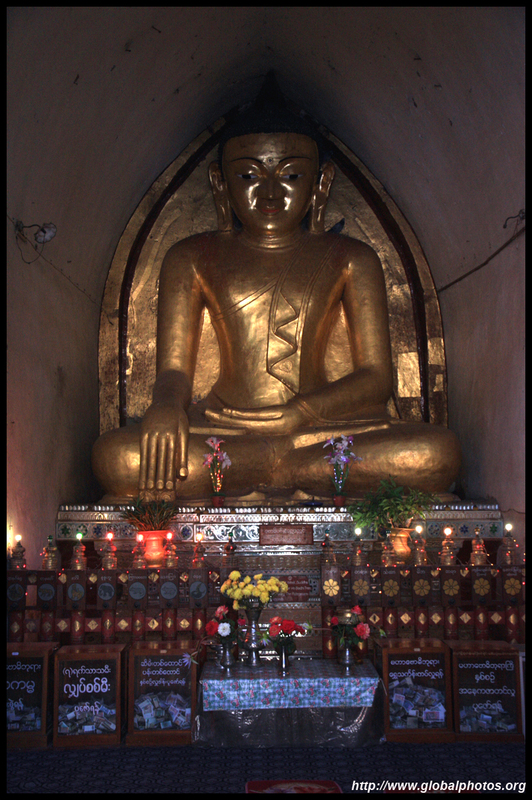 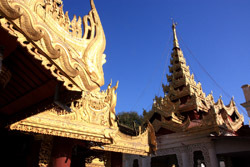 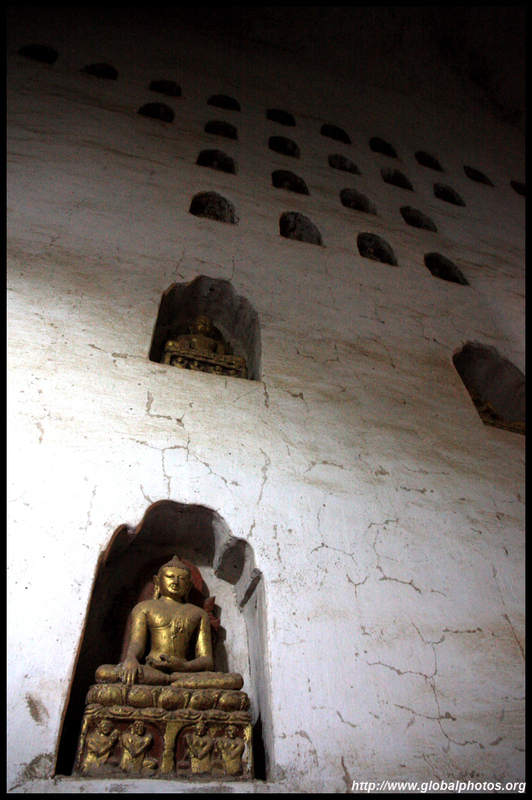 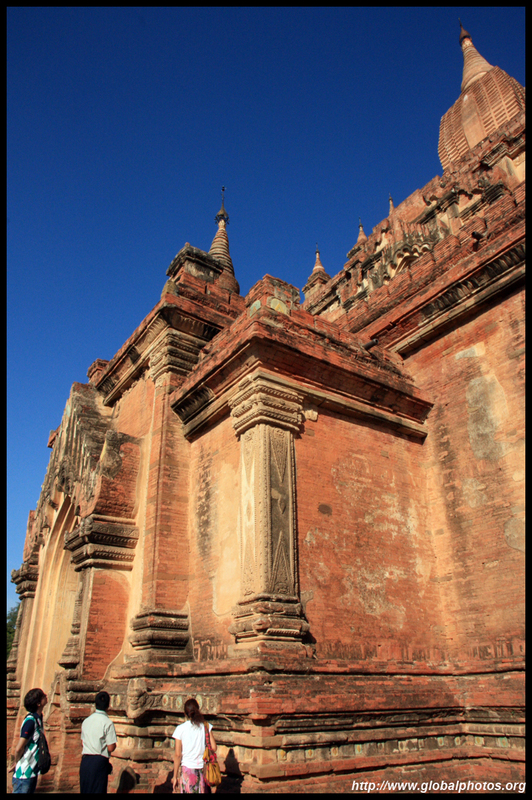 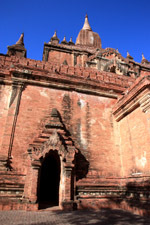 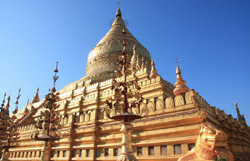 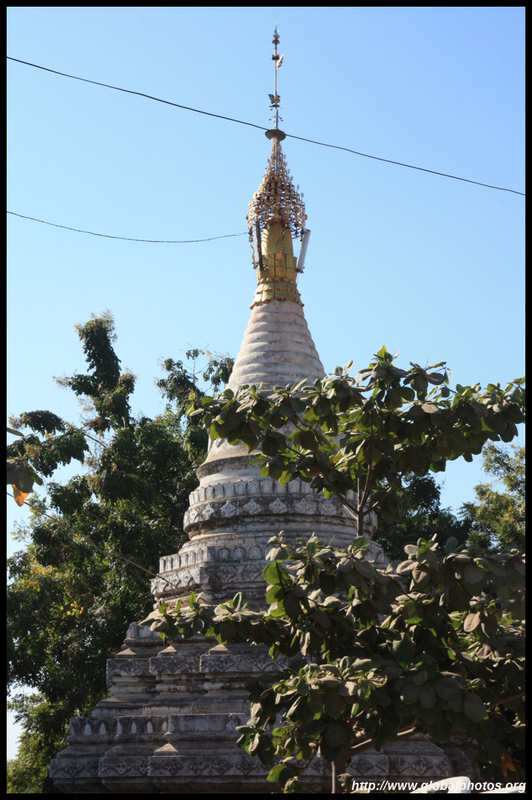 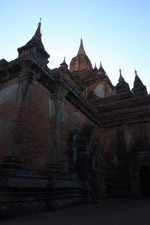 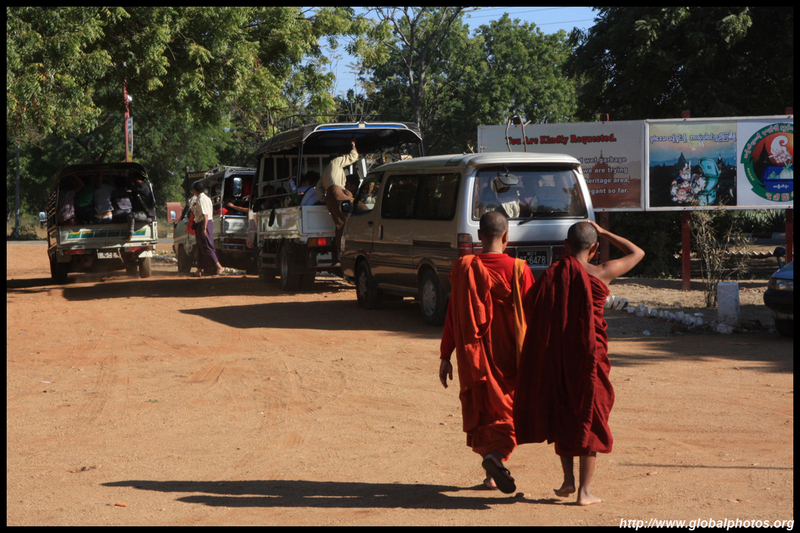 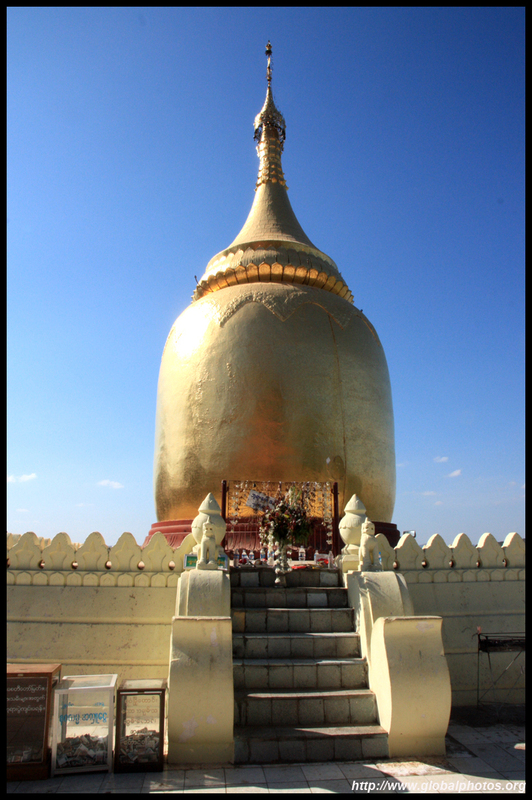 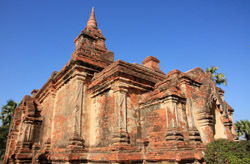 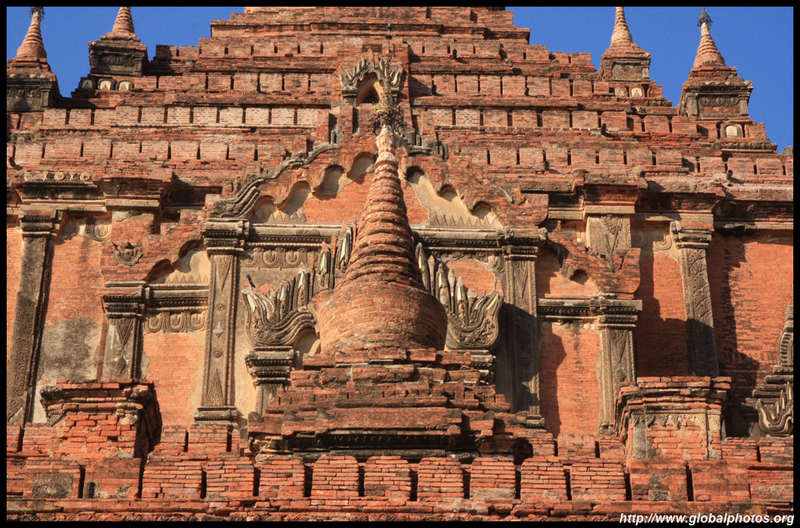 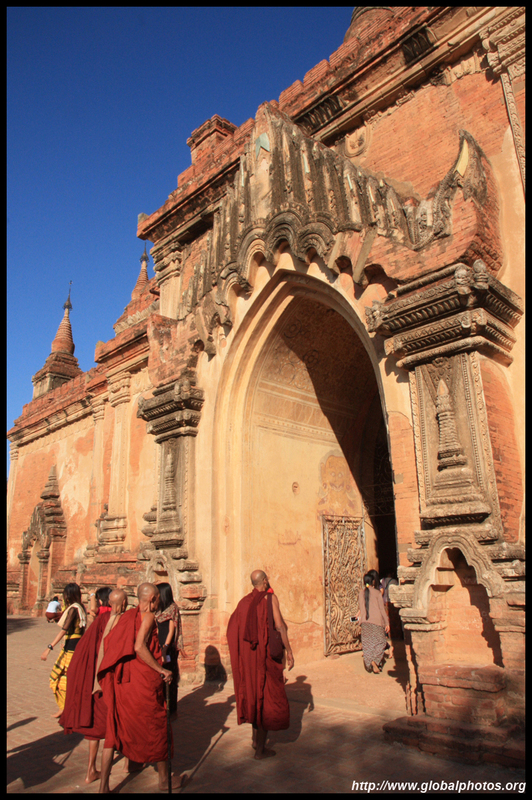 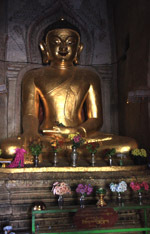 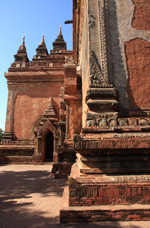 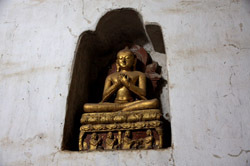 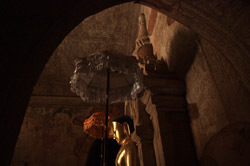 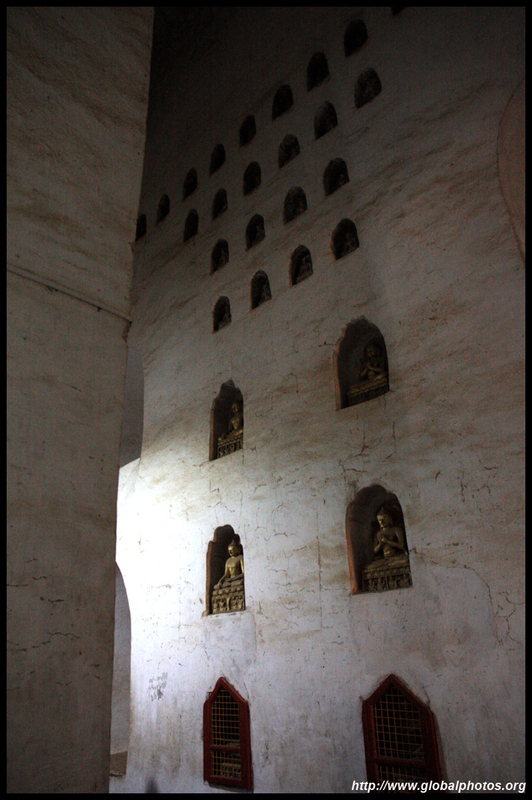 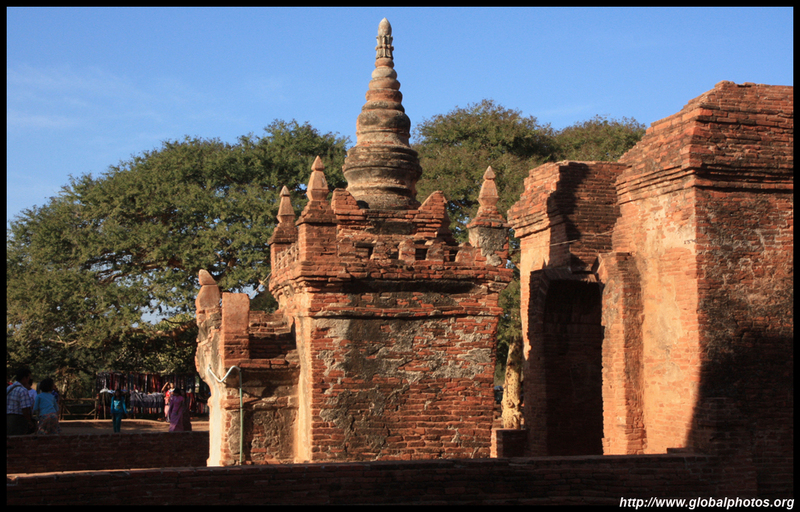 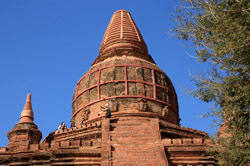 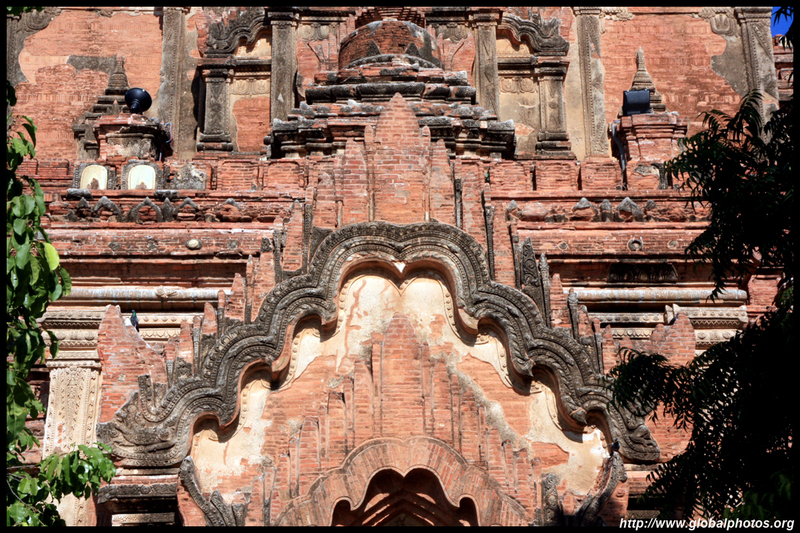 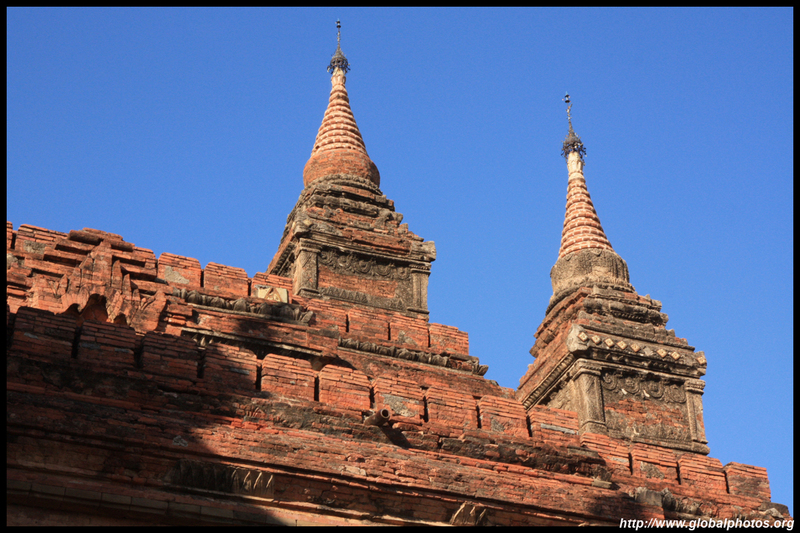 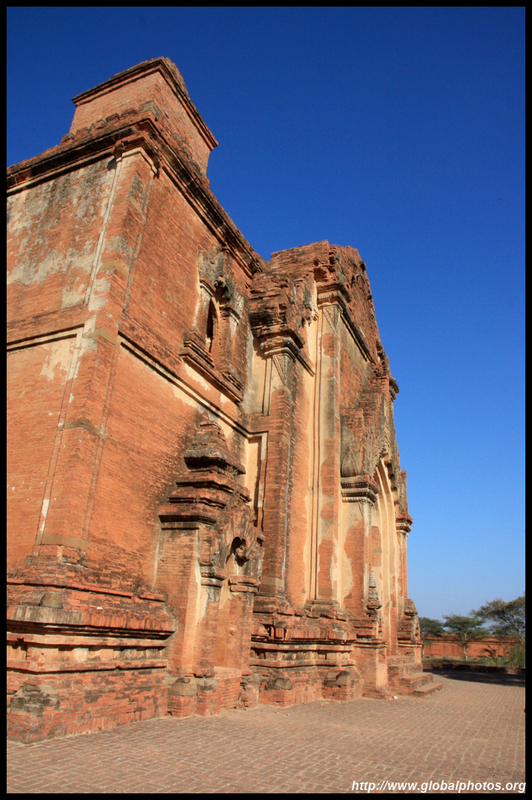 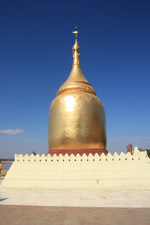 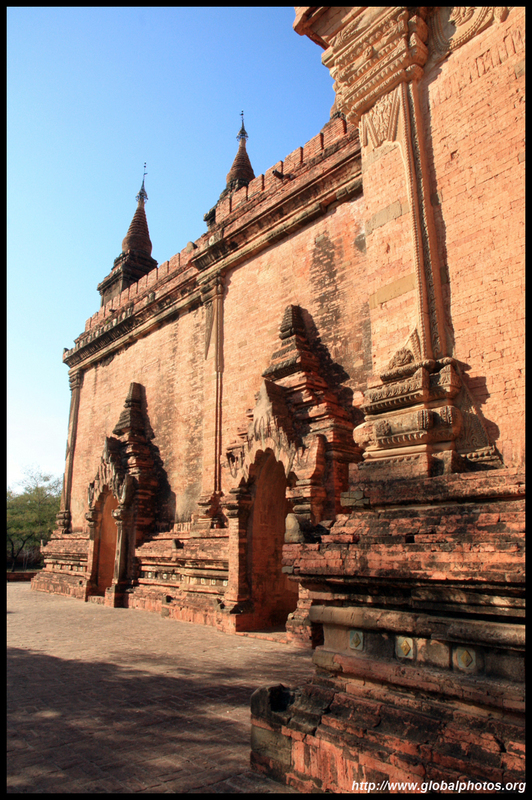 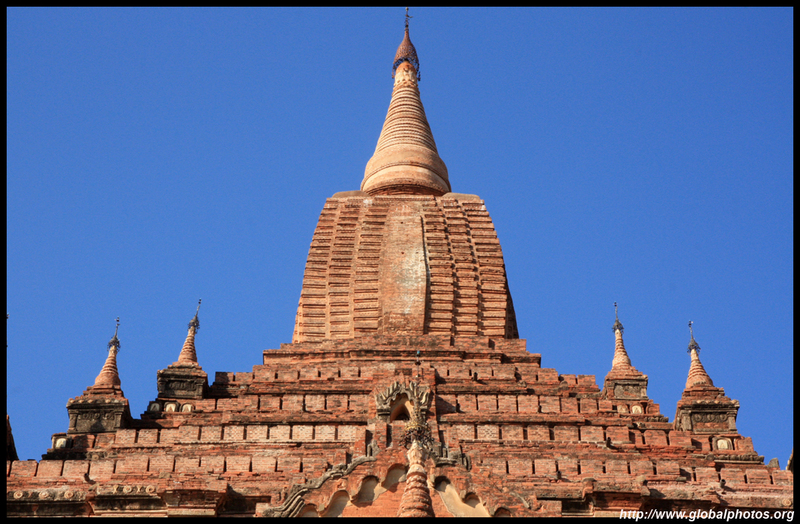 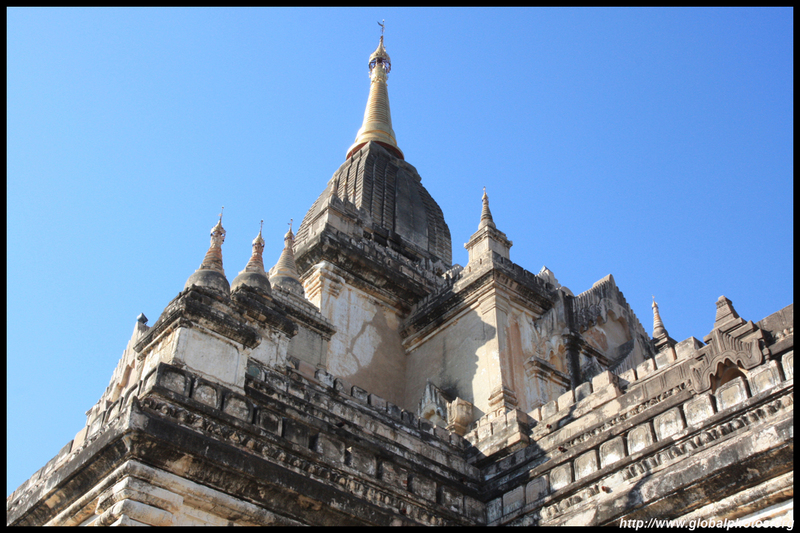 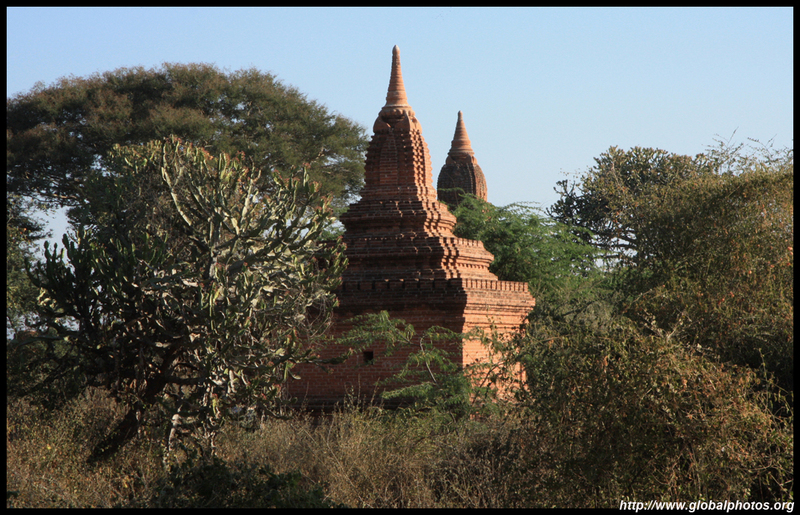 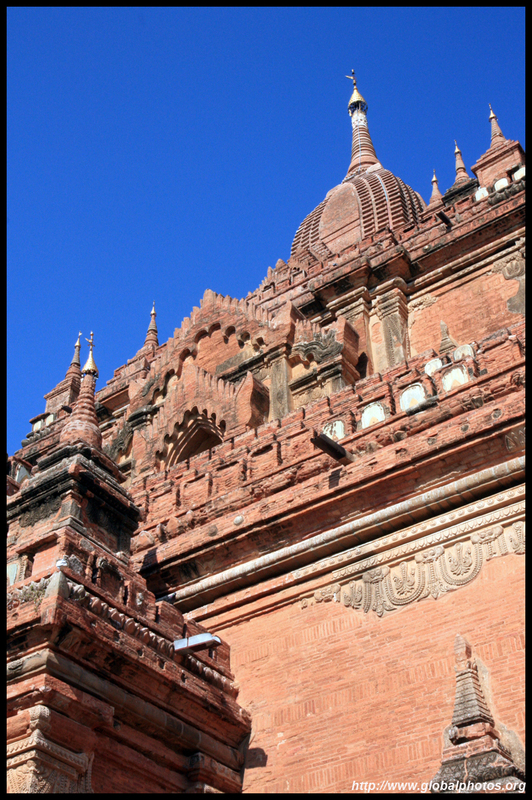 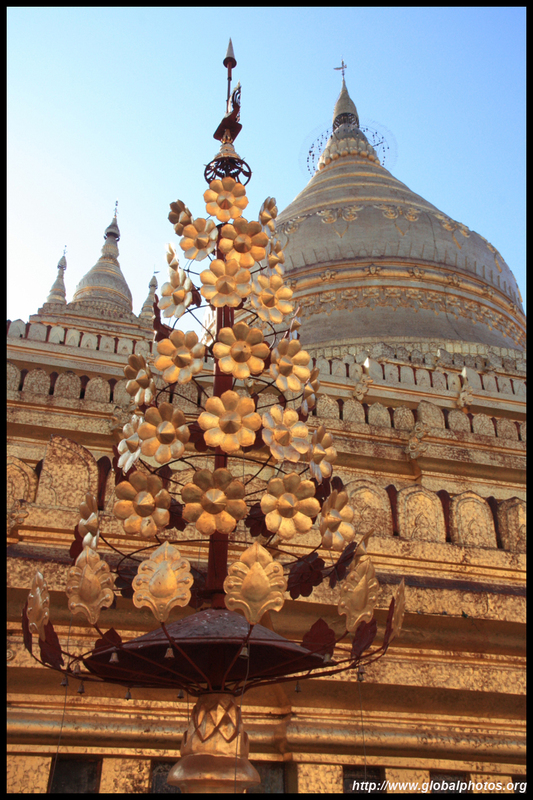 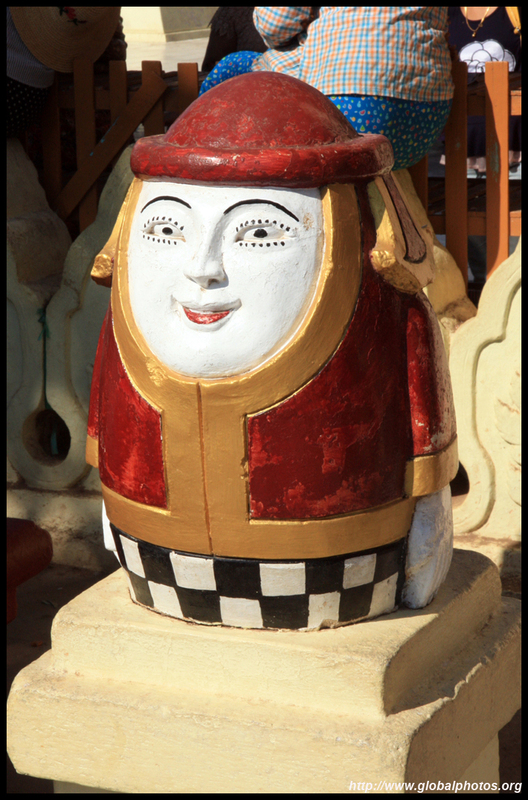 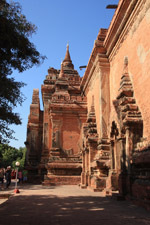 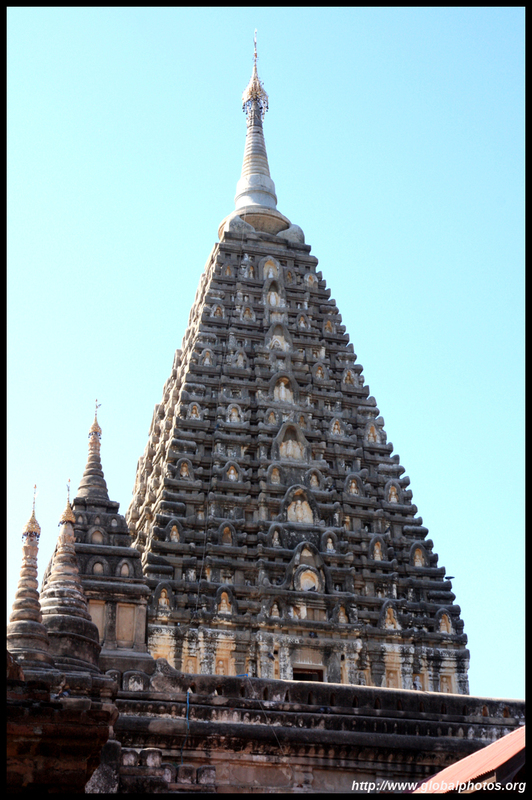 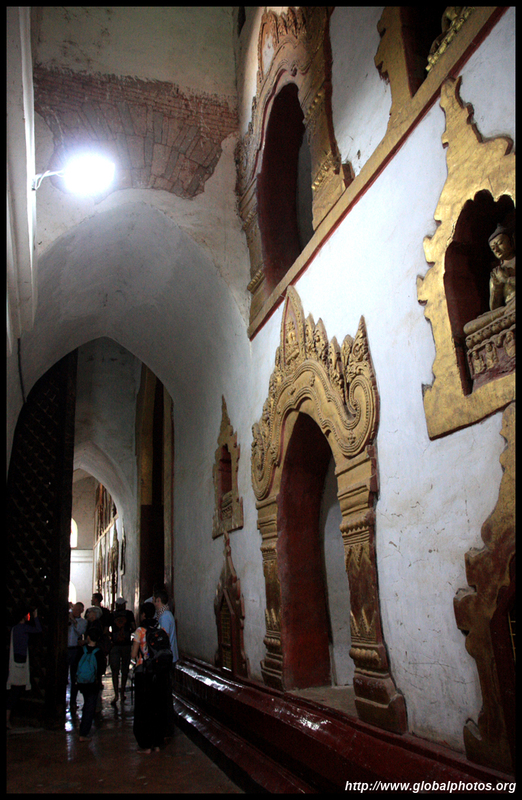 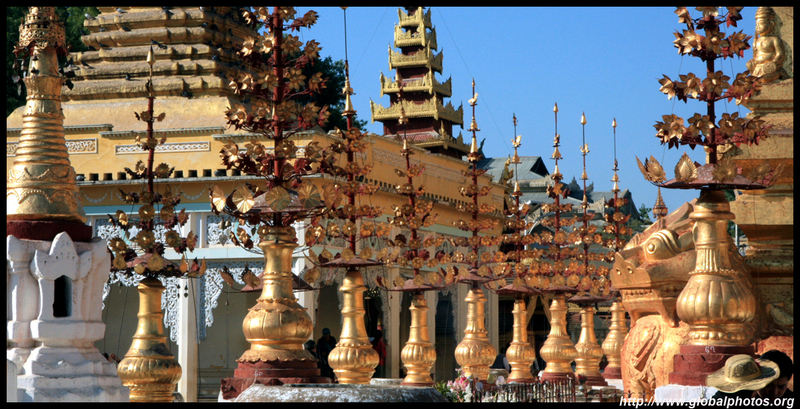 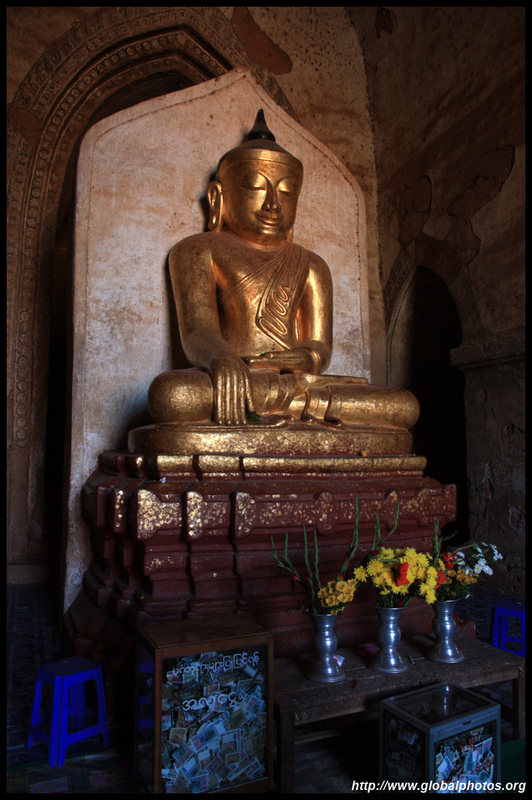 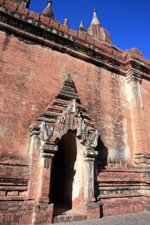 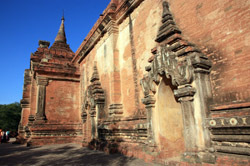 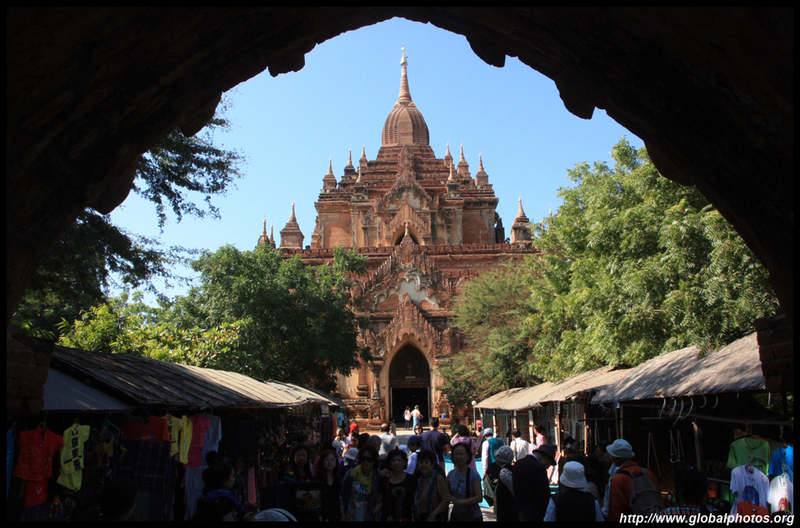 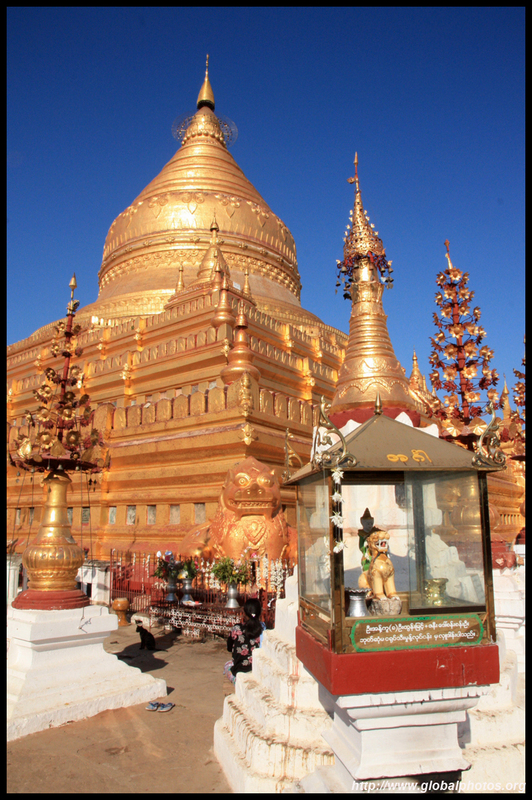 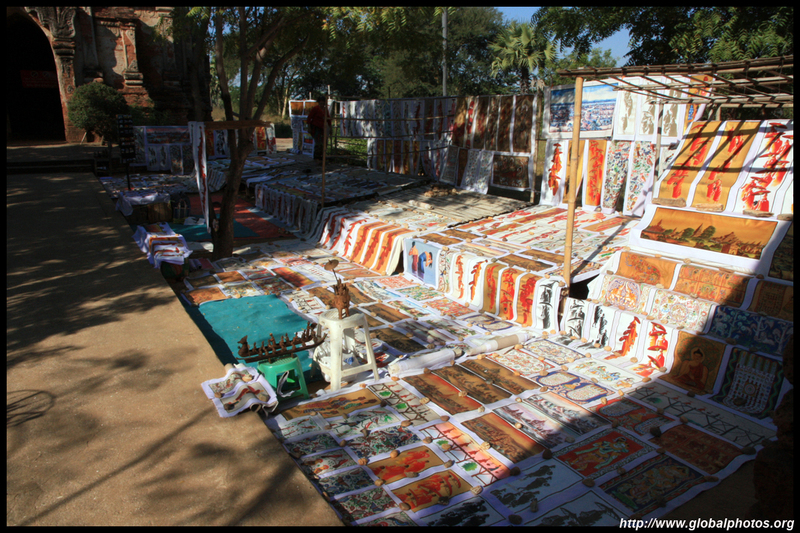 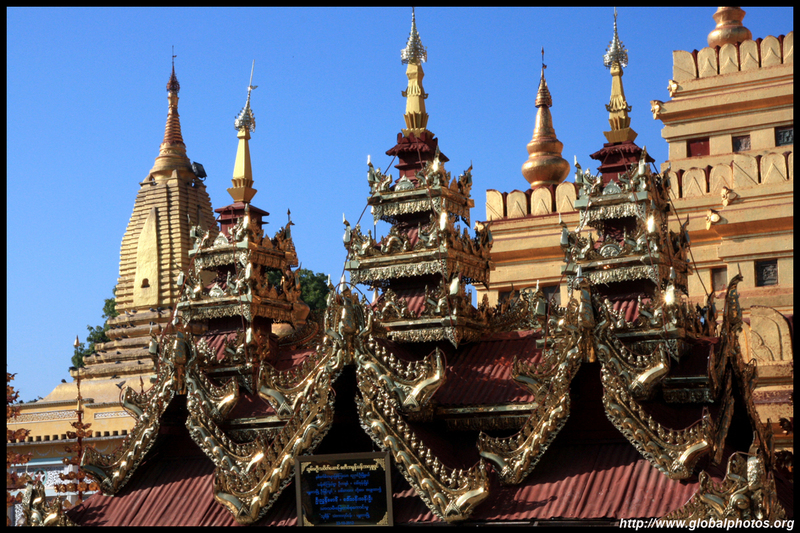 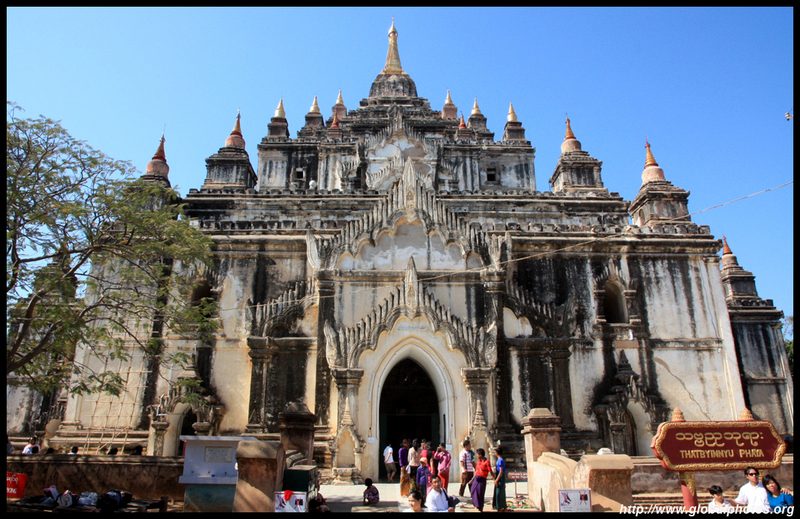 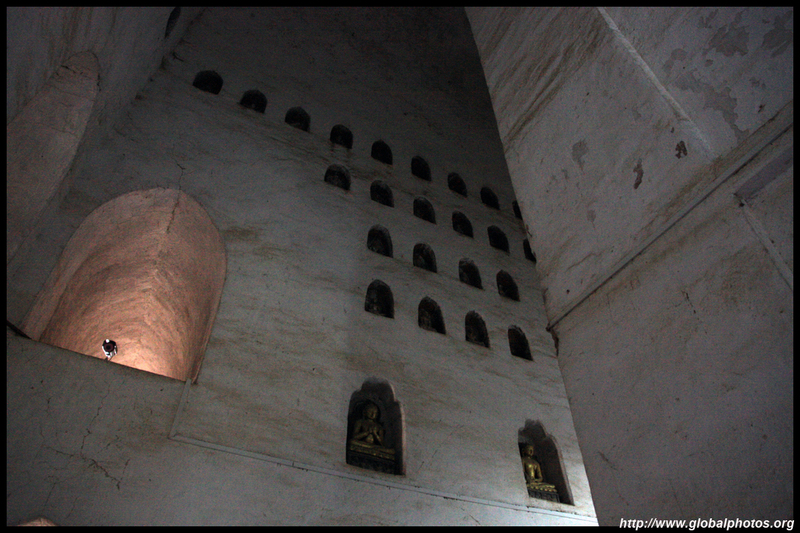 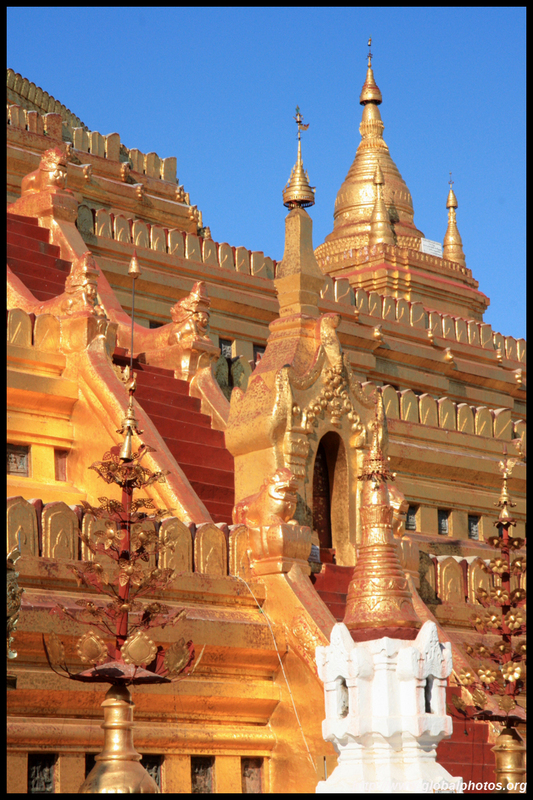 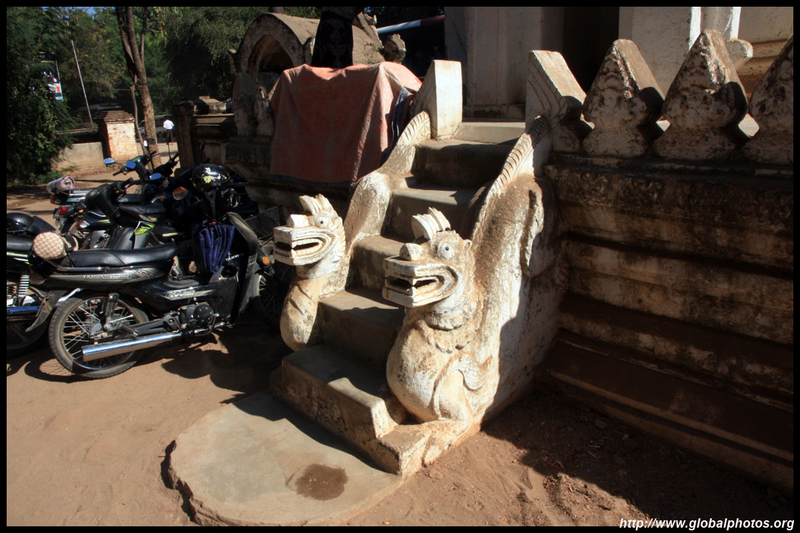 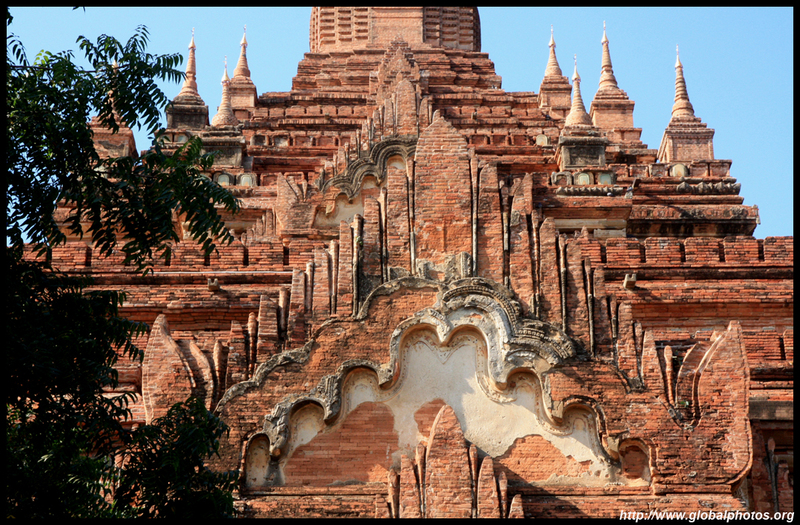 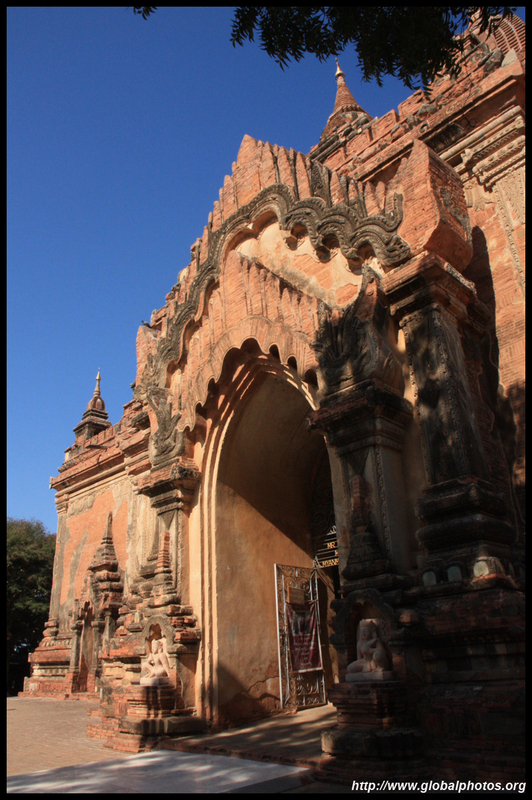 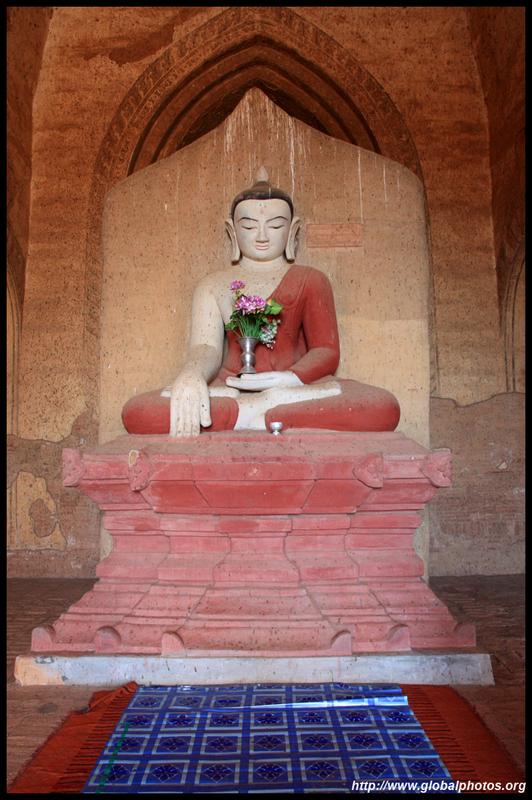 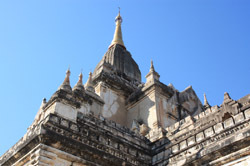 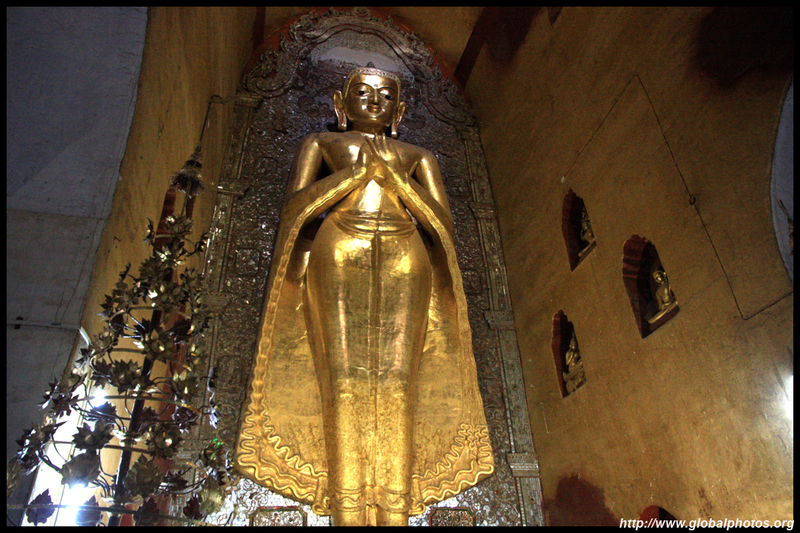 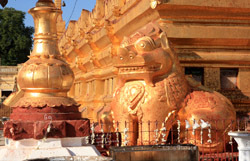 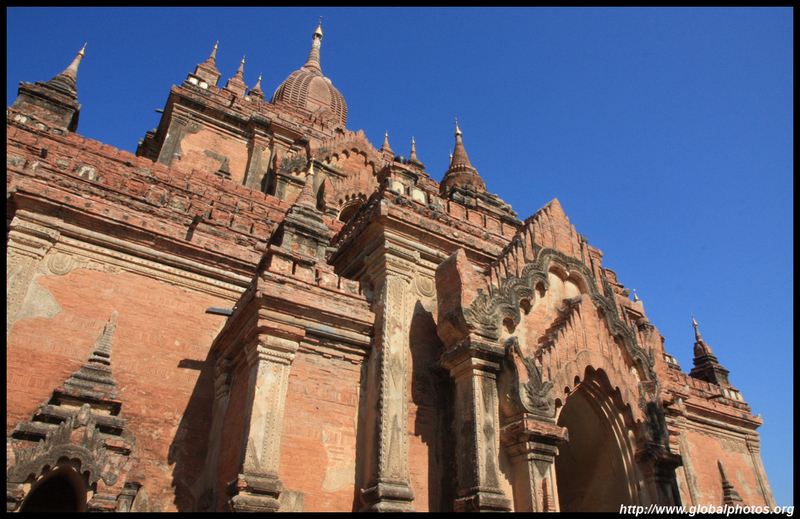 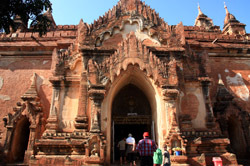 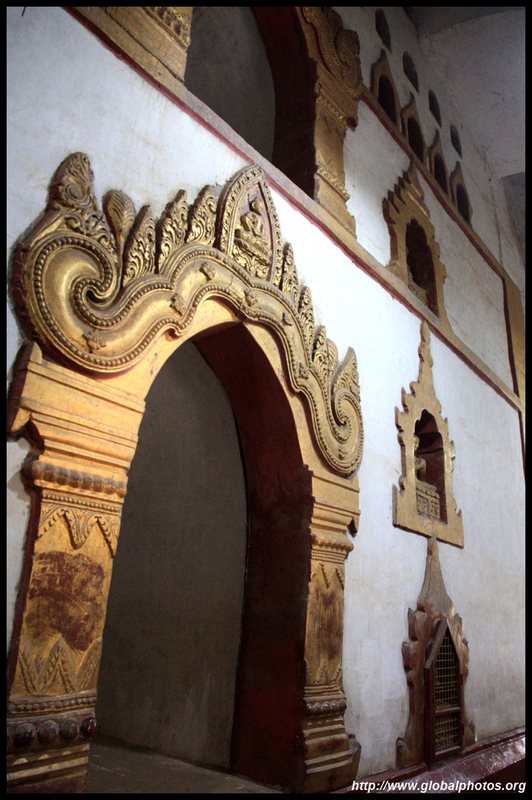 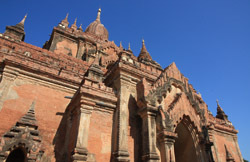 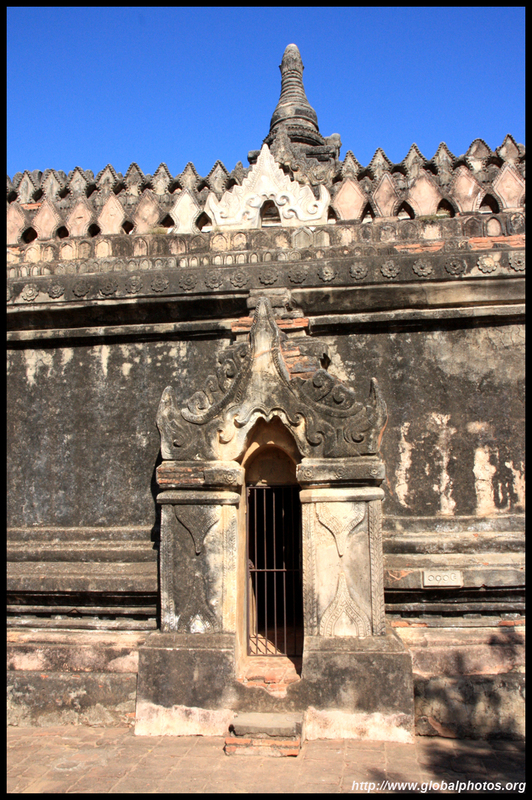 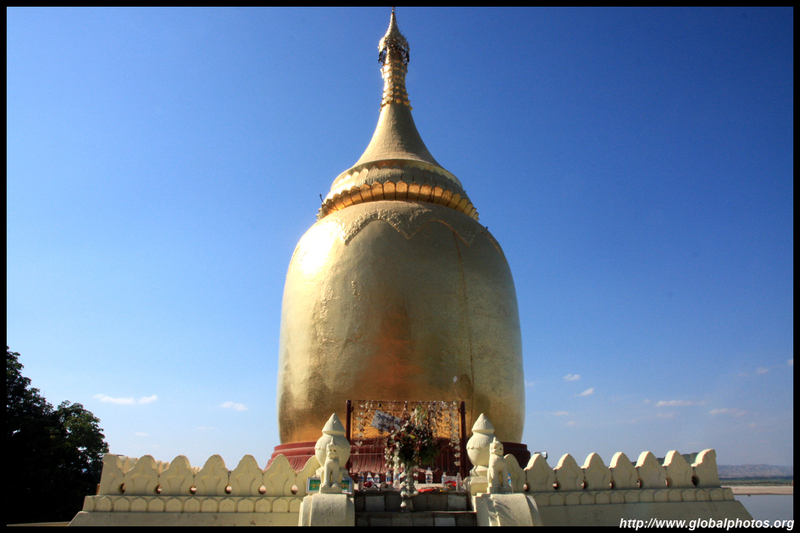 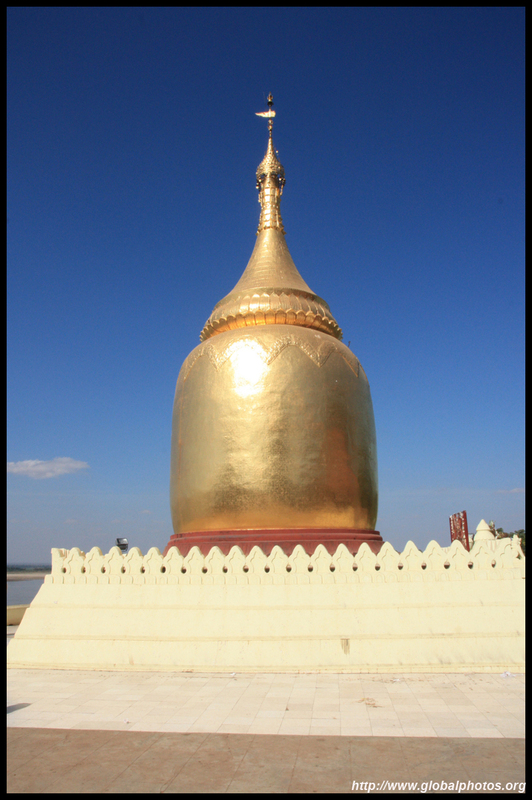 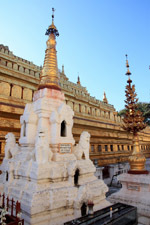 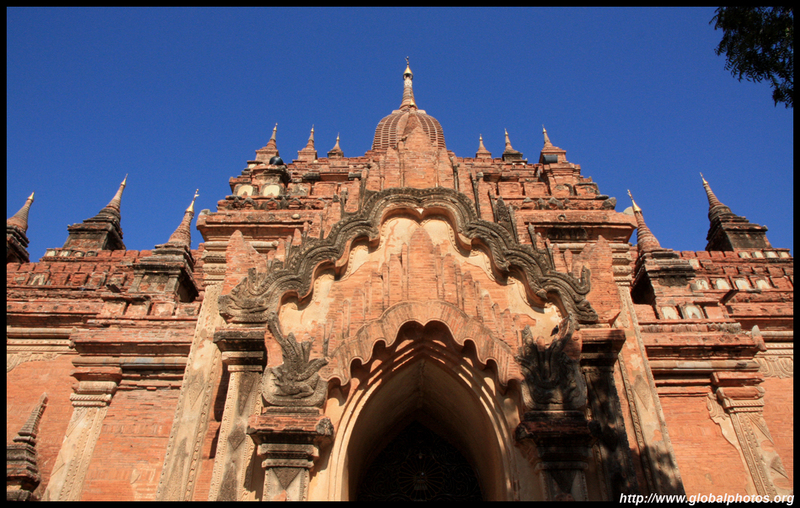 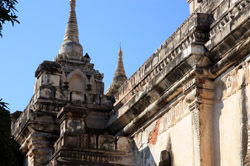 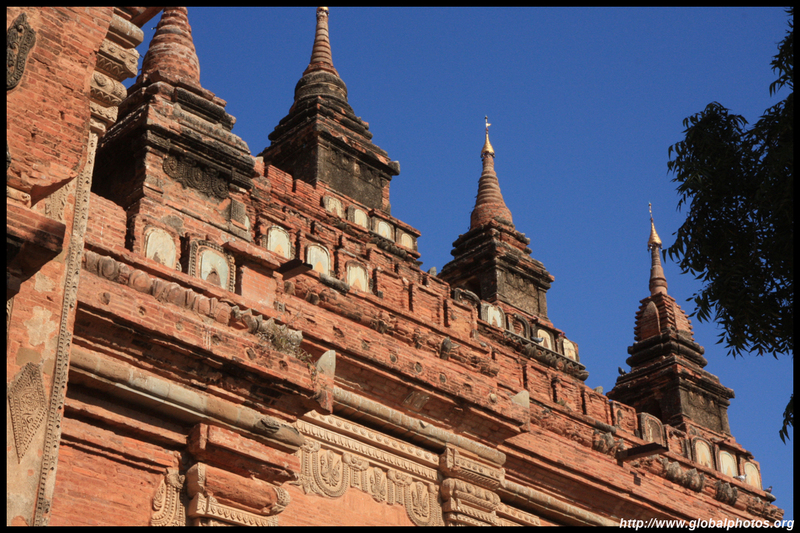 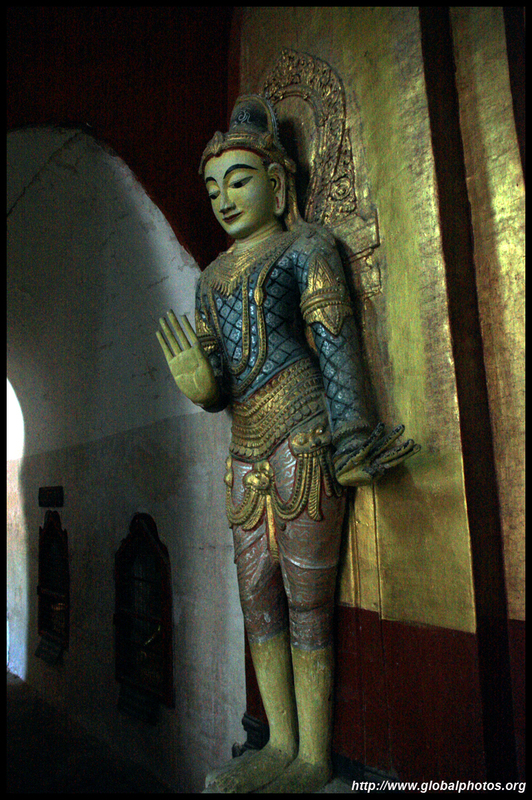 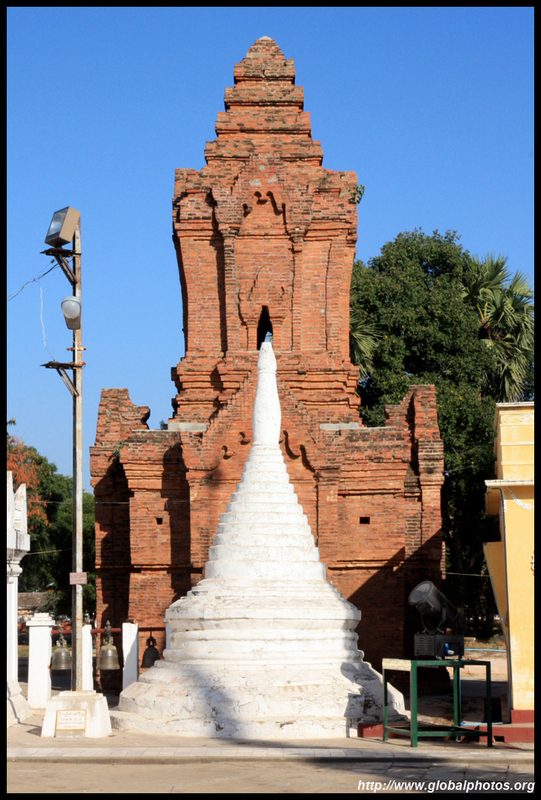 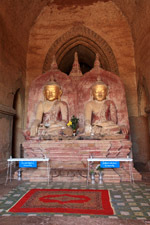 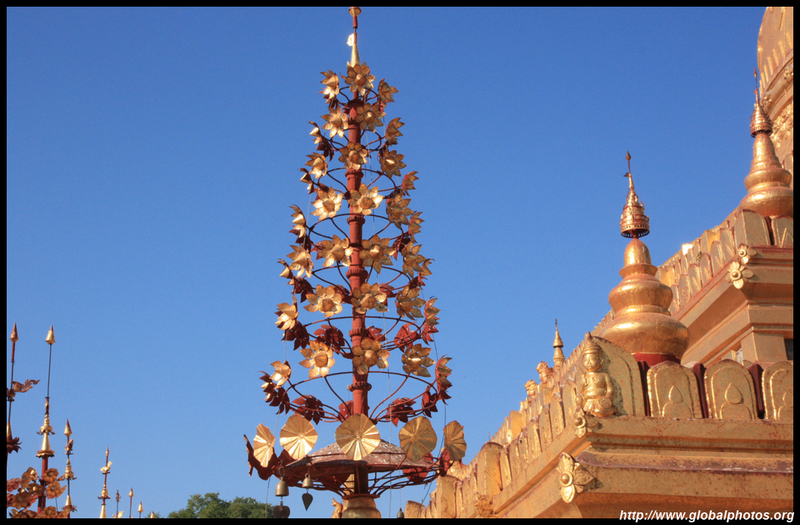 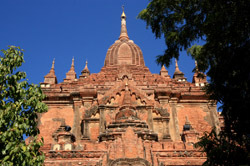 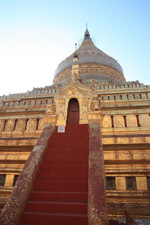 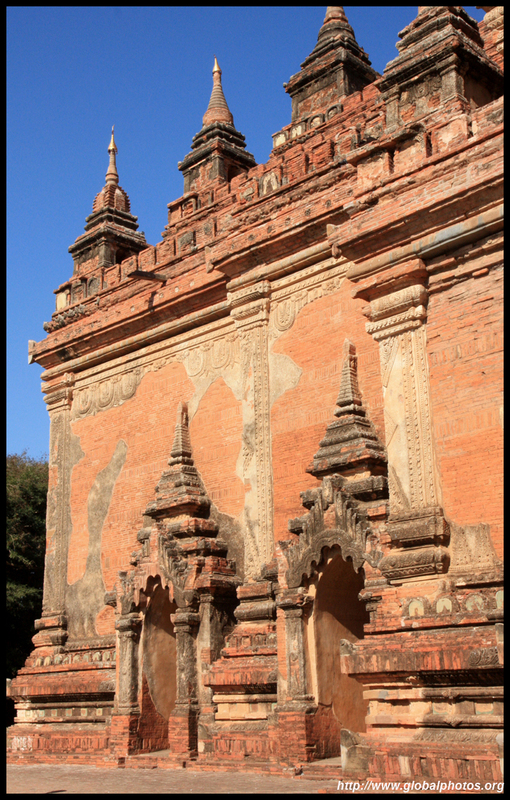 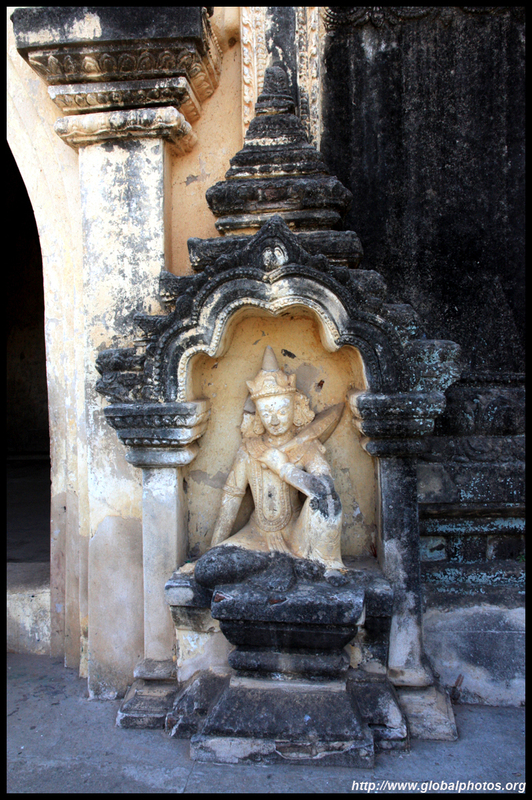 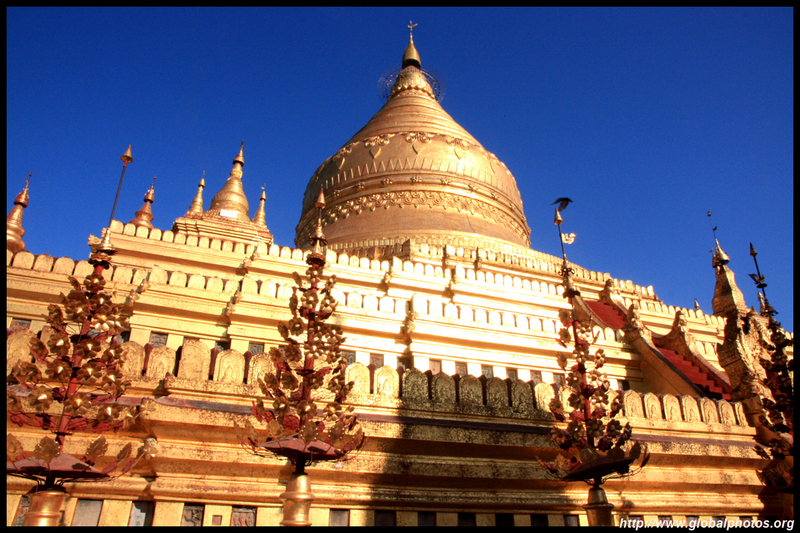 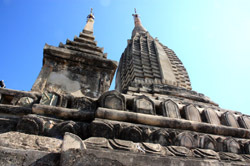 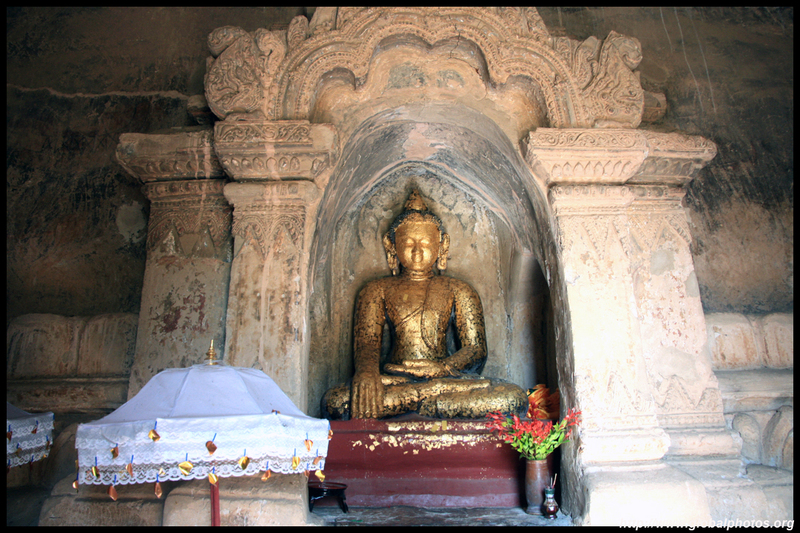 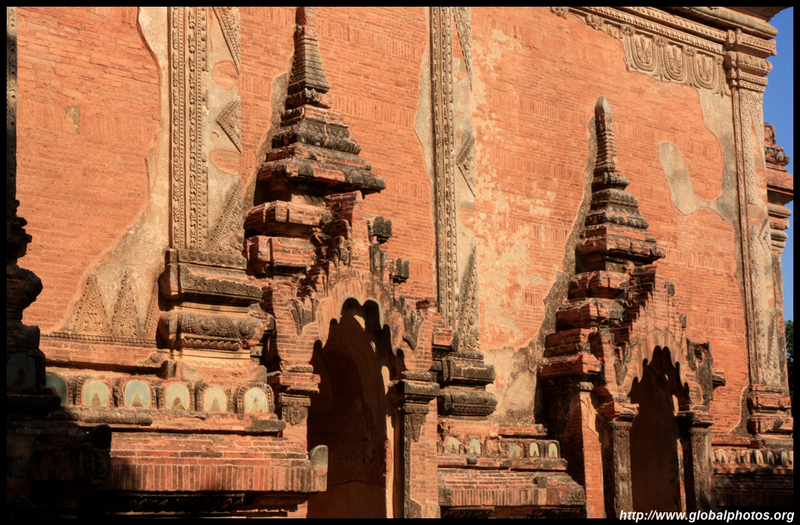 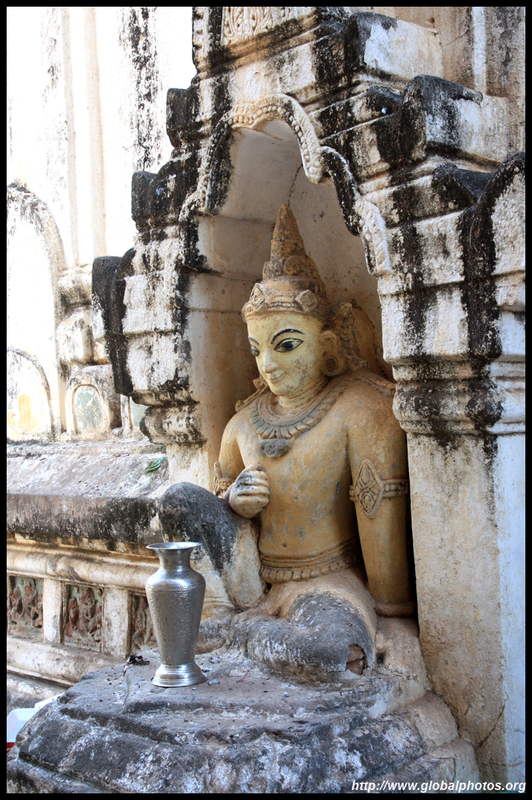 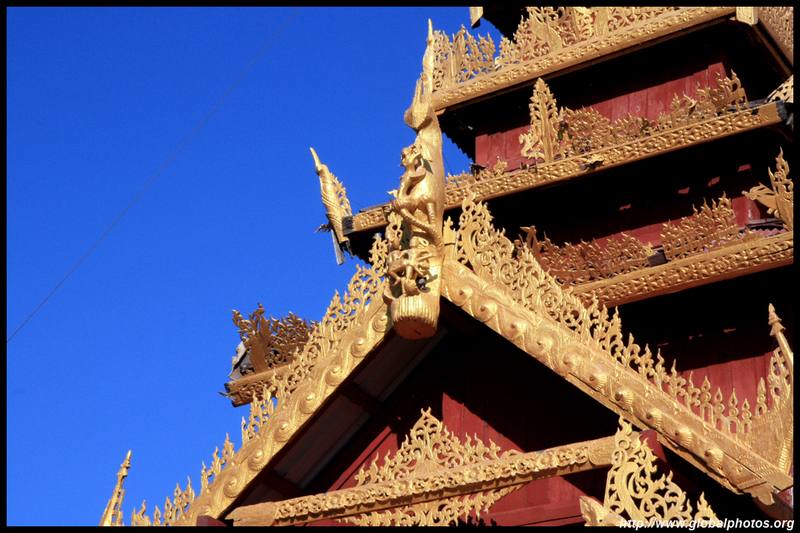 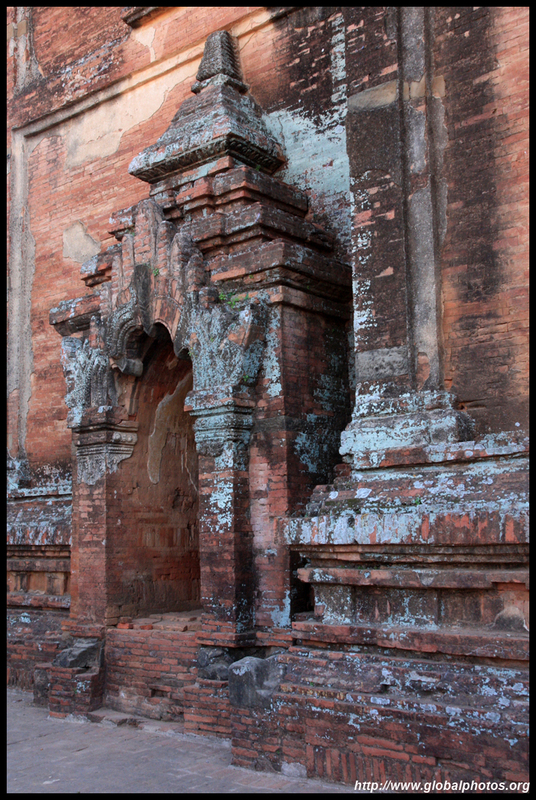 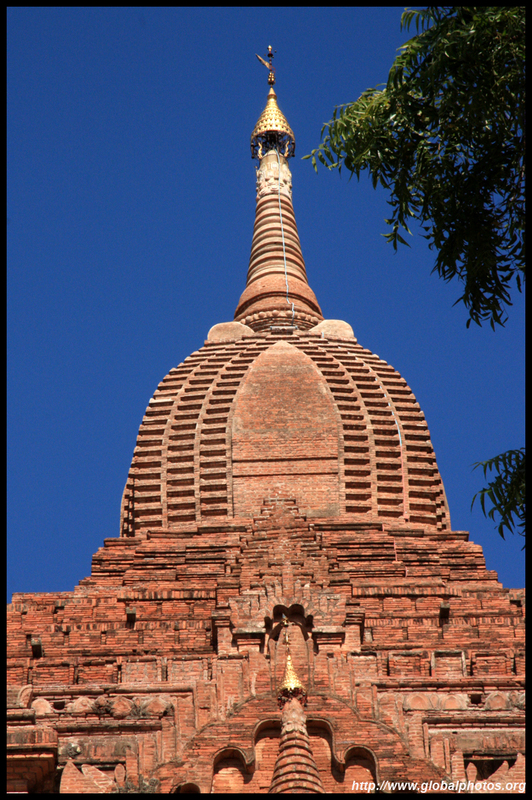 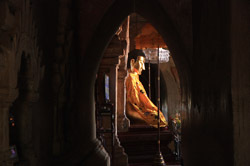 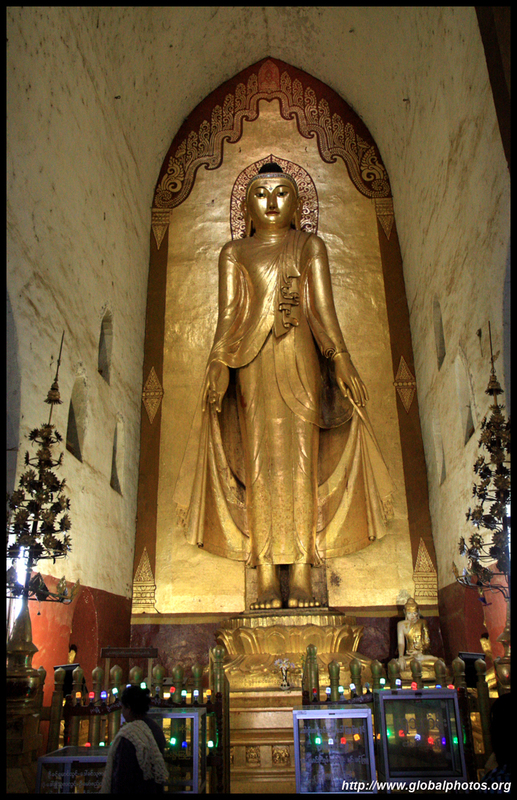 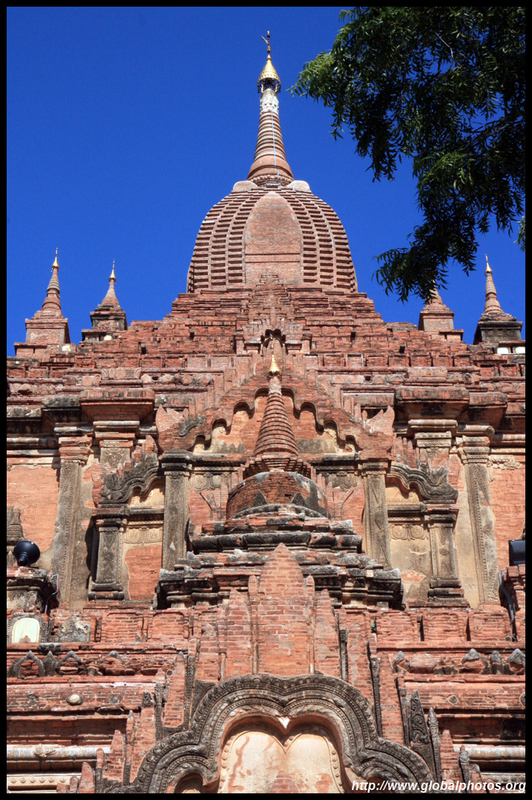 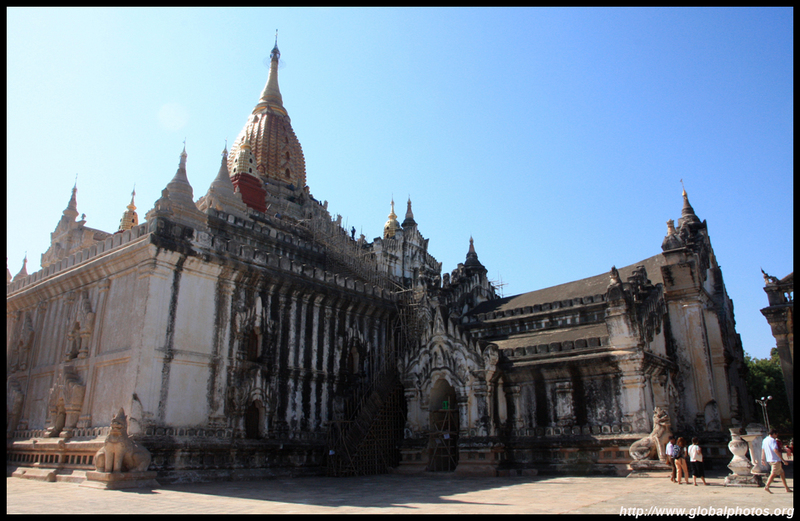 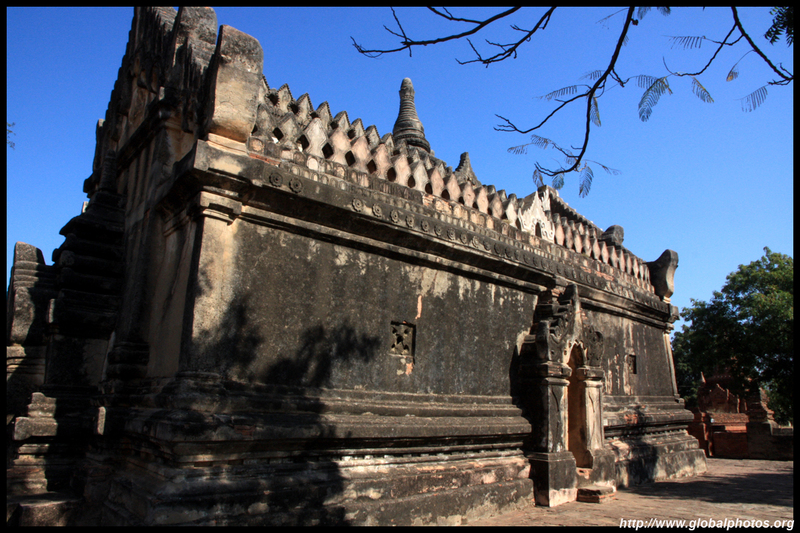 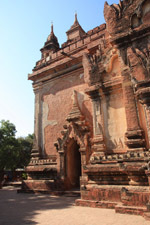 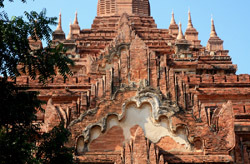 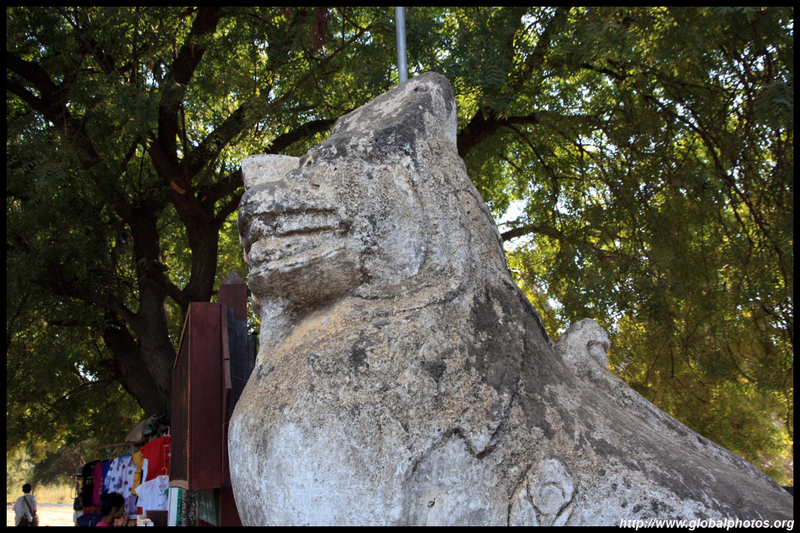 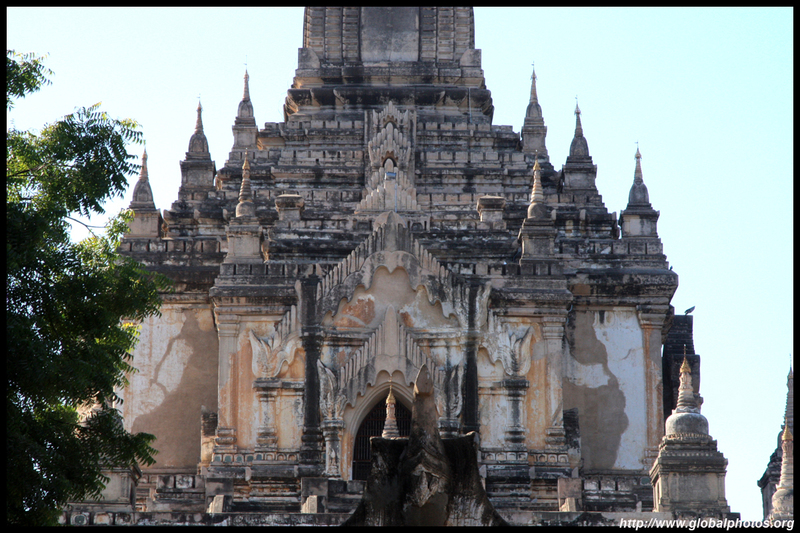 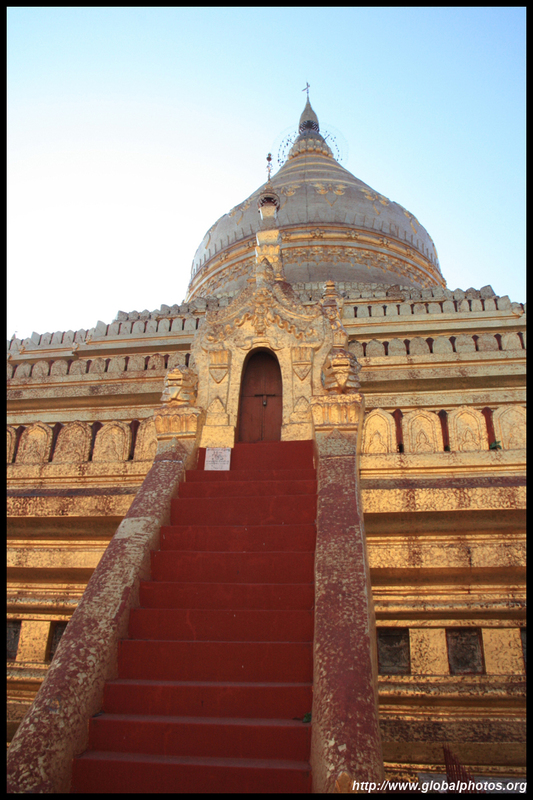 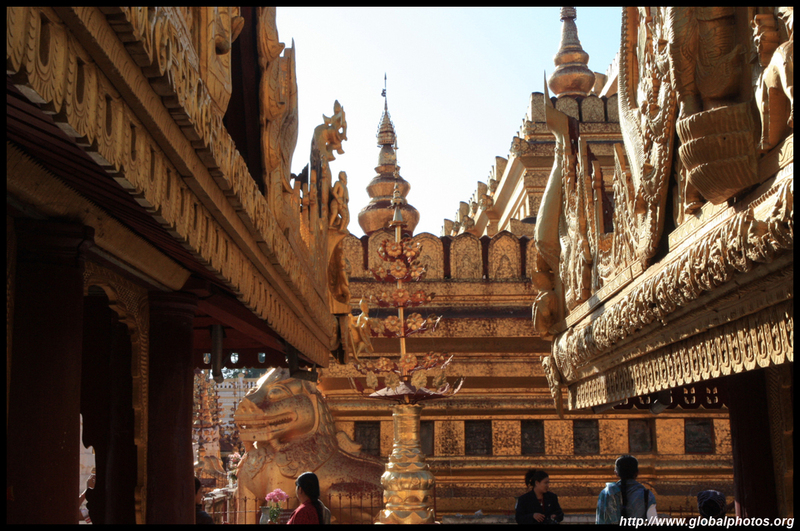 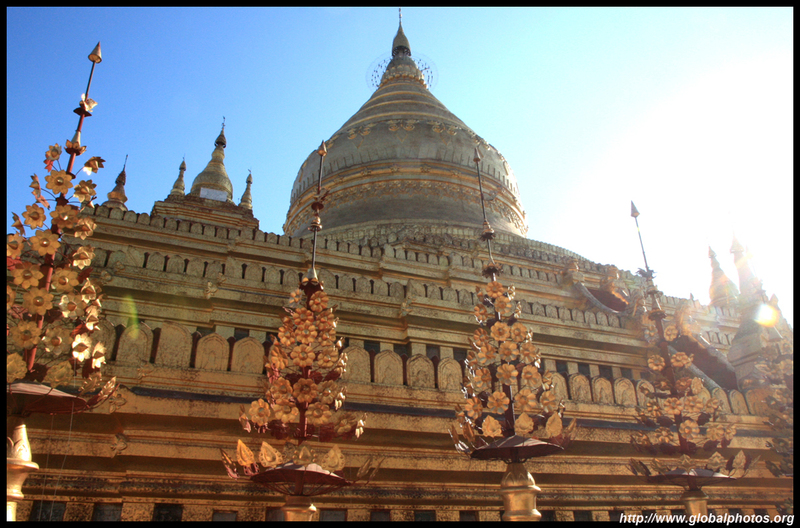 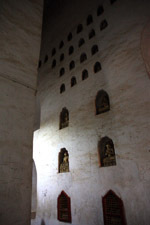 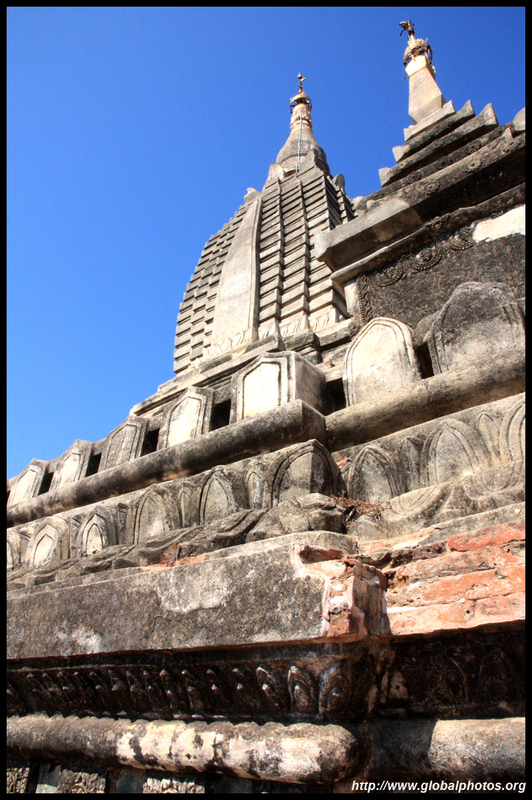 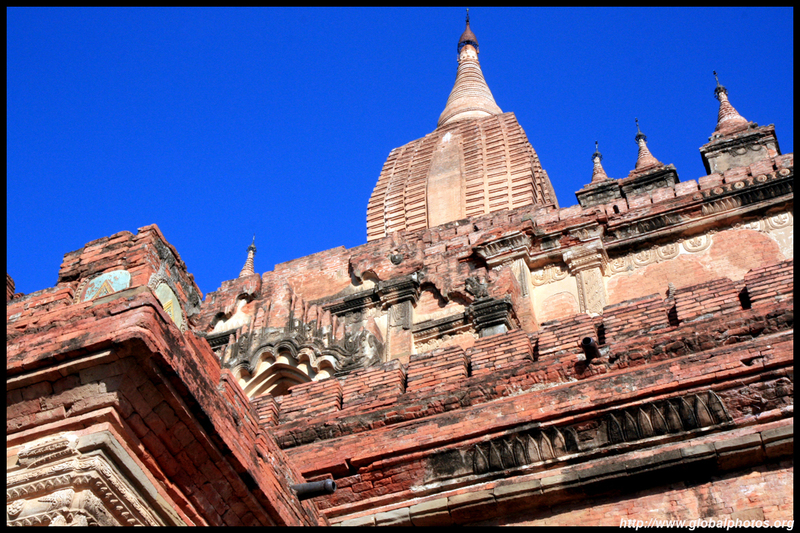 Shwezigon Paya is the town's main religious site, and has Bagan's largest bronze buddhas. 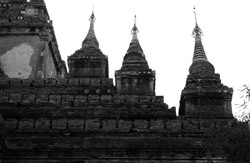 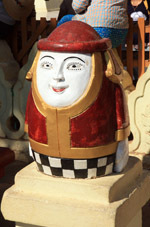 There are so many temples that it was hard to track which was which. 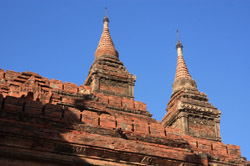 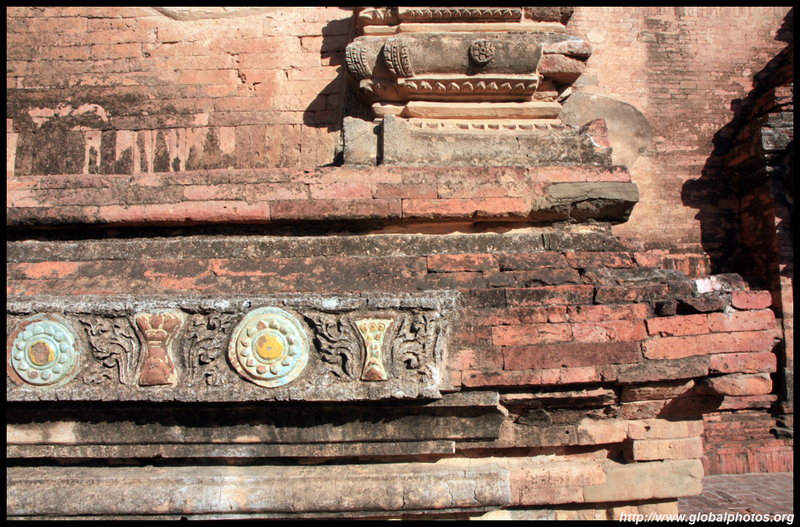 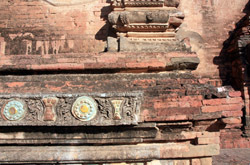 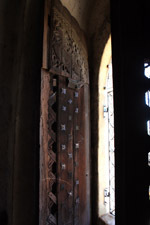 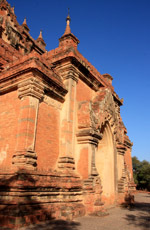 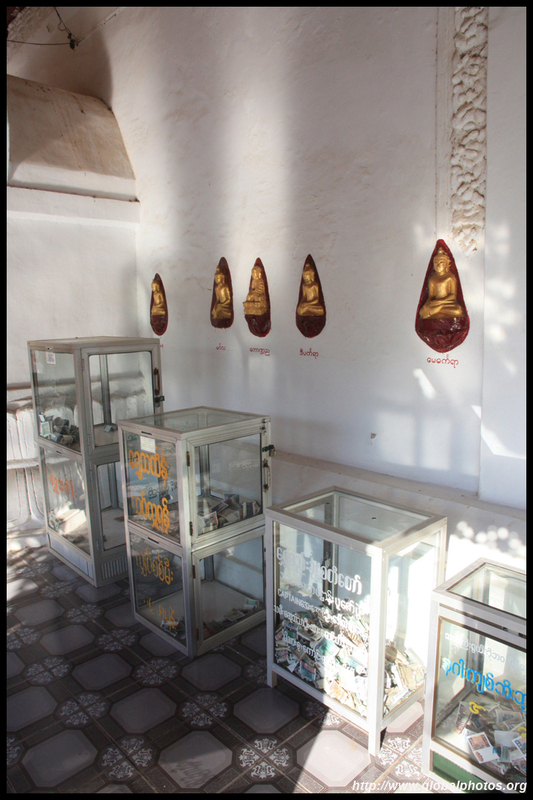 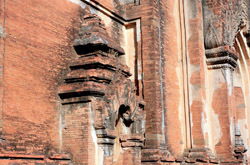 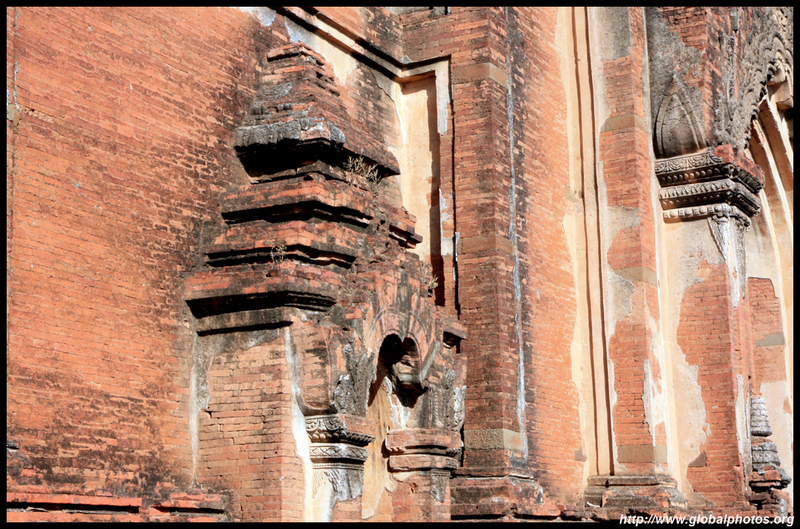 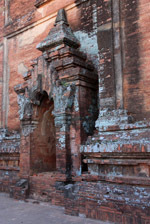 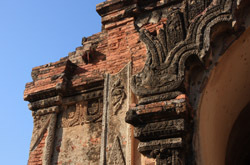 About half of the religious building inventory have survived through earthquakes and invasions. 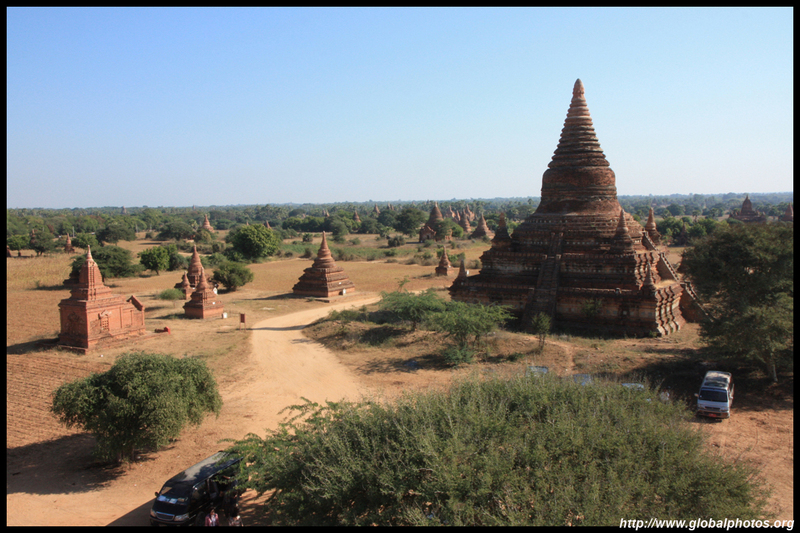 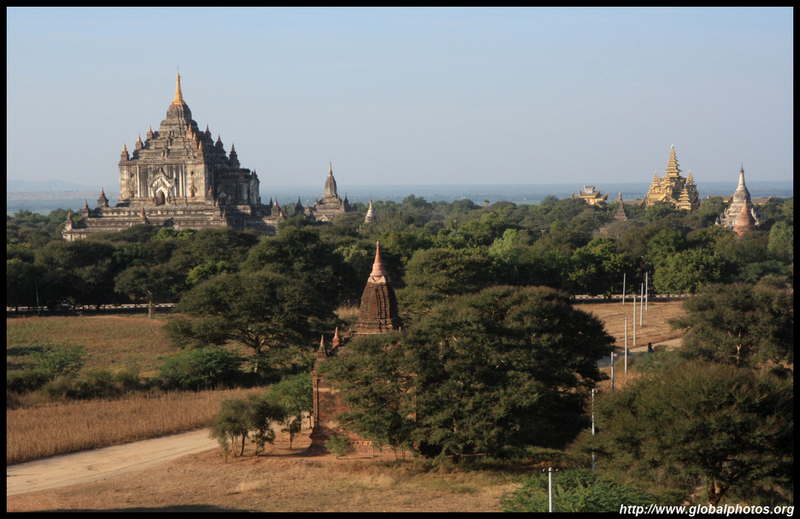 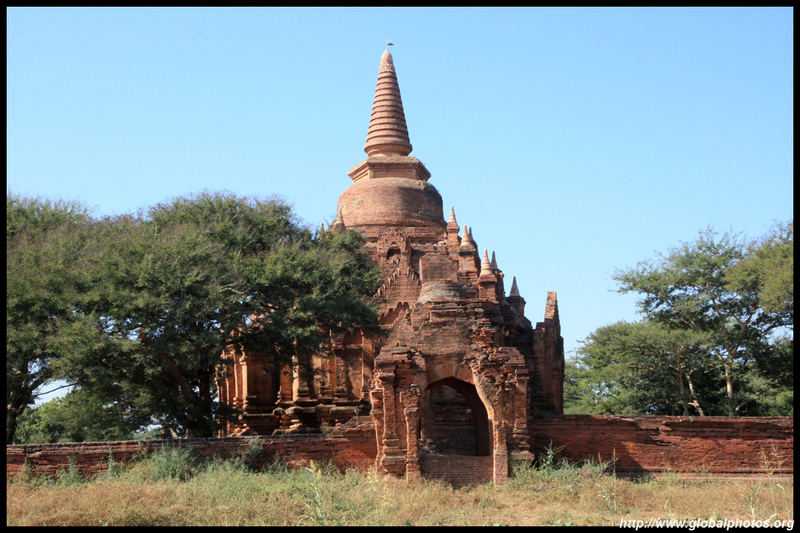 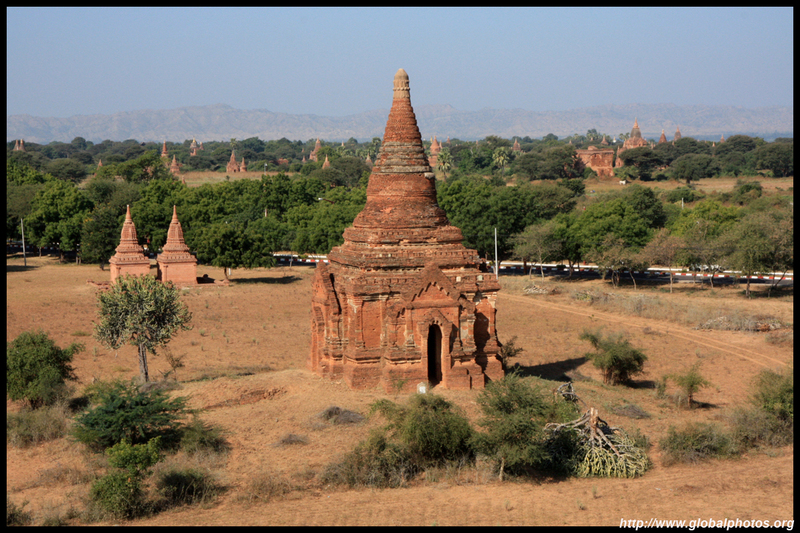 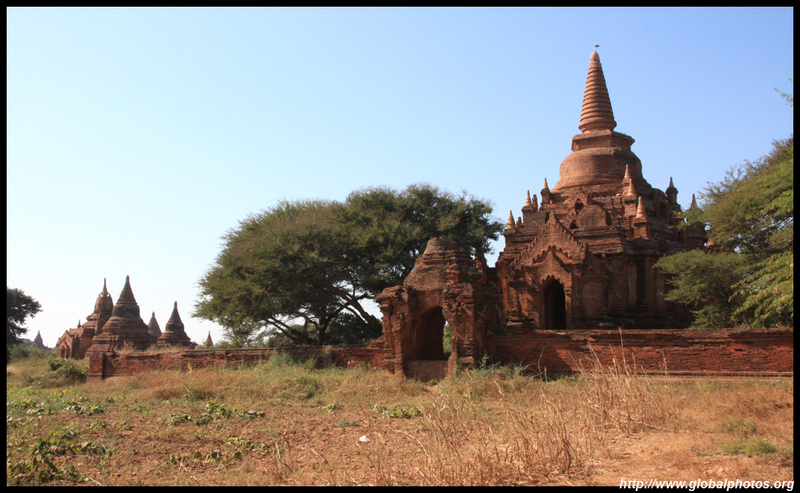 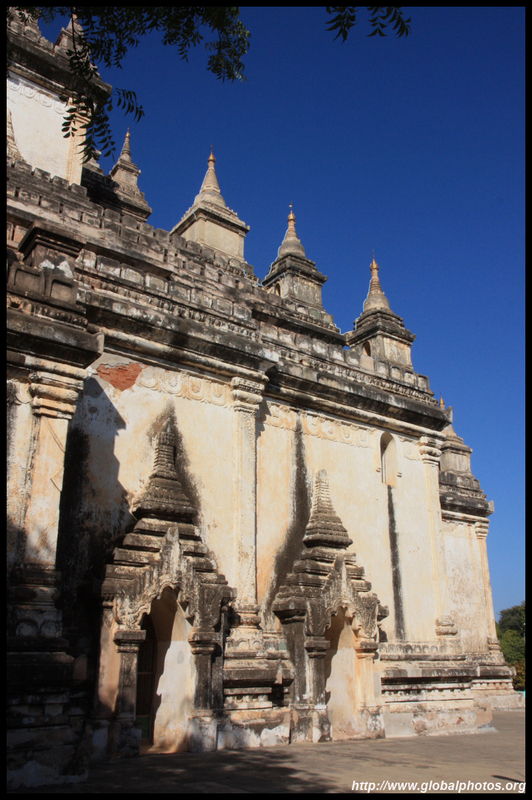 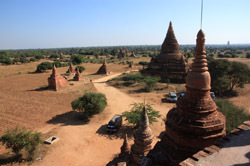 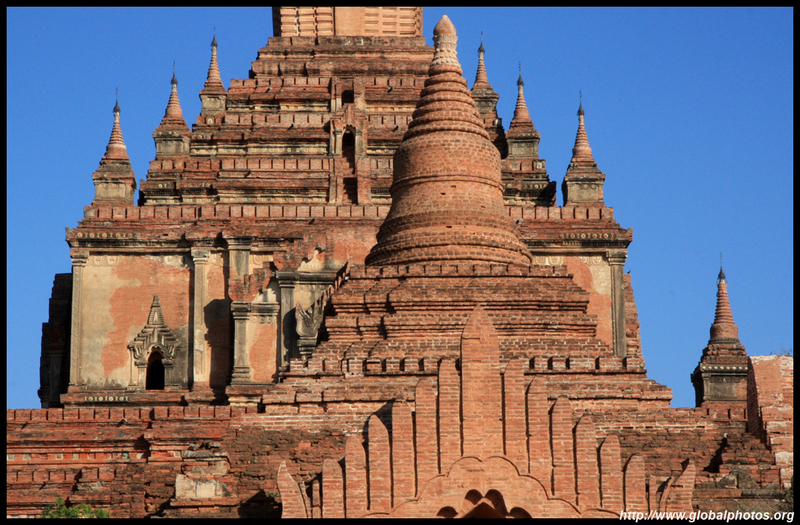 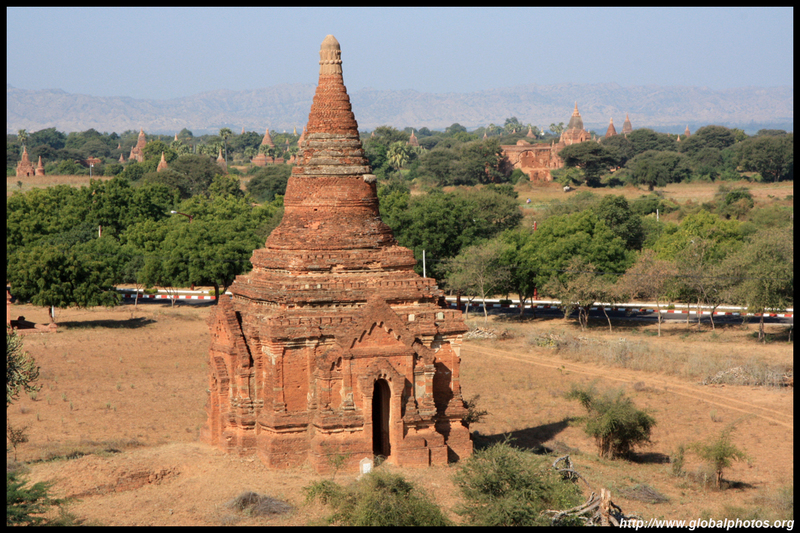 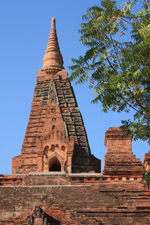 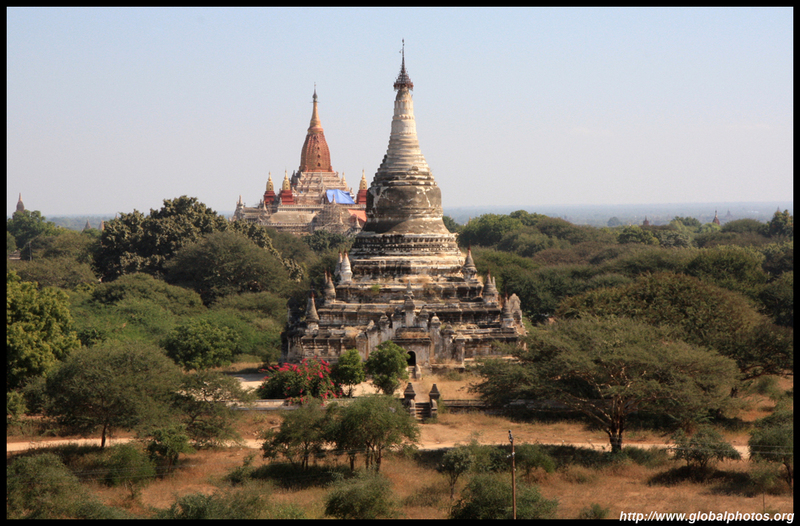 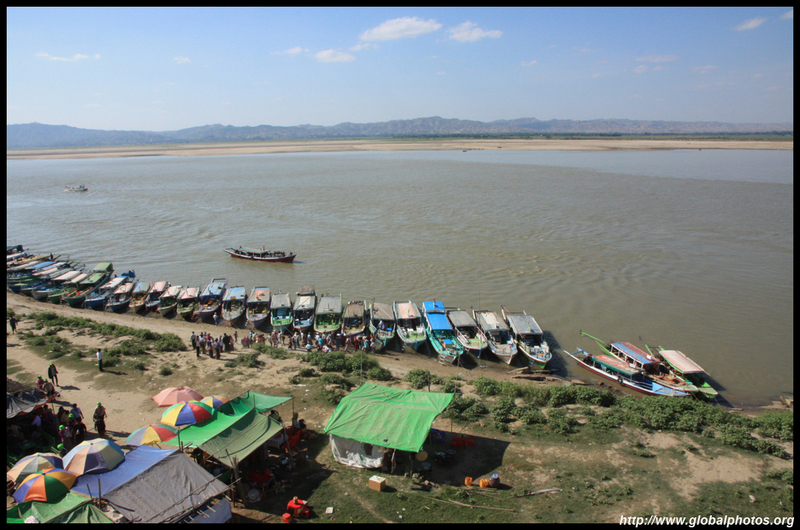 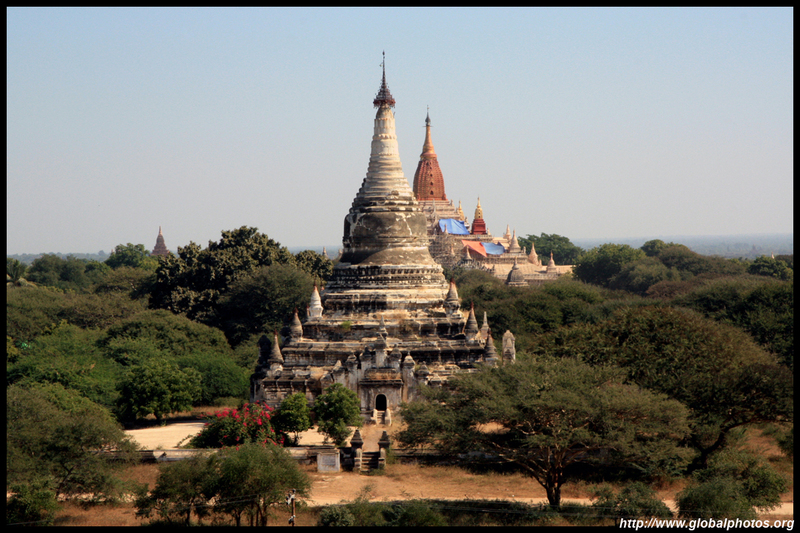 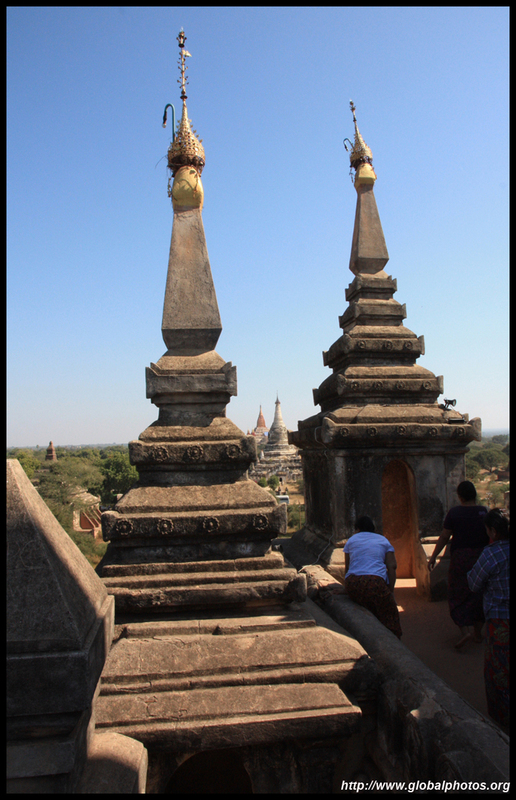 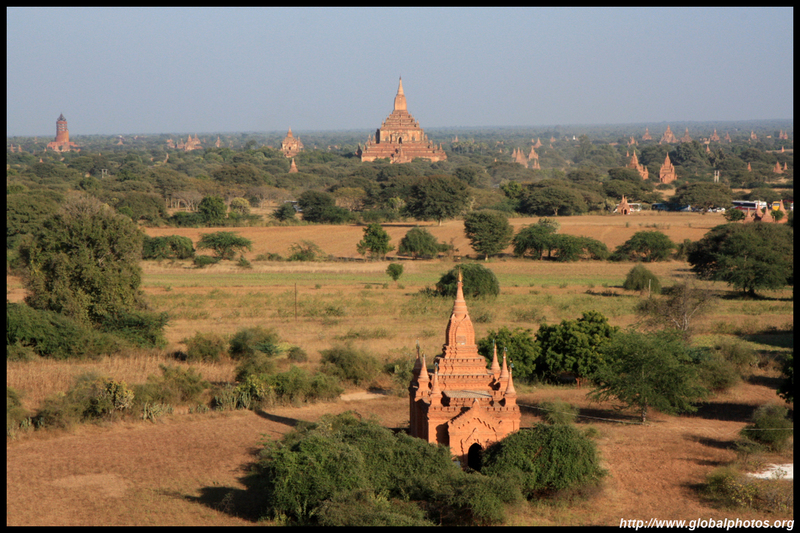 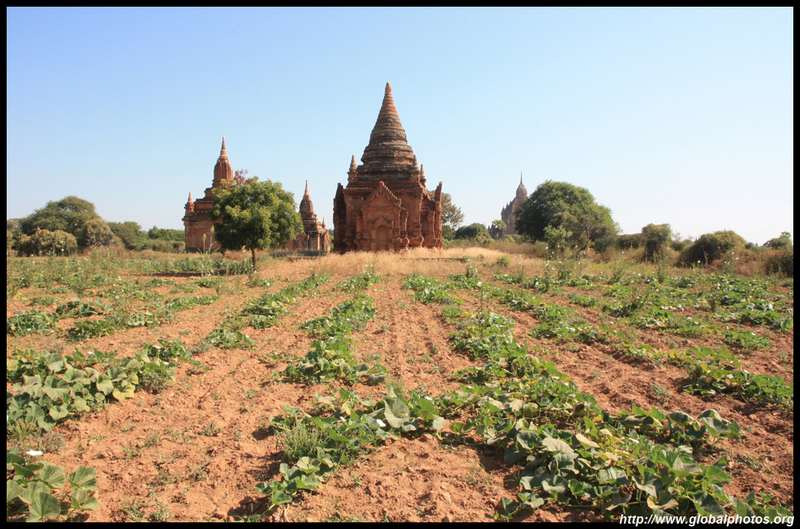 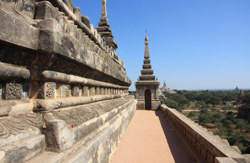 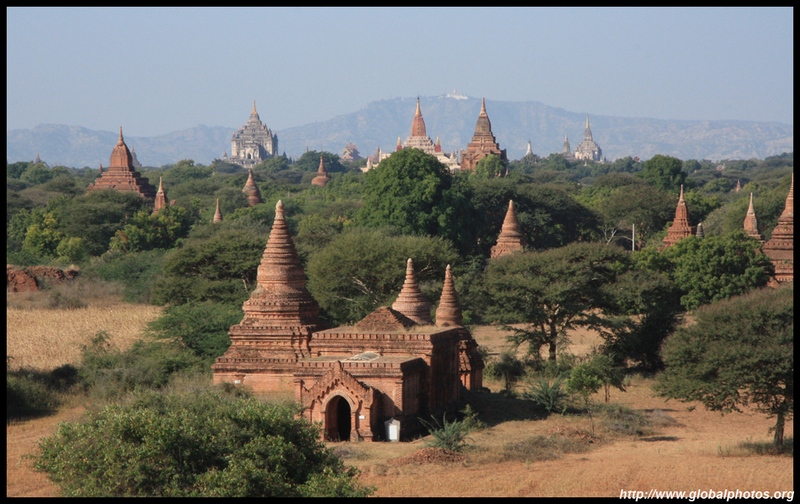 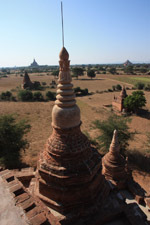 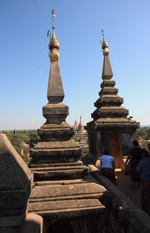 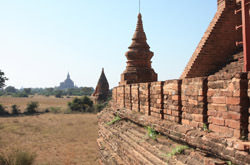 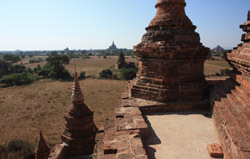 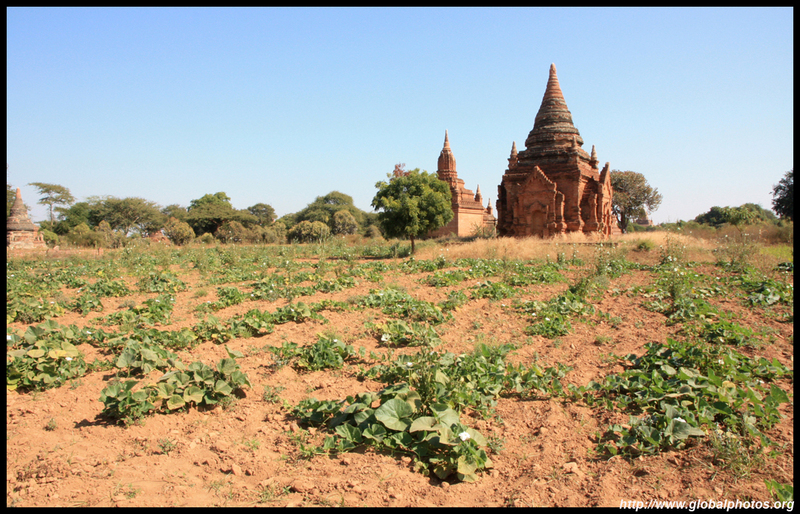 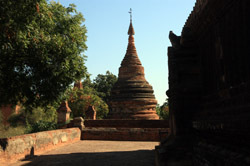 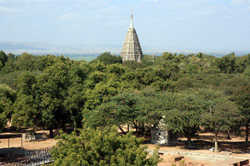 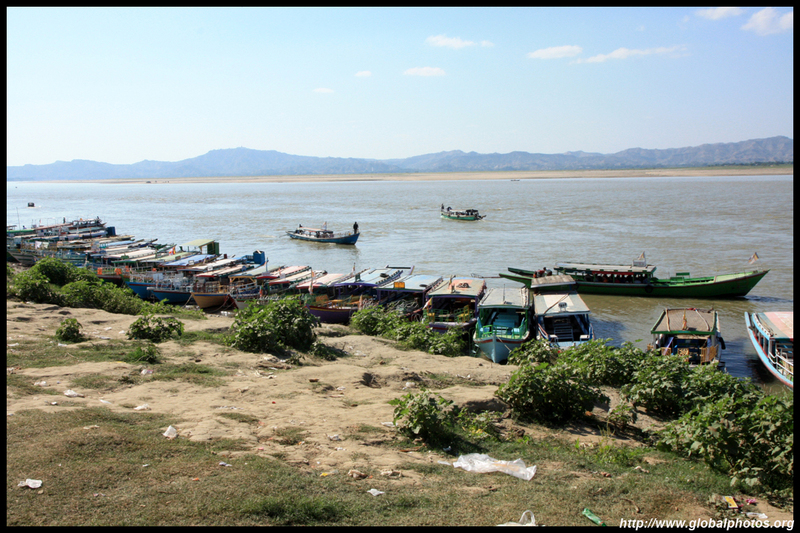 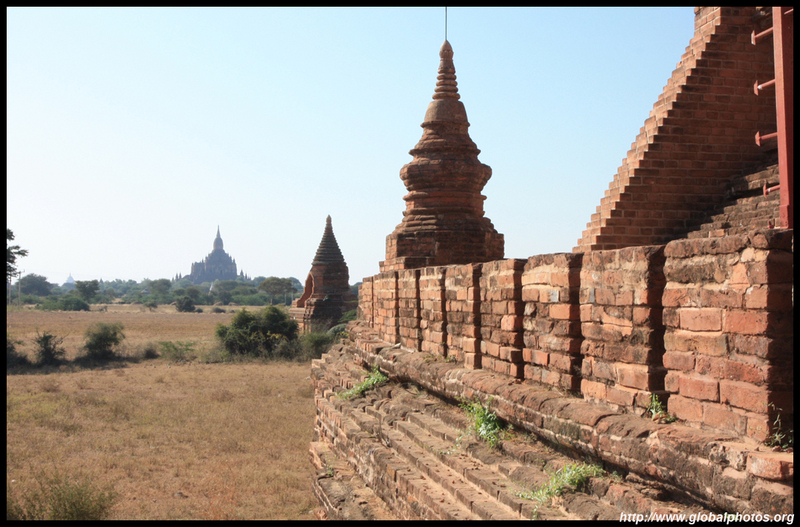 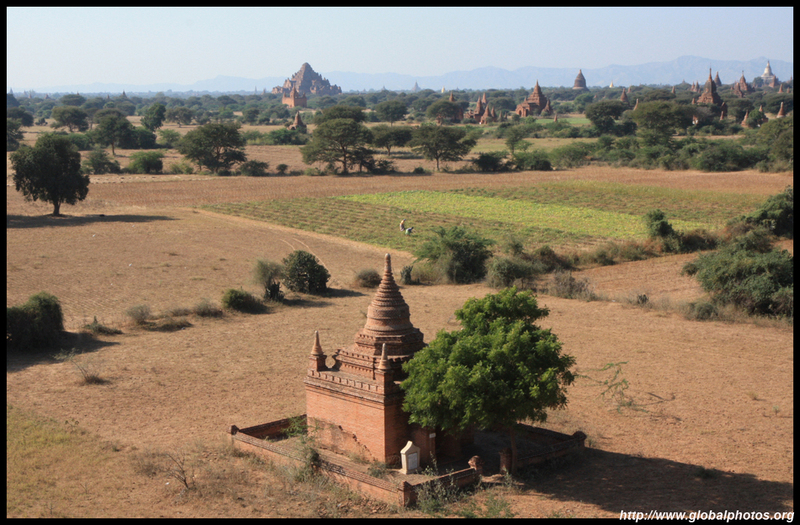 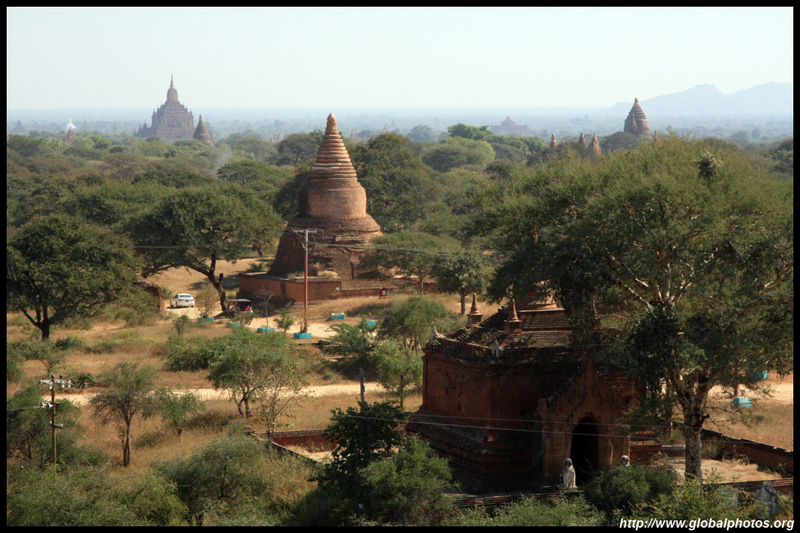 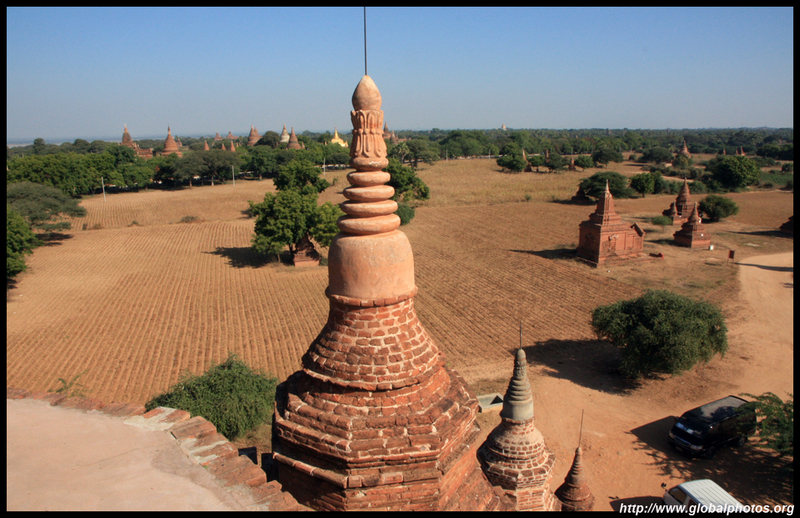 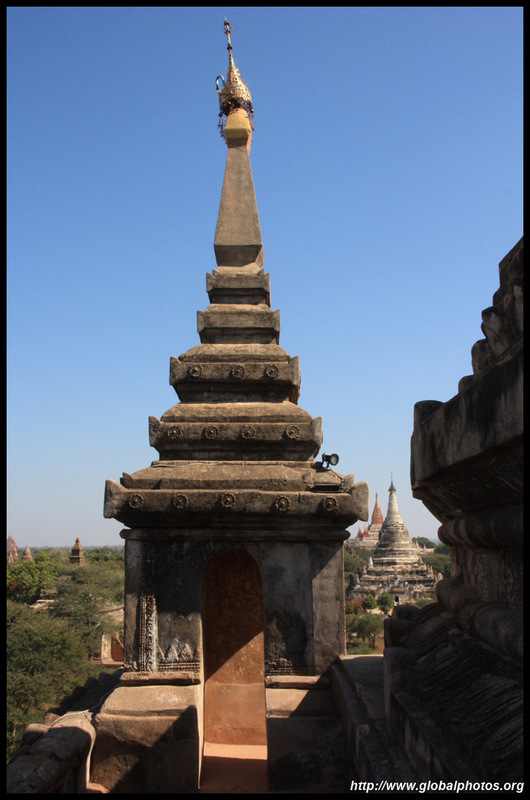 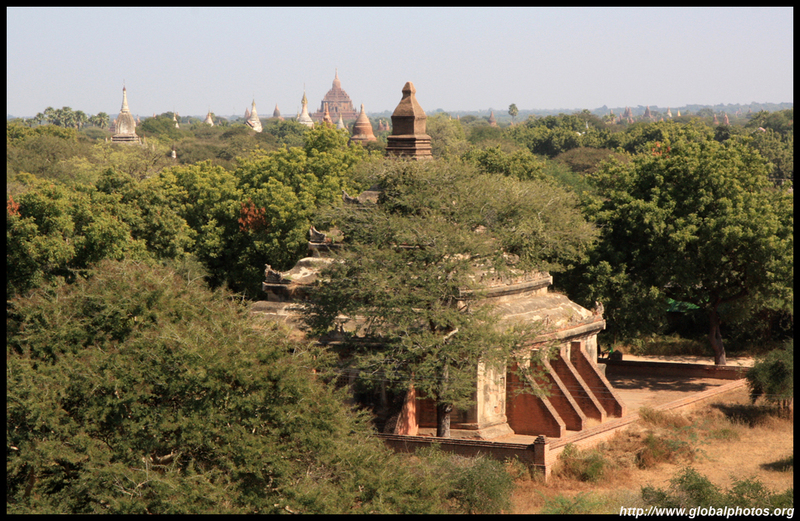 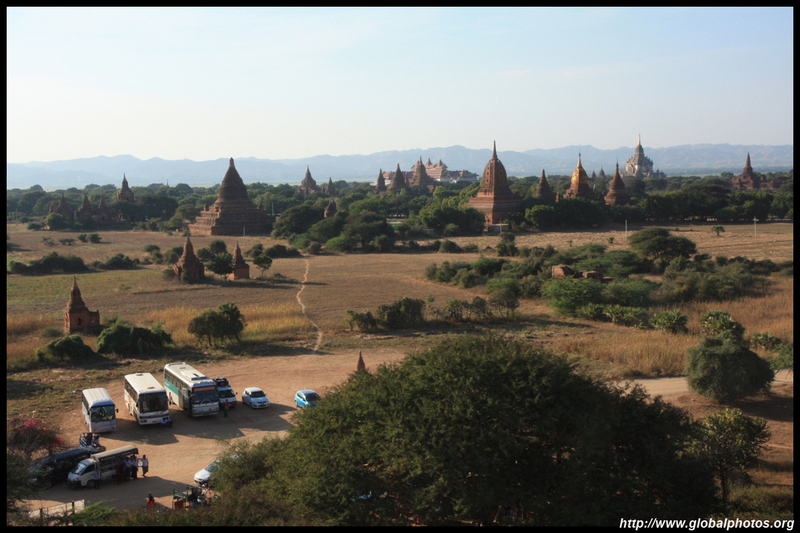 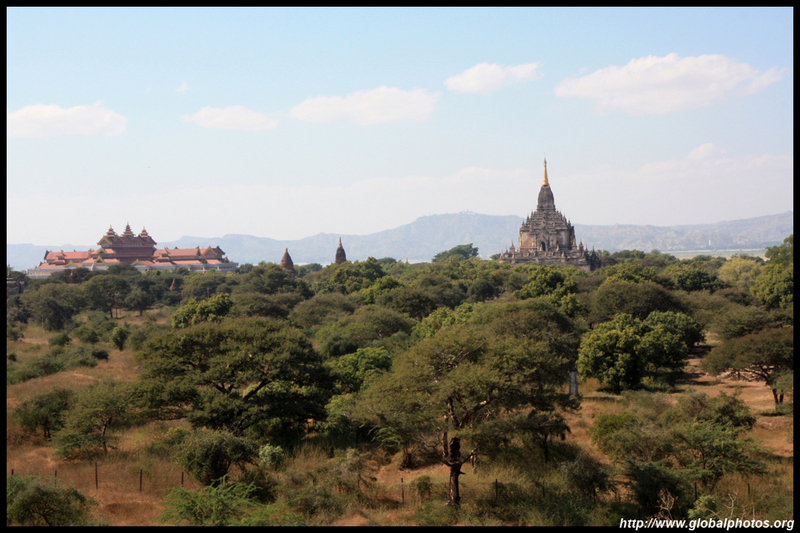 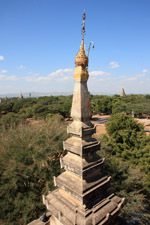 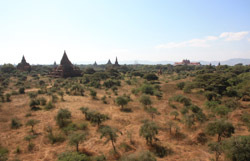 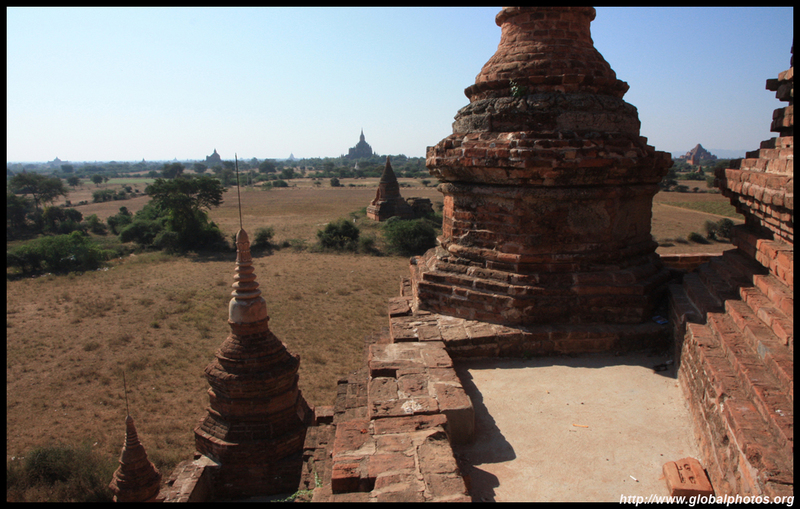 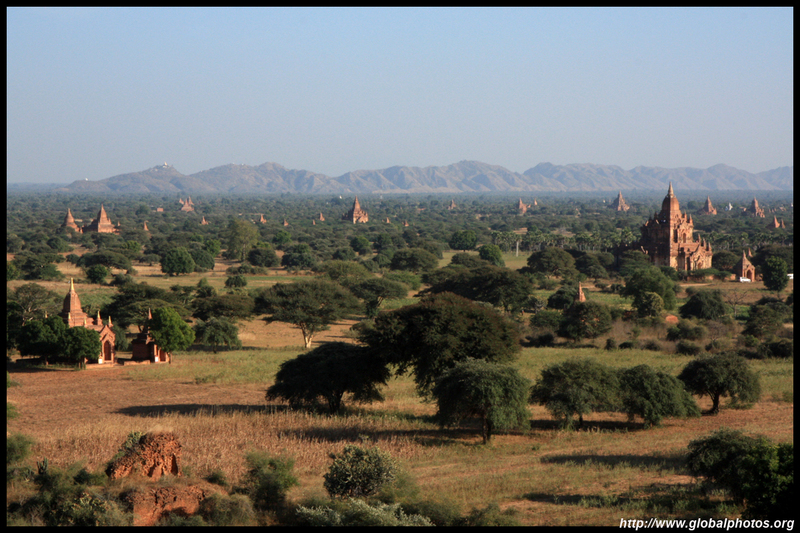 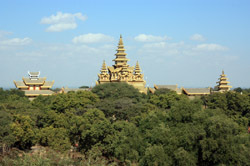 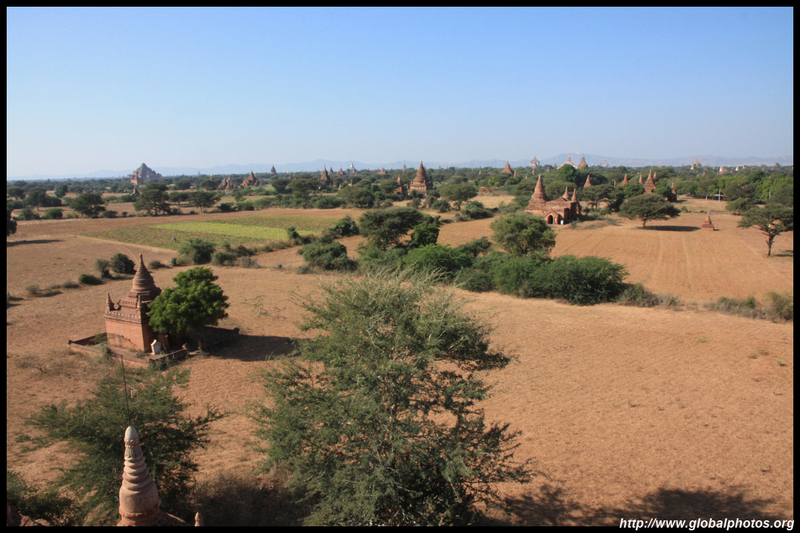 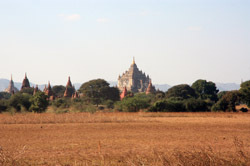 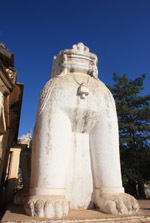 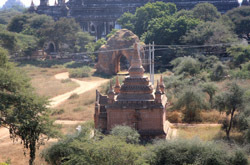 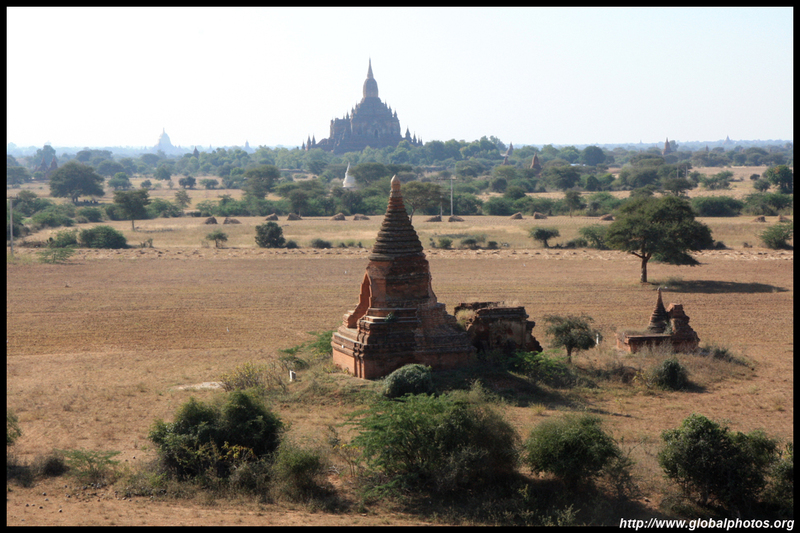 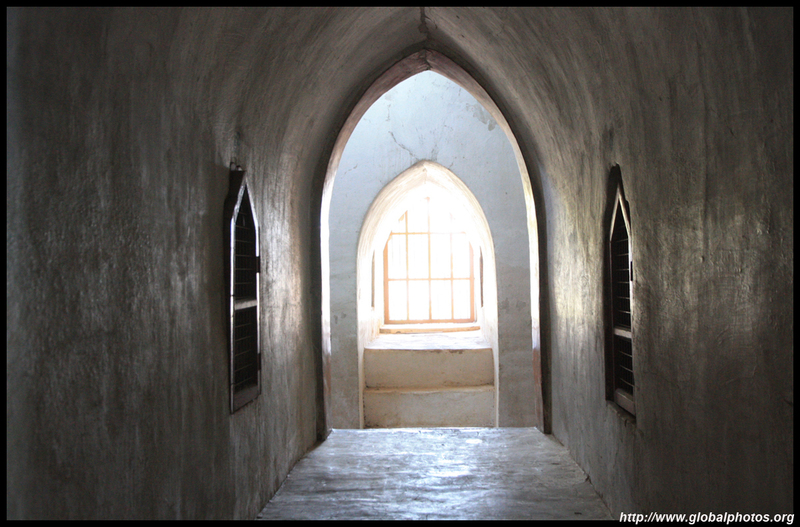 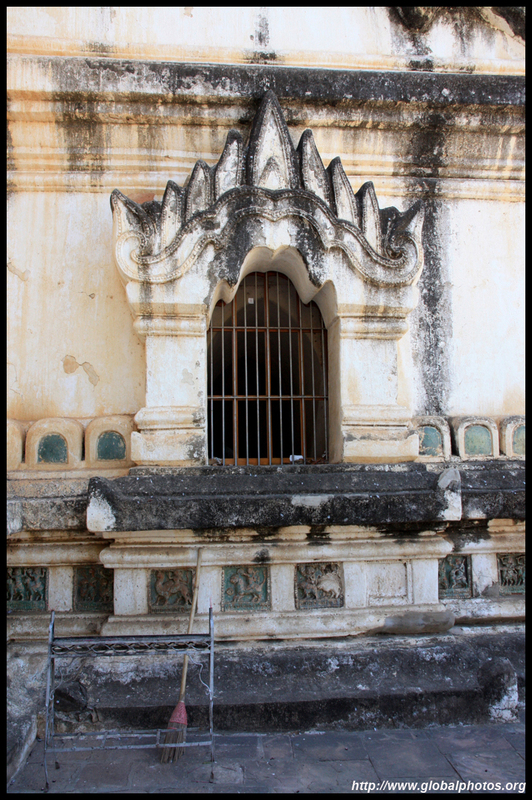 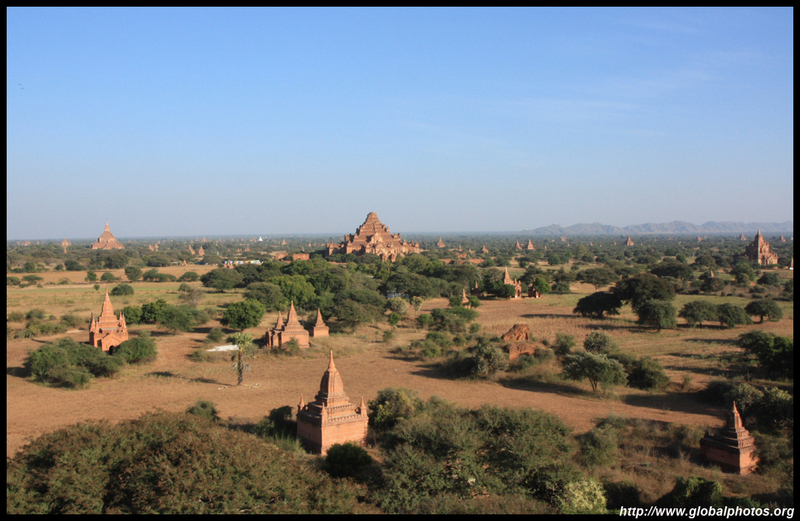 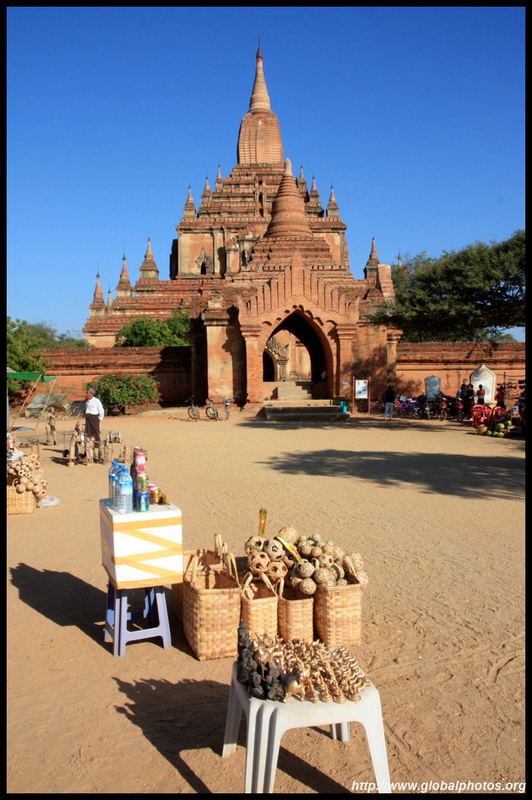 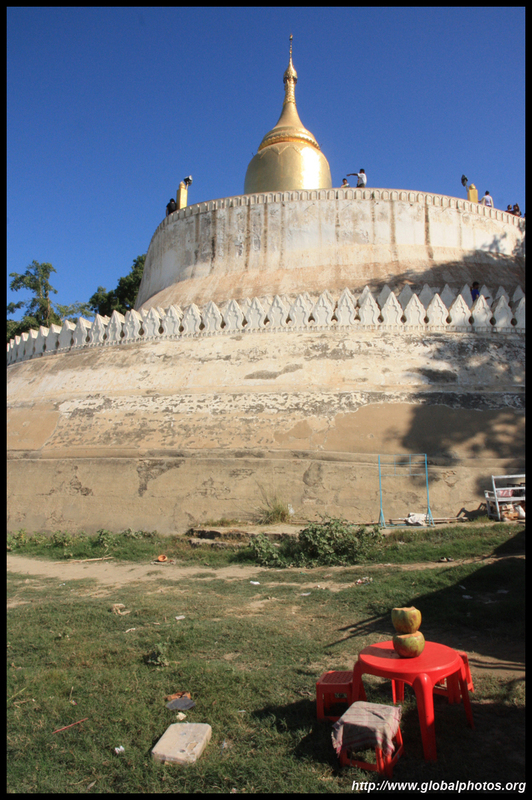 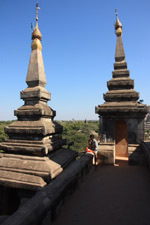 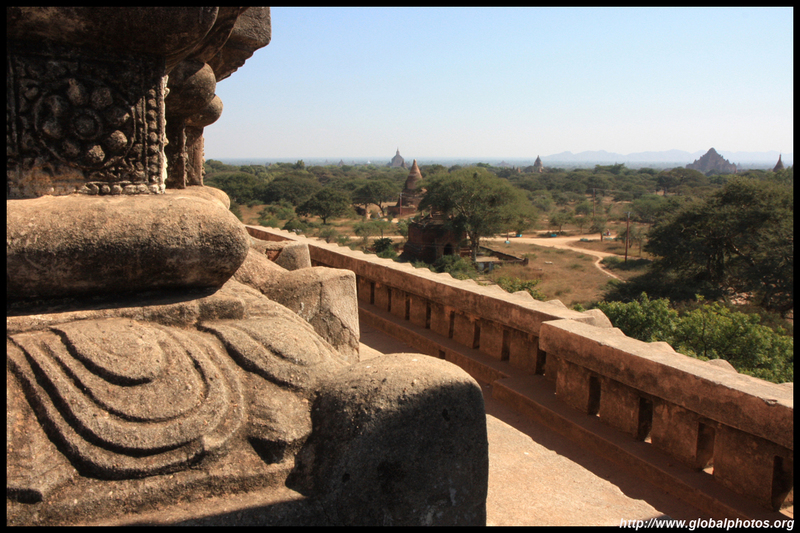 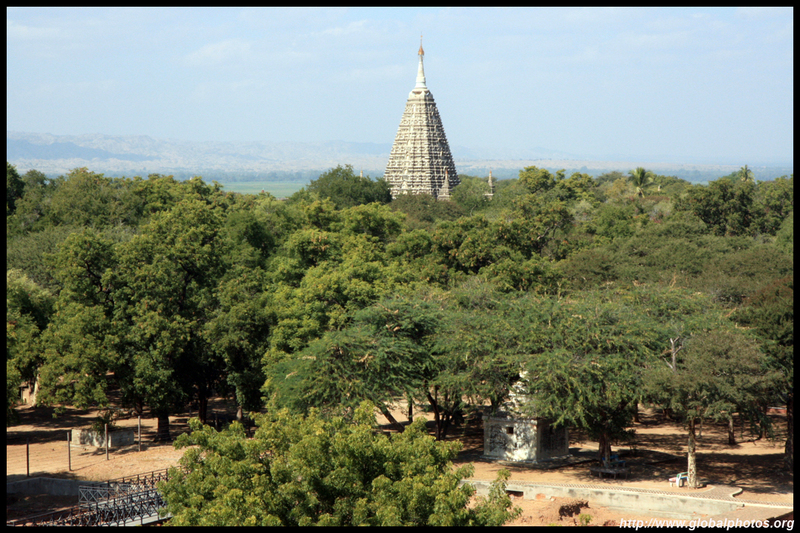 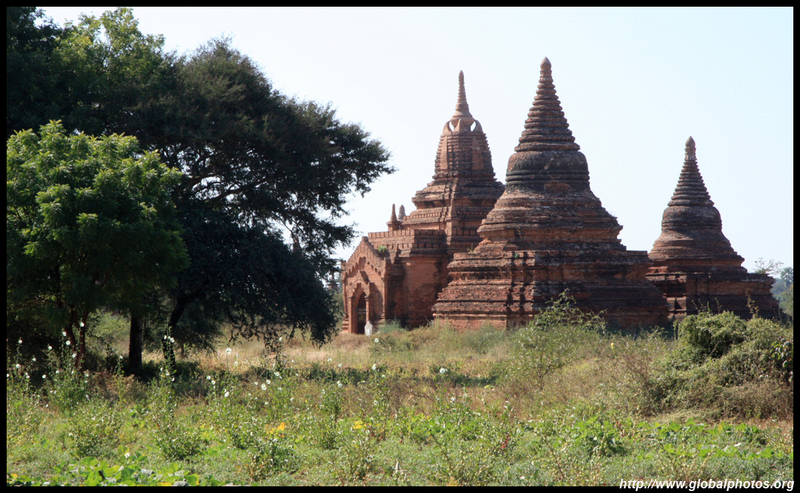 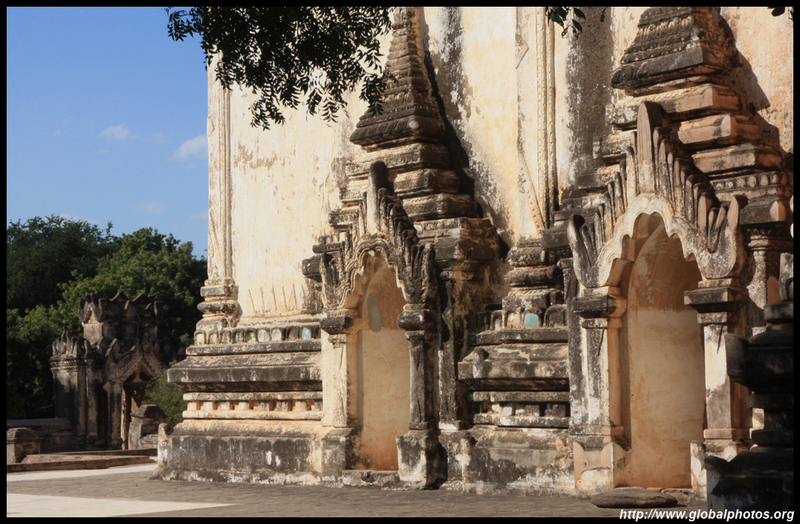 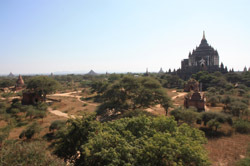 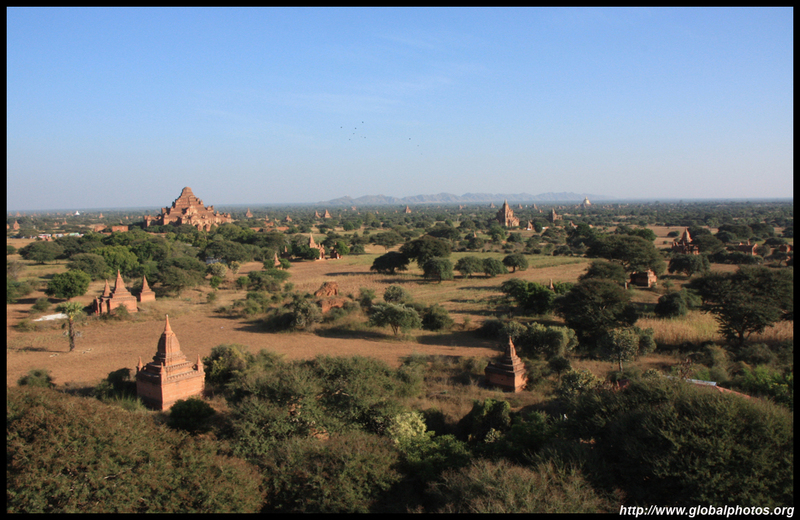 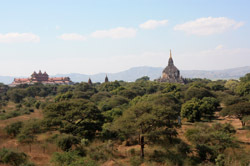 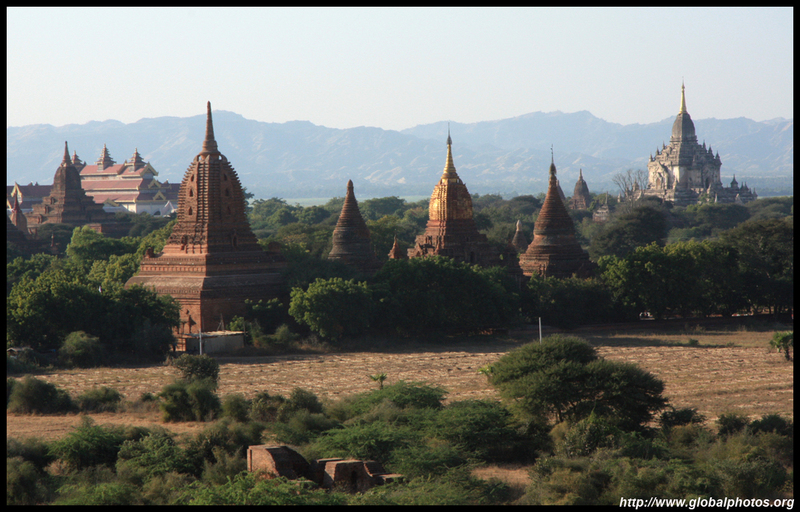 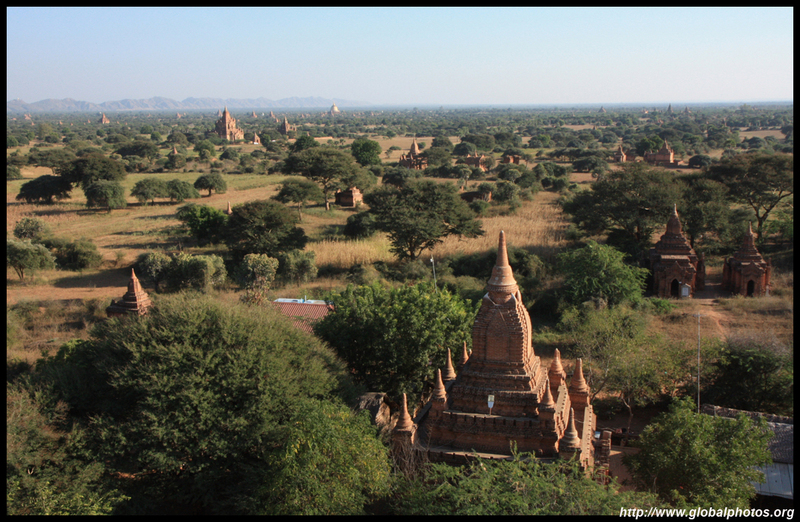 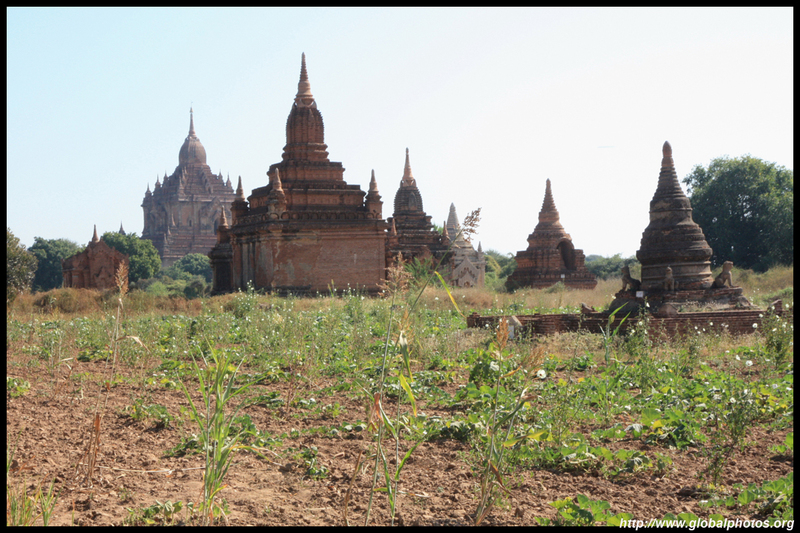 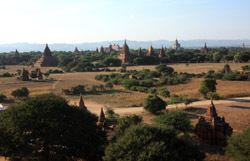 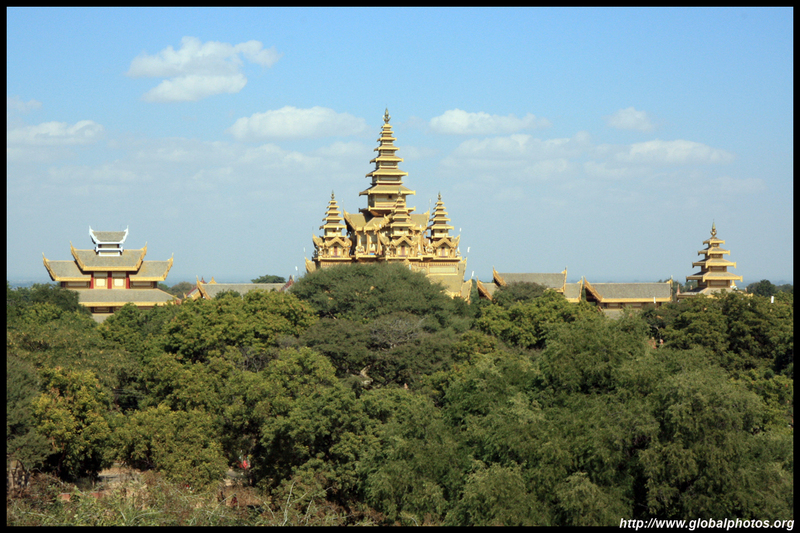 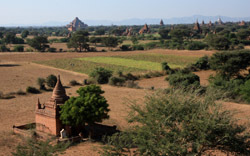 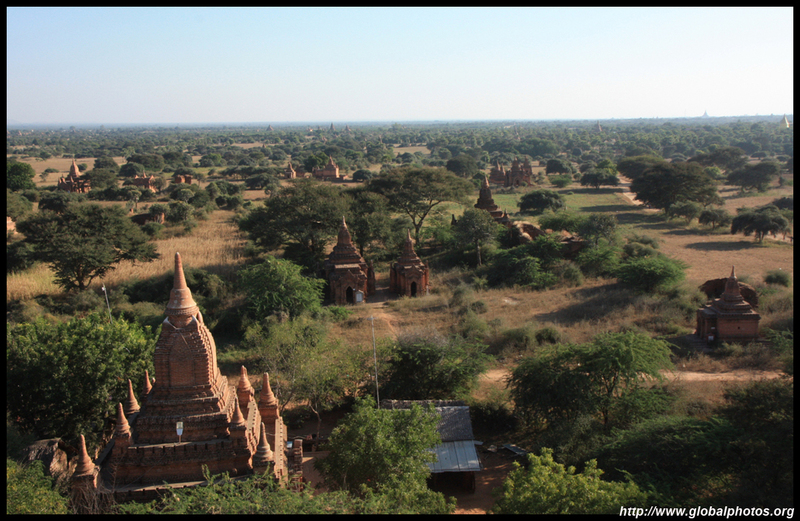 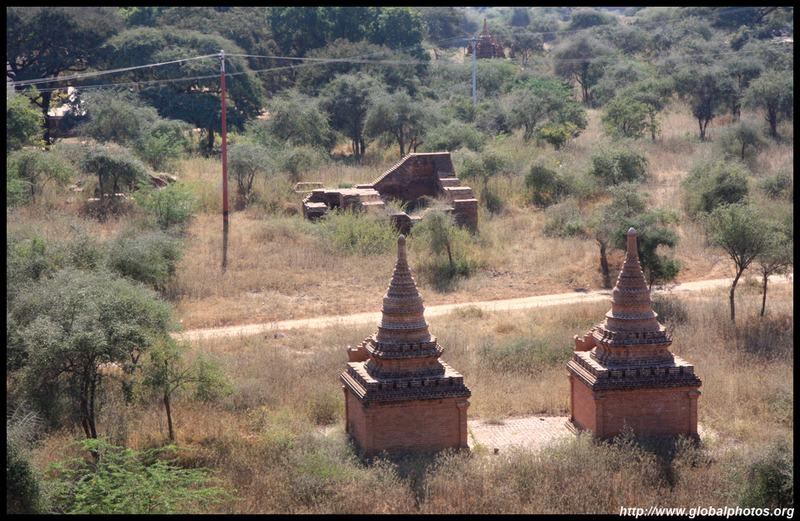 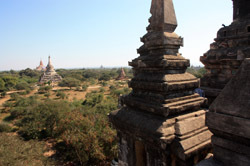 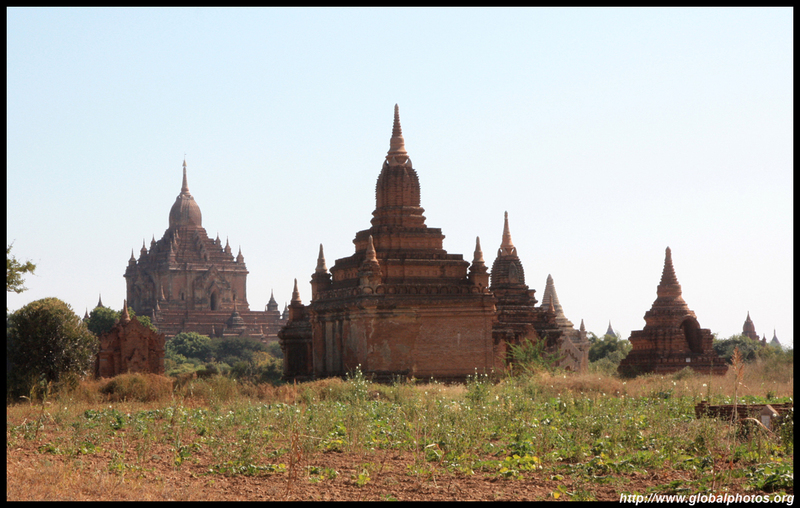 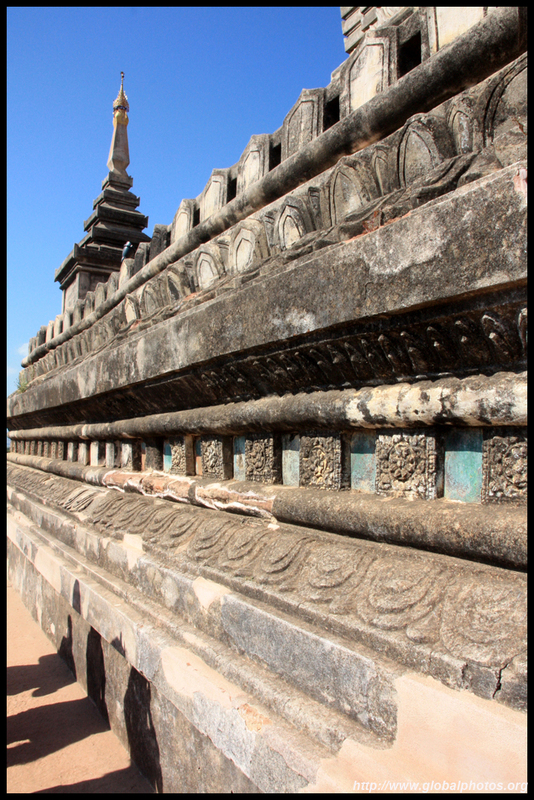 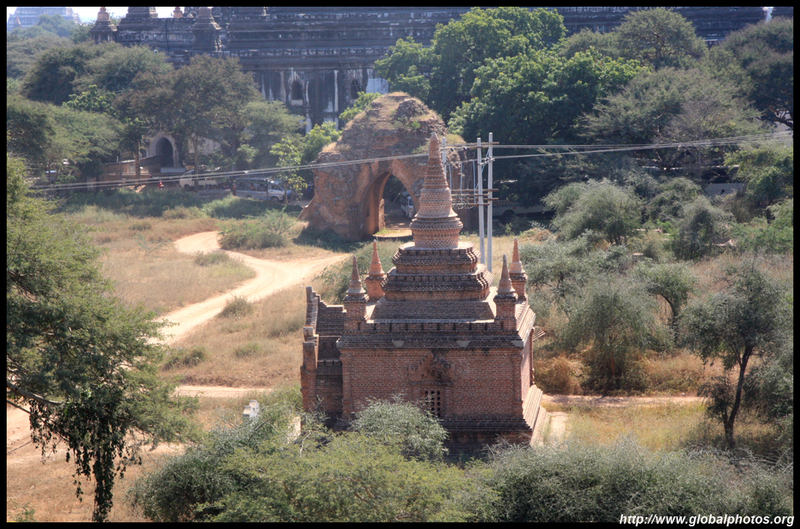 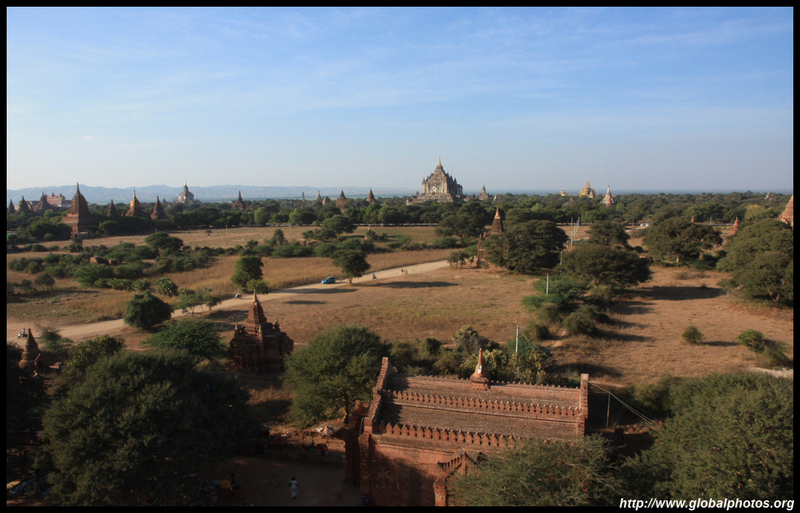 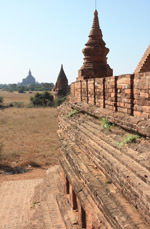 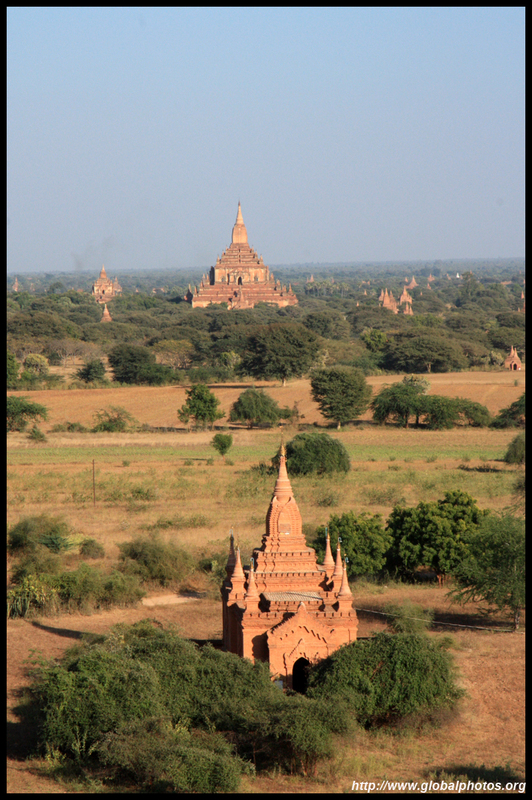 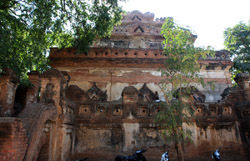 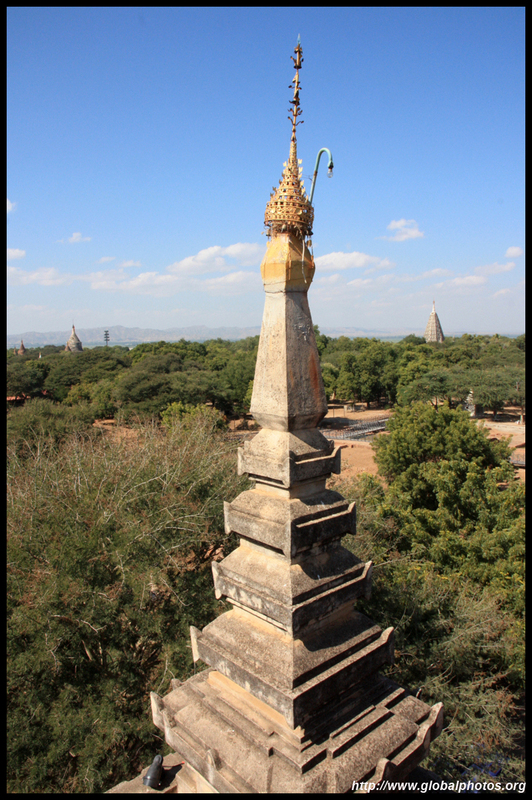 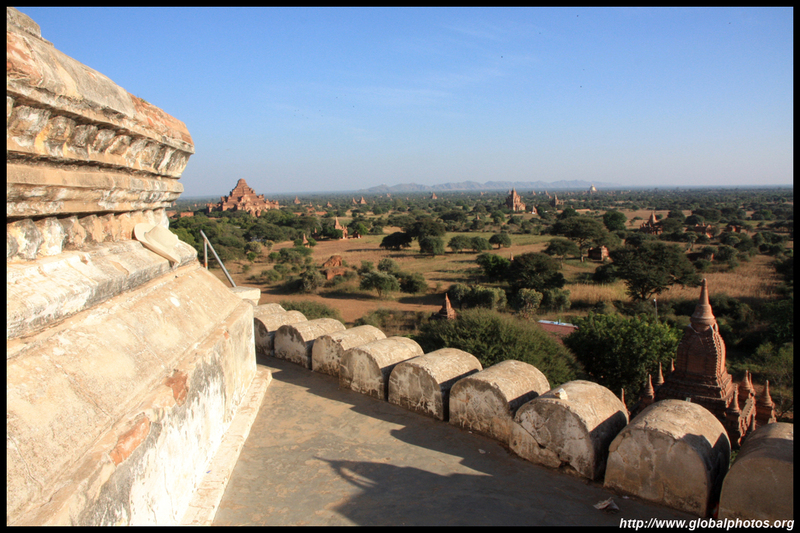 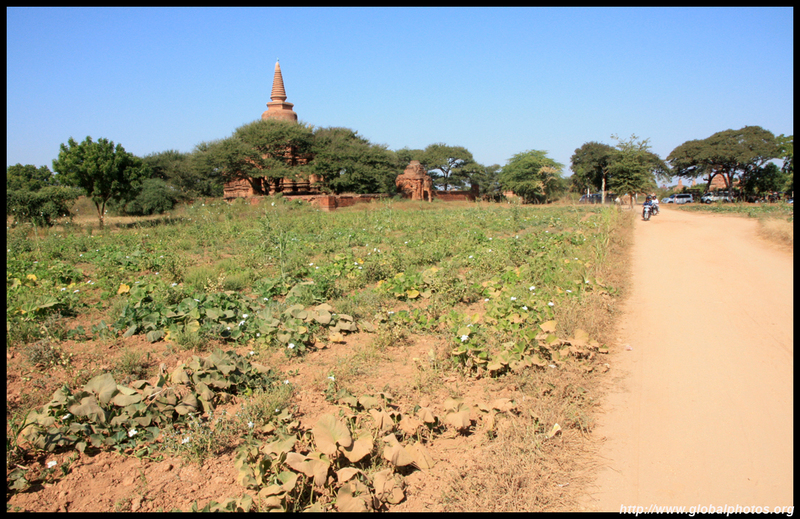 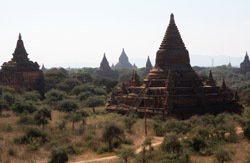 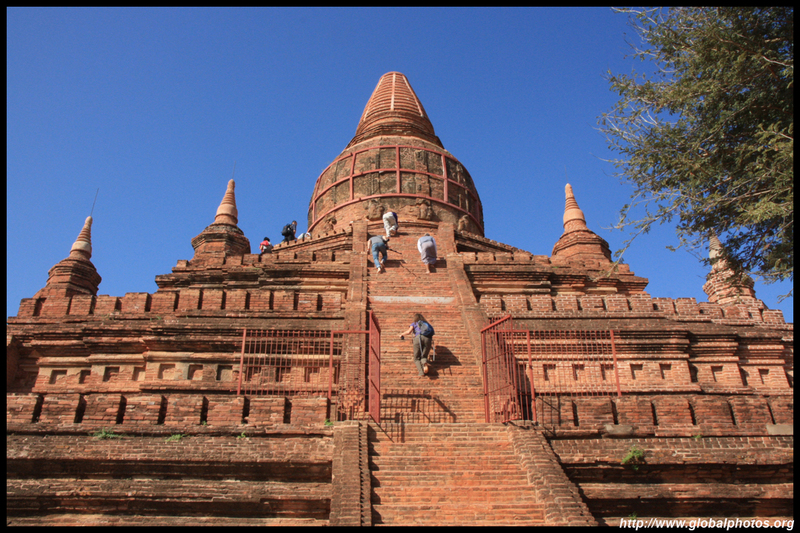 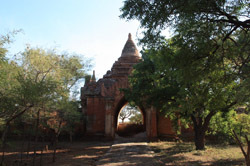 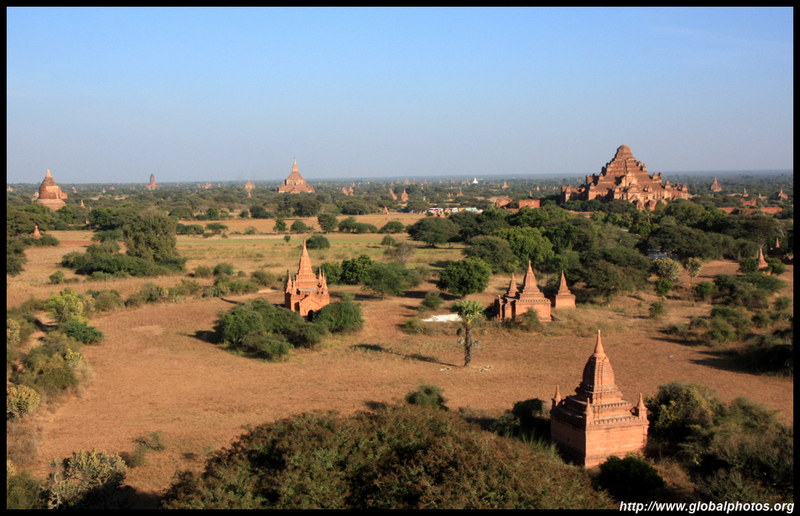 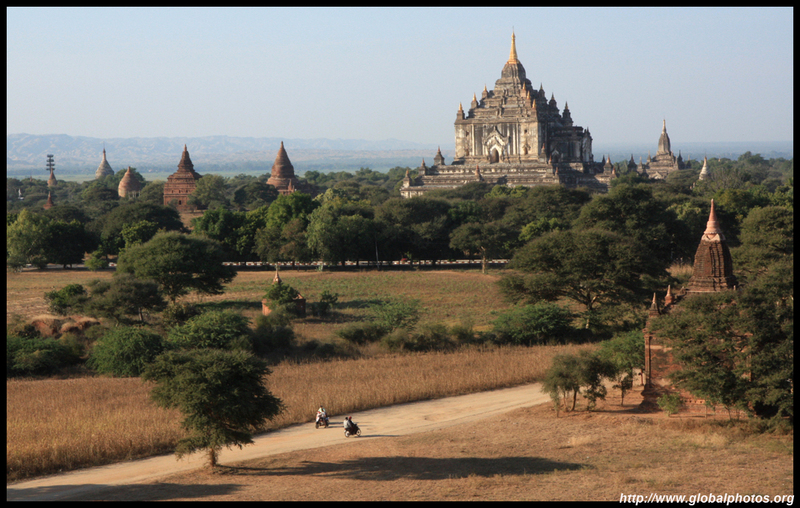 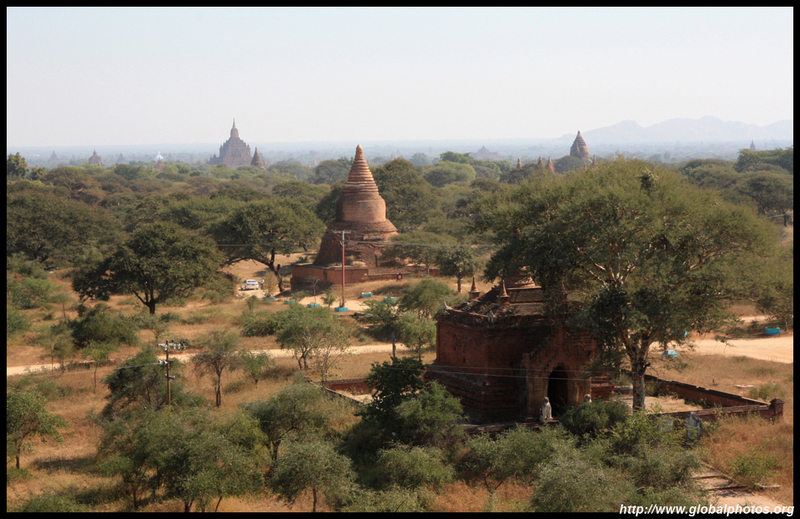 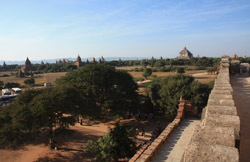 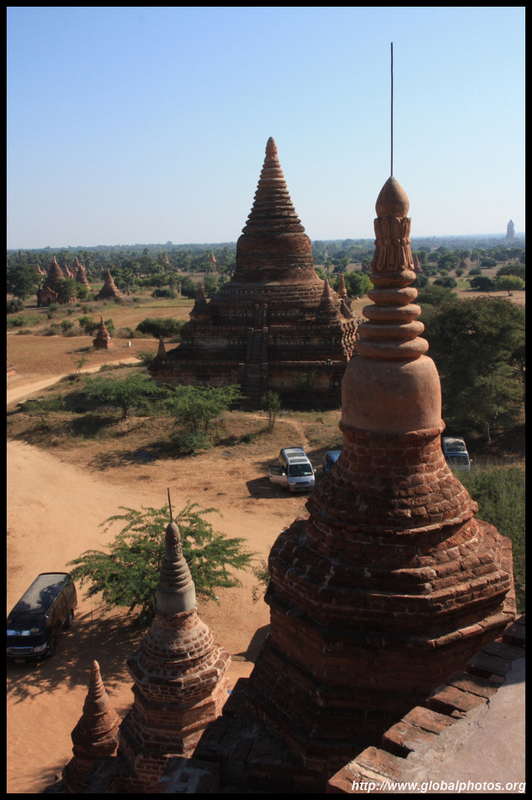 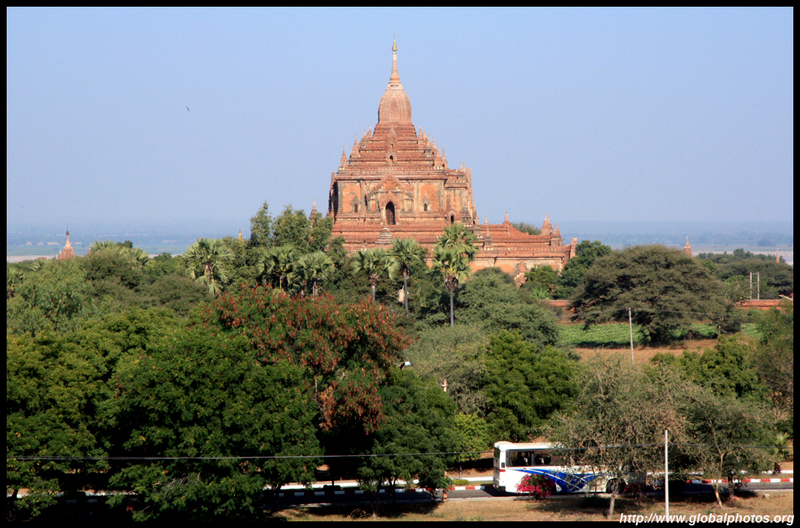 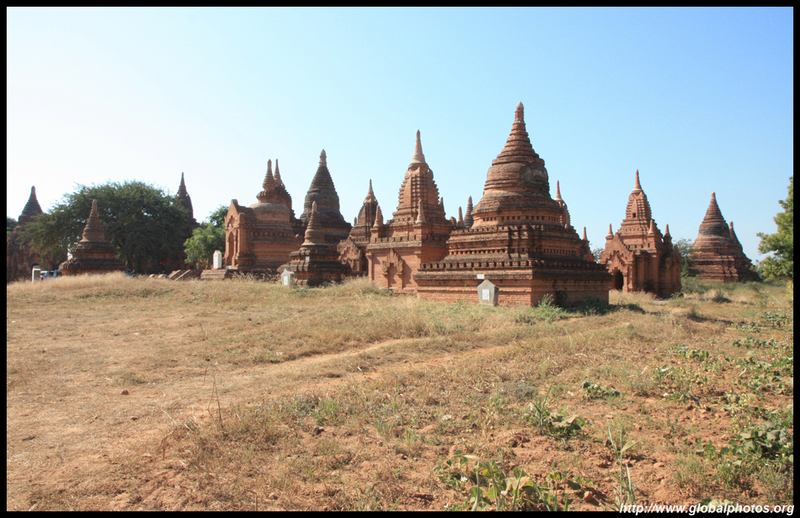 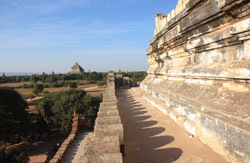 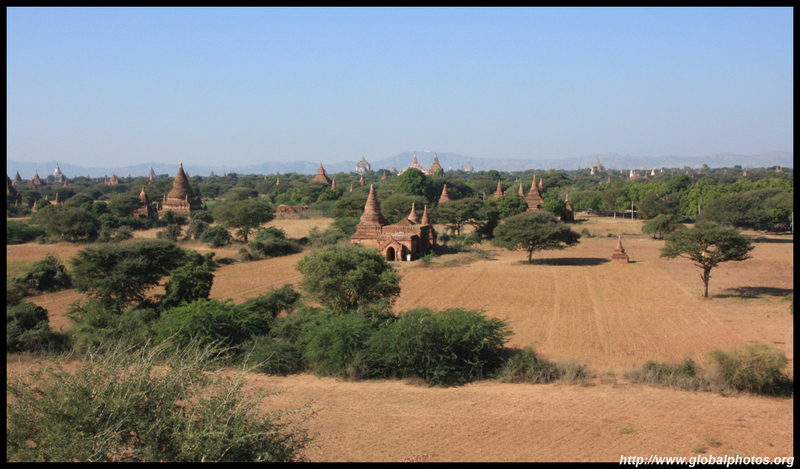 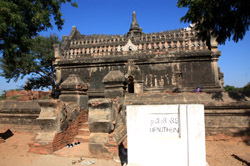 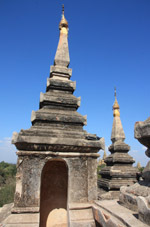 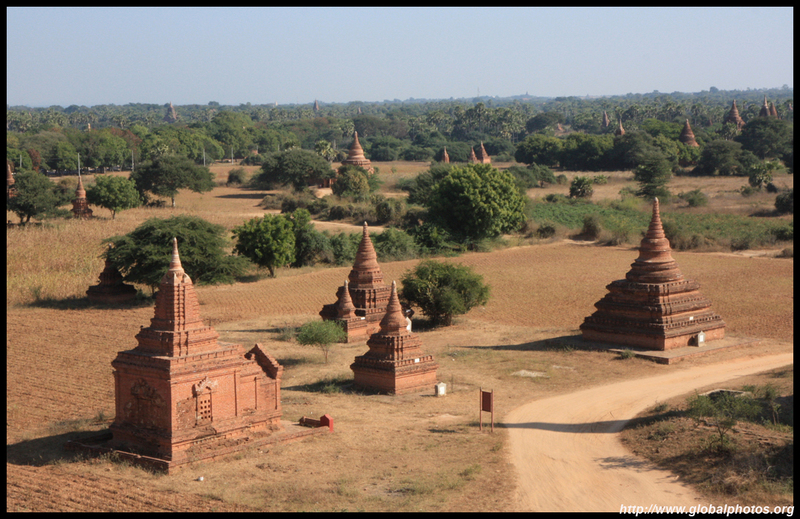 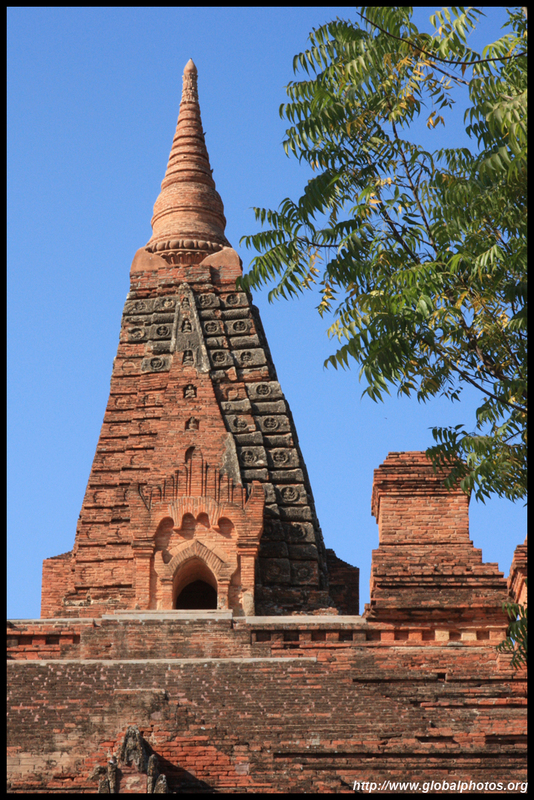 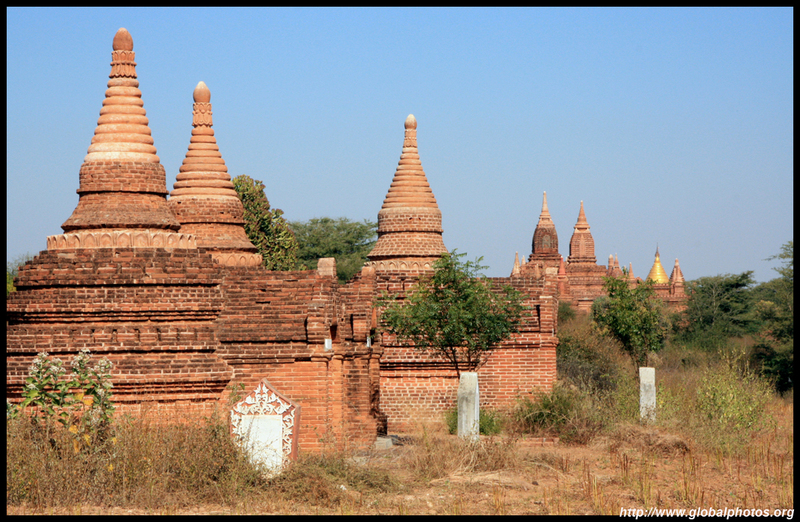 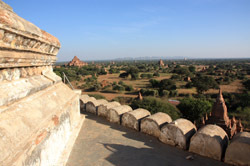 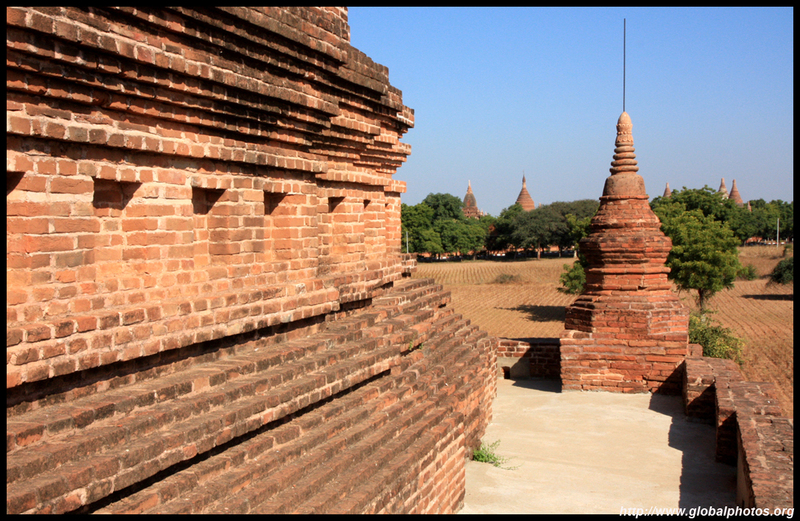 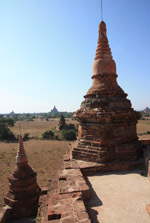 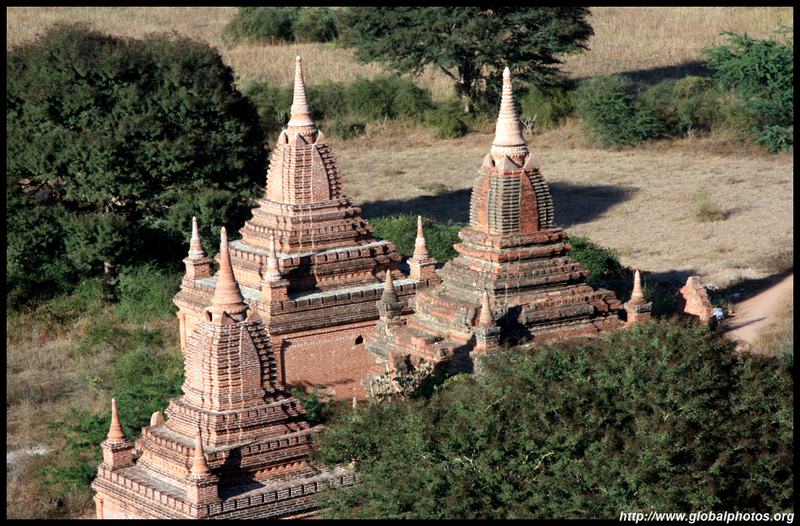 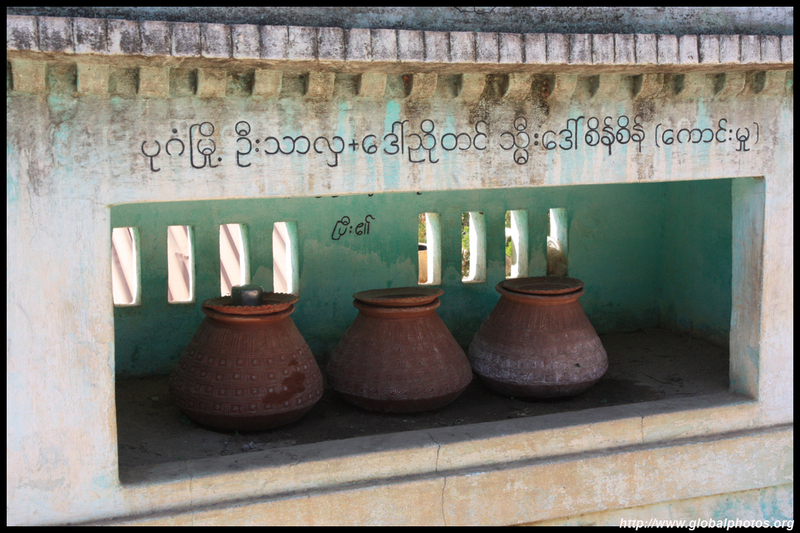 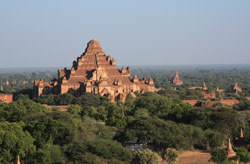 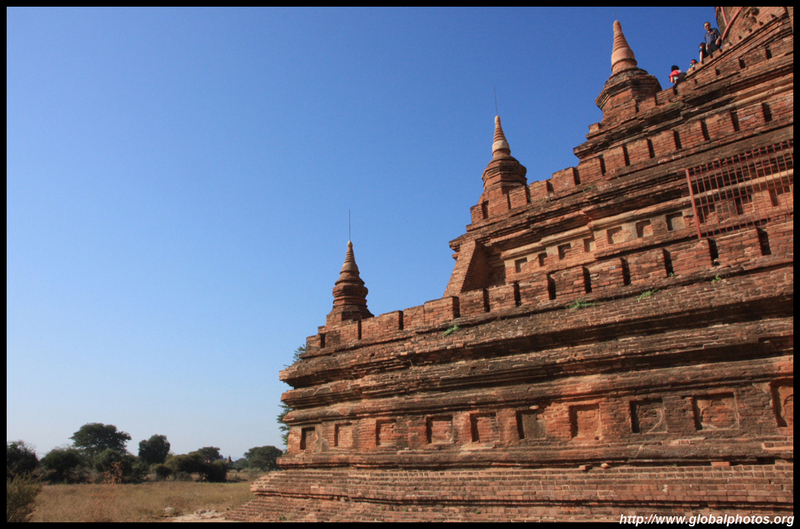 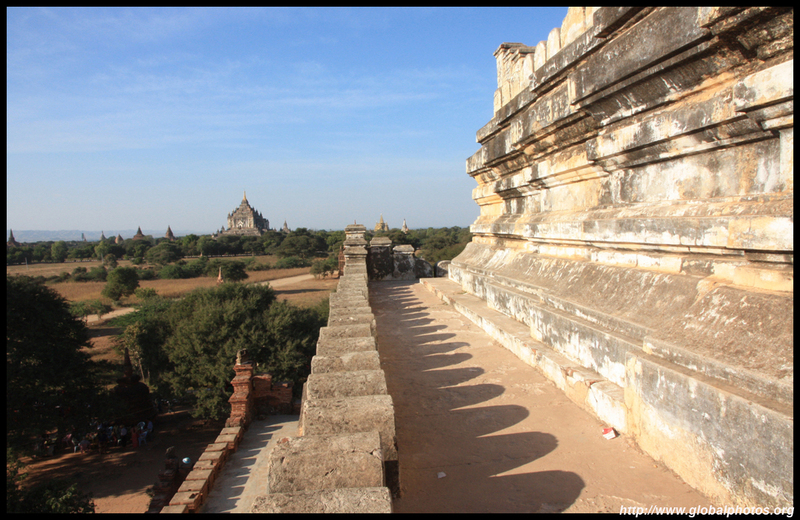 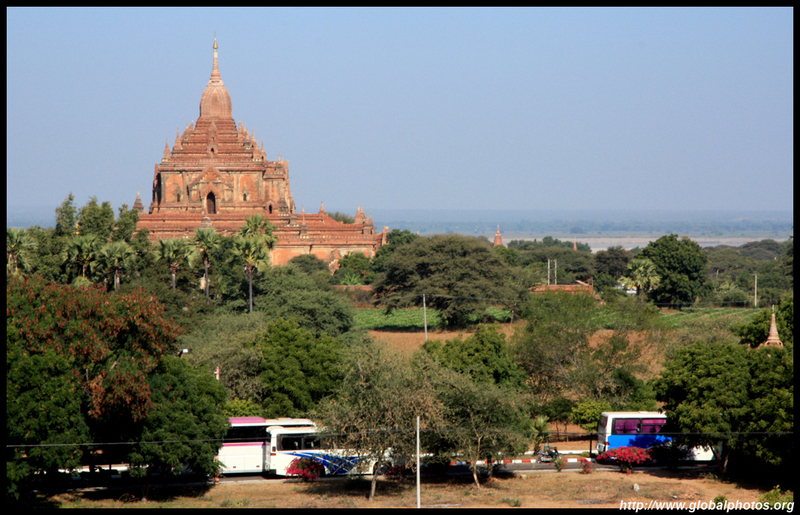 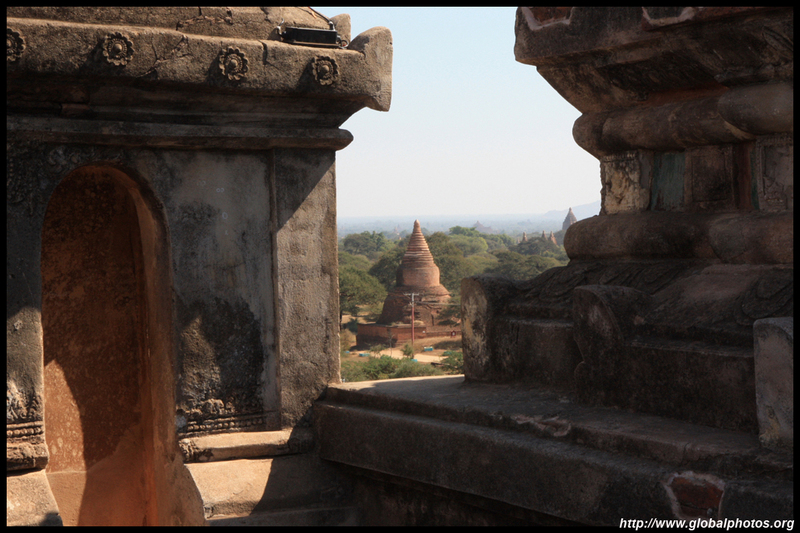 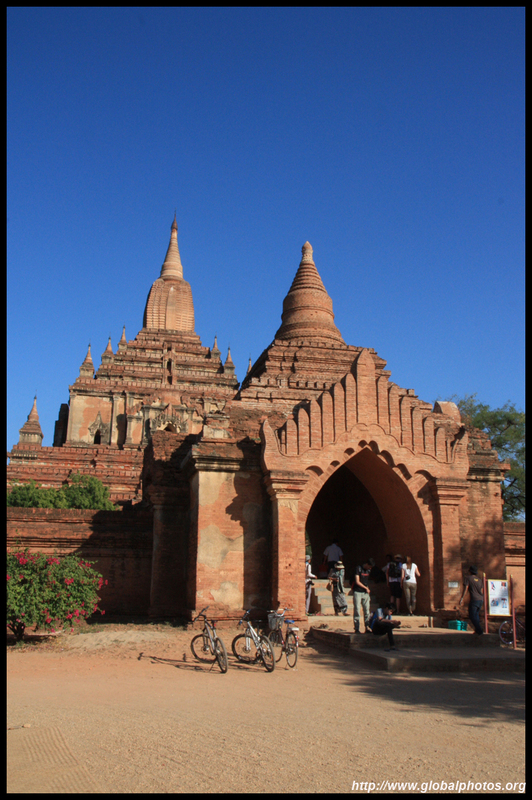 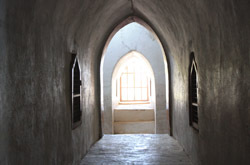 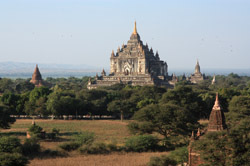 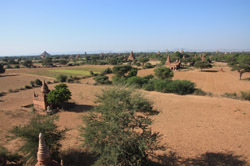 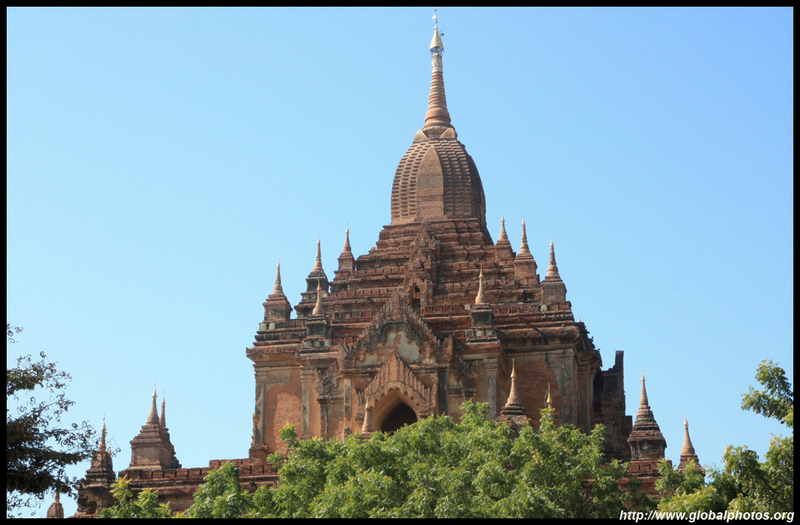 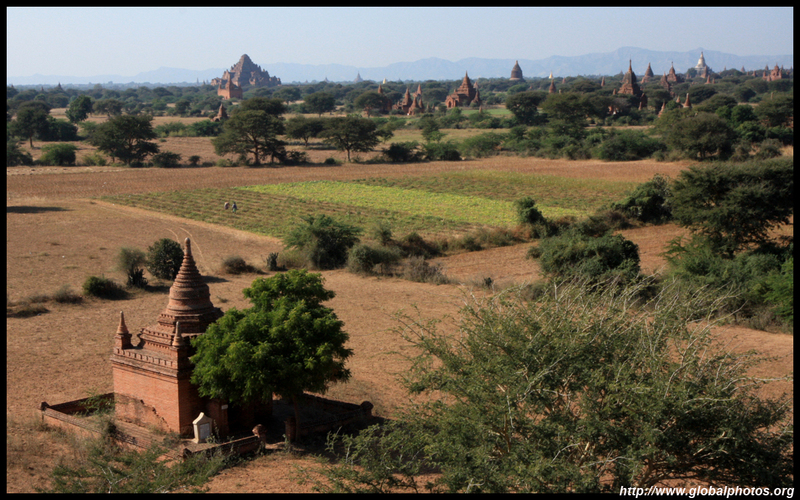 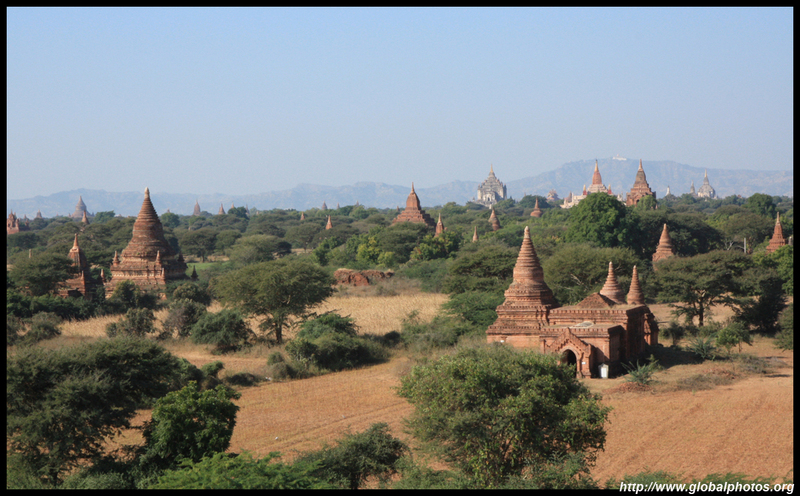 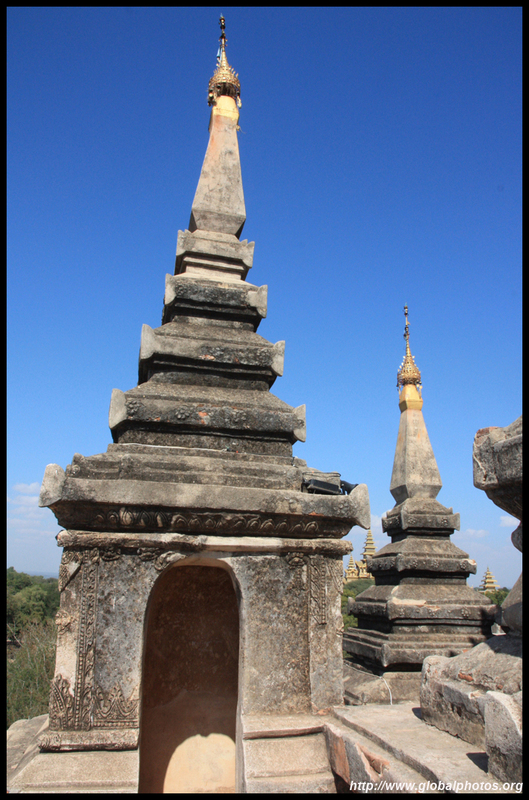 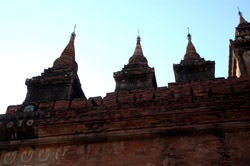 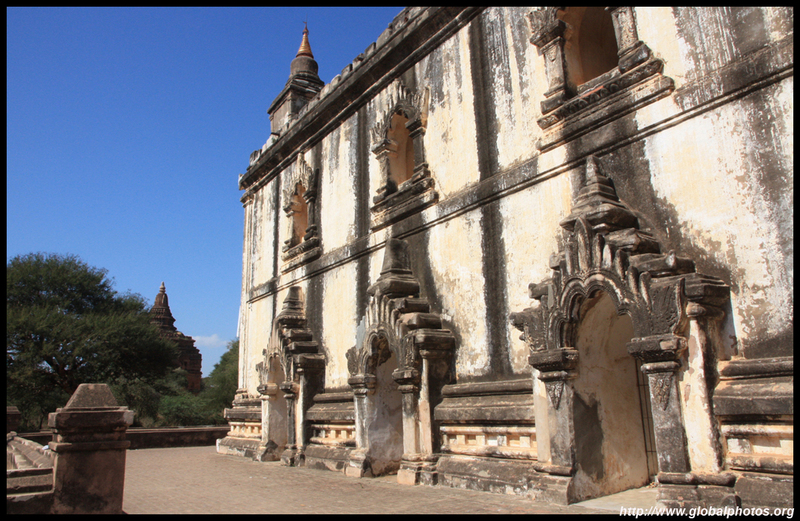 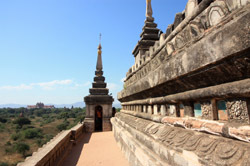 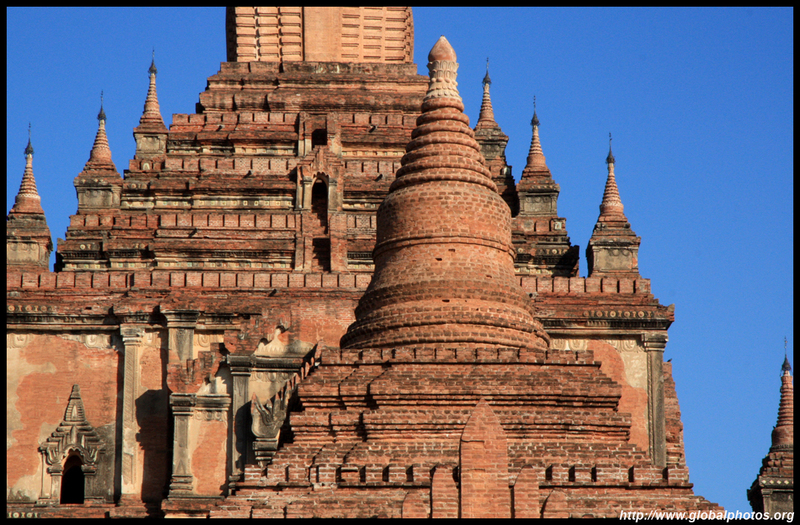 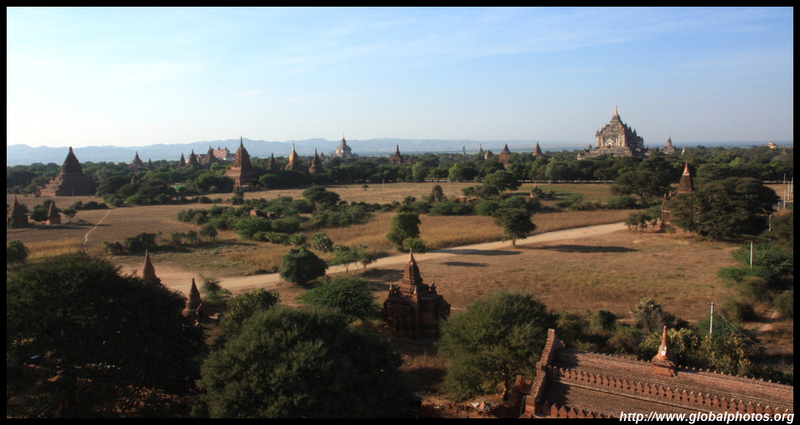 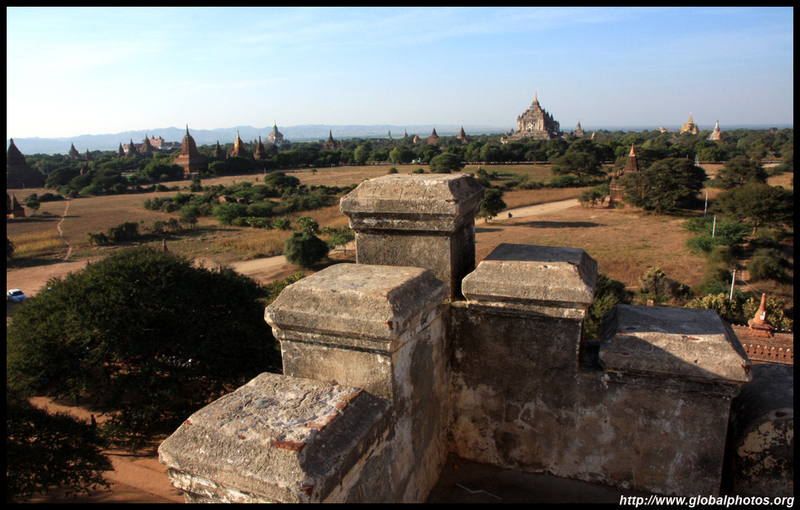 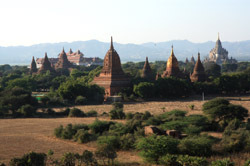 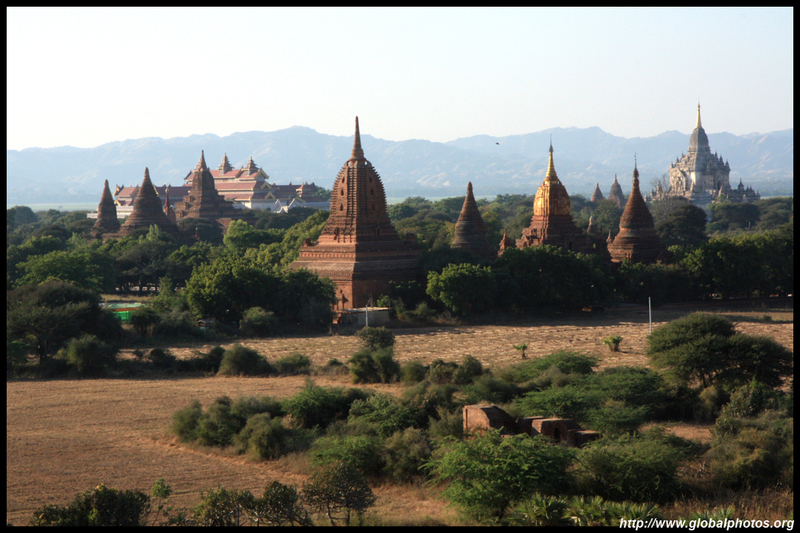 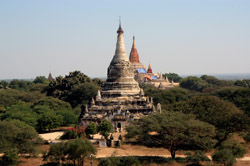 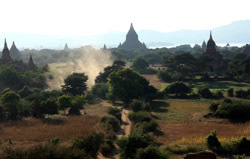 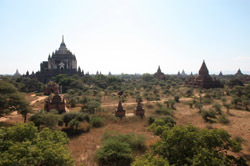 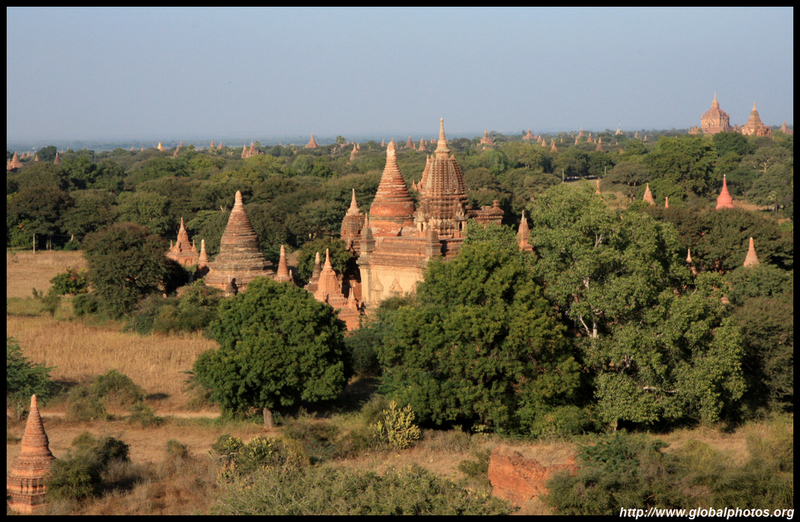 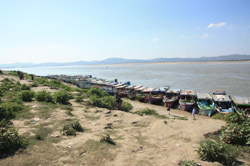 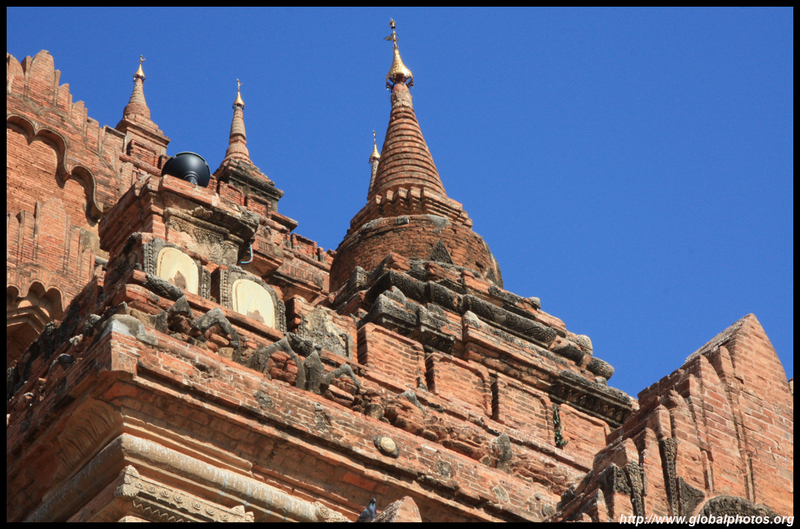 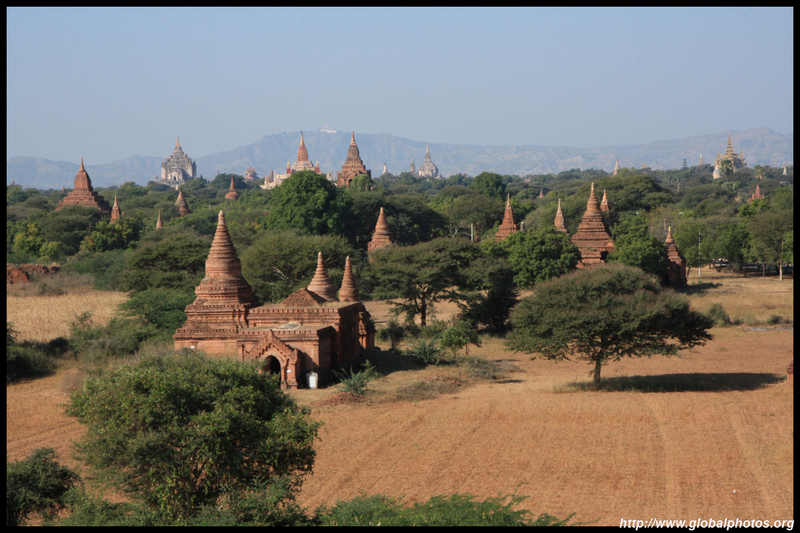 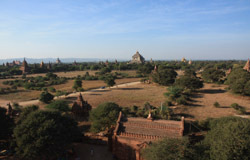 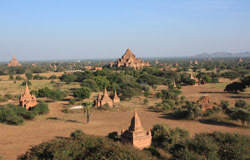 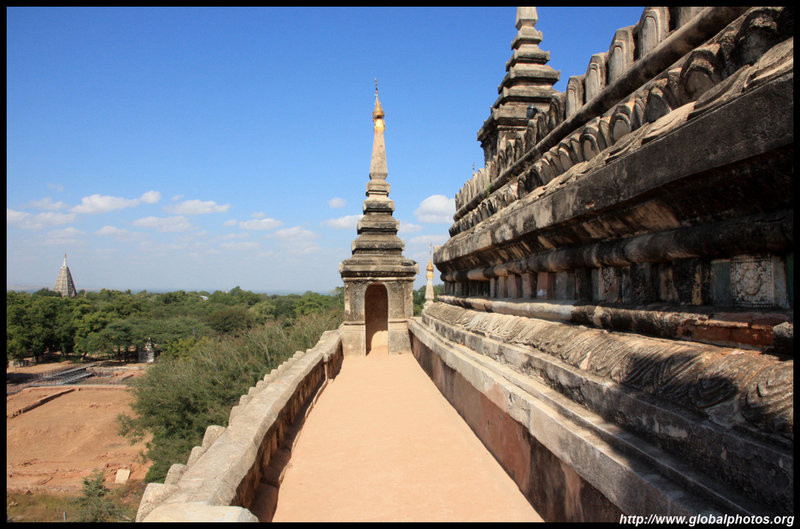 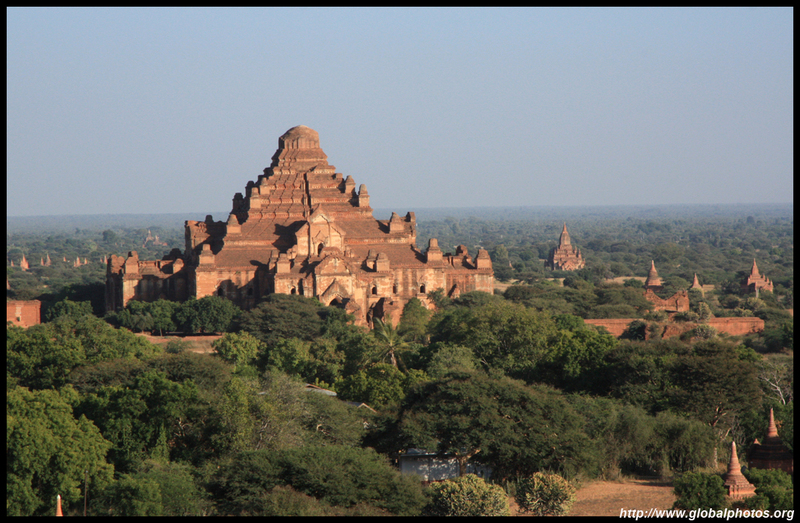 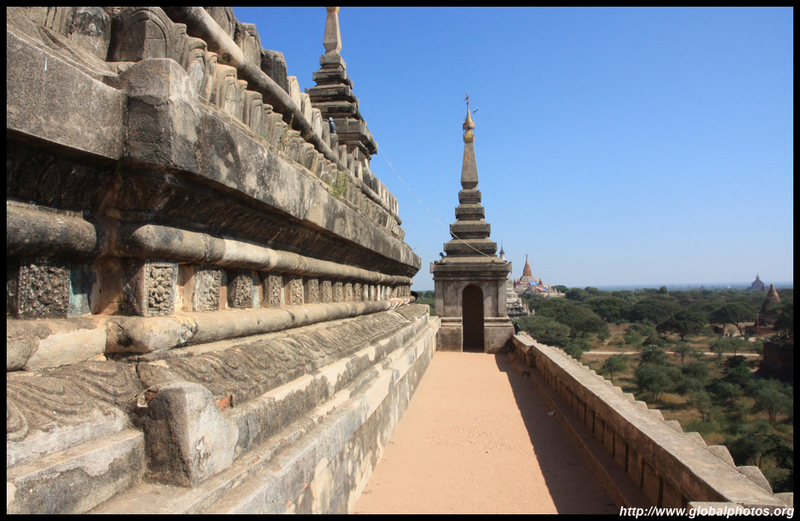 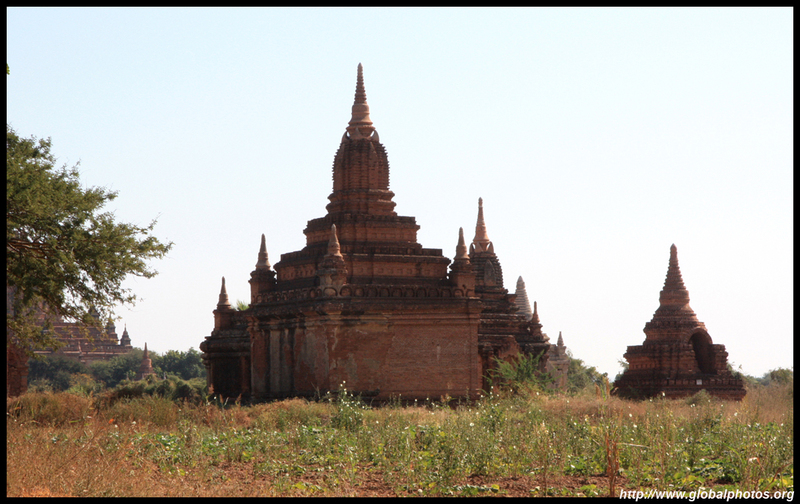 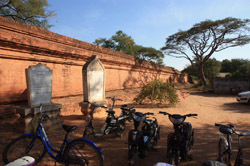 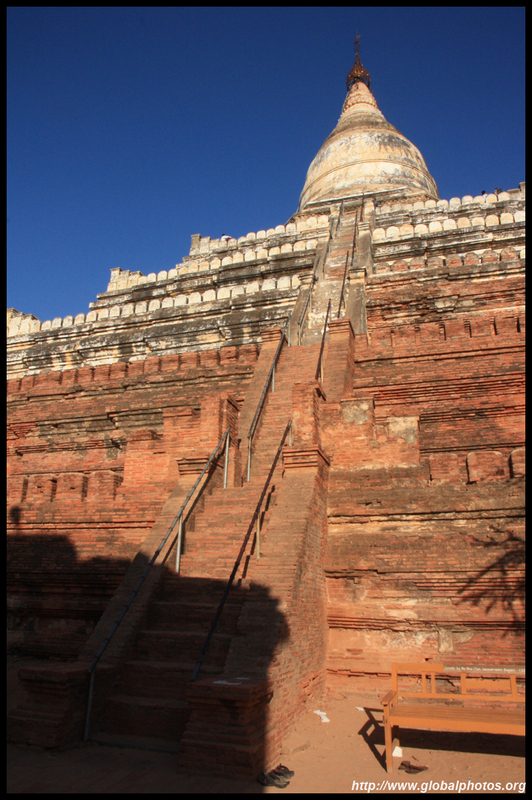 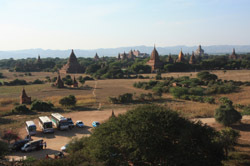 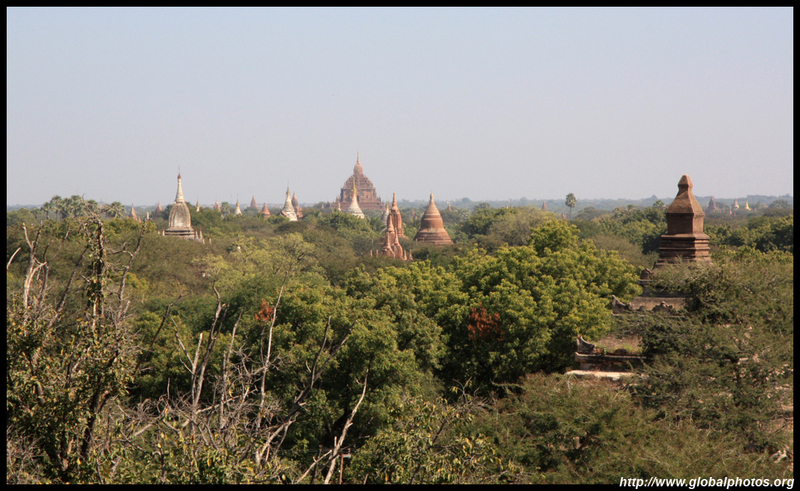 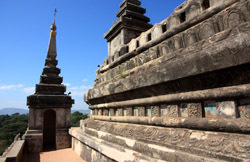 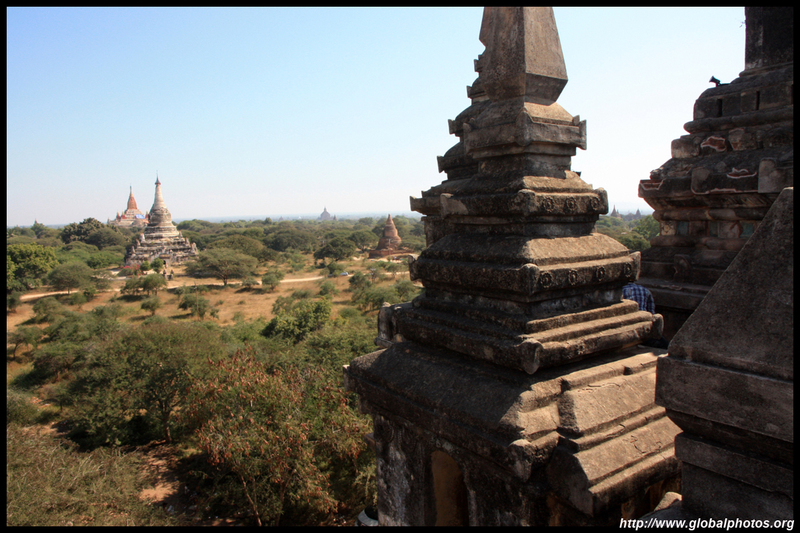 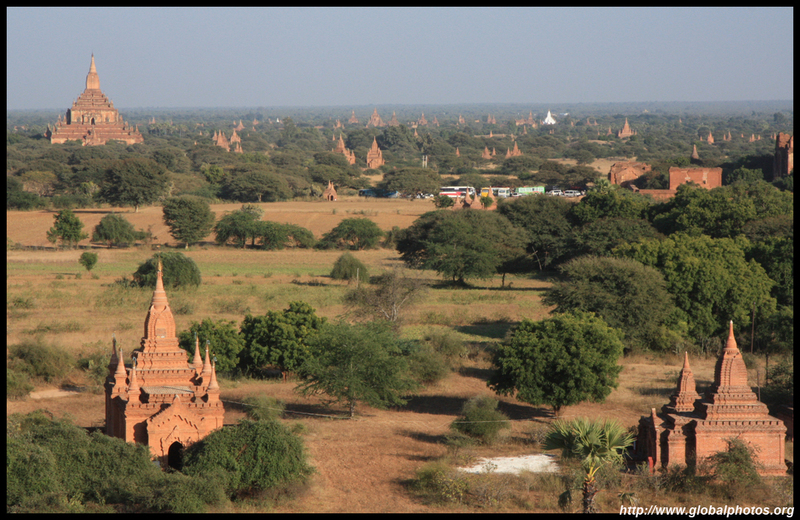 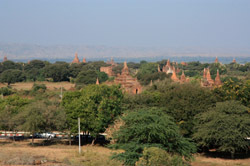 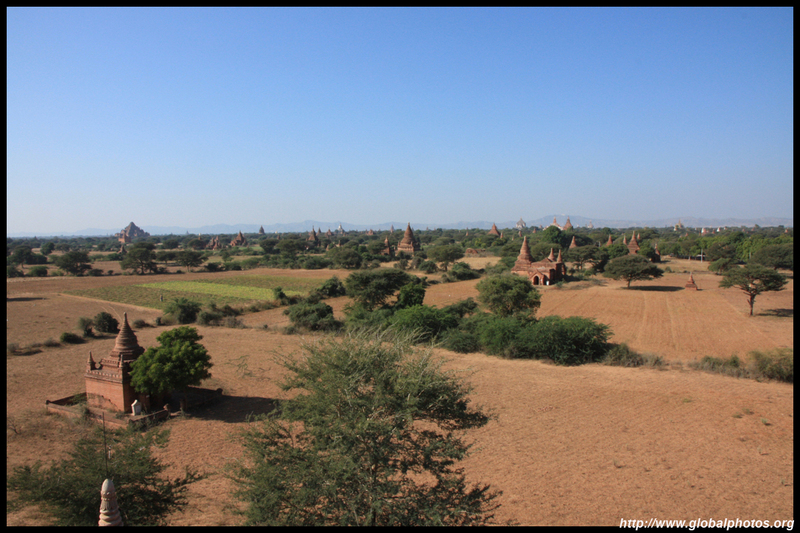 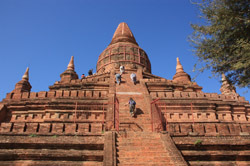 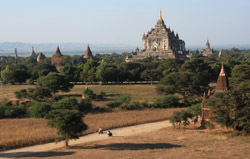 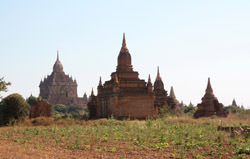 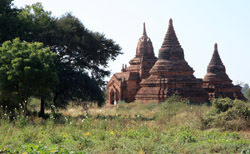 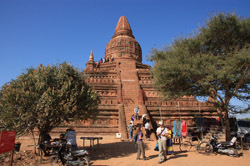 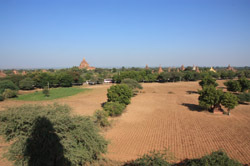 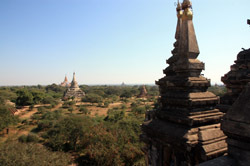 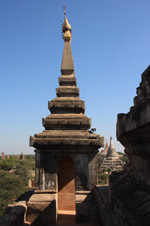 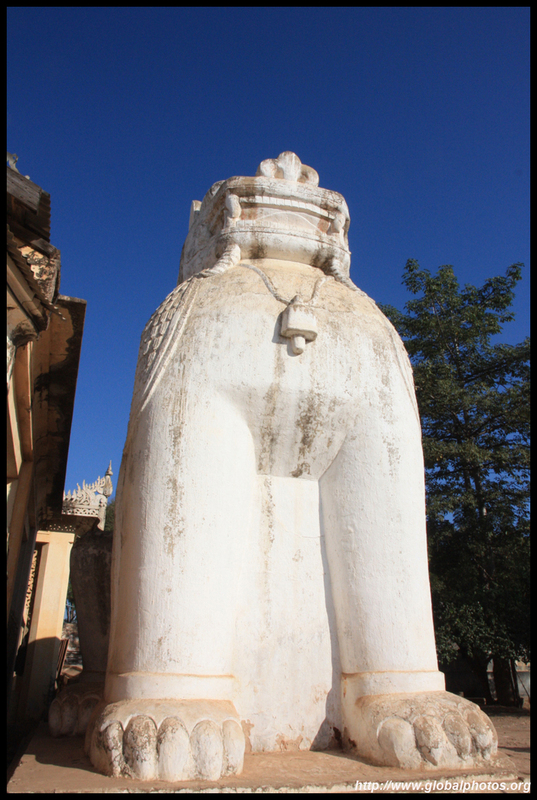 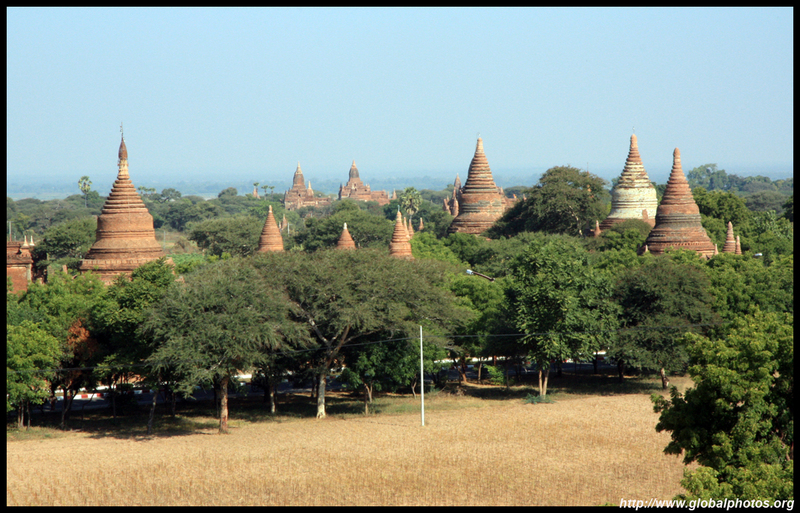 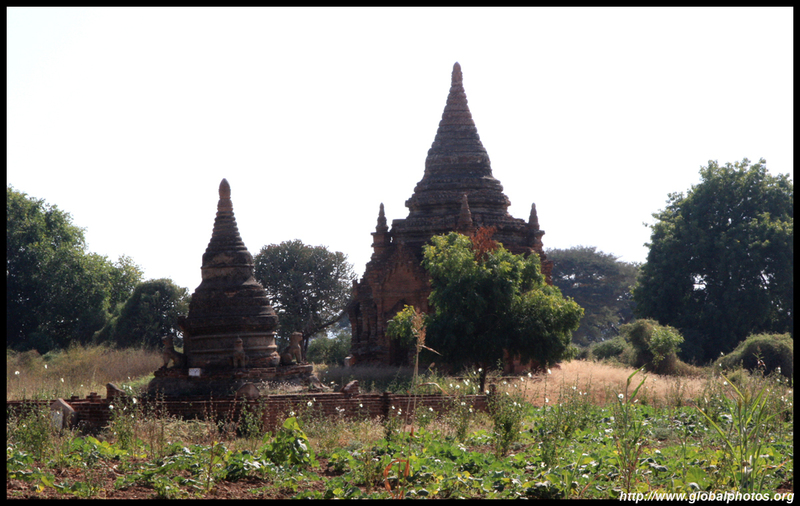 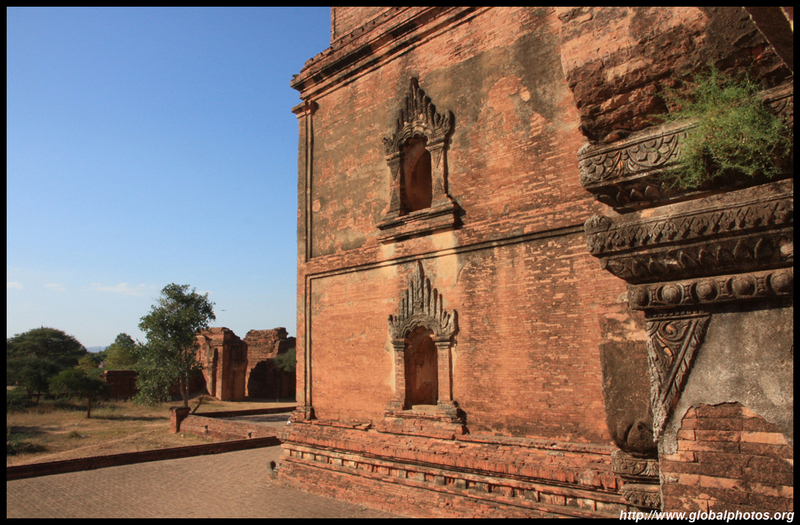 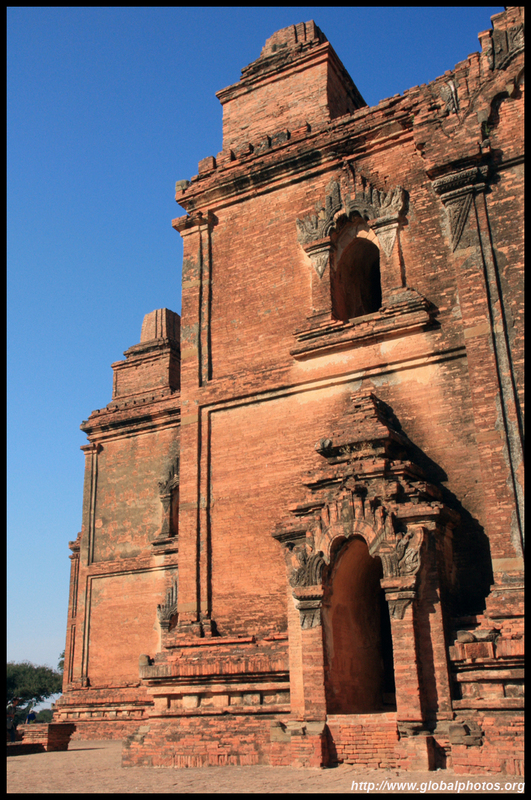 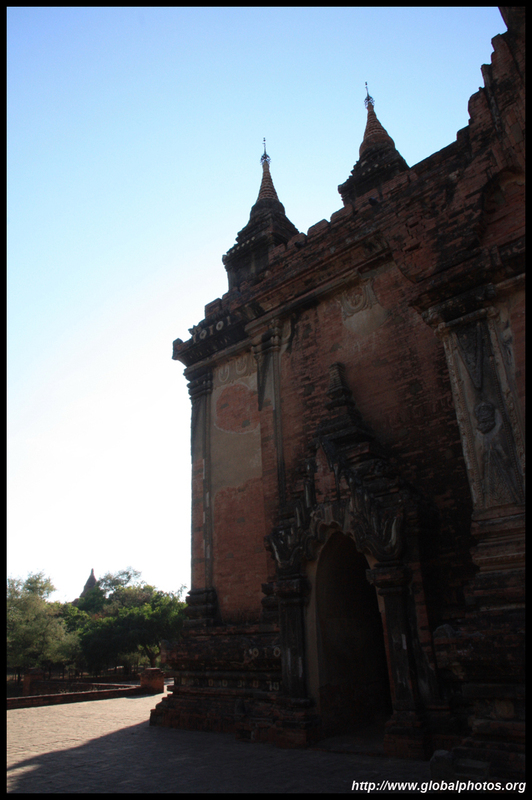 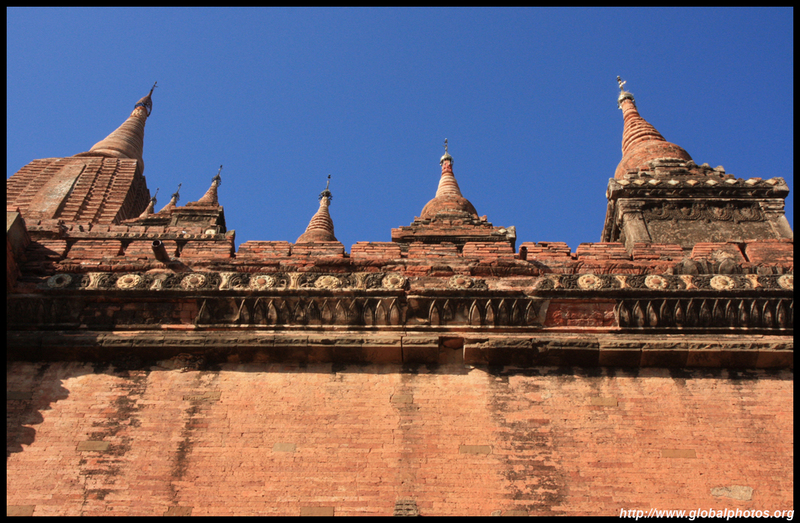 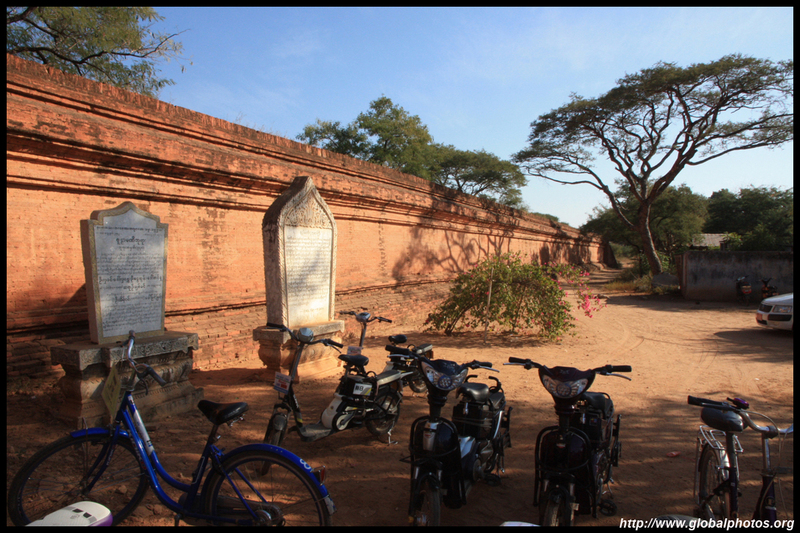 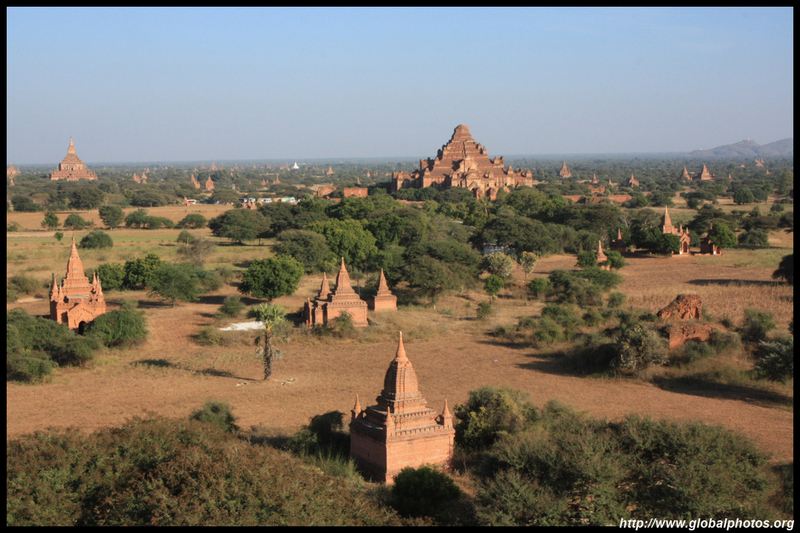 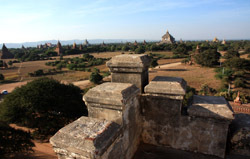 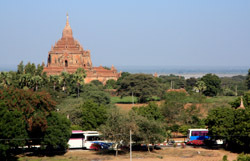 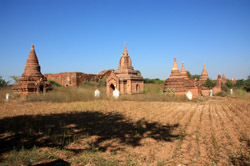 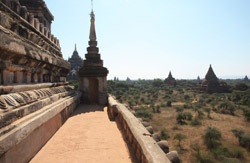 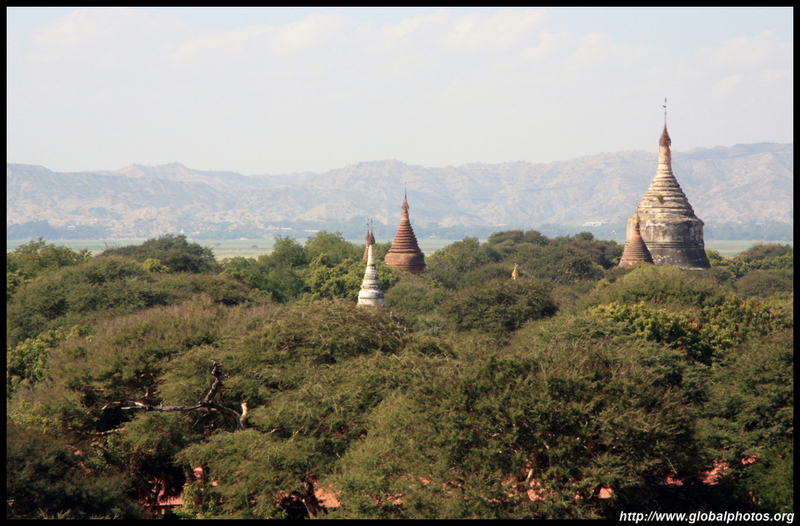 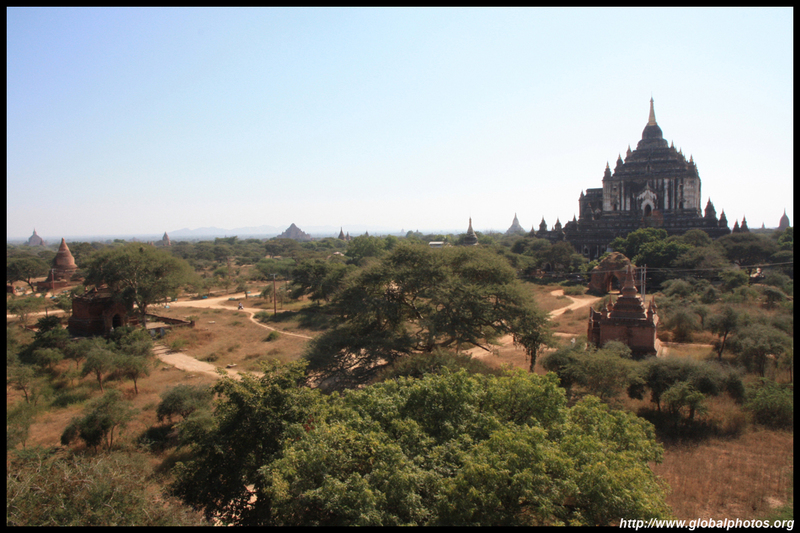 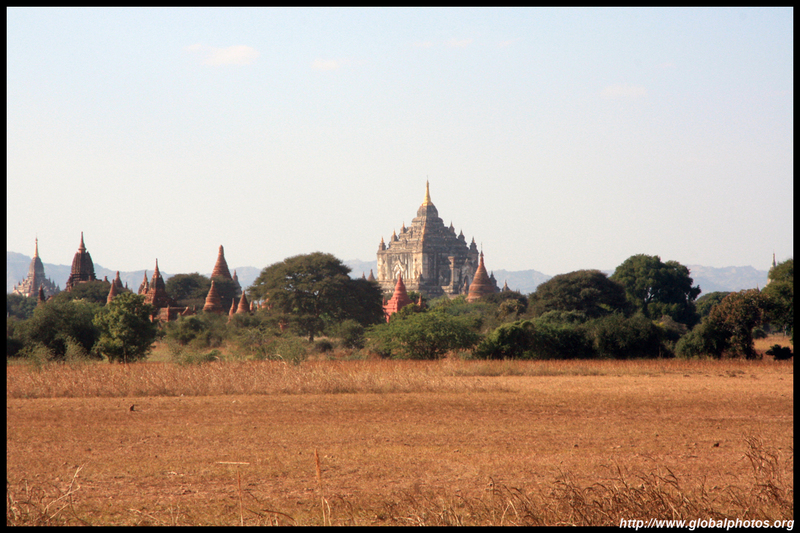 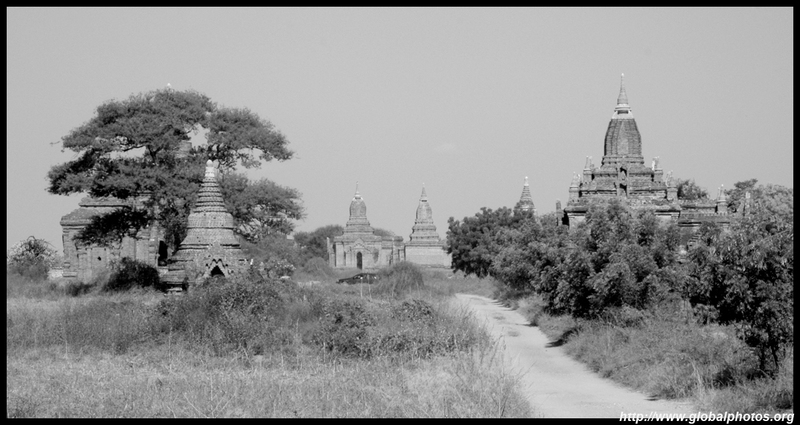 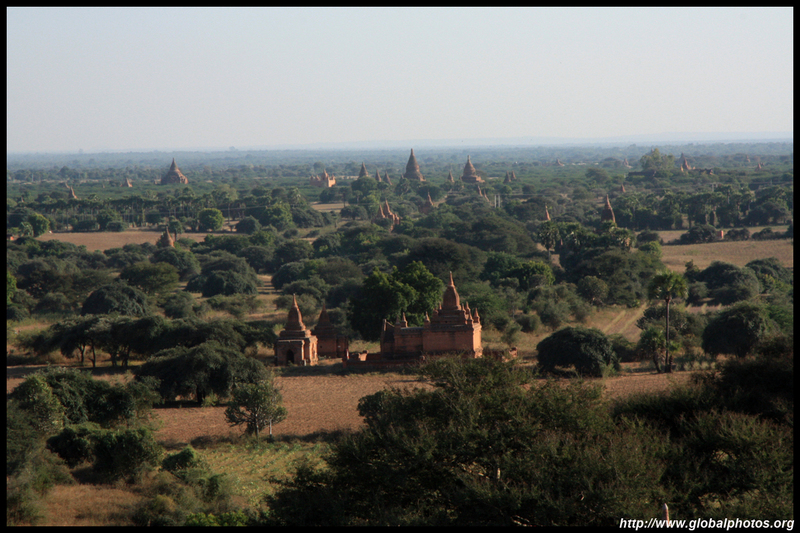 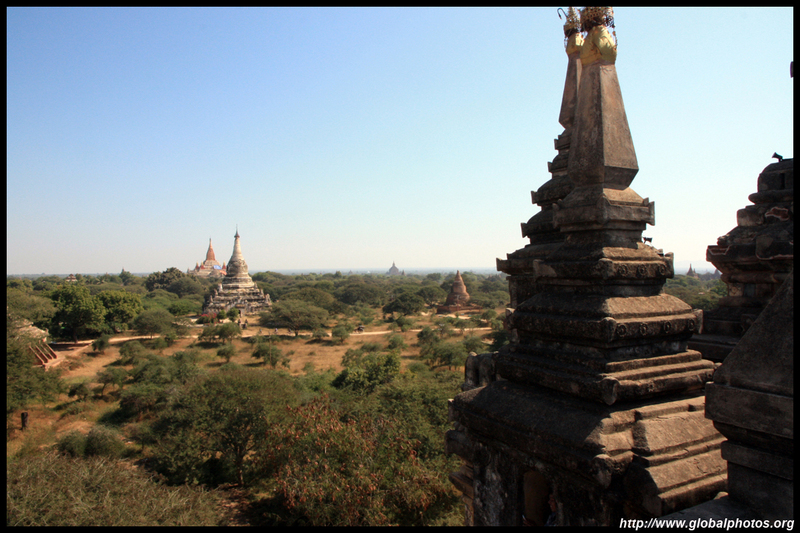 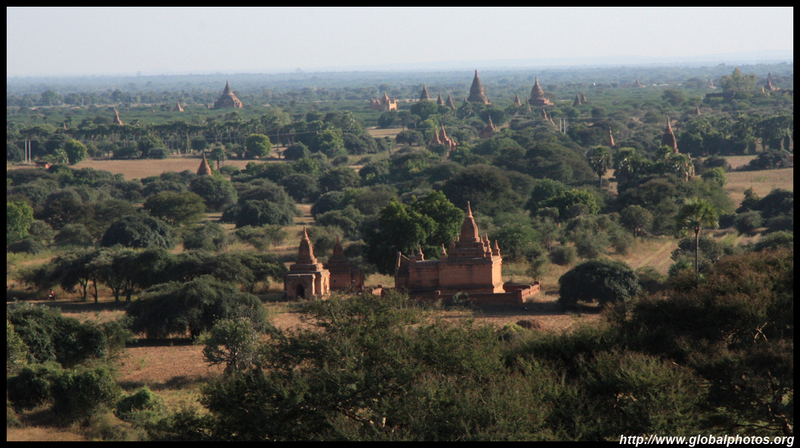 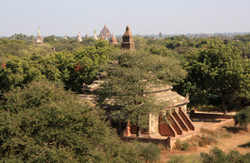 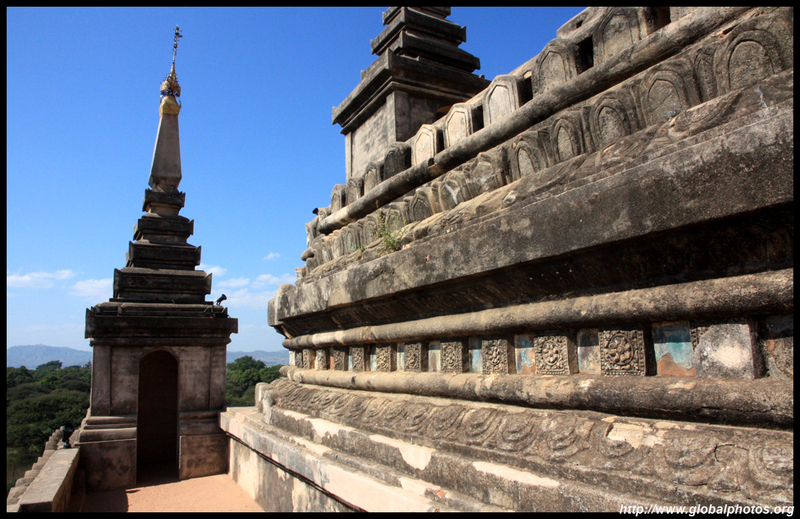 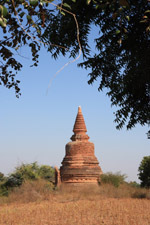 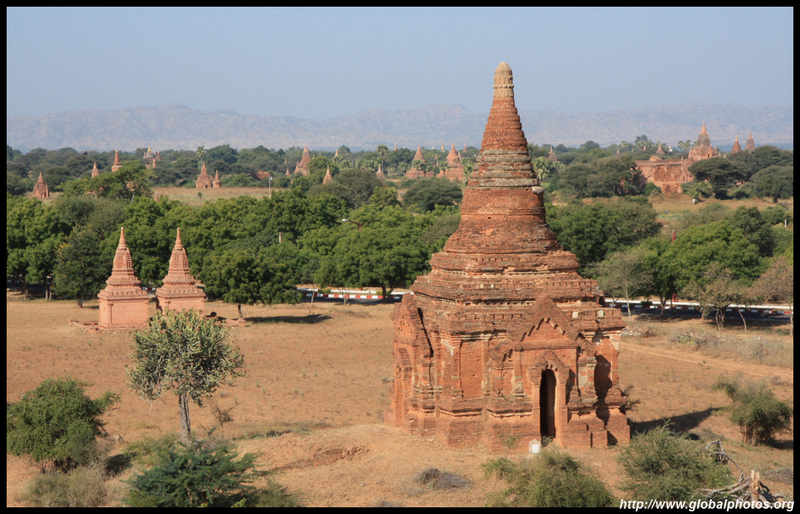 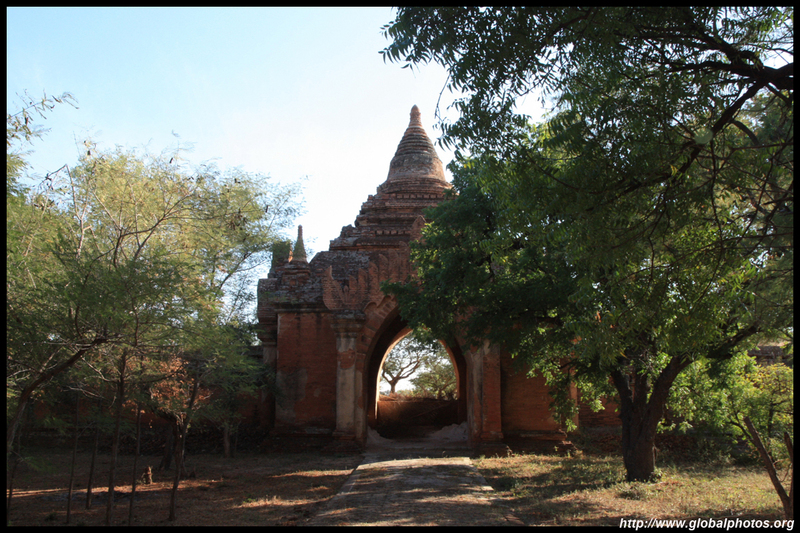 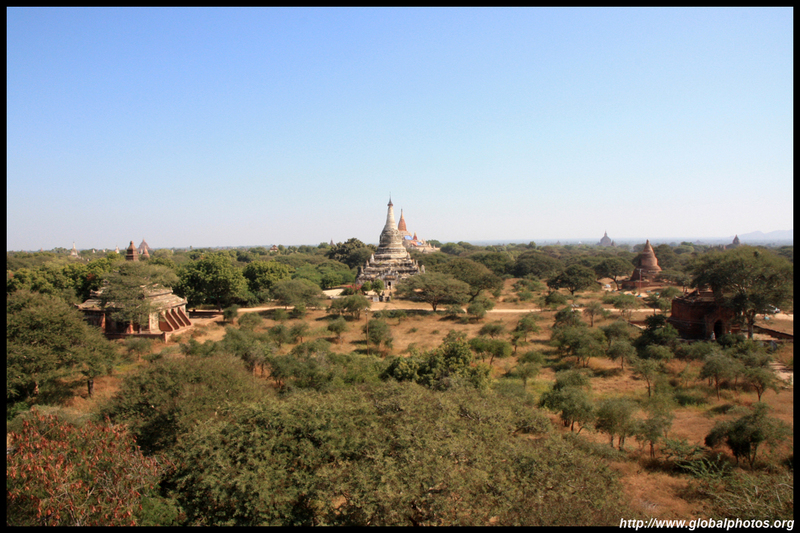 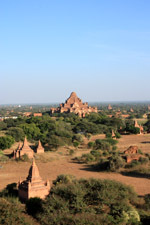 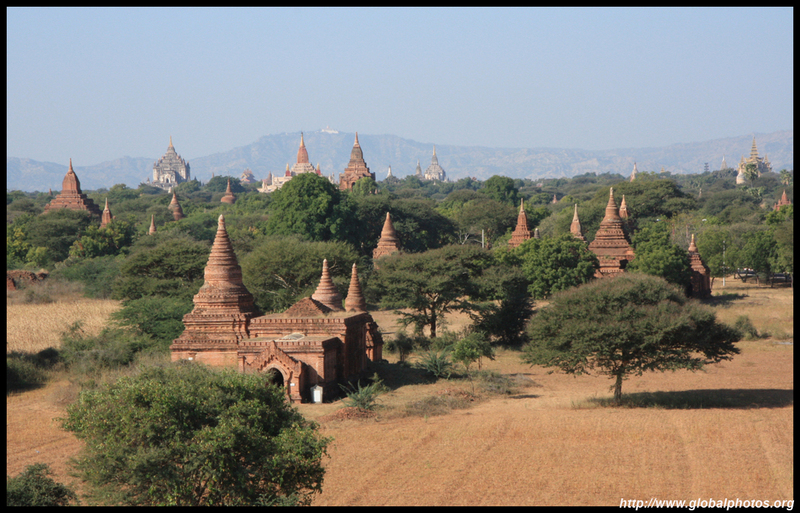 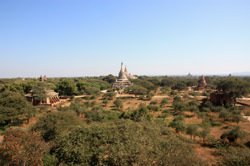 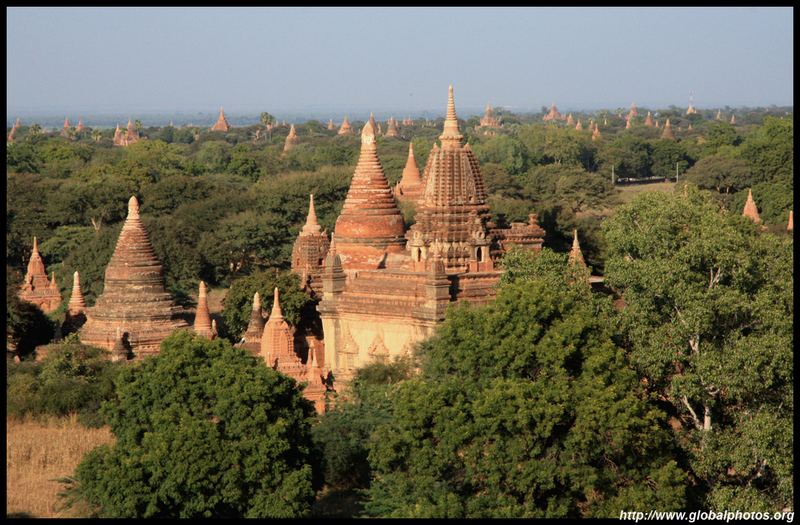 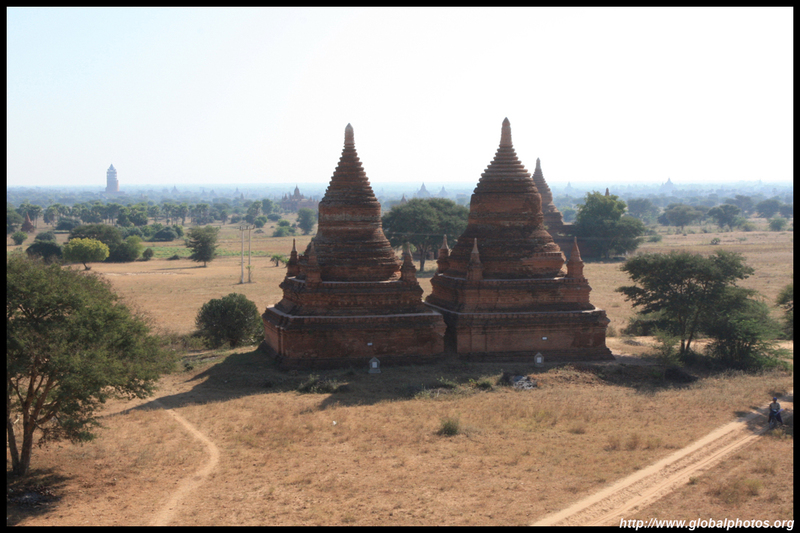 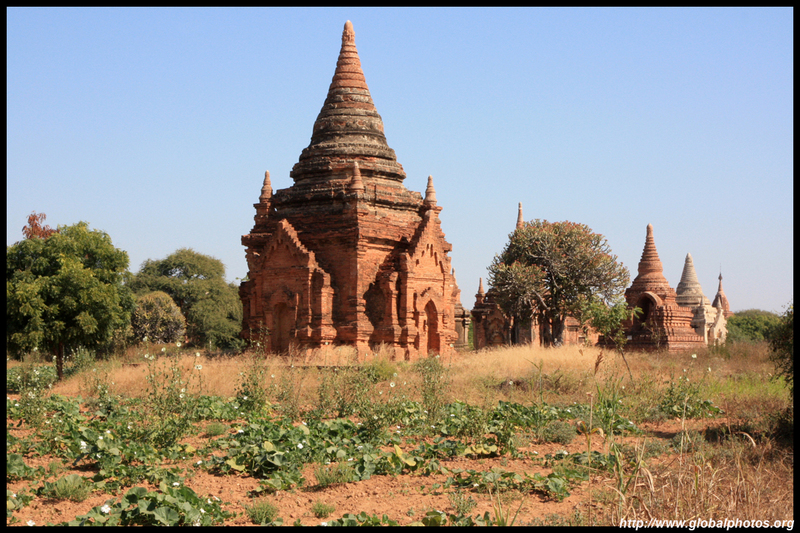 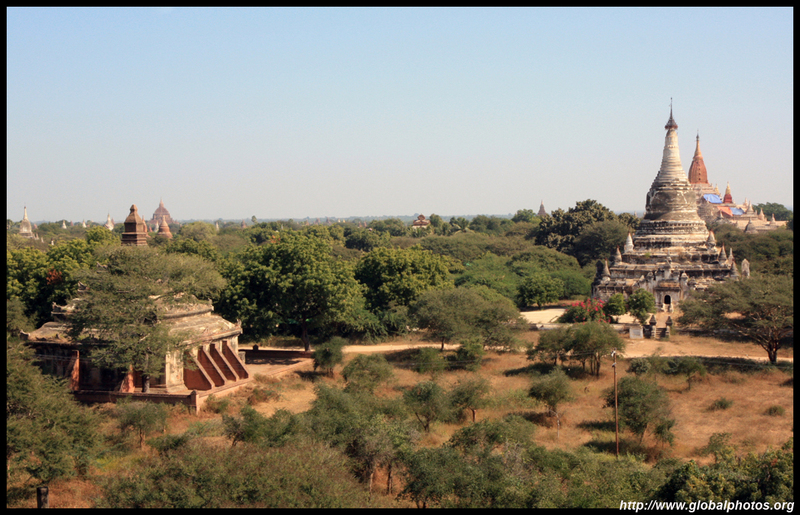 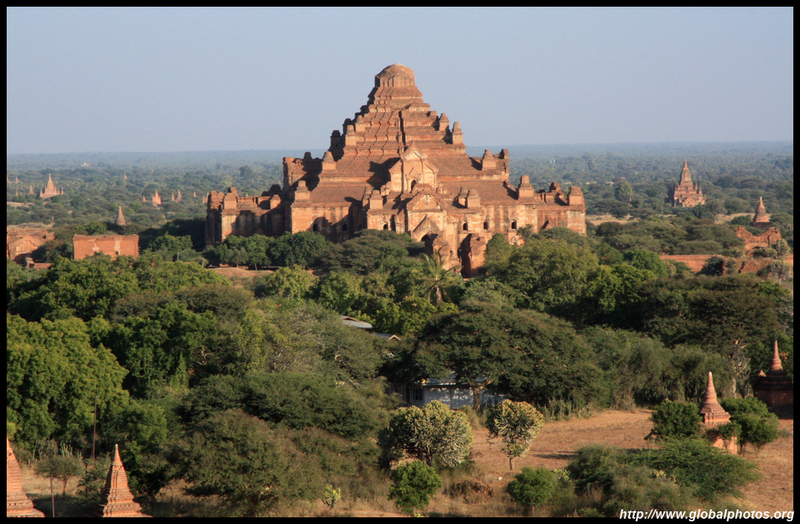 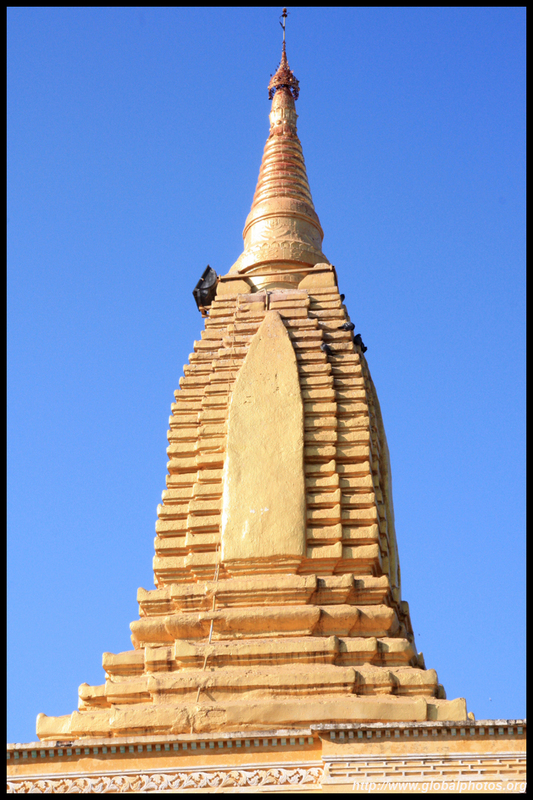 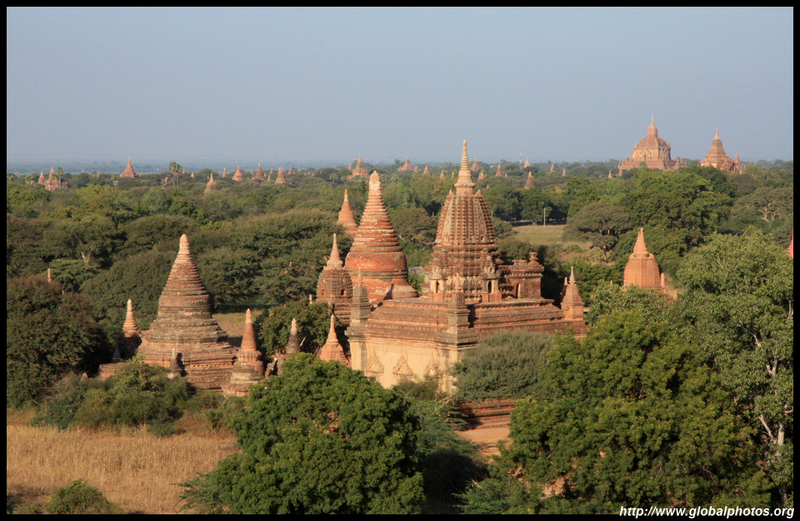 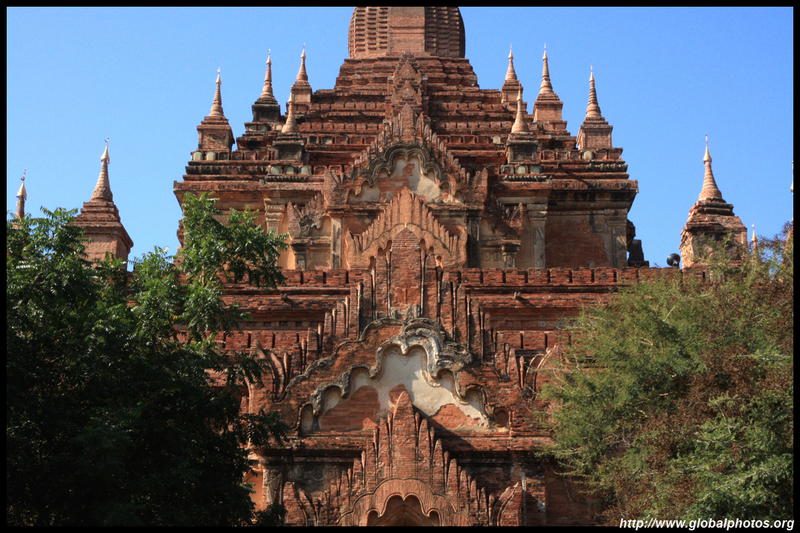 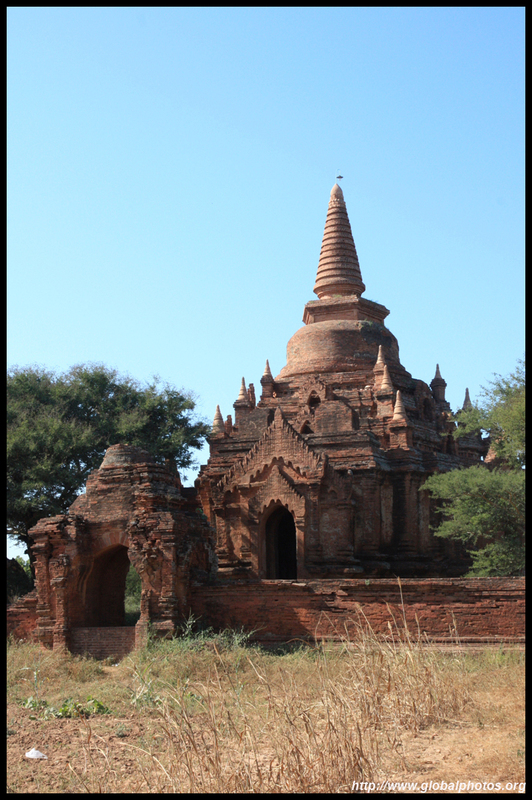 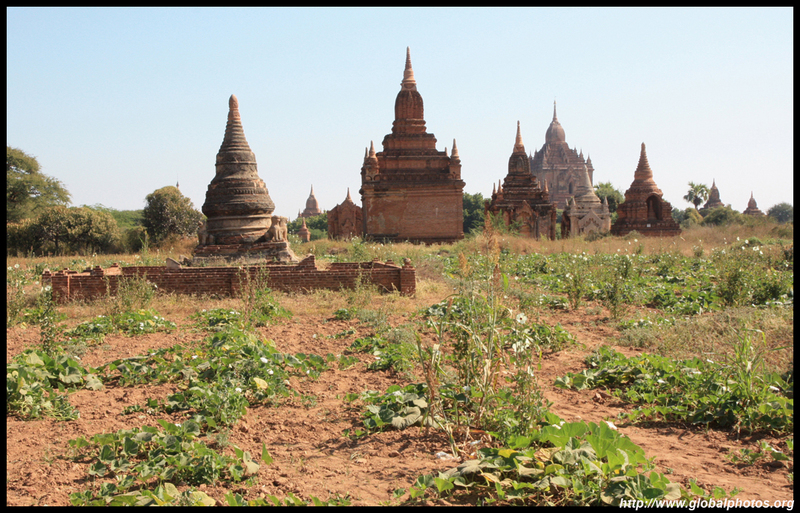 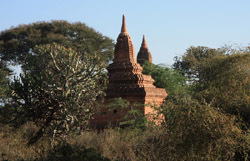 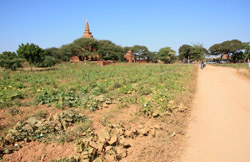 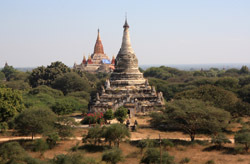 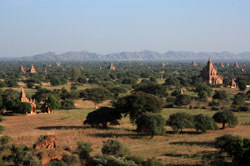 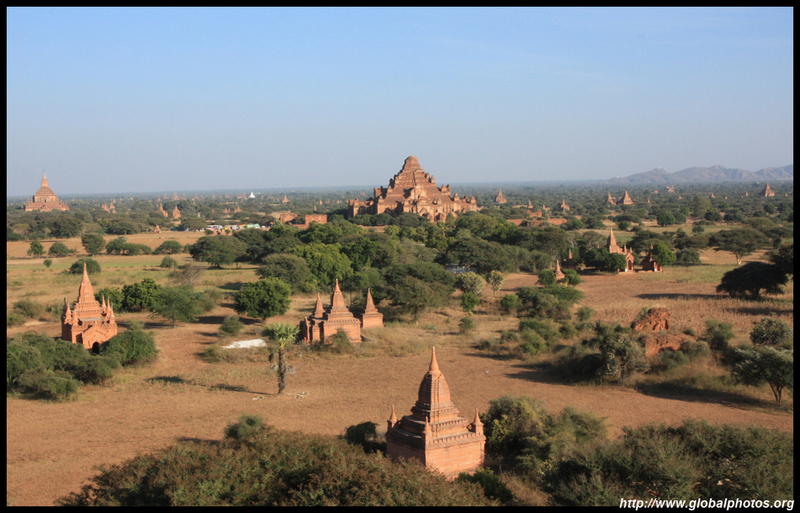 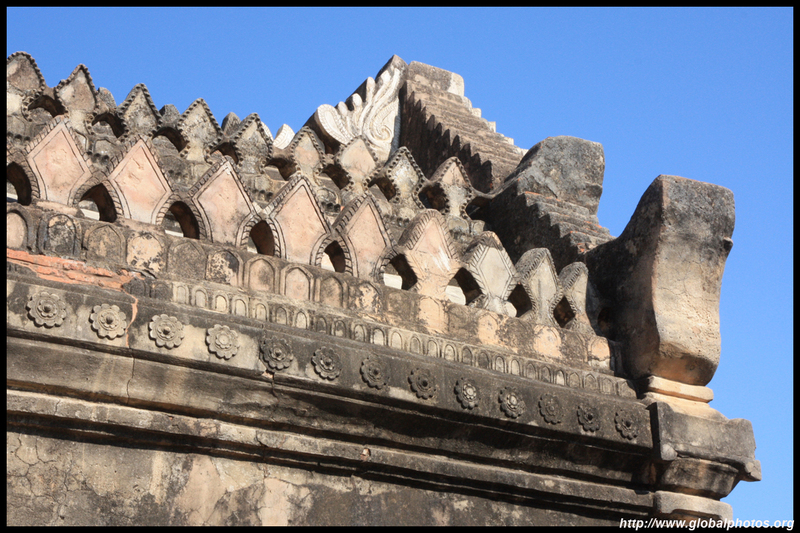 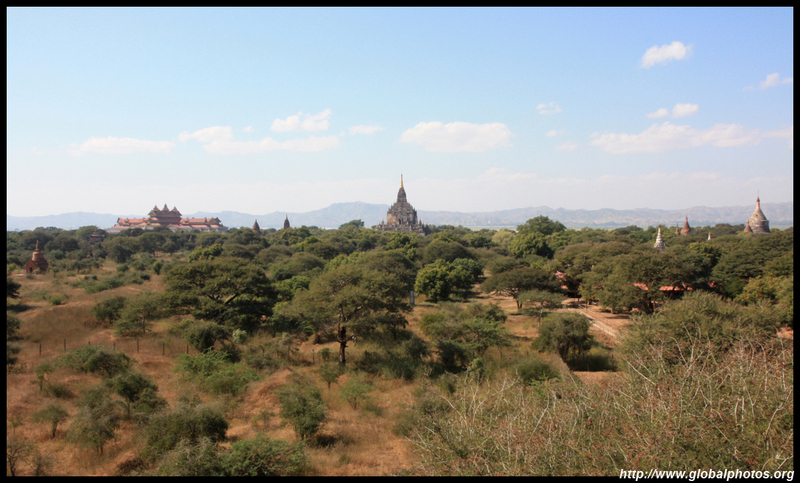 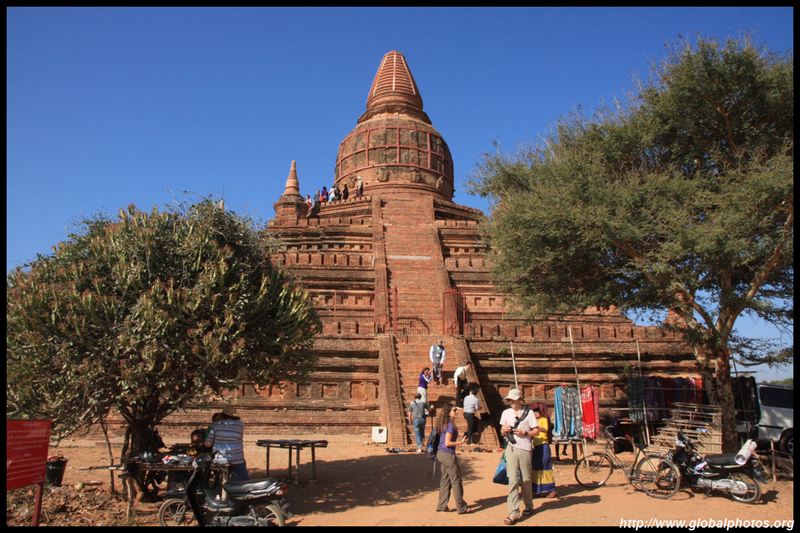 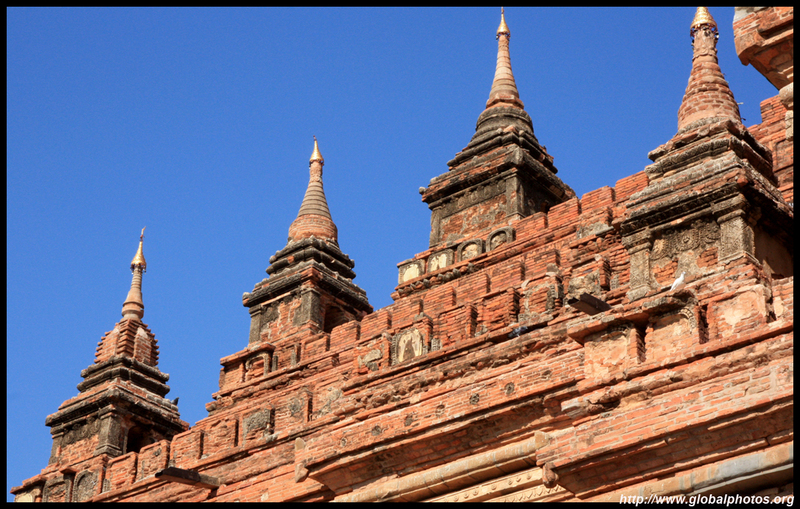 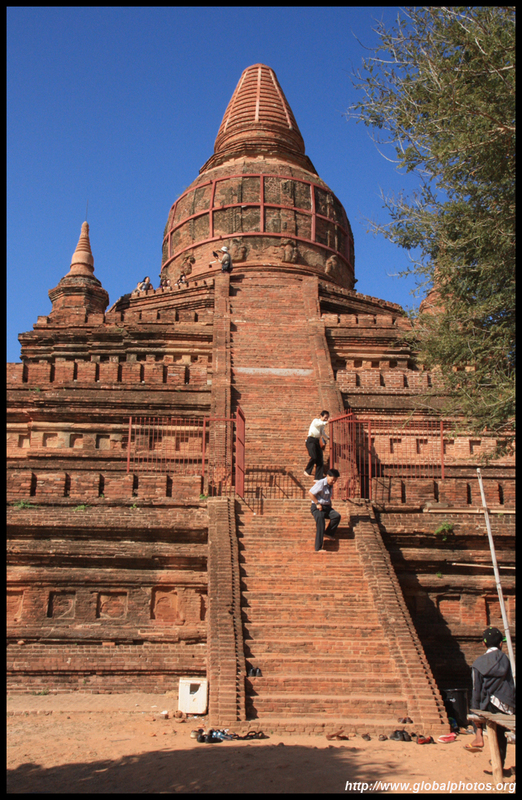 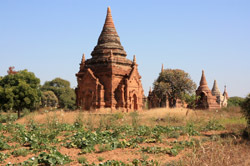 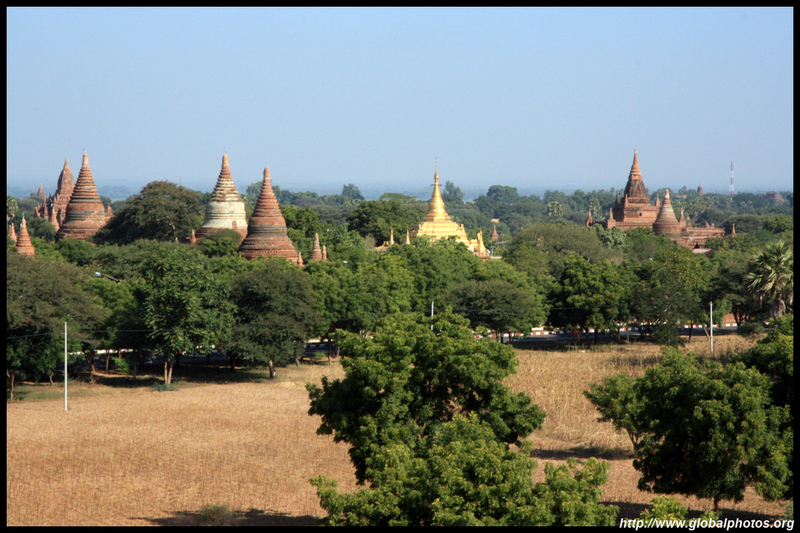 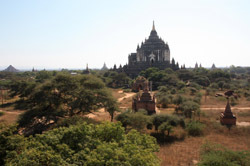 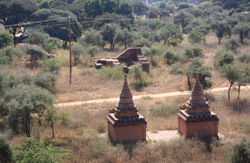 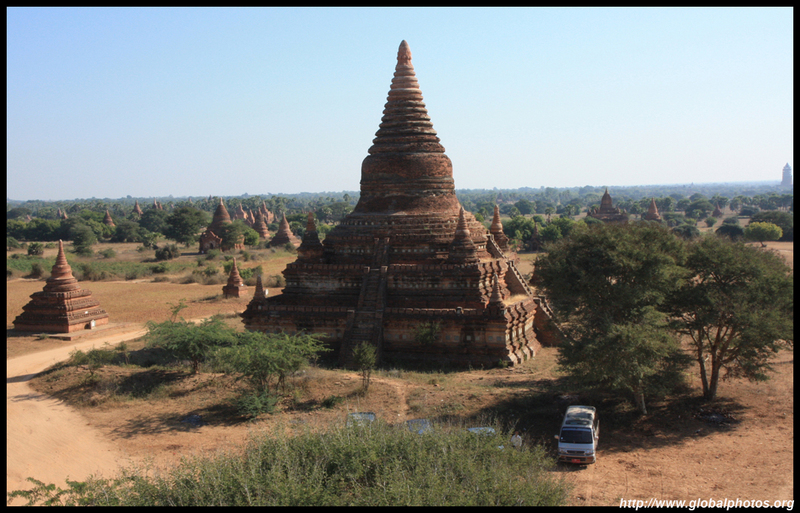 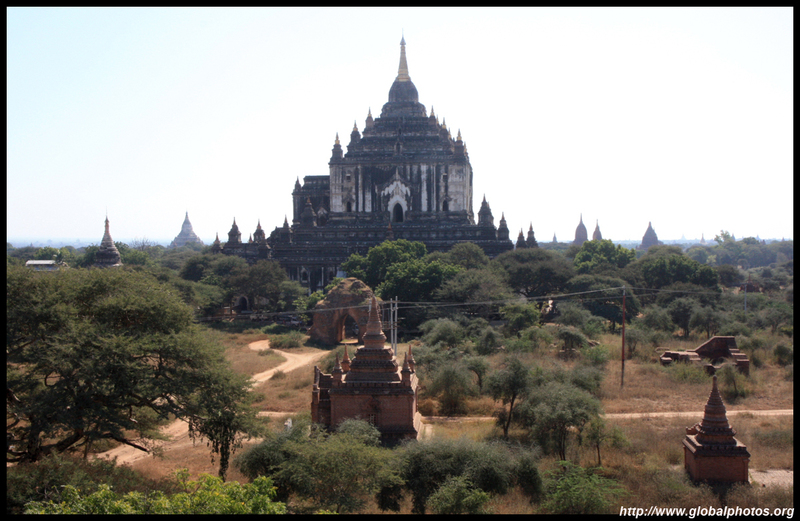 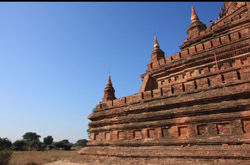 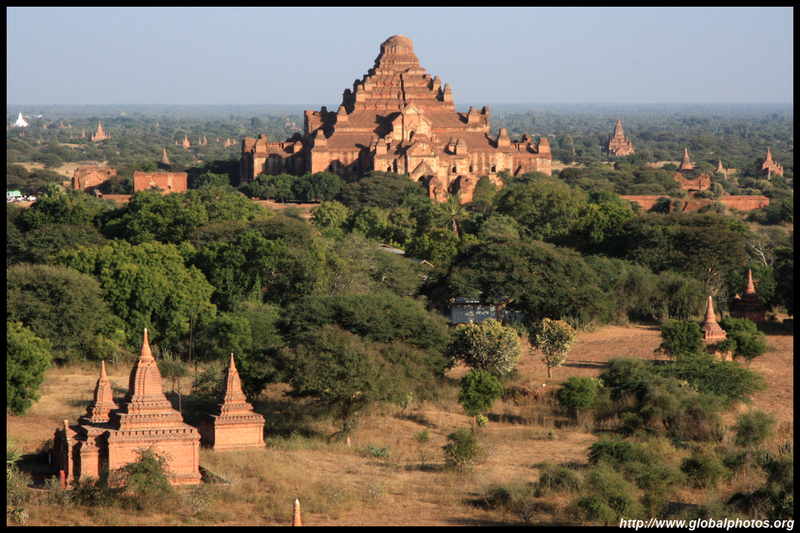 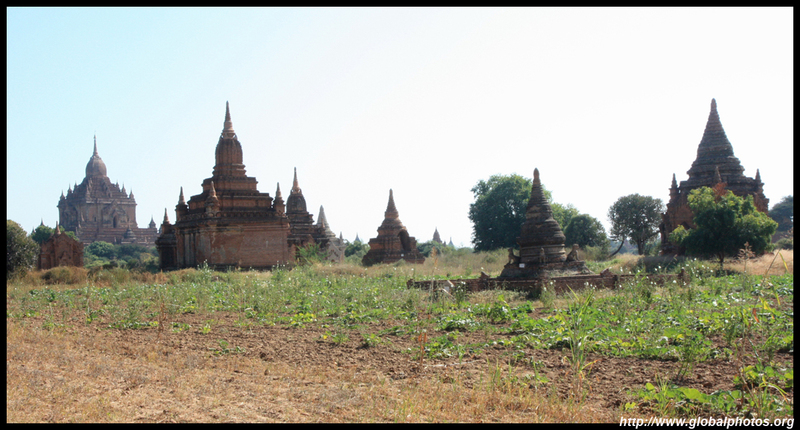 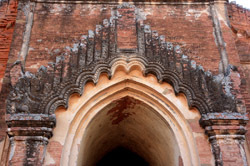 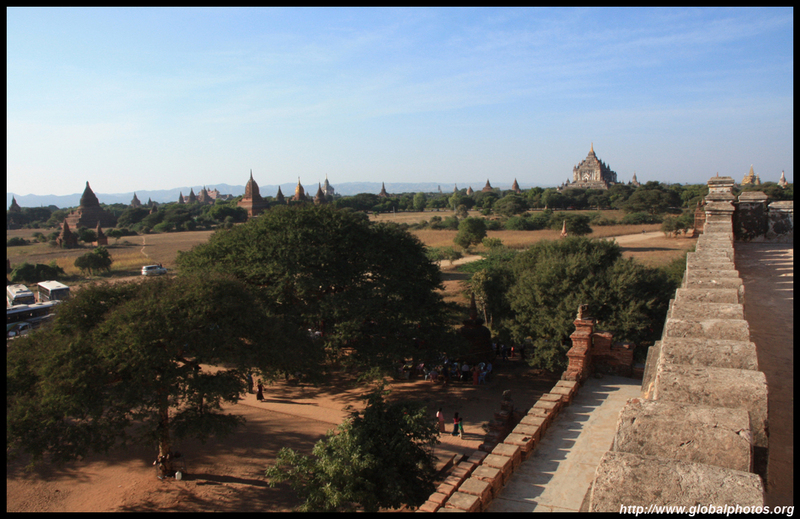 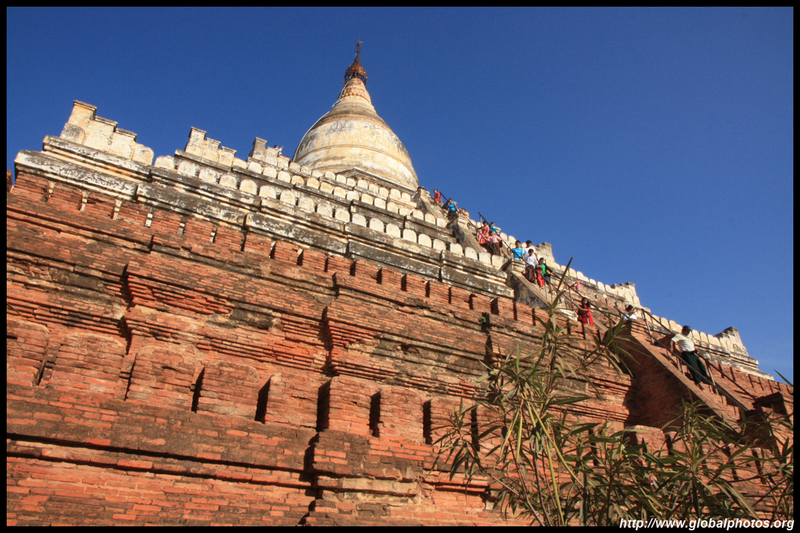 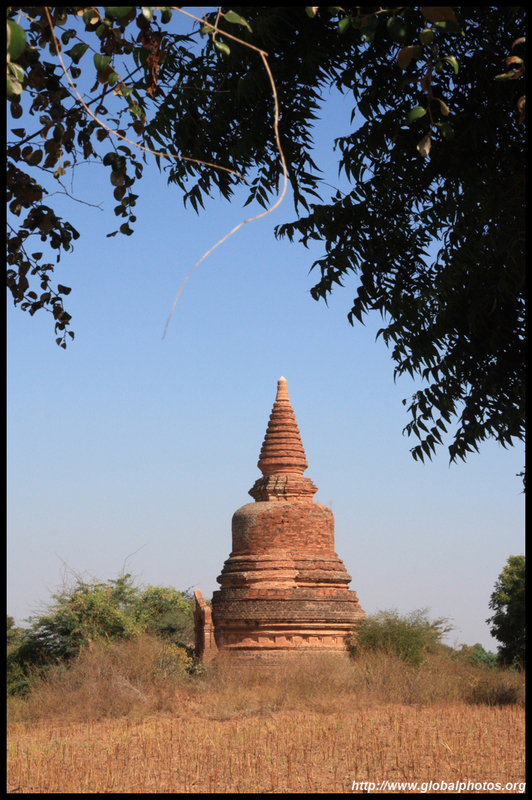 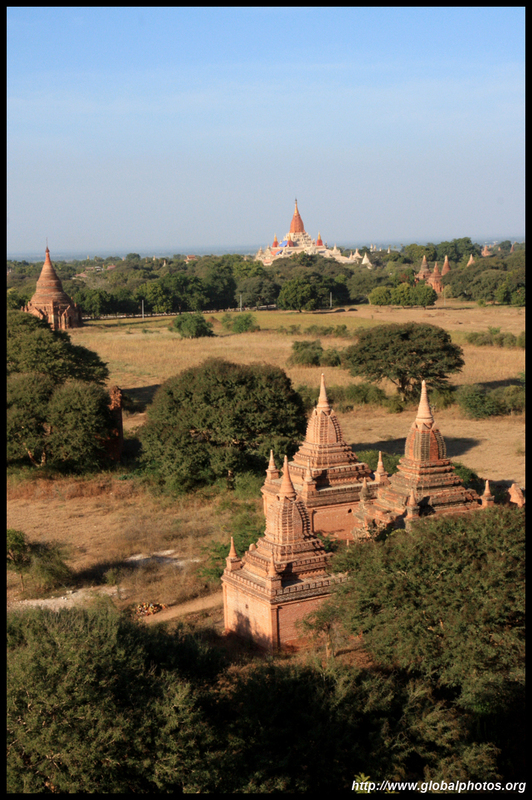 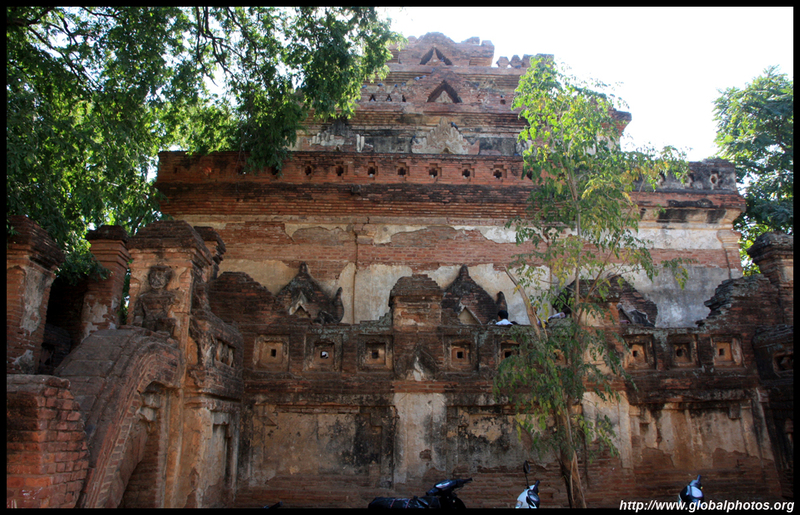 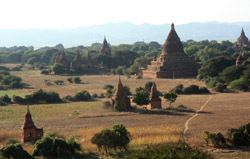 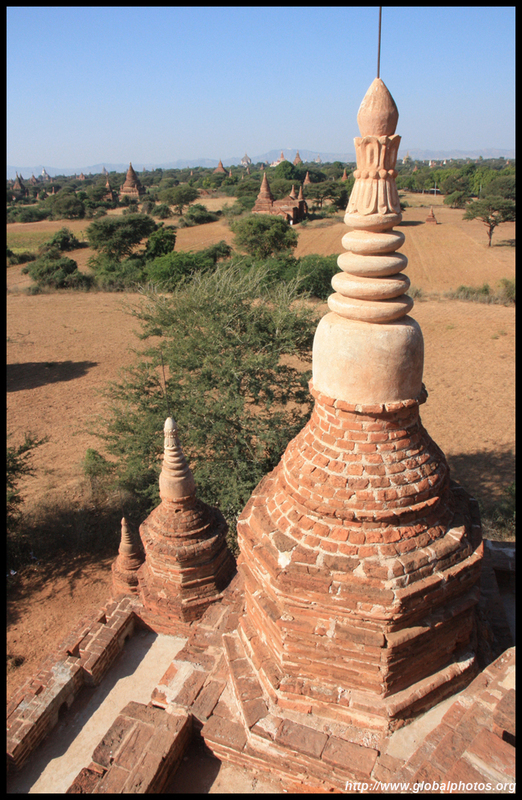 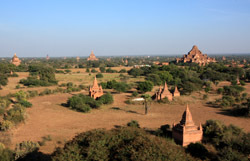 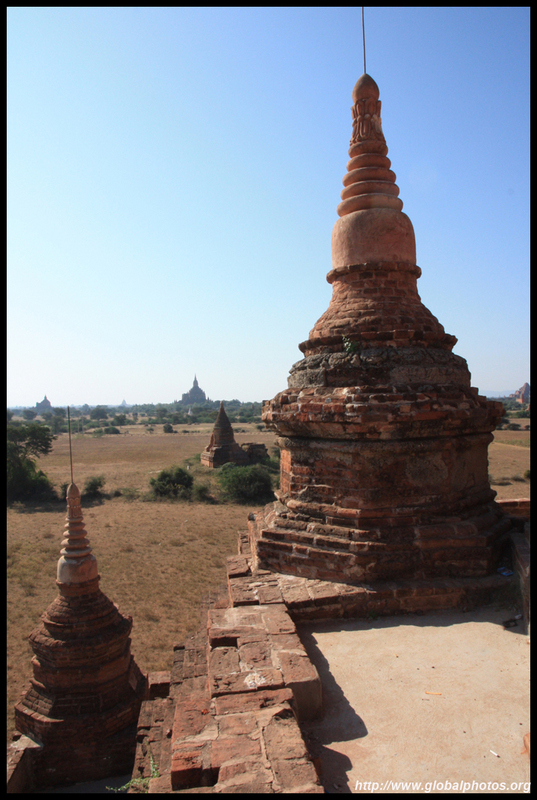 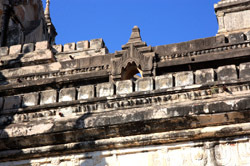 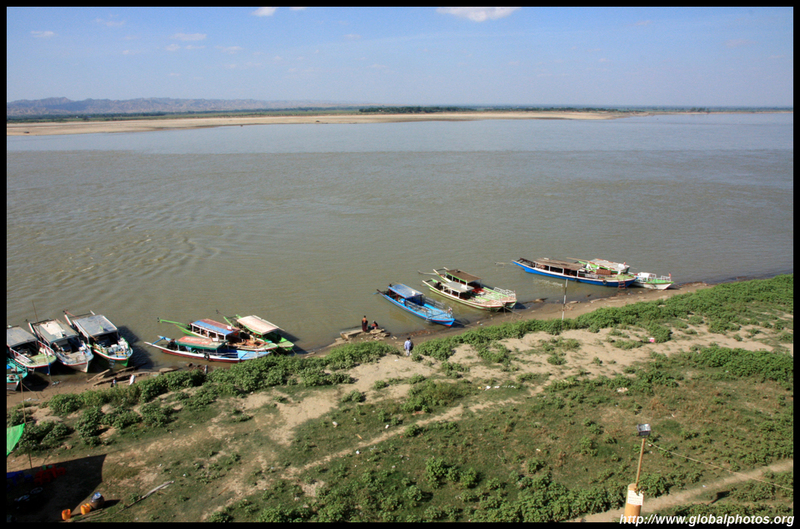 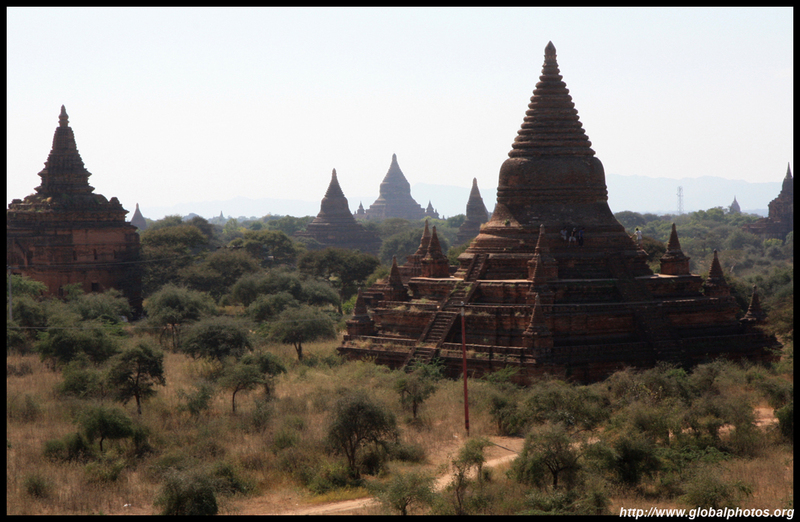 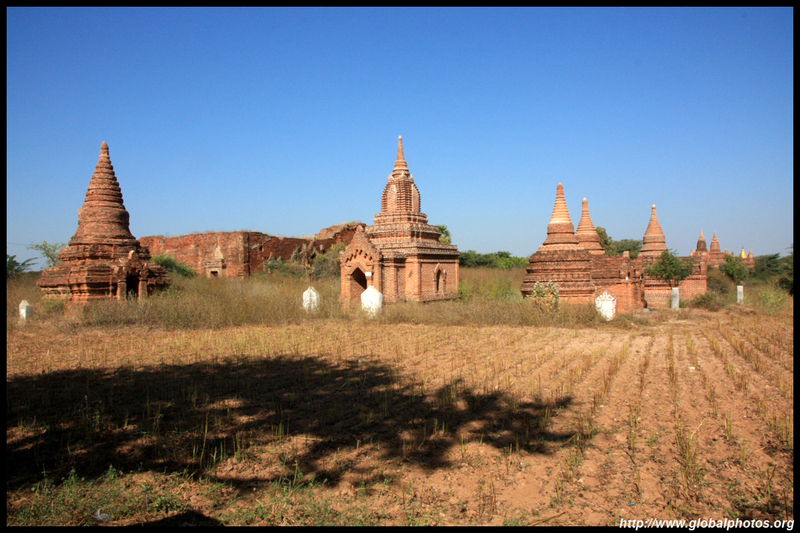 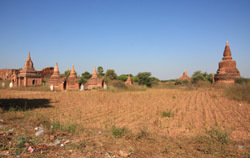 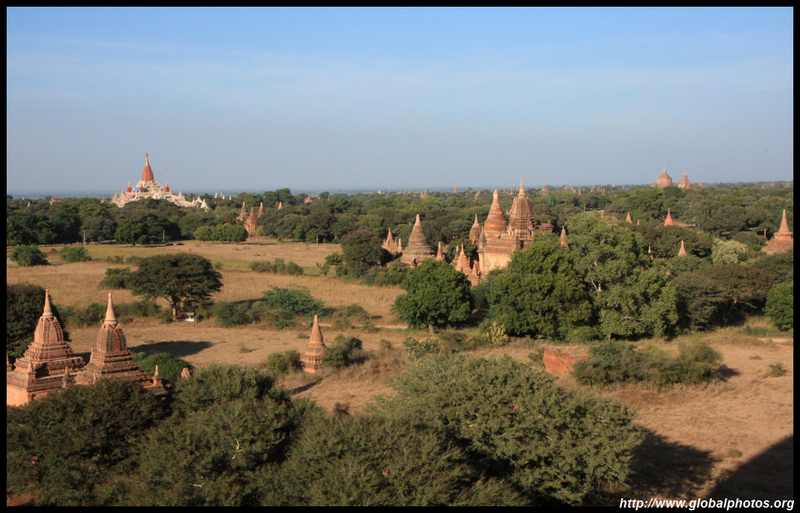 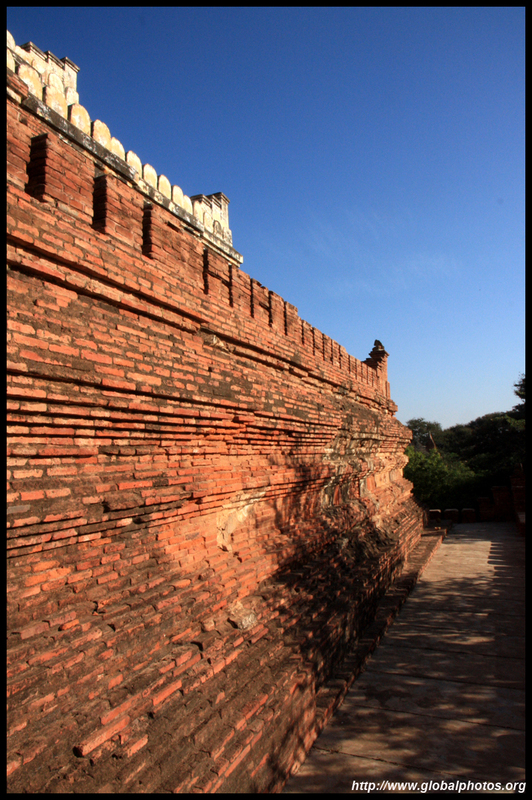 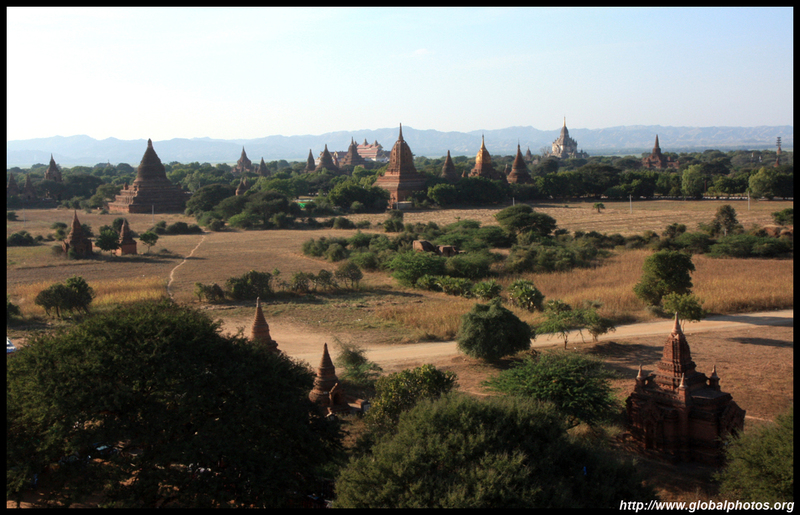 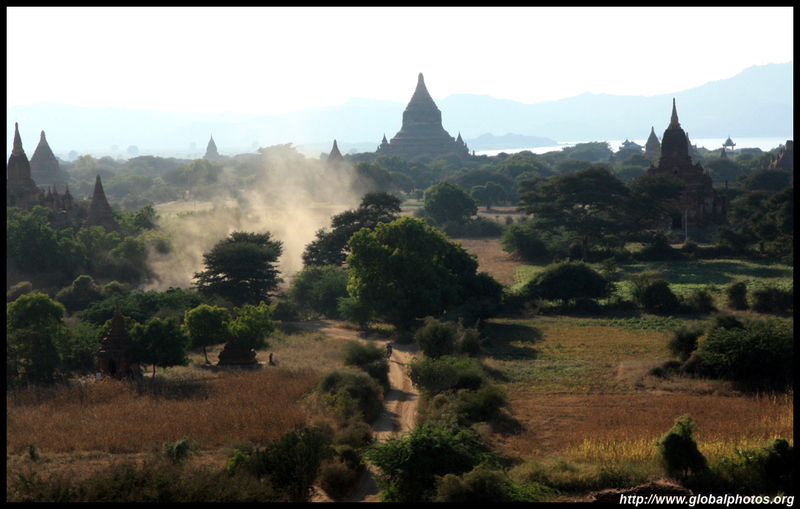 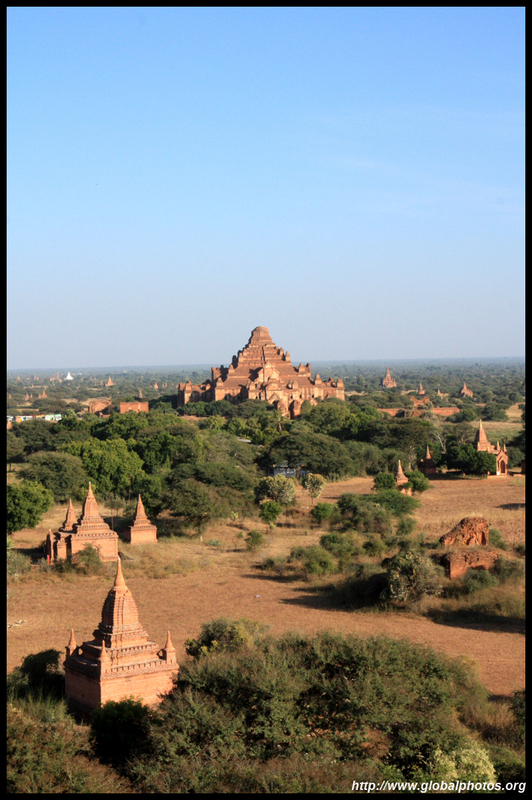 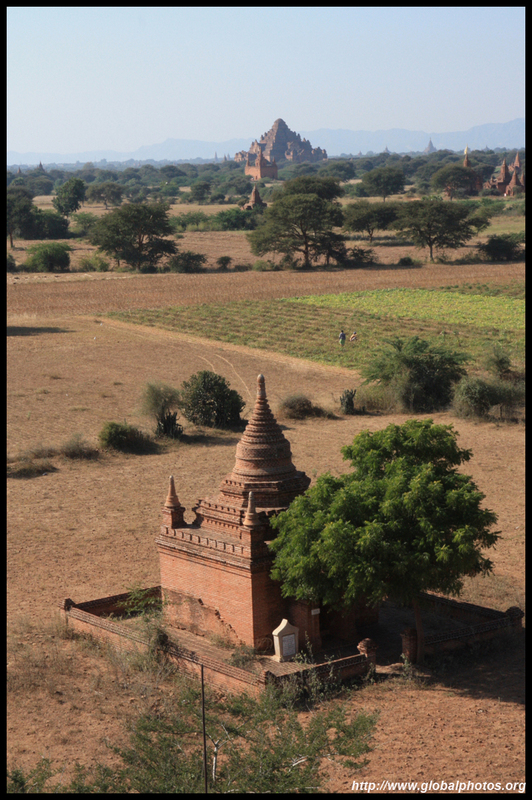 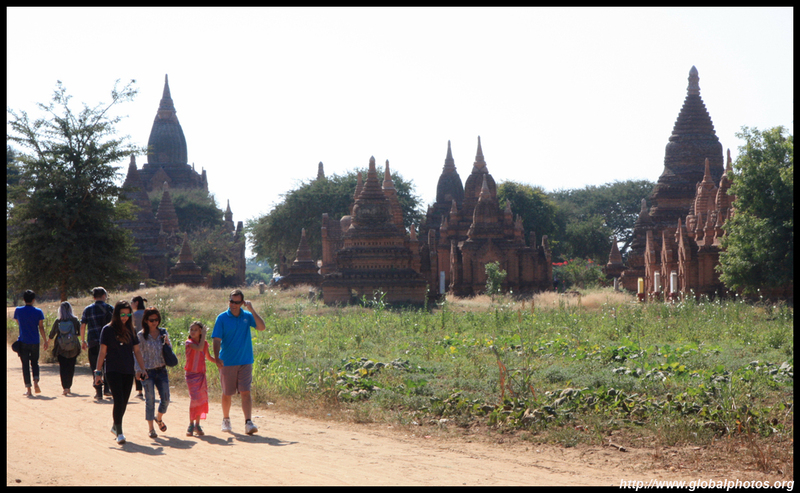 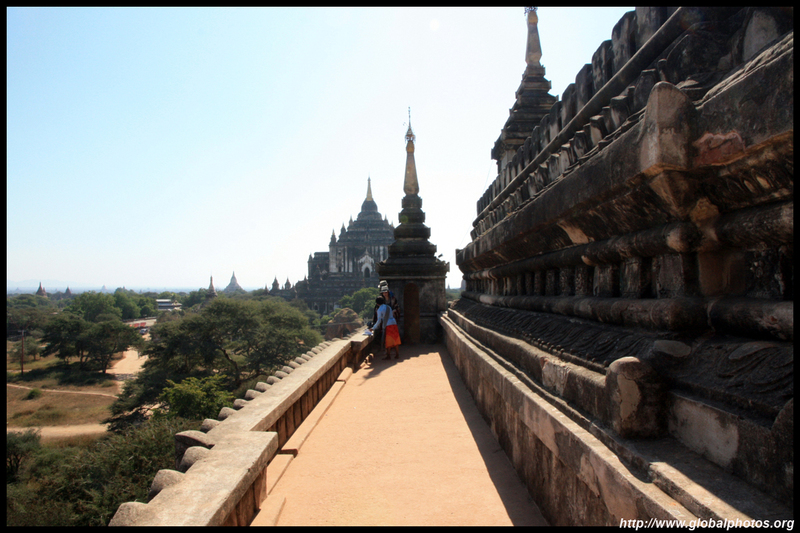 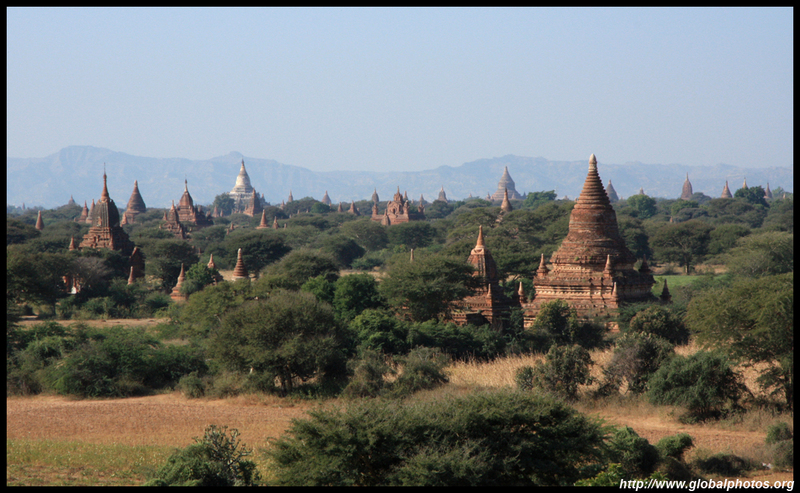 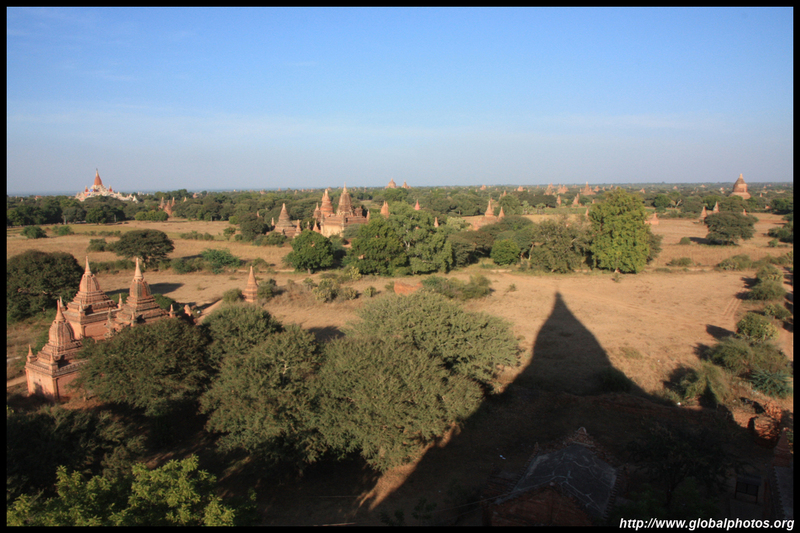 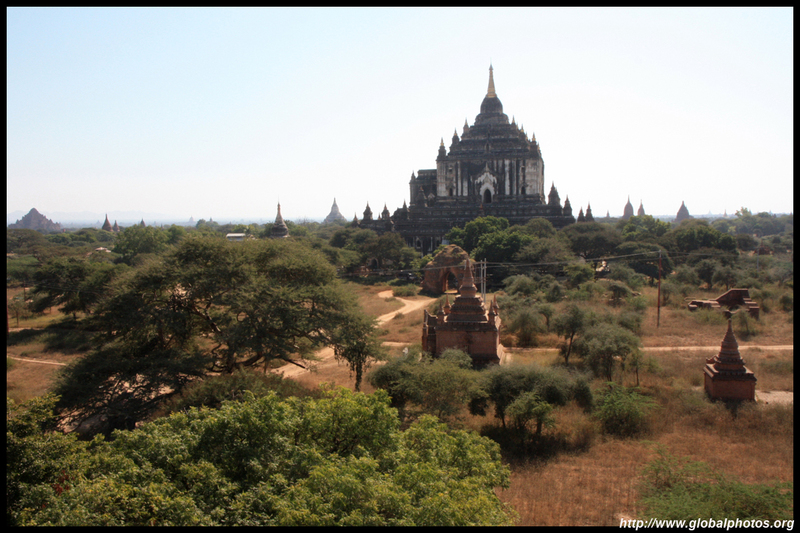 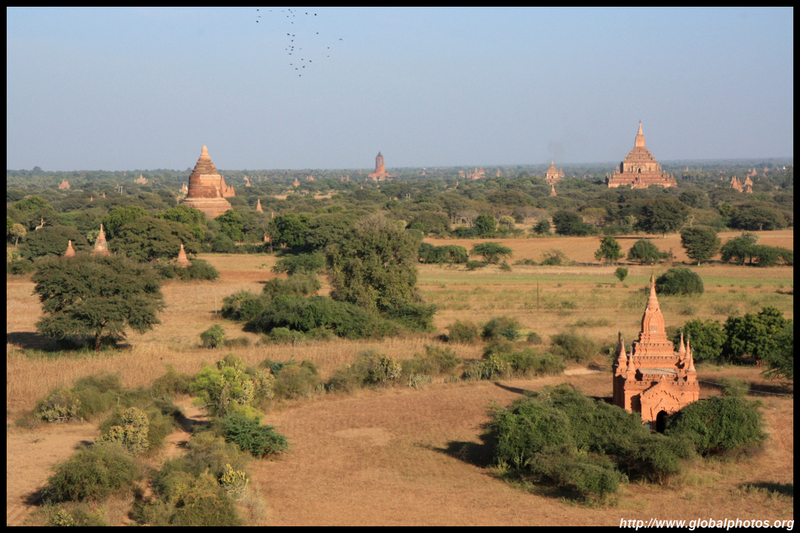 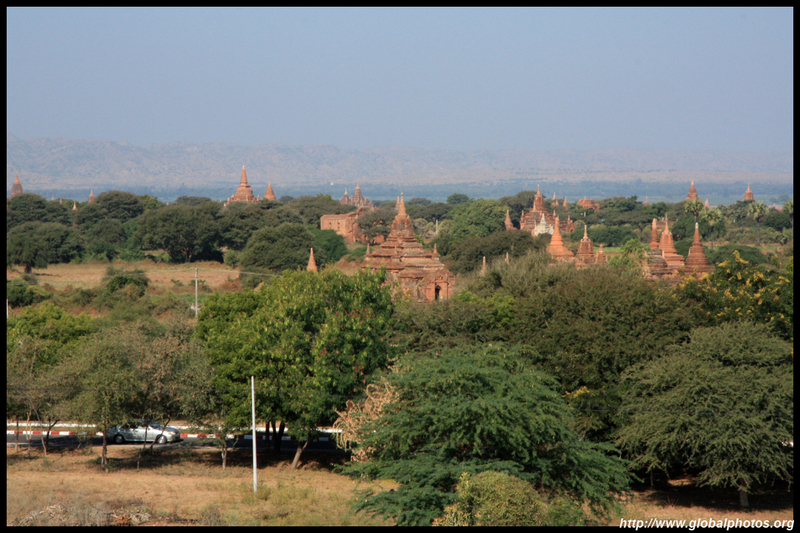 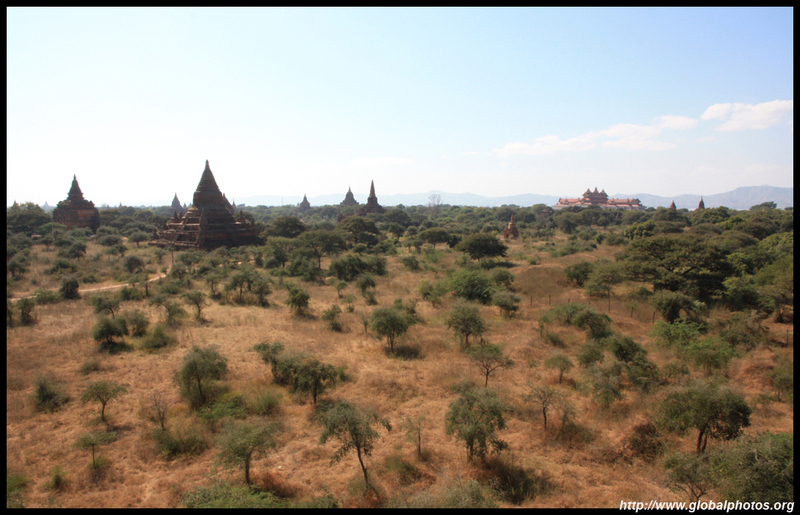 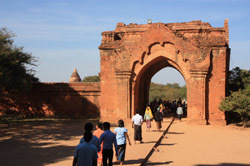 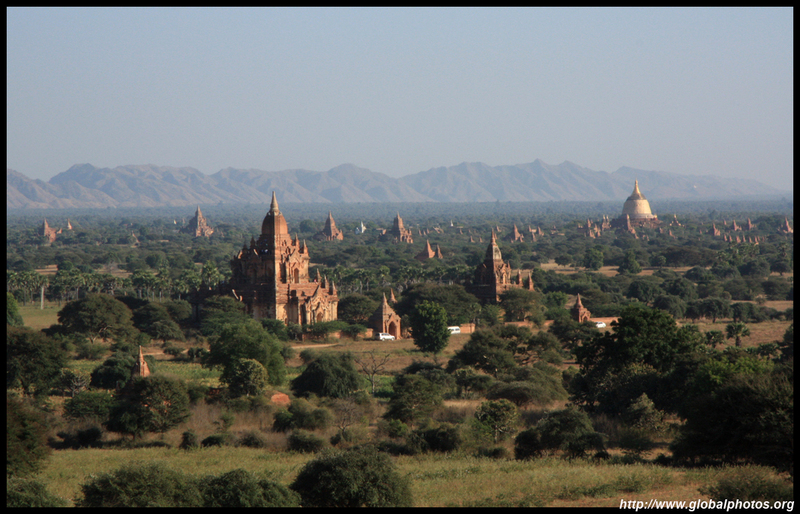 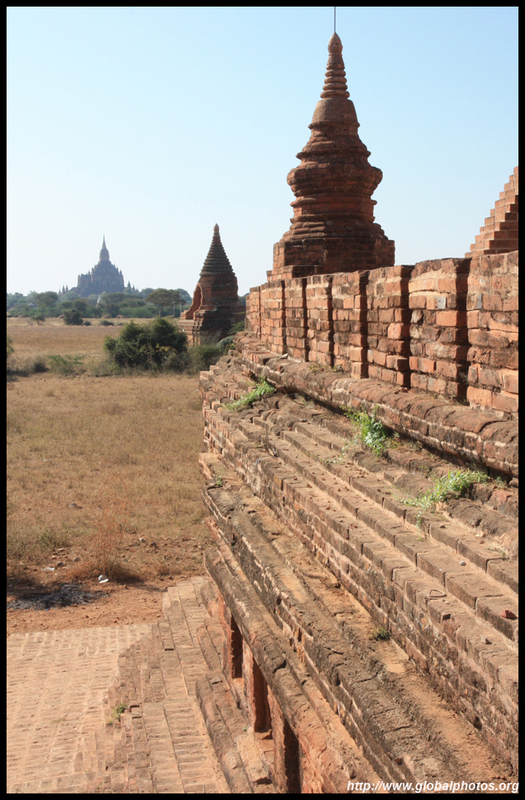 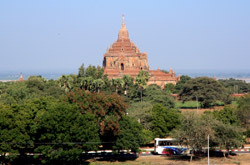 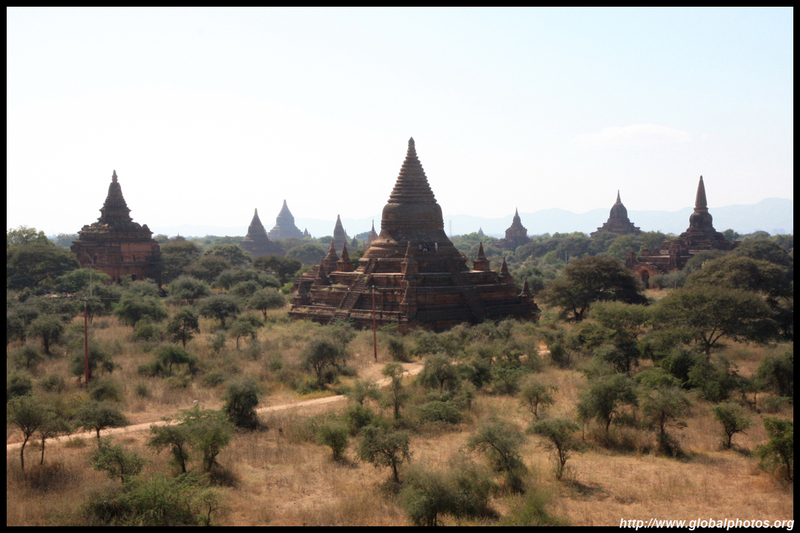 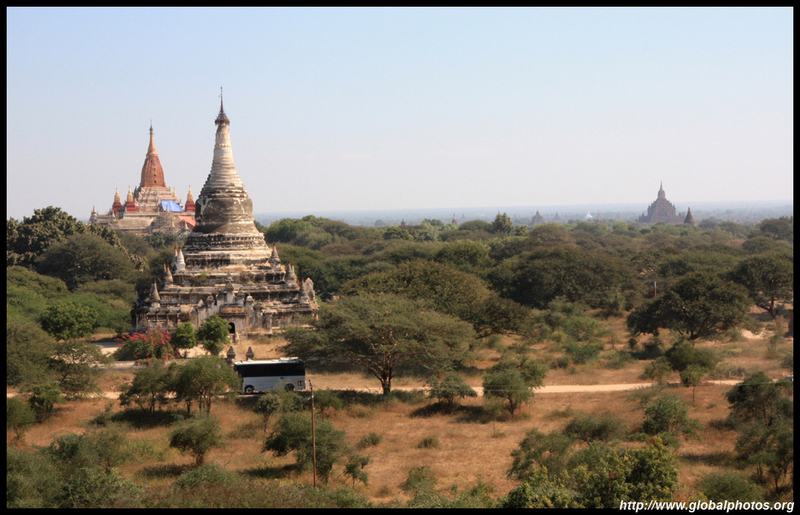 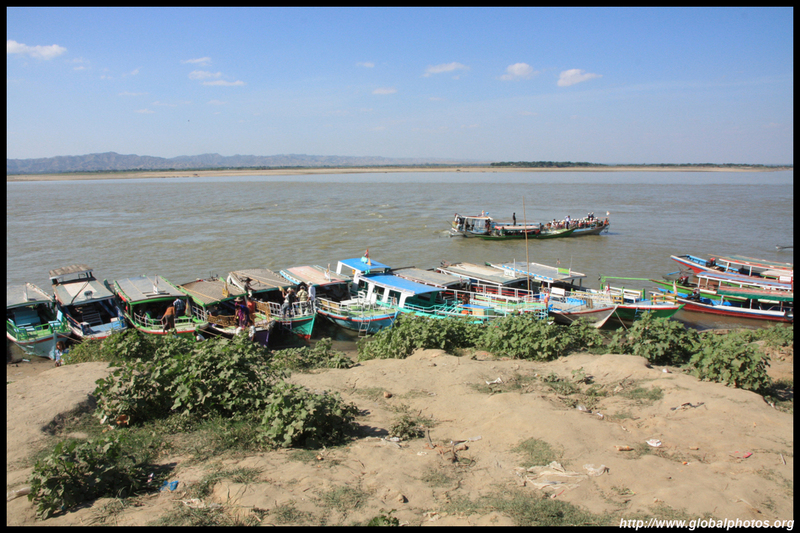 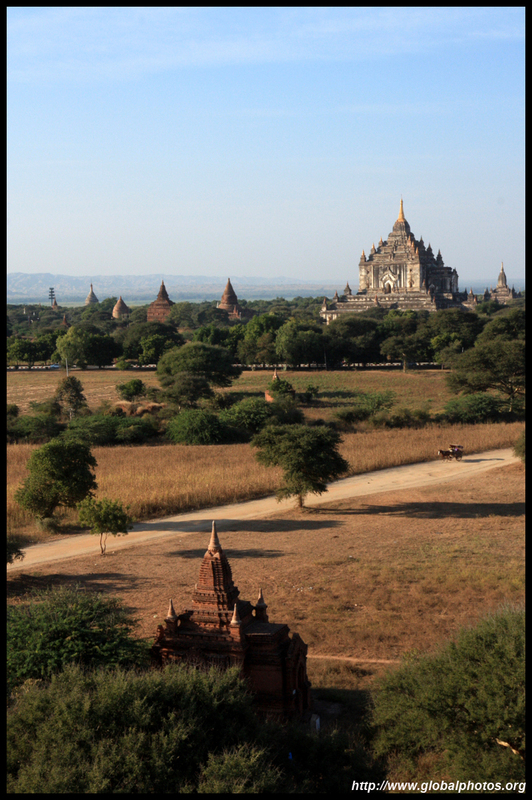 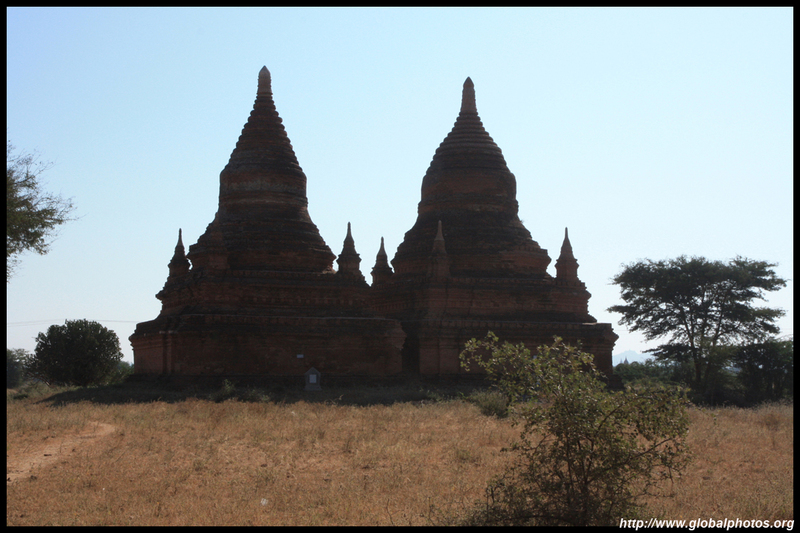 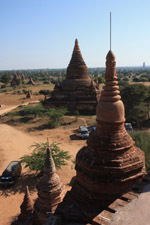 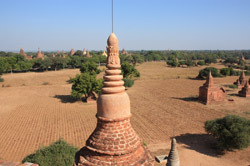 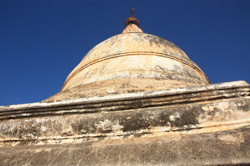 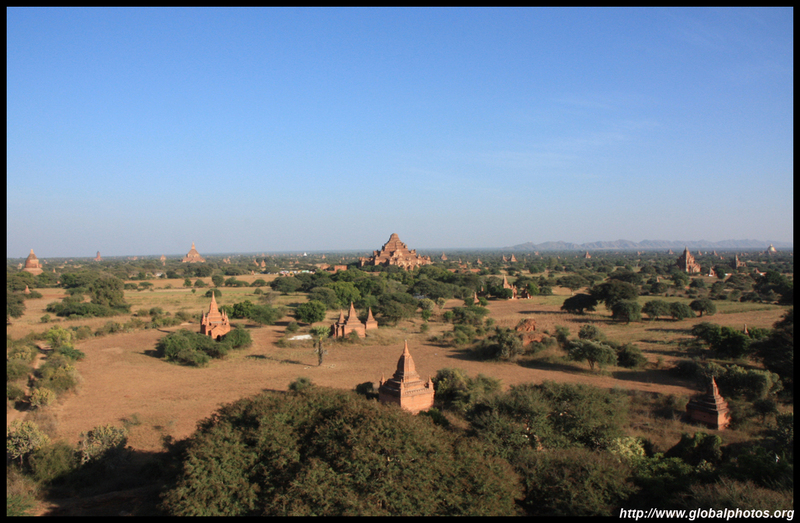 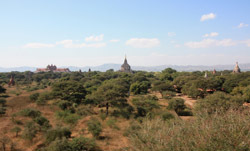 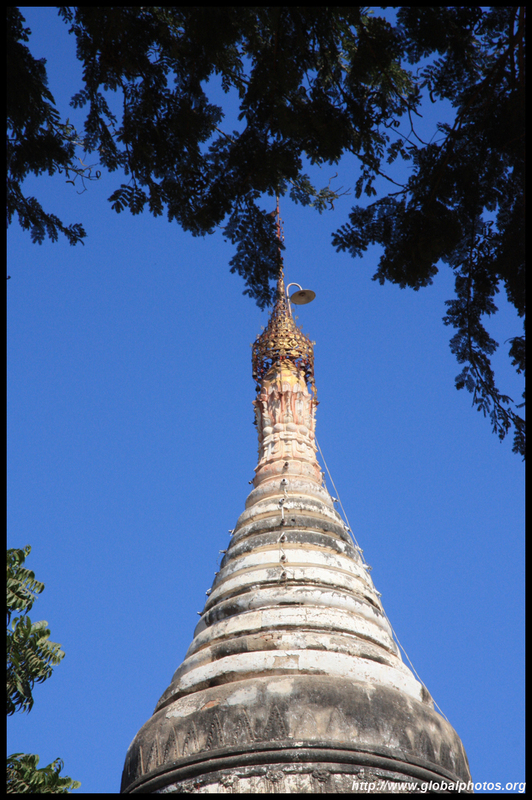 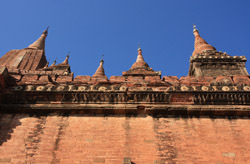 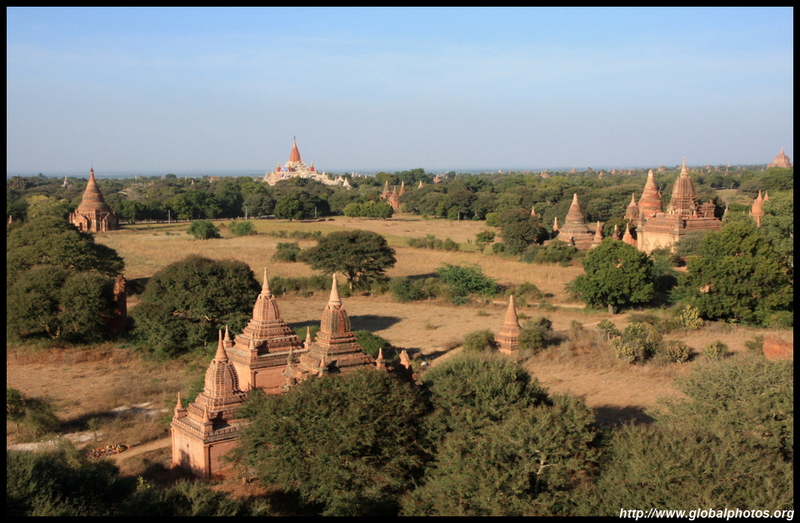 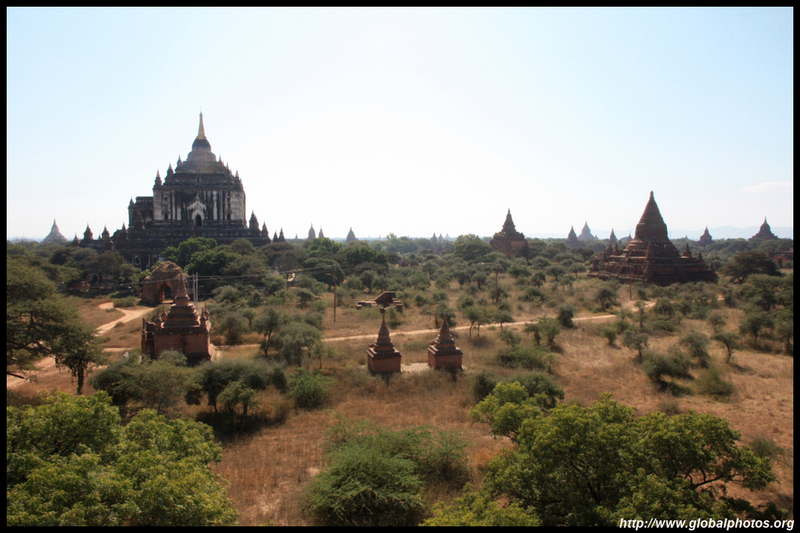 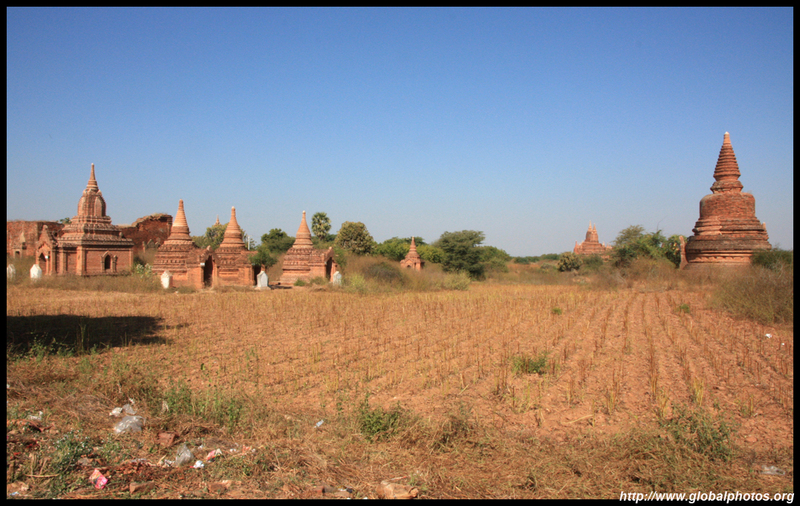 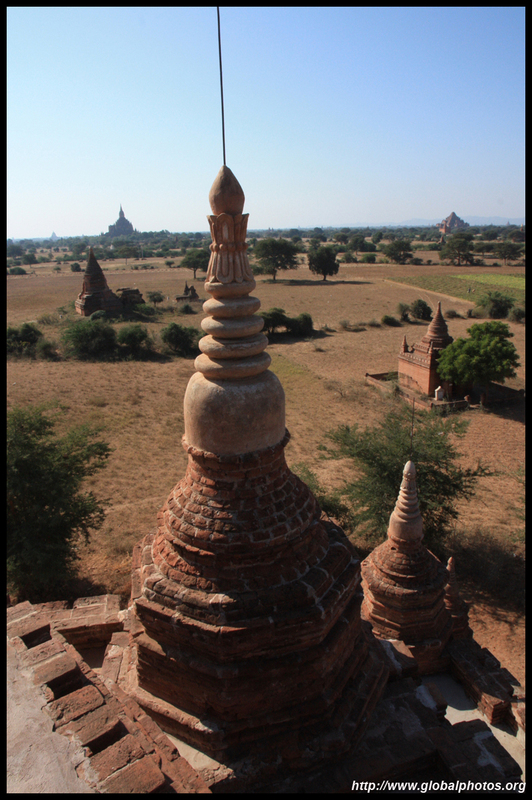 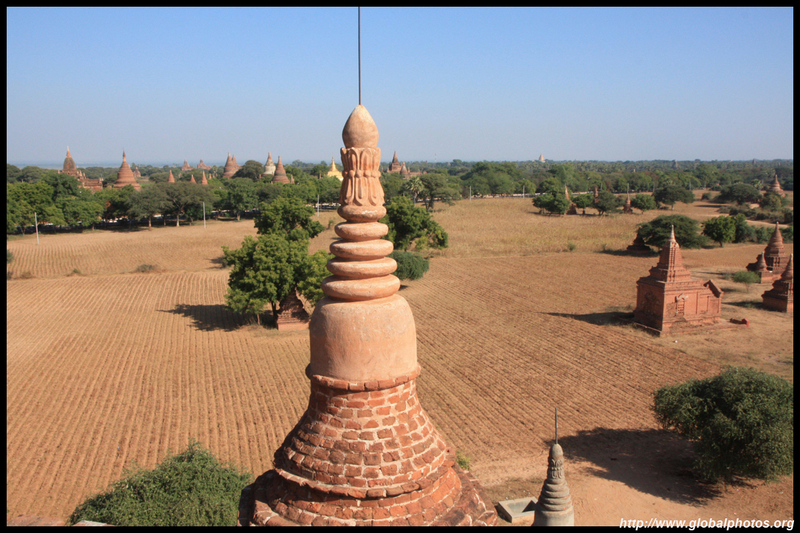 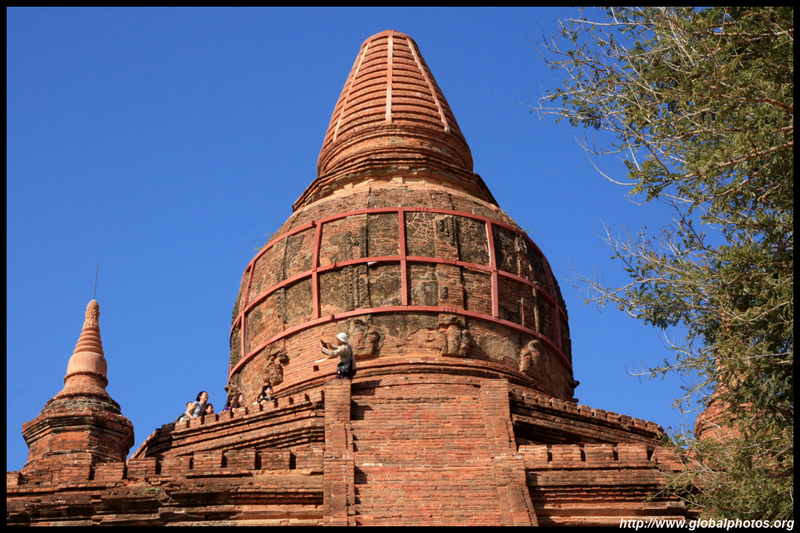 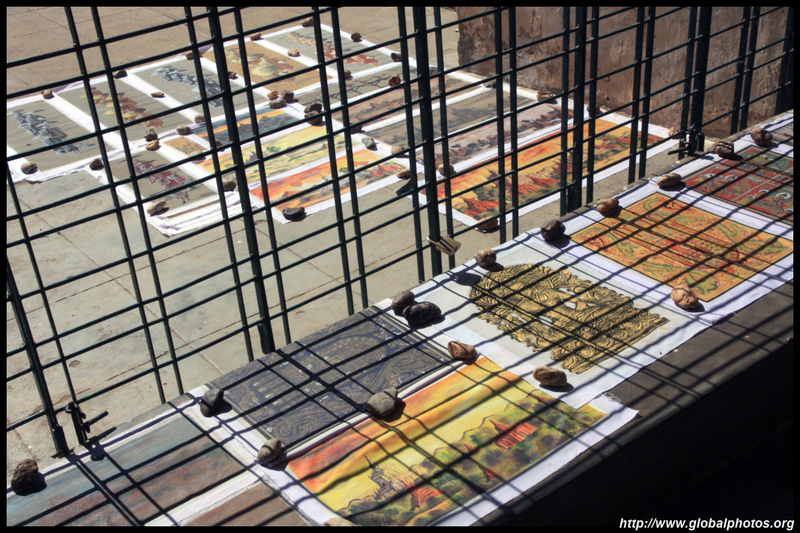 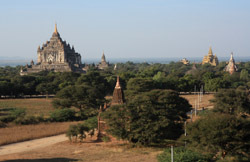 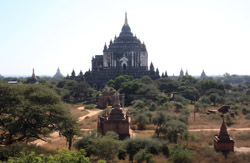 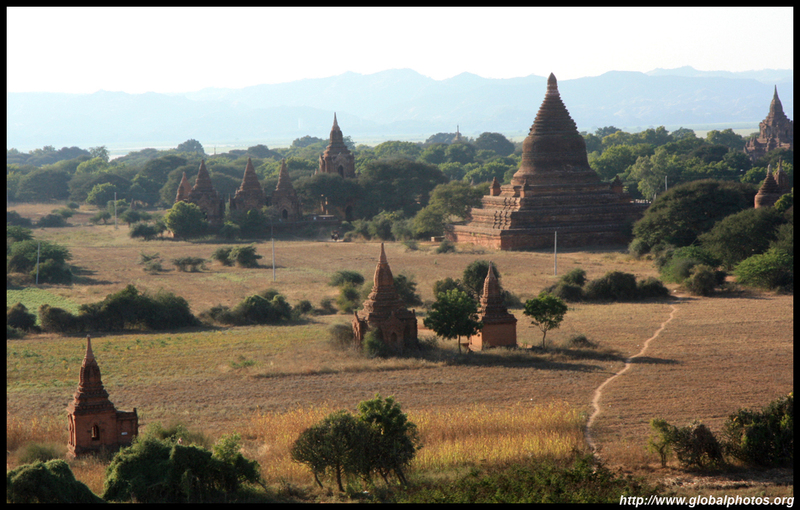 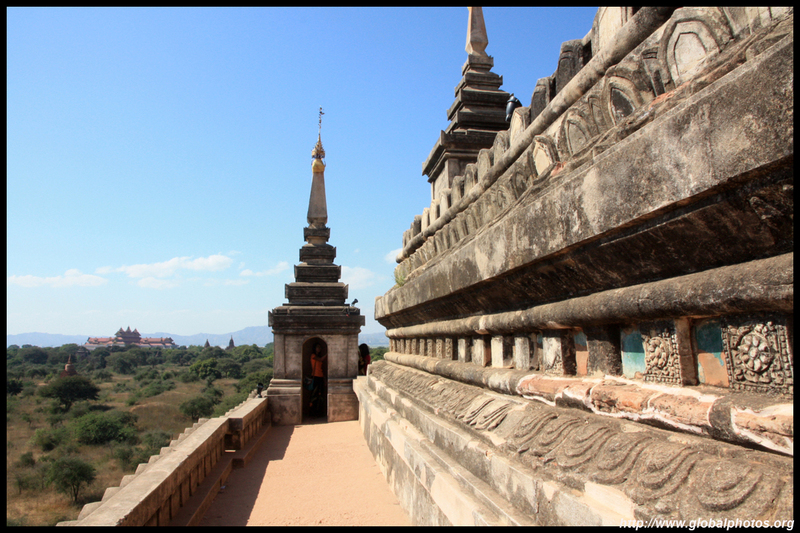 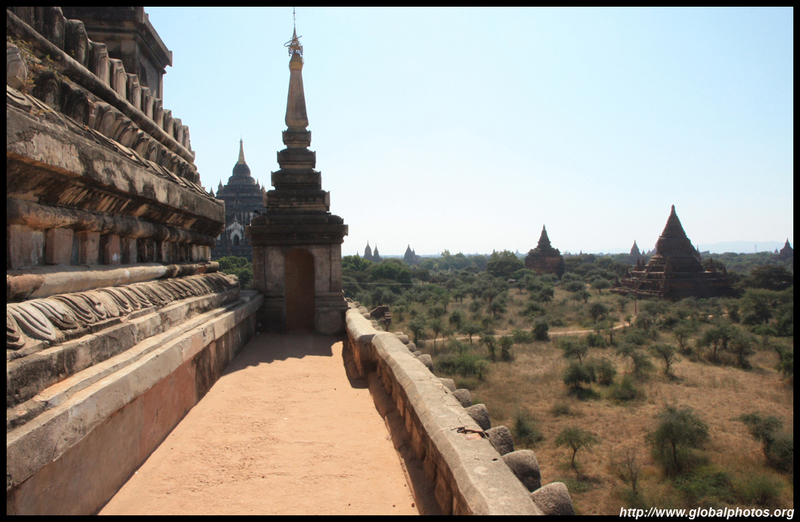 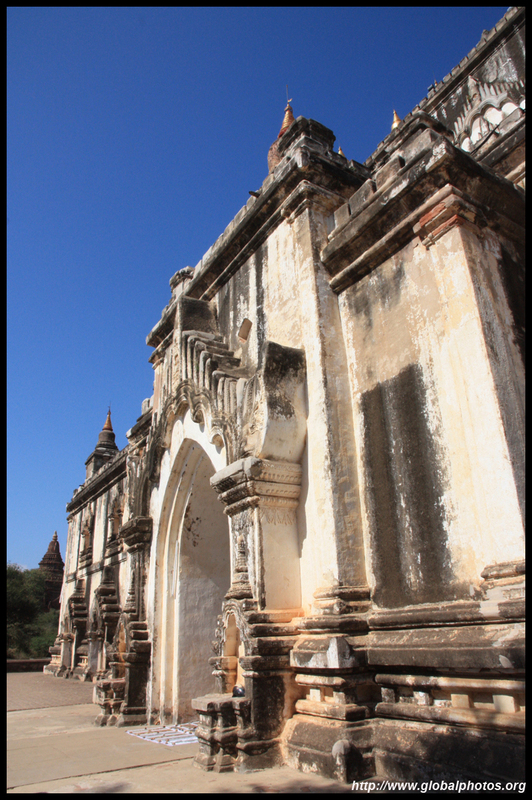 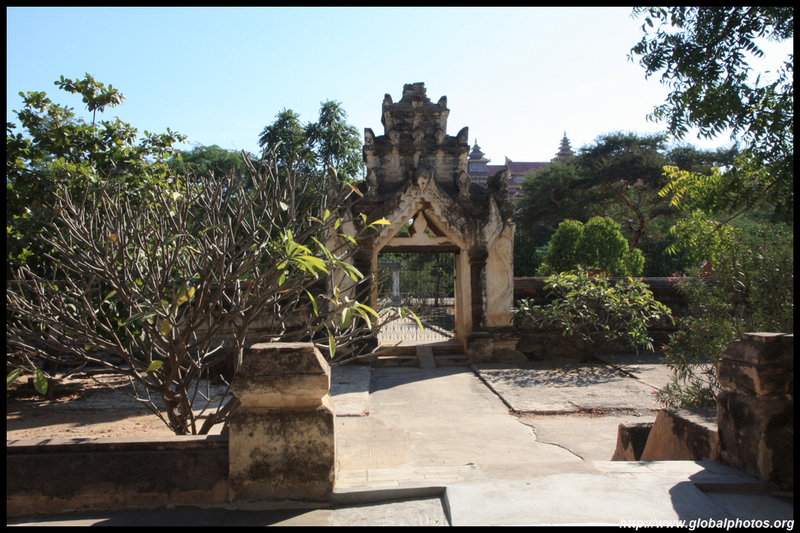 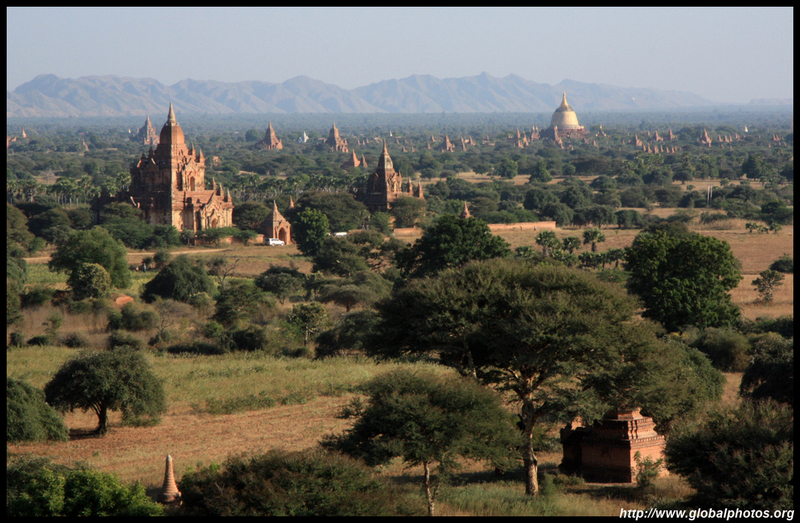 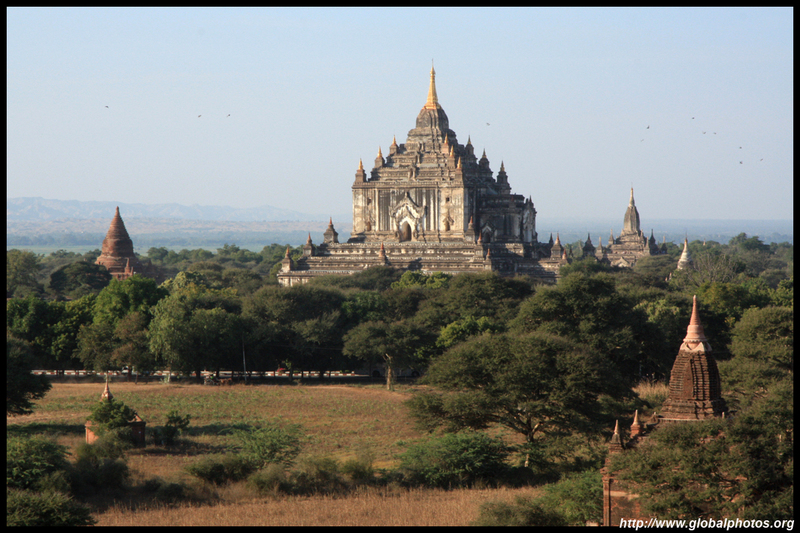 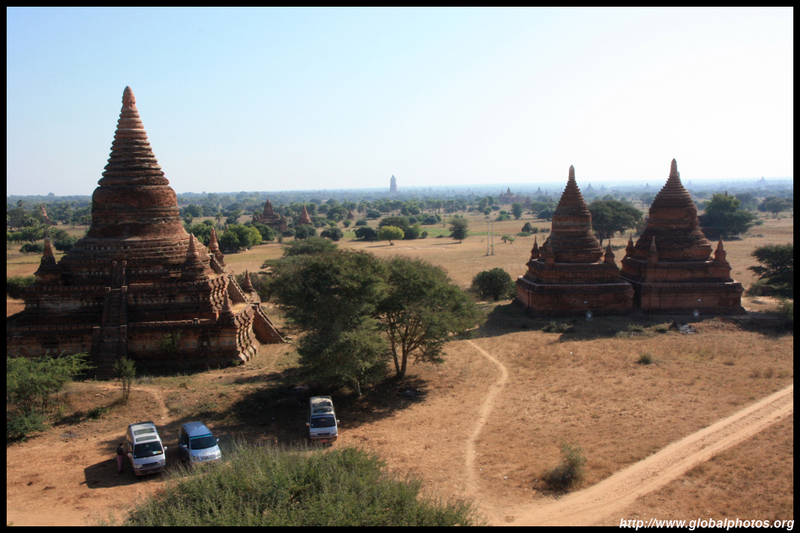 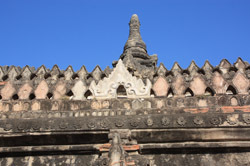 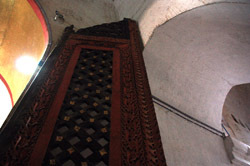 It is possible to climb Mingala Zedi for a great introductory view of Bagan. 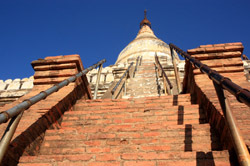 The stairs are a bit perilous but it is a worthwhile trip. 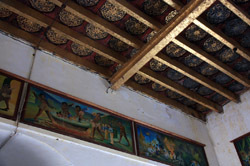 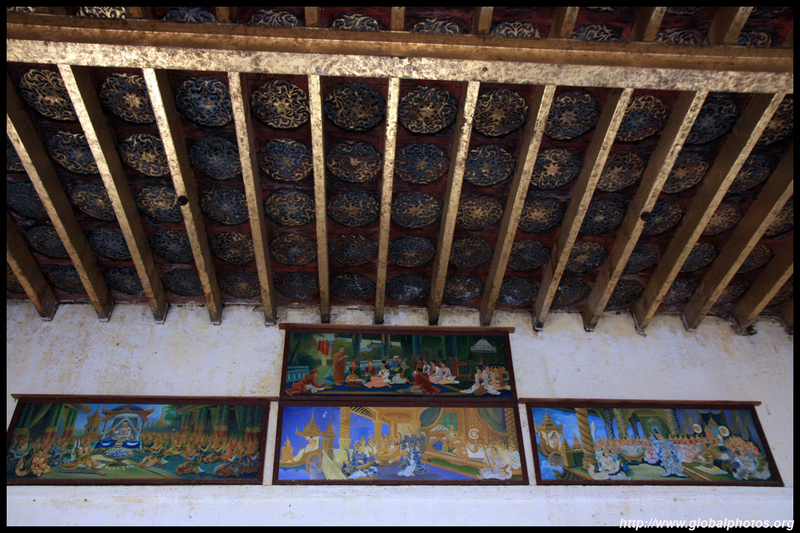 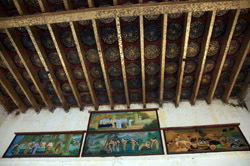 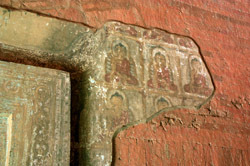 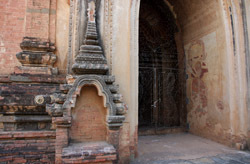 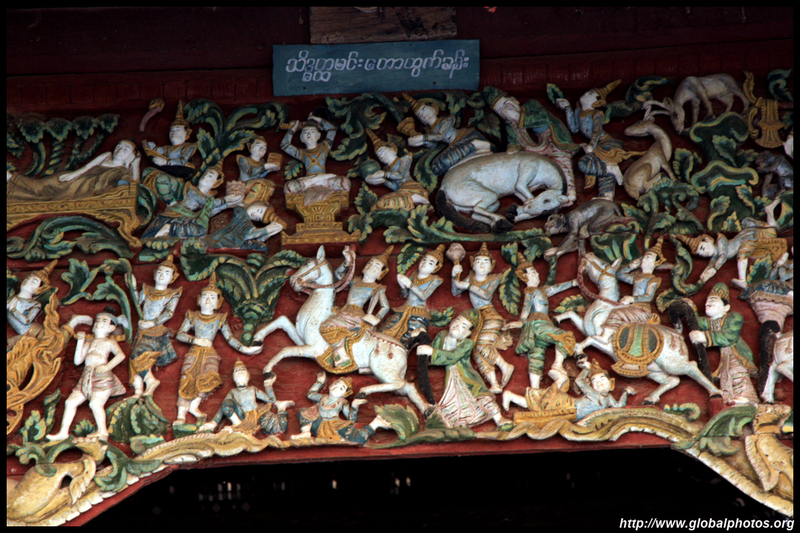 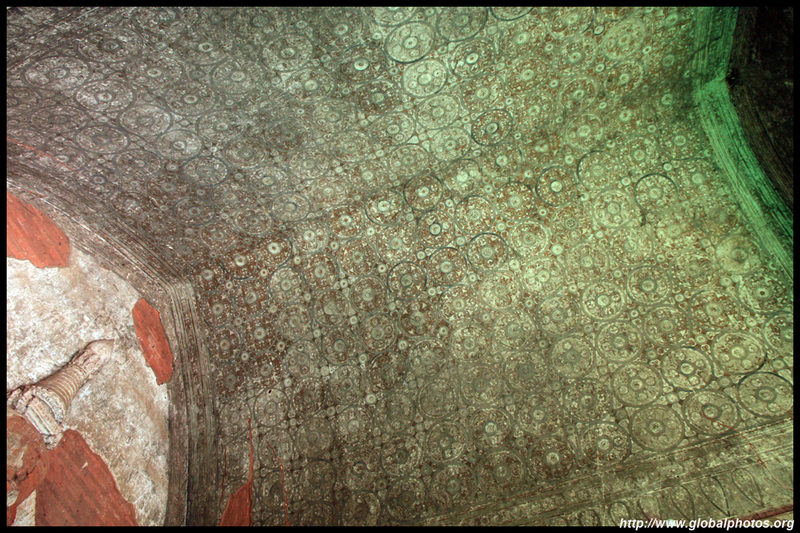 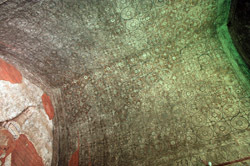 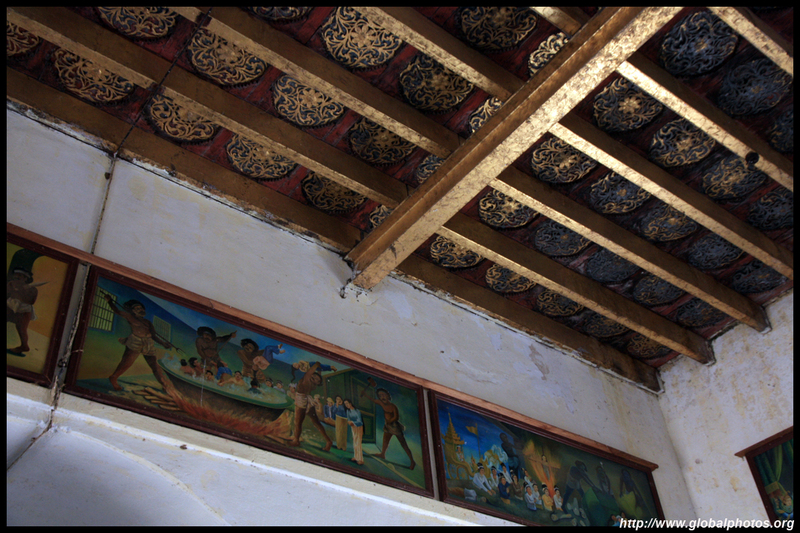 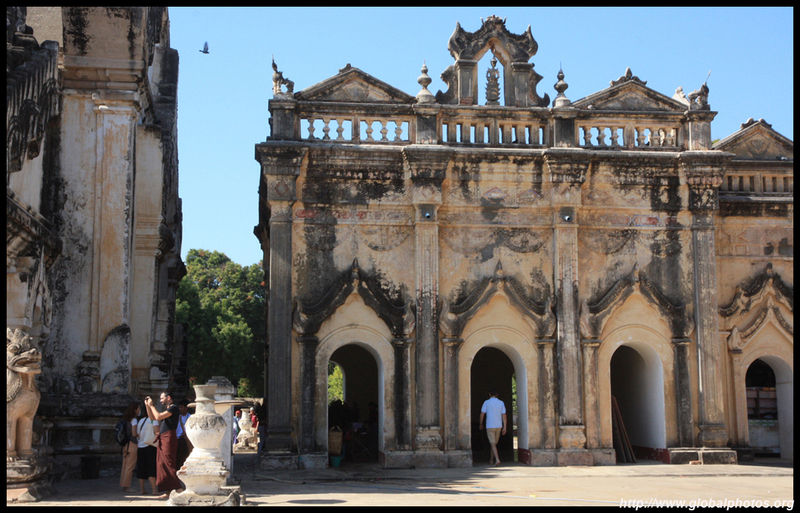 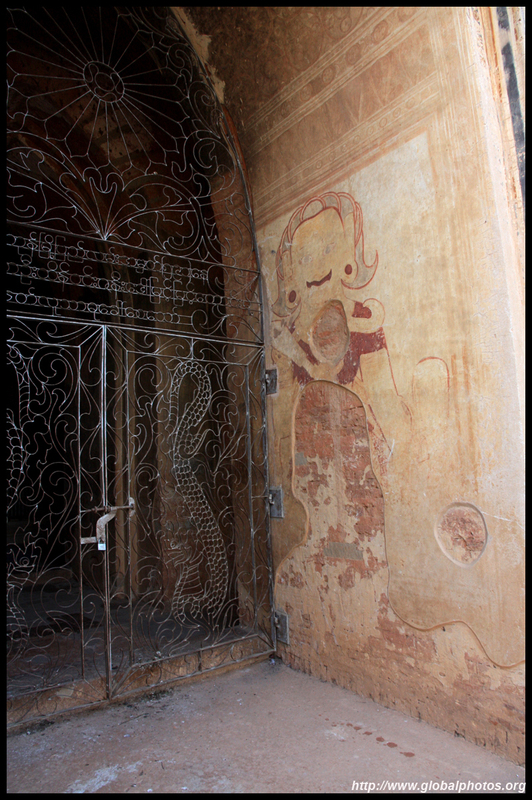 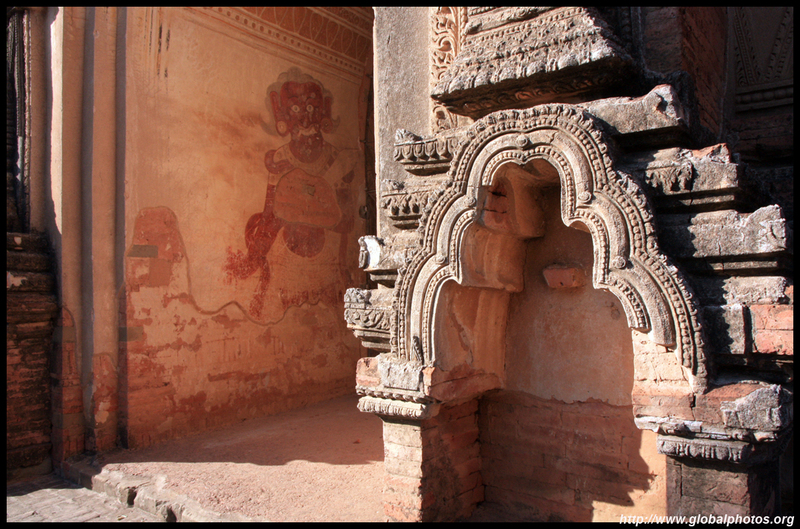 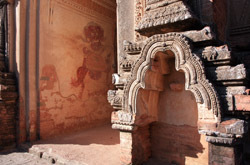 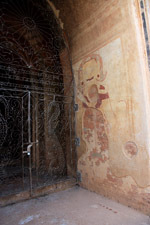 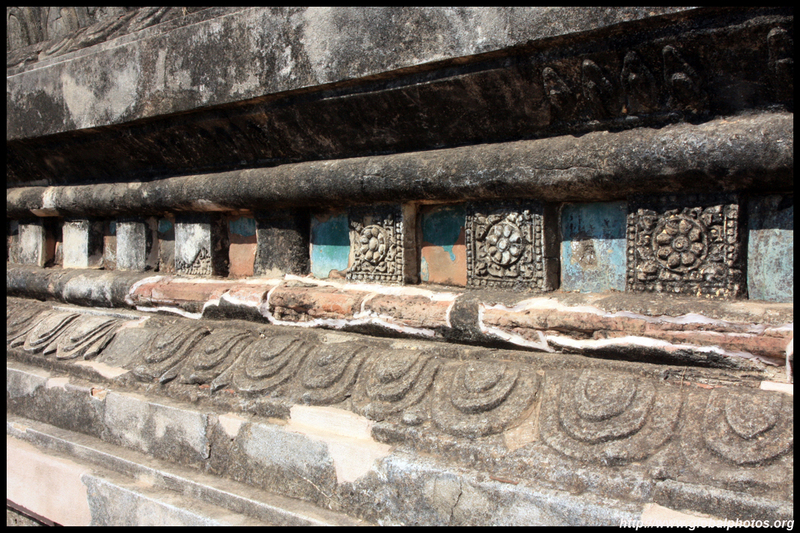 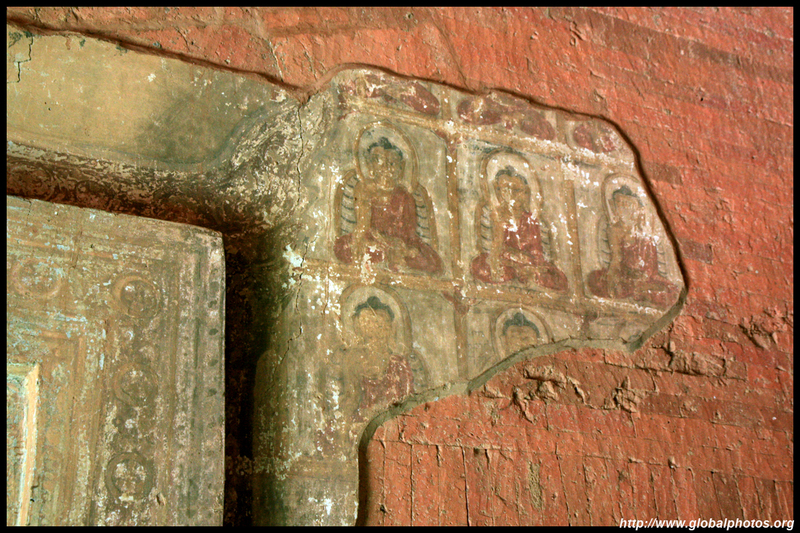 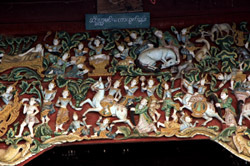 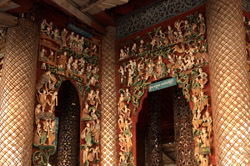 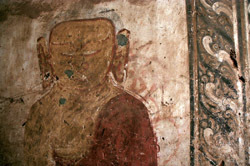 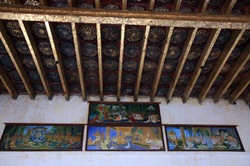 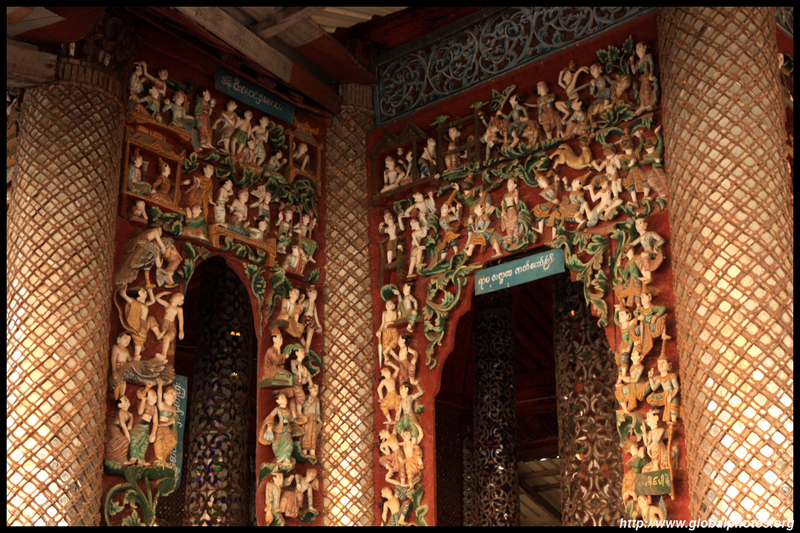 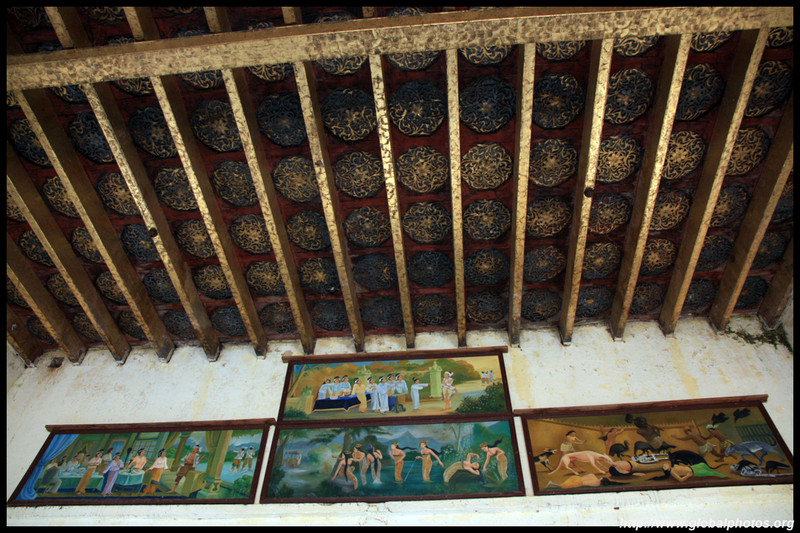 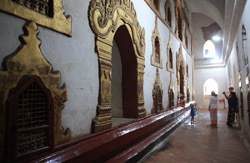 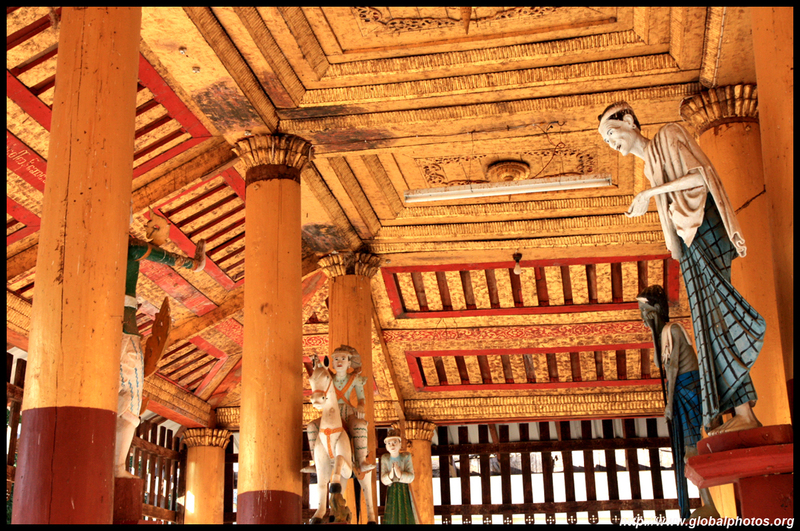 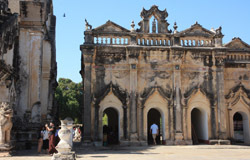 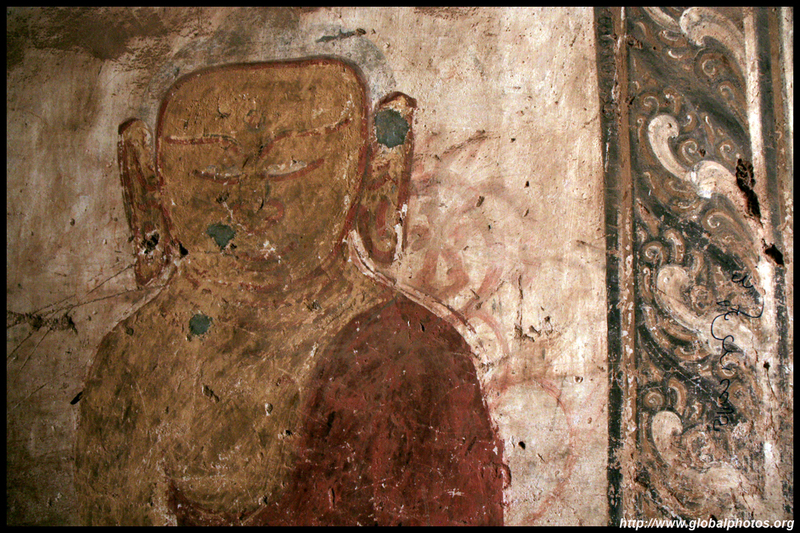 Upali Thein is a small ordination hall with beautiful frescoes painted inside. 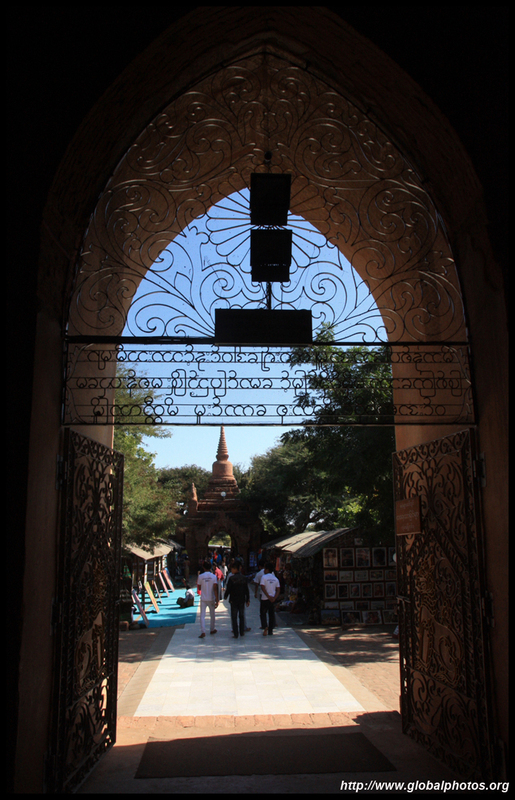 Photography is not allowed inside though. 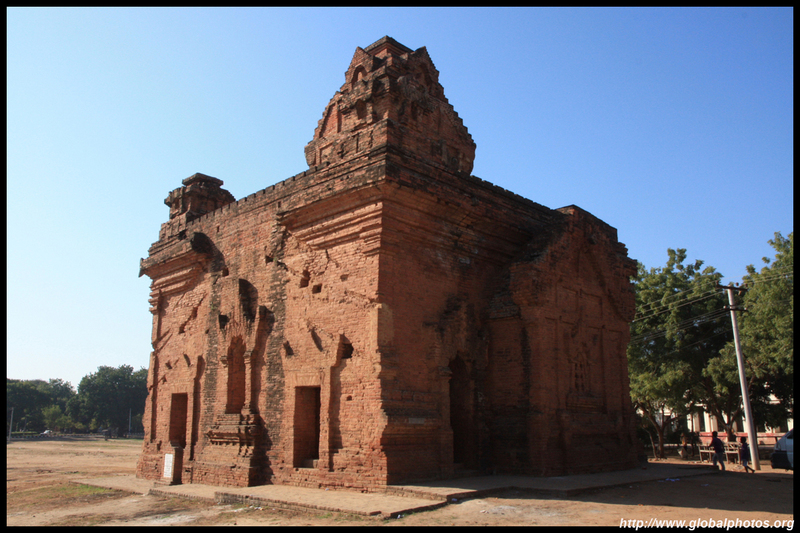 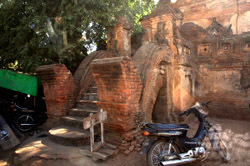 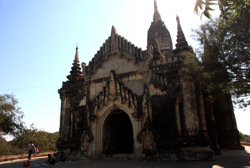 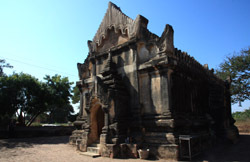 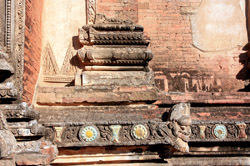 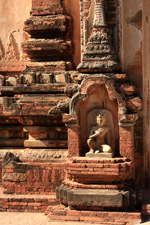 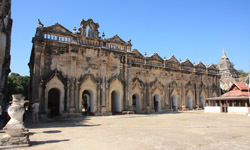 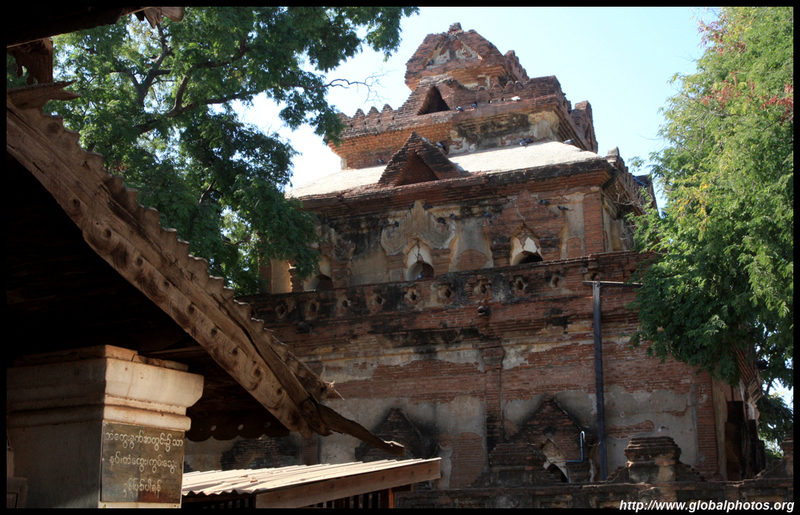 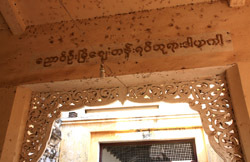 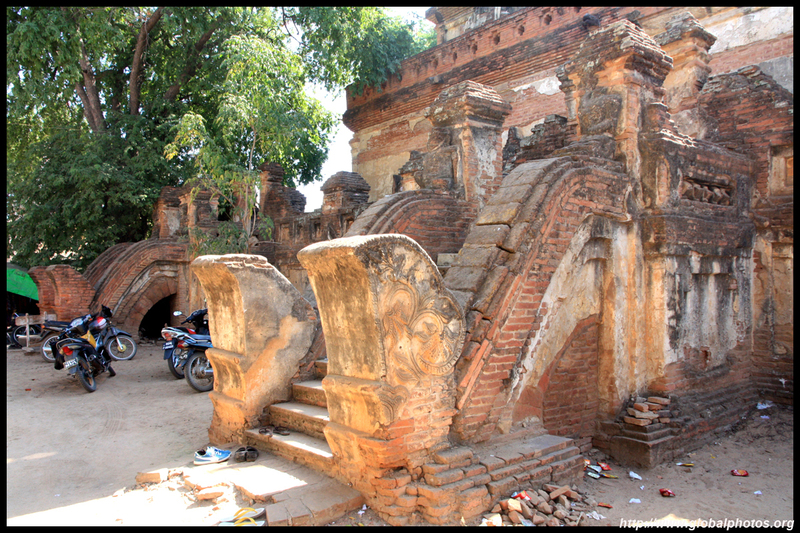 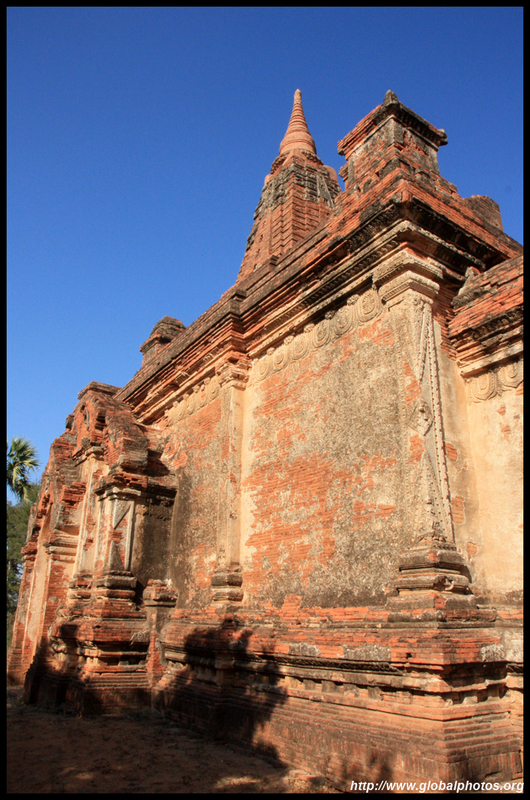 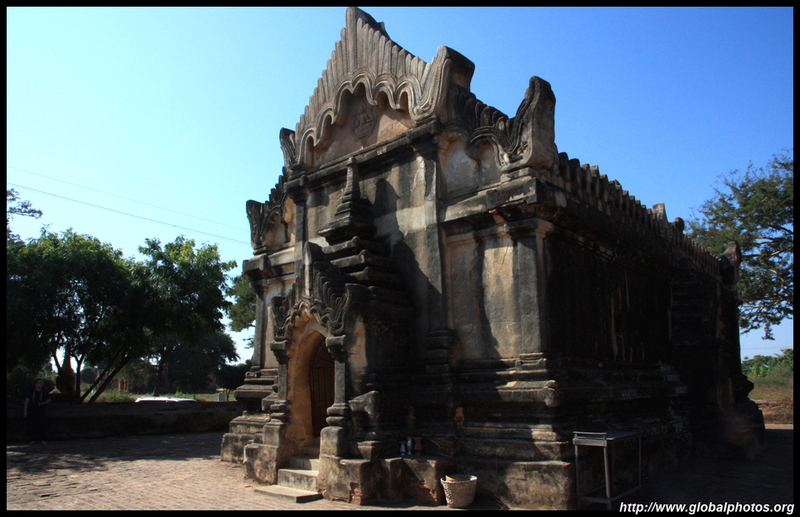 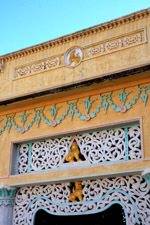 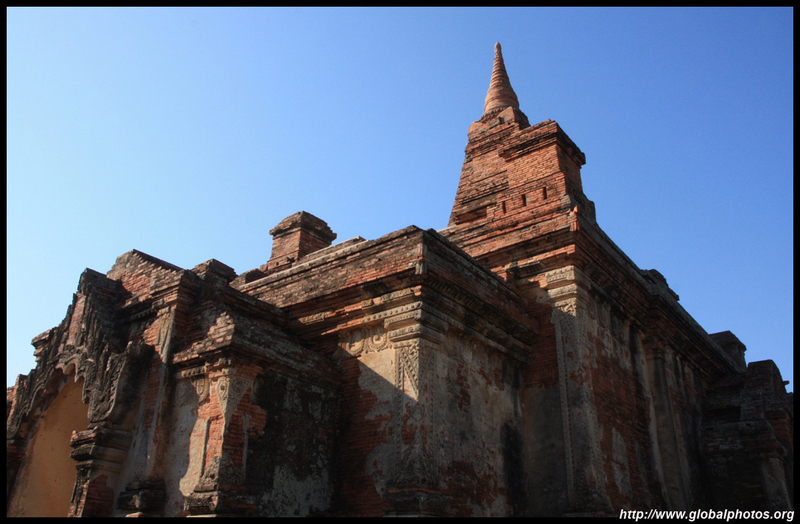 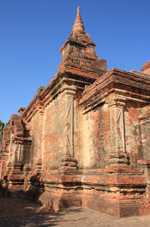 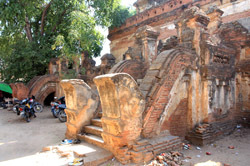 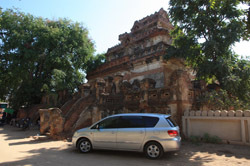 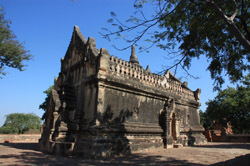 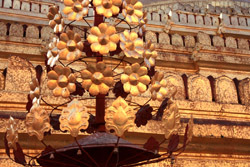 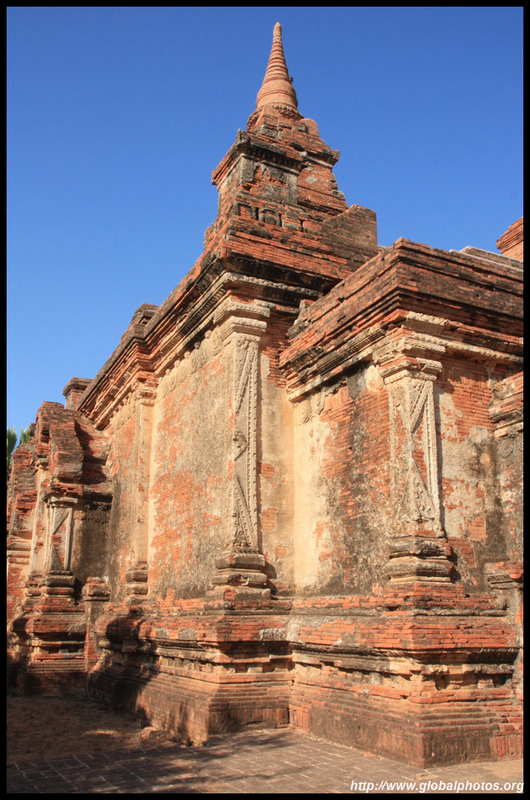 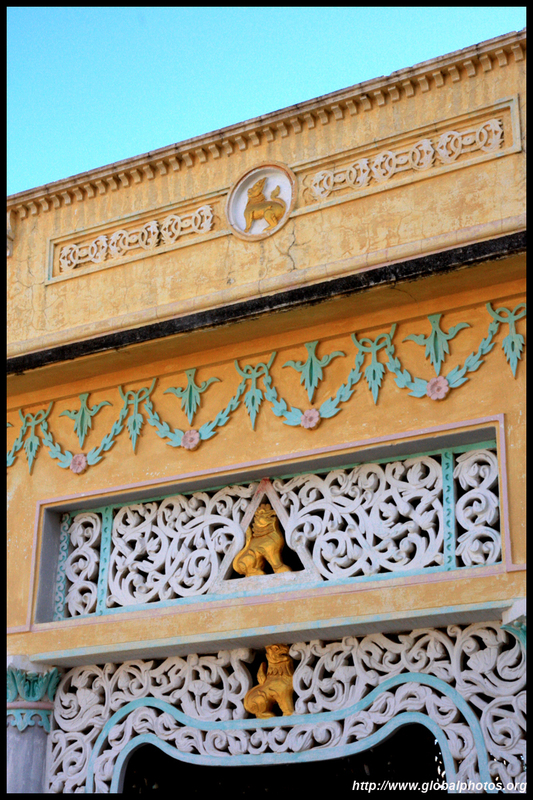 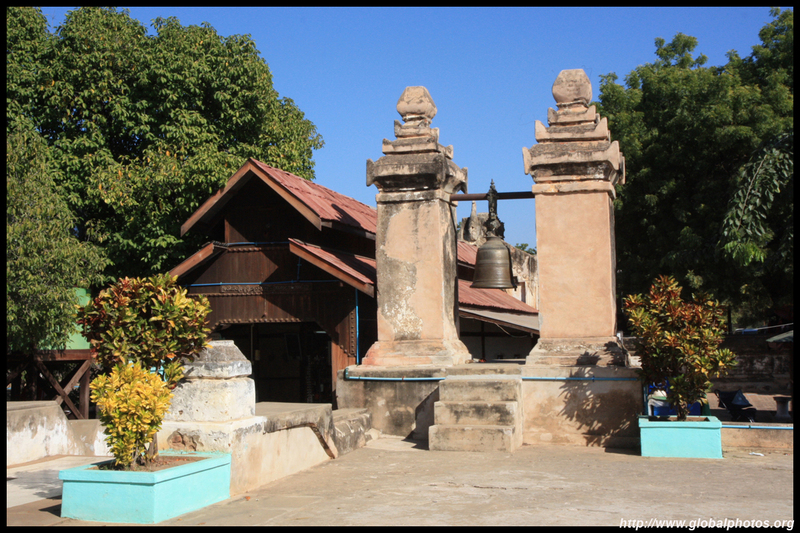 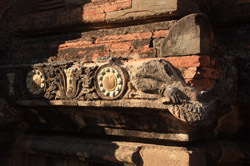 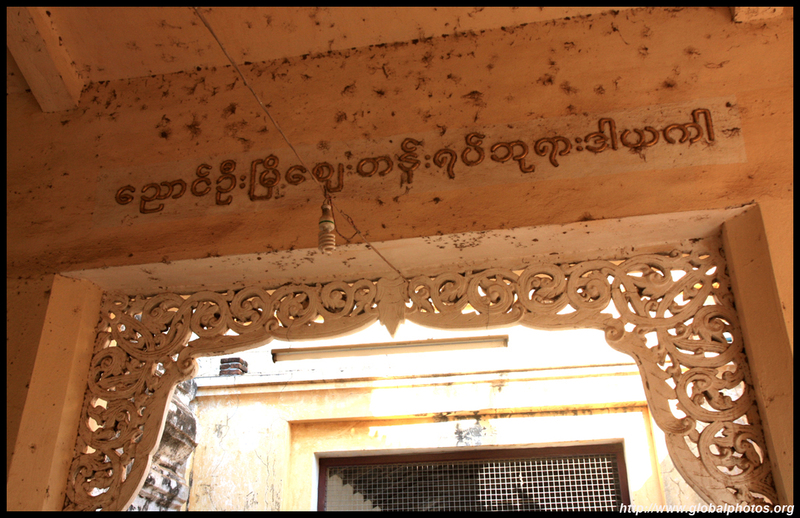 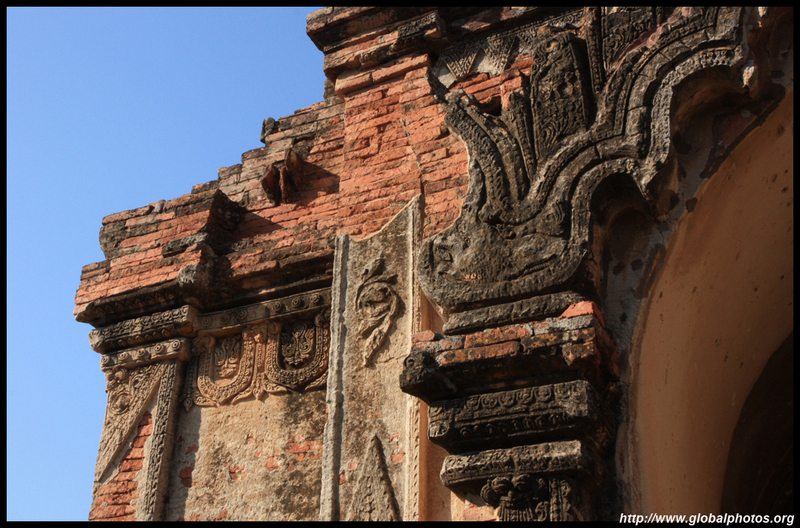 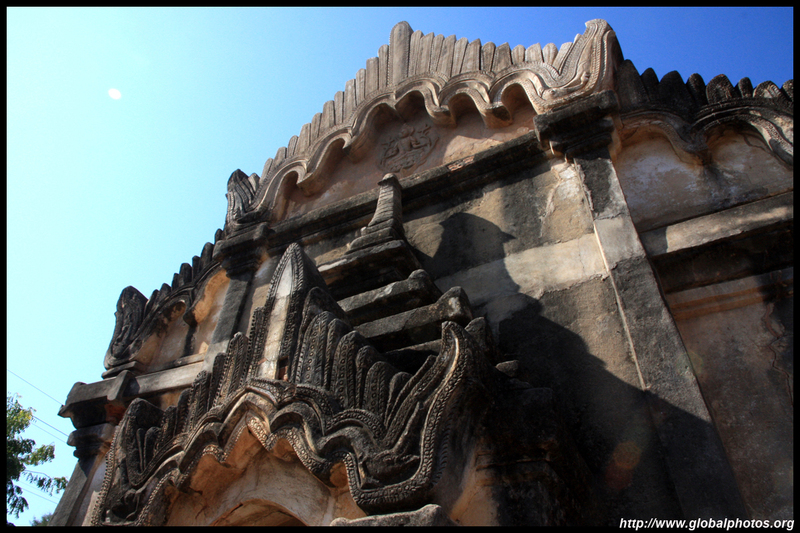 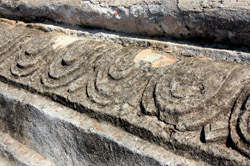 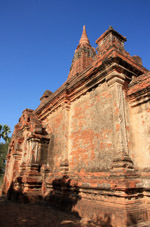 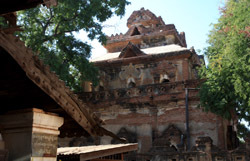 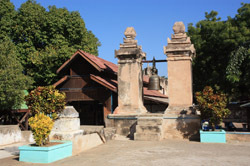 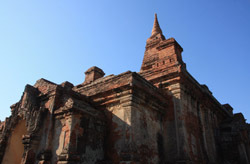 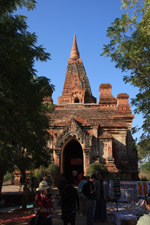 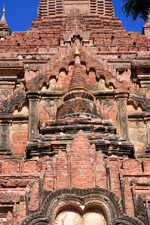 Ananda Temple was founded in the late 11th century and has been restored after the 1975 earthquake. 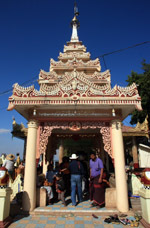 You have to pass through the market street to reach the temple. 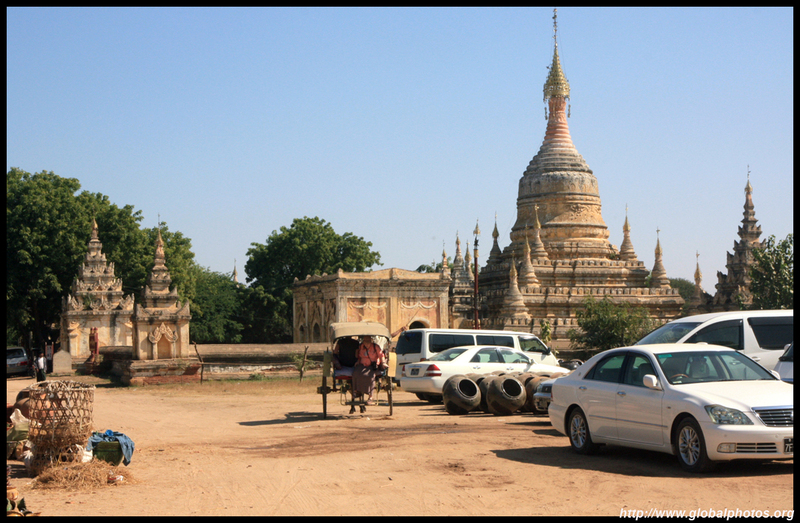 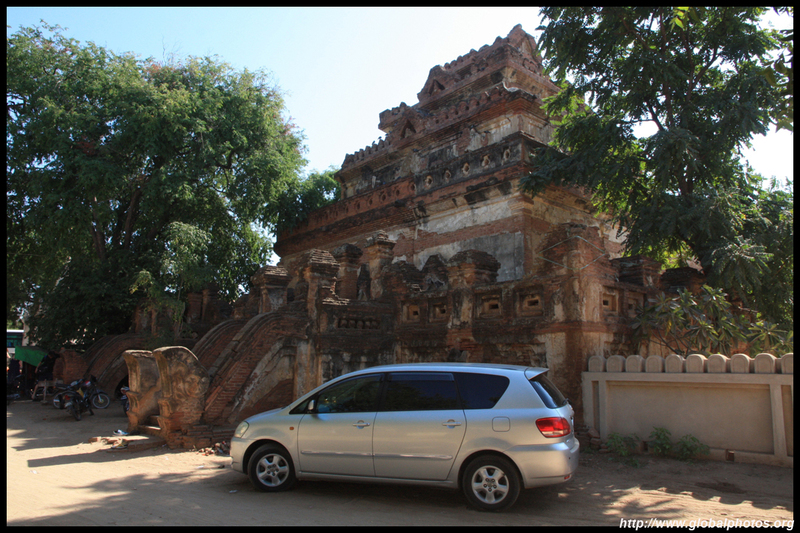 There are temples and pagodas everywhere, even in the midst of a parking lot. 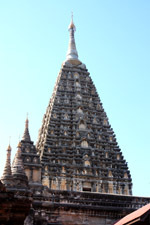 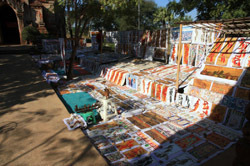 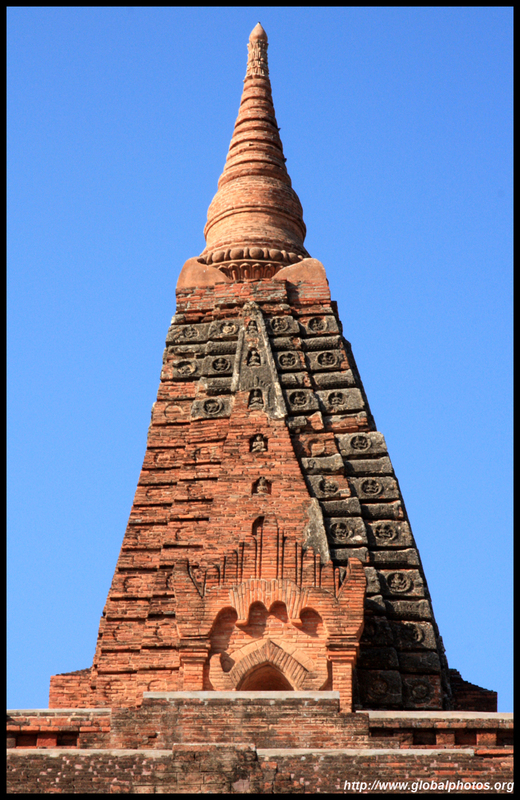 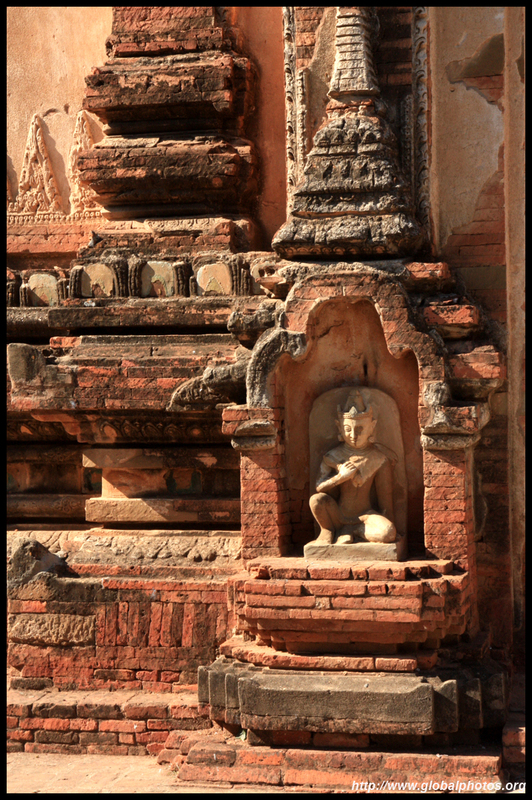 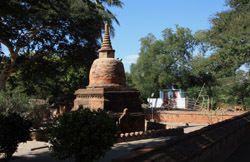 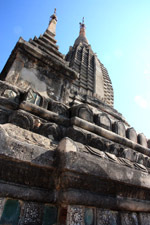 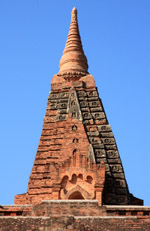 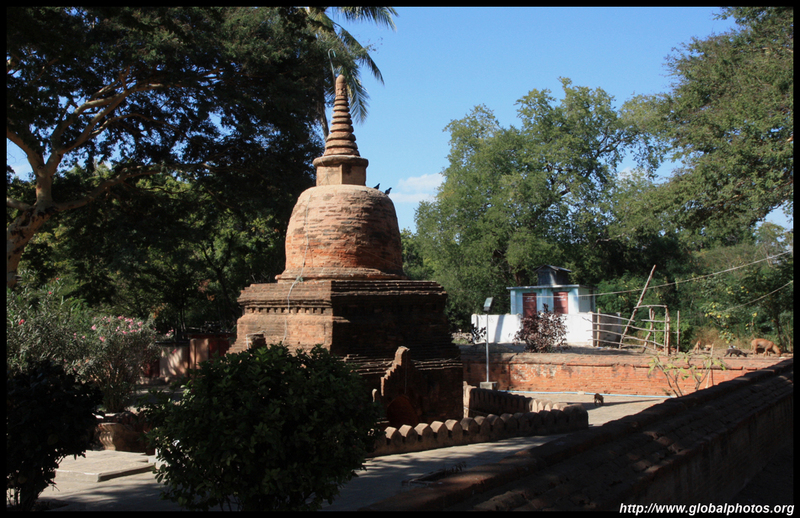 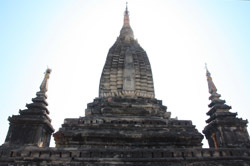 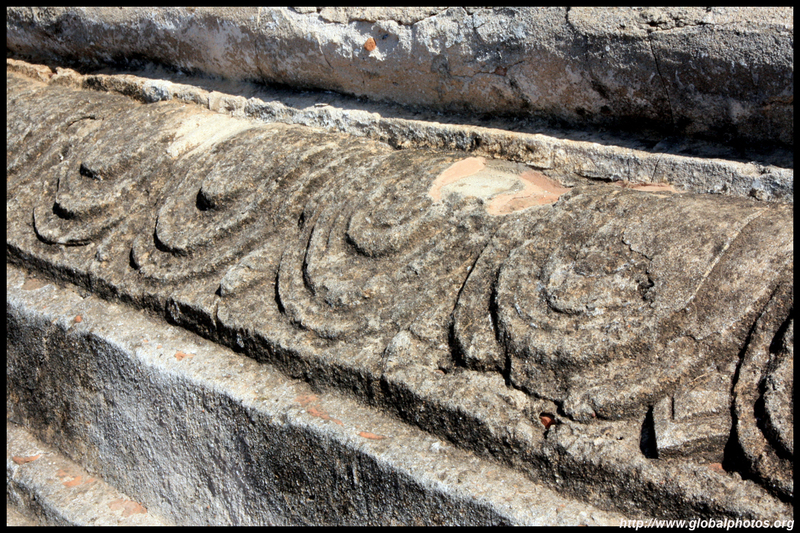 The Mahabodhi Temple dates from the 13th century. A lot smaller than the ones I visited earlier in the day, the best part was the external spire. 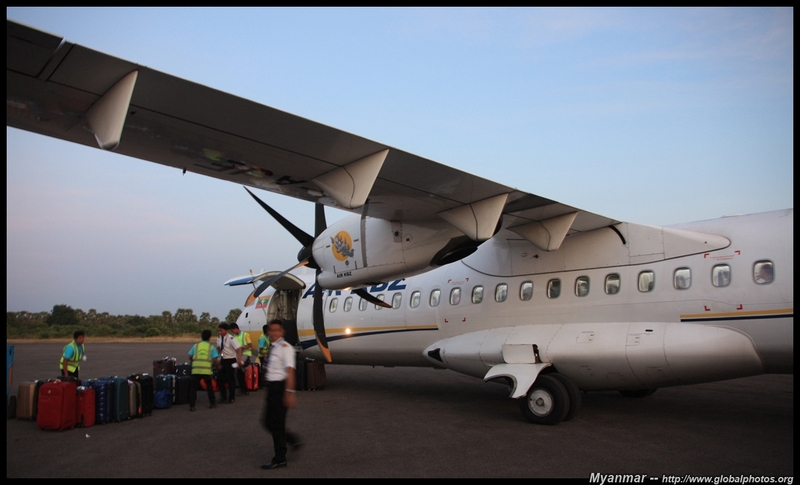 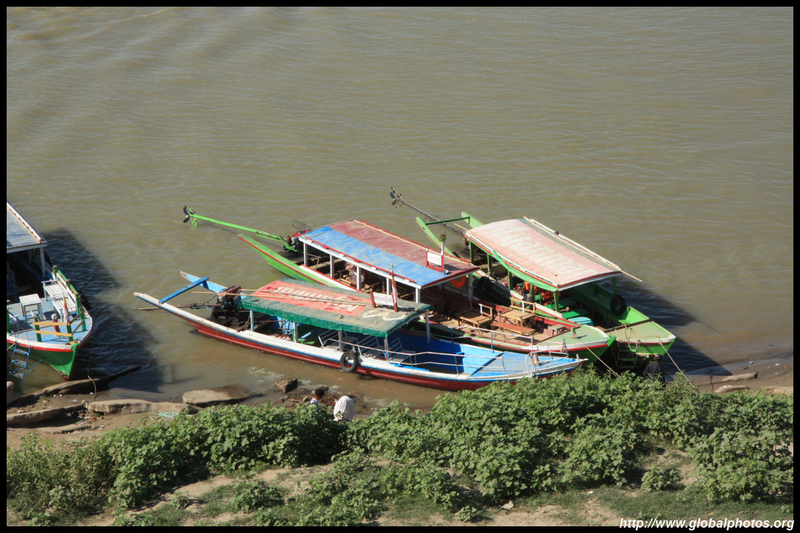 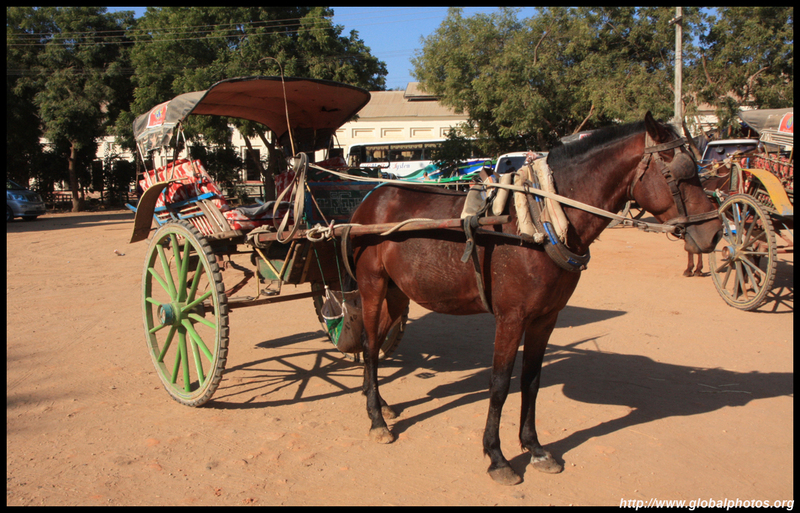 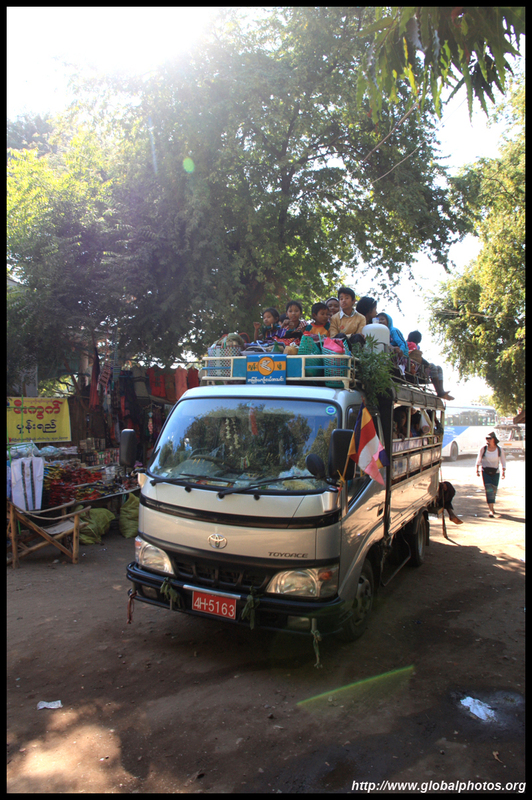 While I ventured around the dusty streets in air-conditioned comfort, locals took more open-deck means to get to their destination. 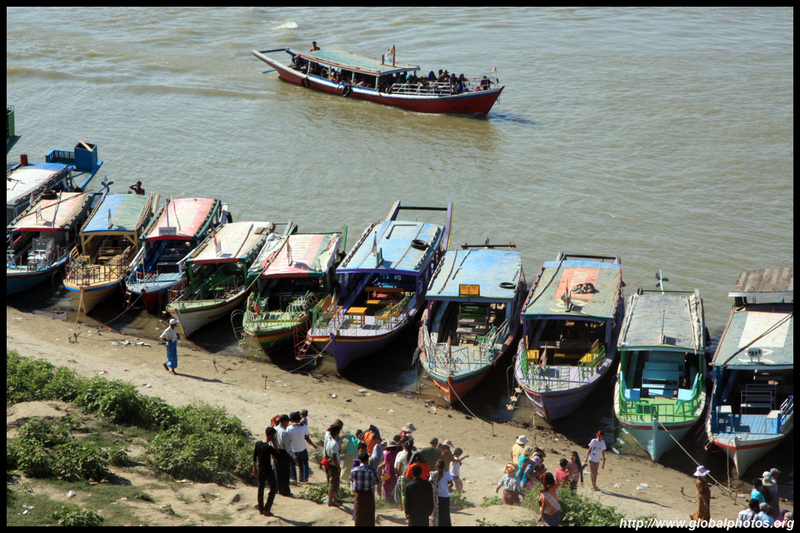 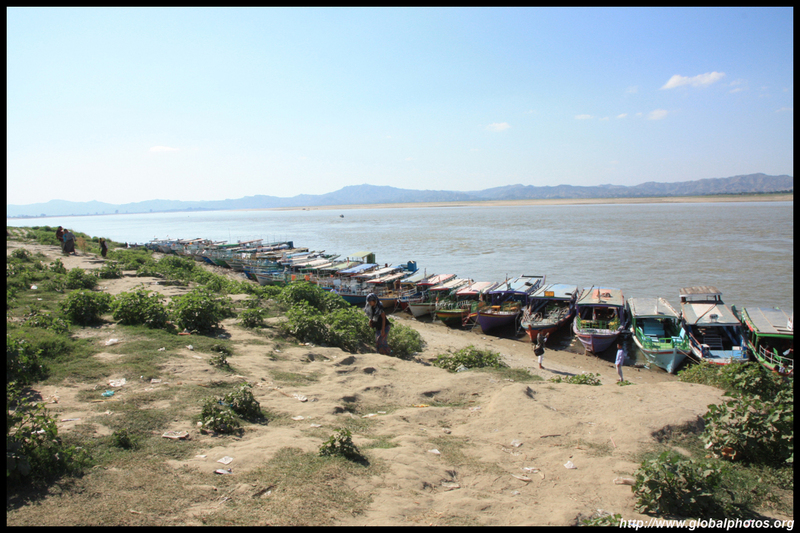 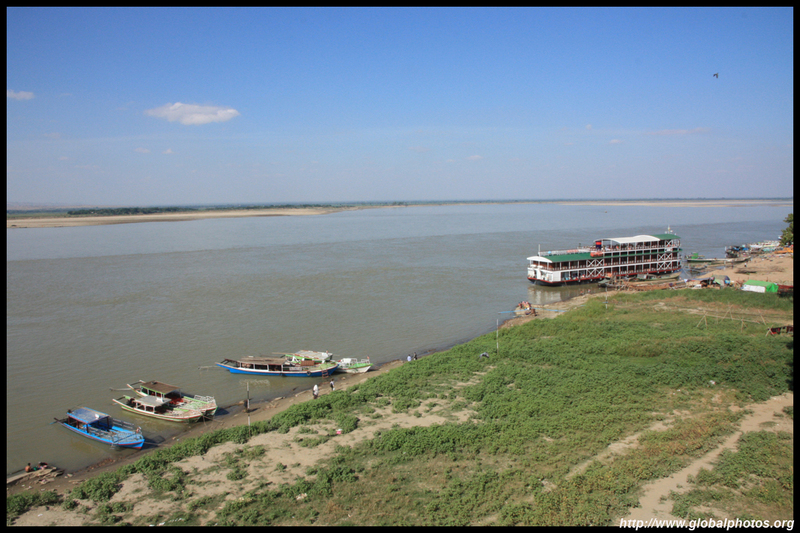 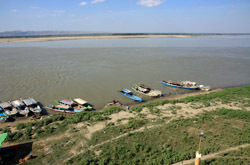 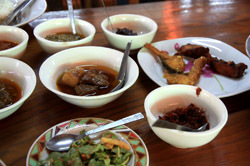 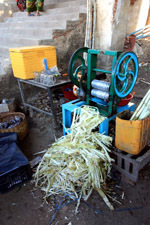 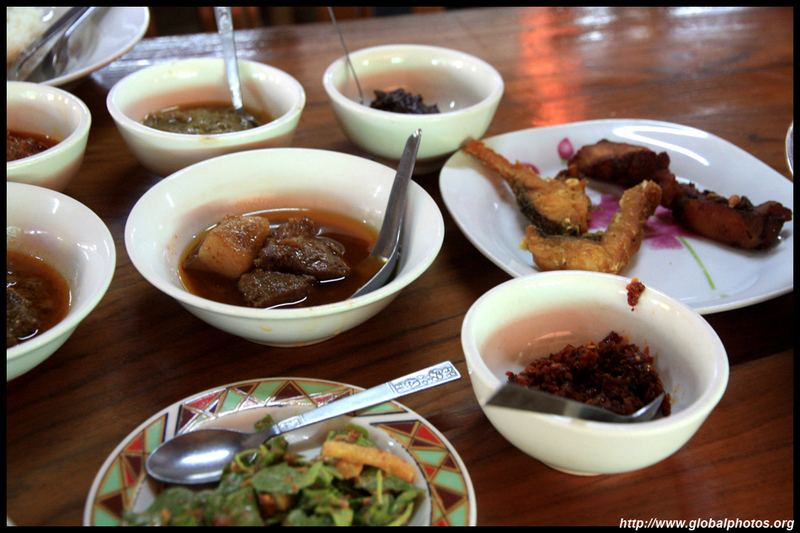 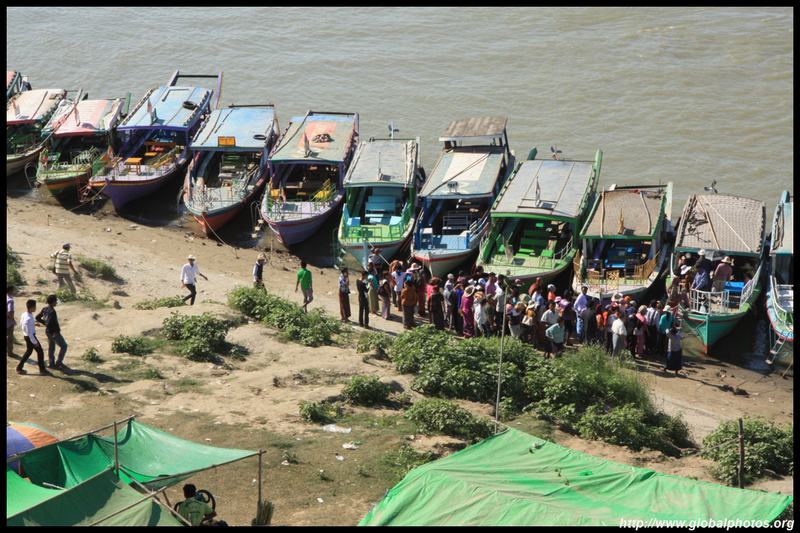 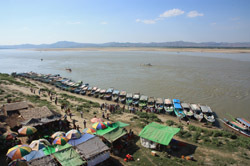 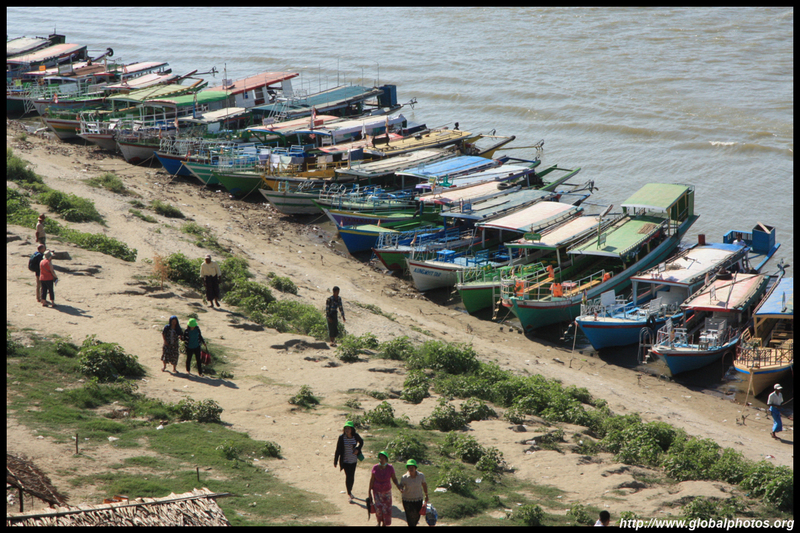 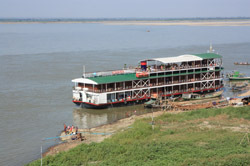 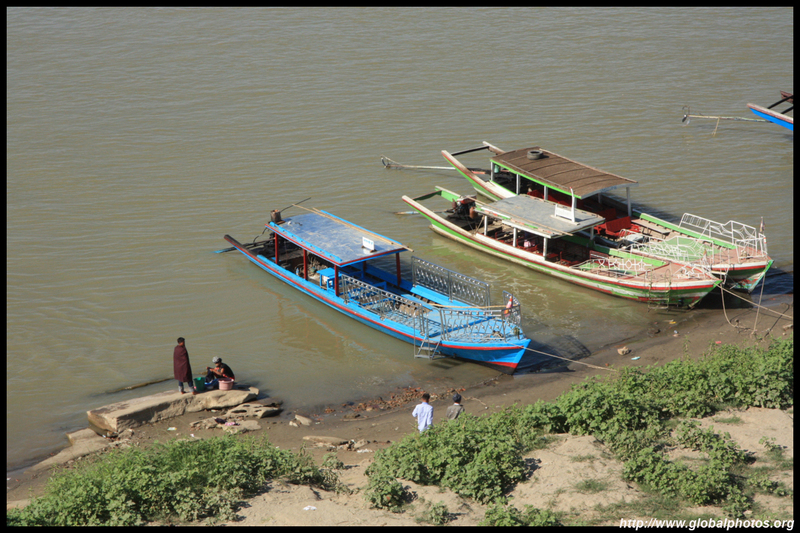 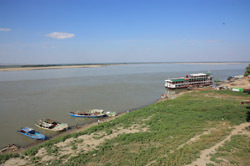 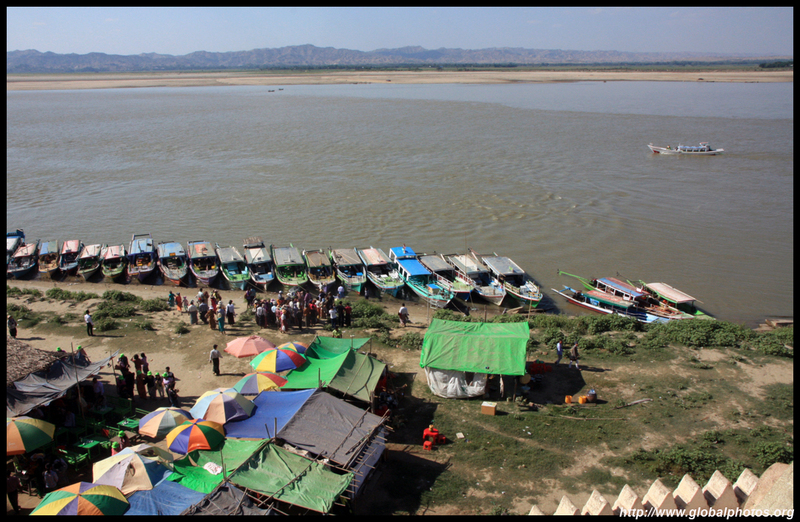 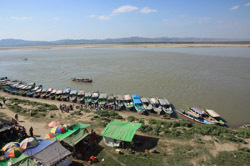 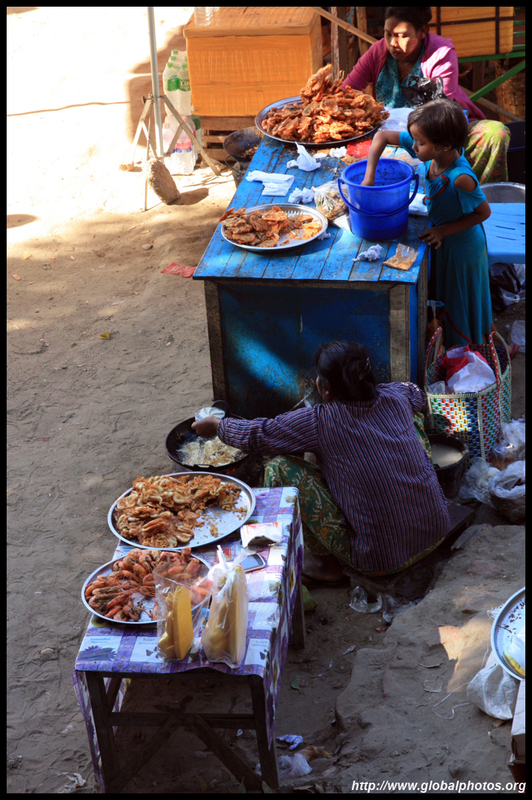 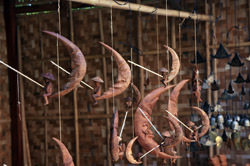 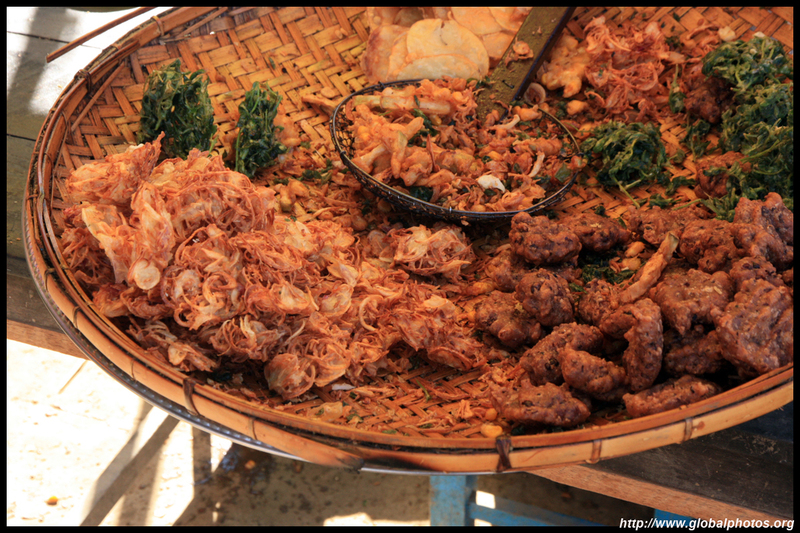 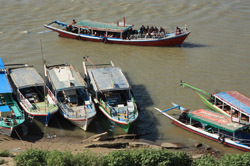 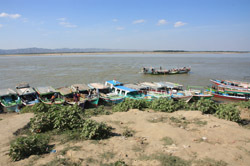 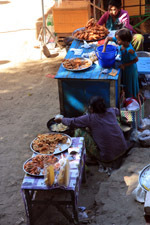 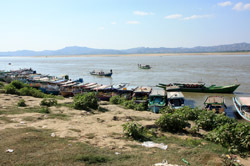 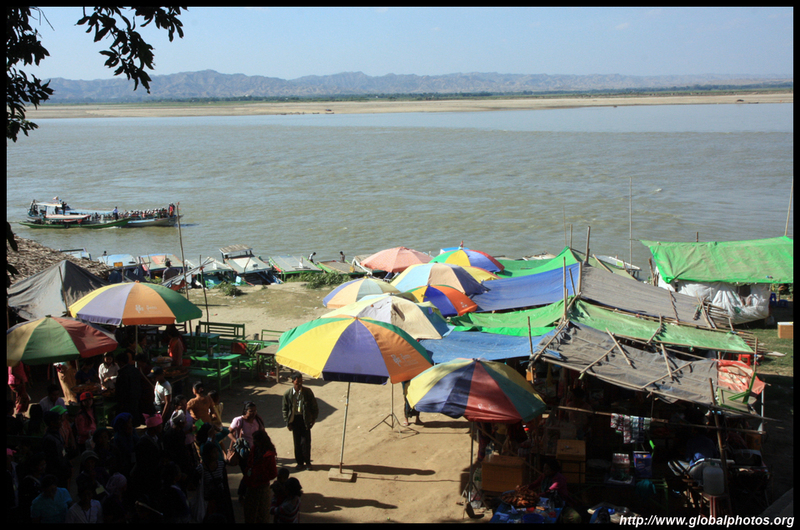 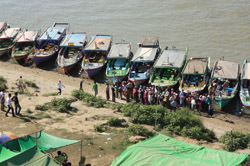 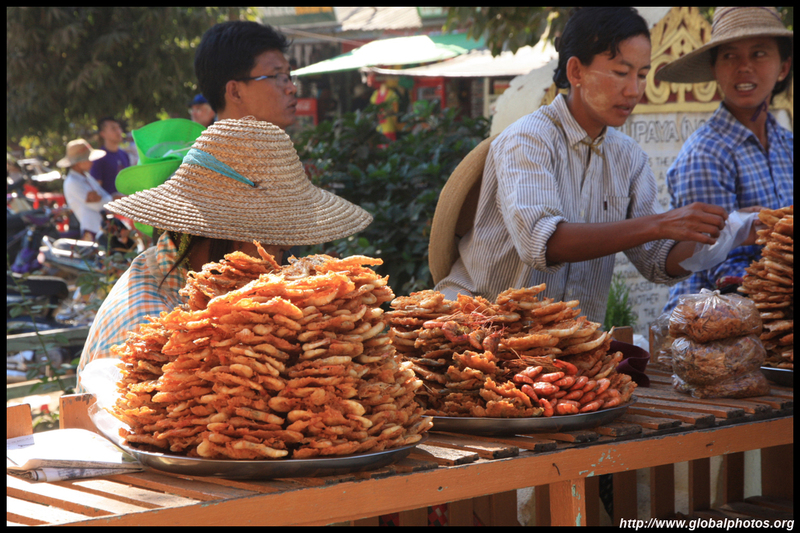 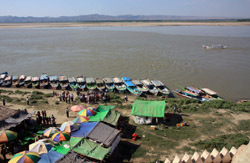 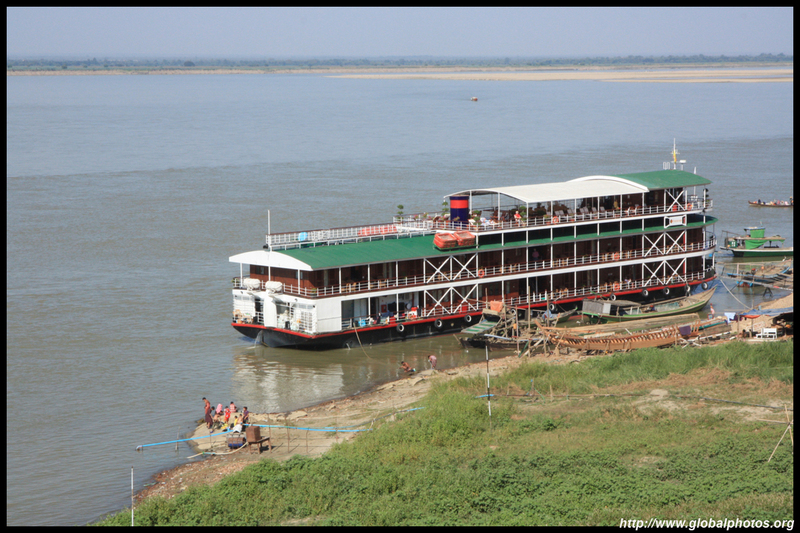 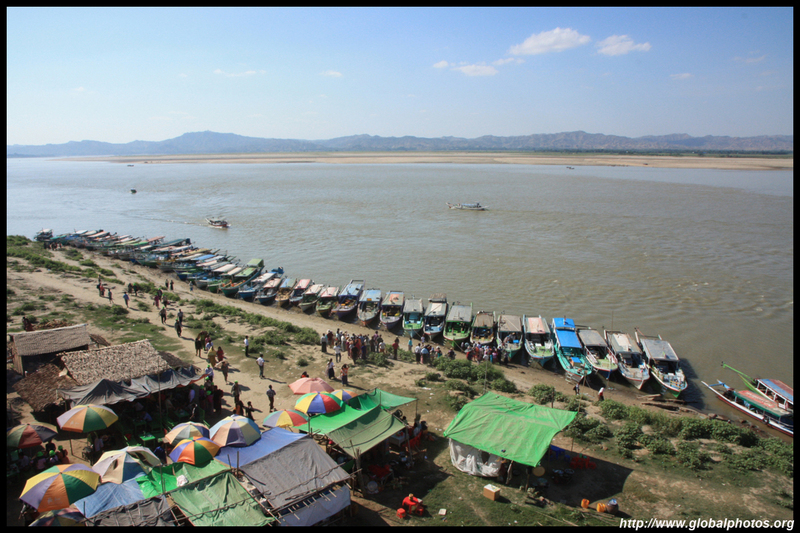 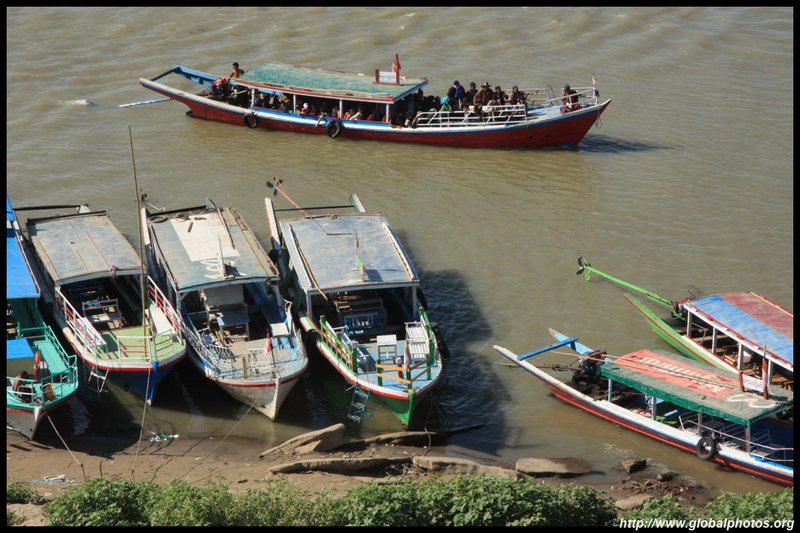 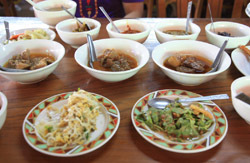 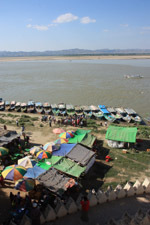 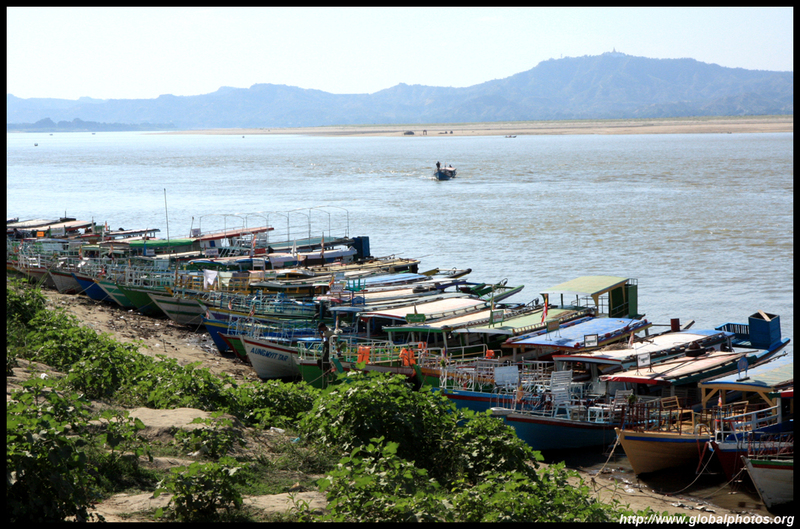 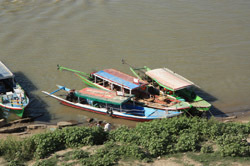 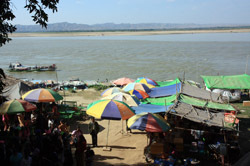 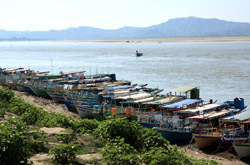 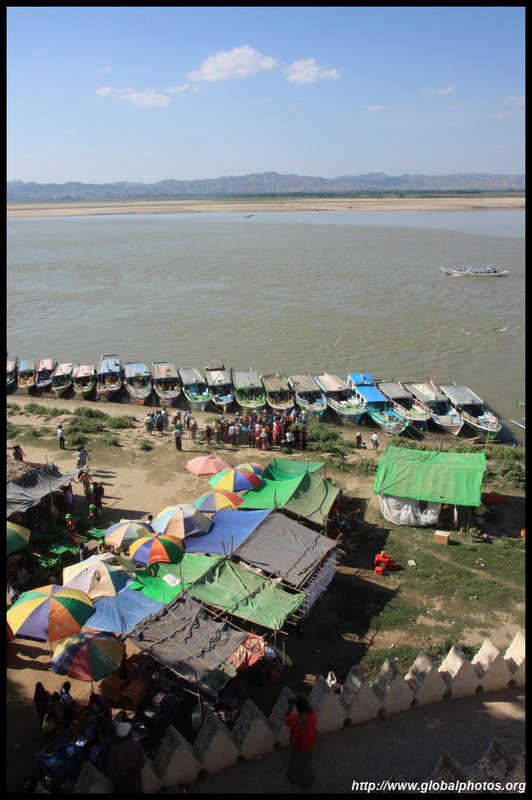 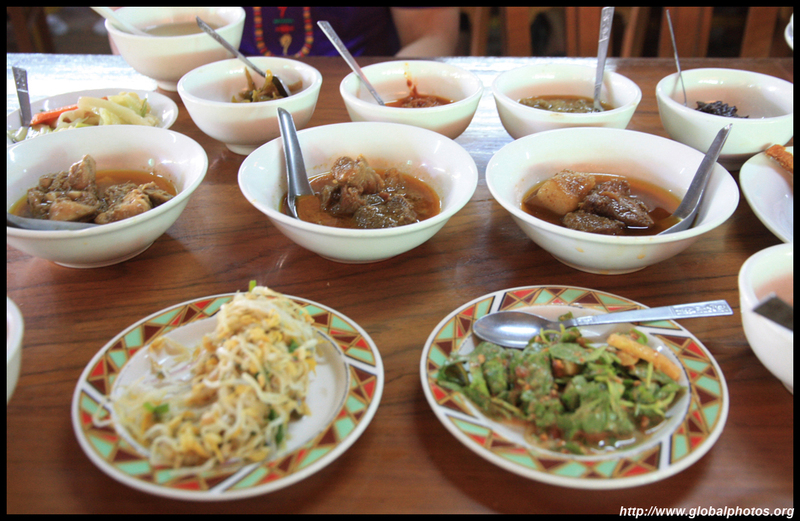 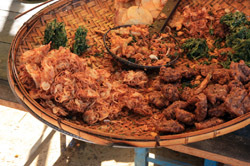 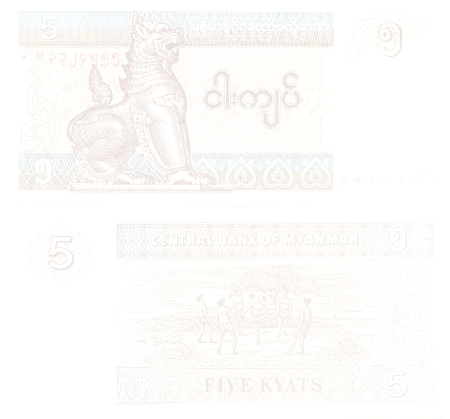 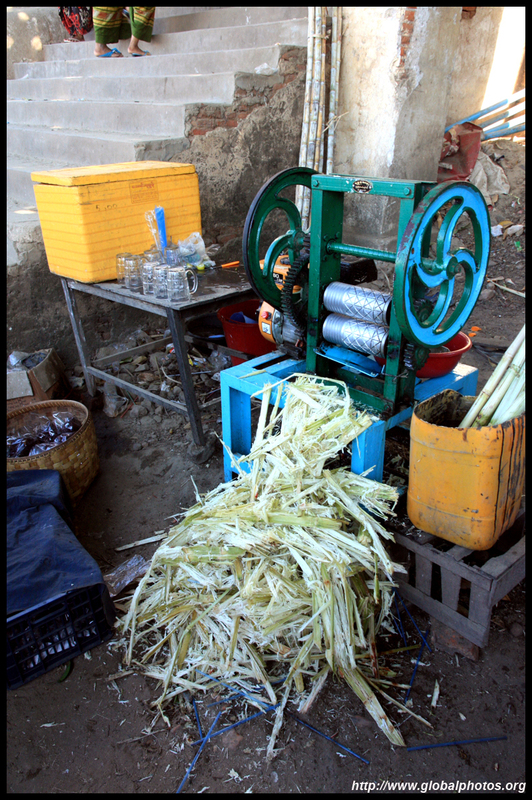 Bu Paya overlooks a busy riverfront, the ferry terminal, and small food market. 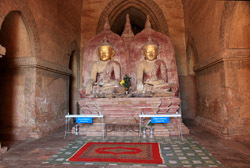 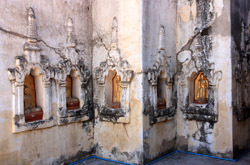 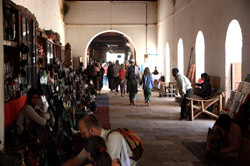 All visitors need to remove their shoes at socks to enter these Buddhist temples. Unfortunately, the grounds at this temple had a lot of pokey items from nature that made walking around an absolute nightmare. 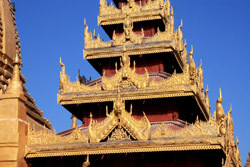 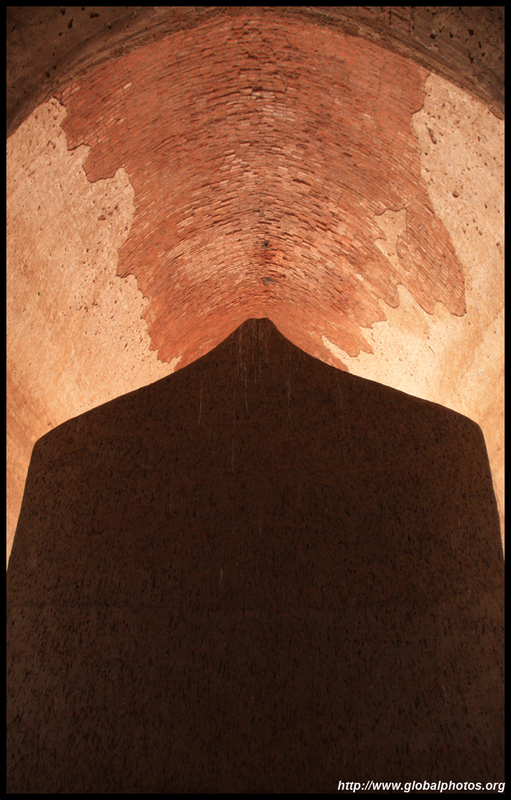 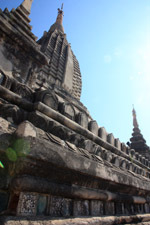 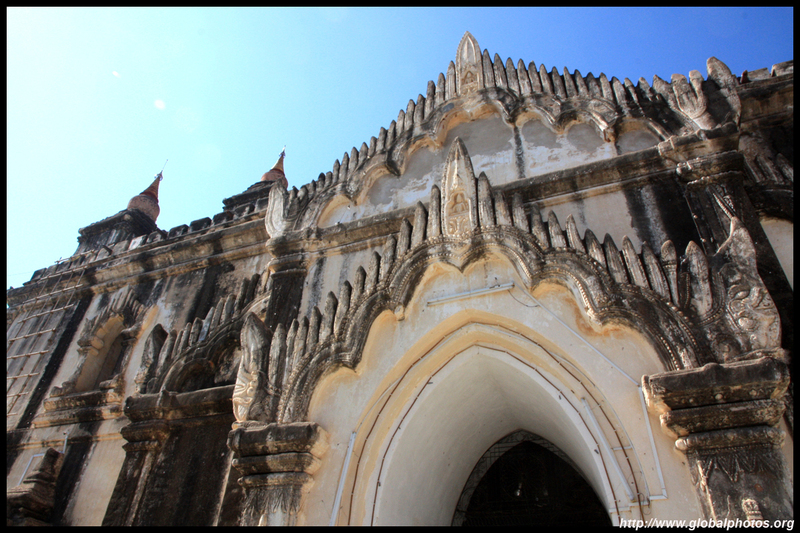 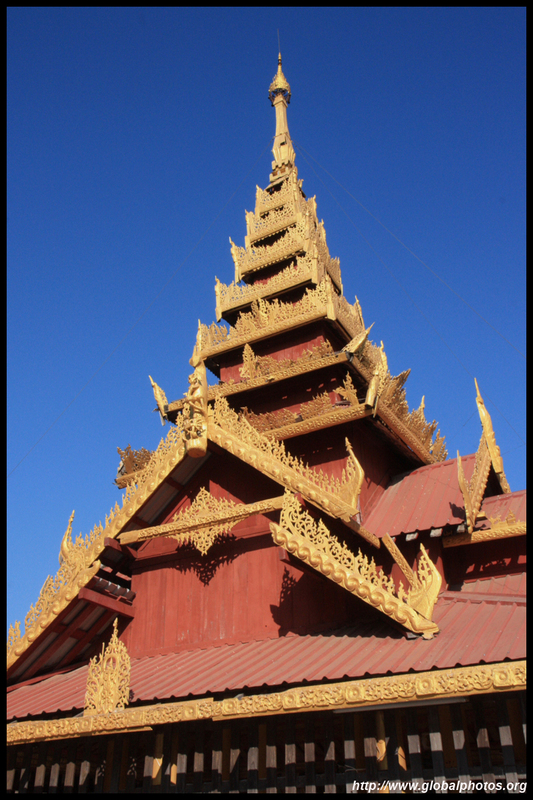 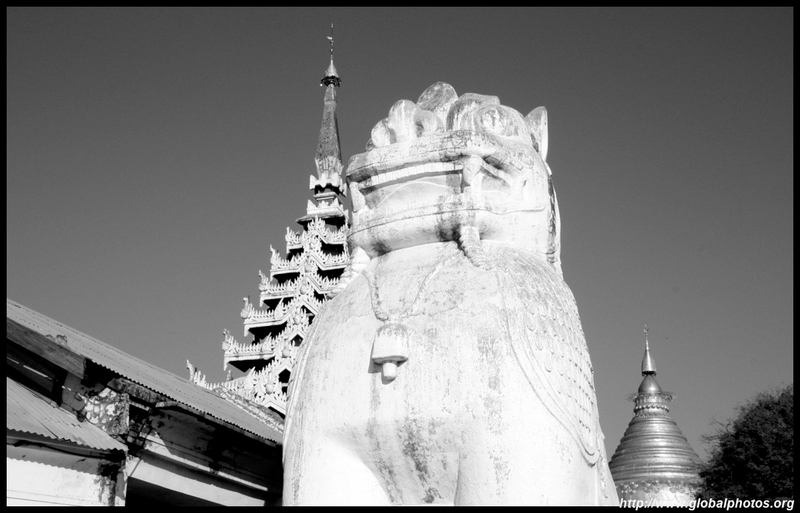 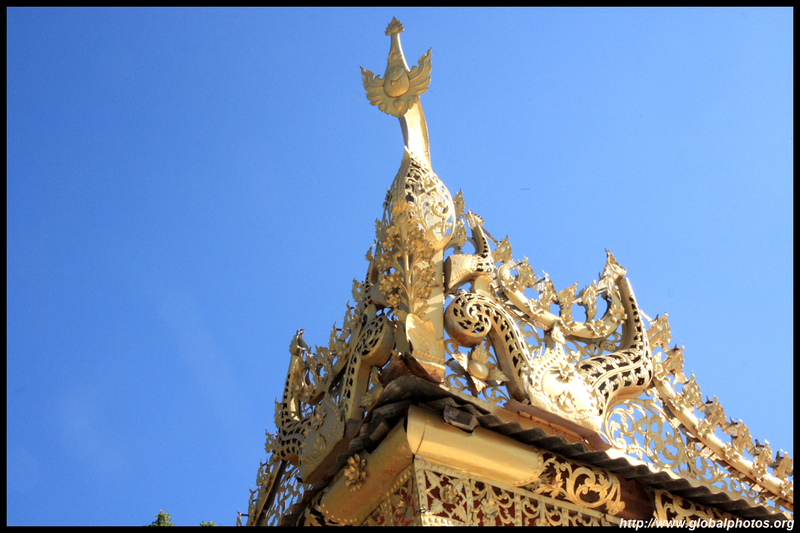 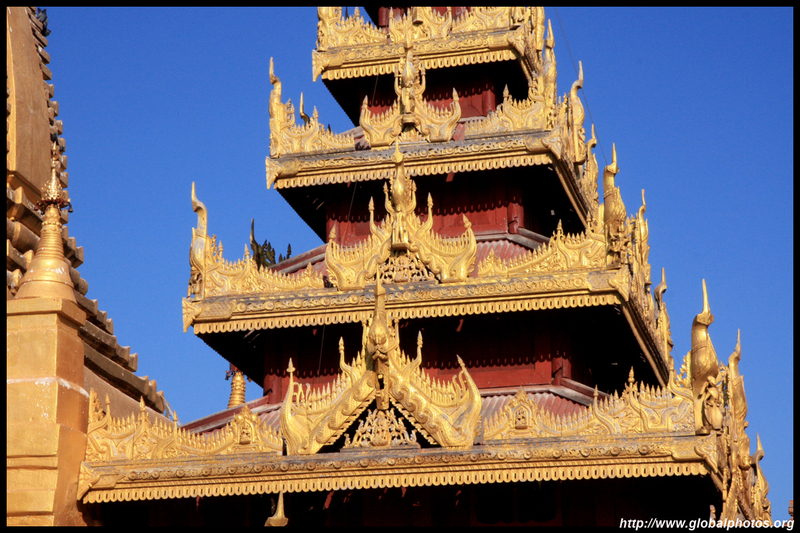 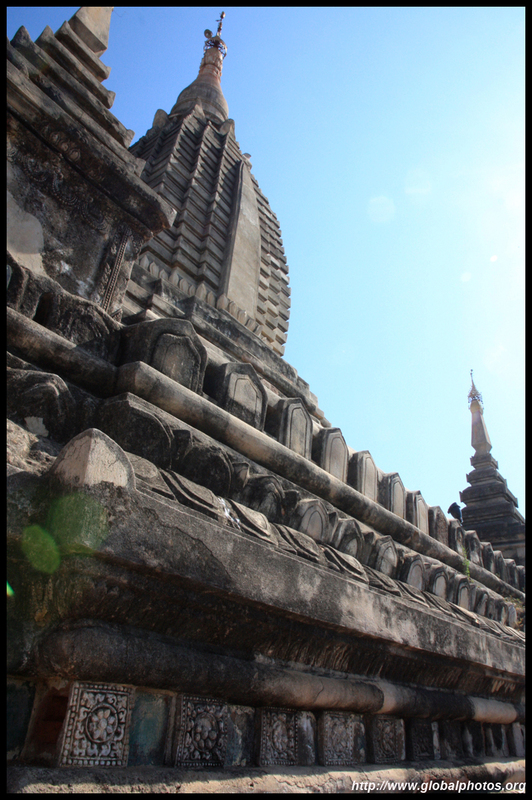 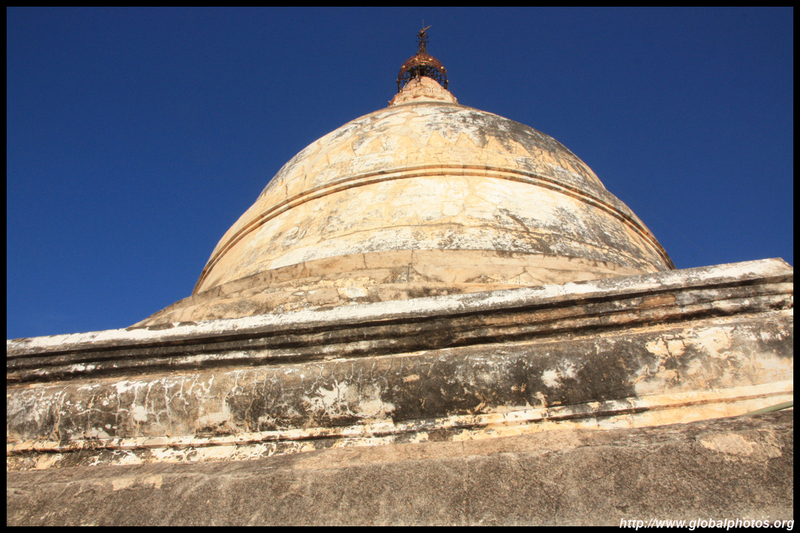 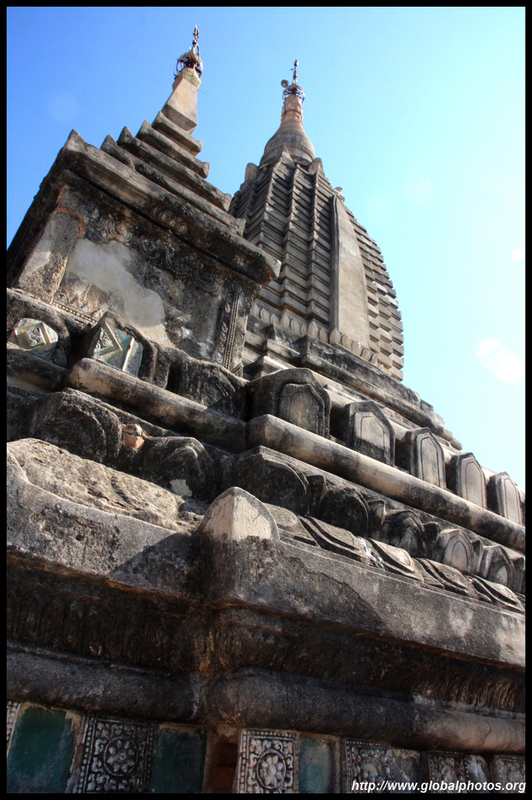 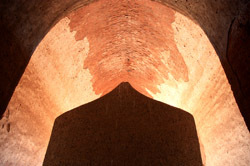 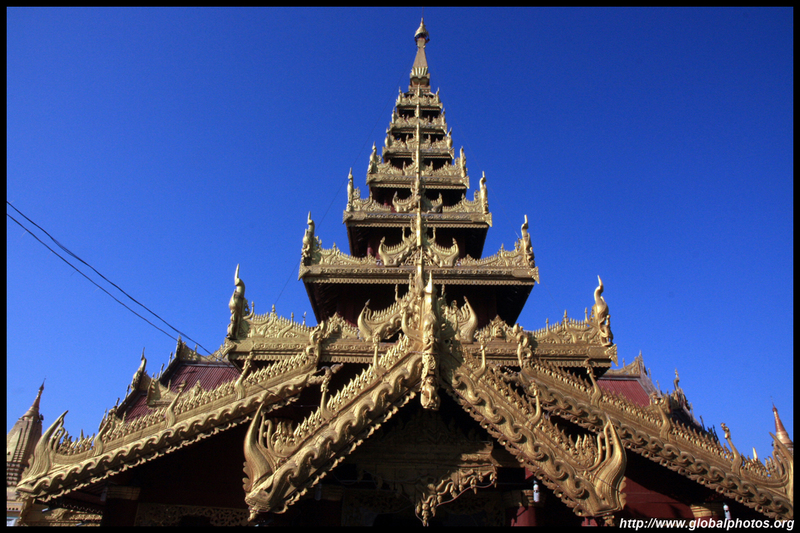 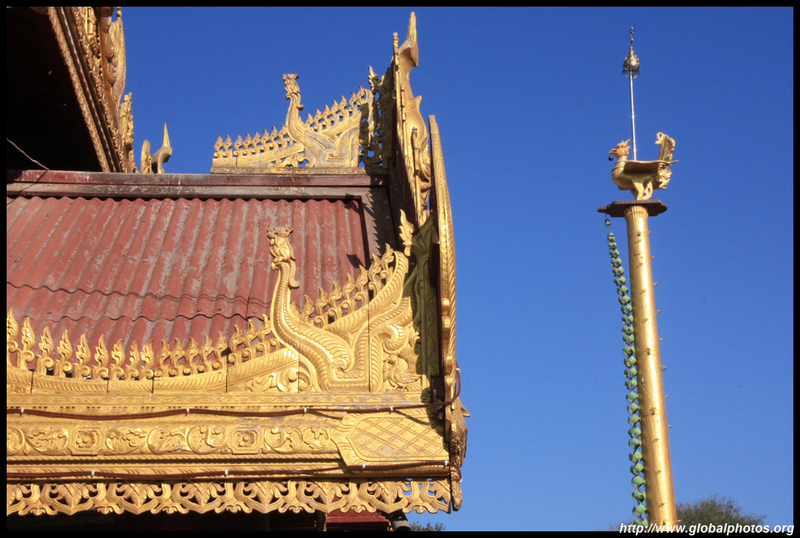 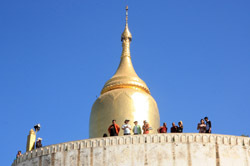 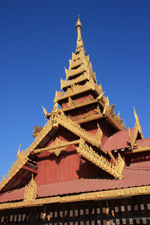 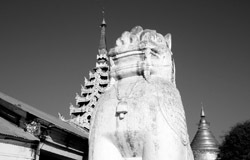 Shwe Sandaw Pagoda - head up for the perfect sunset view!